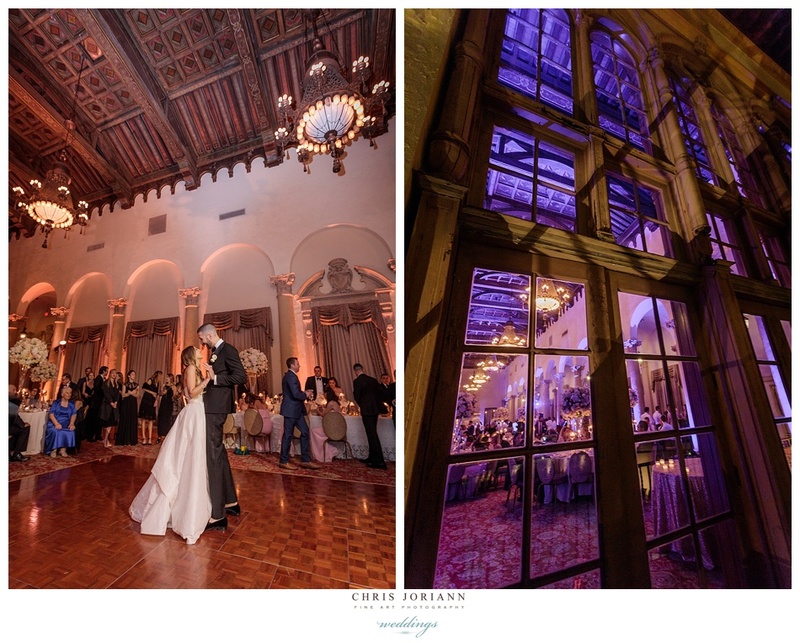 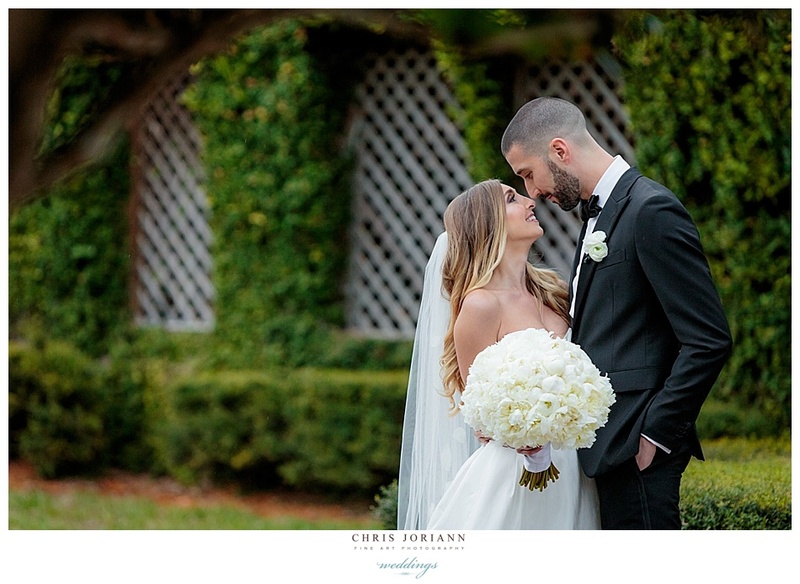 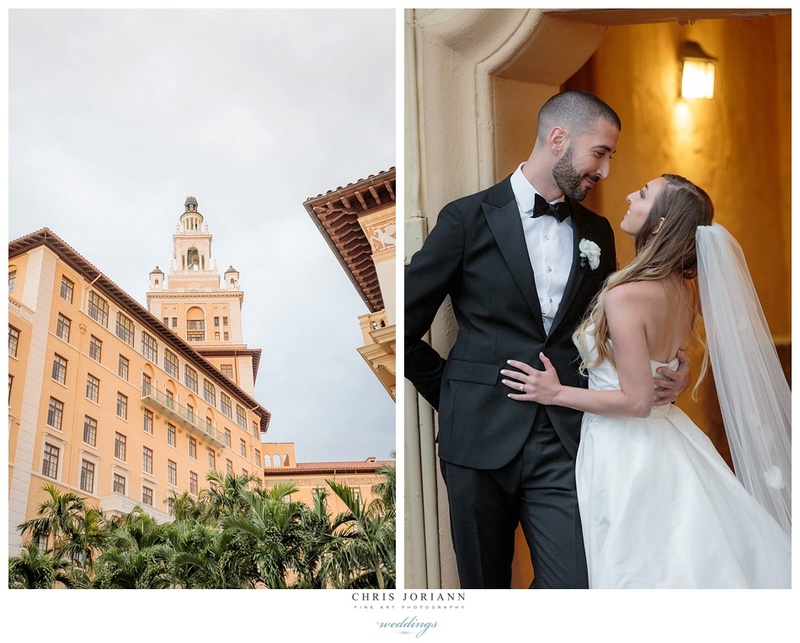 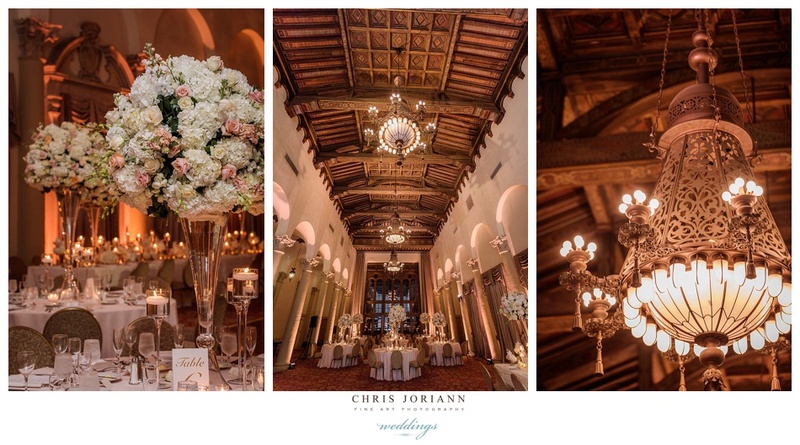 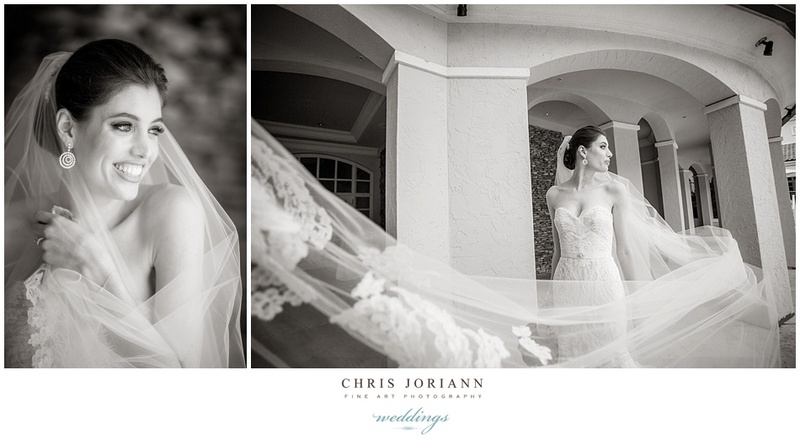 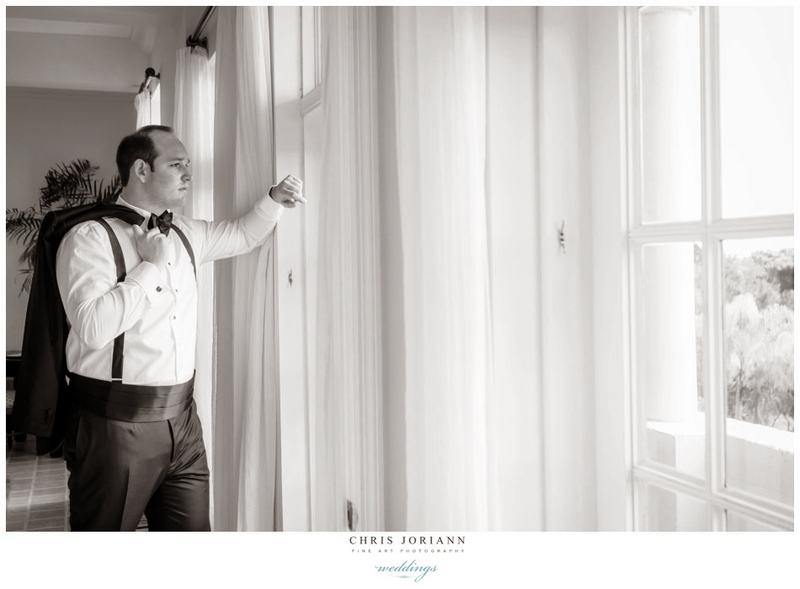 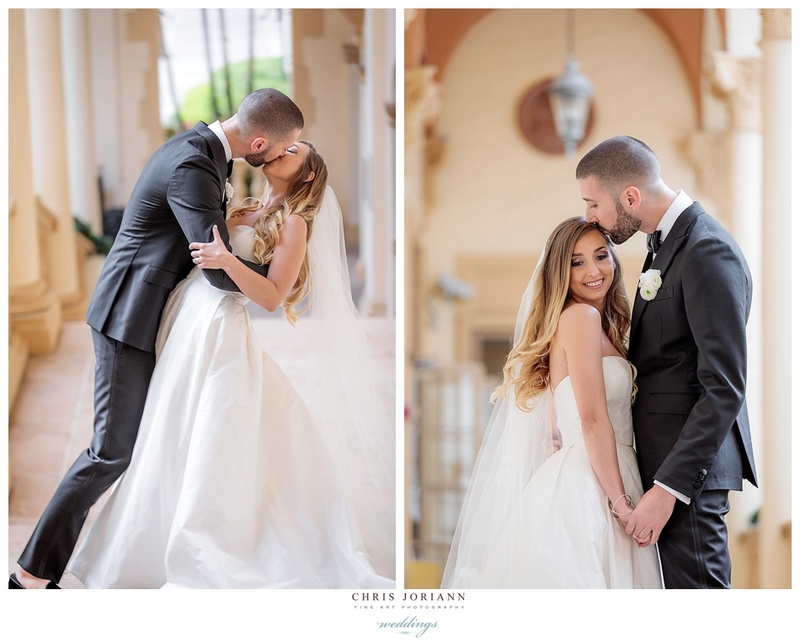 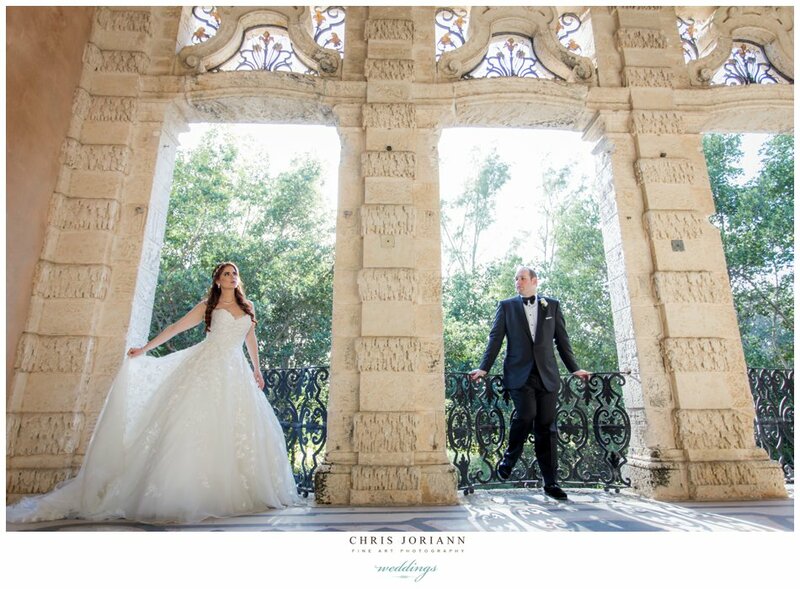 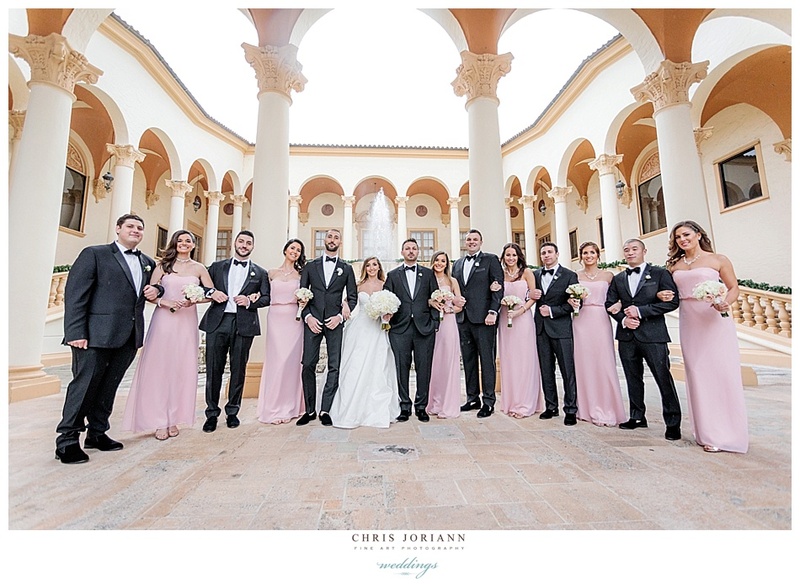 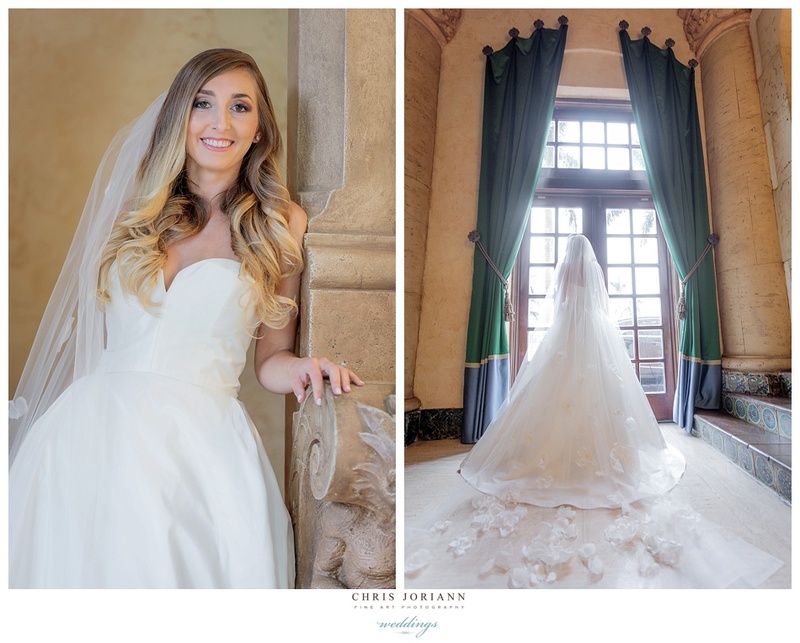 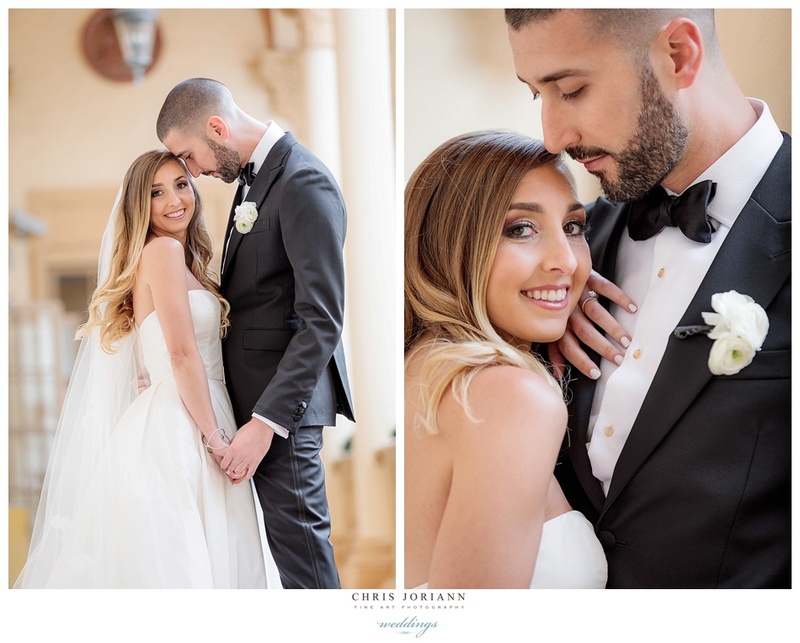 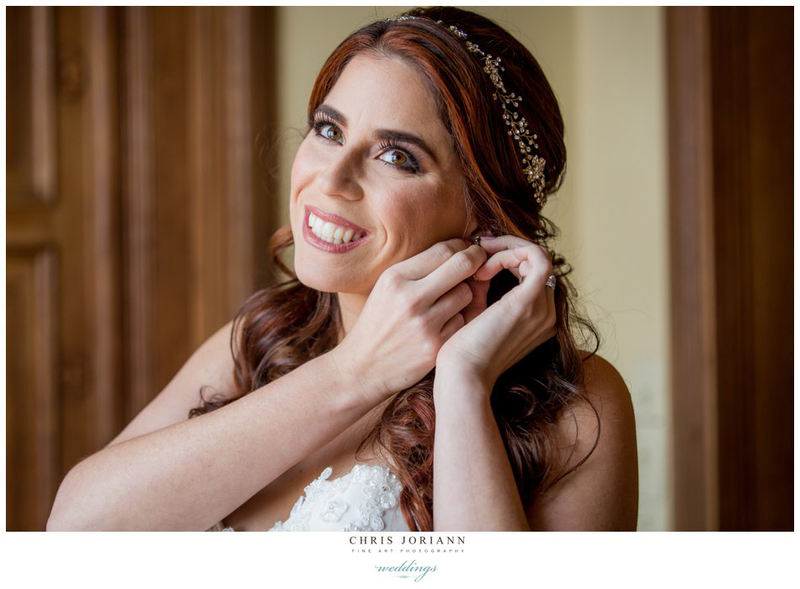 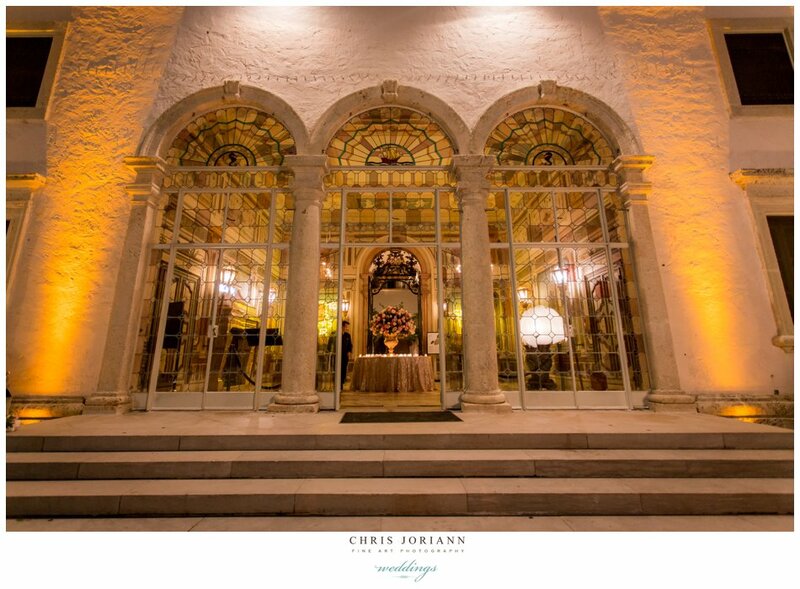 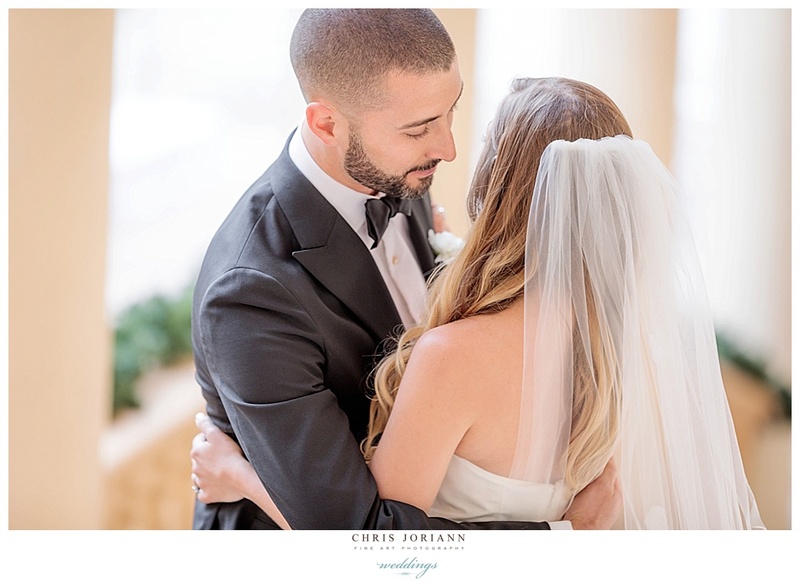 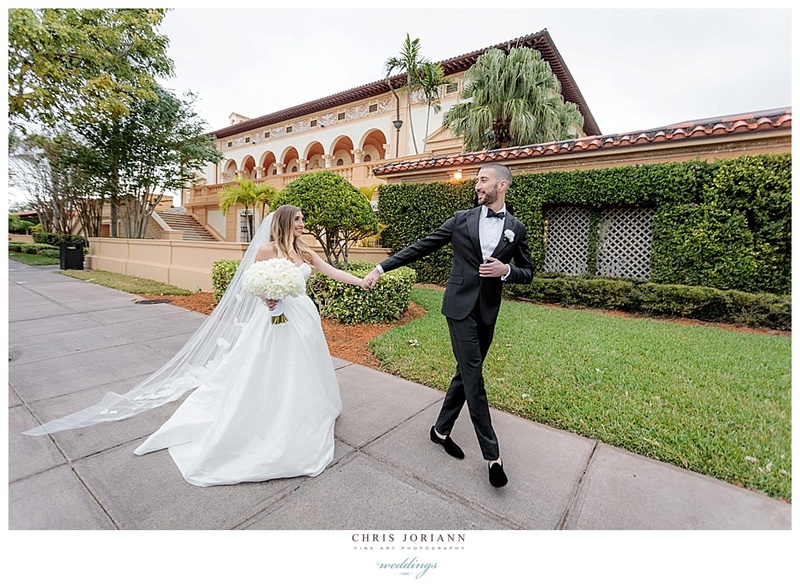 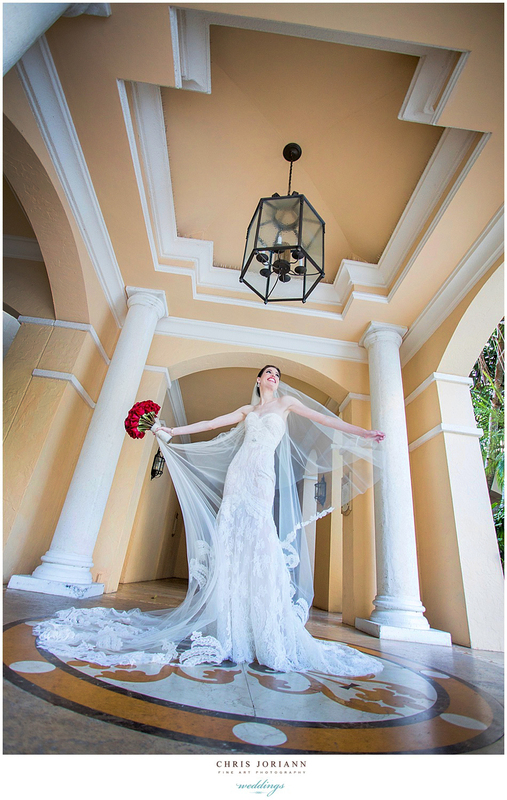 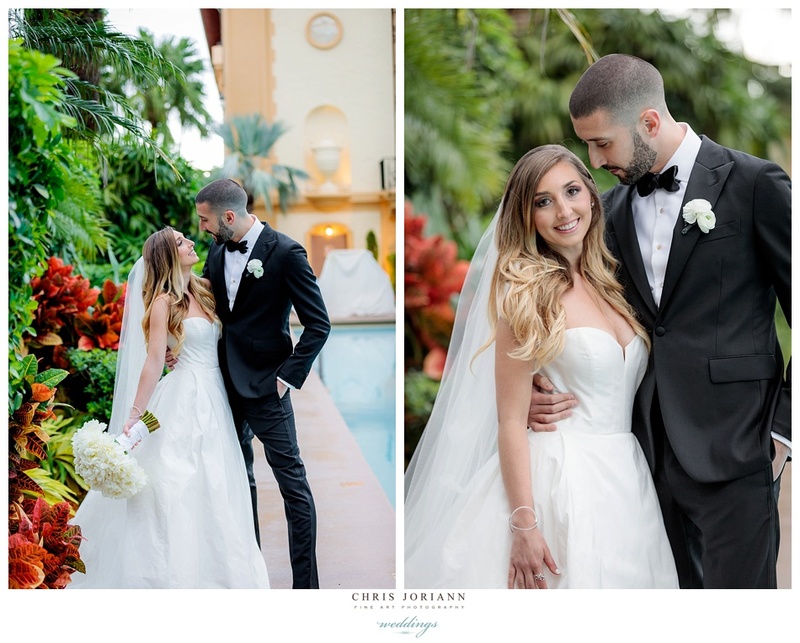 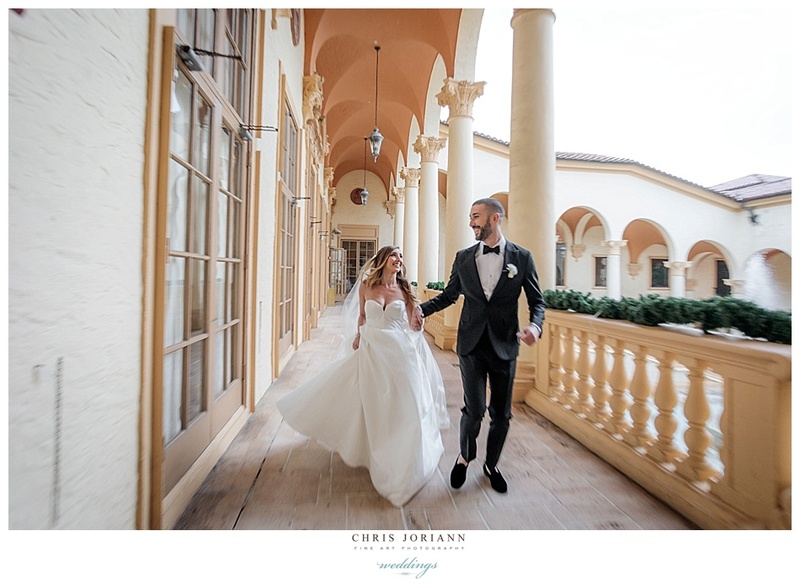 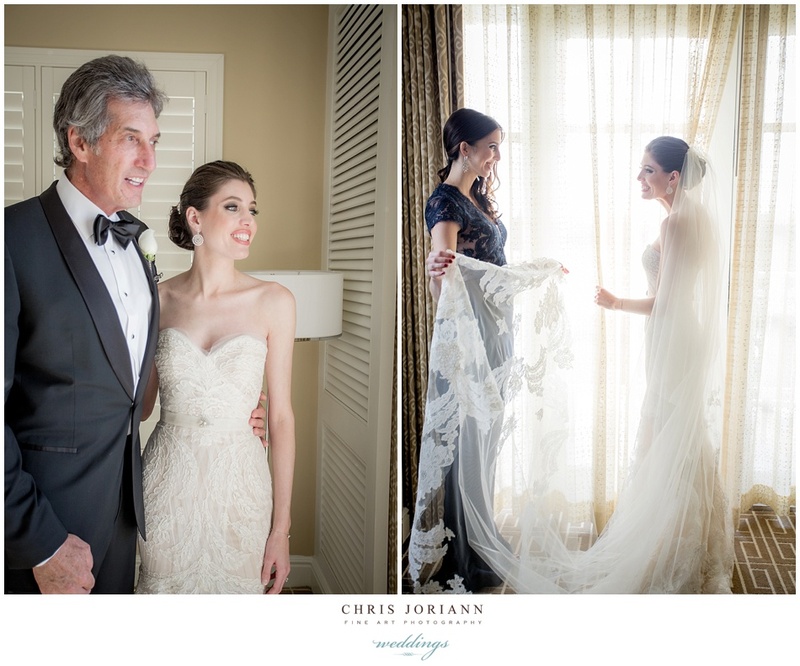 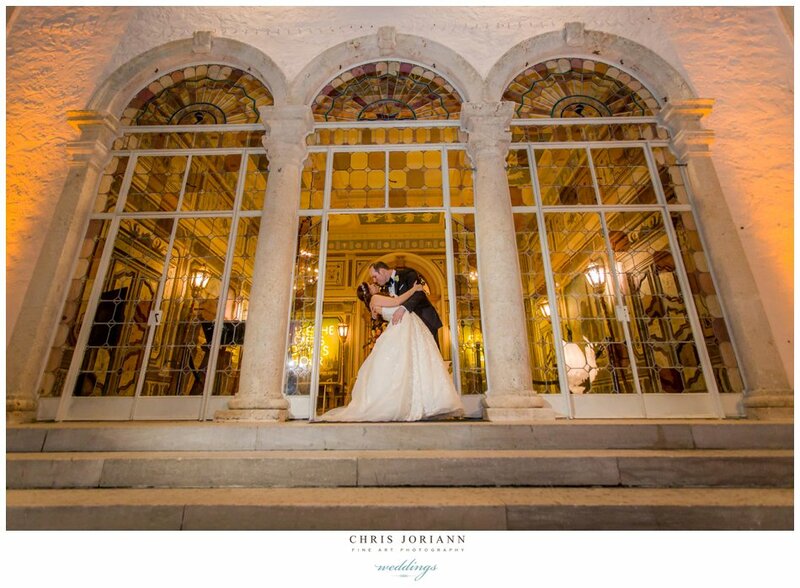 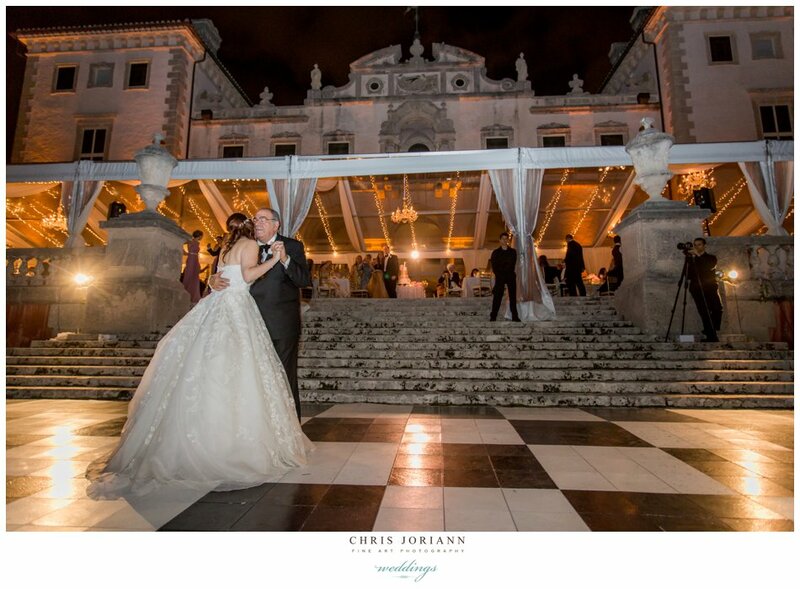 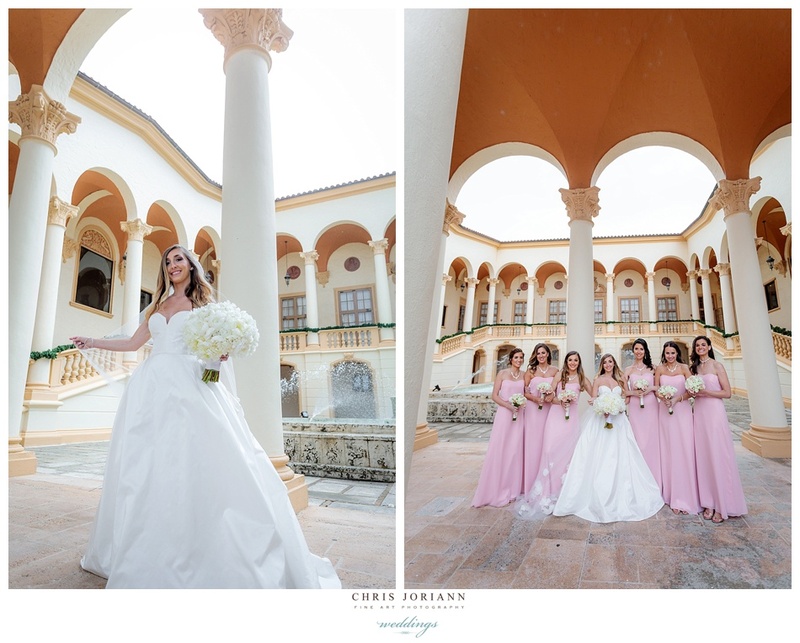 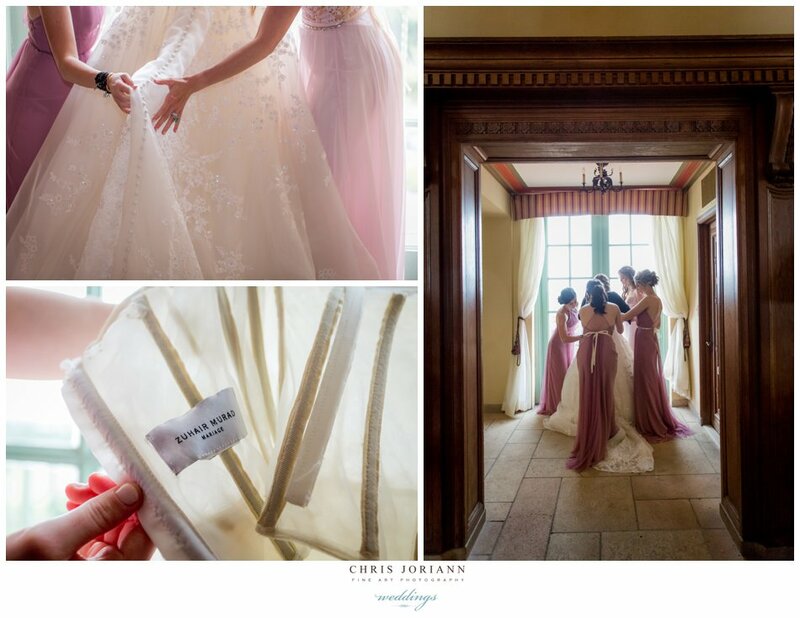 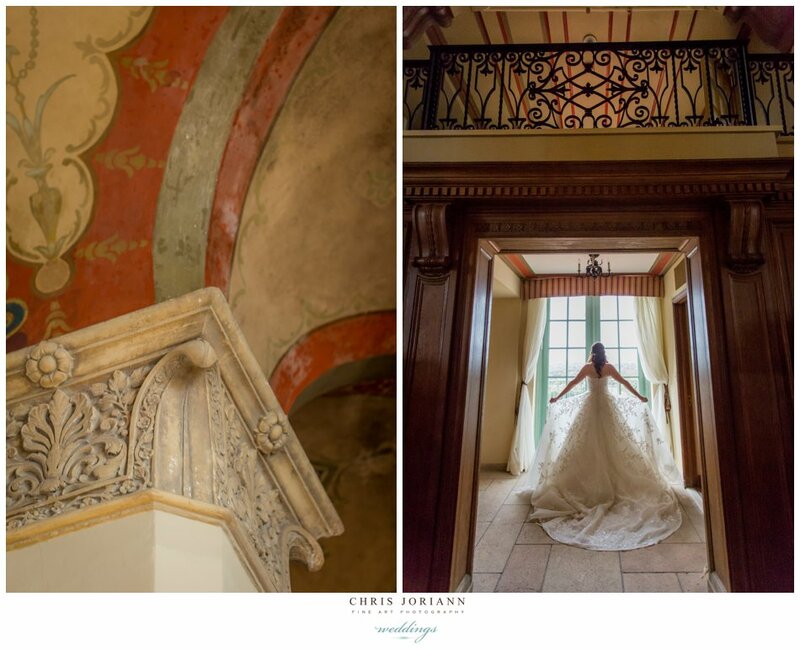 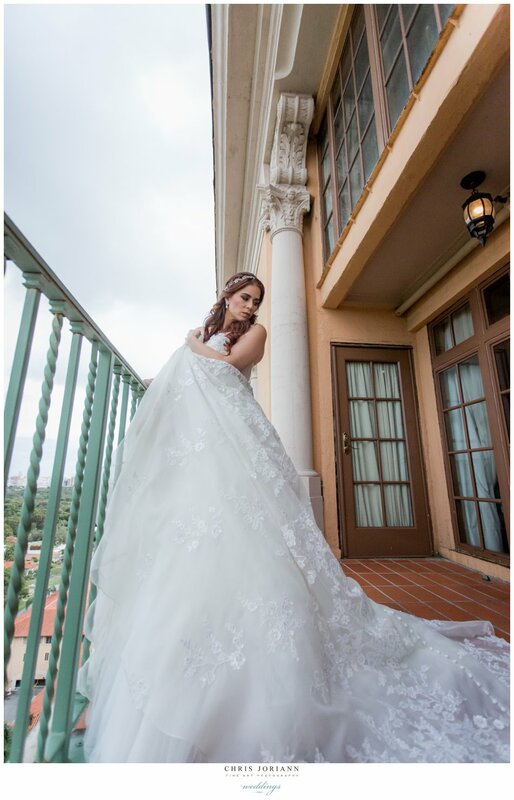 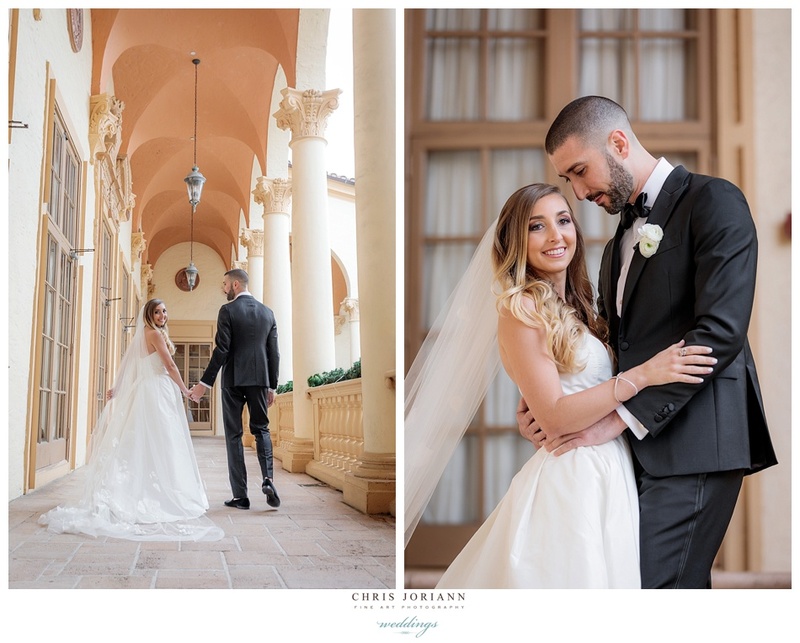 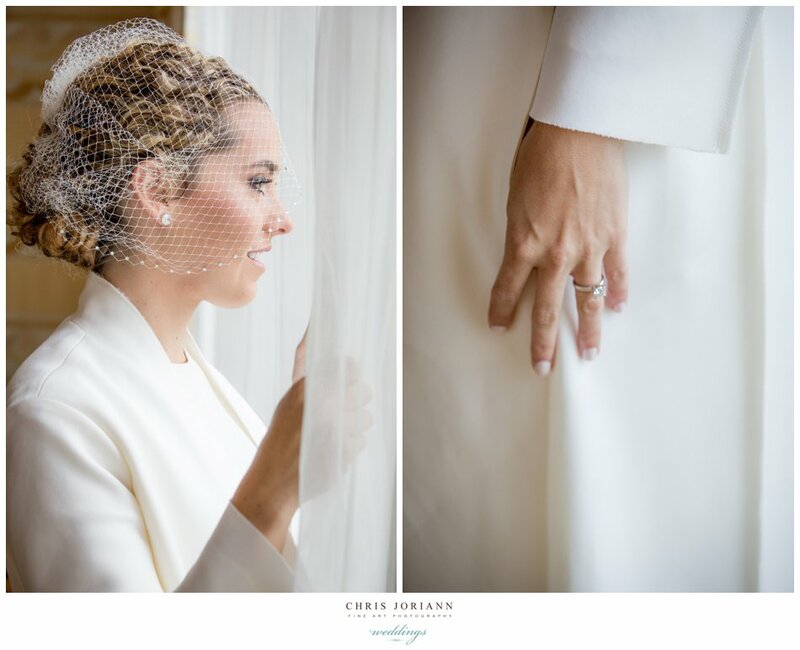 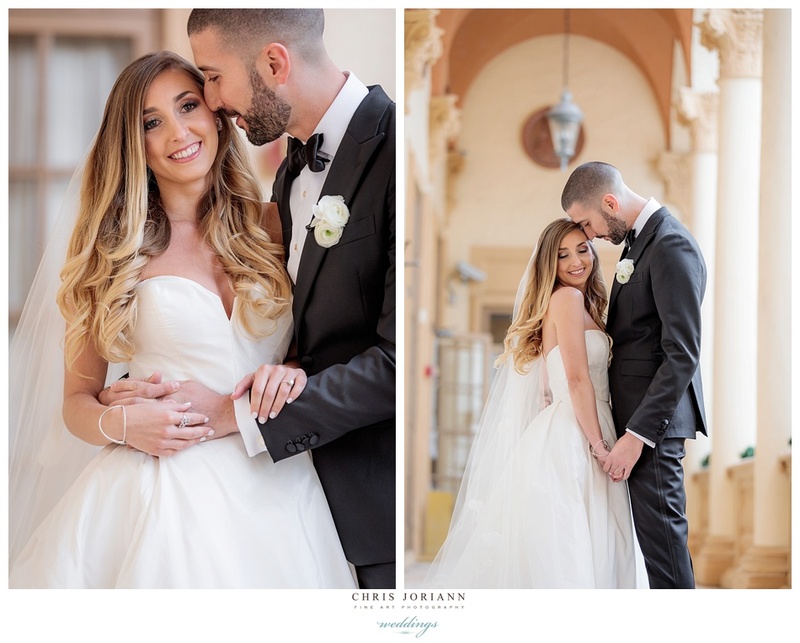 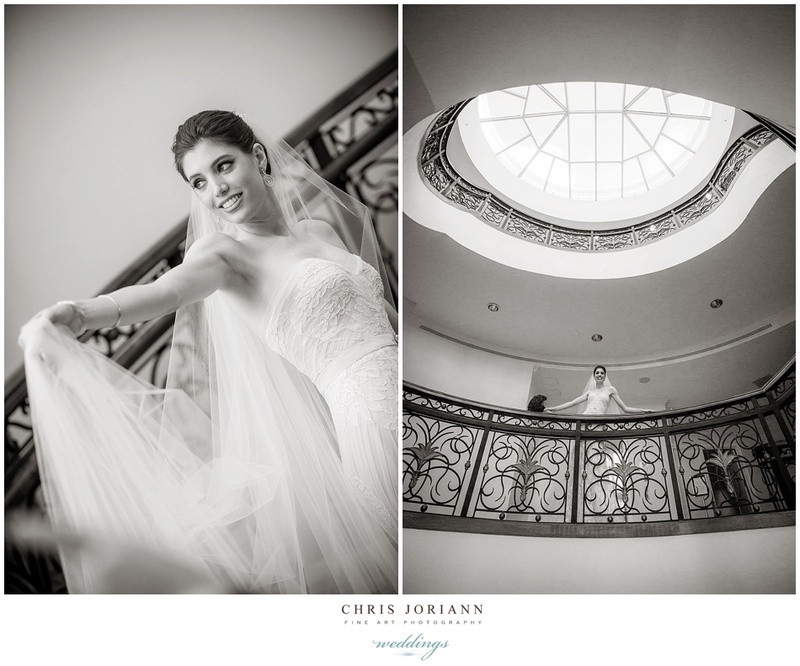 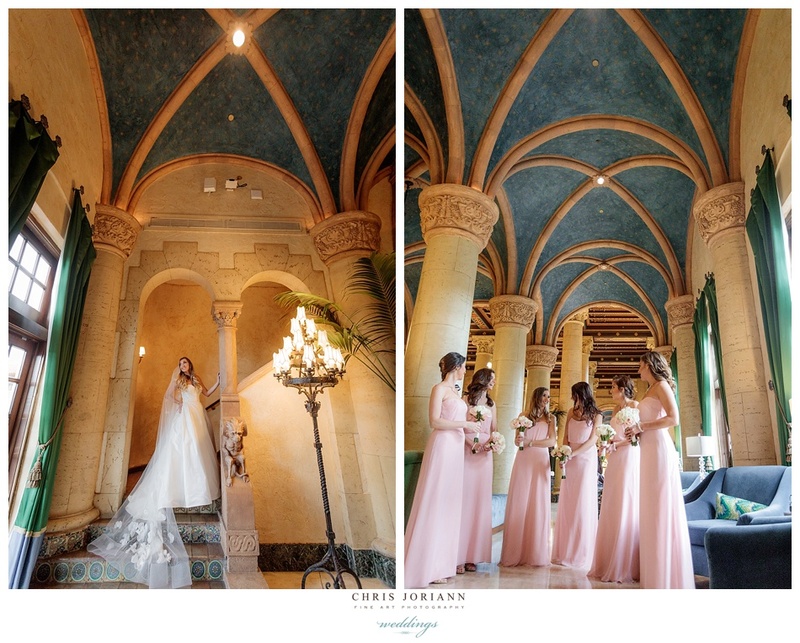 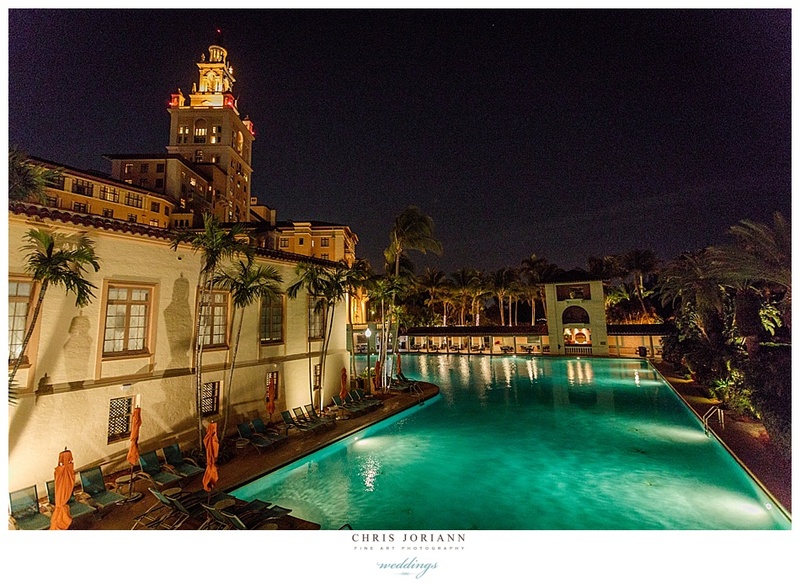 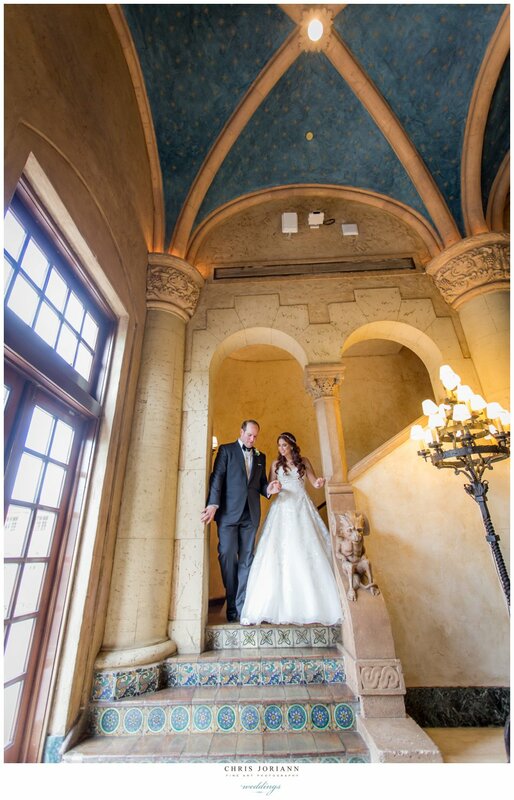 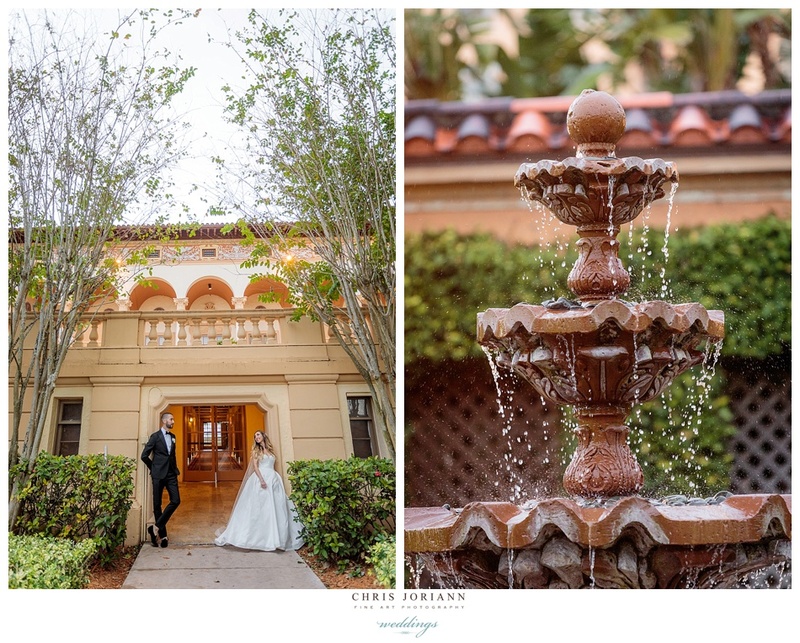 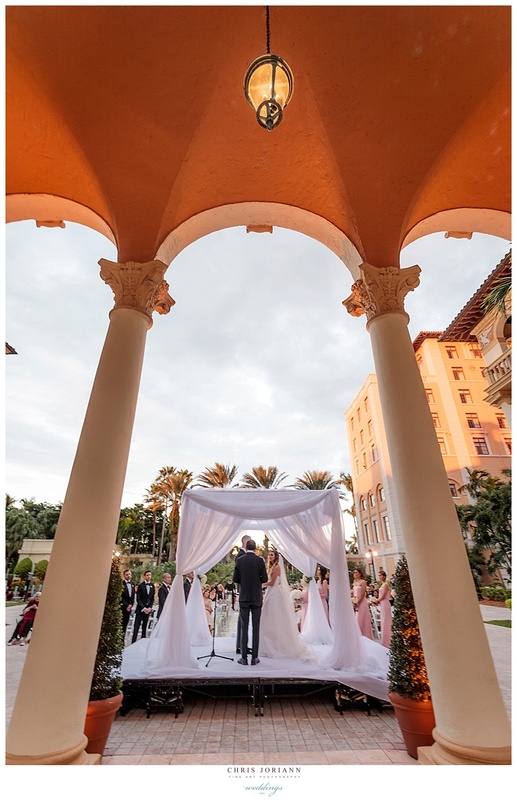 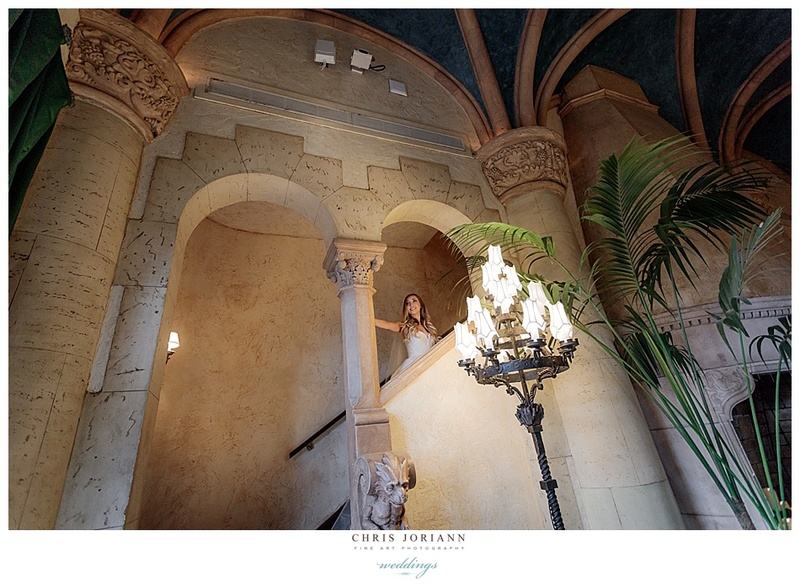 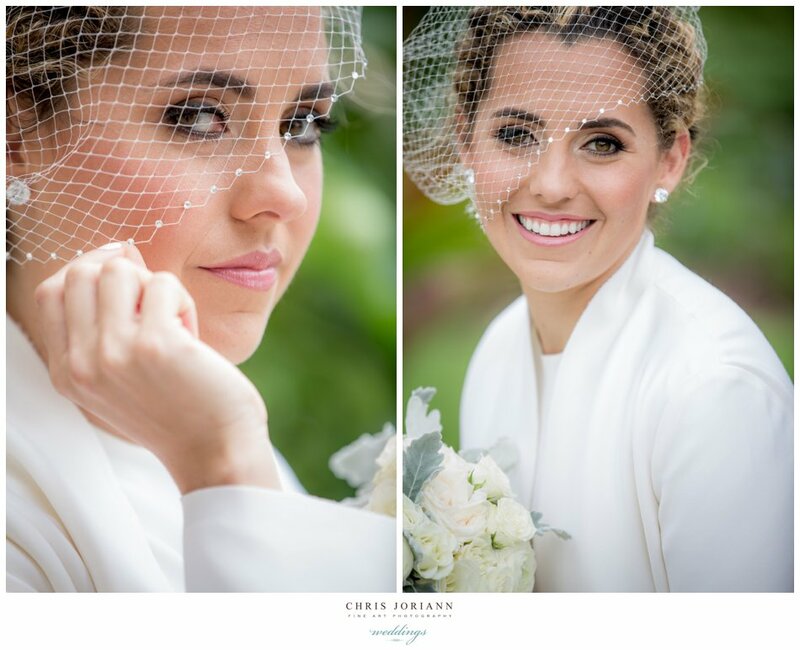 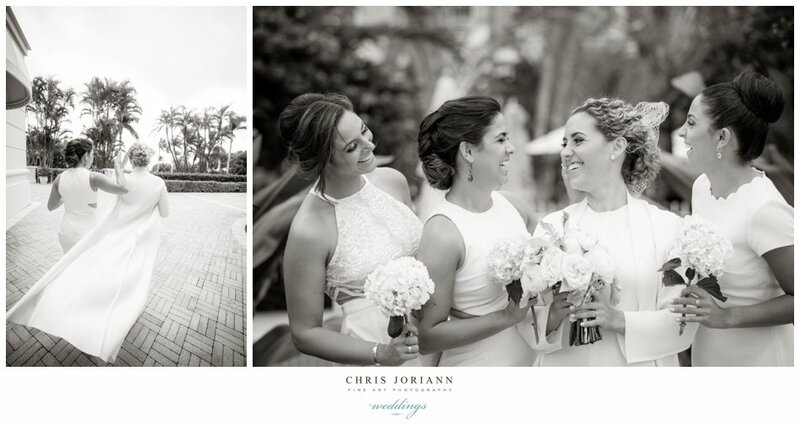 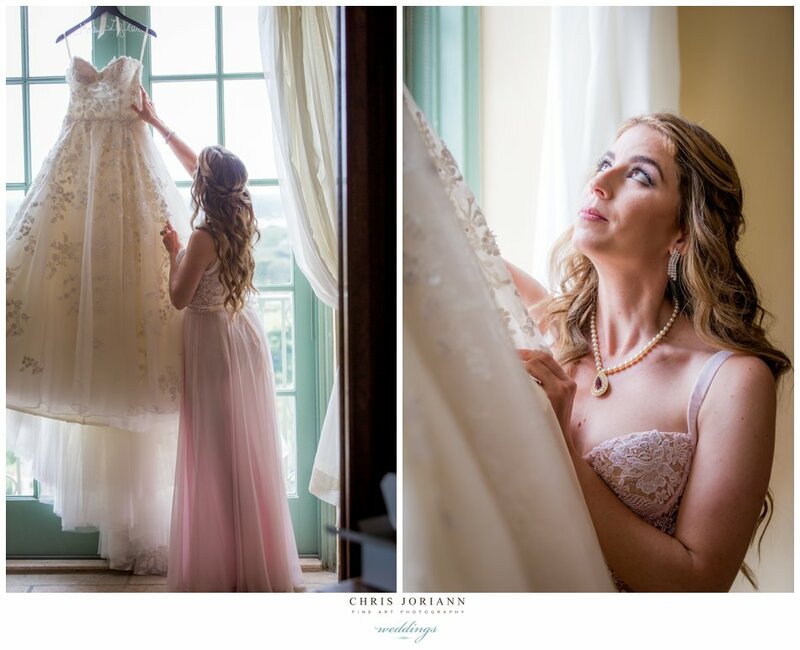 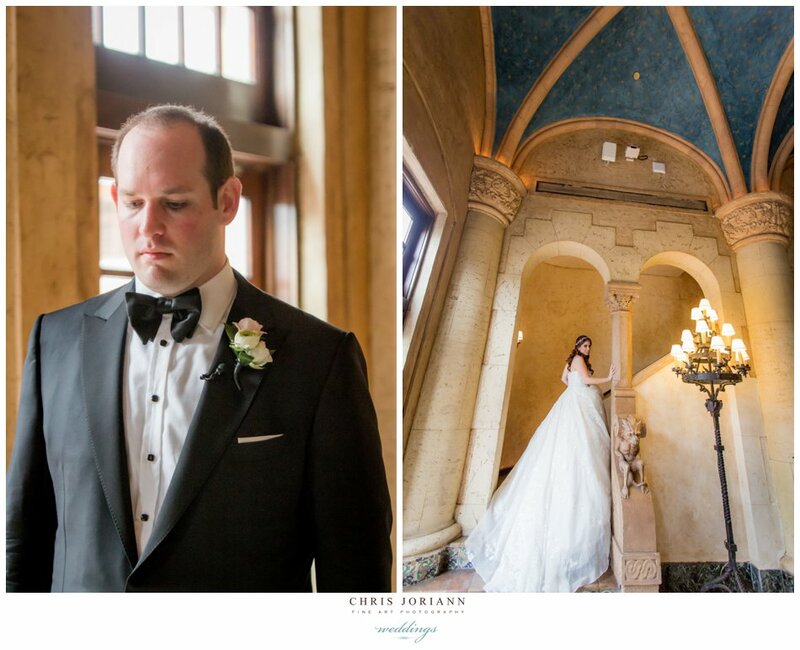 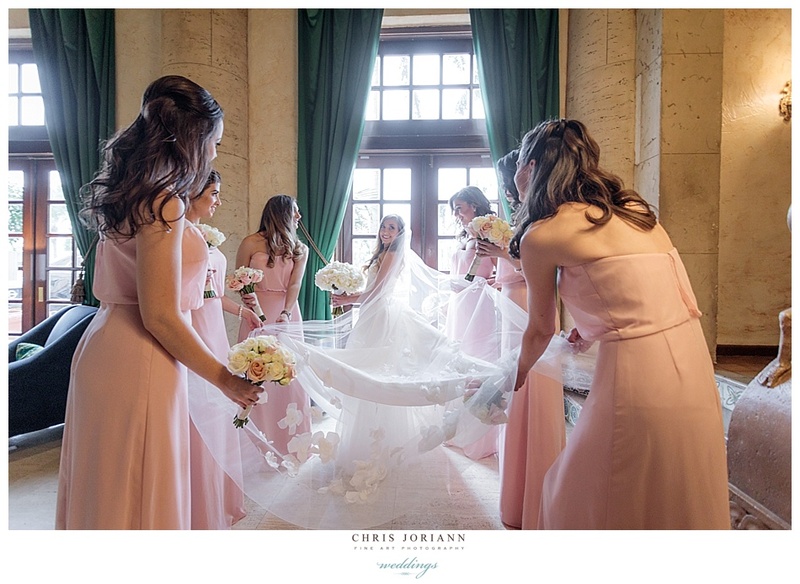 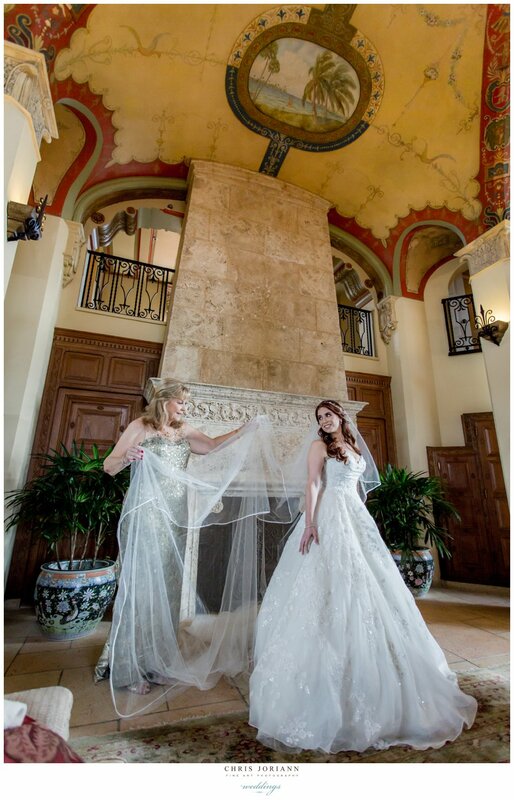 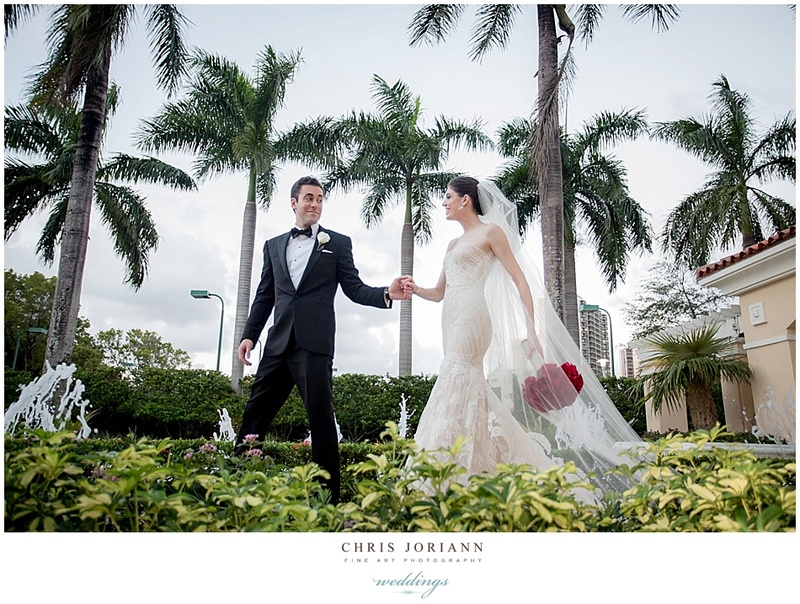 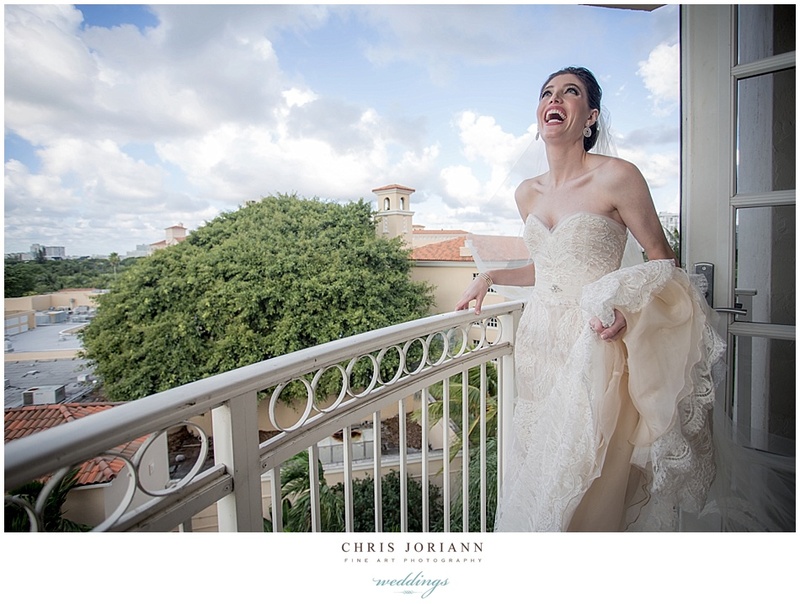 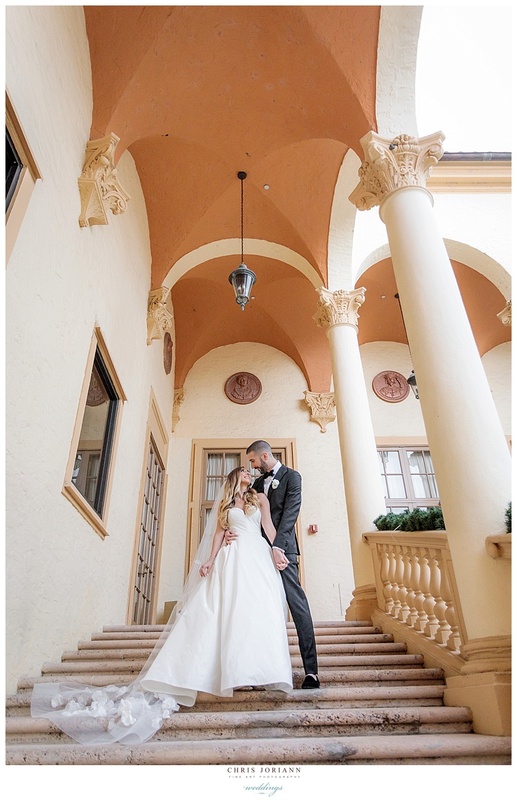 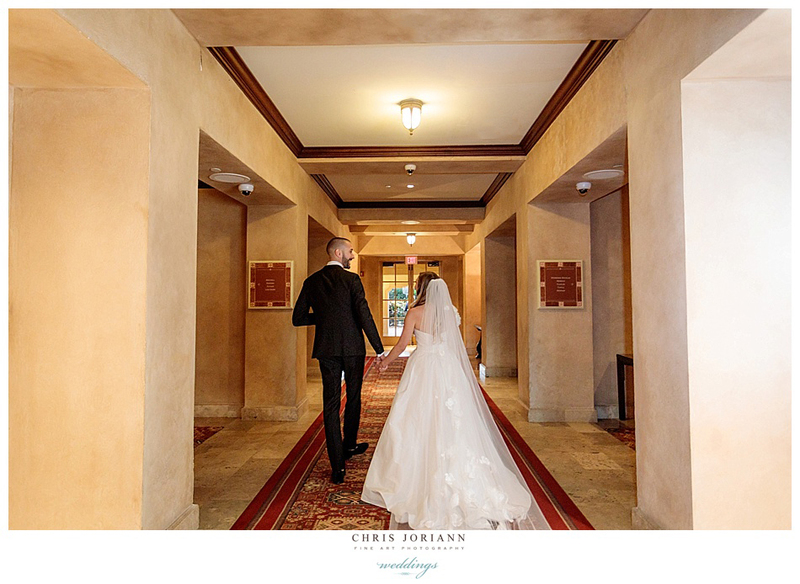 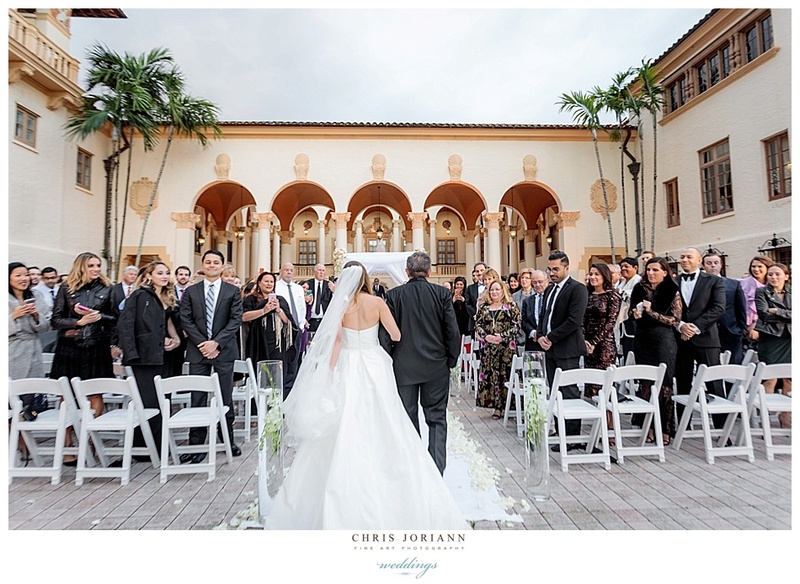 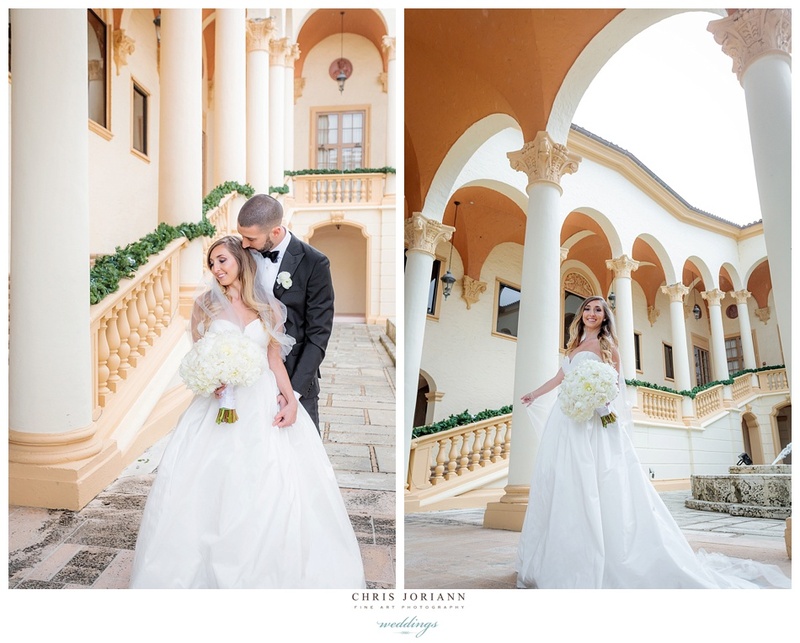 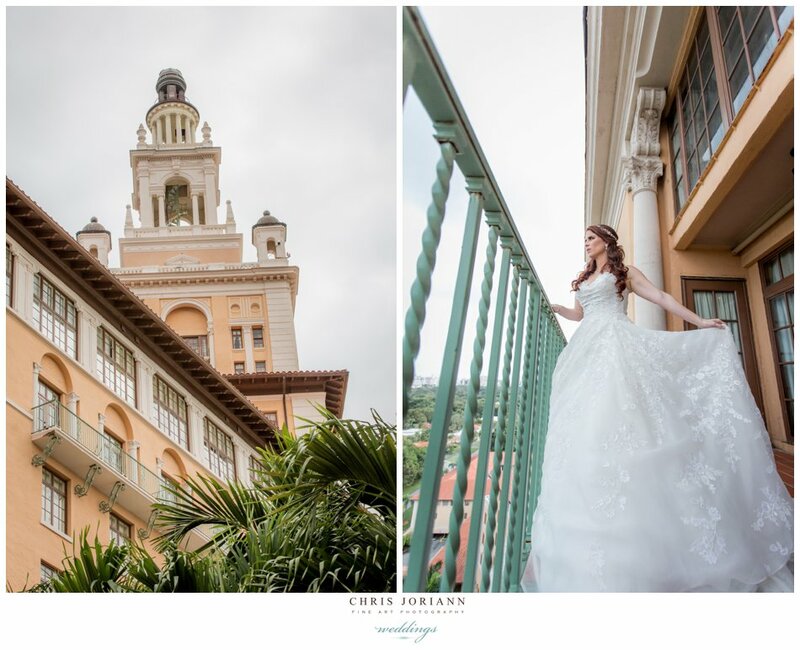 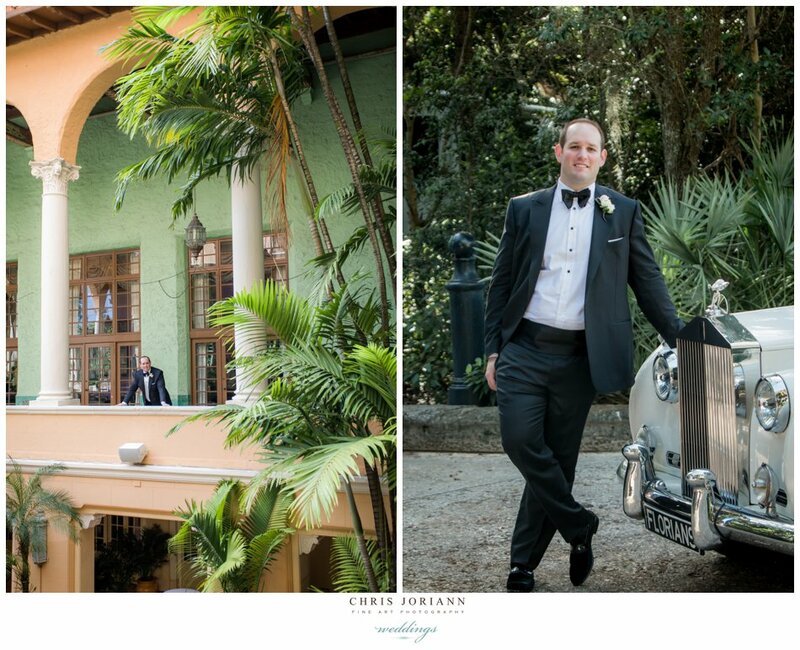 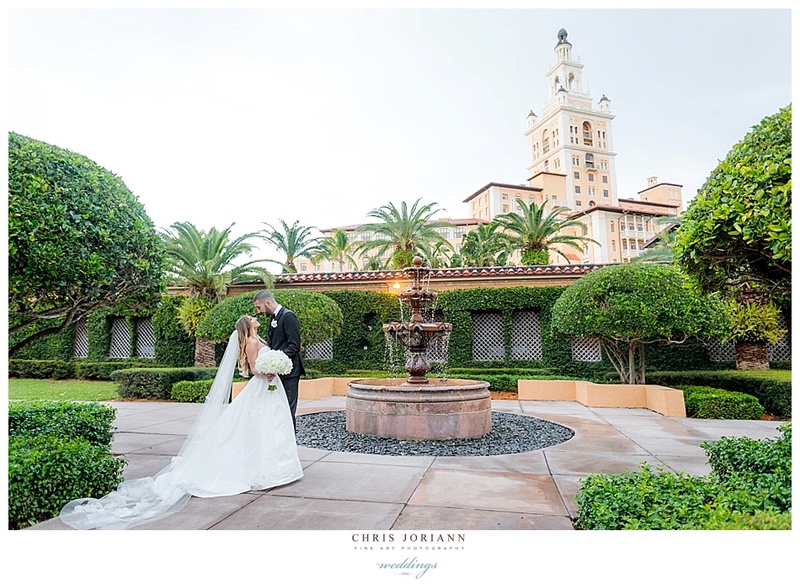 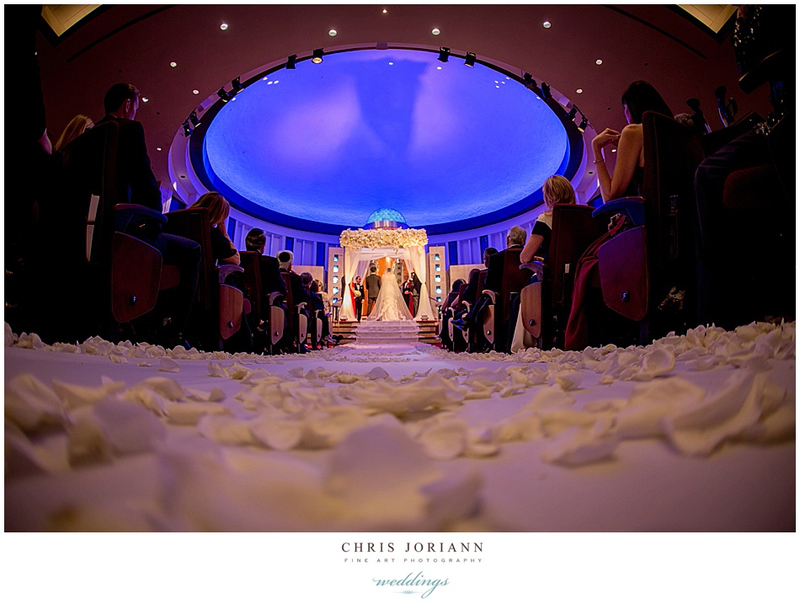 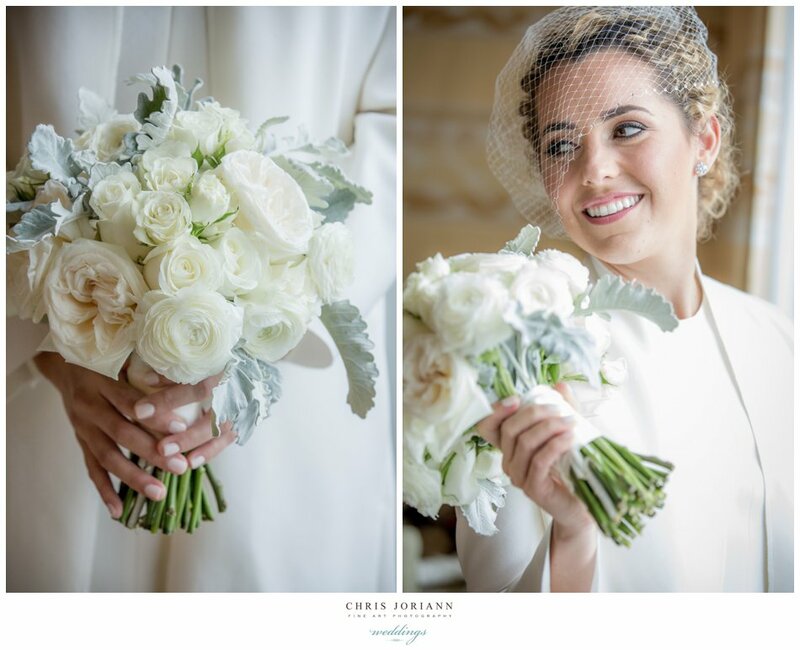 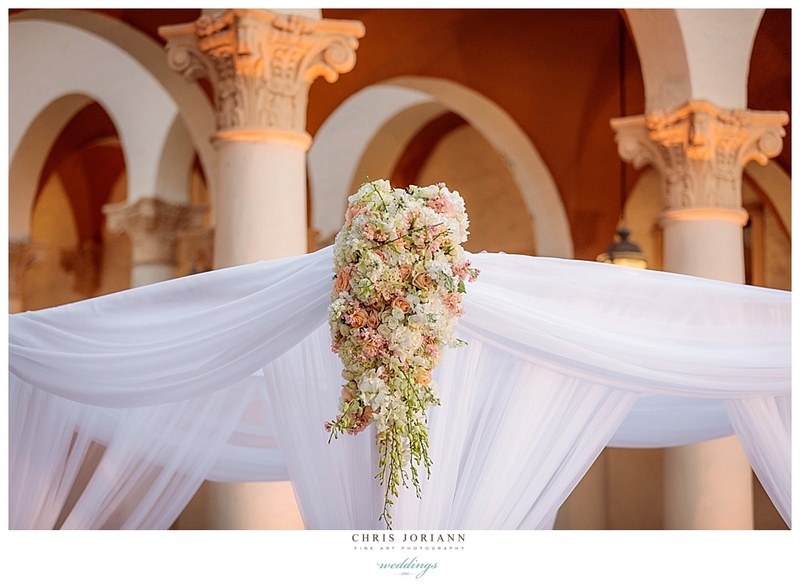 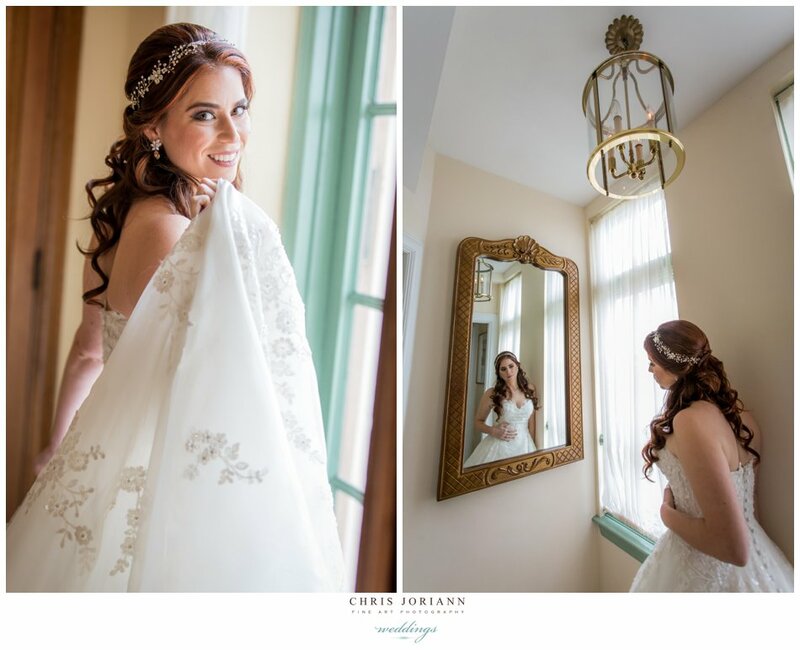 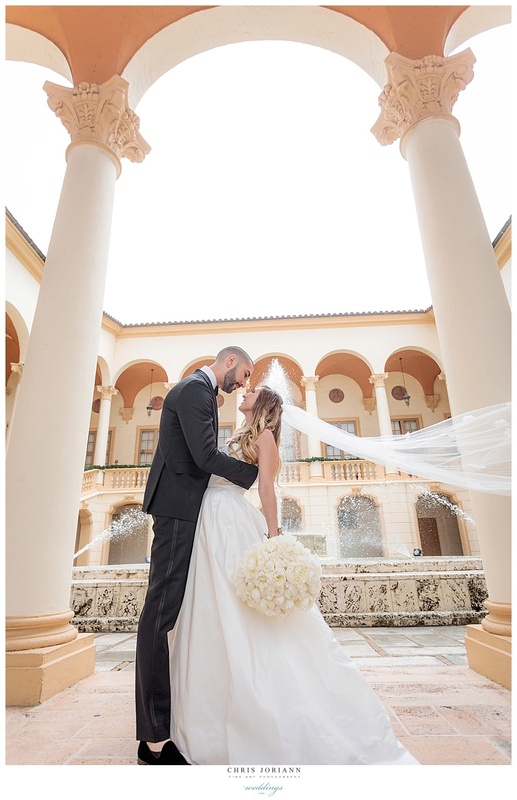 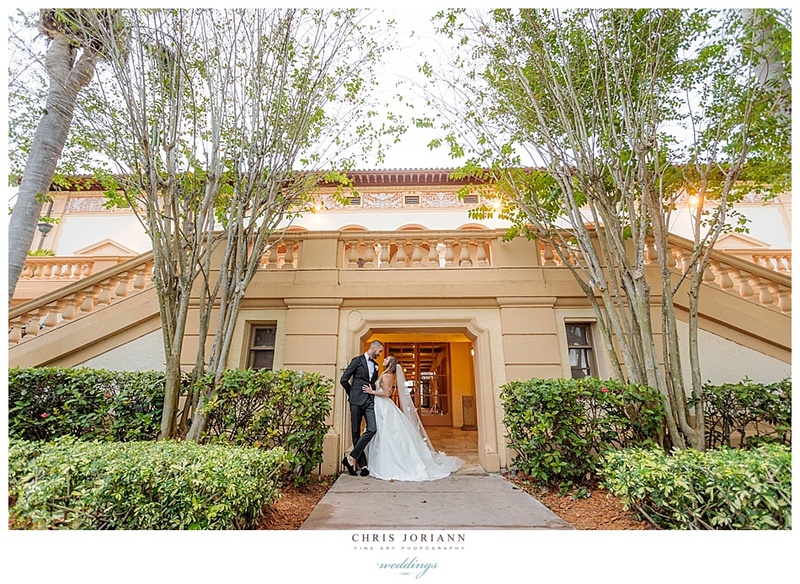 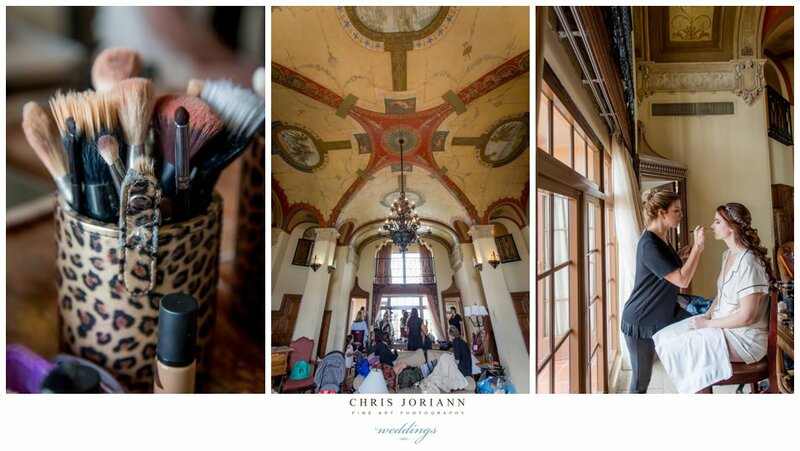 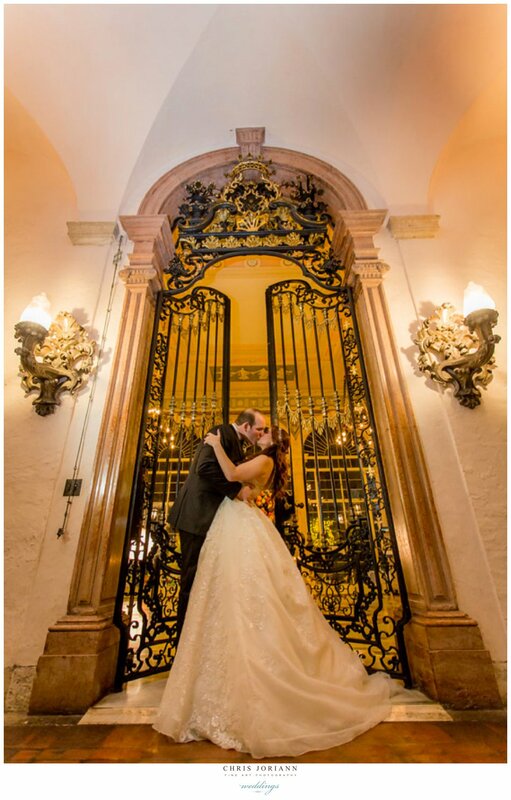 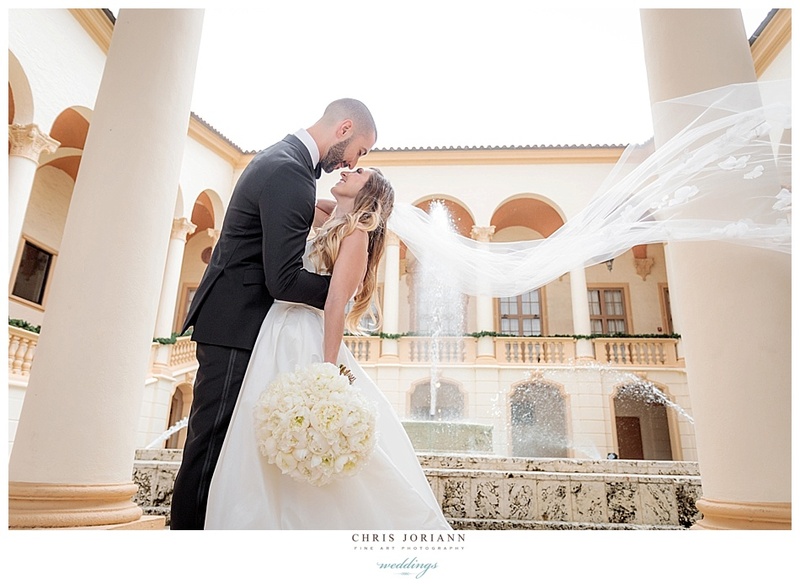 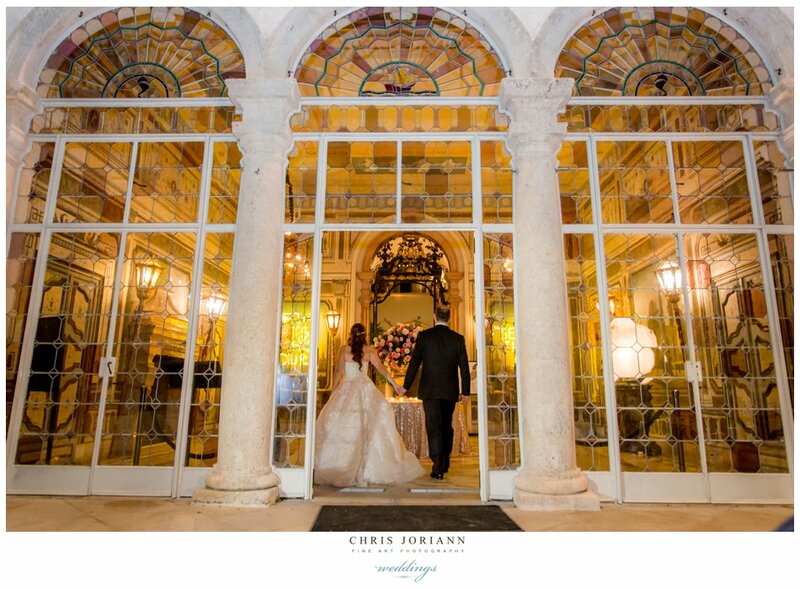 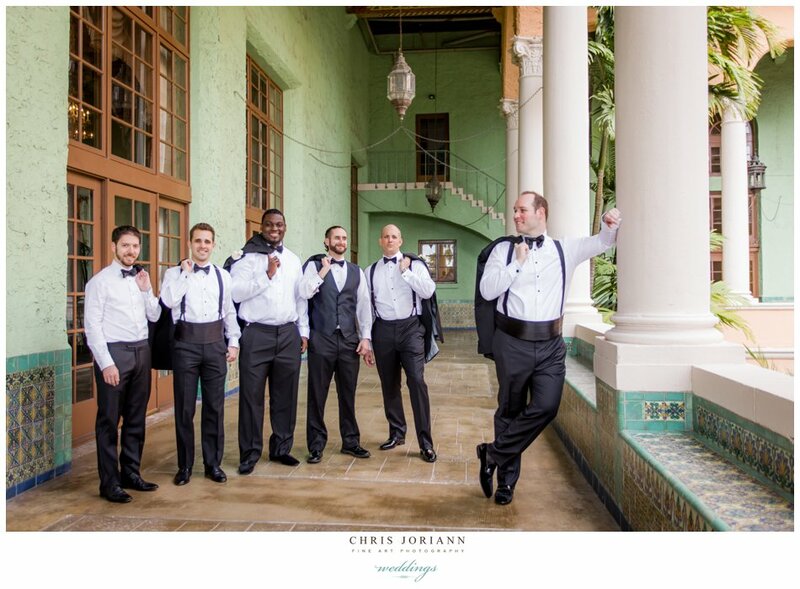 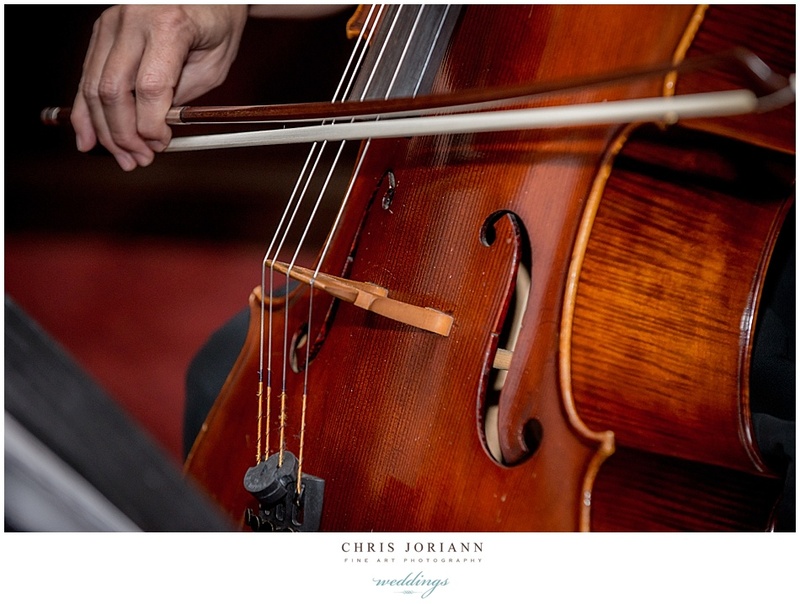 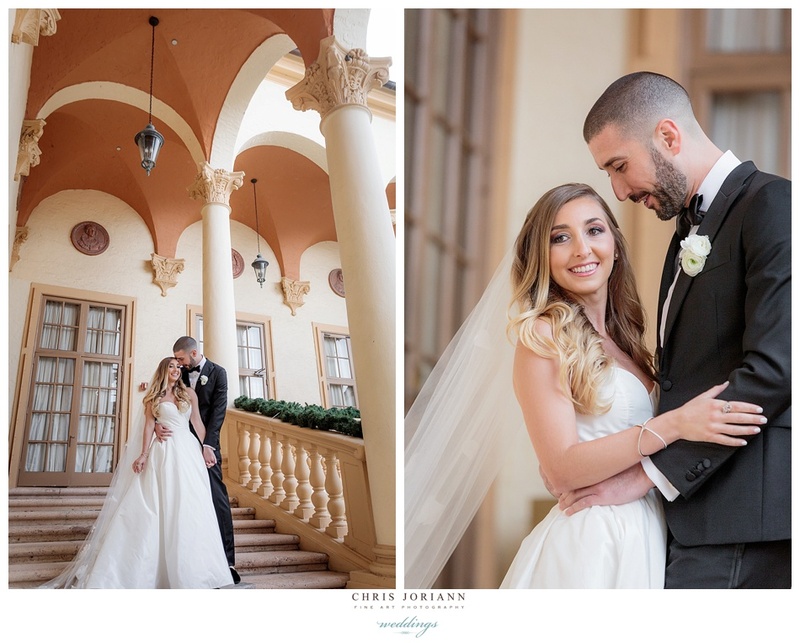 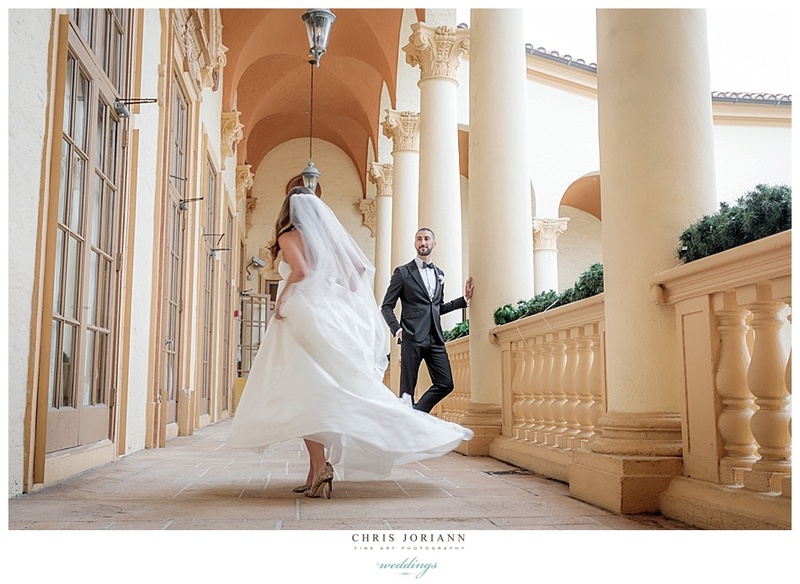 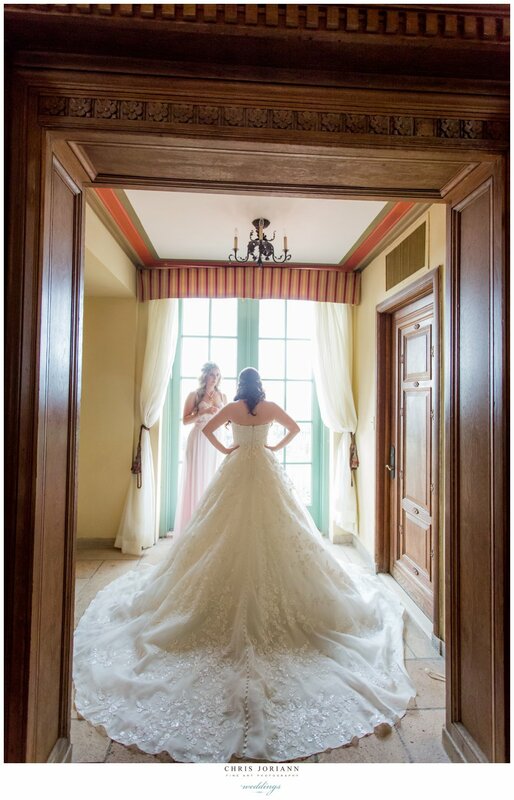 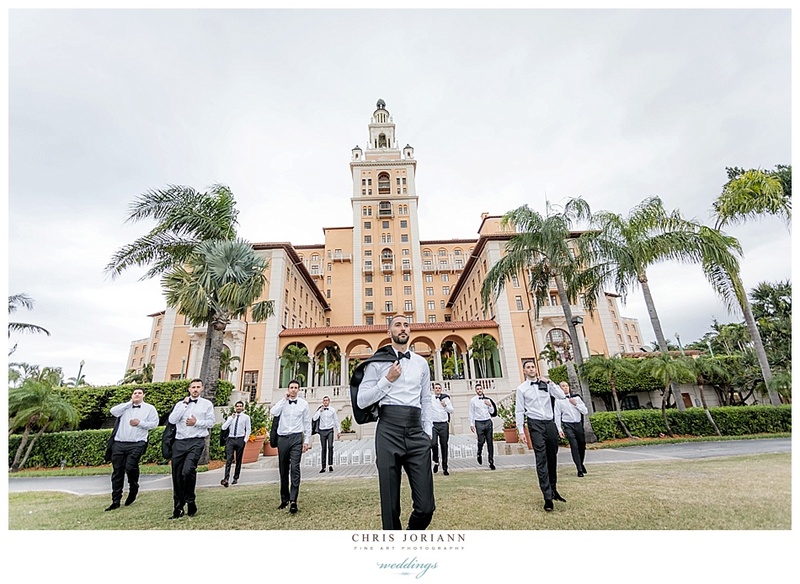 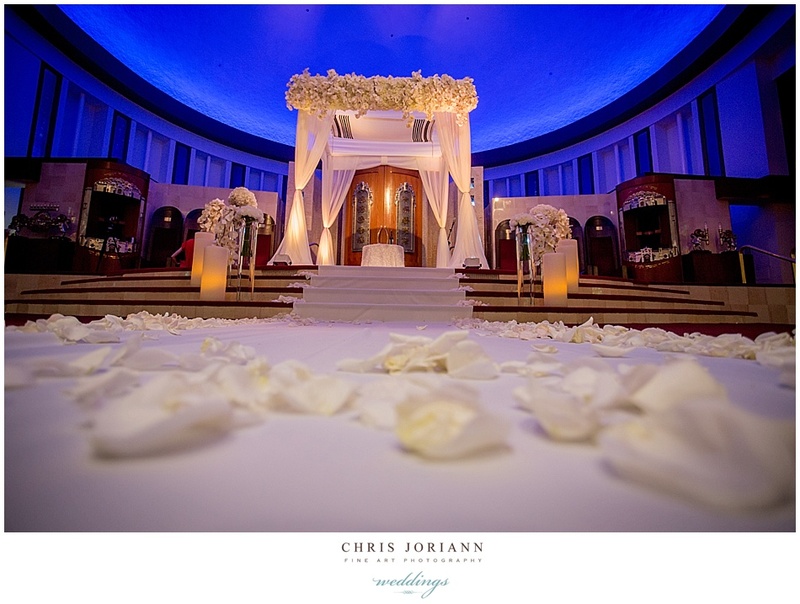 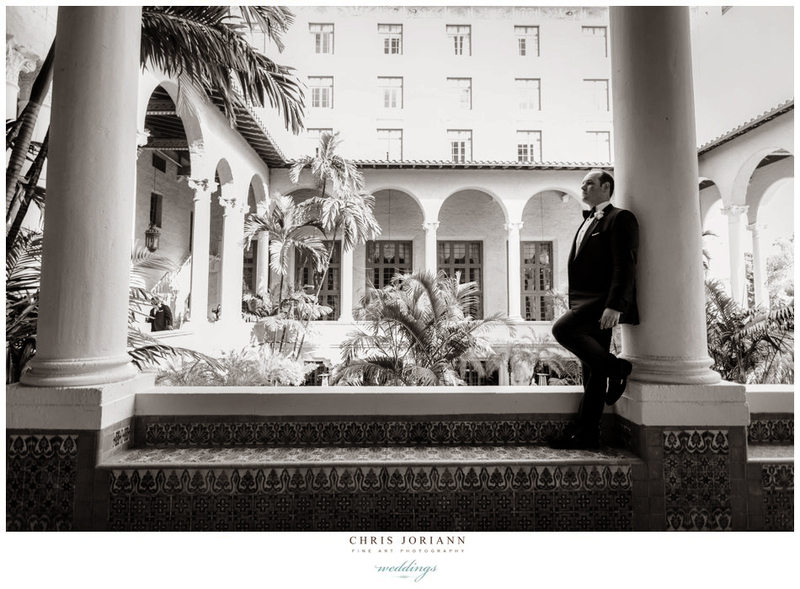 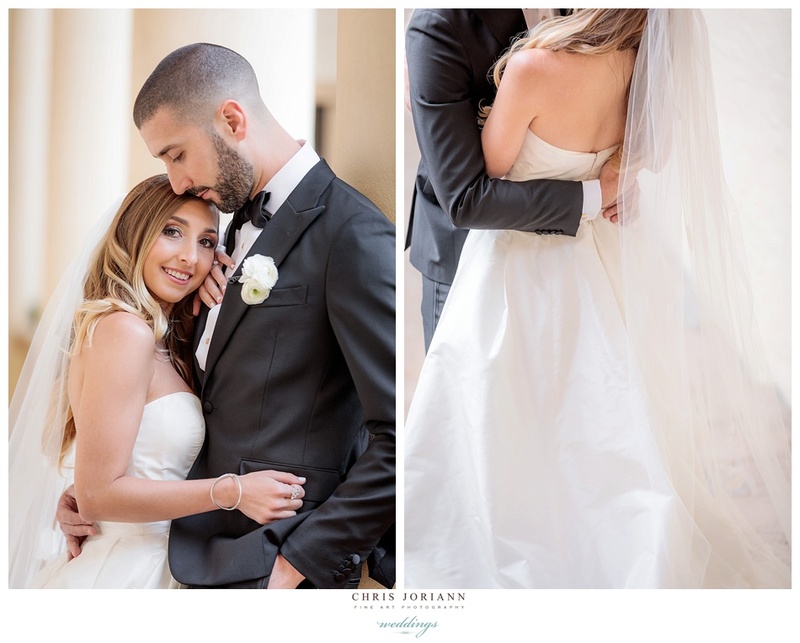 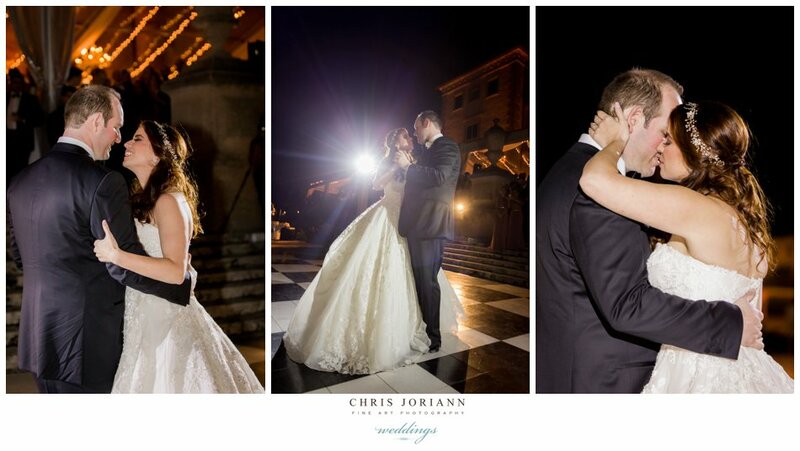 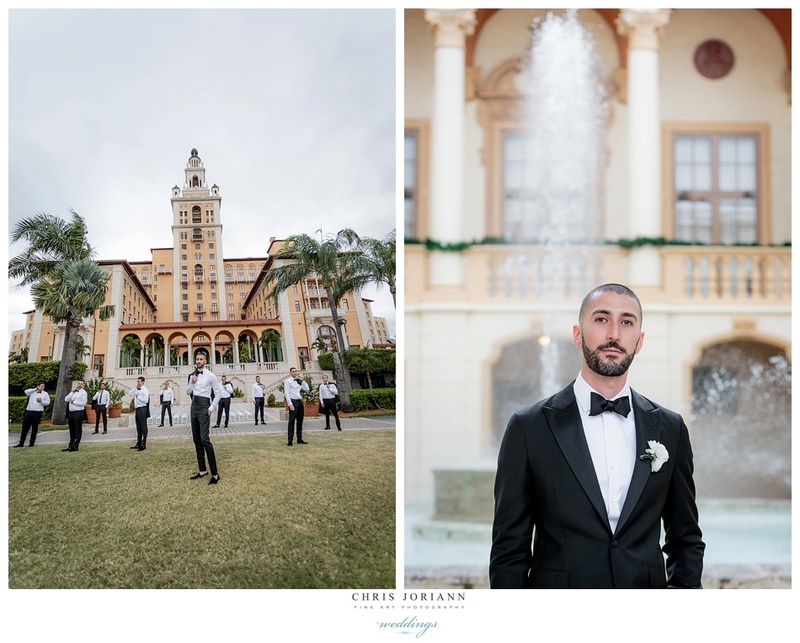 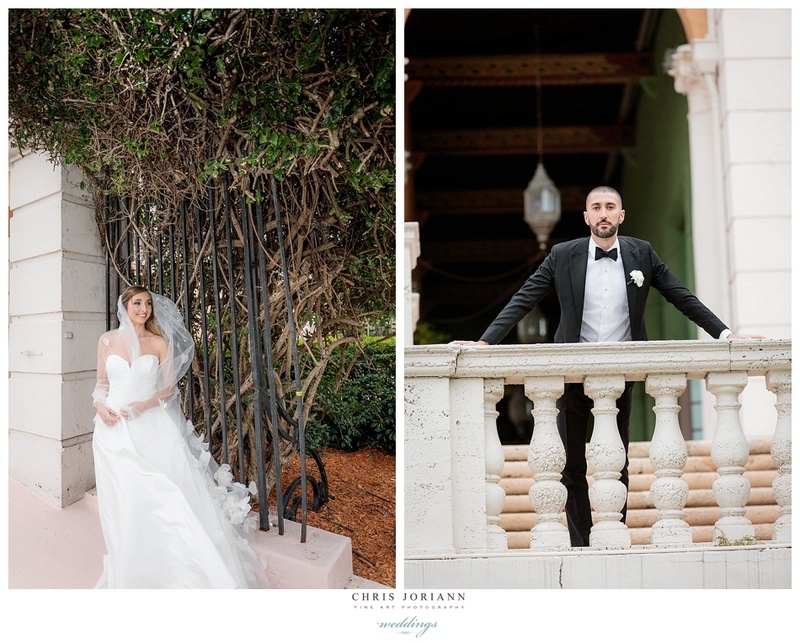 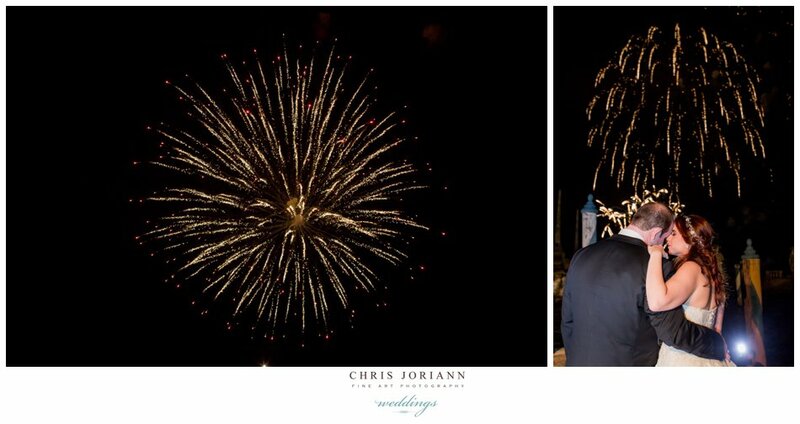 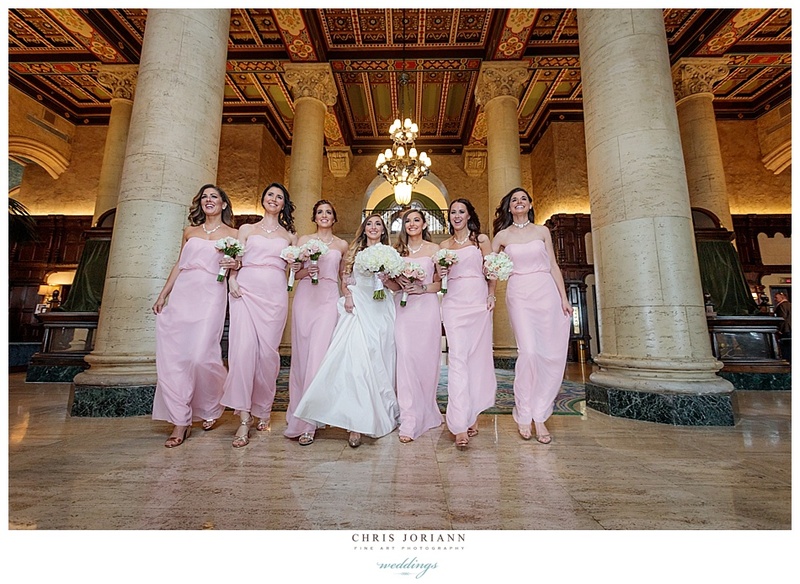 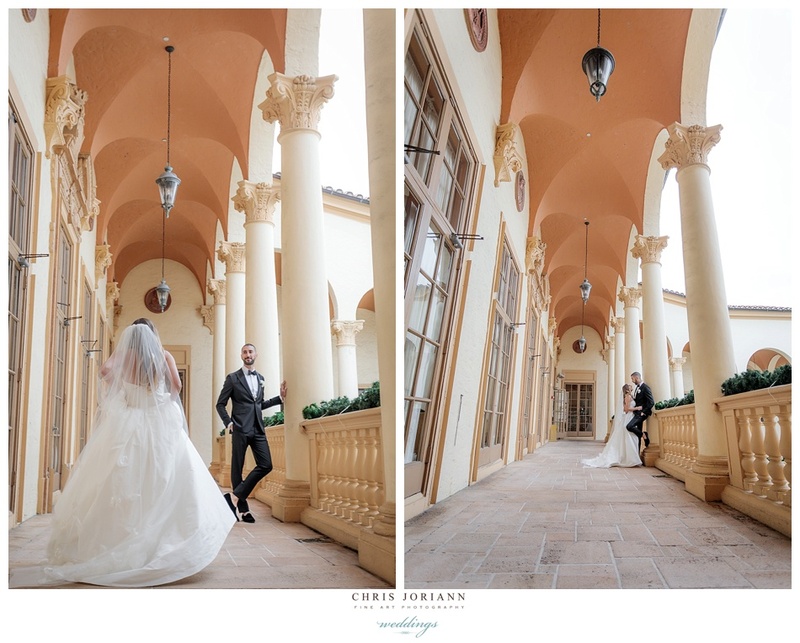 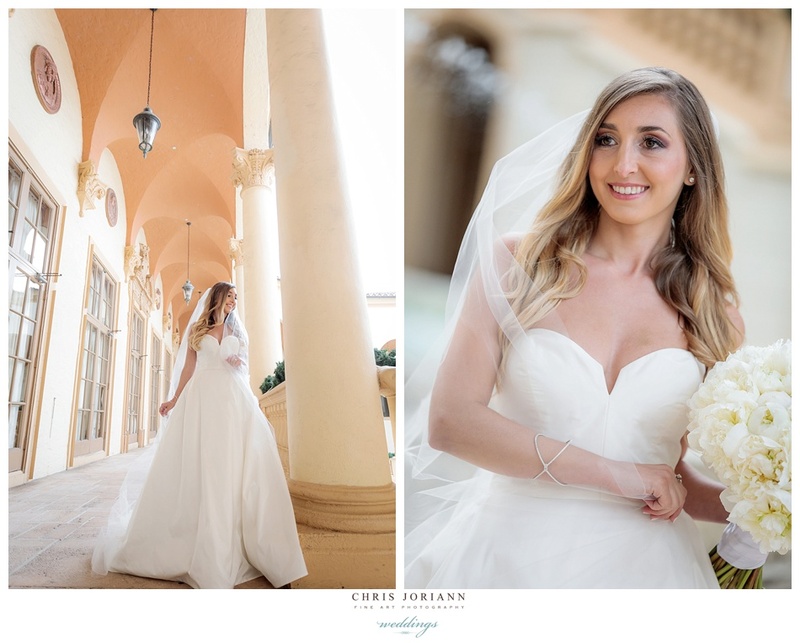 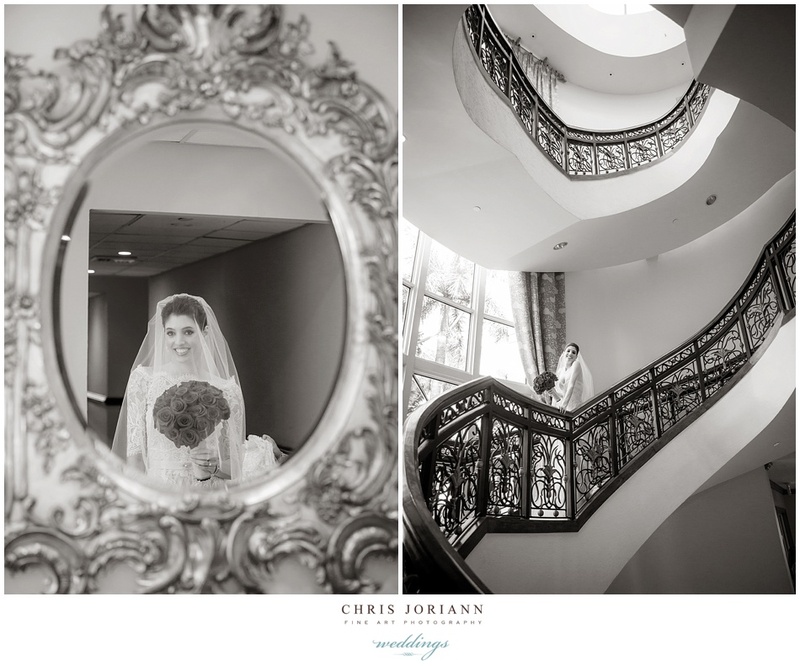 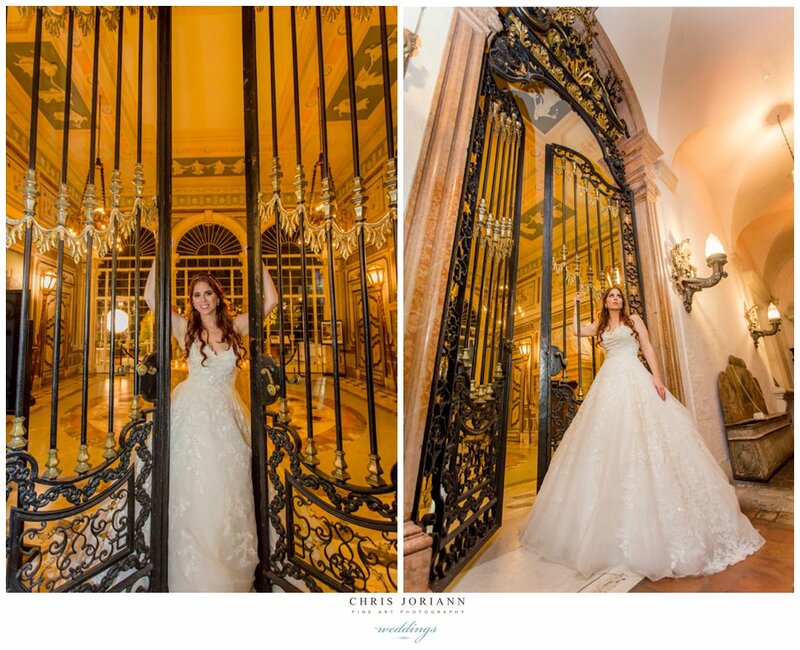 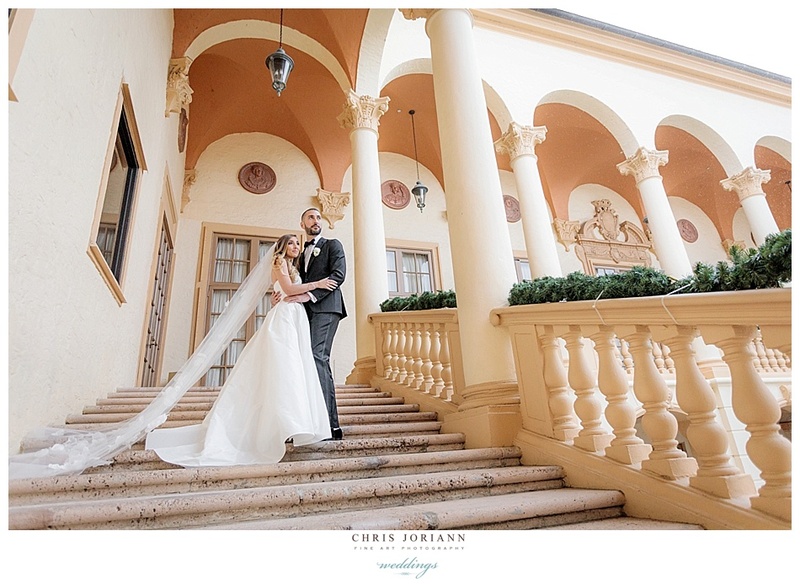 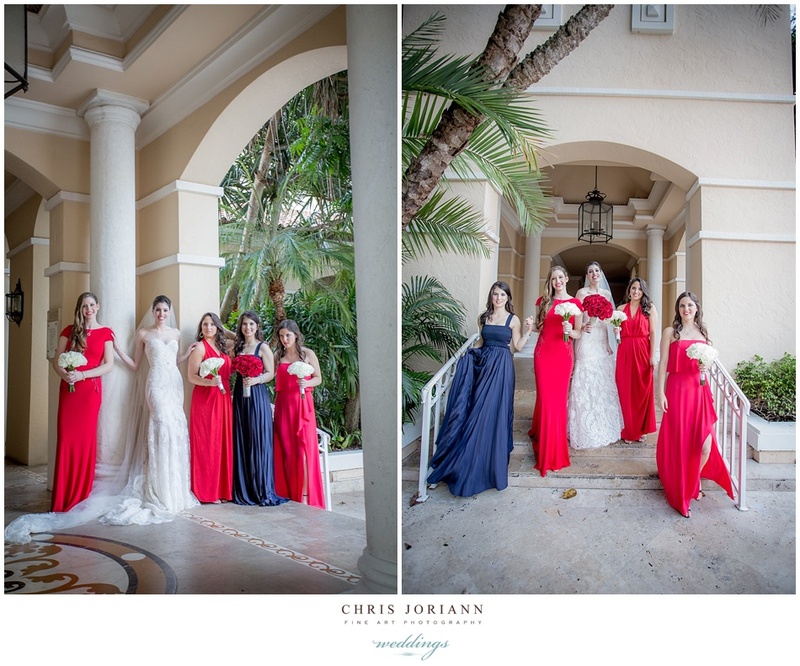 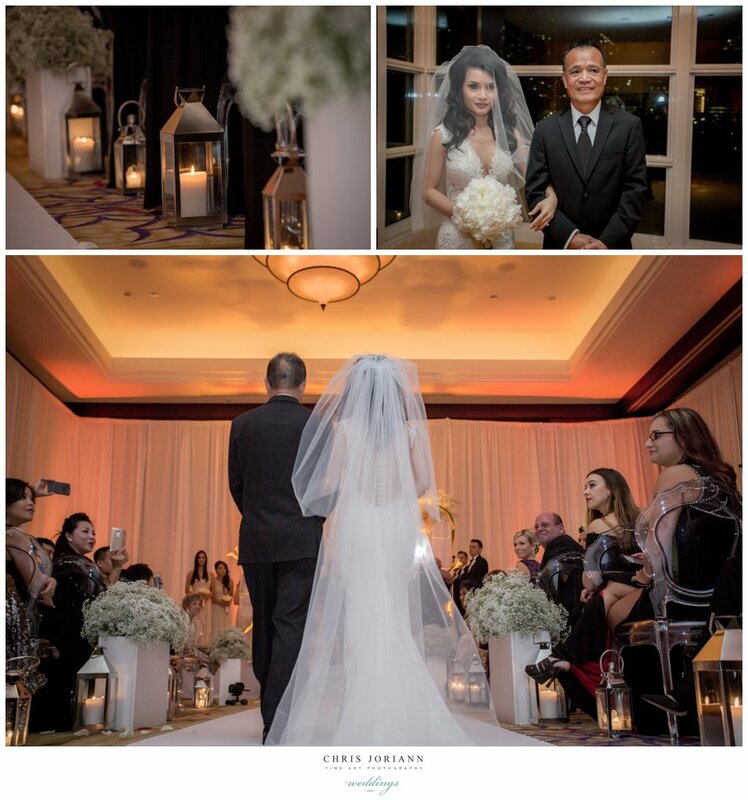 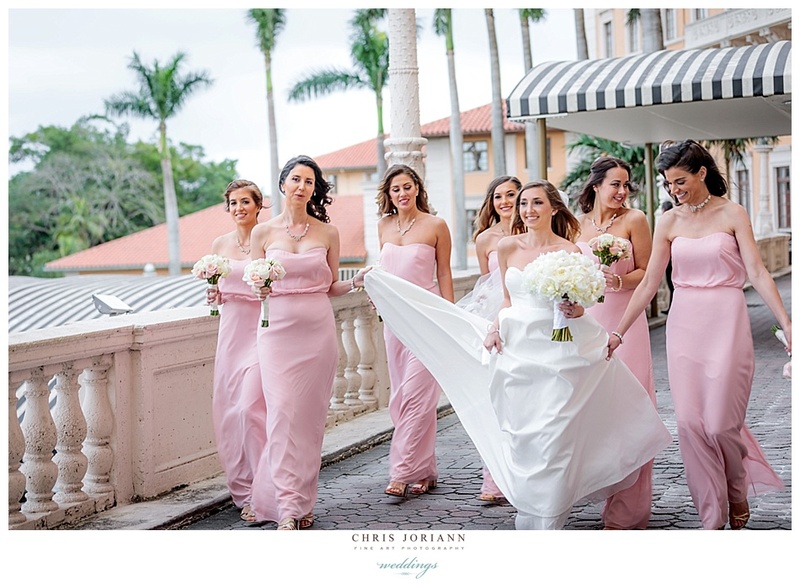 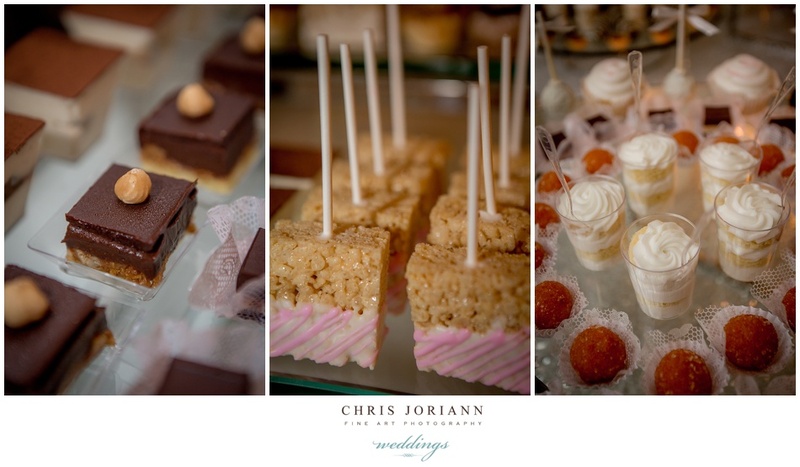 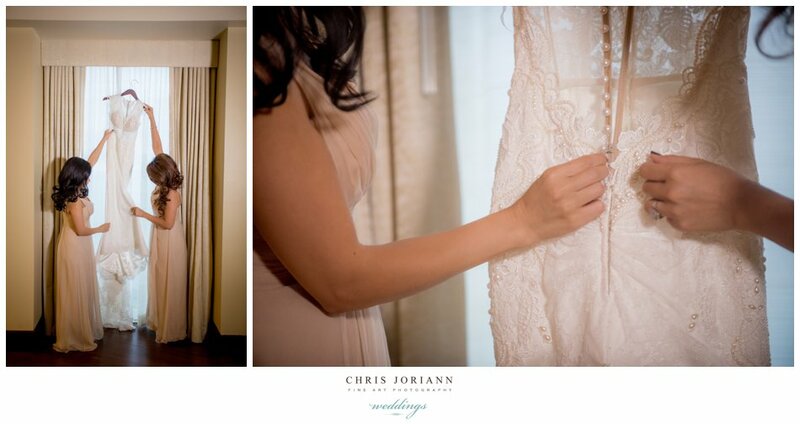 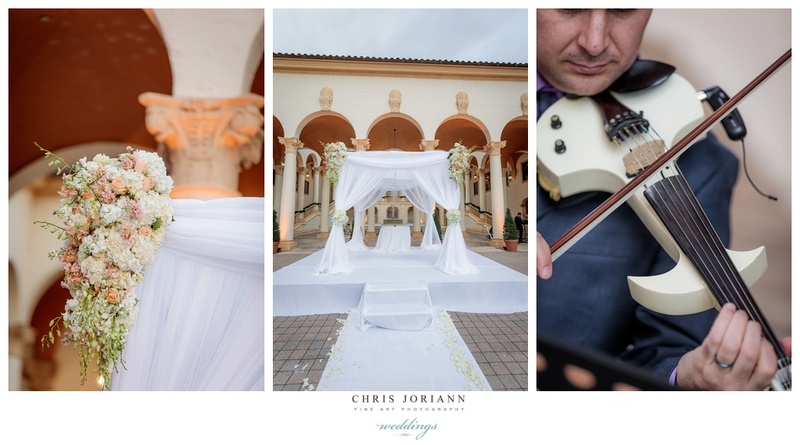 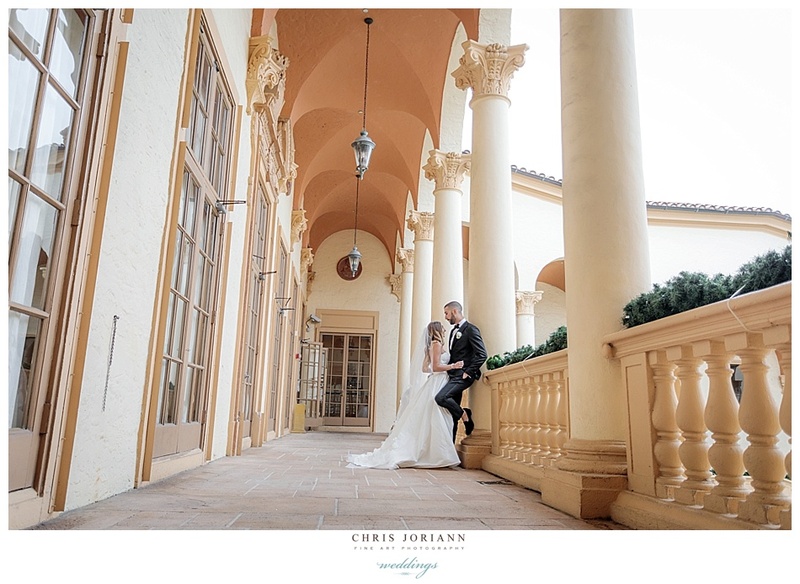 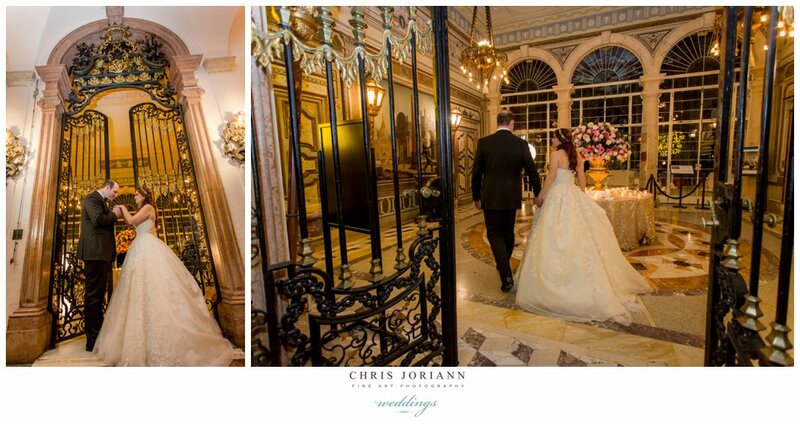 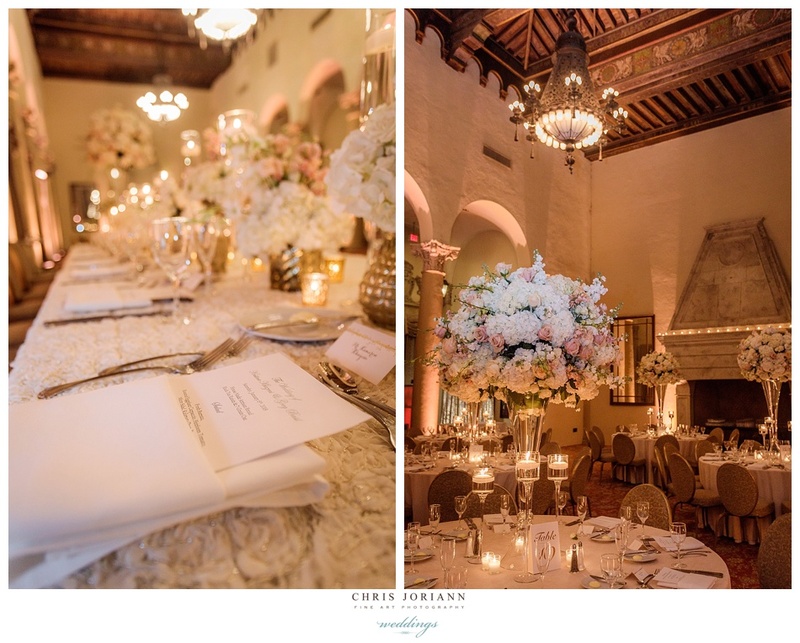 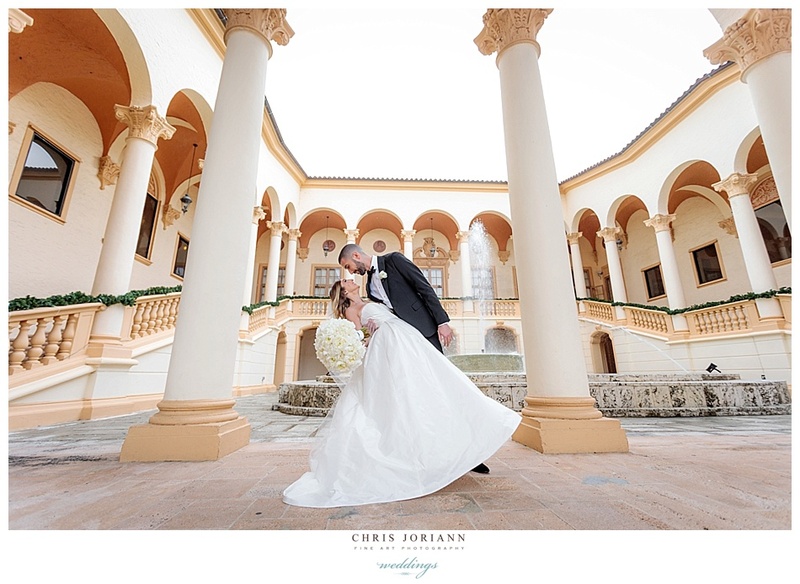 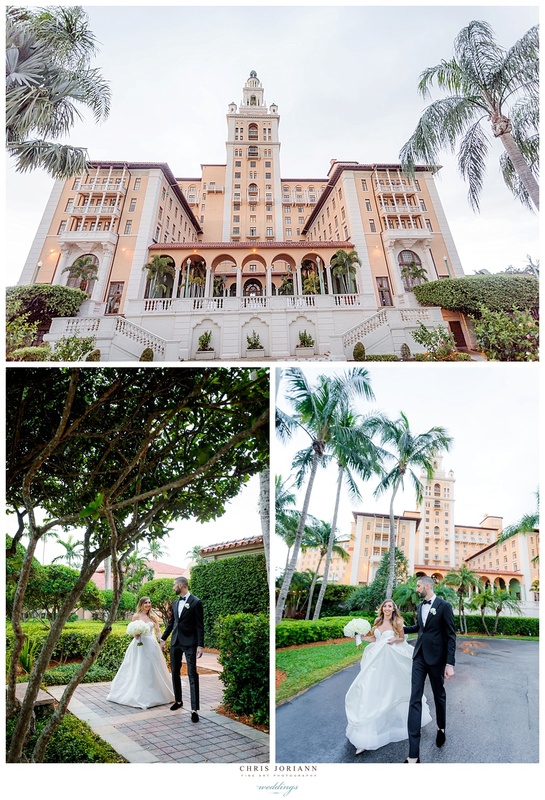 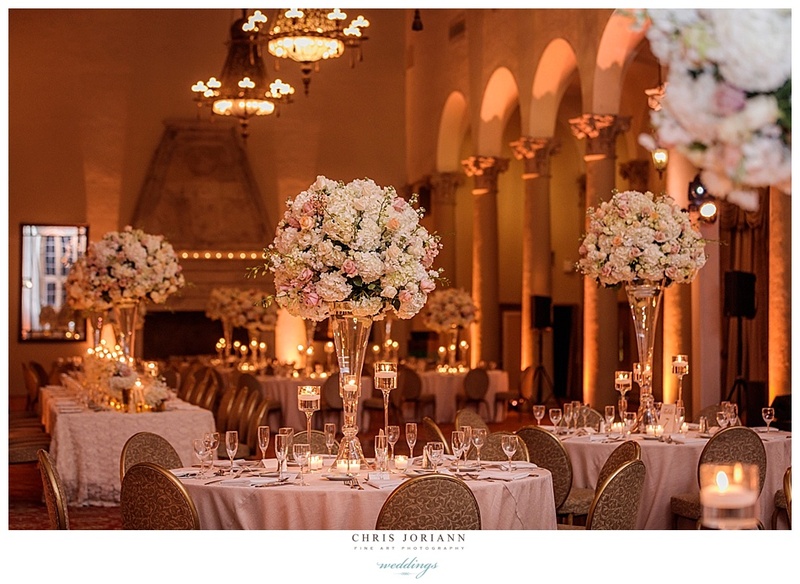 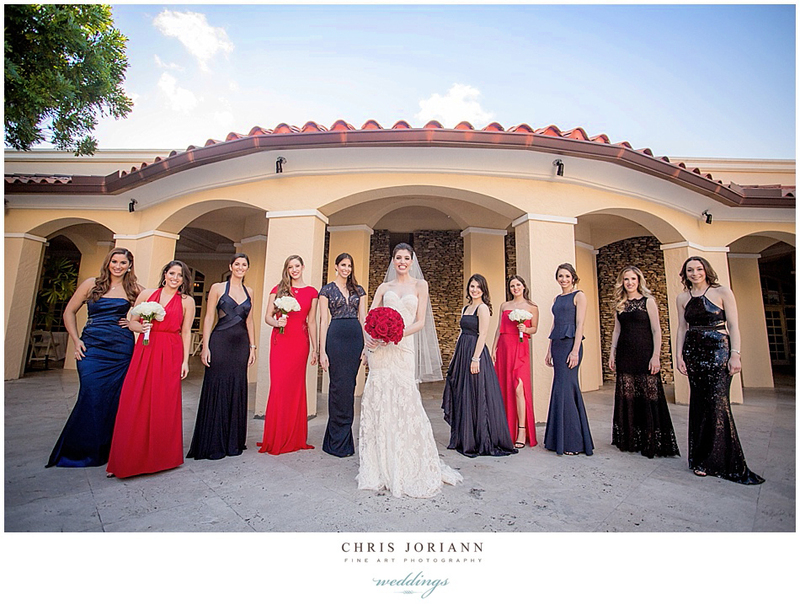 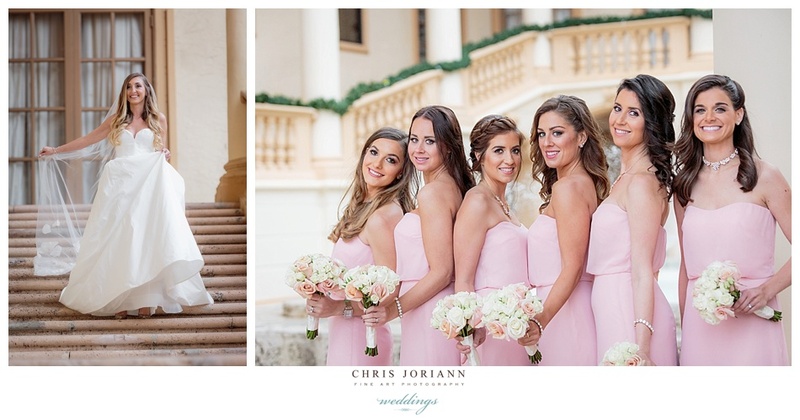 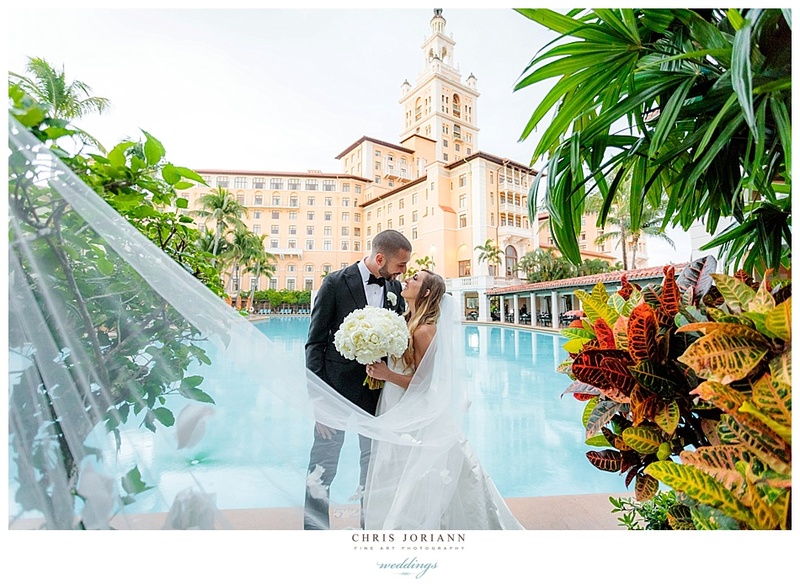 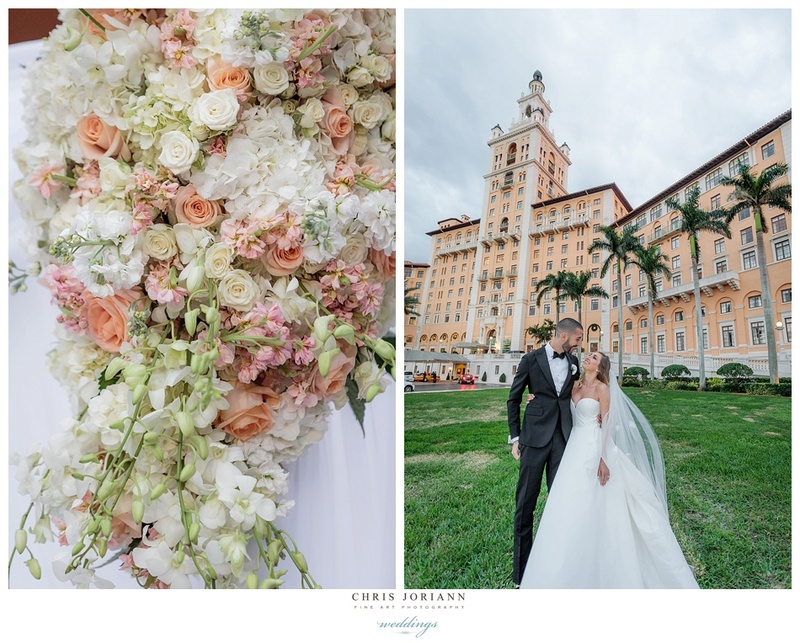 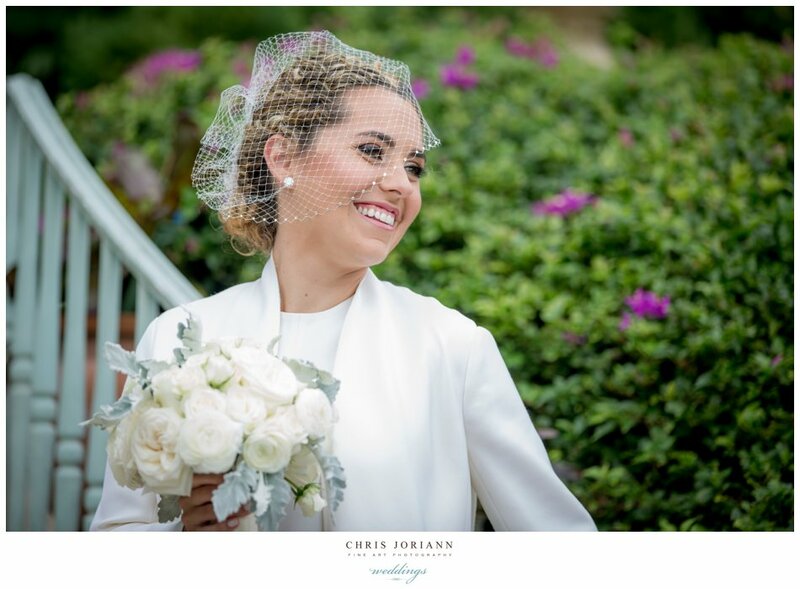 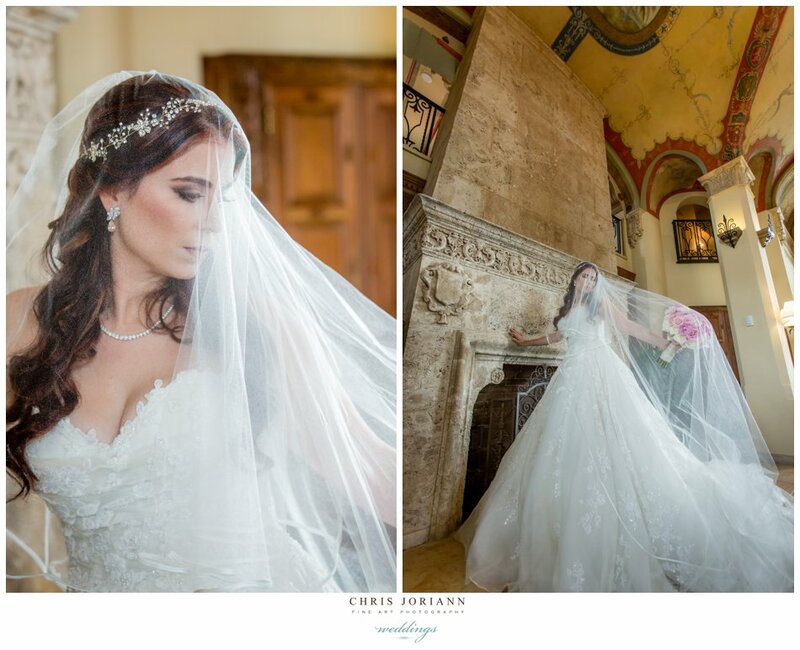 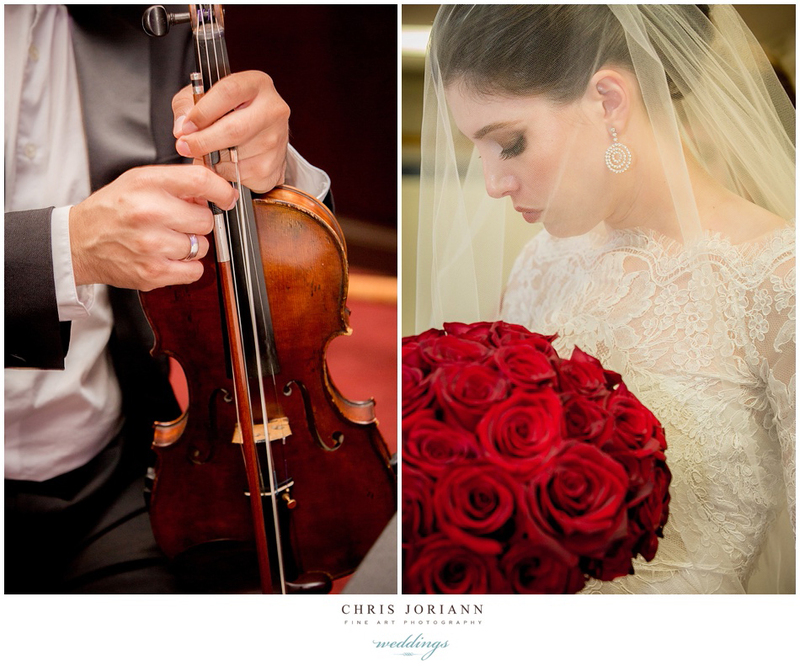 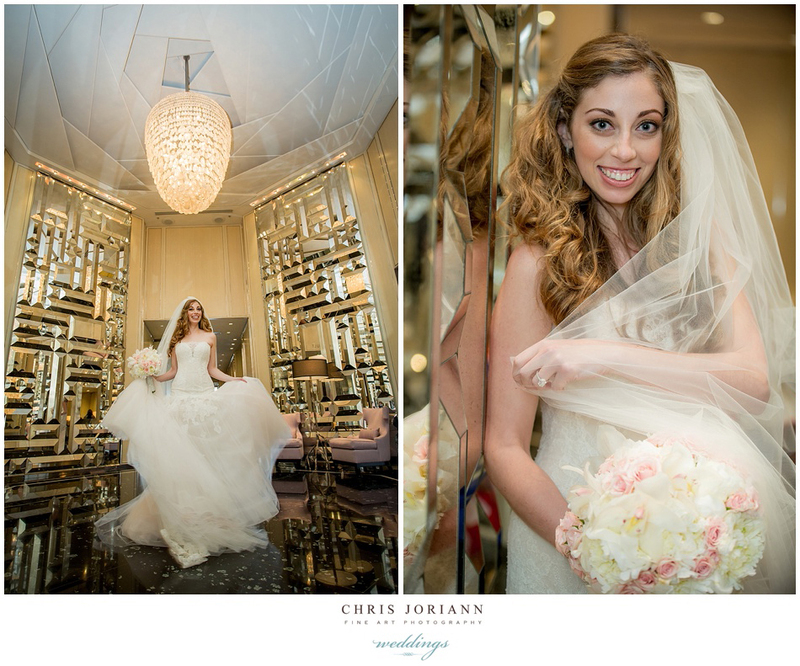 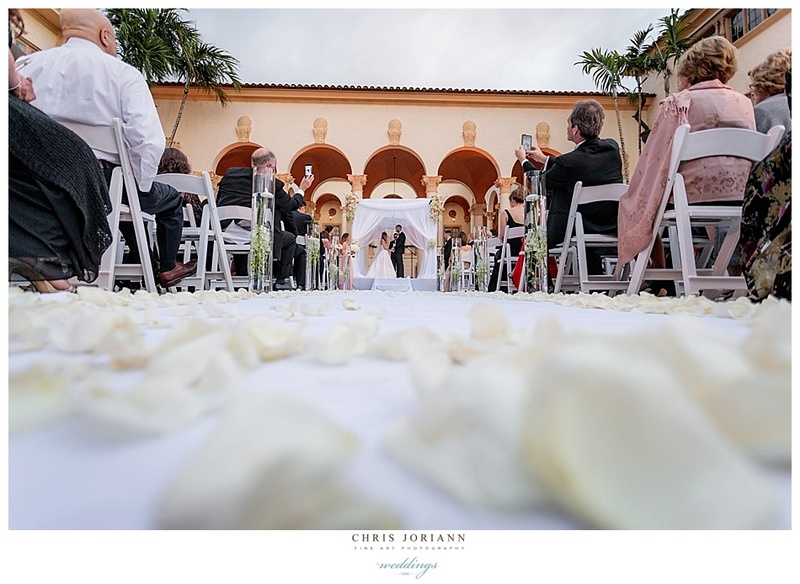 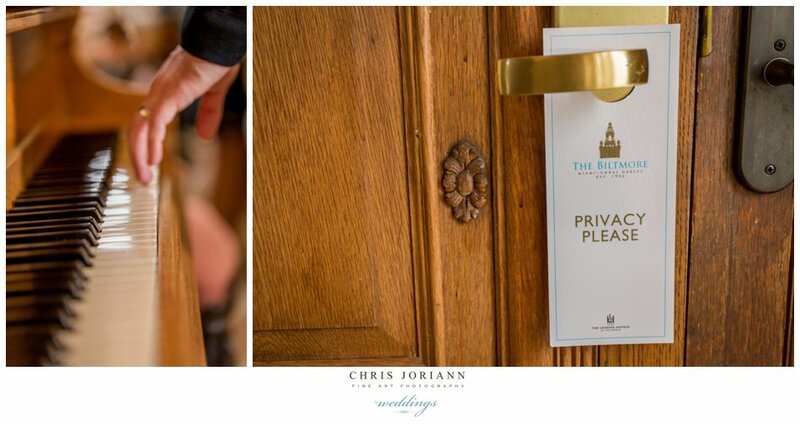 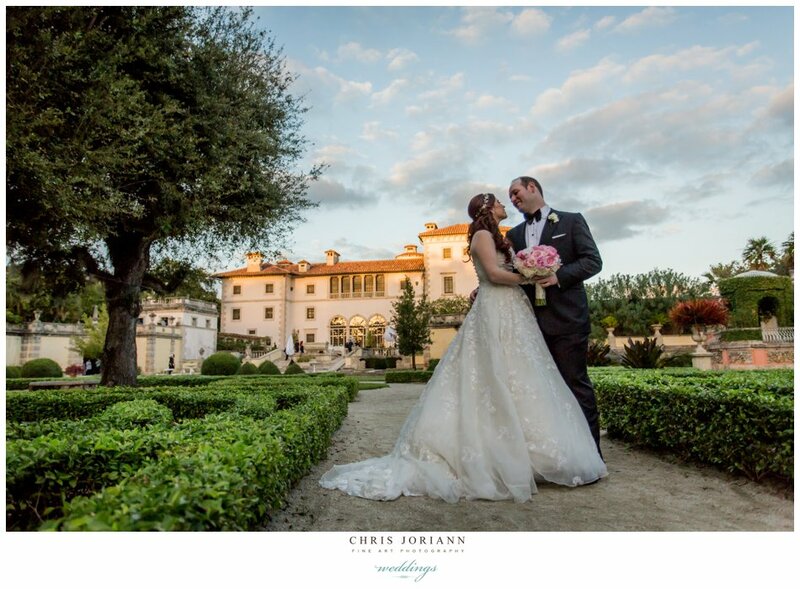 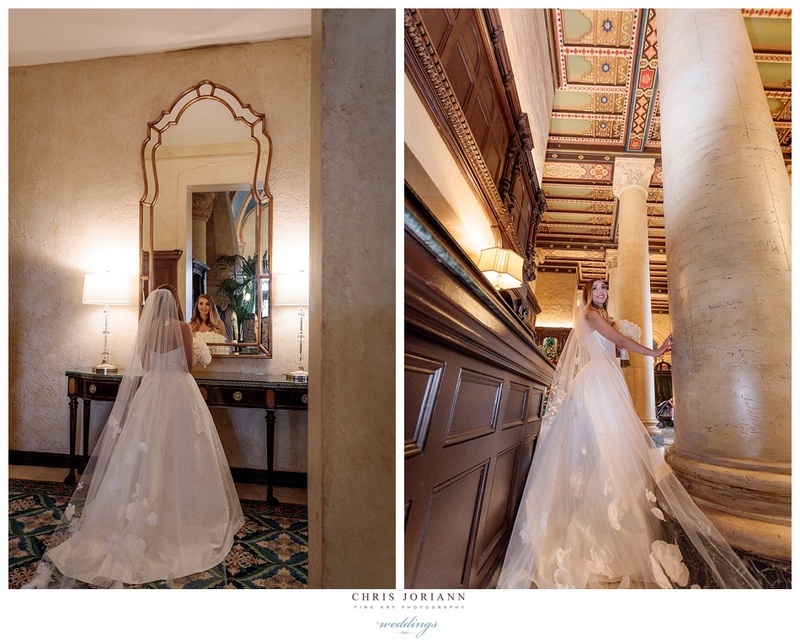 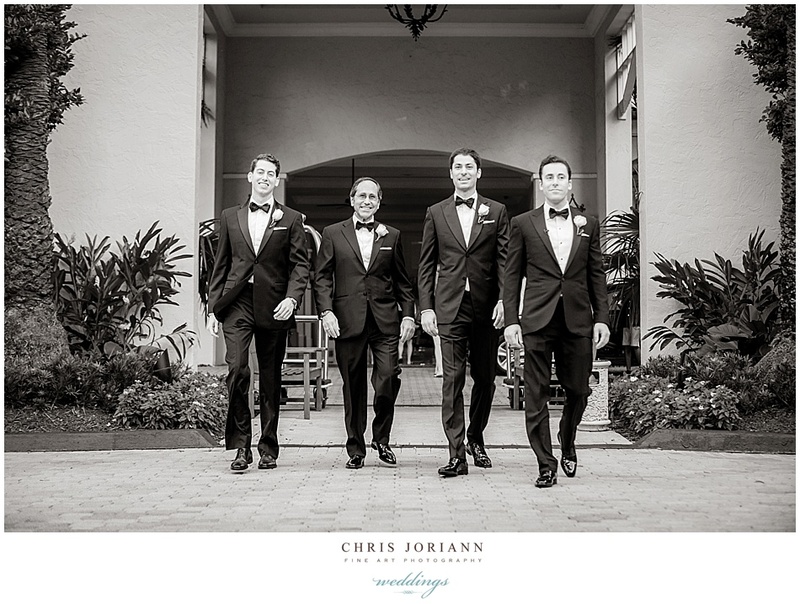 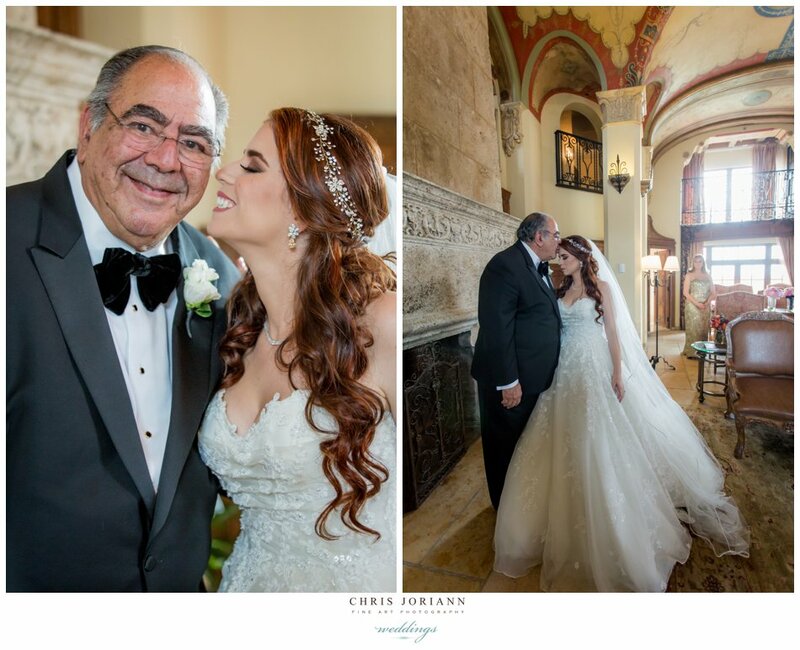 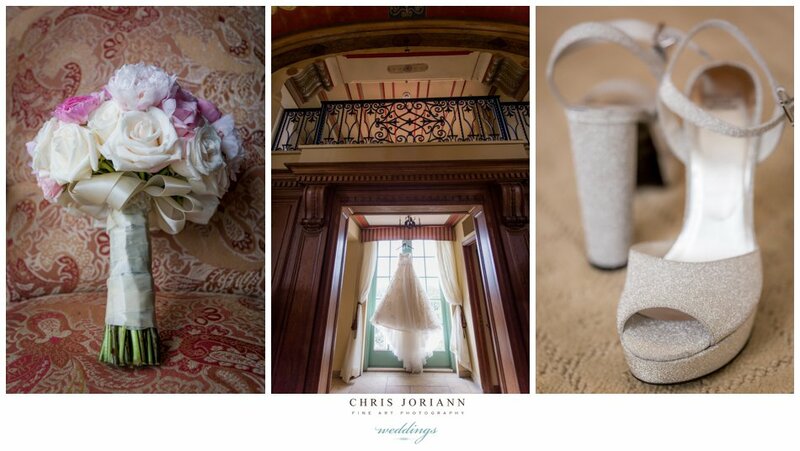 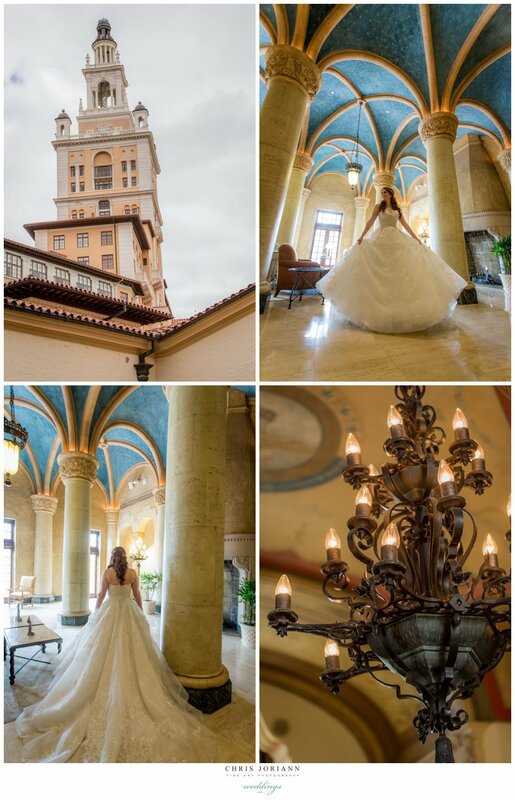 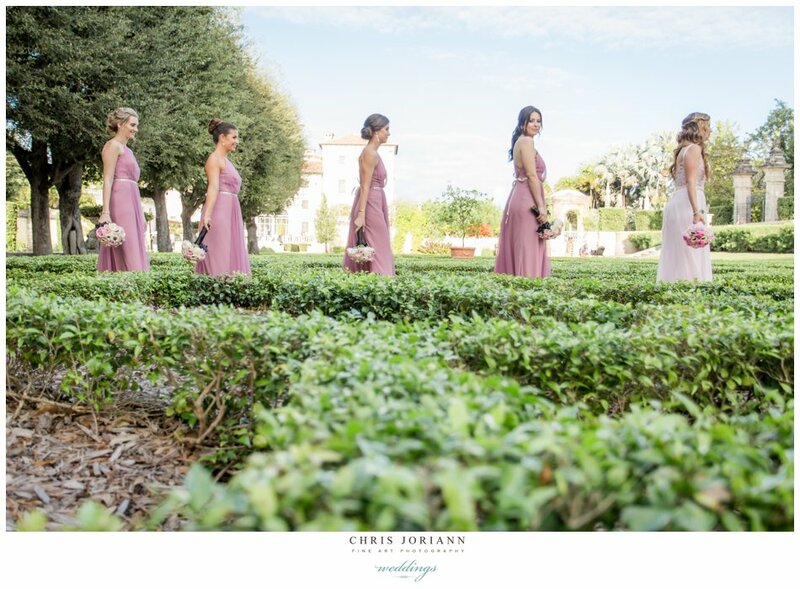 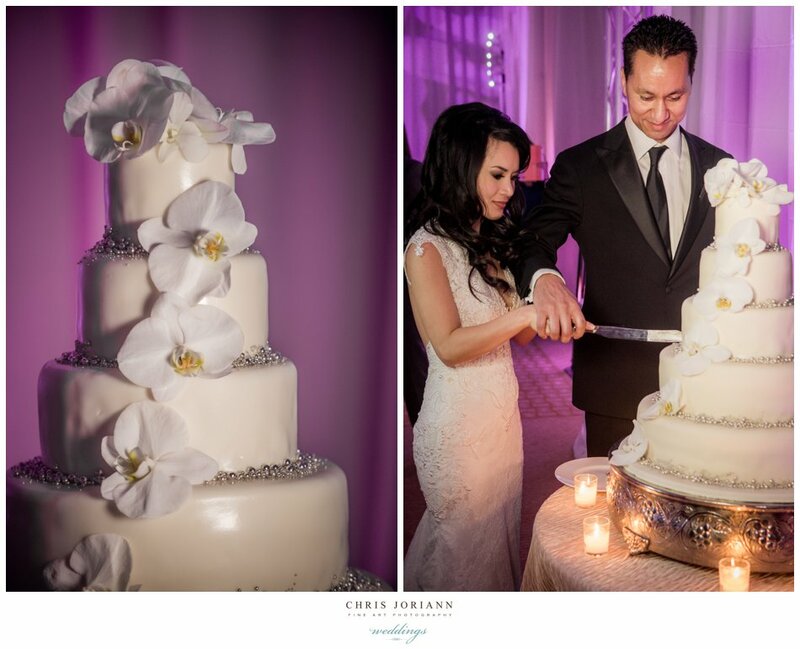 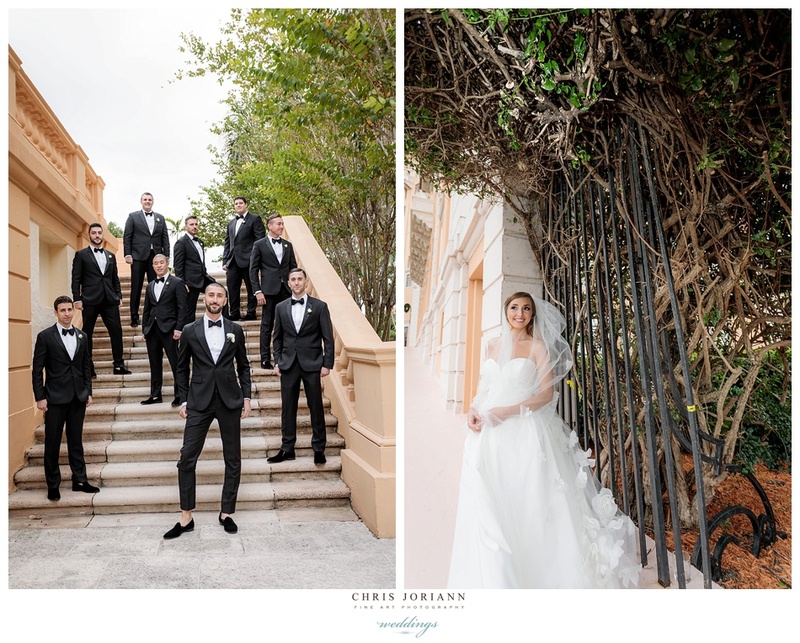 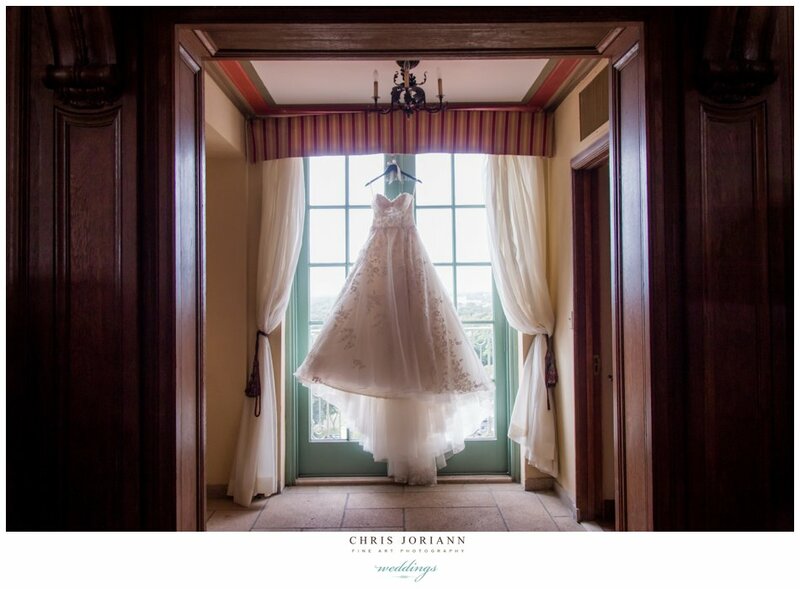 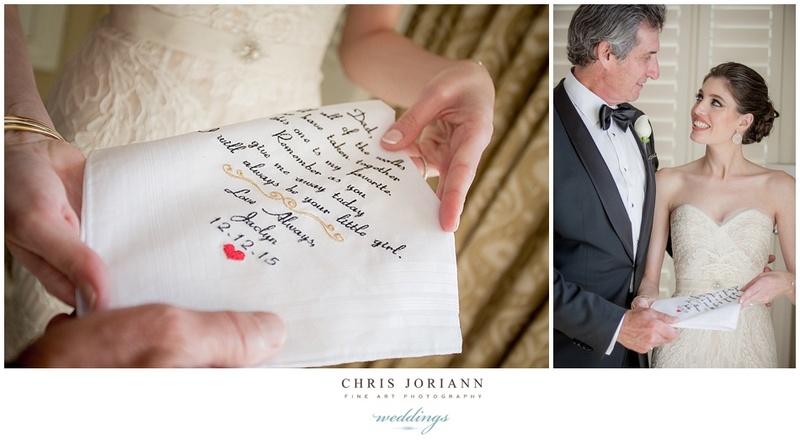 The historic Biltmore Hotel in Coral Gables was host to Kristina + Gregory’s stunning destination wedding. 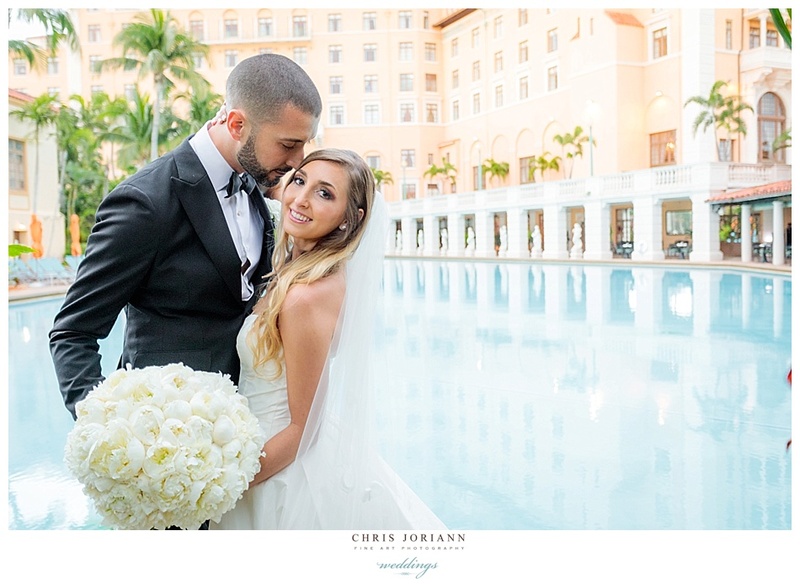 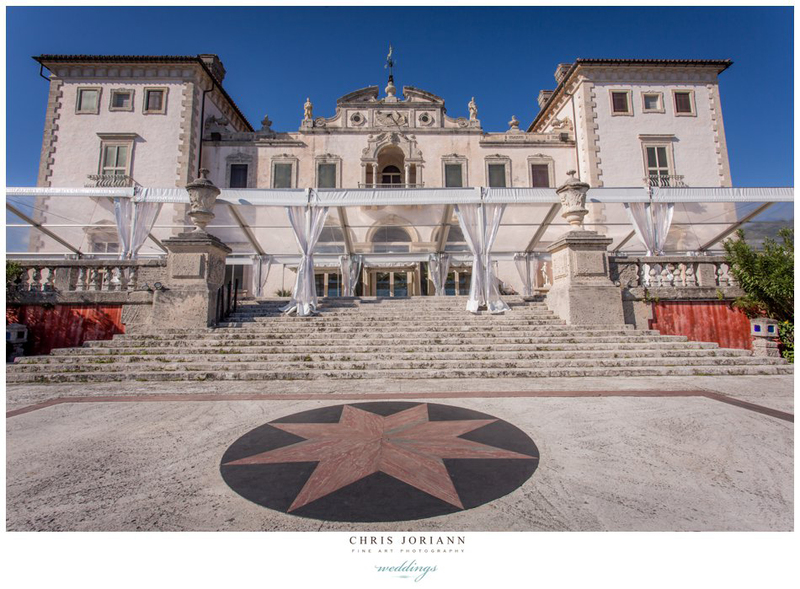 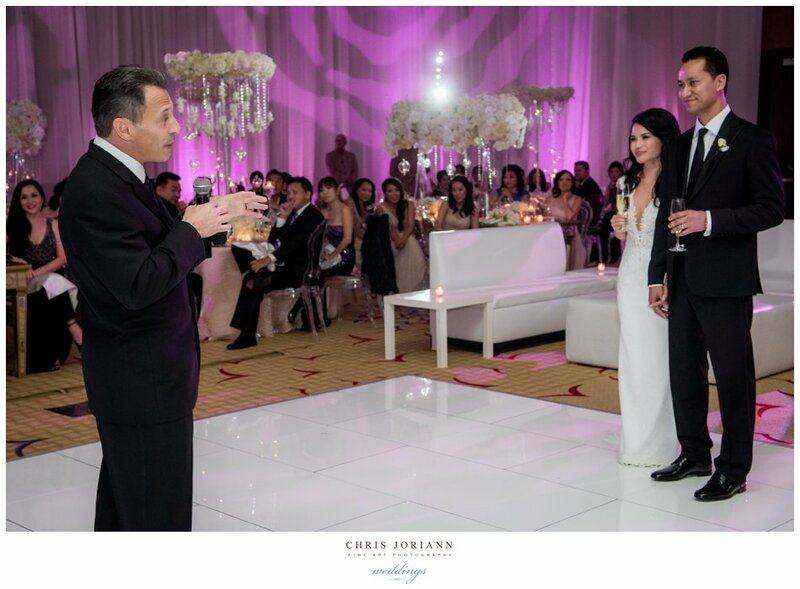 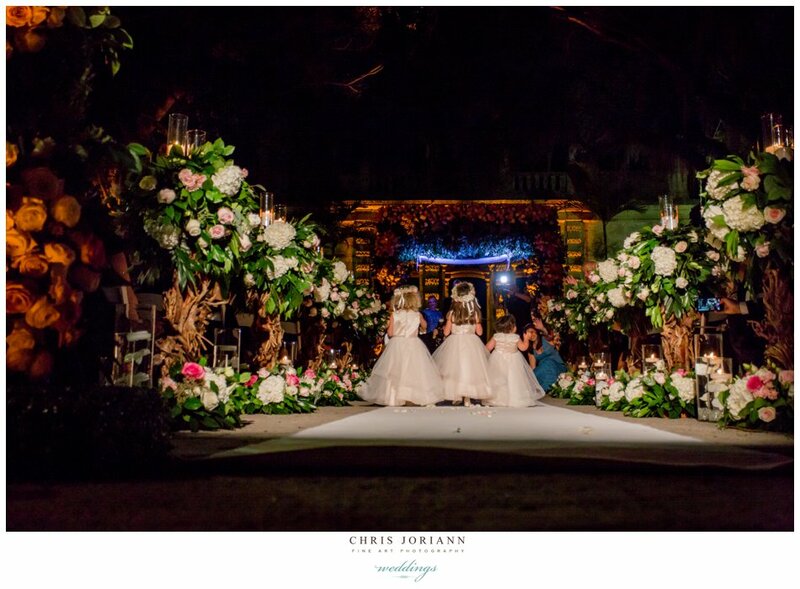 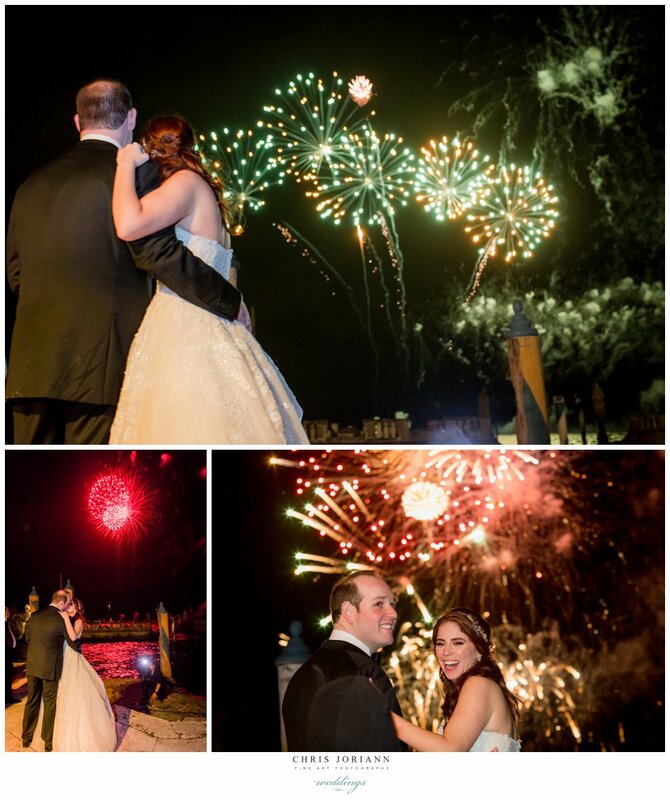 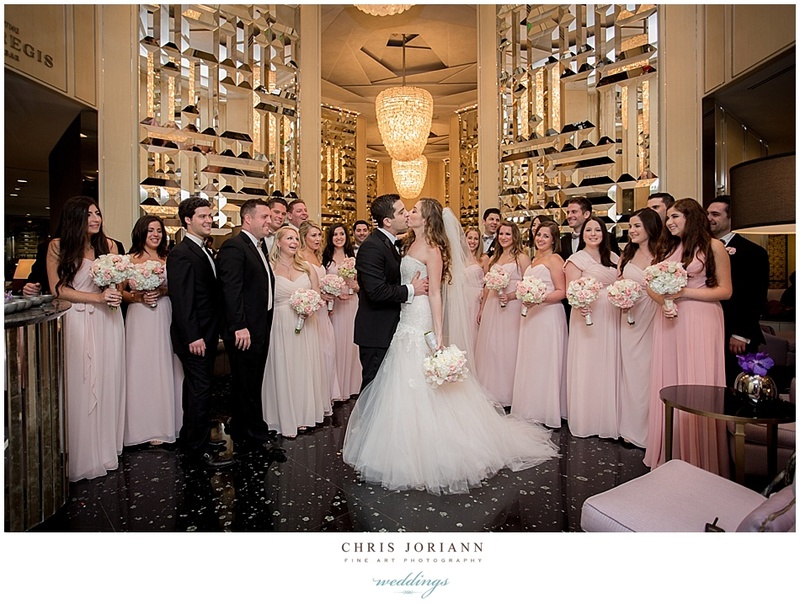 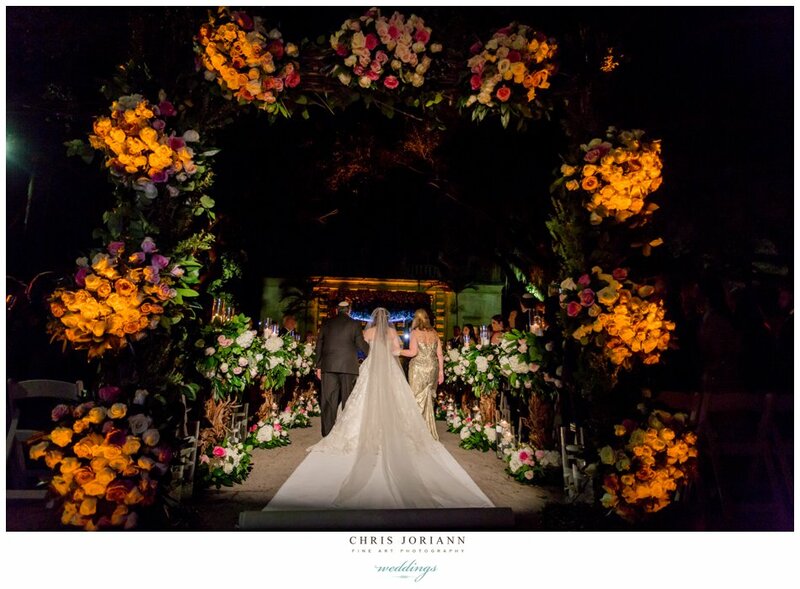 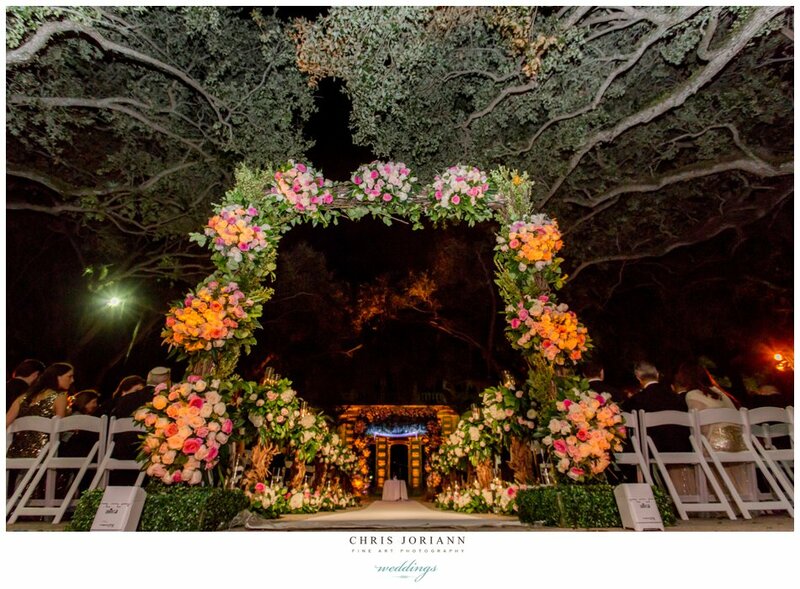 The stylish couple exchanged vows in a ceremony overlooking the palatial fountains. 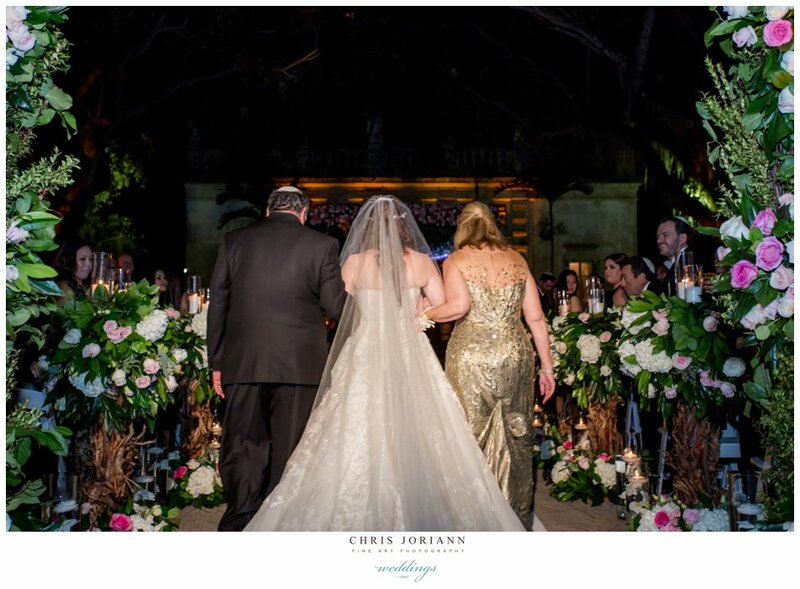 The bride wore a strapless lace couture gown by Amsale, paired with a fabulous petal covered cathedral veil and gold glitter Jimmy Choos. 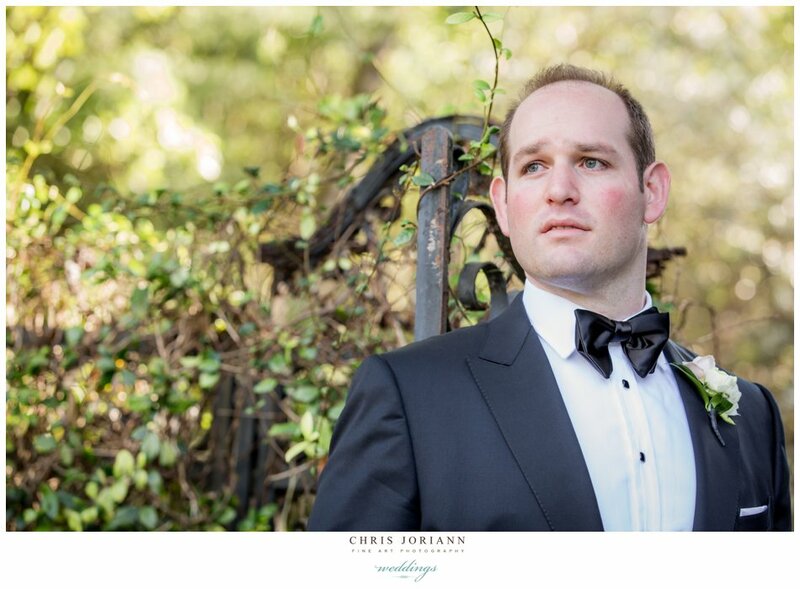 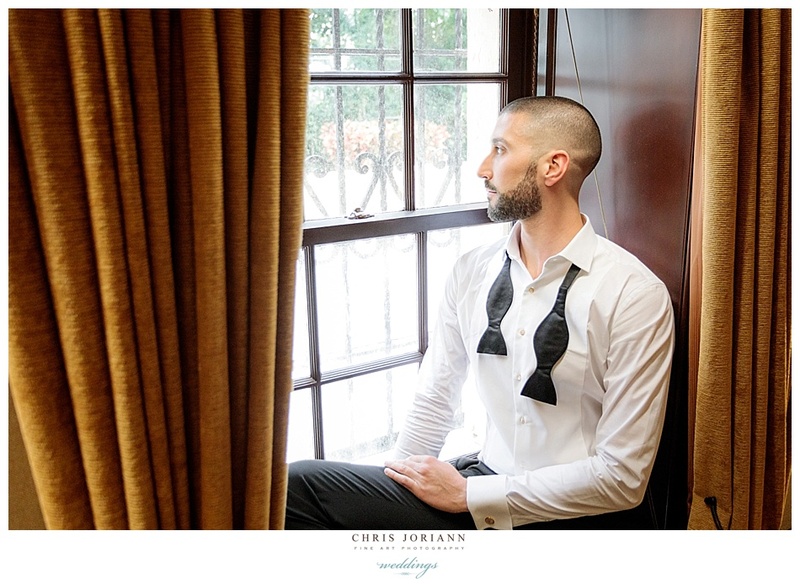 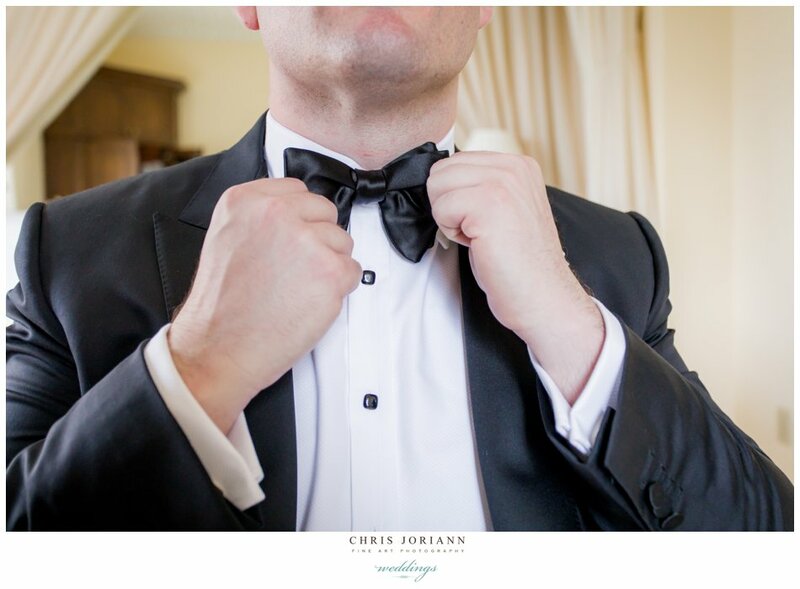 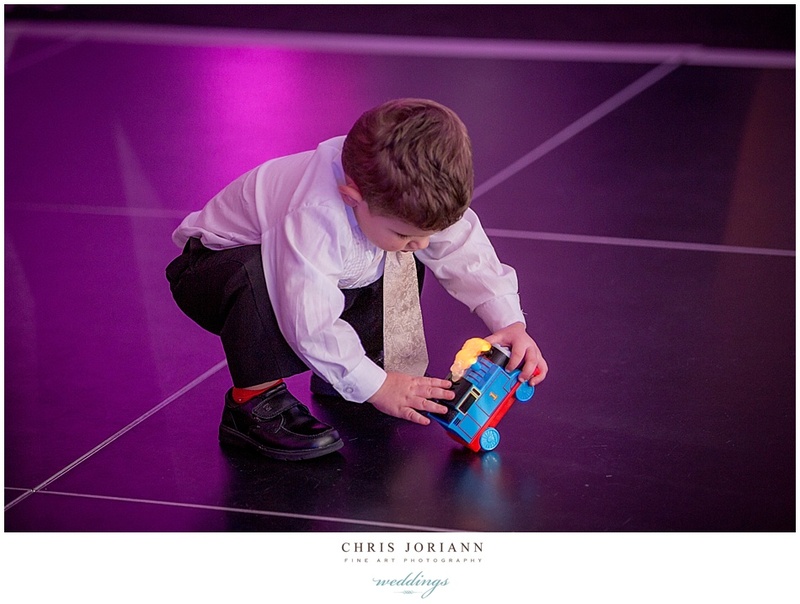 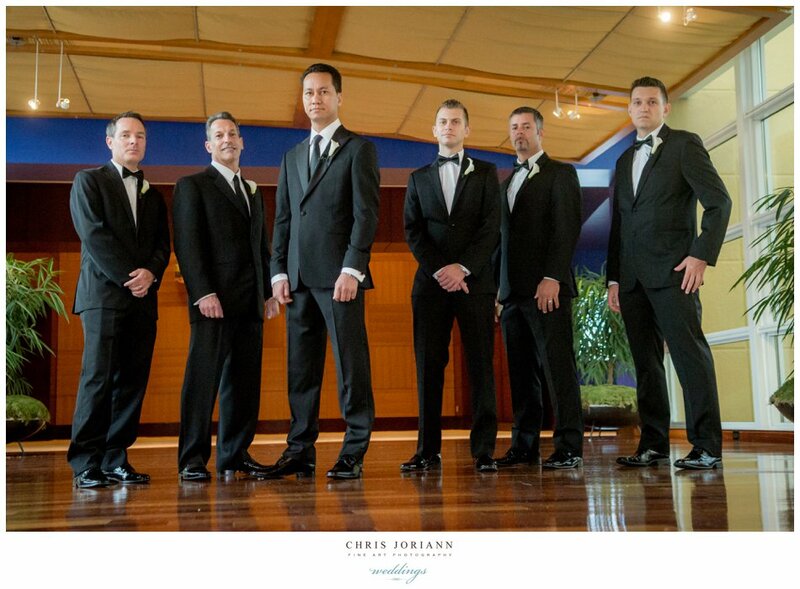 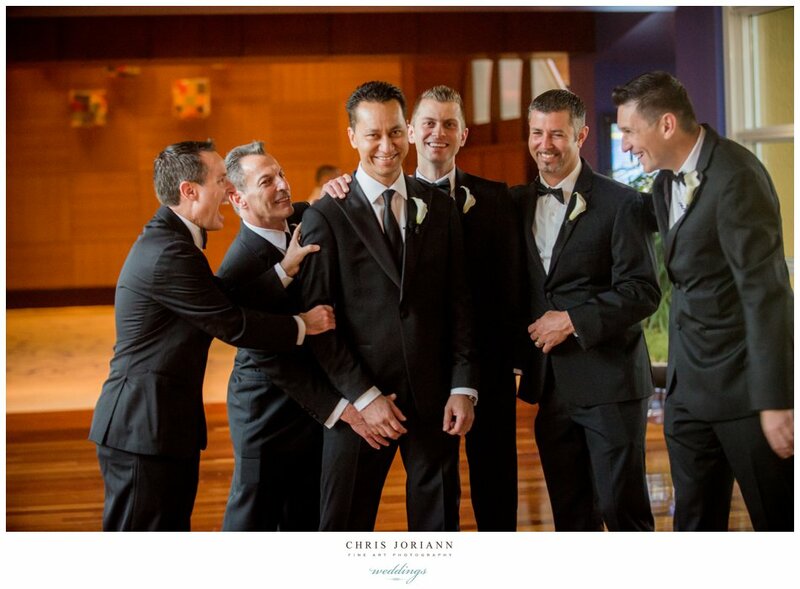 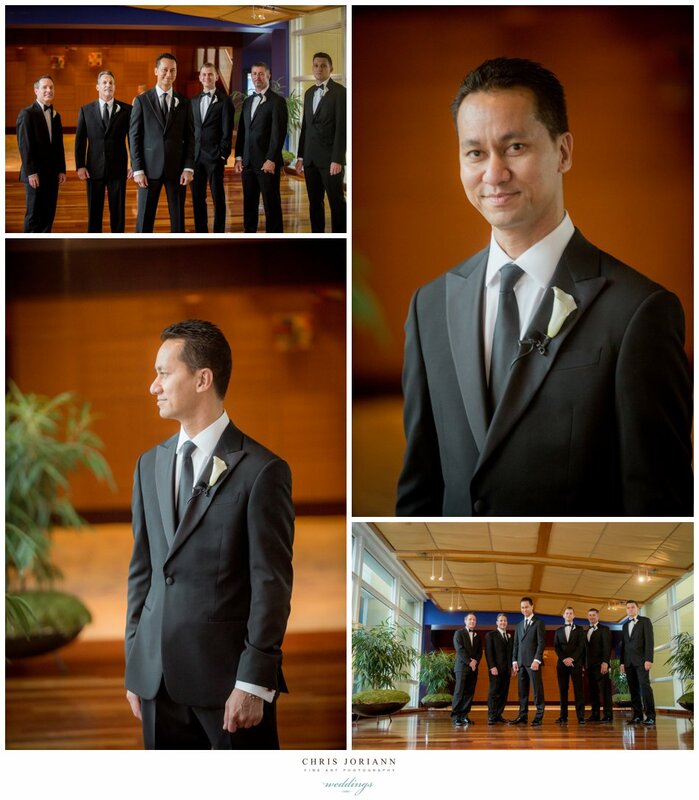 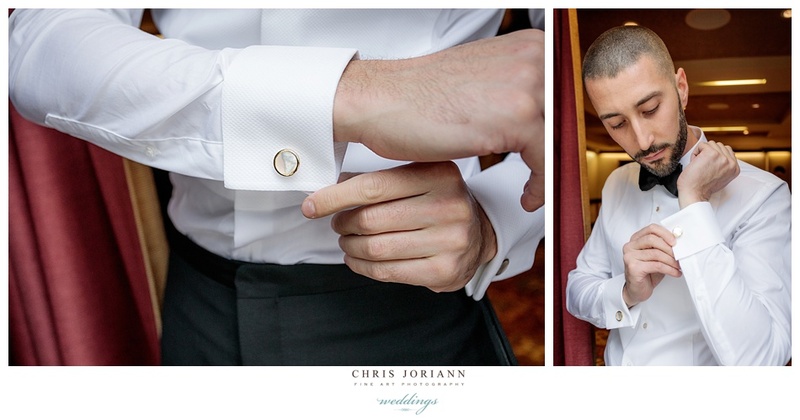 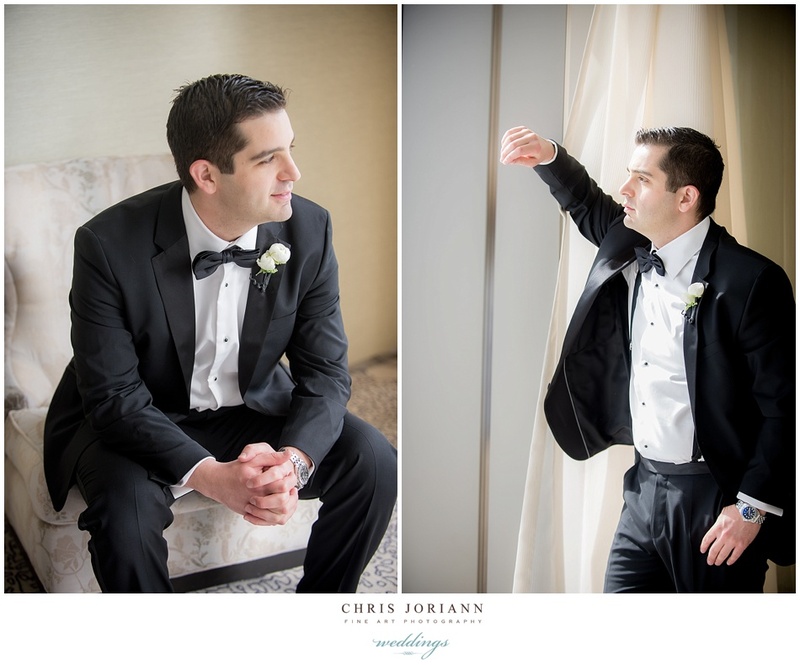 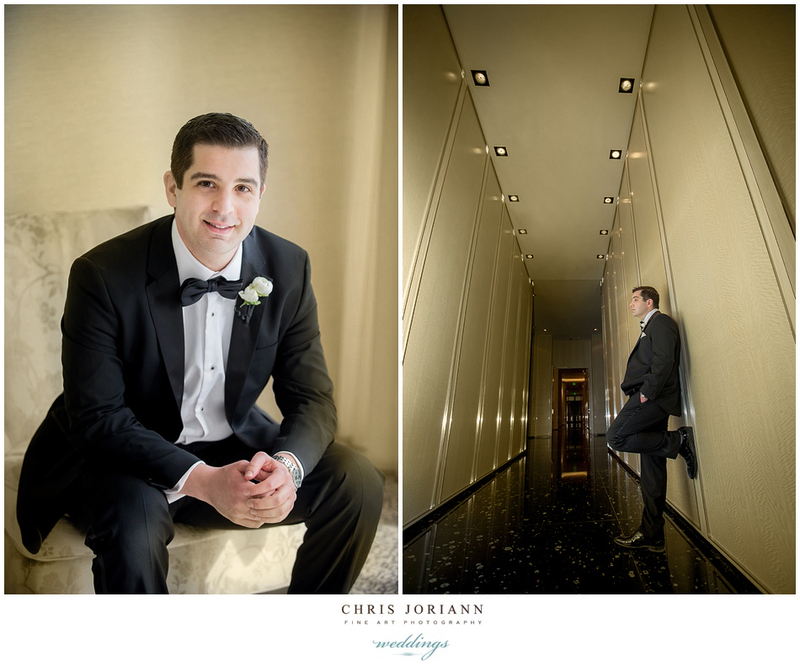 The groom, was just as fashionable, as he rocked his designer tux by Boglio, and velvet loafers by Hugo Boss. 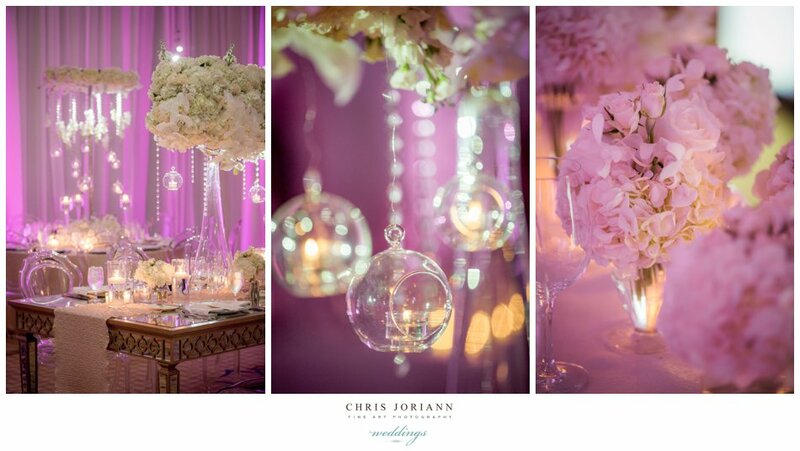 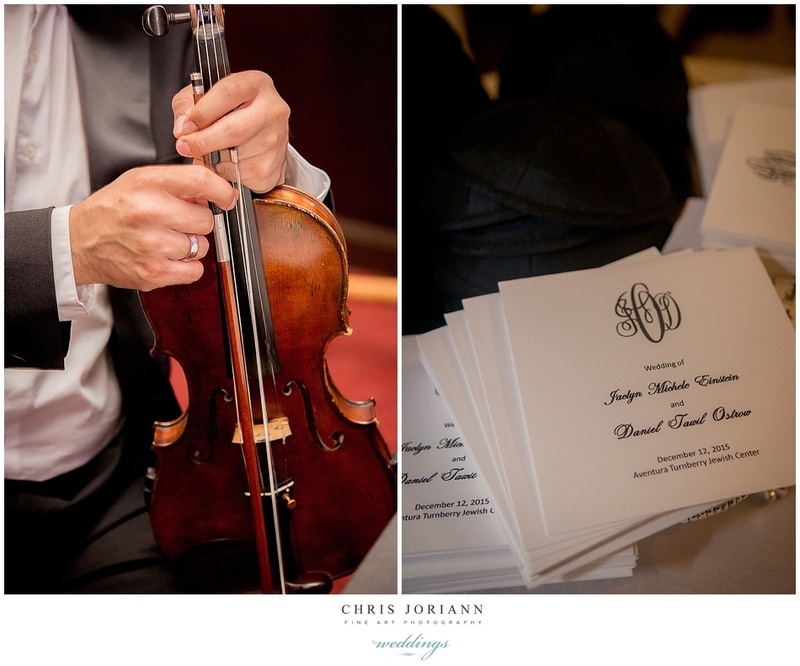 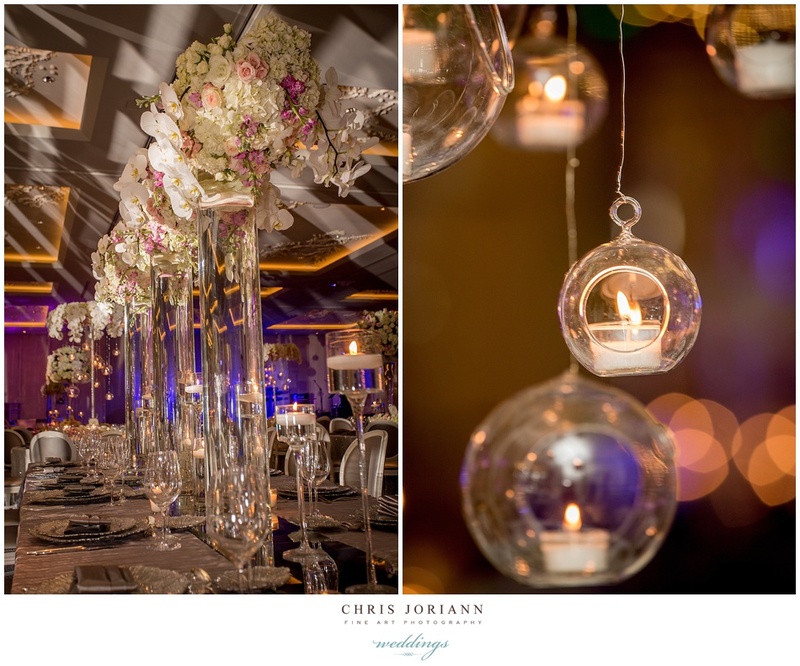 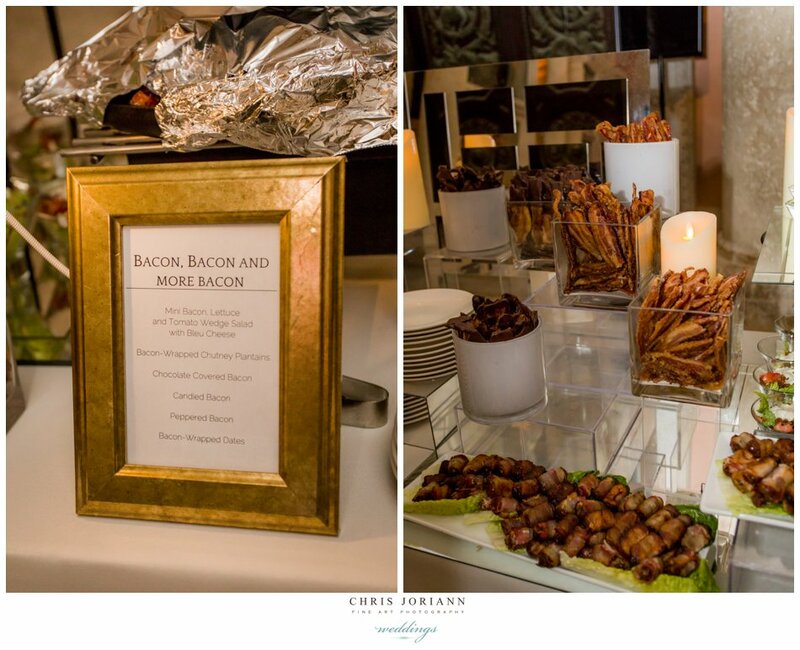 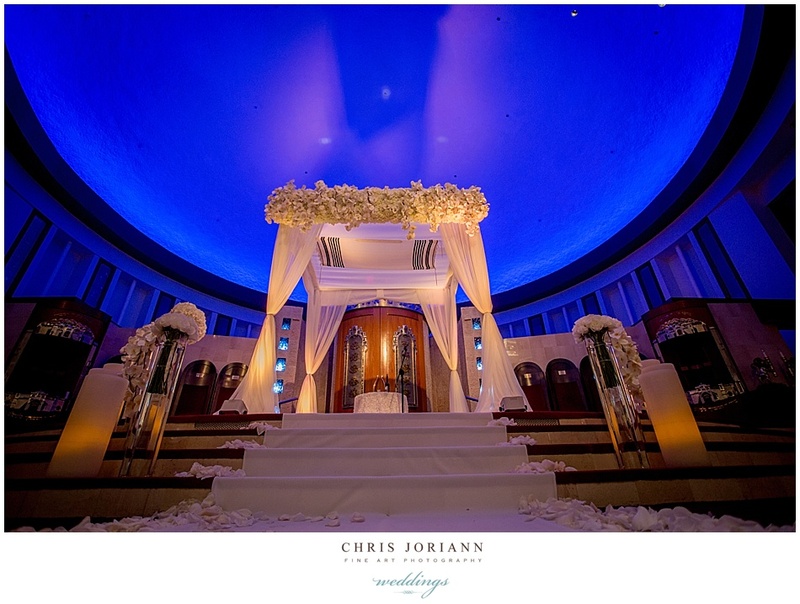 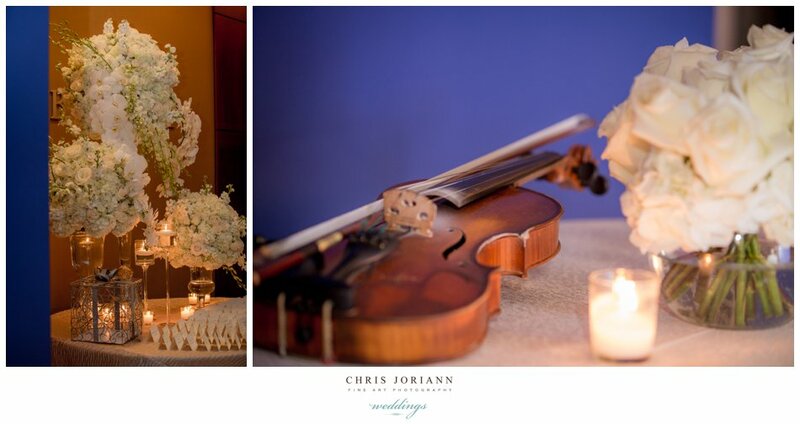 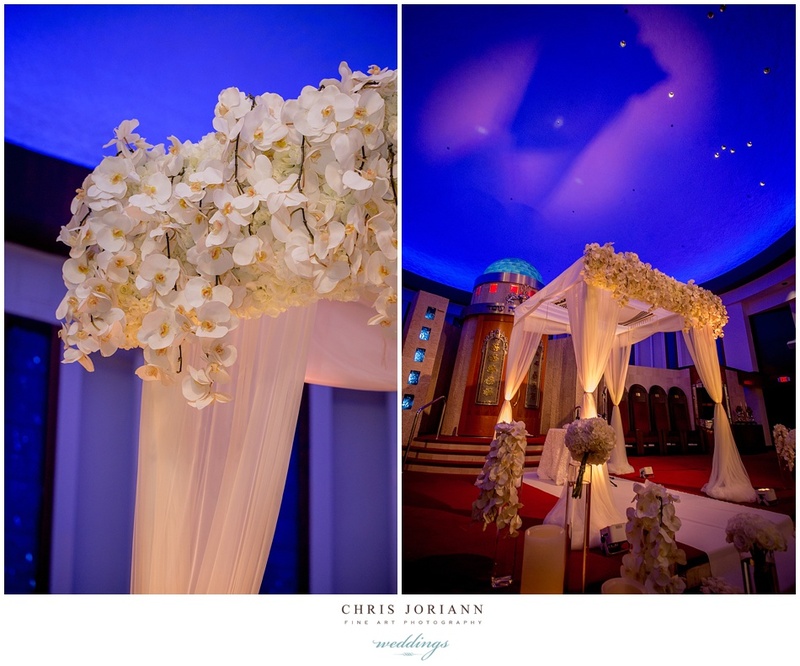 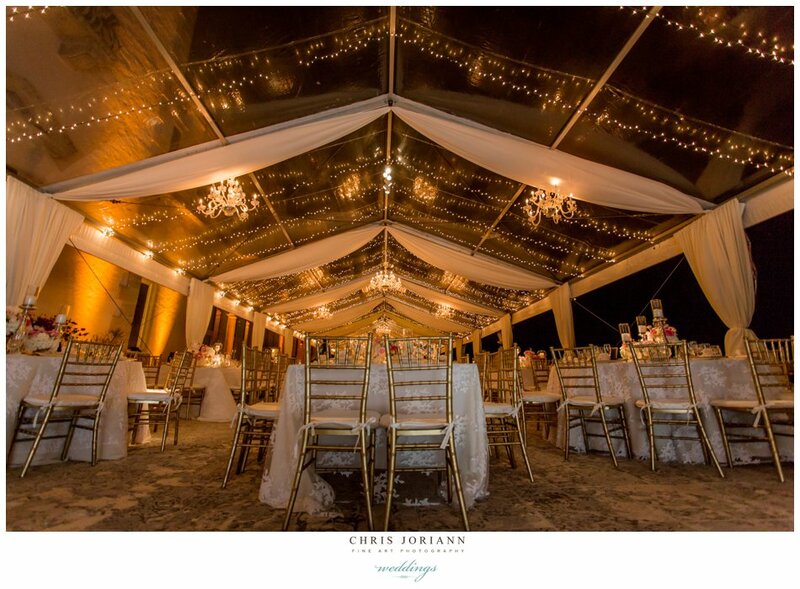 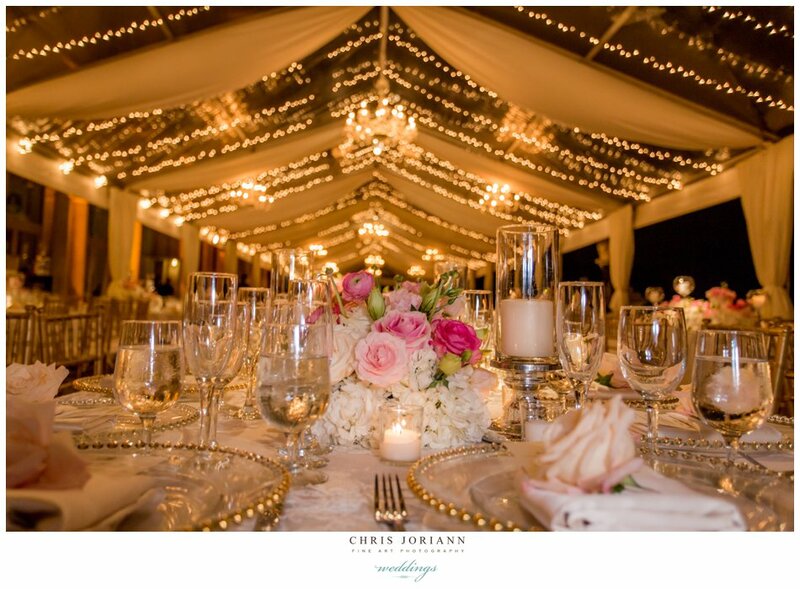 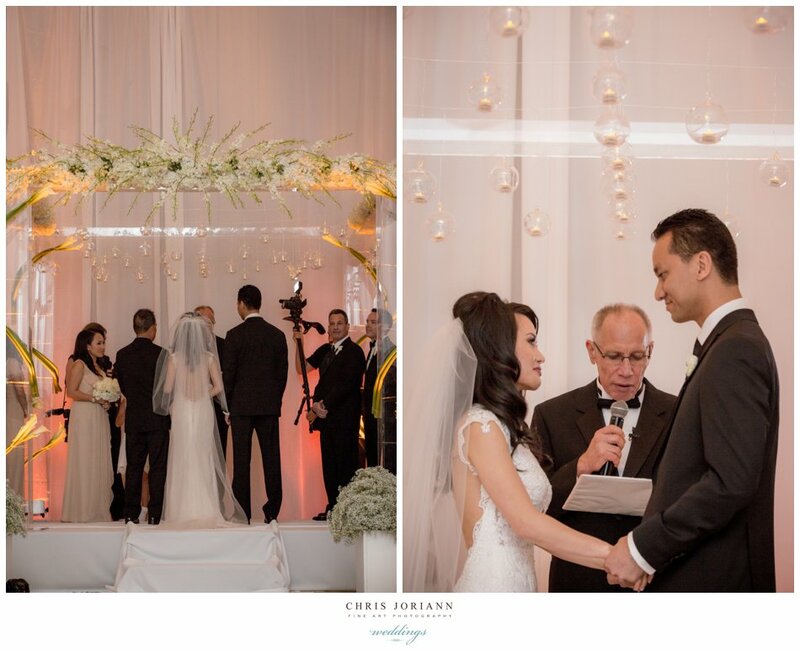 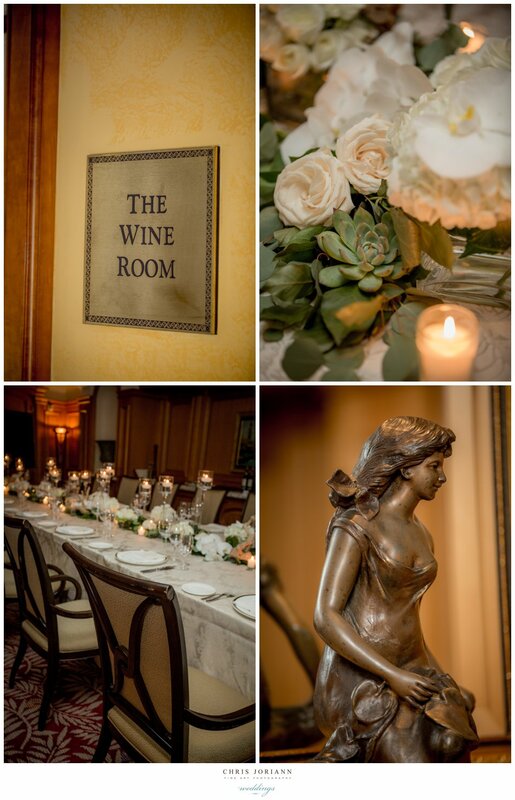 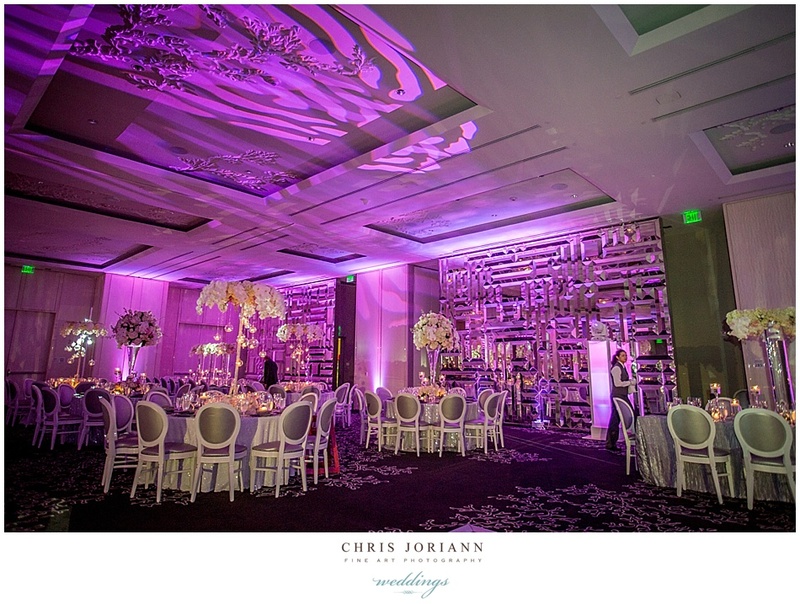 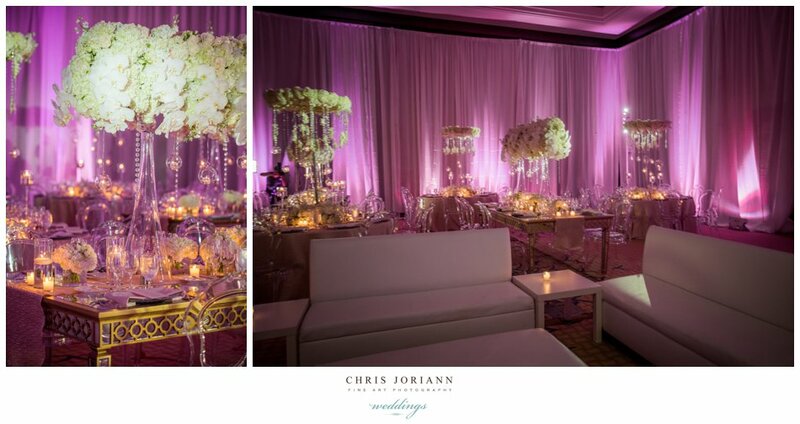 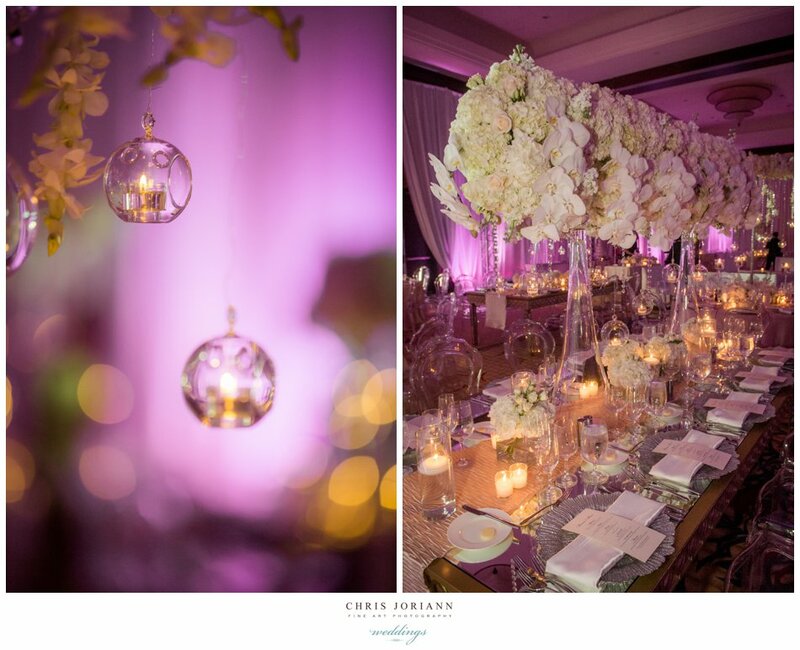 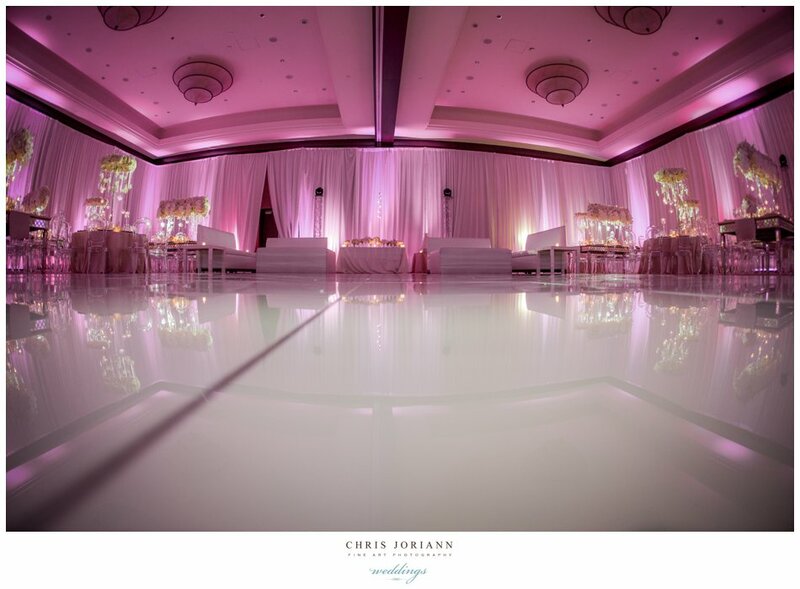 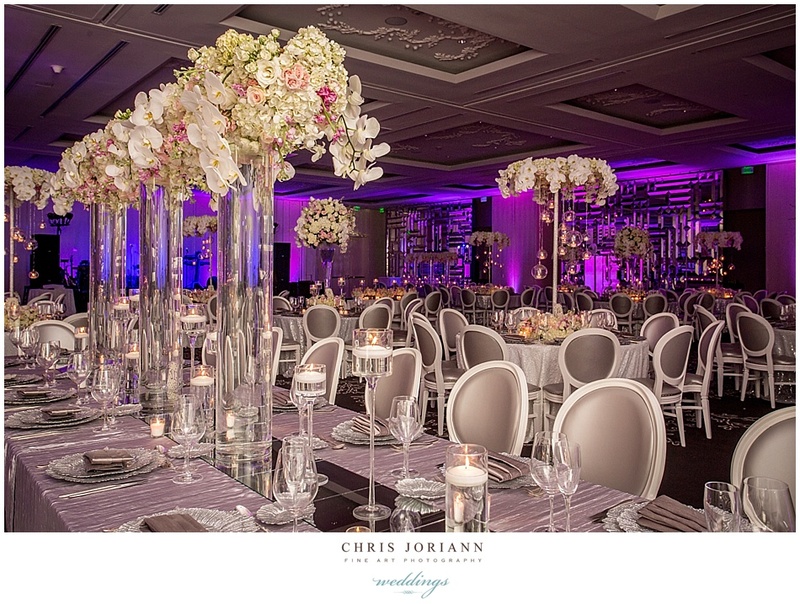 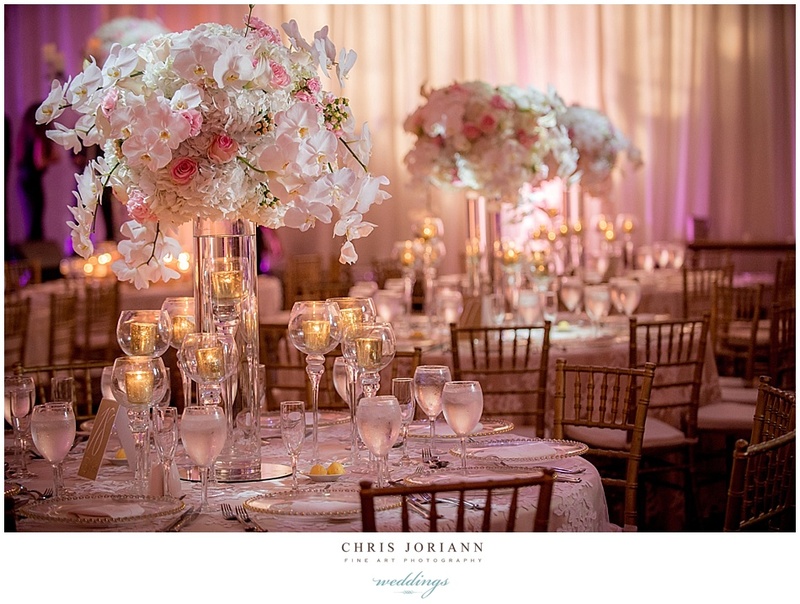 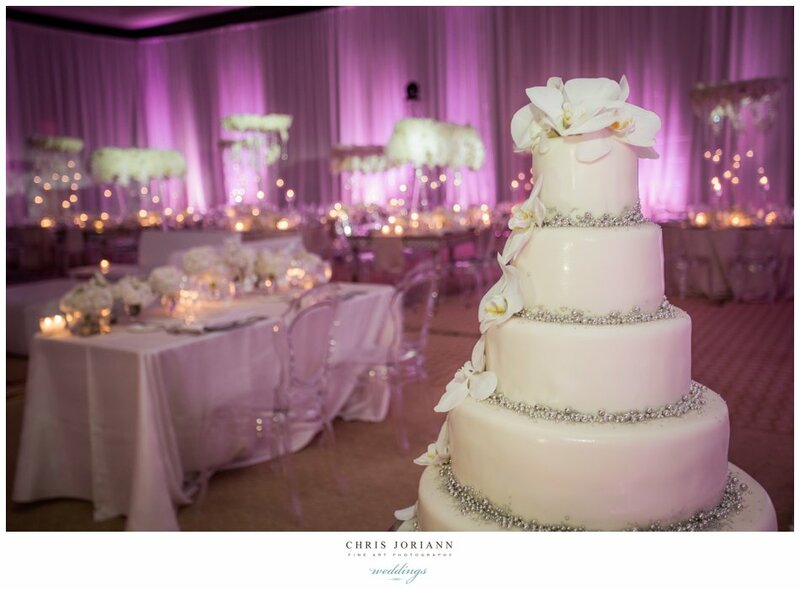 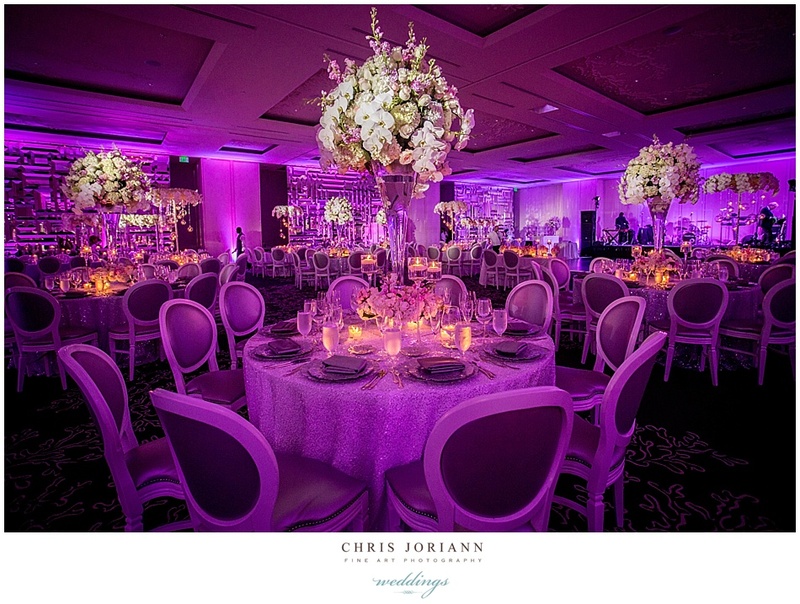 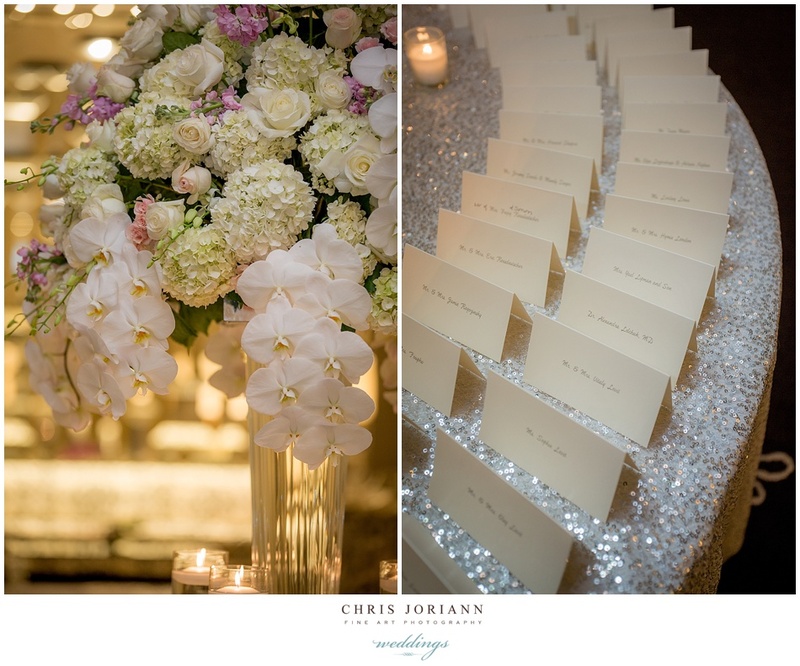 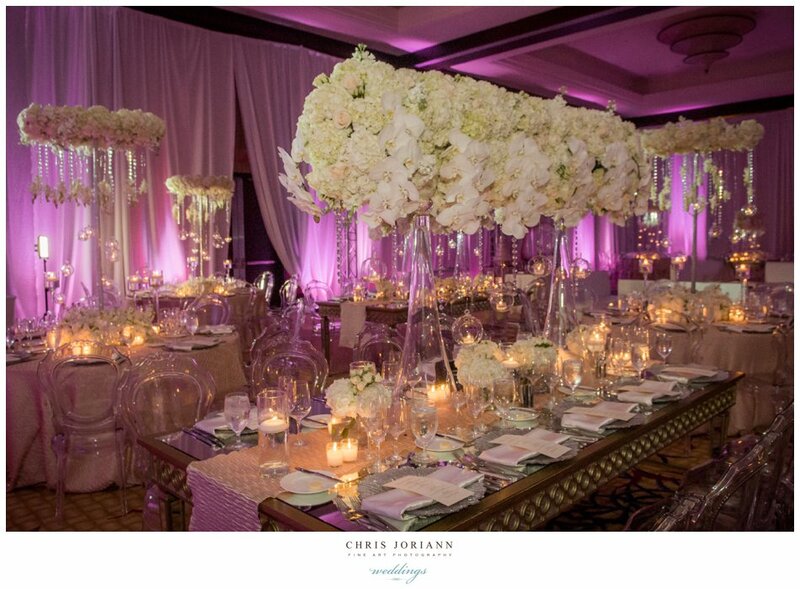 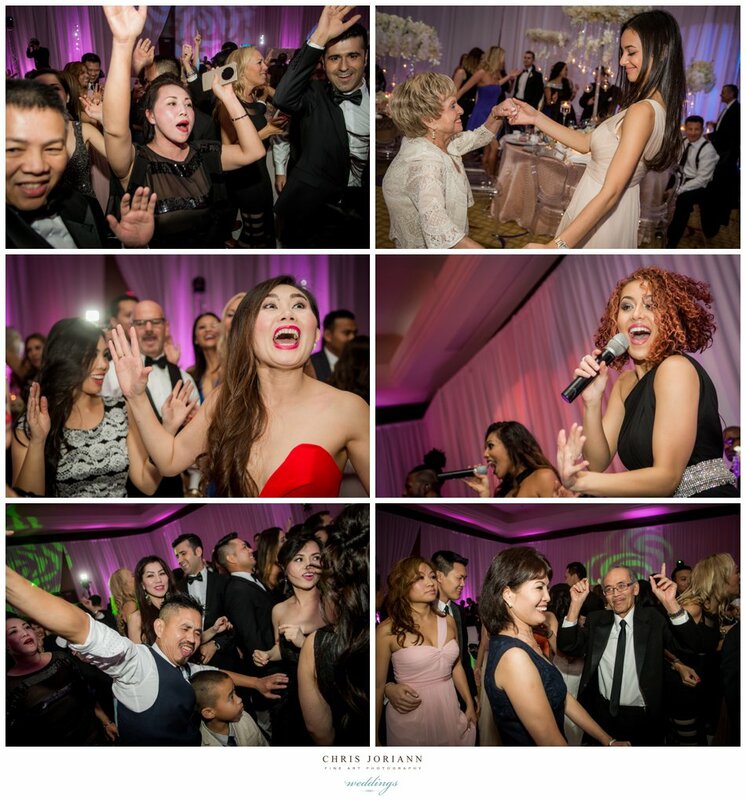 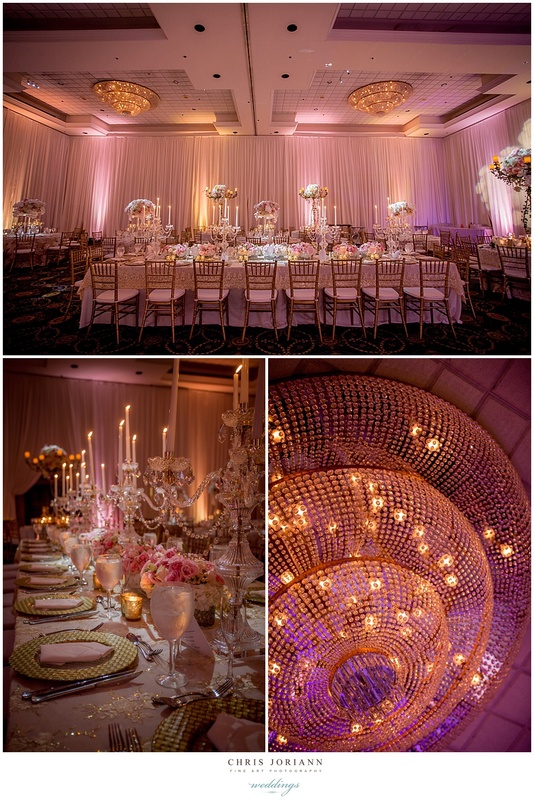 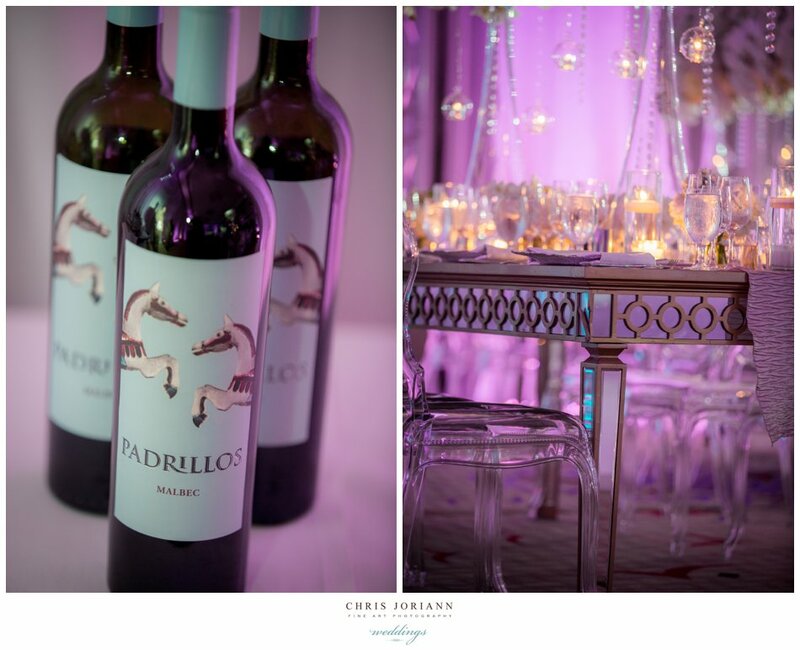 The reception coordinated by Events by Marialea J, featured décor by Petal Productions. 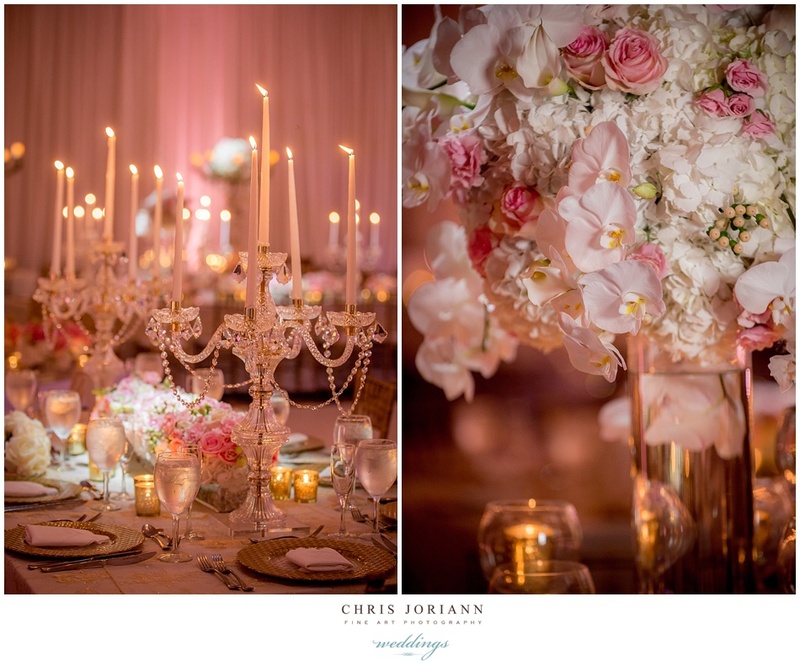 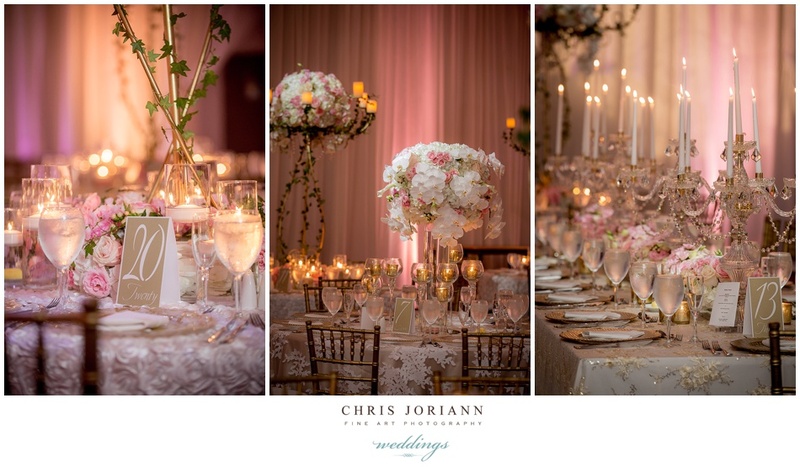 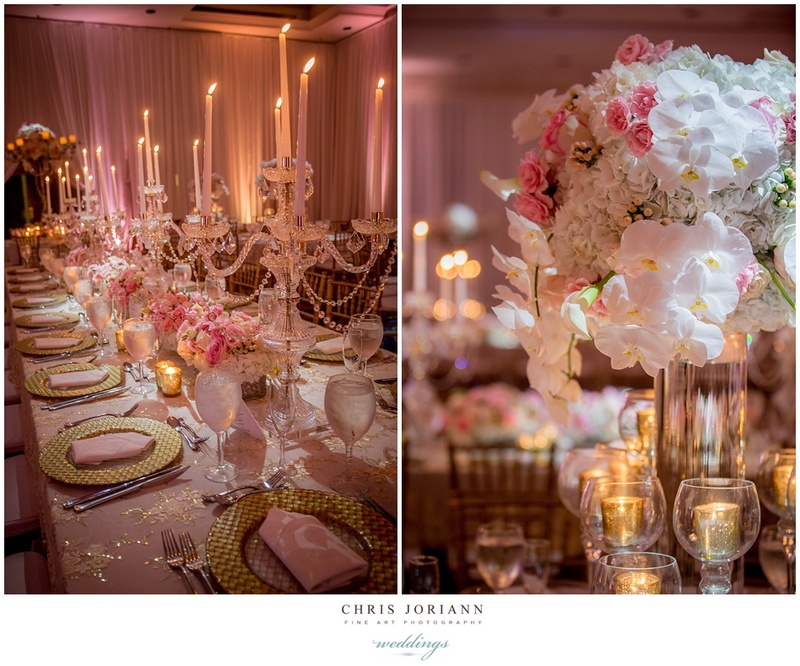 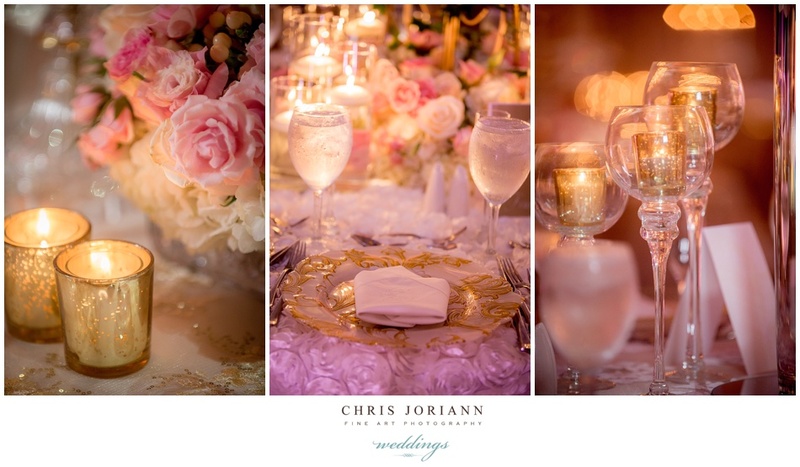 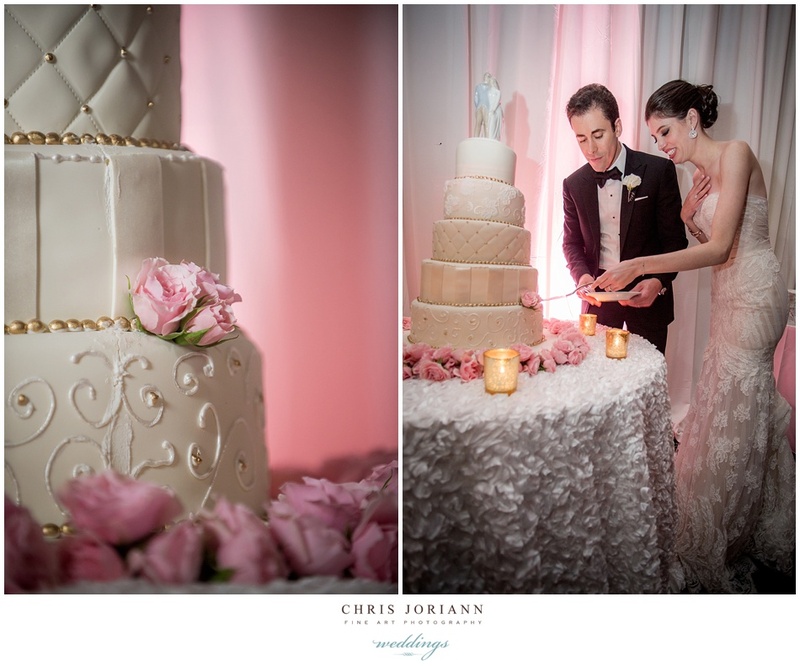 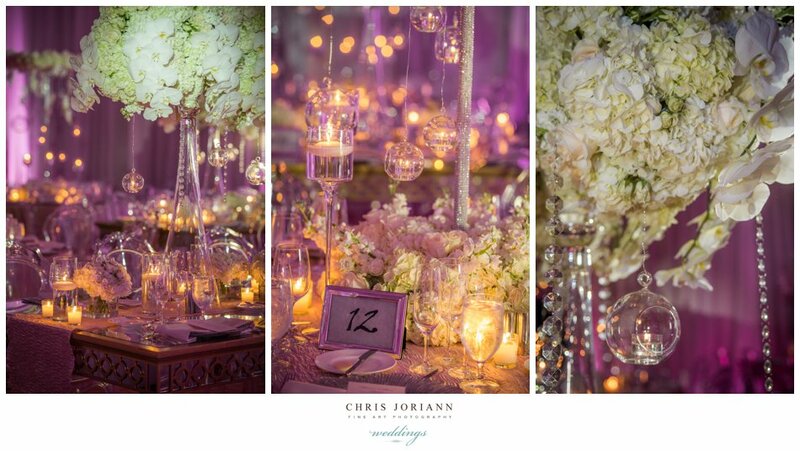 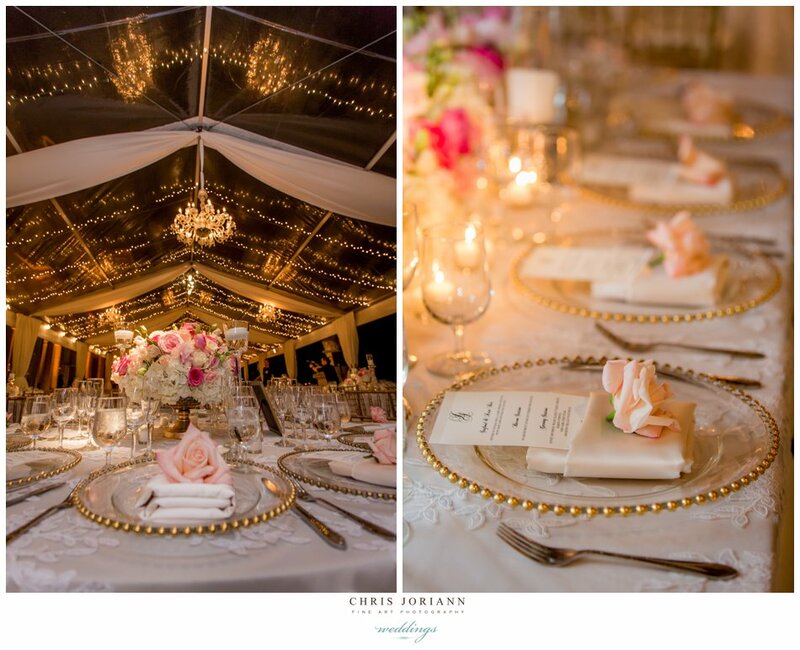 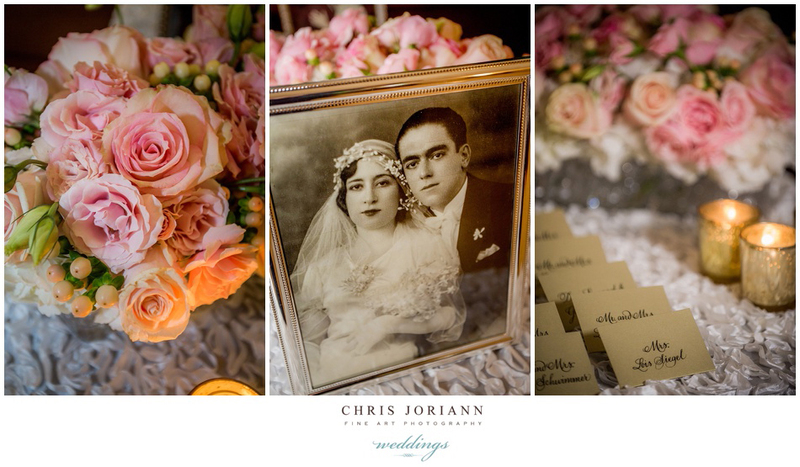 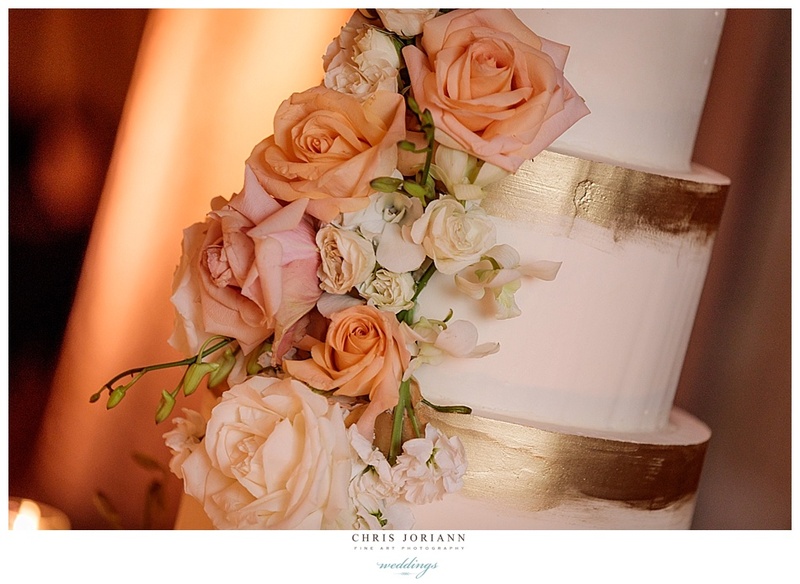 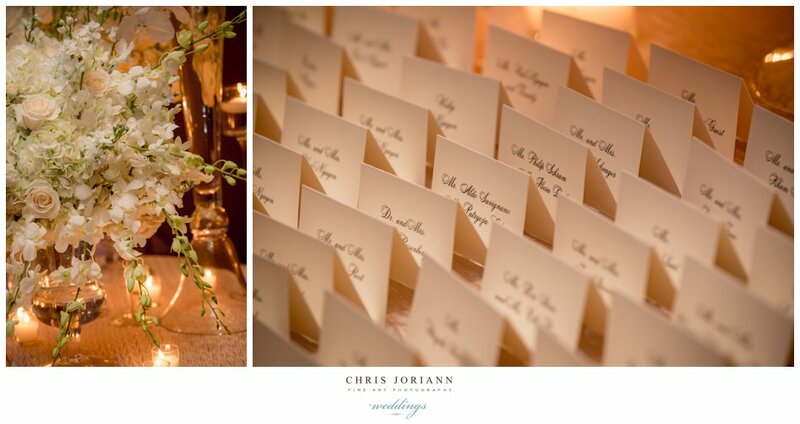 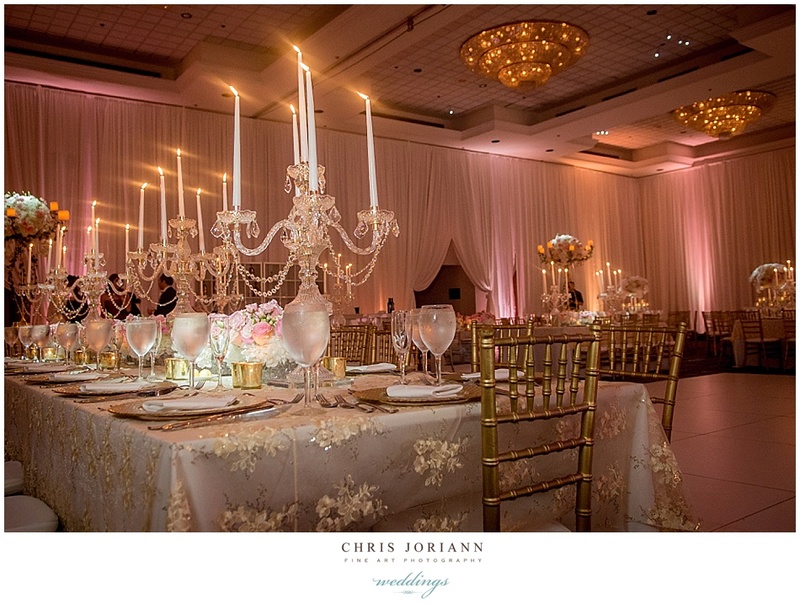 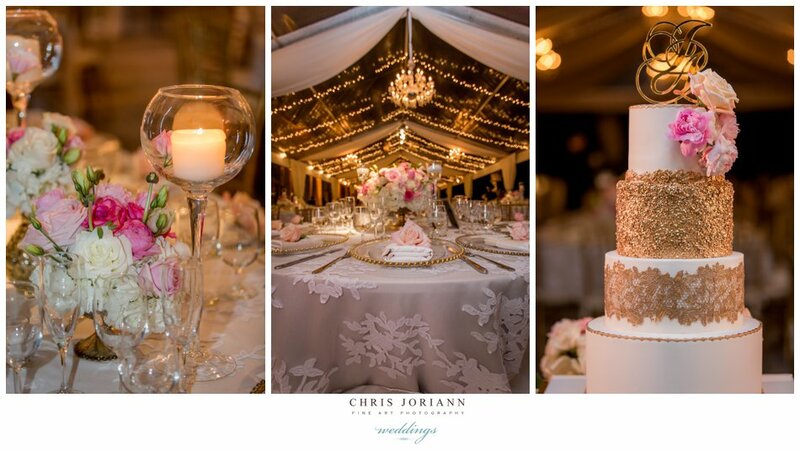 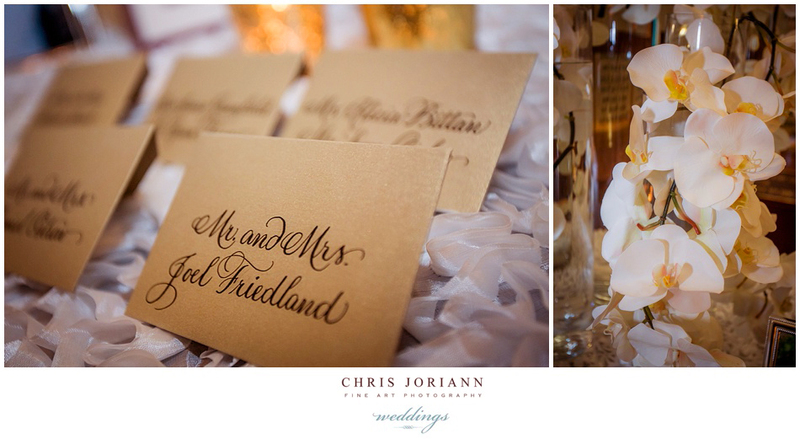 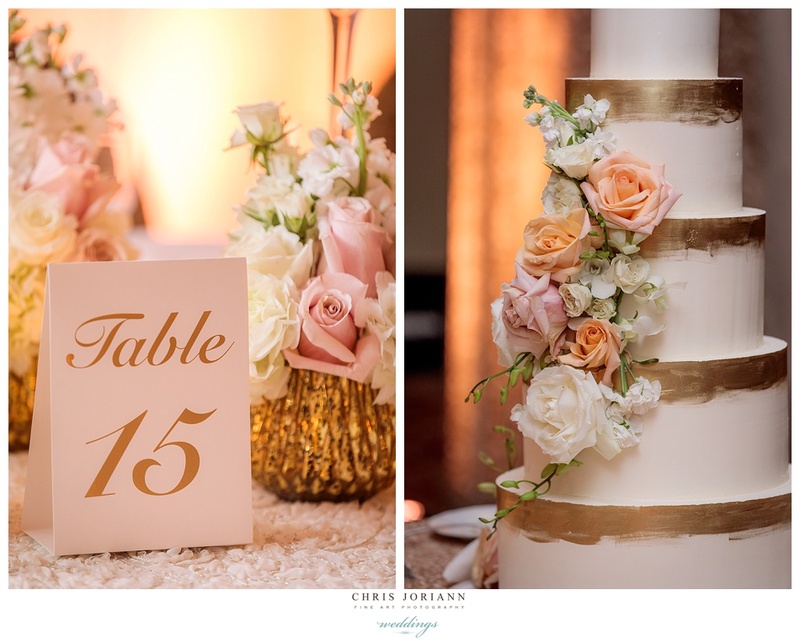 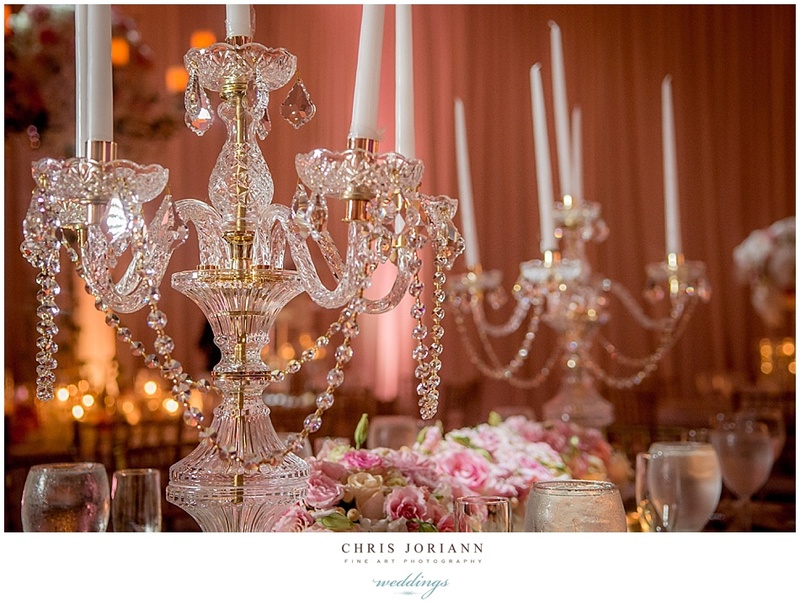 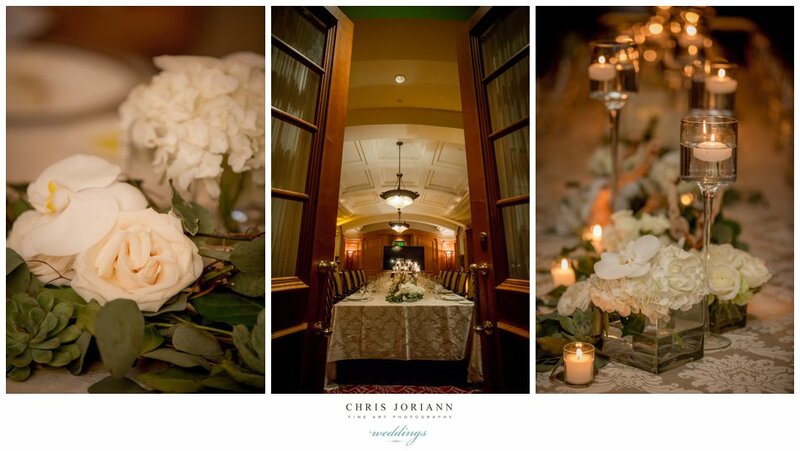 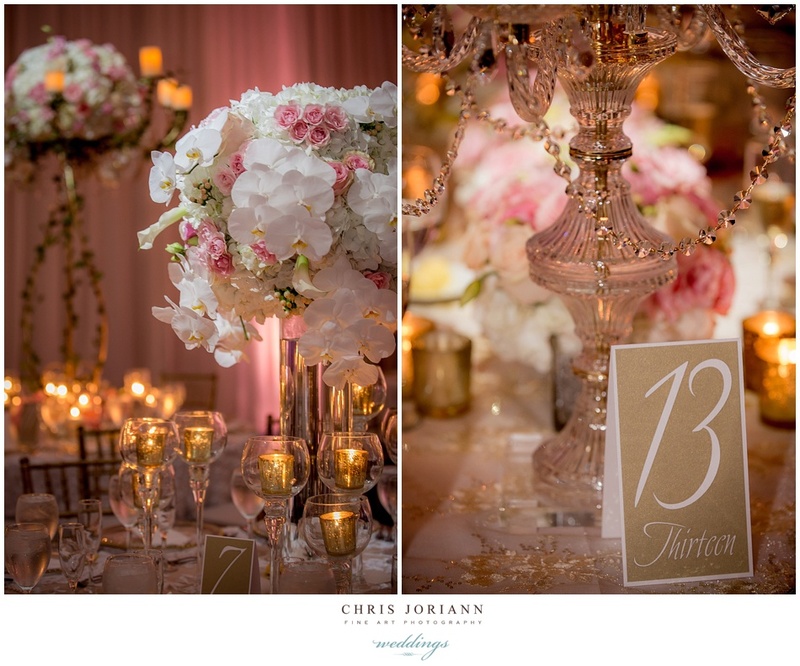 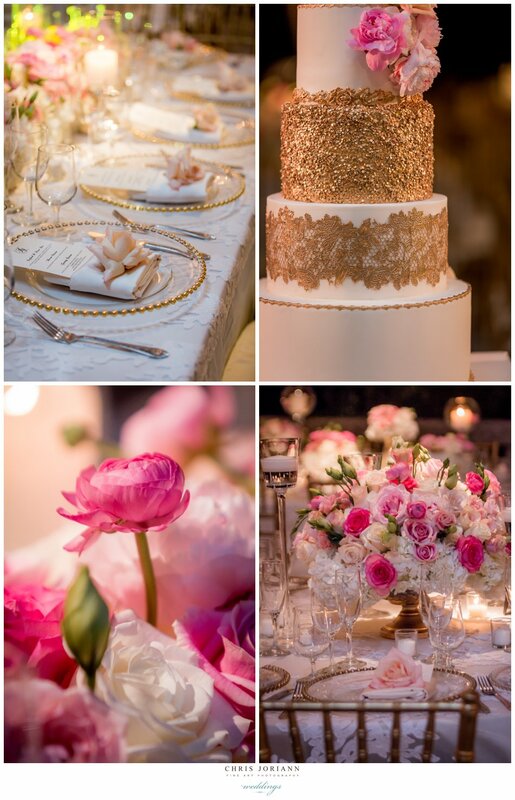 The candle-lit room was awash in golden hues, with florals + lace covered tables. 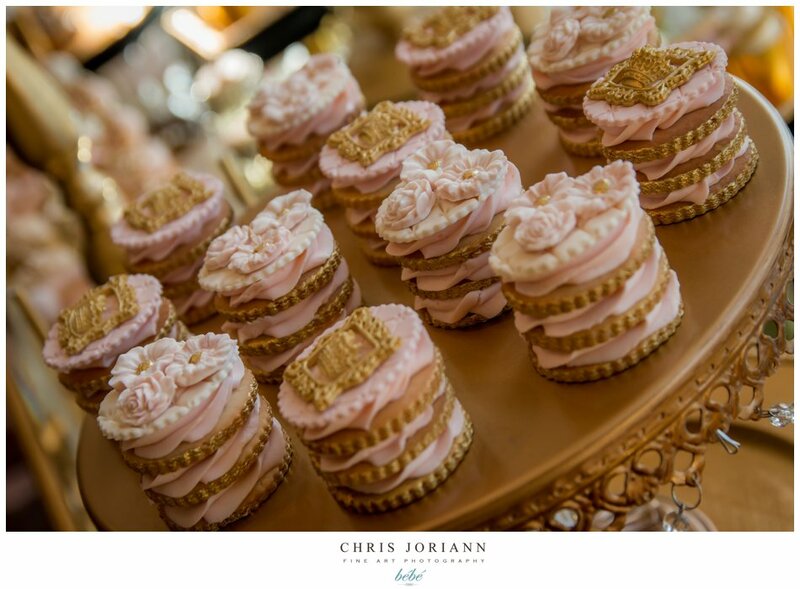 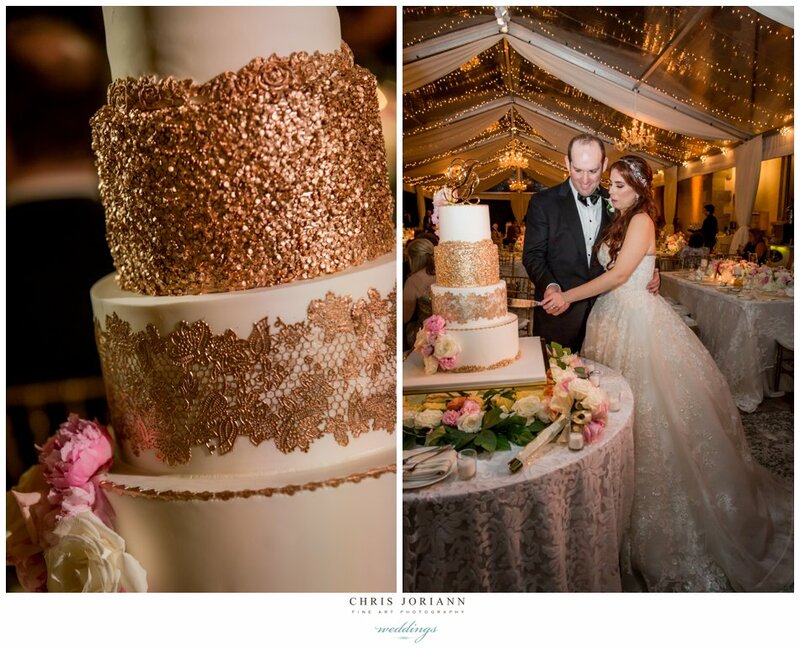 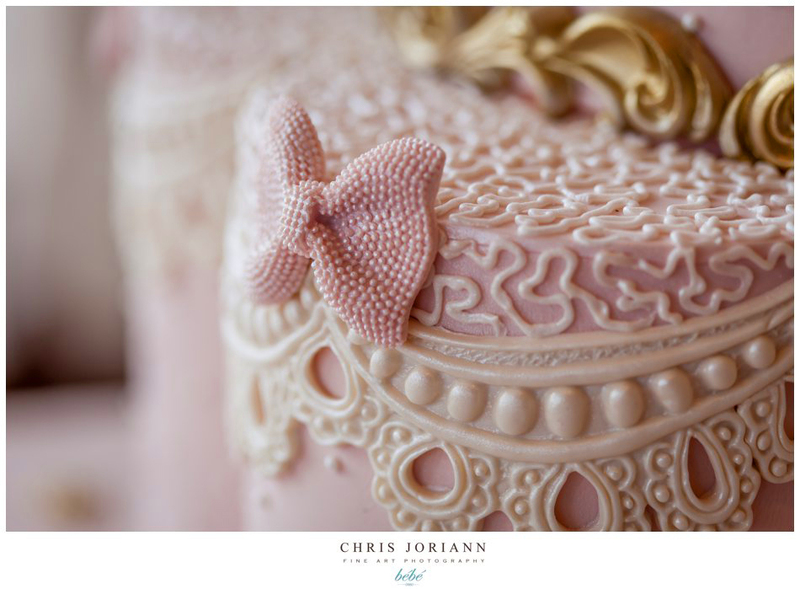 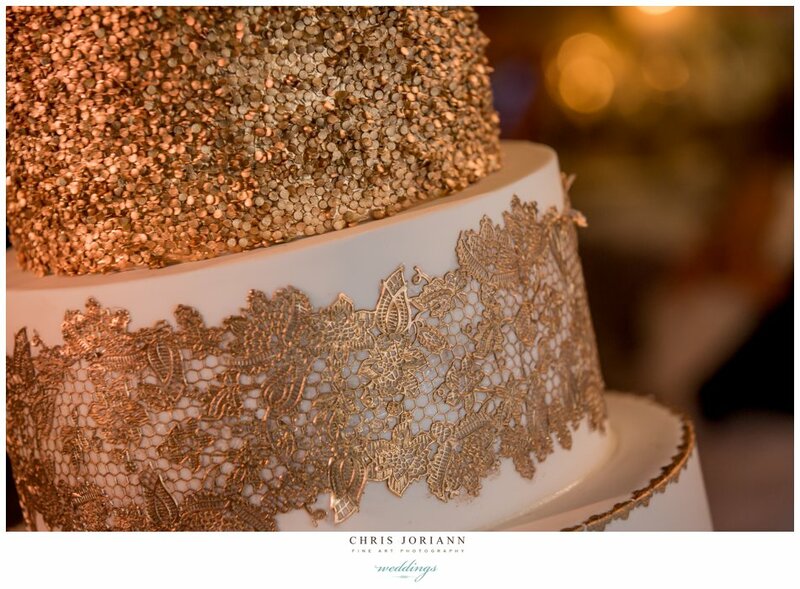 The 5-tier cake, was had painted in gold at each layer. 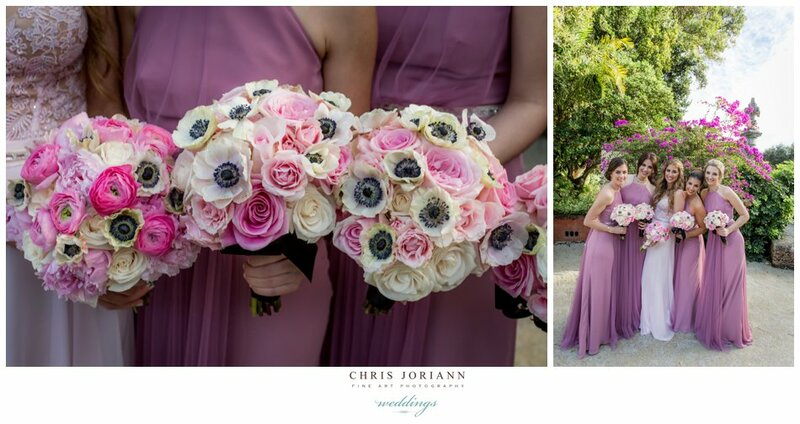 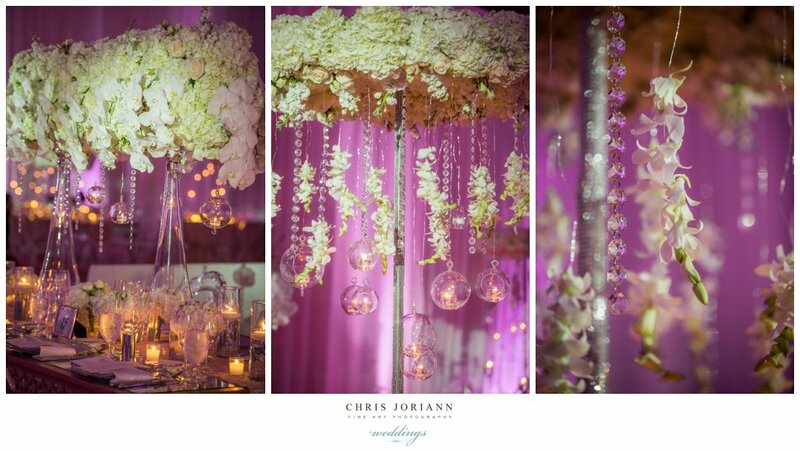 With cascading pastel flowers. 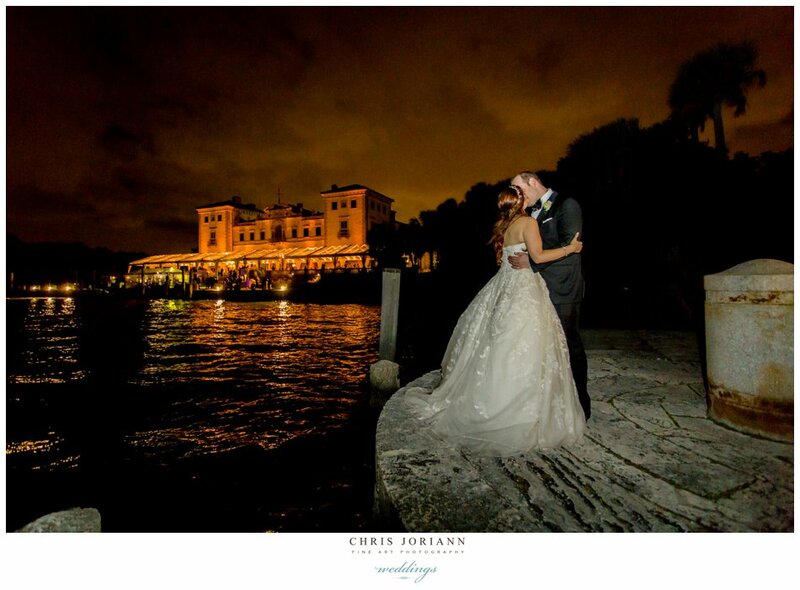 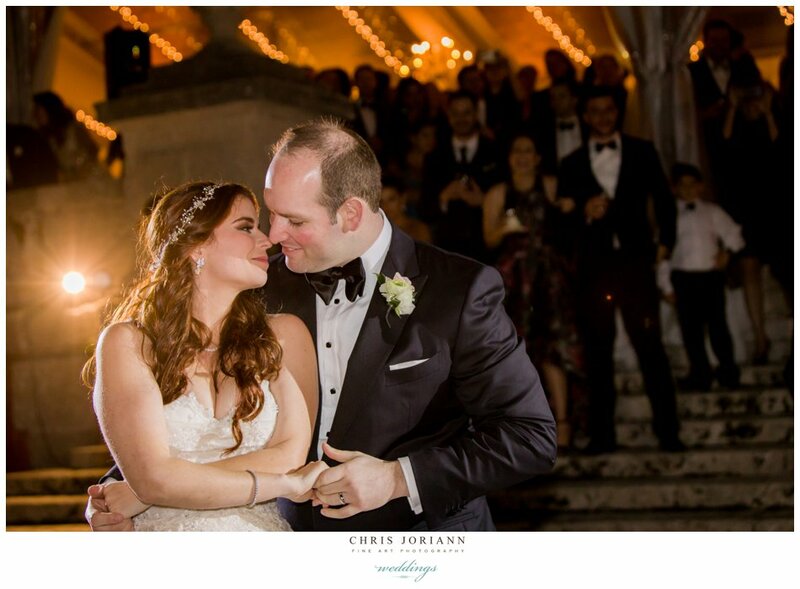 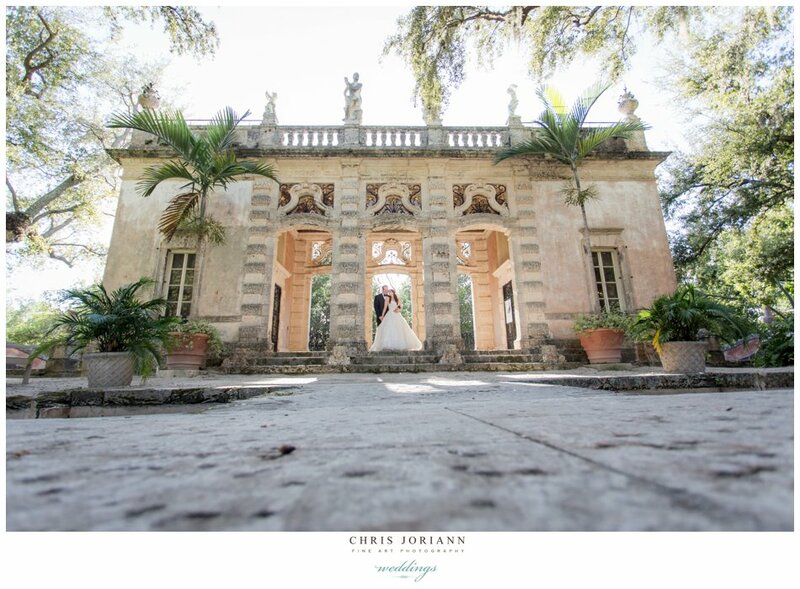 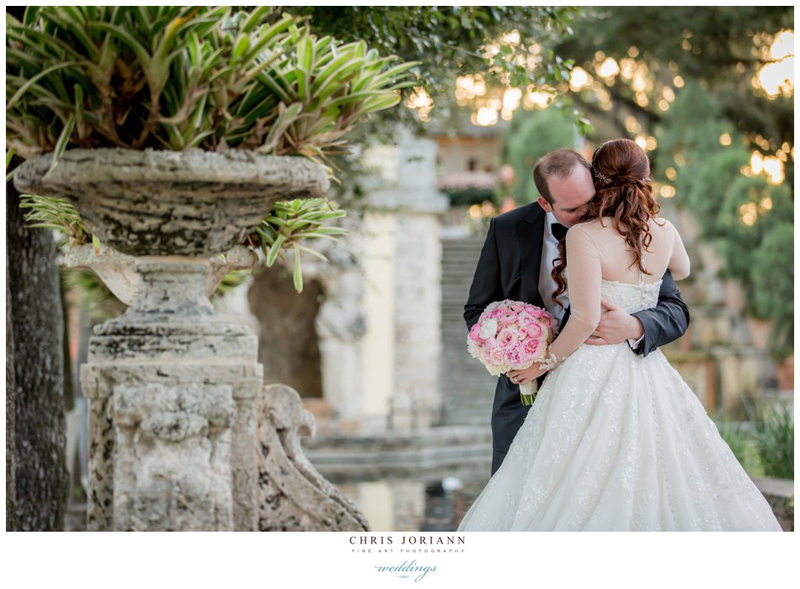 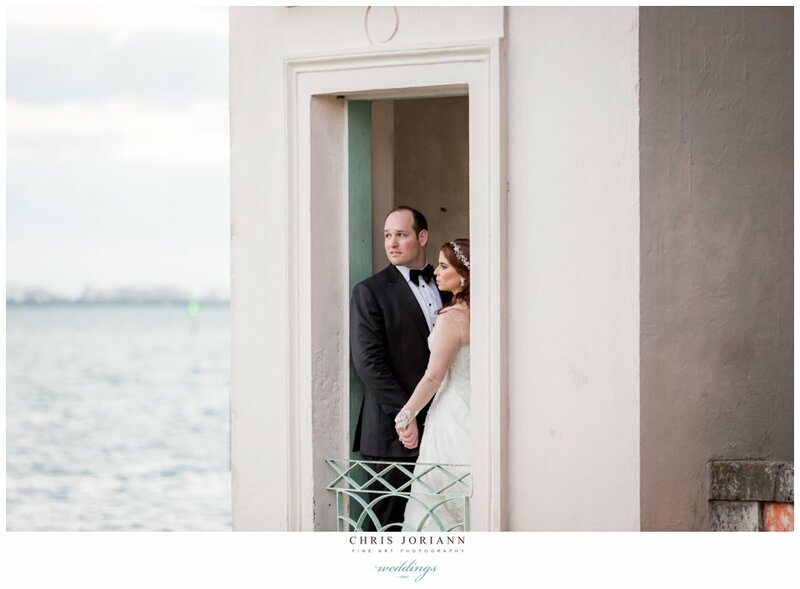 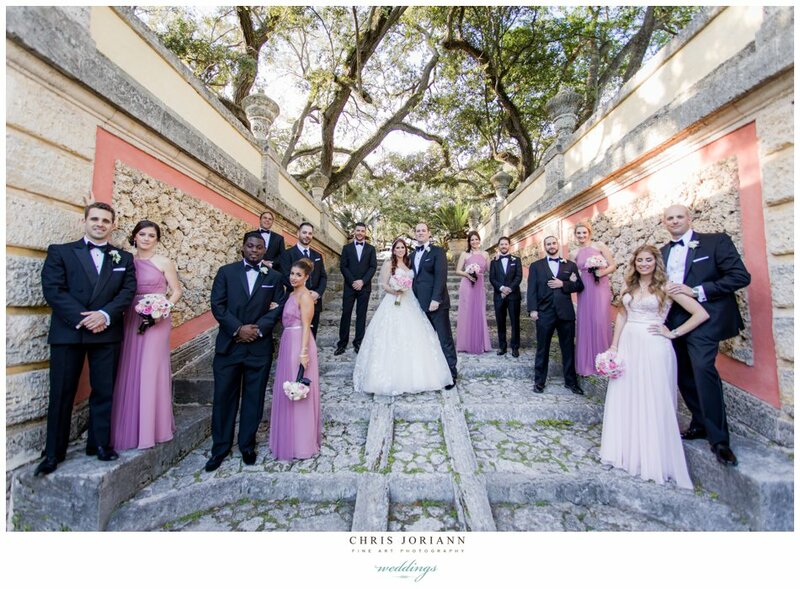 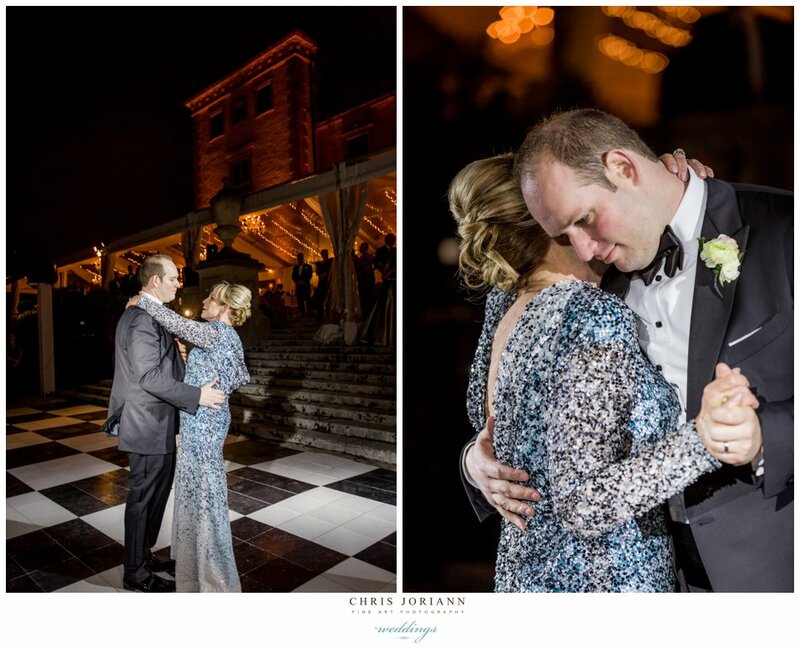 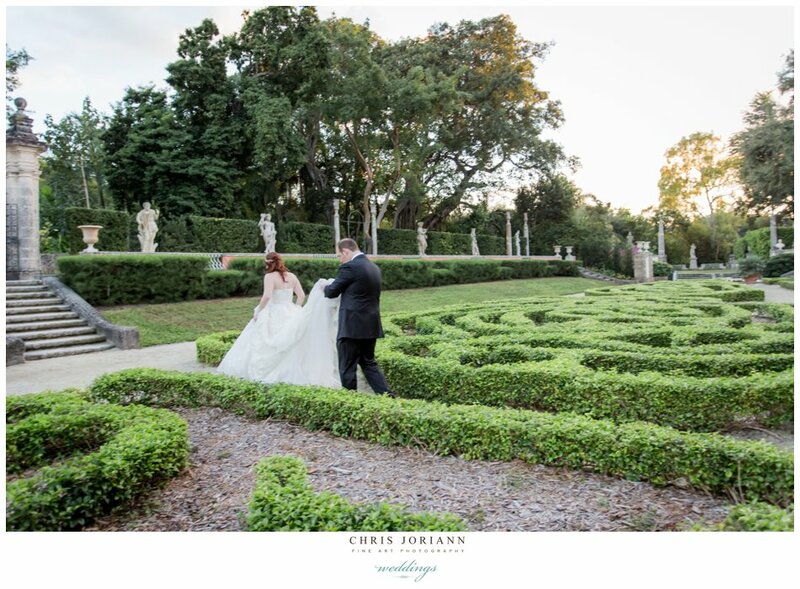 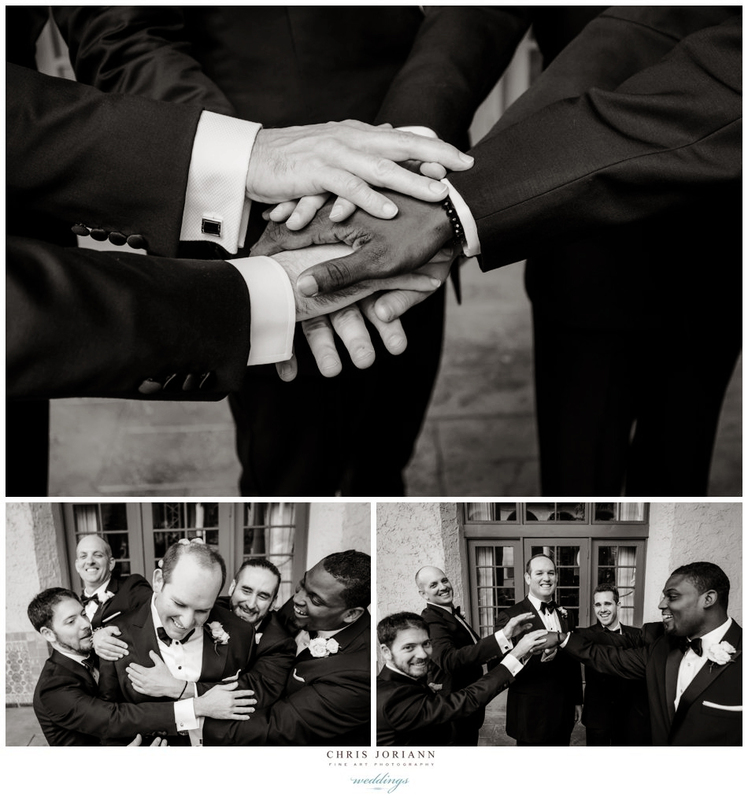 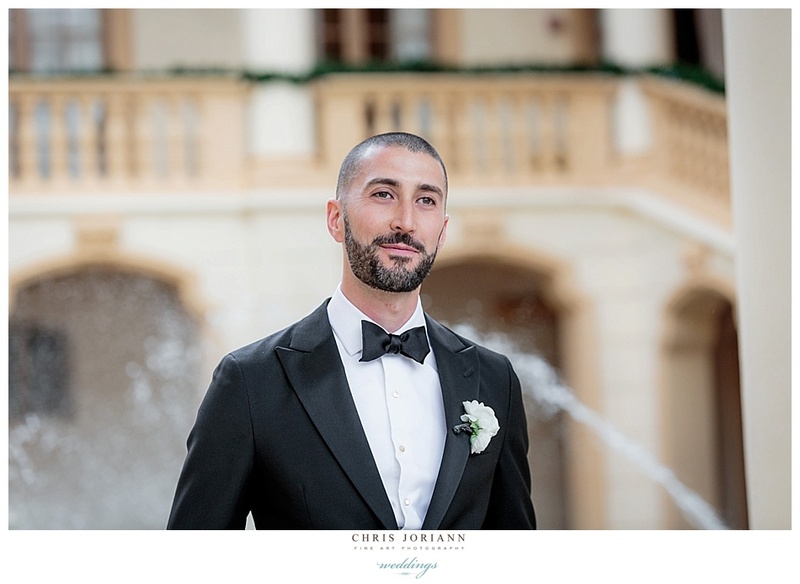 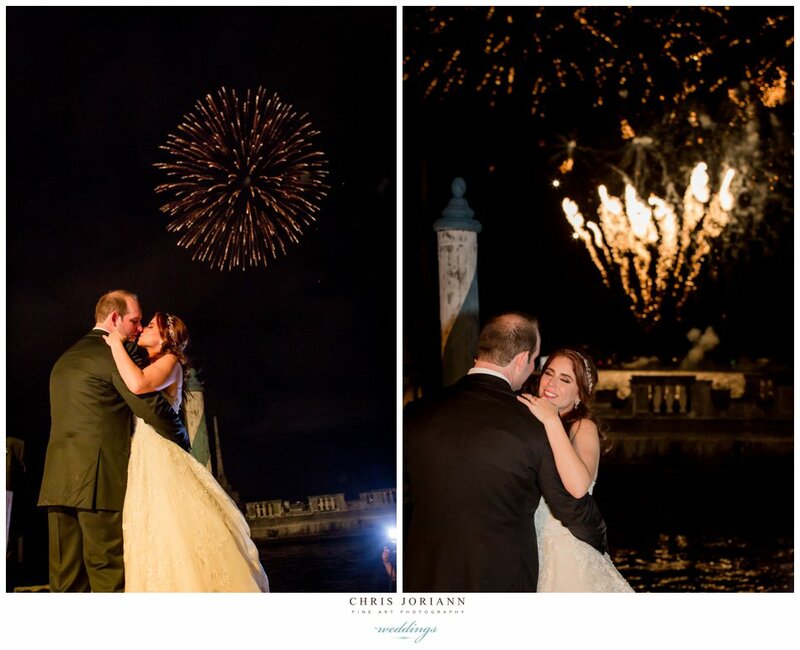 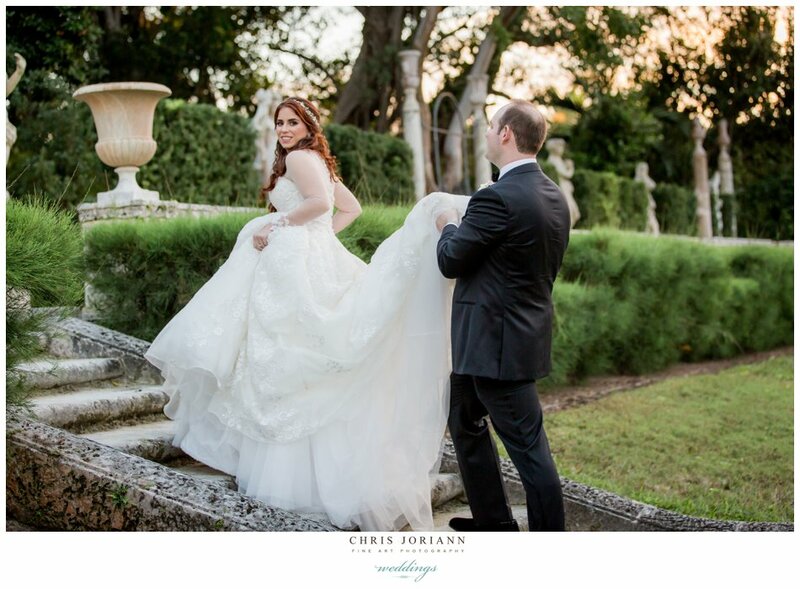 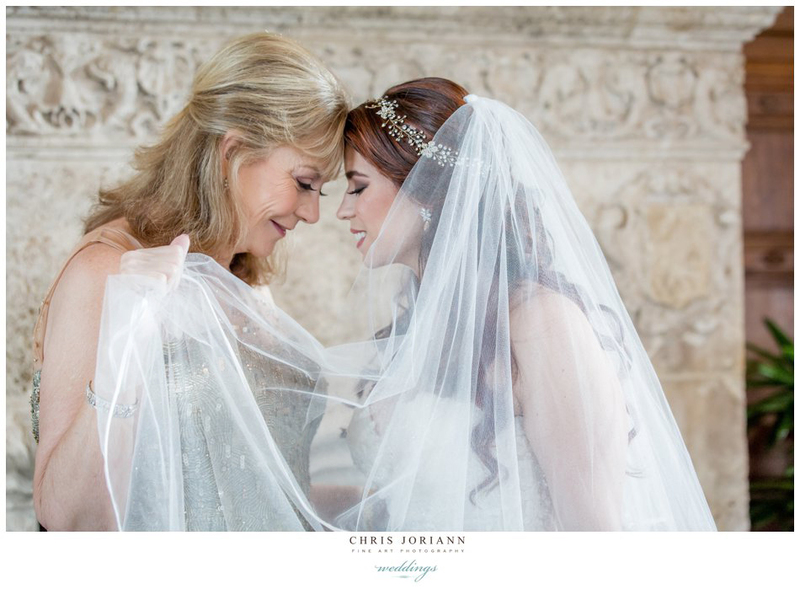 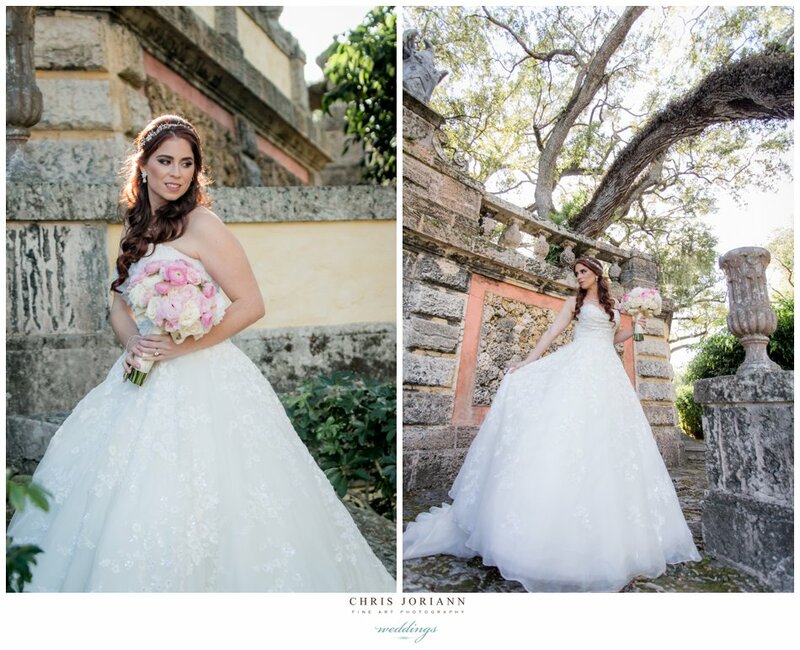 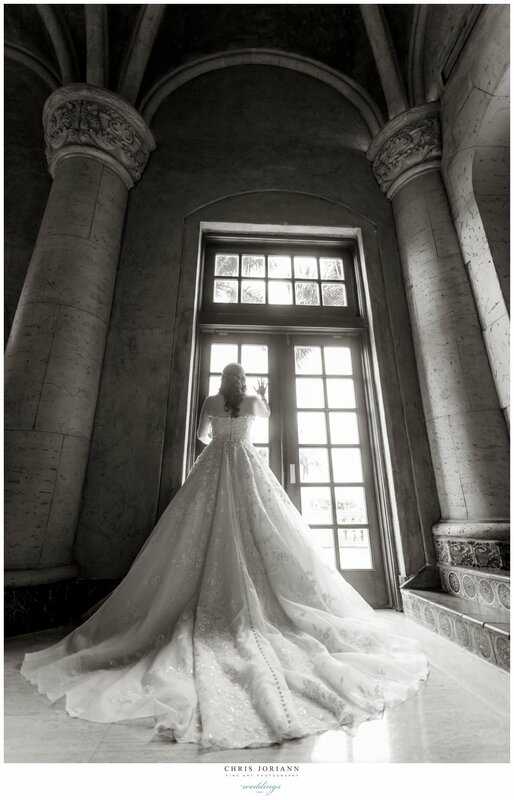 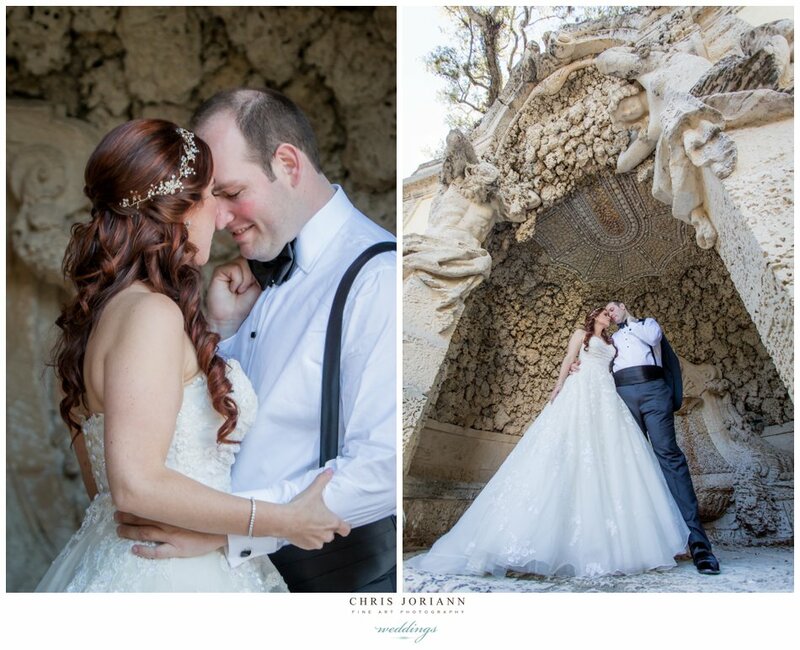 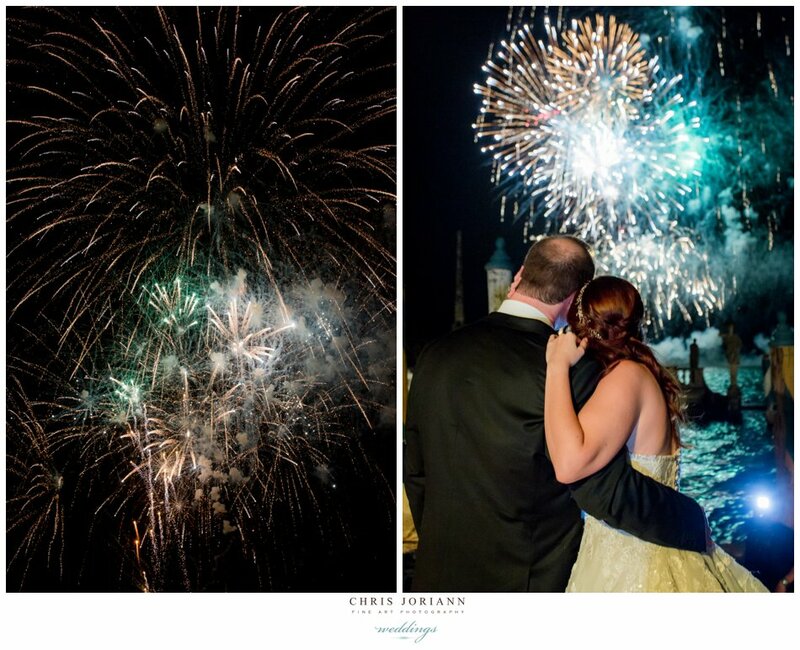 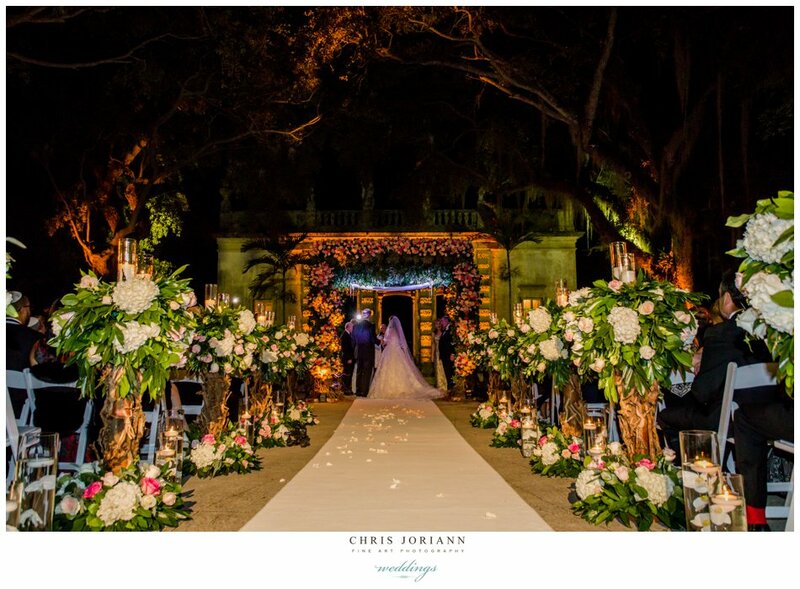 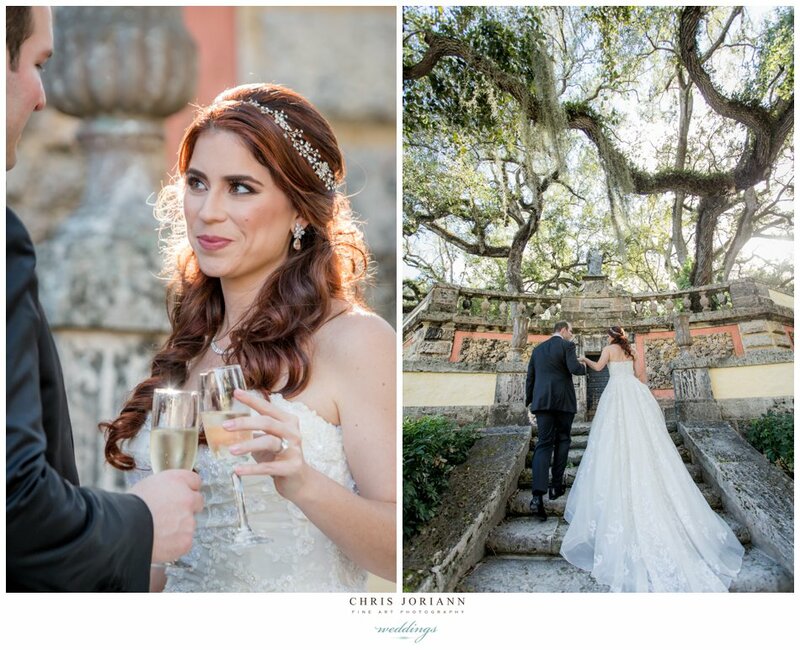 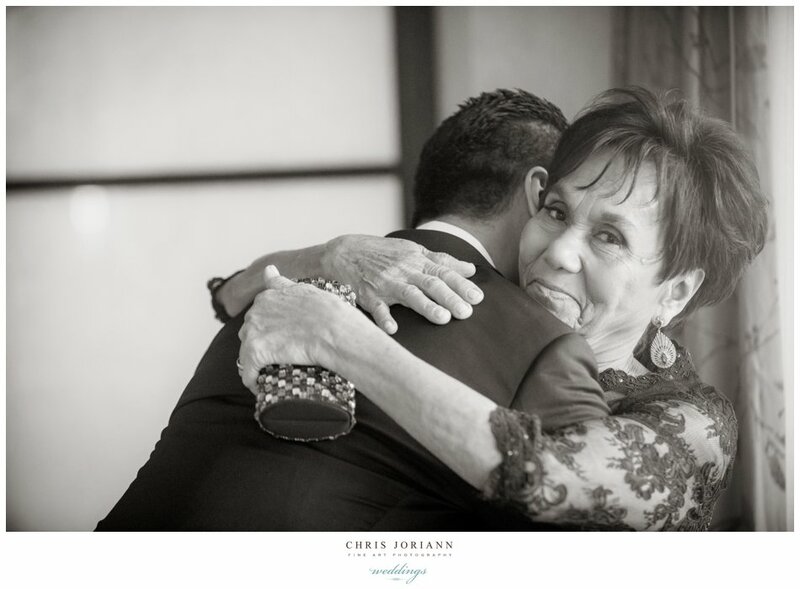 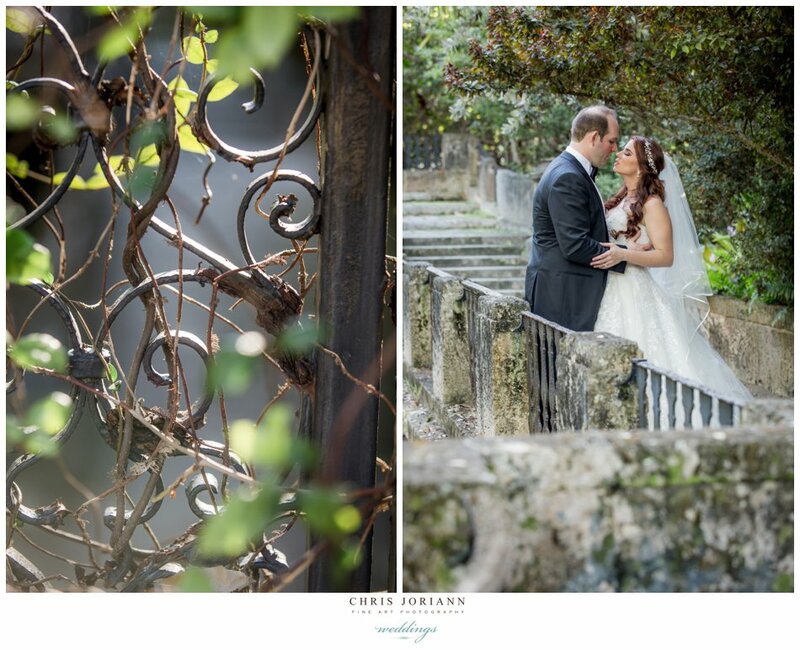 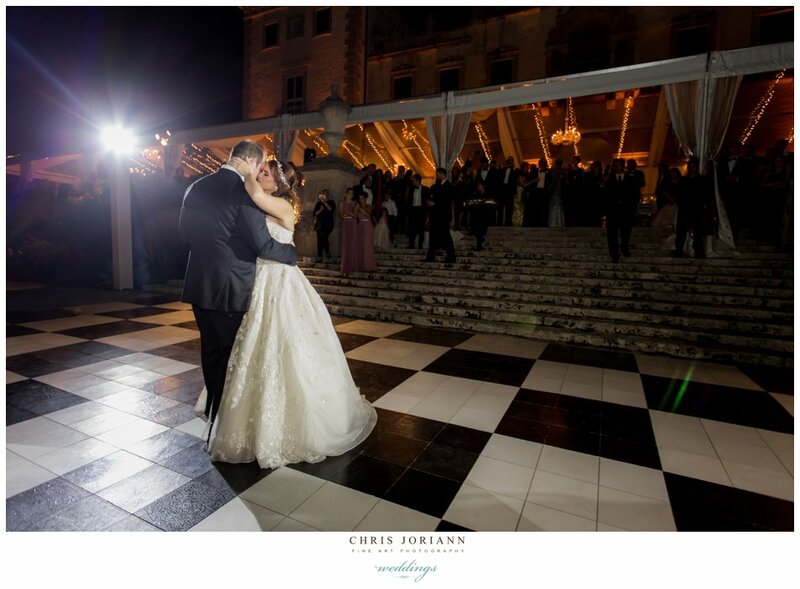 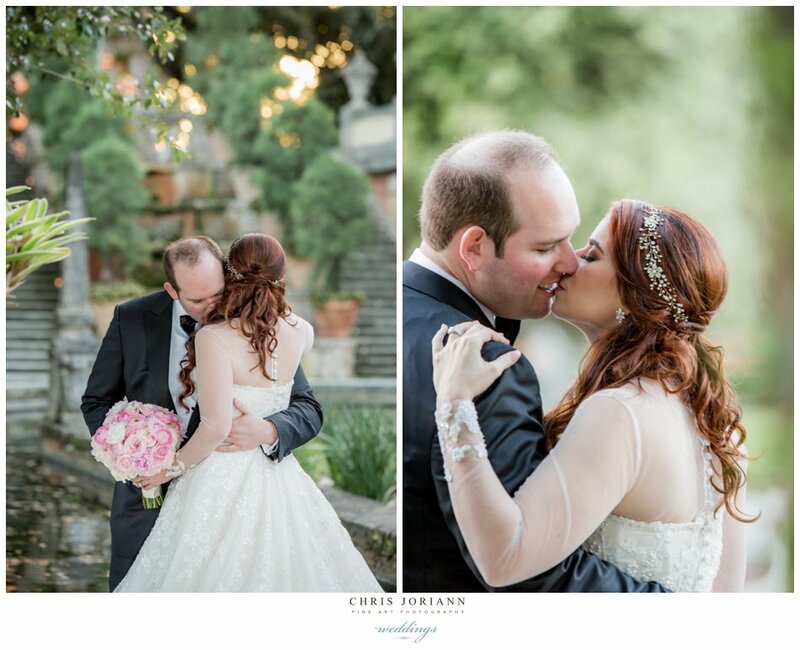 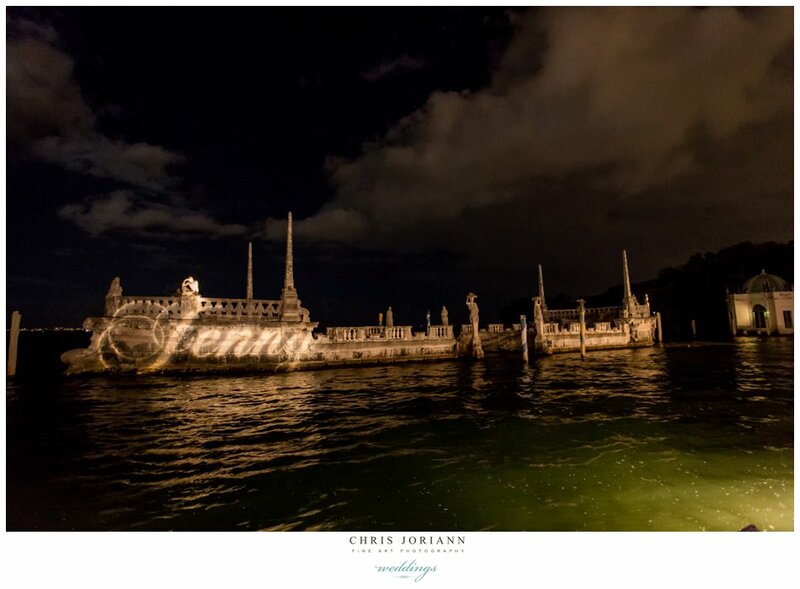 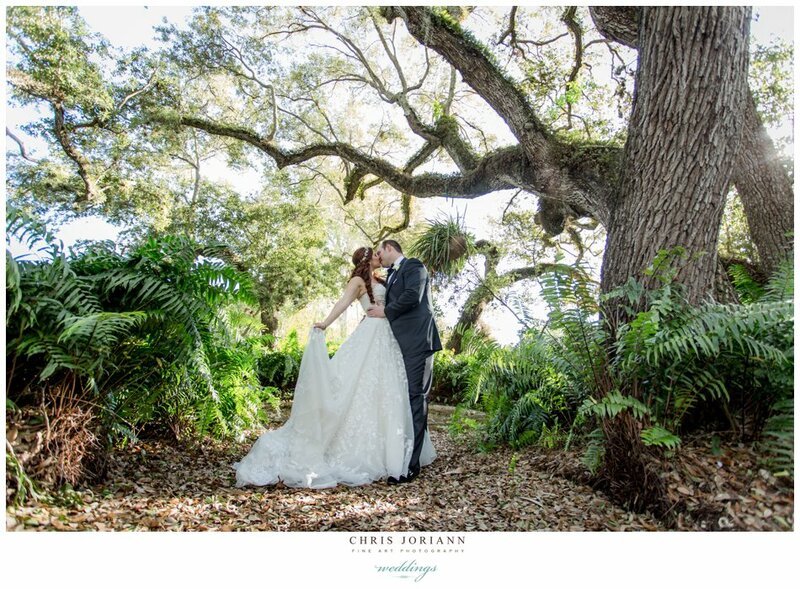 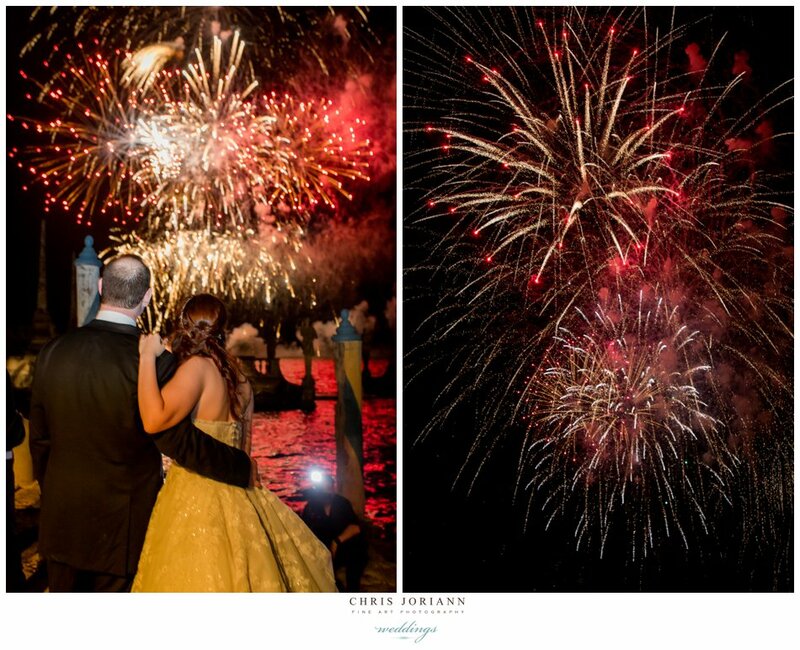 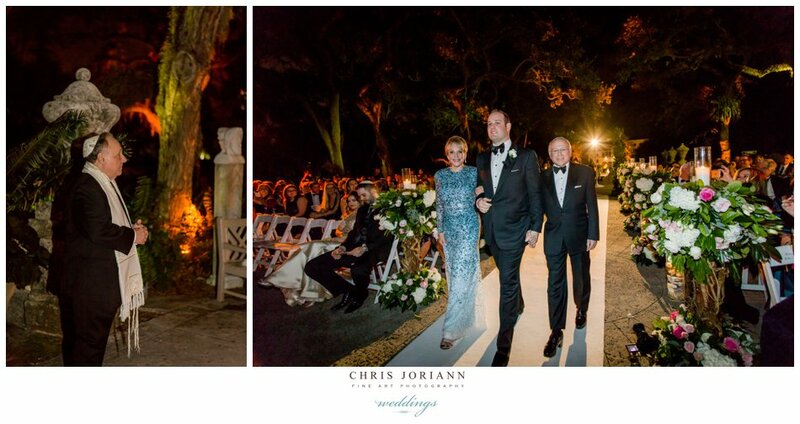 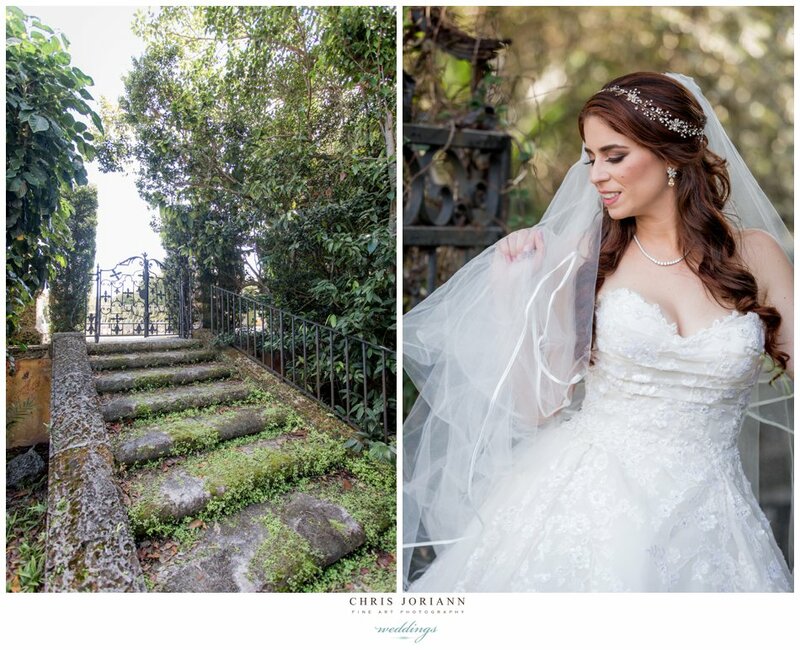 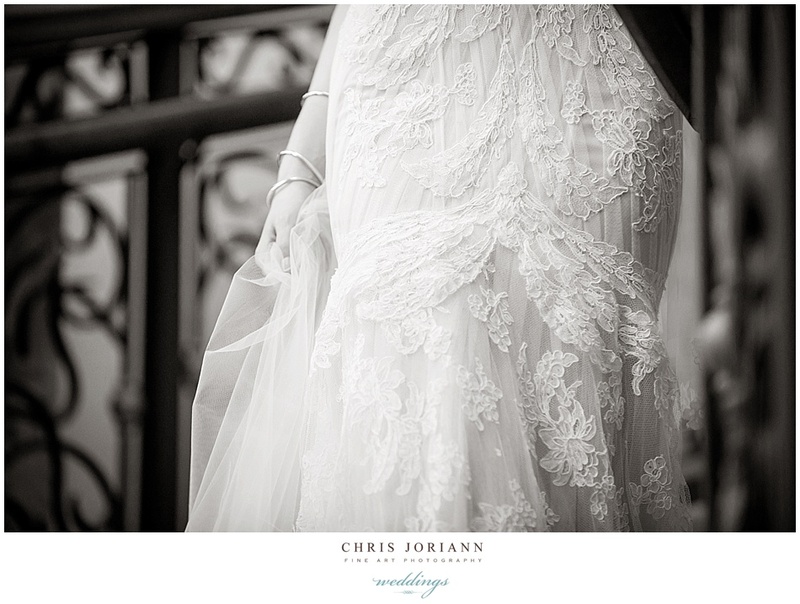 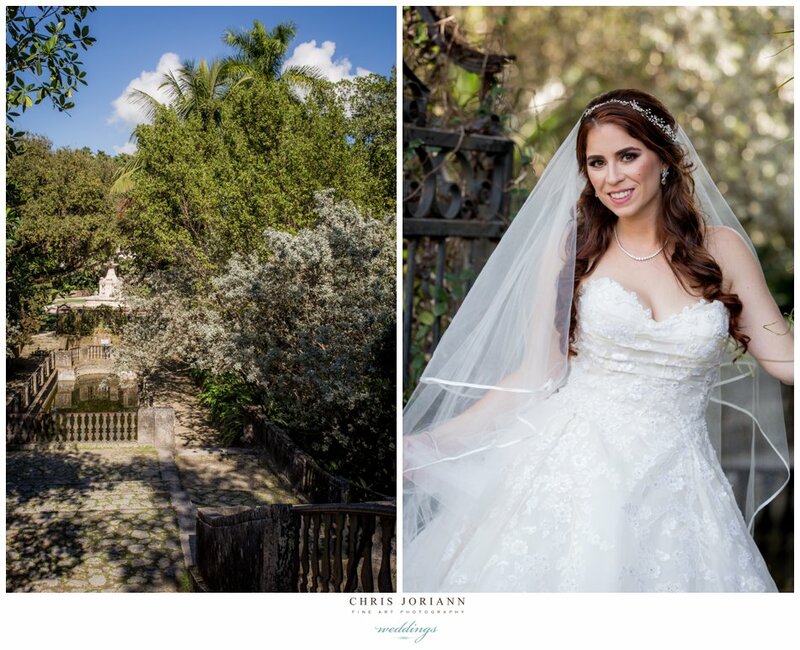 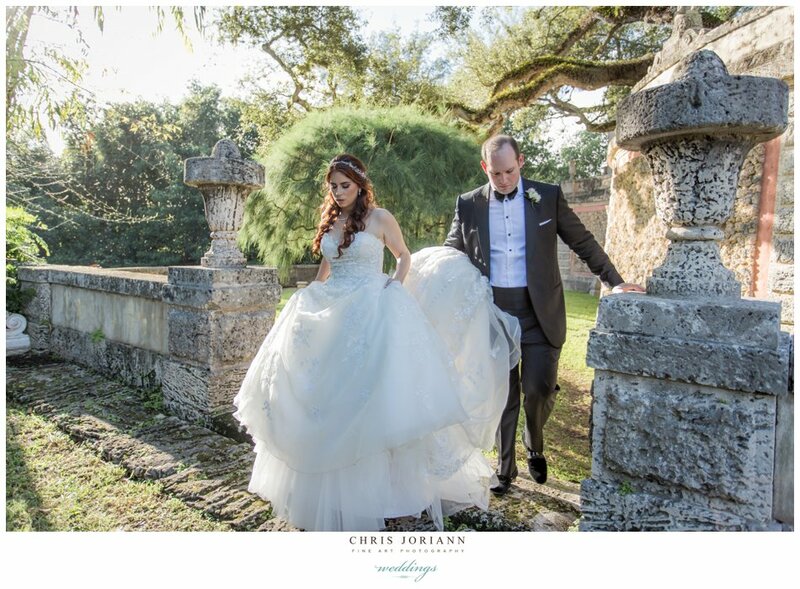 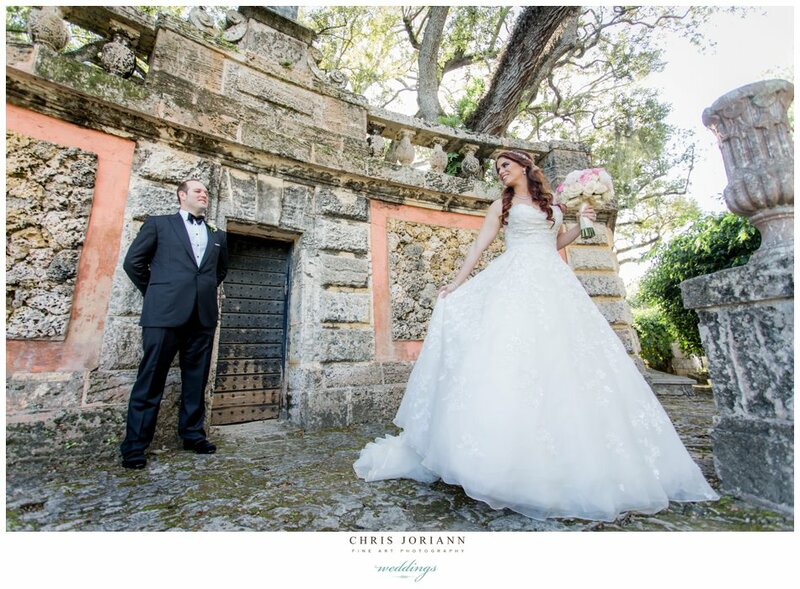 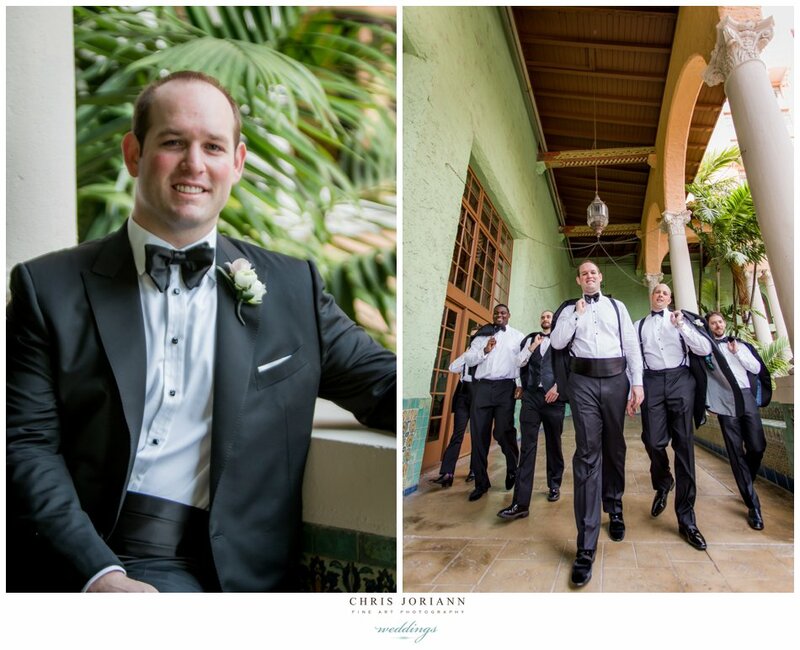 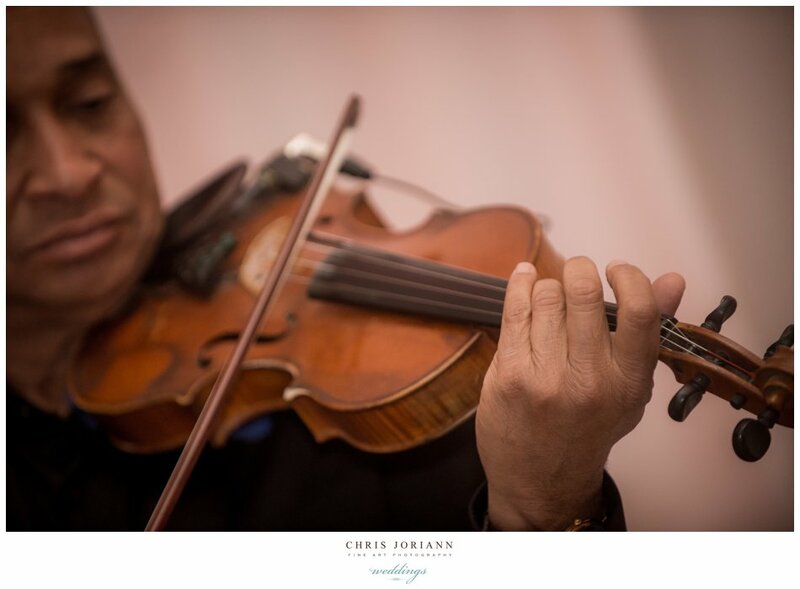 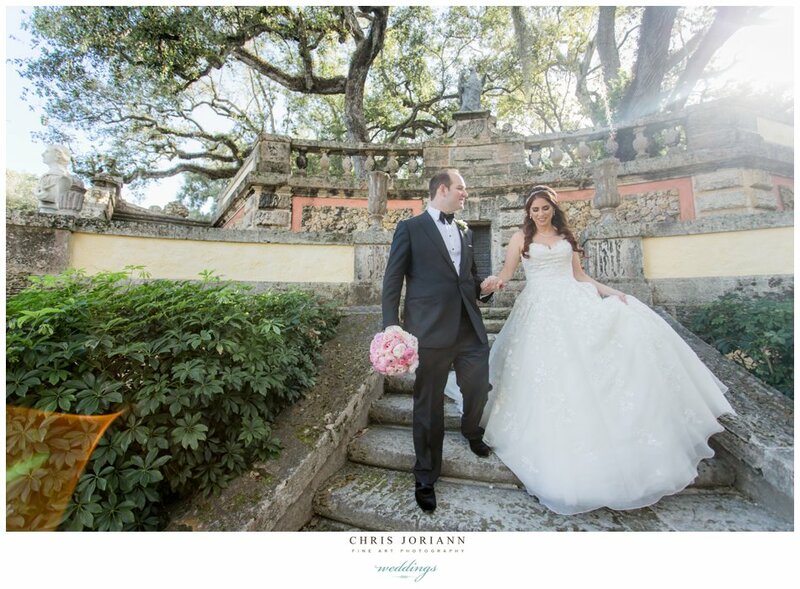 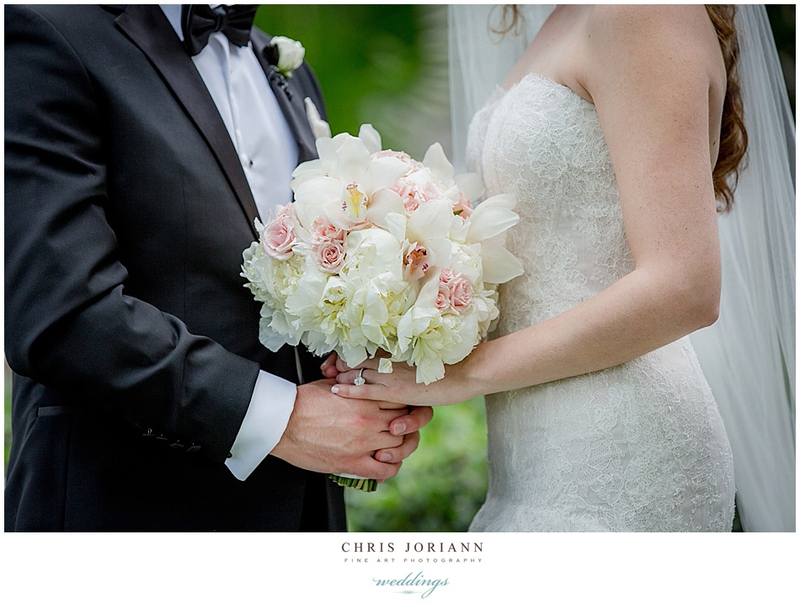 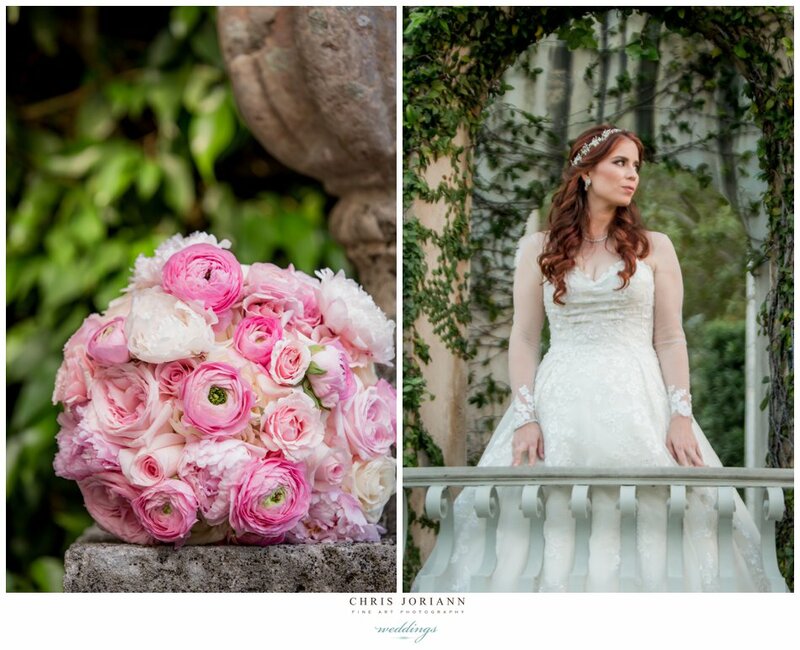 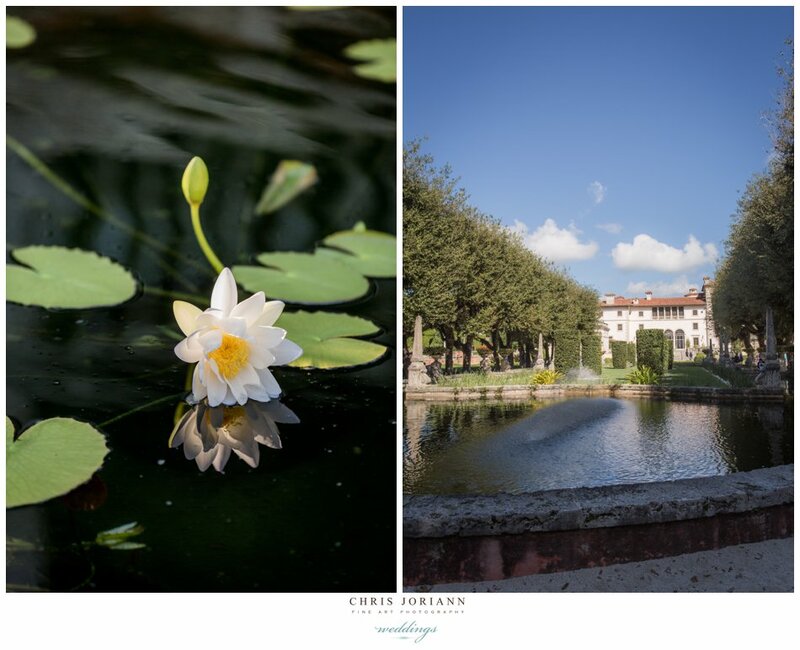 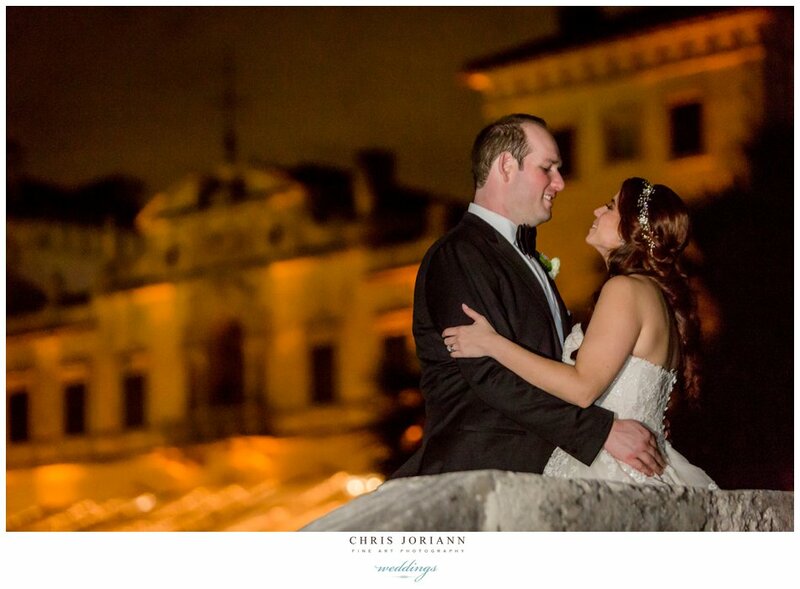 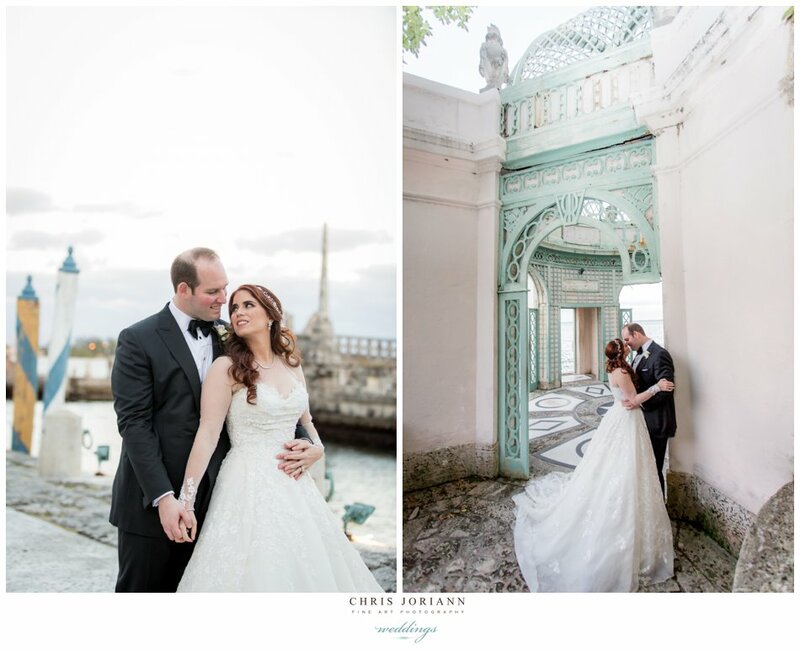 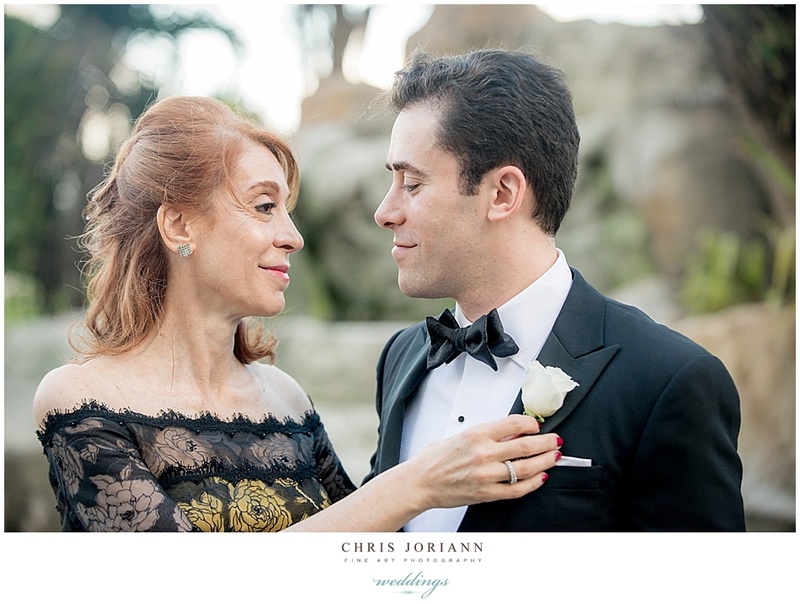 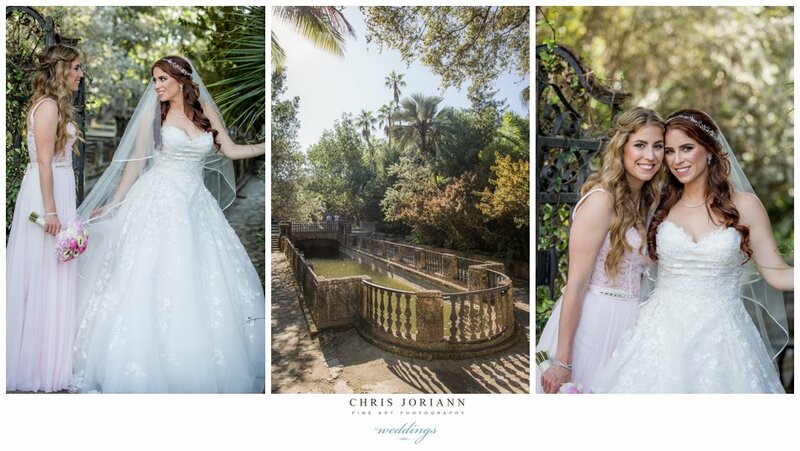 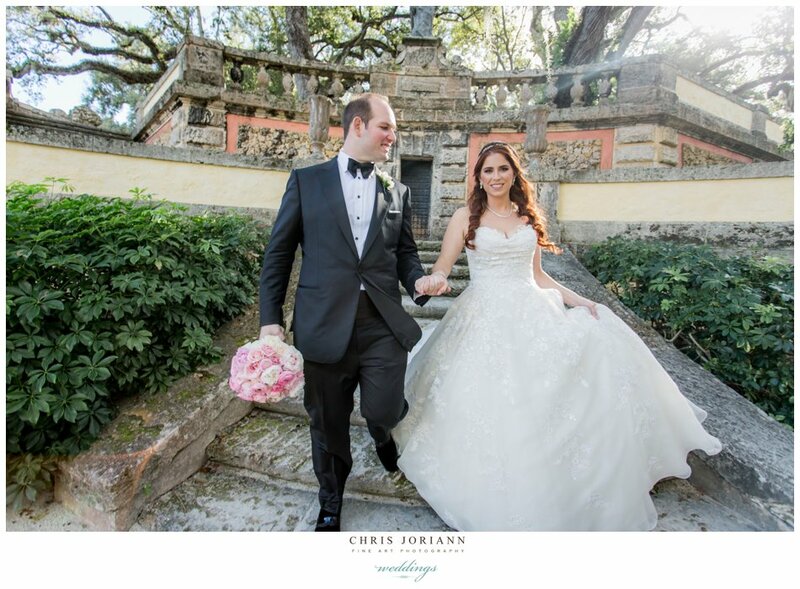 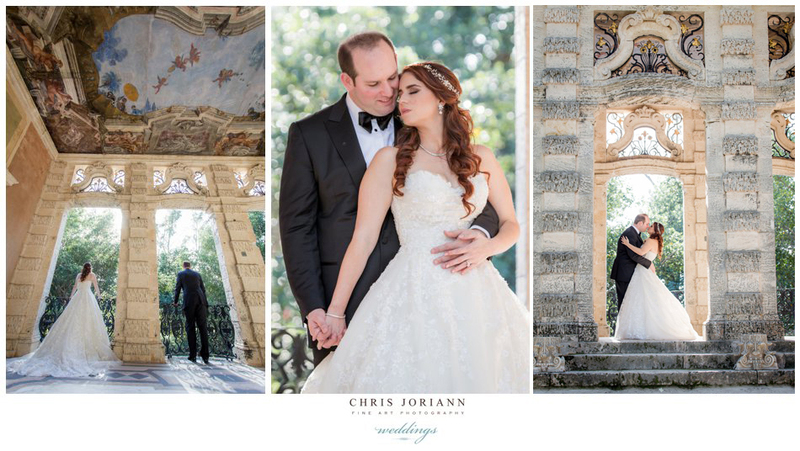 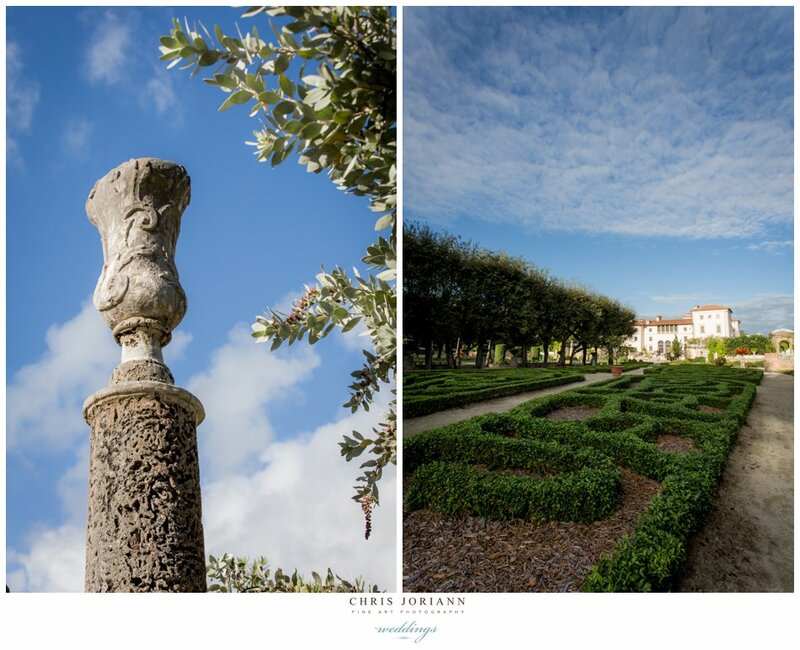 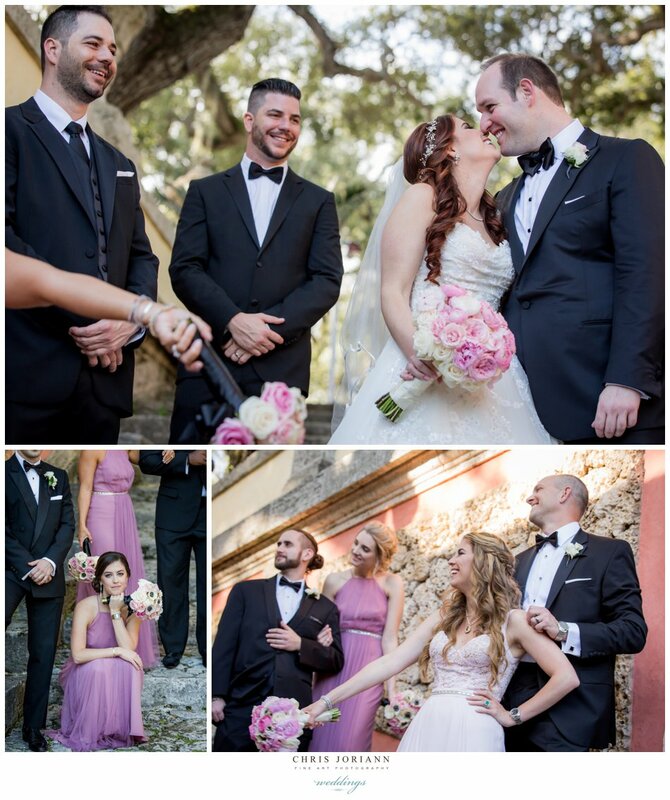 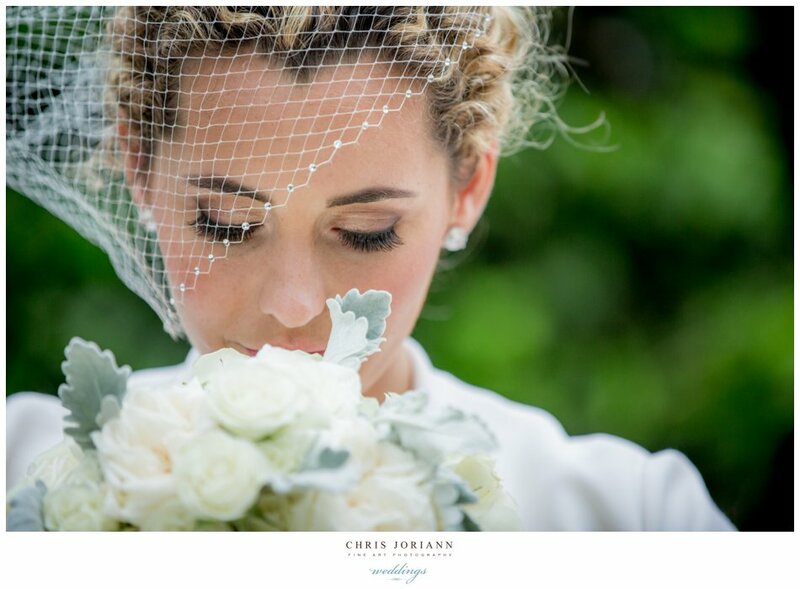 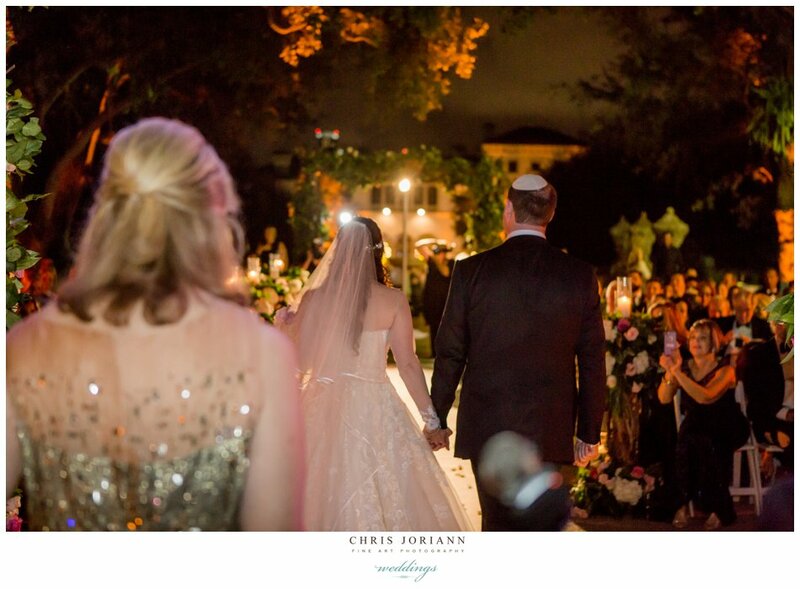 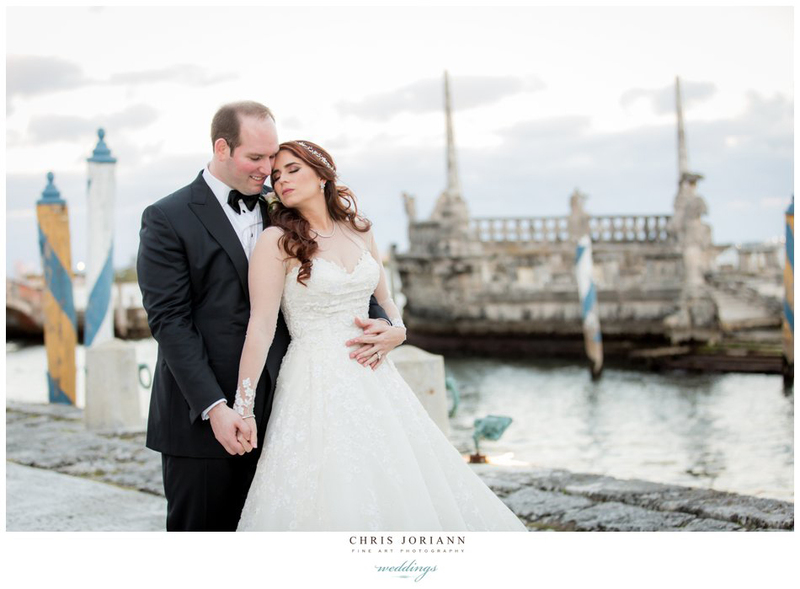 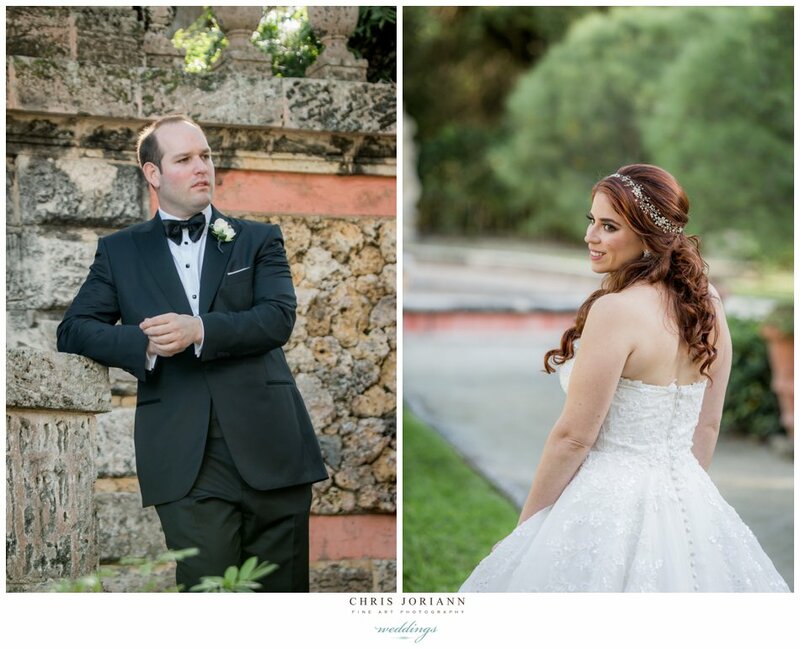 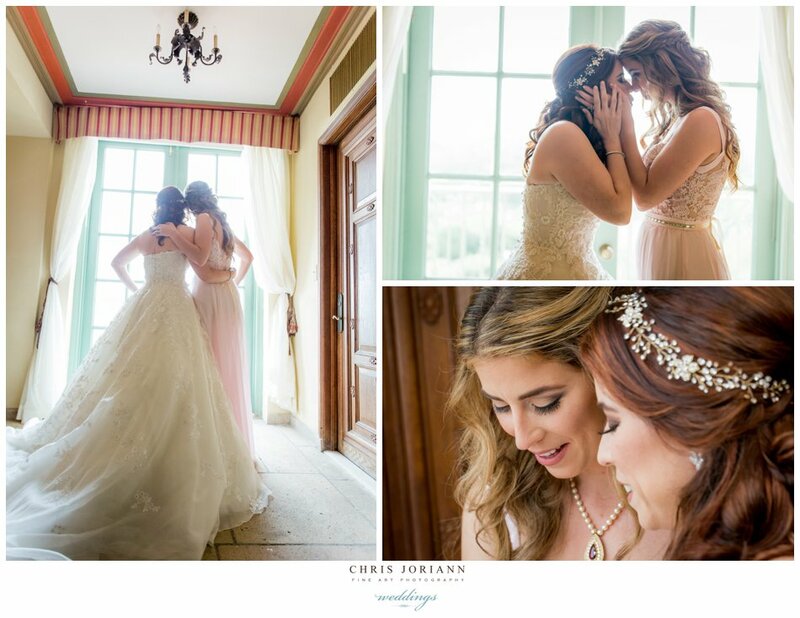 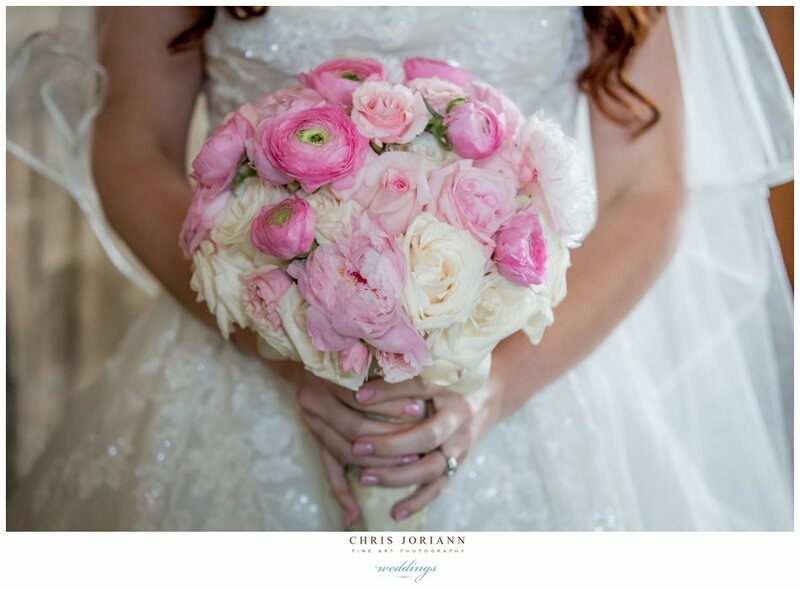 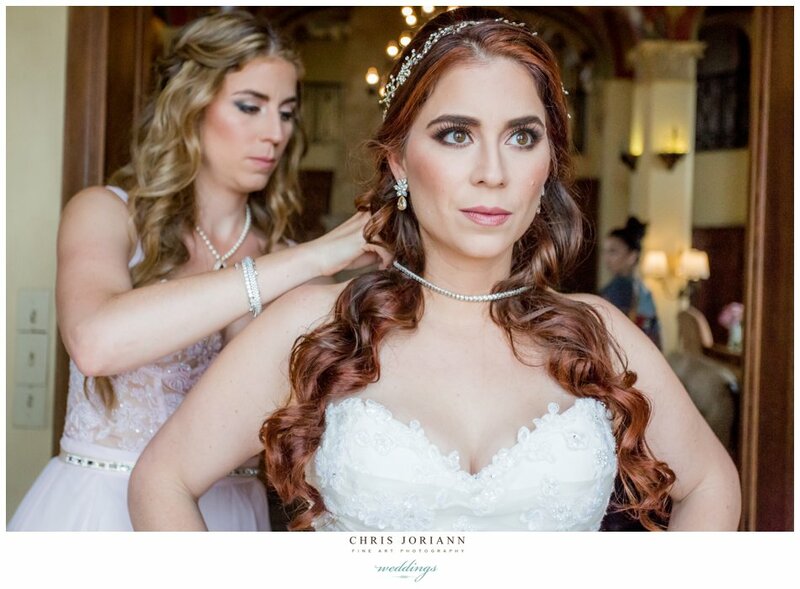 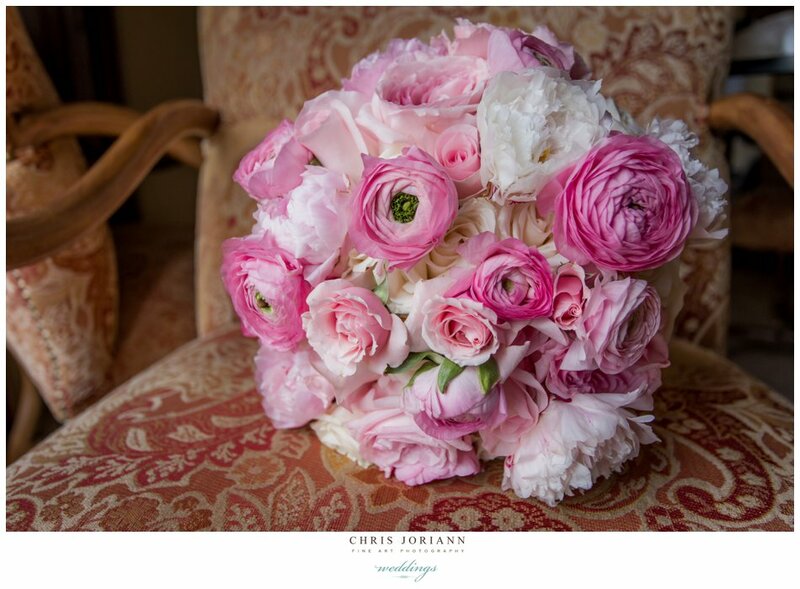 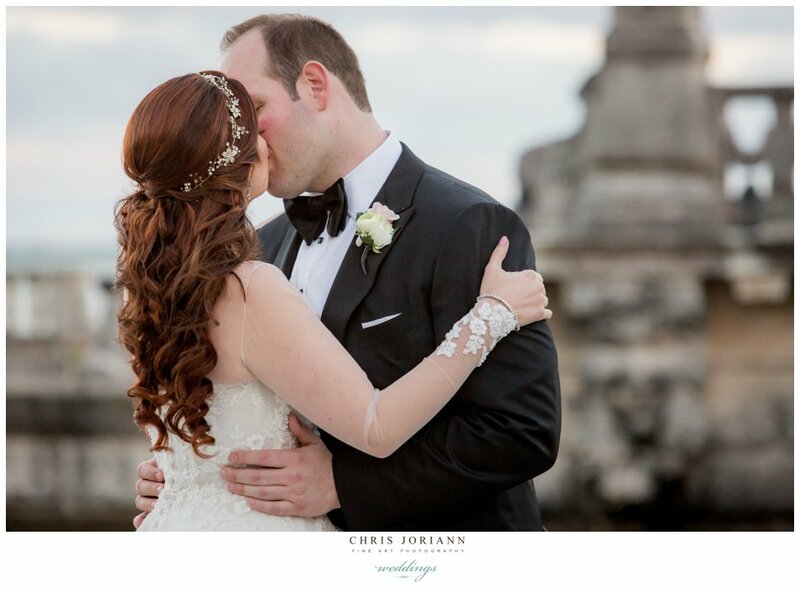 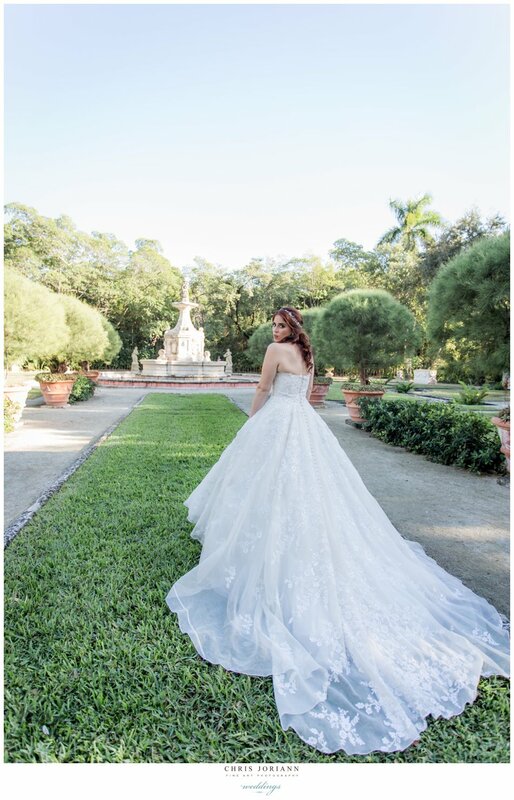 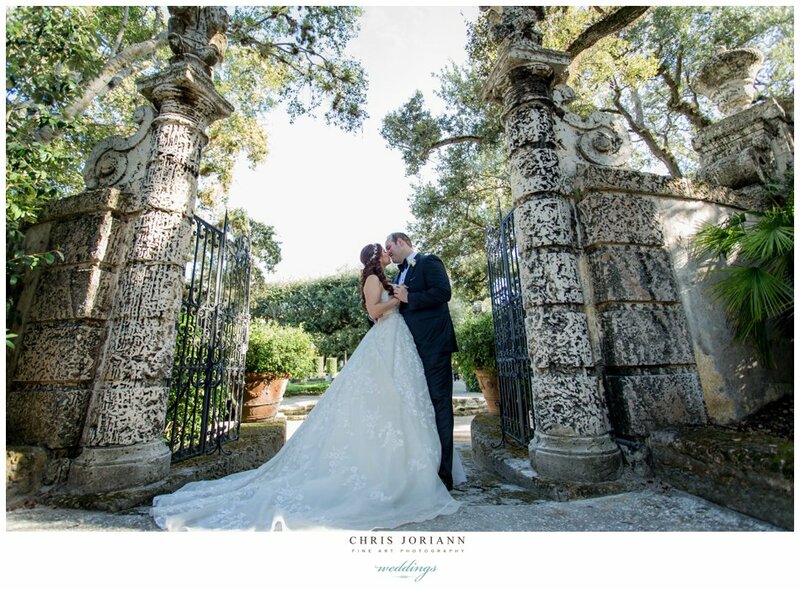 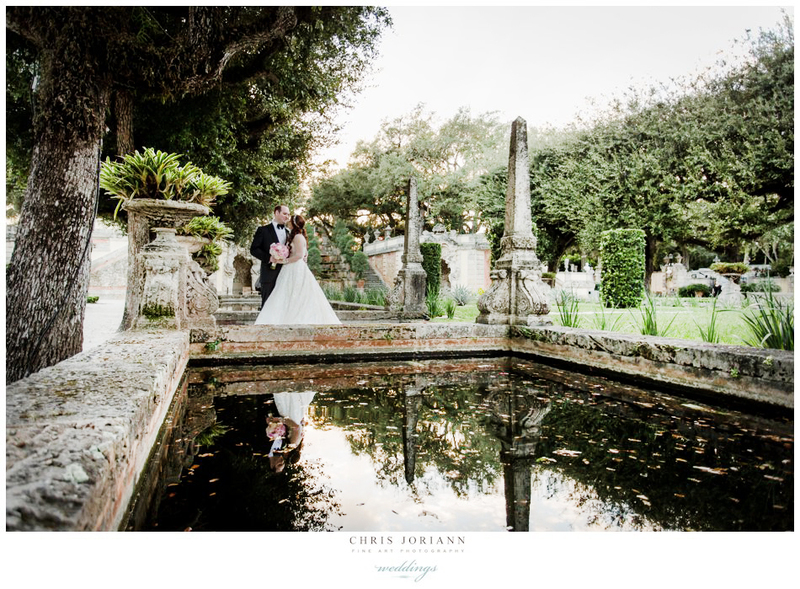 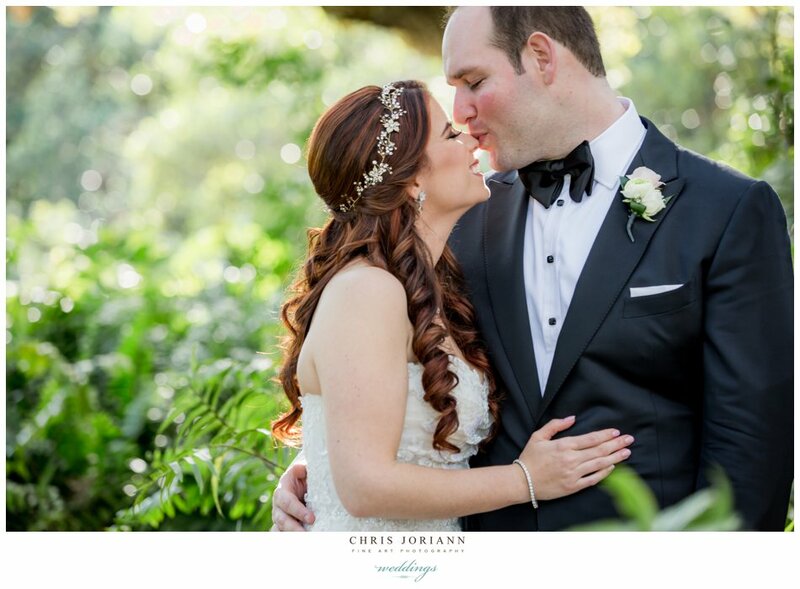 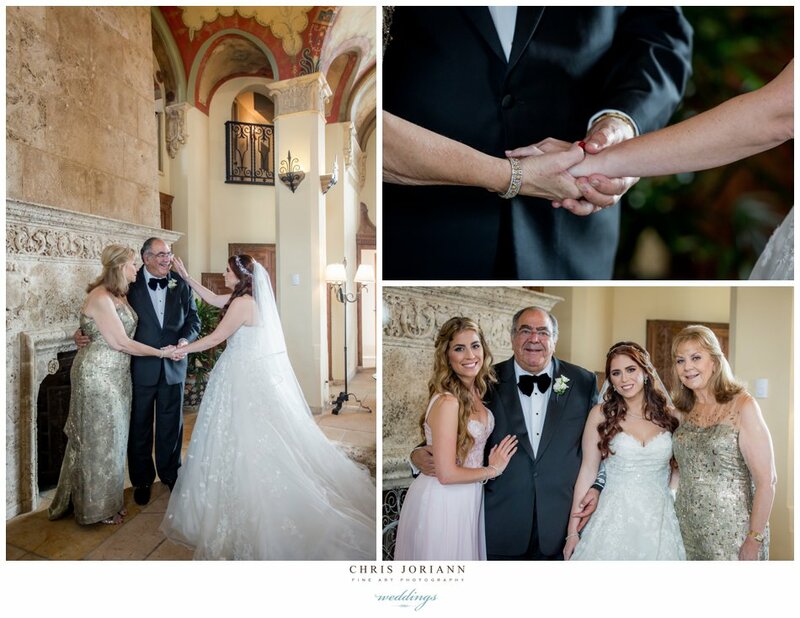 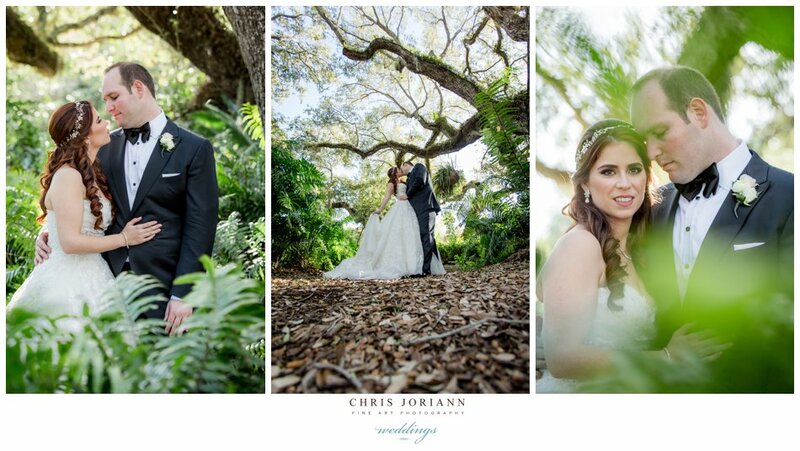 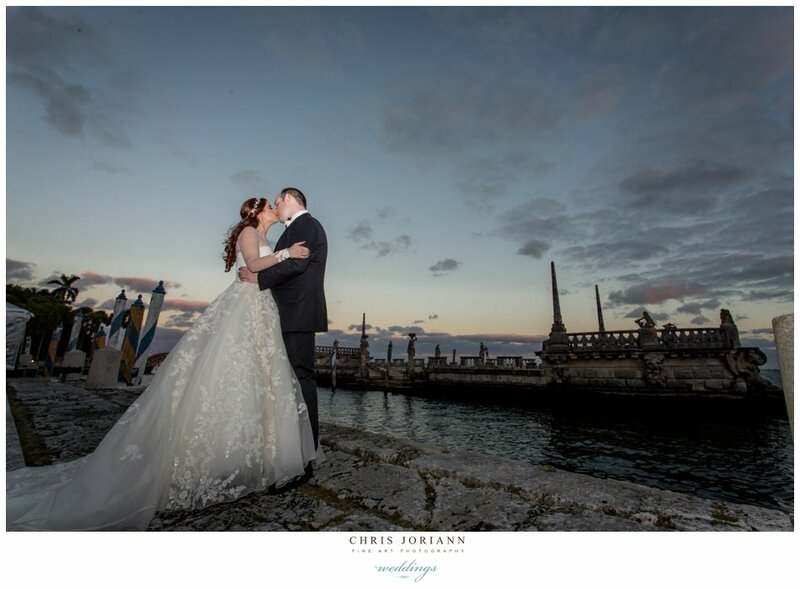 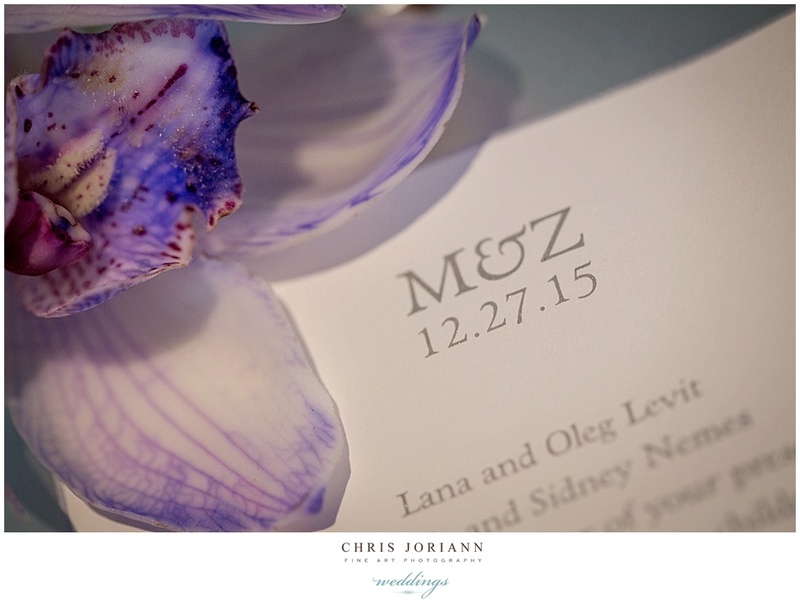 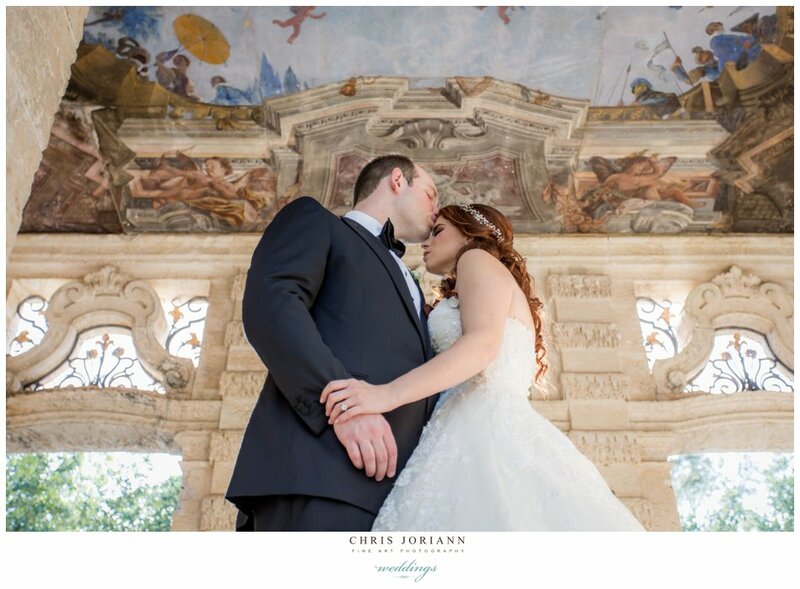 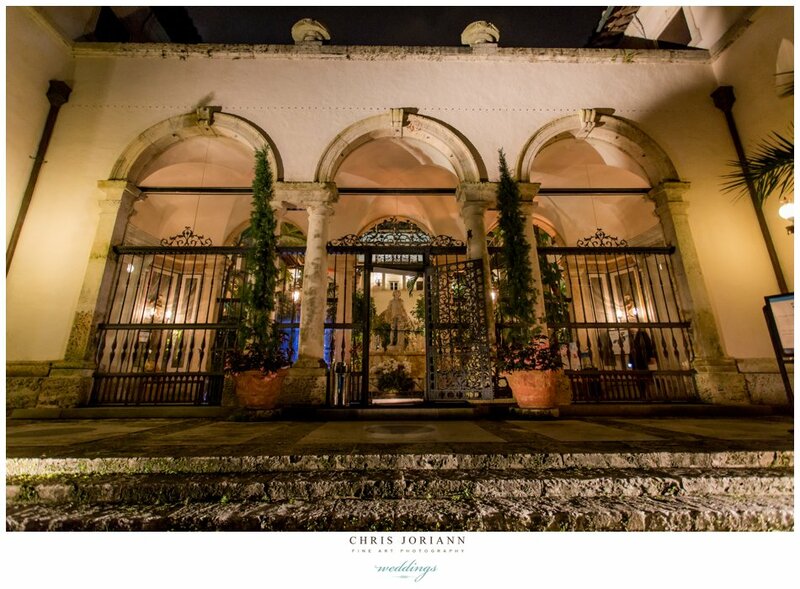 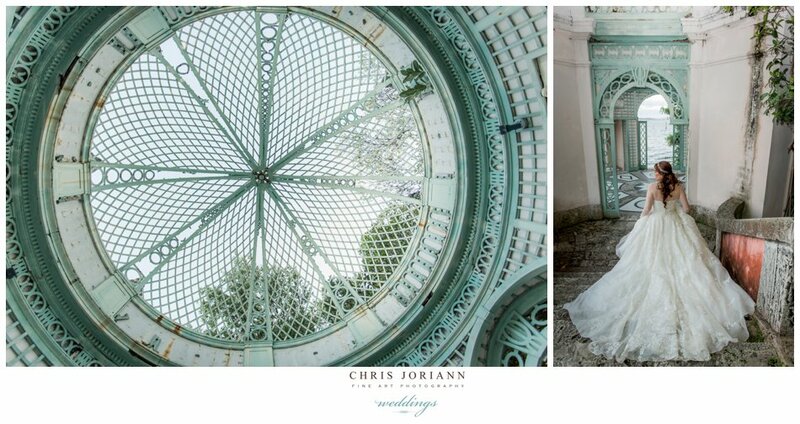 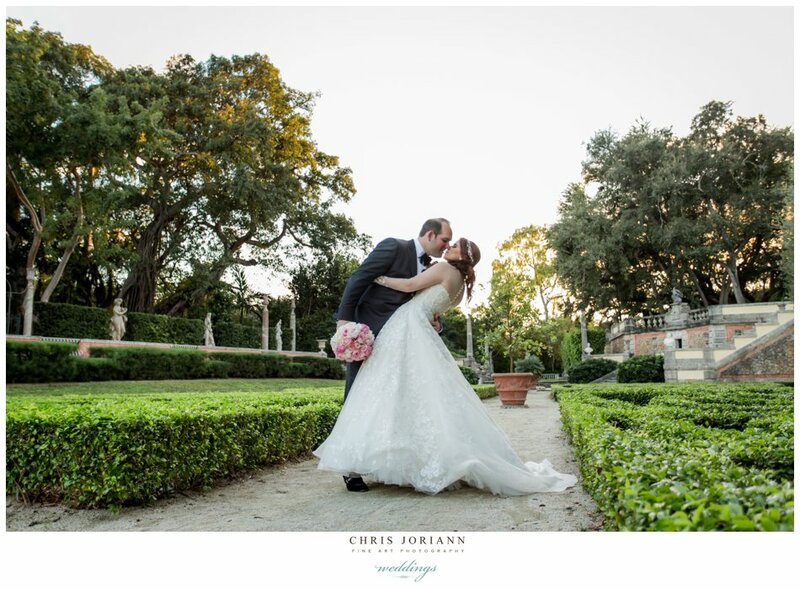 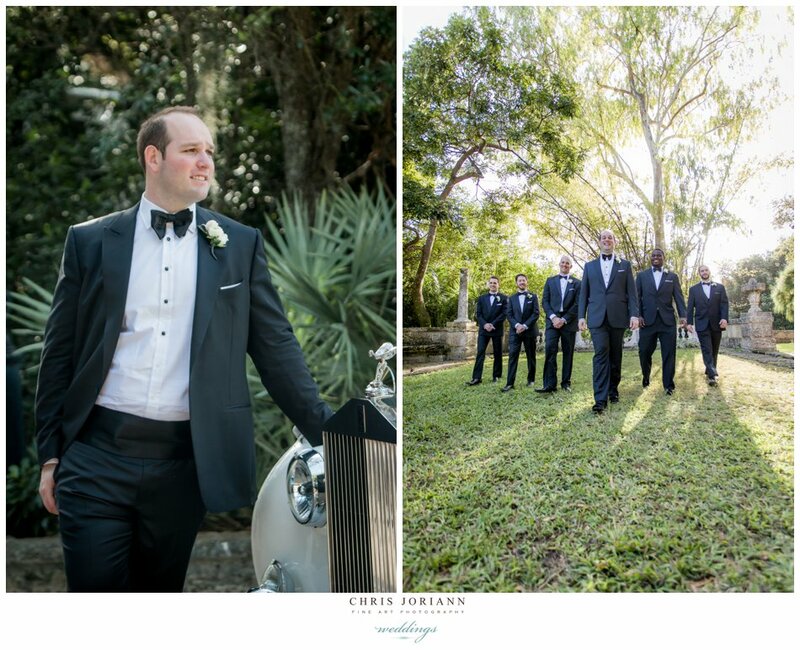 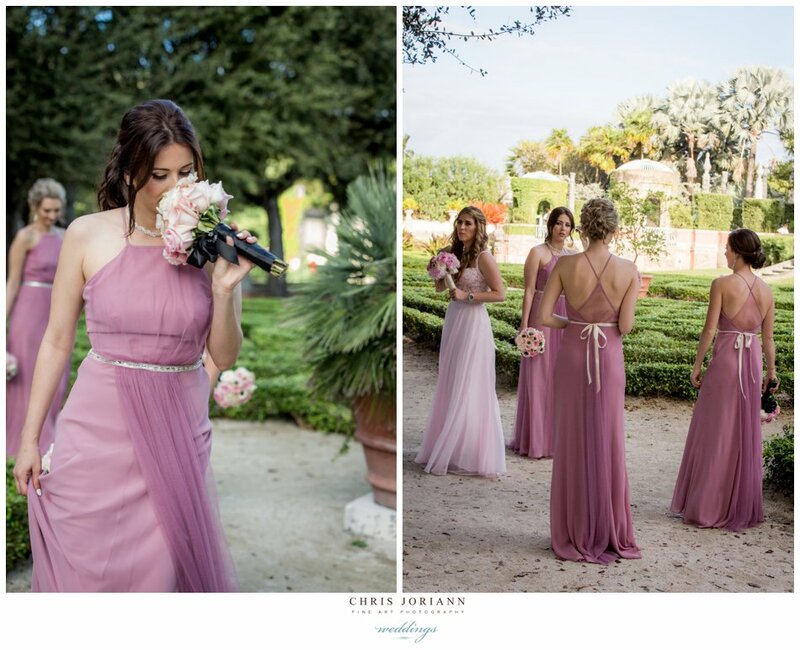 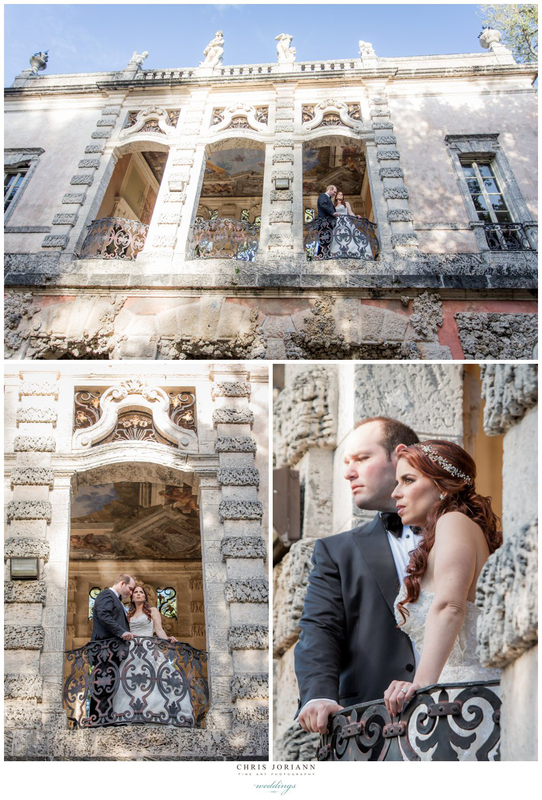 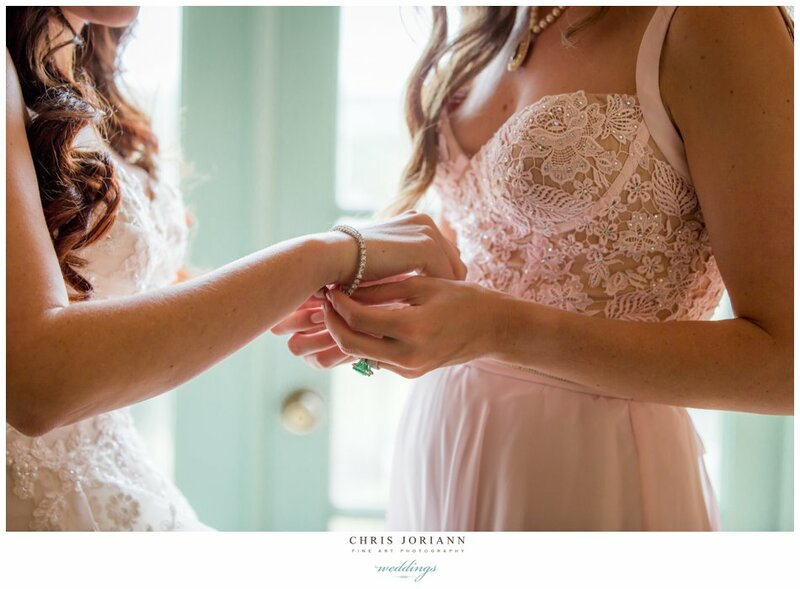 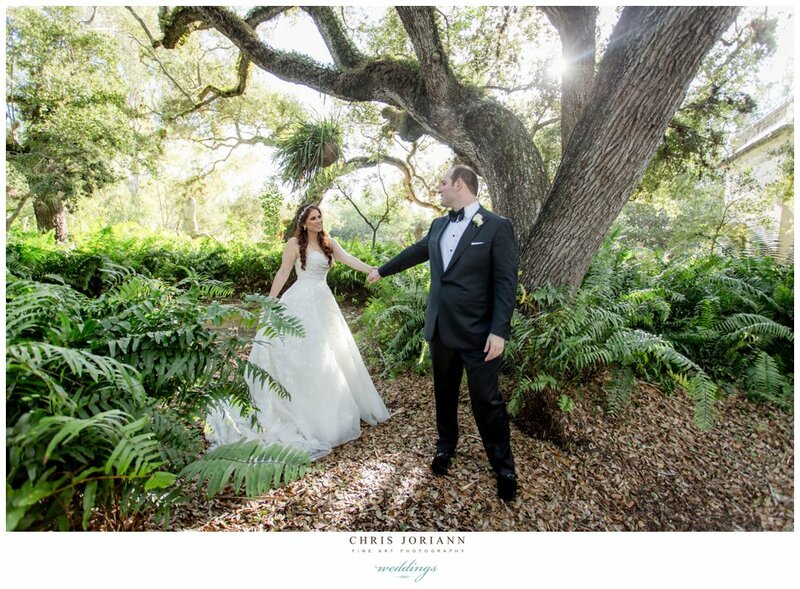 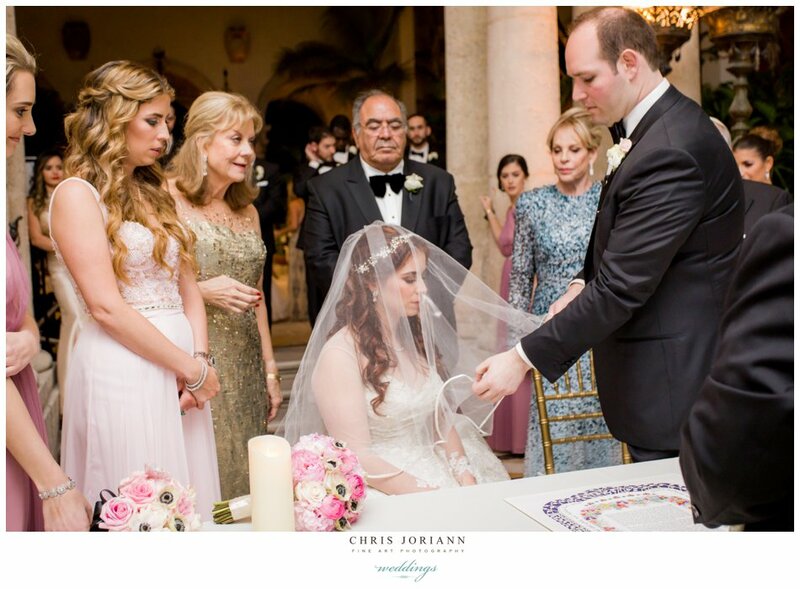 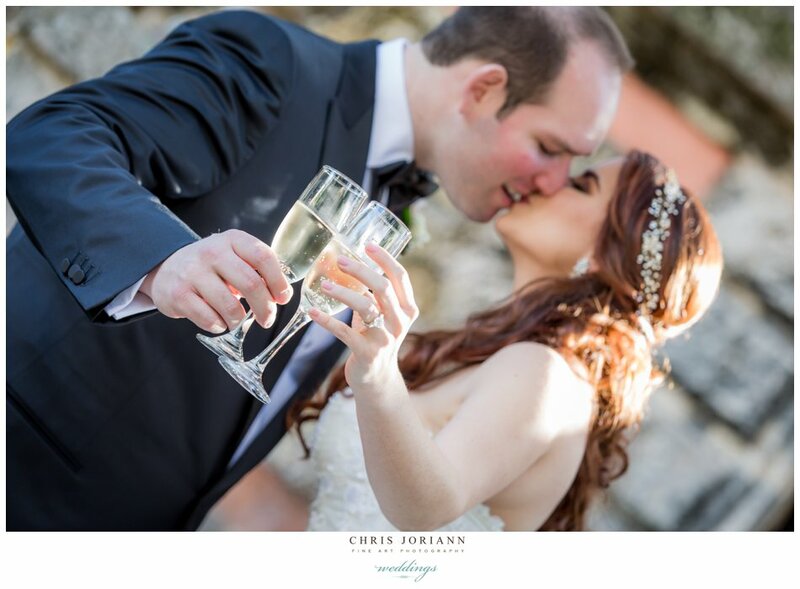 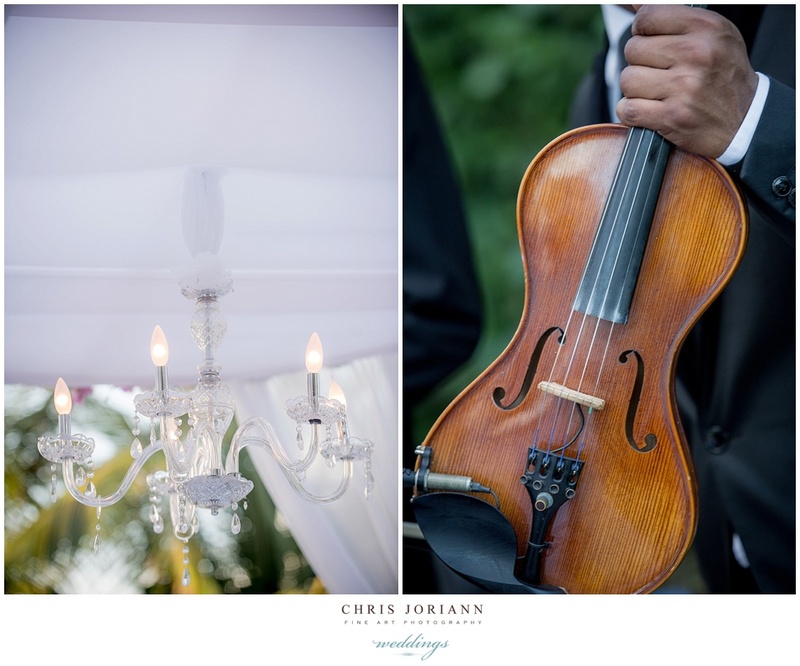 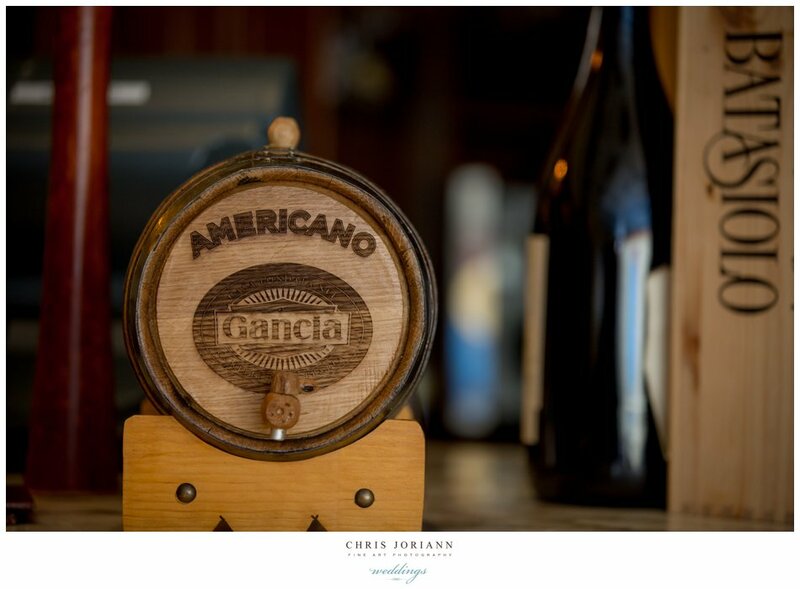 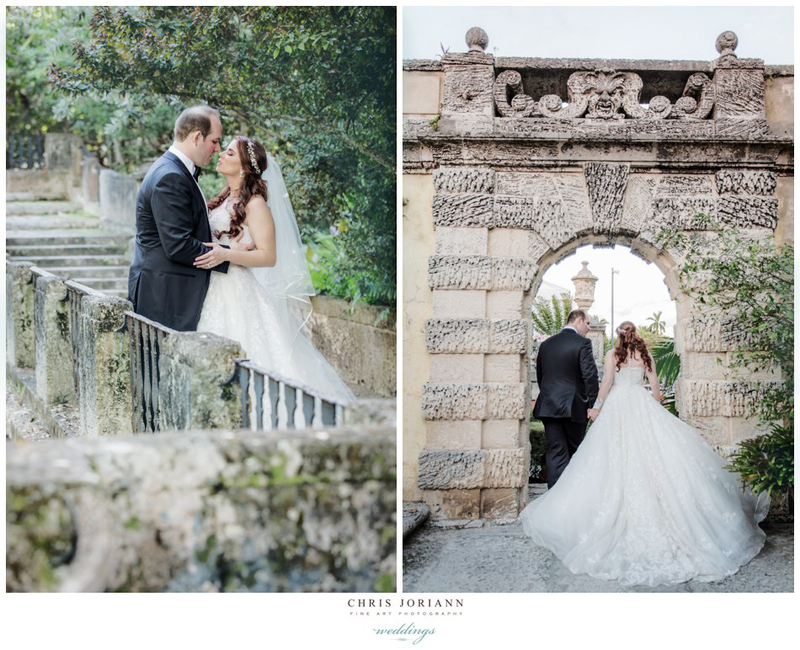 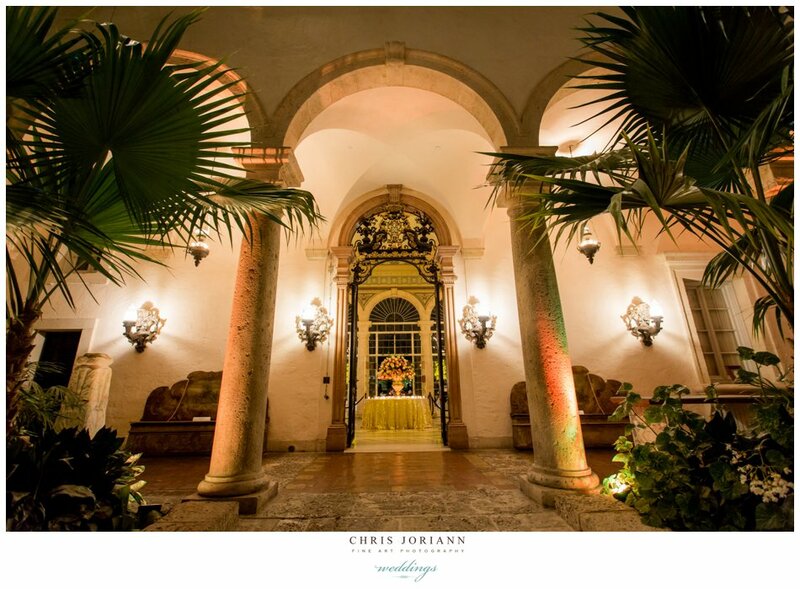 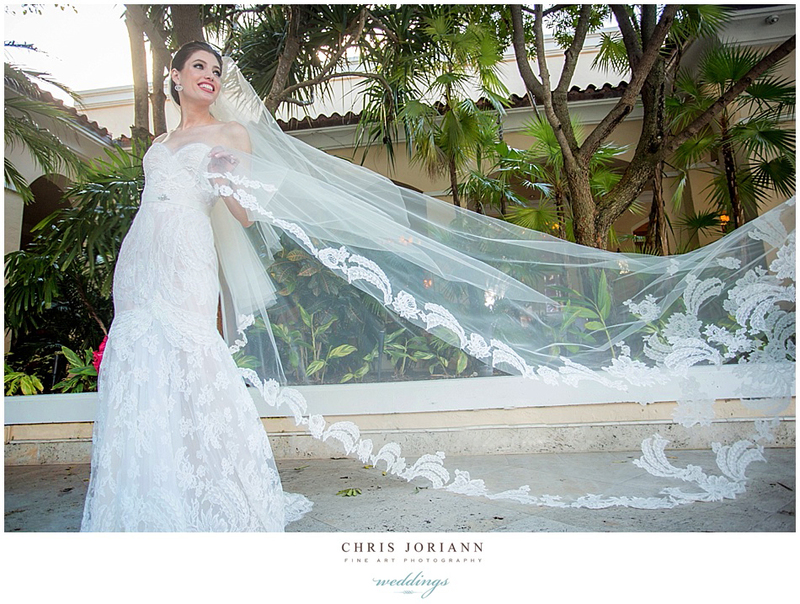 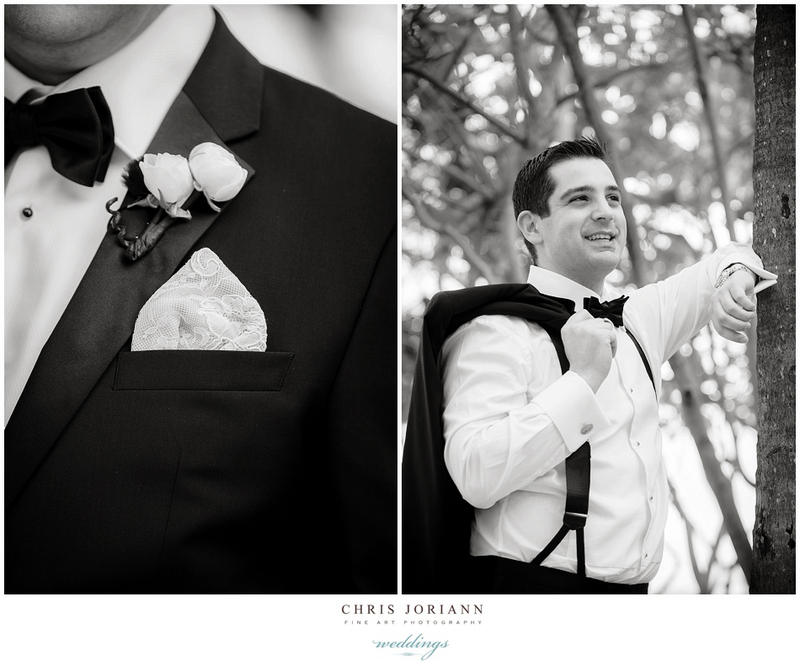 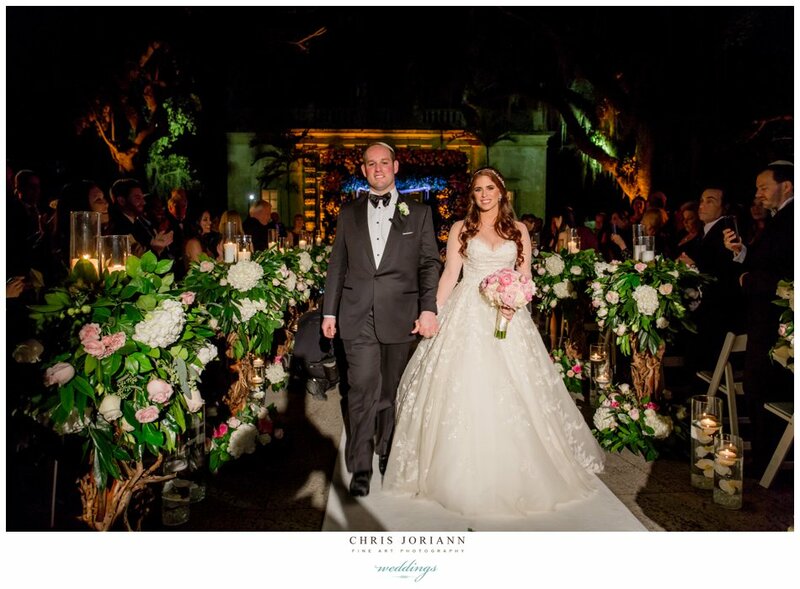 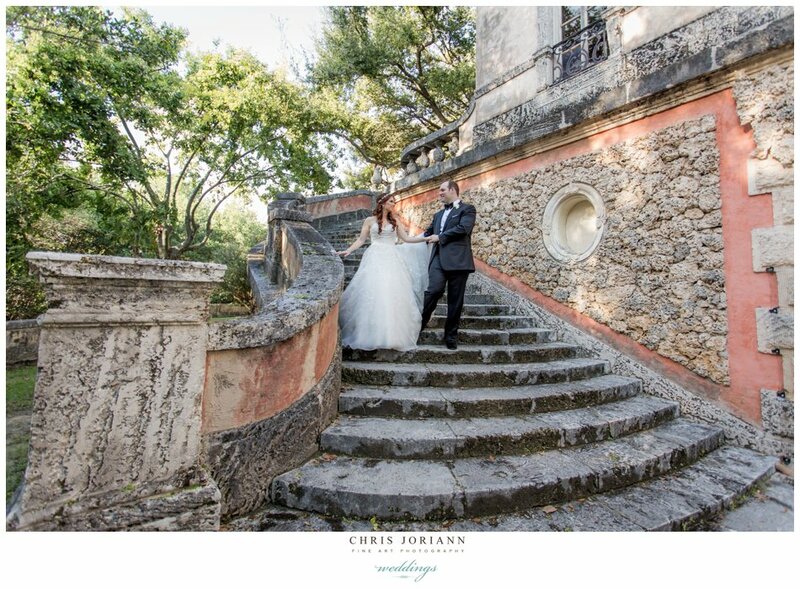 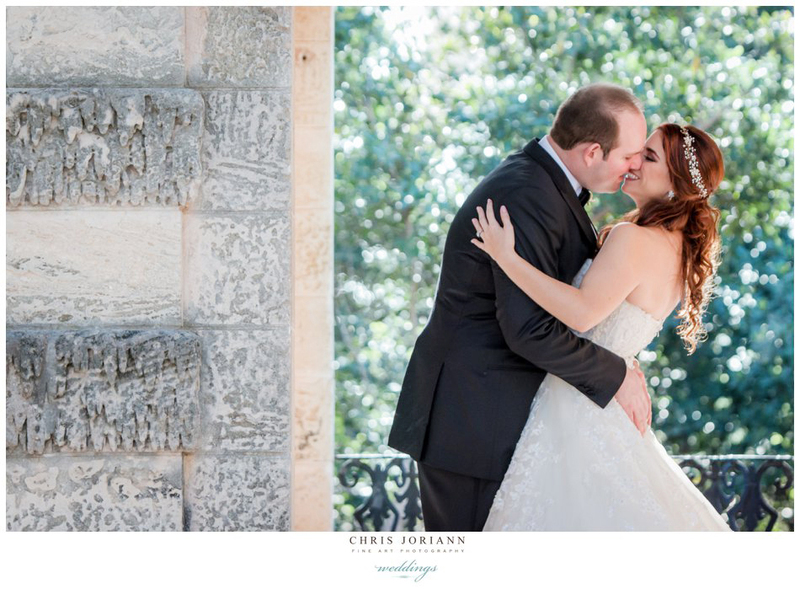 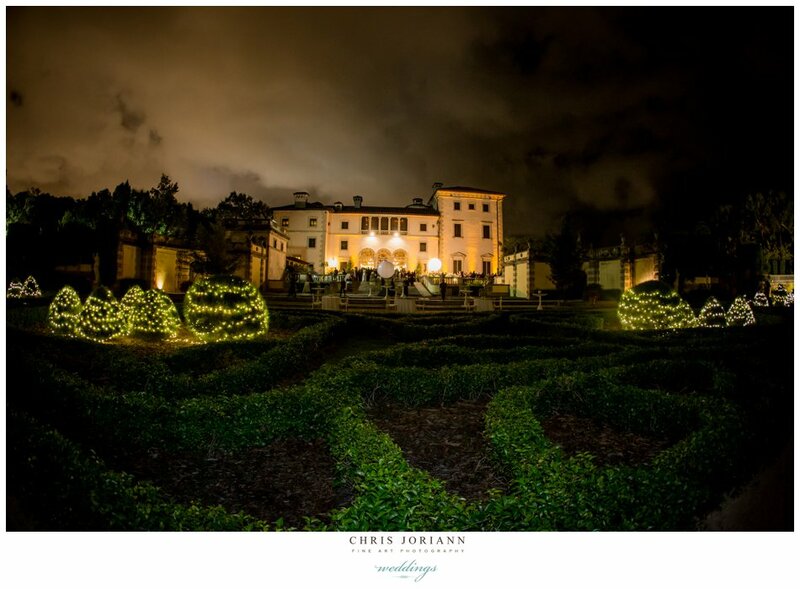 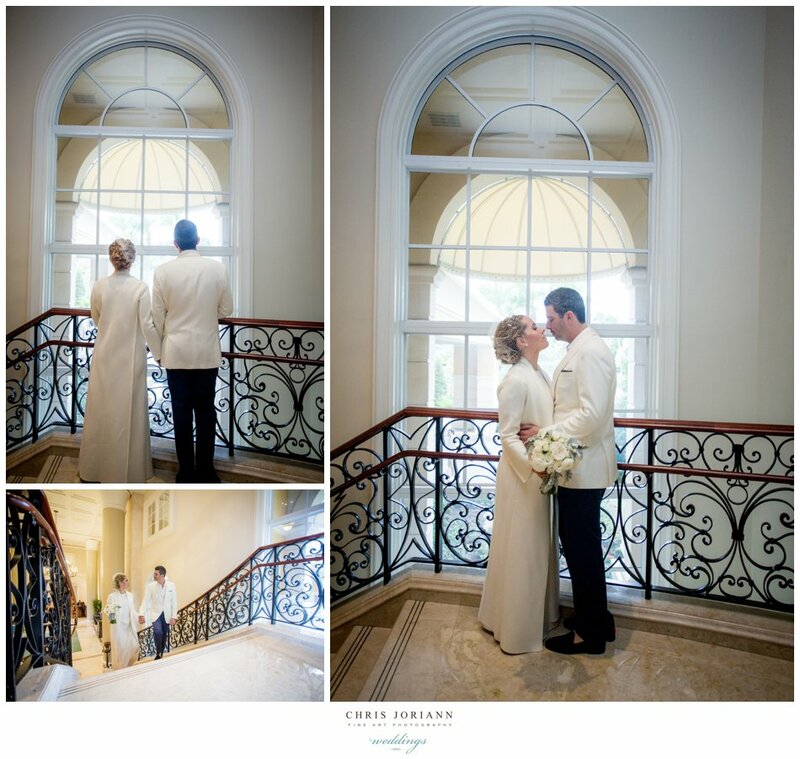 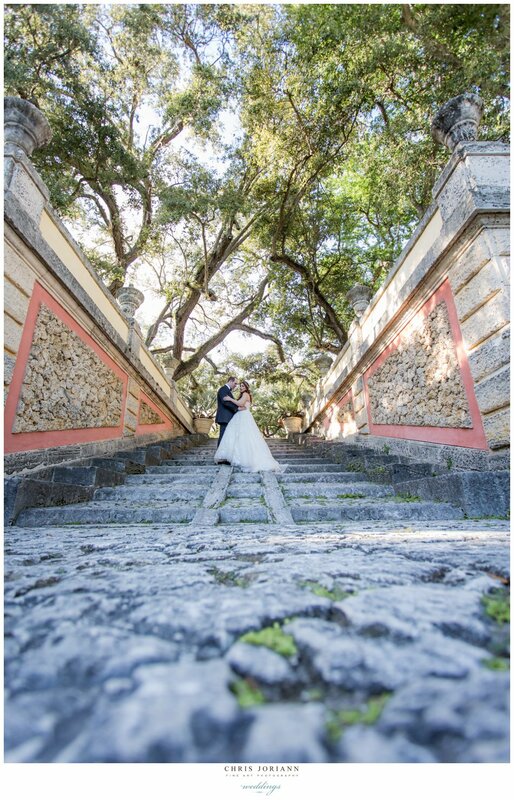 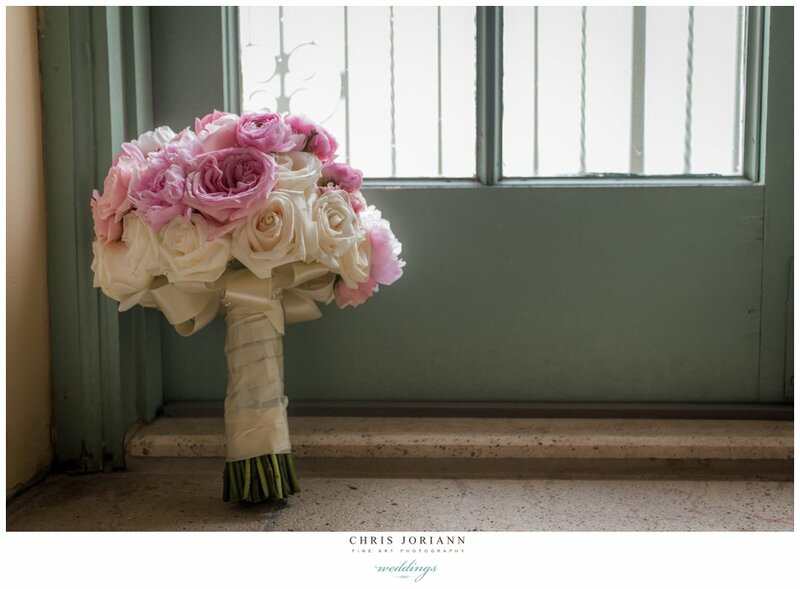 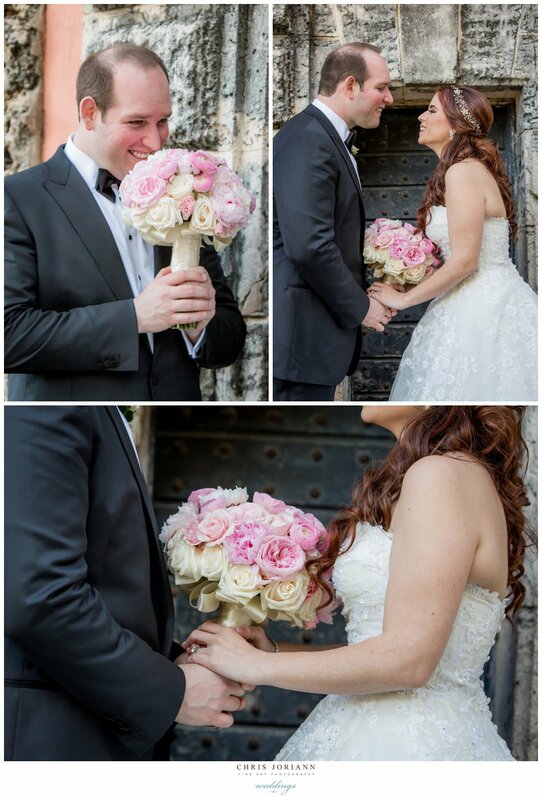 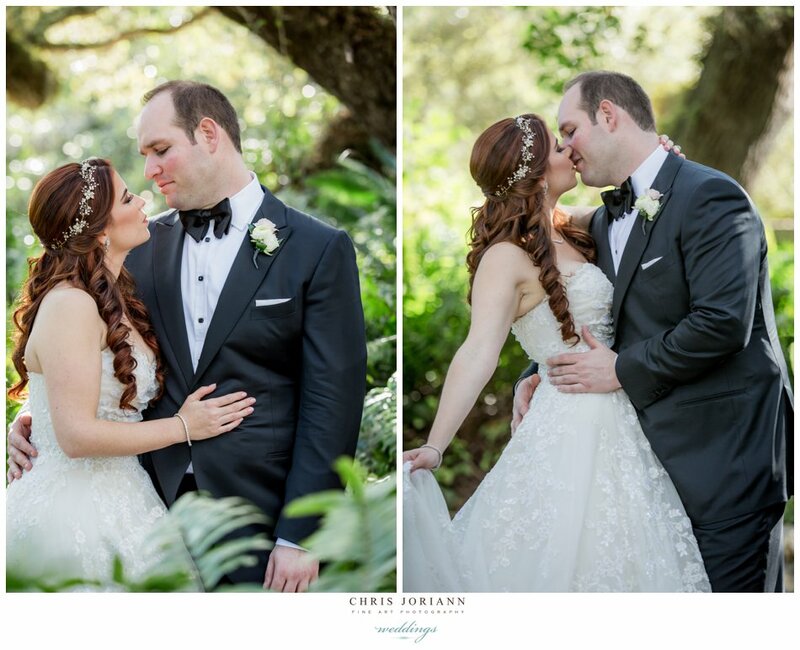 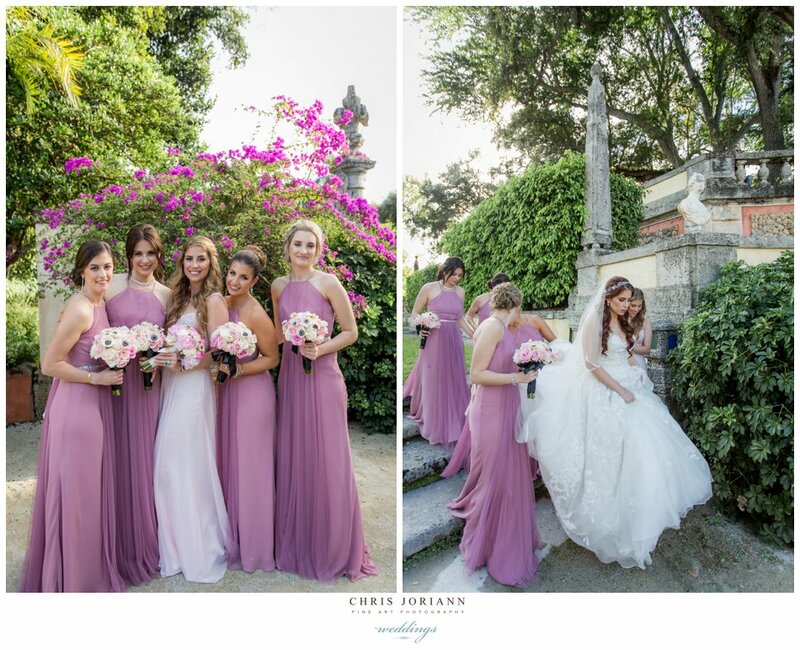 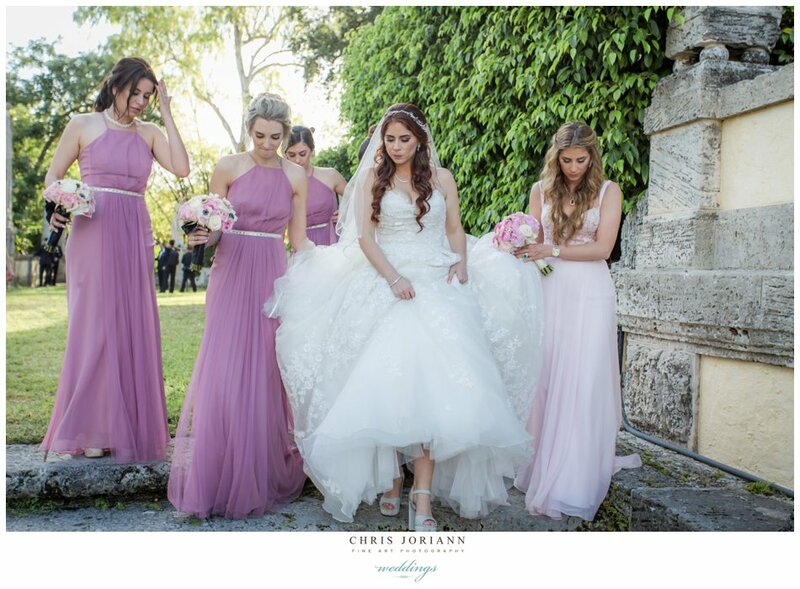 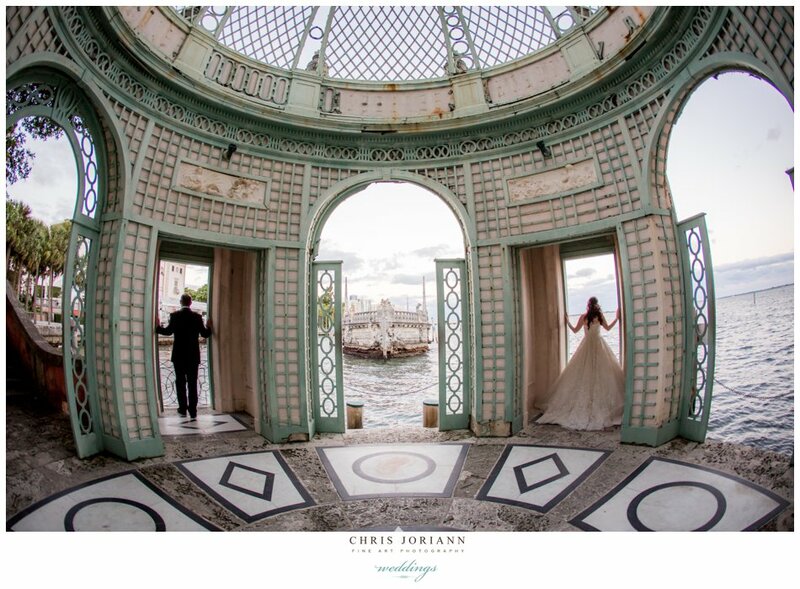 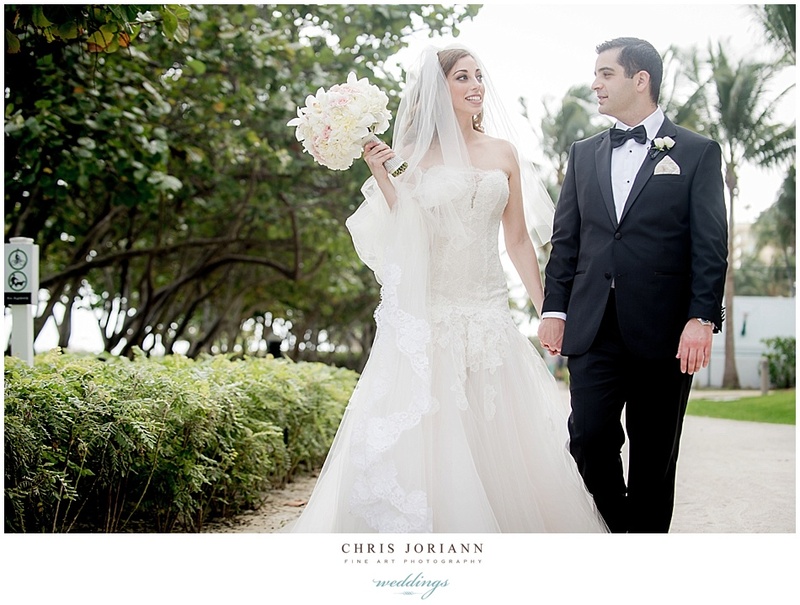 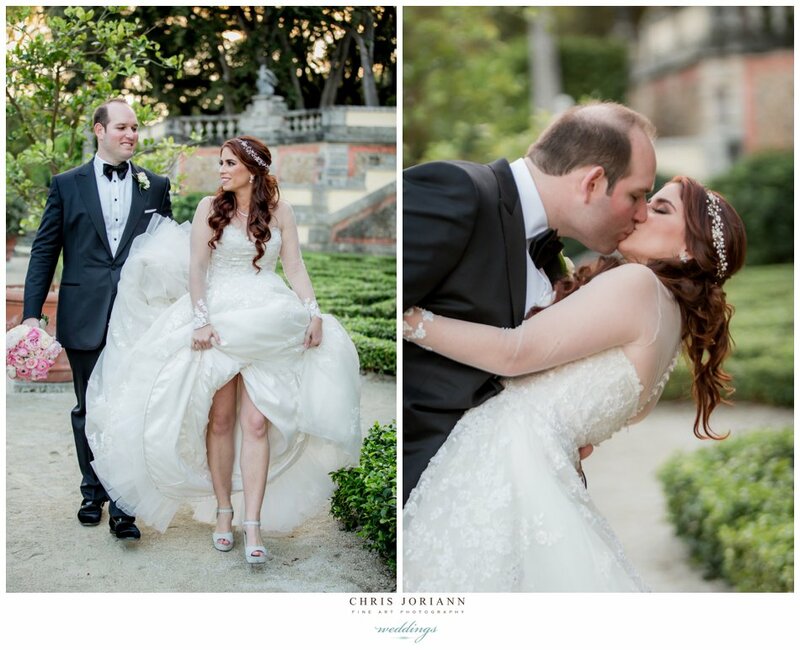 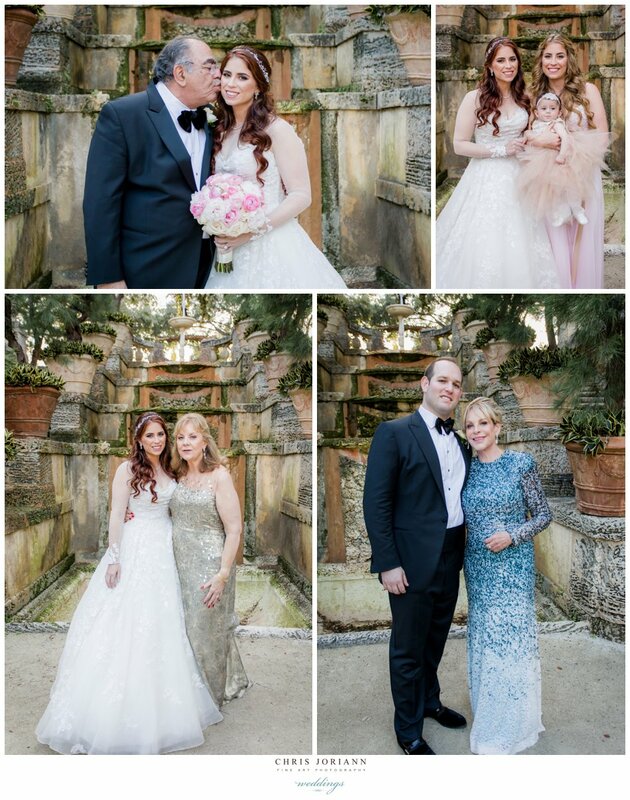 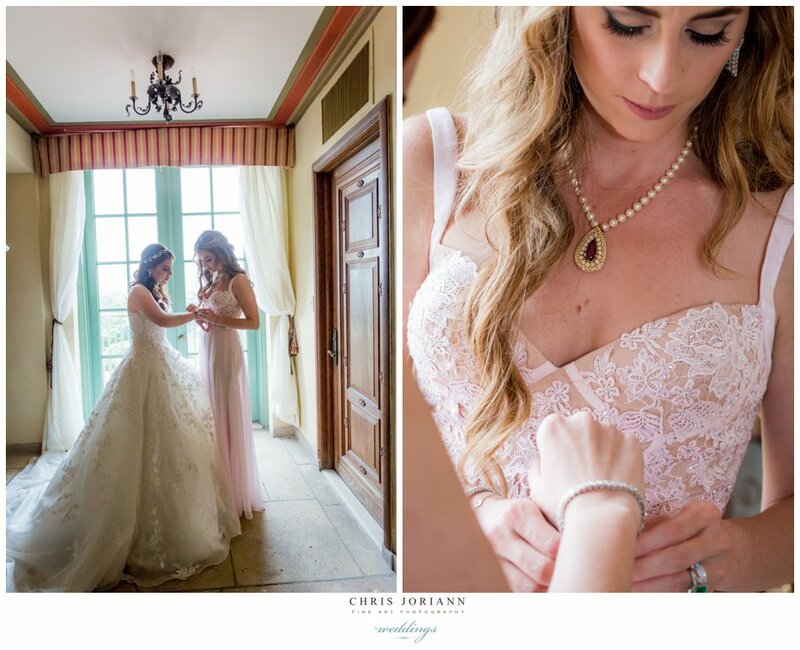 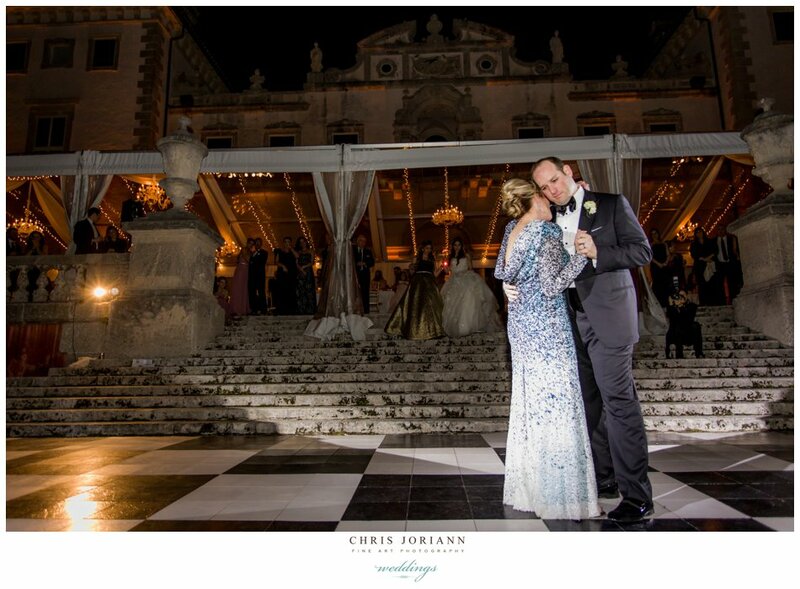 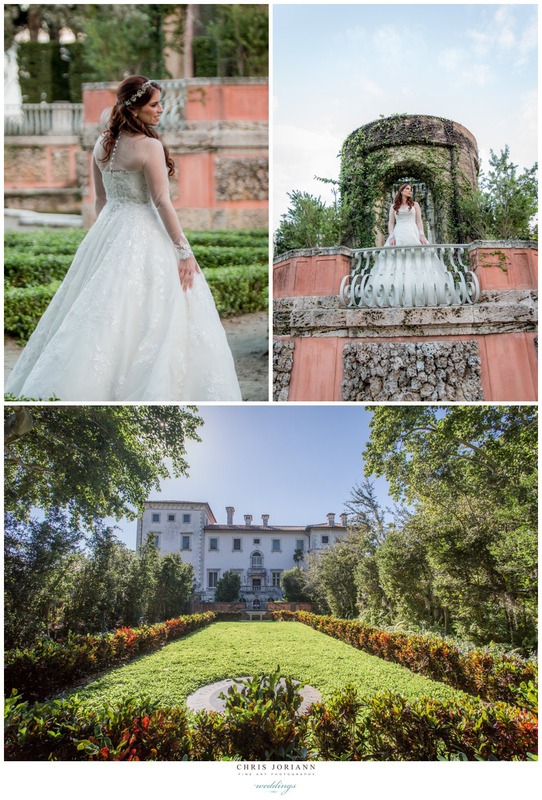 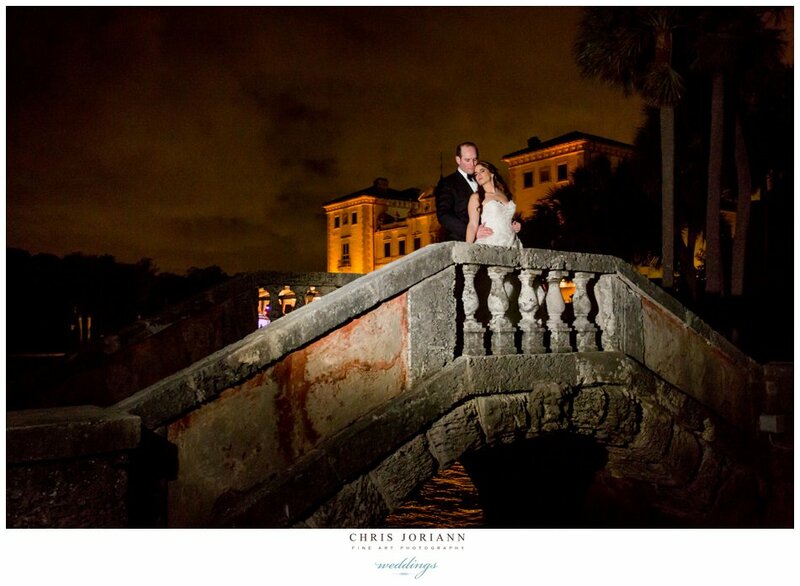 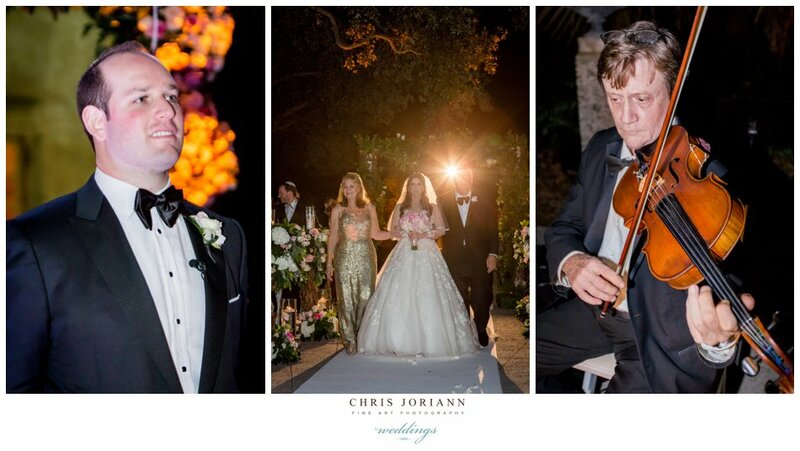 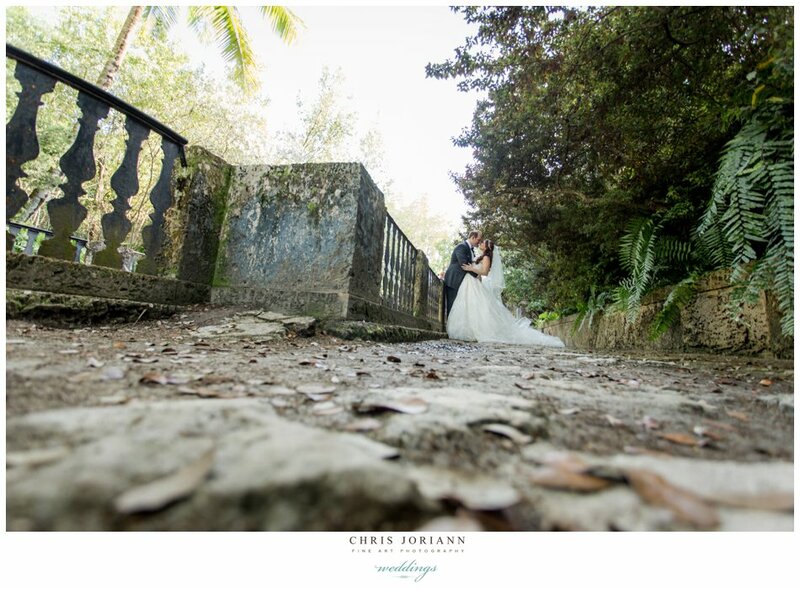 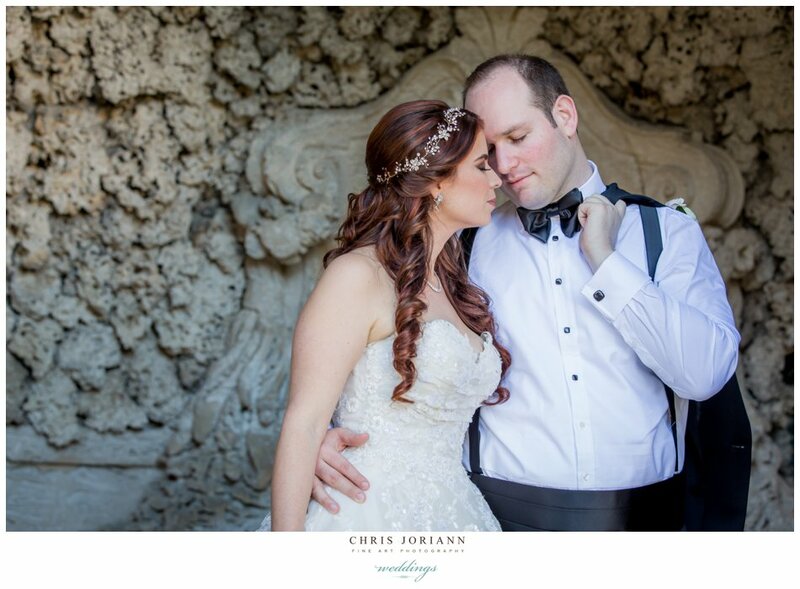 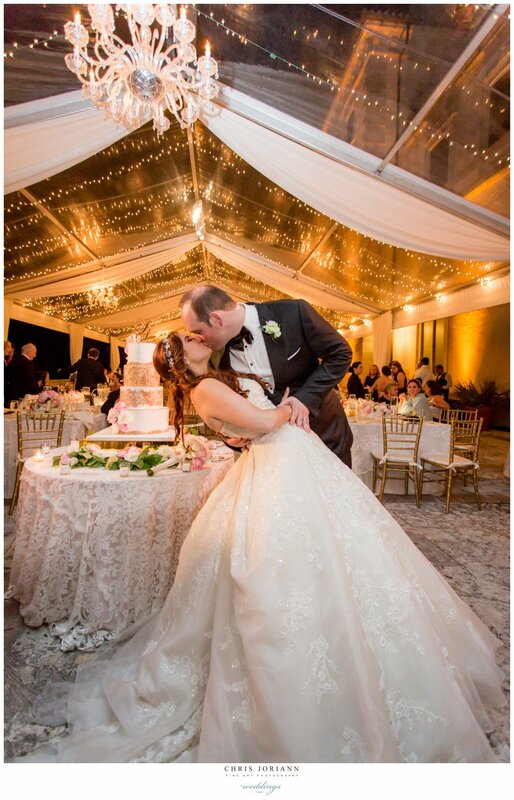 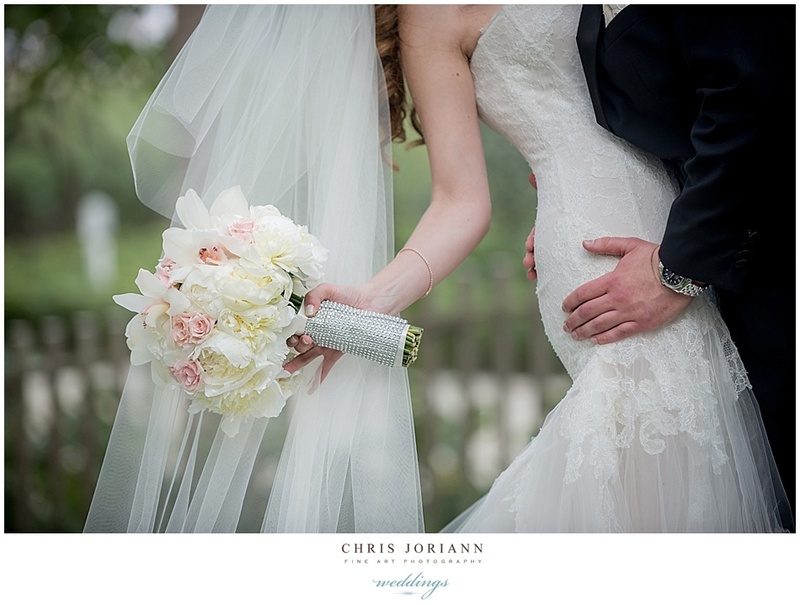 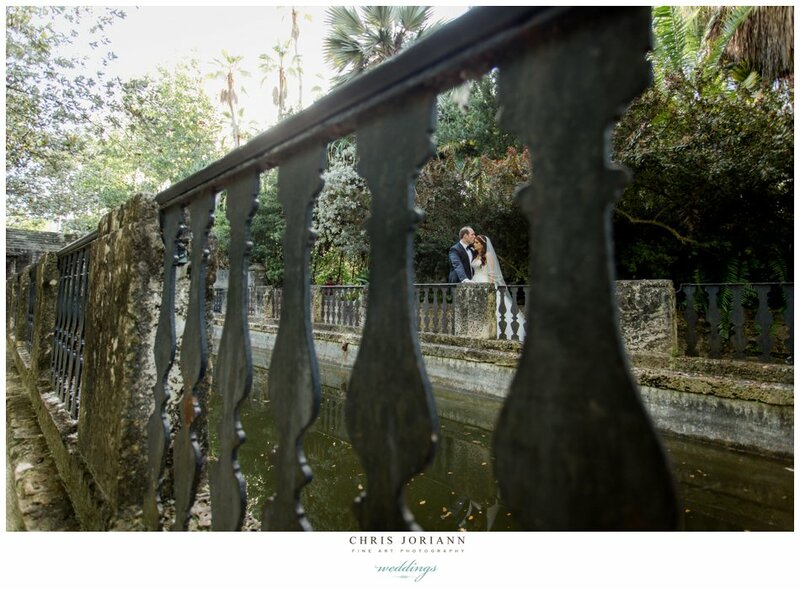 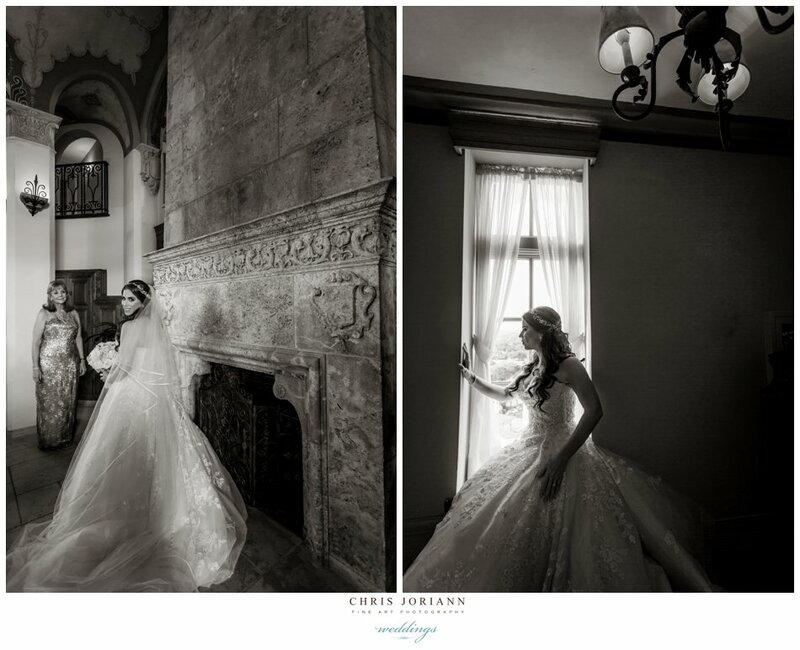 Jenny + Aaron’s spectacular Miami wedding was held at Vizcaya Museum + Gardens. 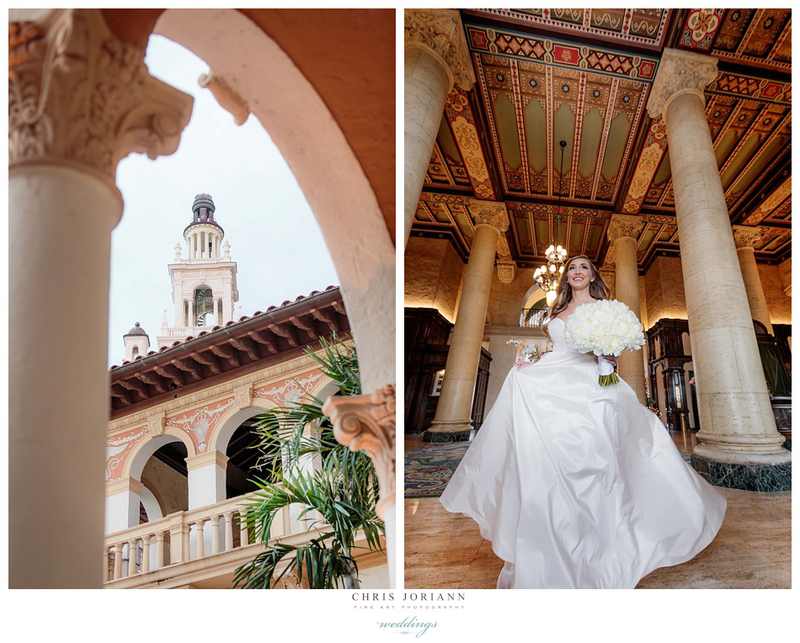 The bride readied at the nearby historic Biltmore Hotel. 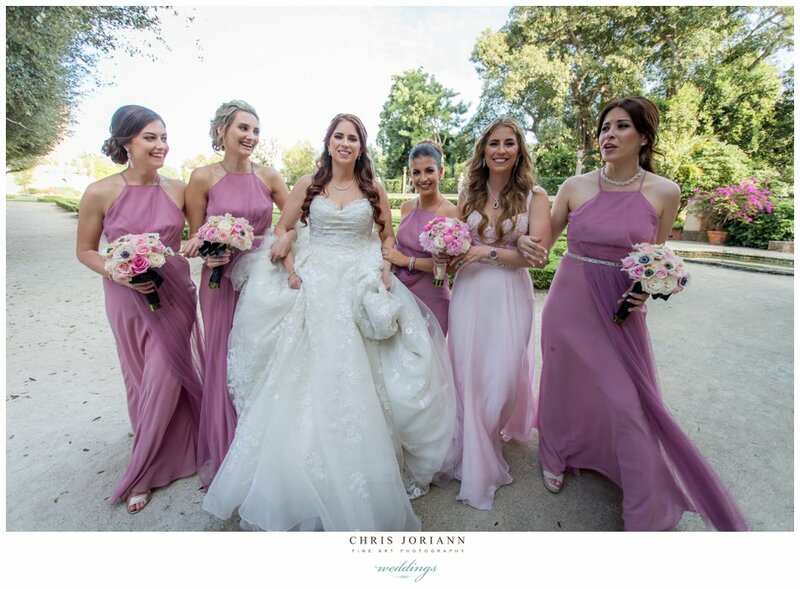 She was a vision in a embroidered lace + tulle couture gown by Zuhair Murad with bridesmaids in full length halter style mauve chiffon. 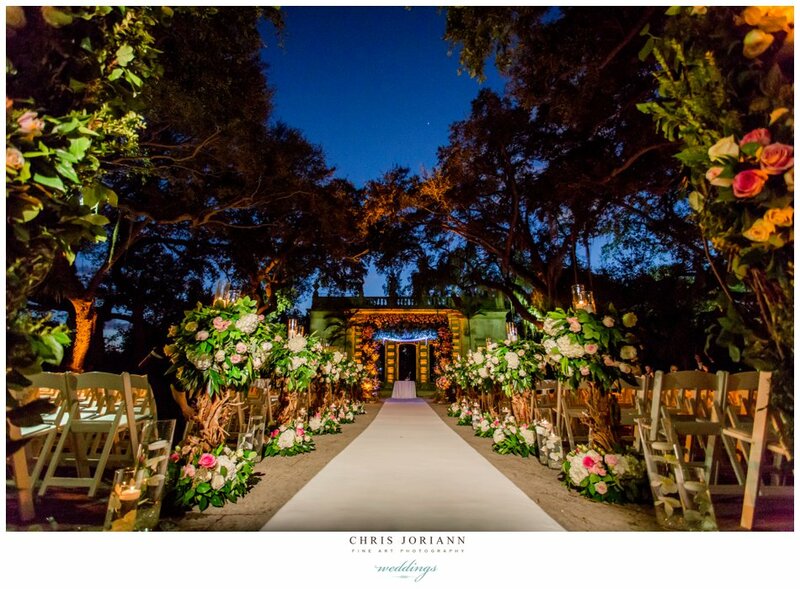 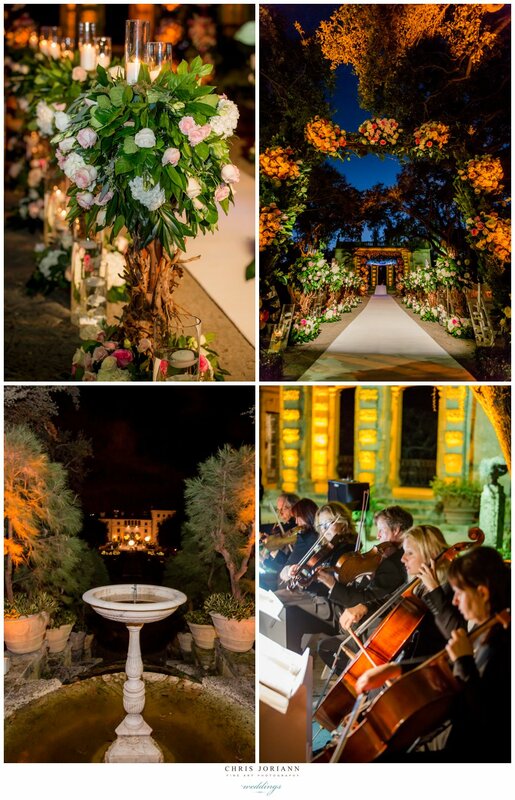 The romantic evening ceremony took place on The Mount, followed by cocktails on the veranda overlooking the magnificent gardens. 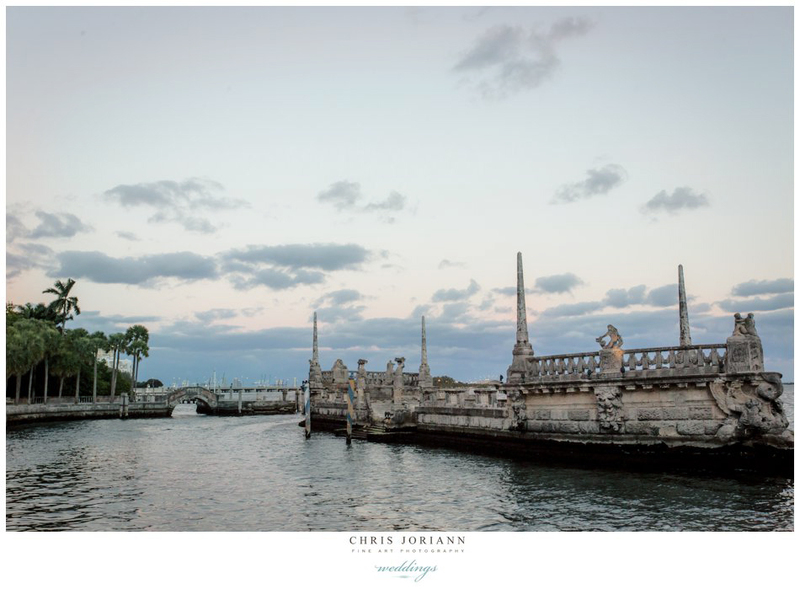 The waterfront reception was held on the museum’s rear terrace. 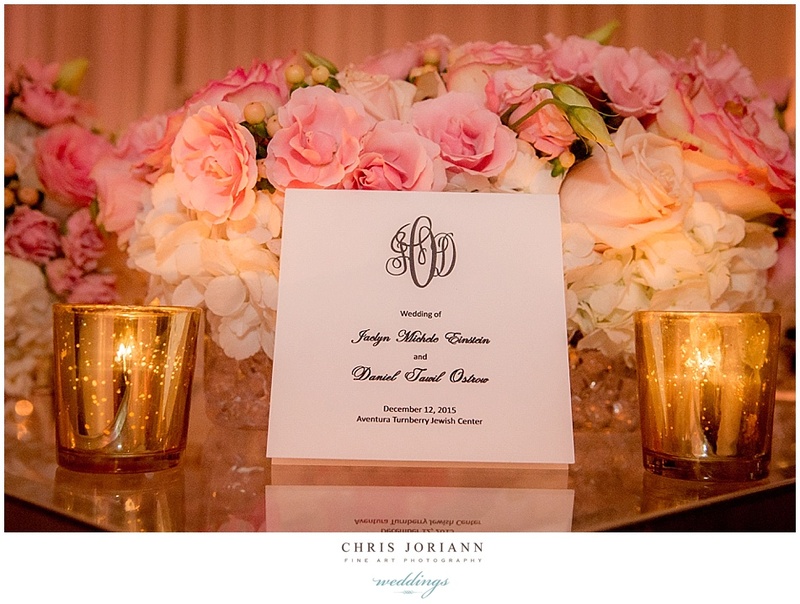 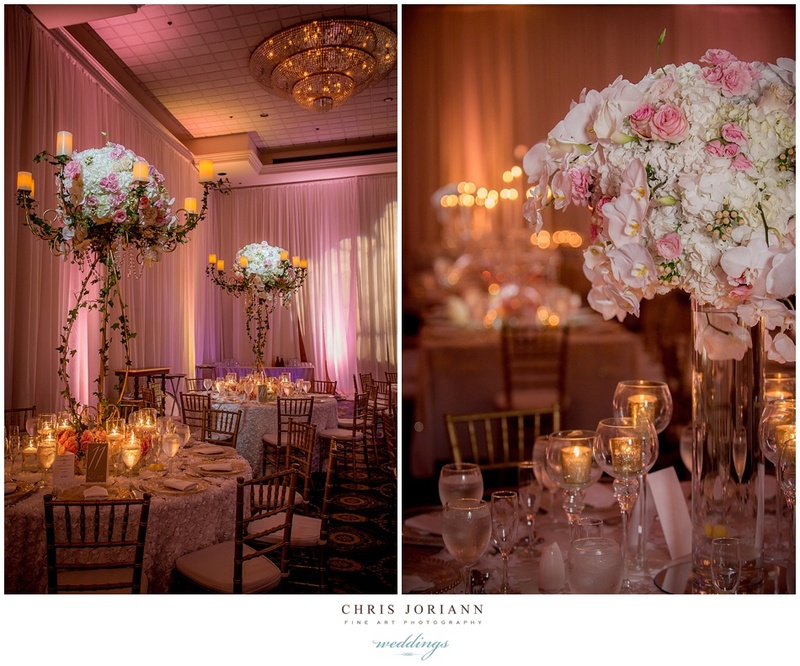 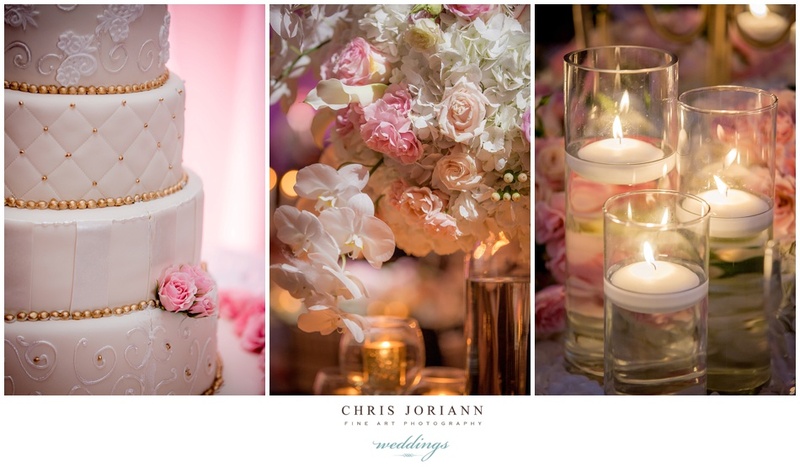 Coordinated by Jennifer Johnson for Jennifer J Events, the event featured décor + florals by EC Floral Design with popping pink, amidst a sea of white and gold, and Lighting Design by Illumene. 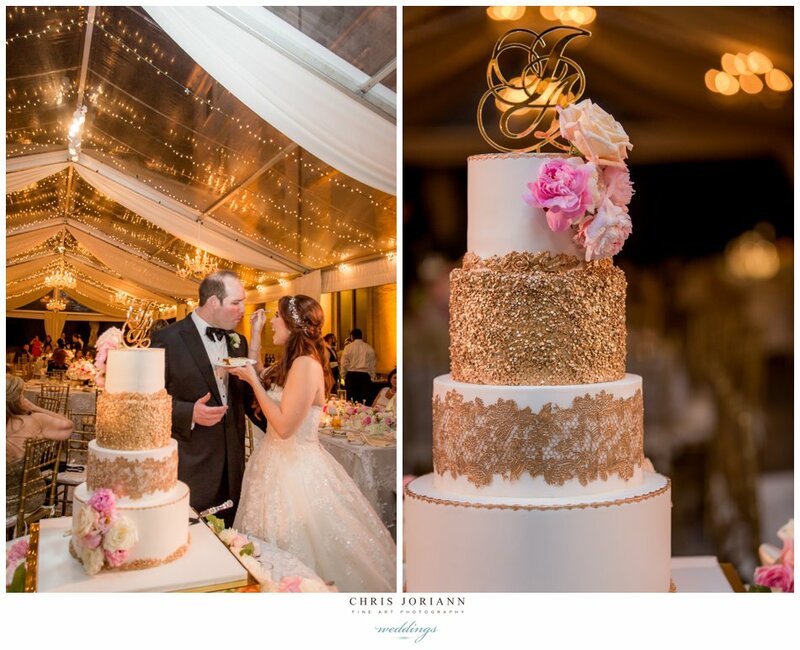 In the center of it all, a stunning 4 tier ivory cake featuring gold lace filigree by Earth + Sugar. 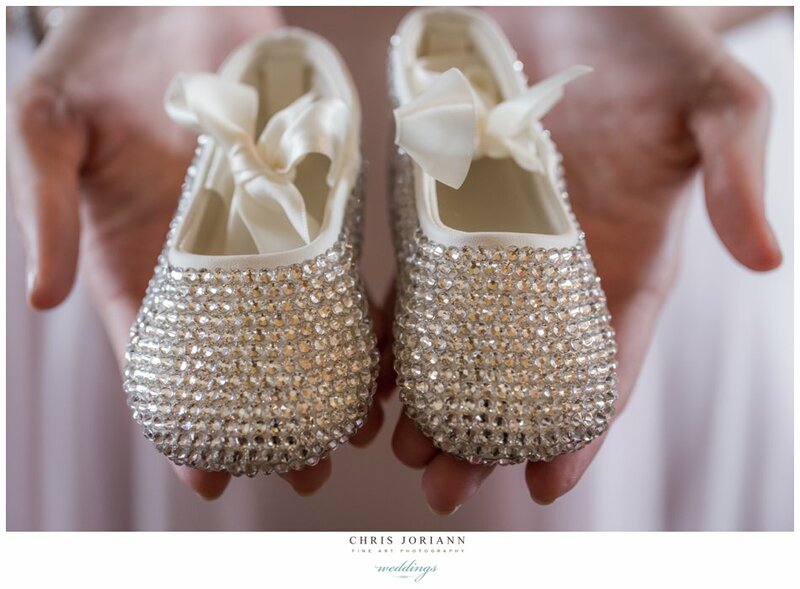 We are so excited to have recently launched our Posh Tots division, covering luxury bebé showers, maternité, and newborn sessions, as well as “a year in a life” collections!!! 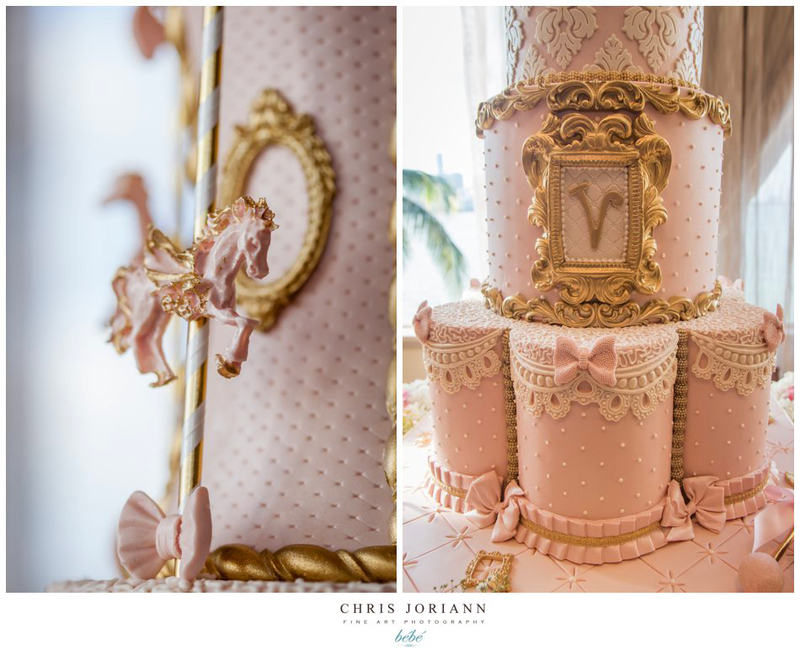 Janet’s bebé shower, welcoming Princess Victoria, was worthy of royalty. 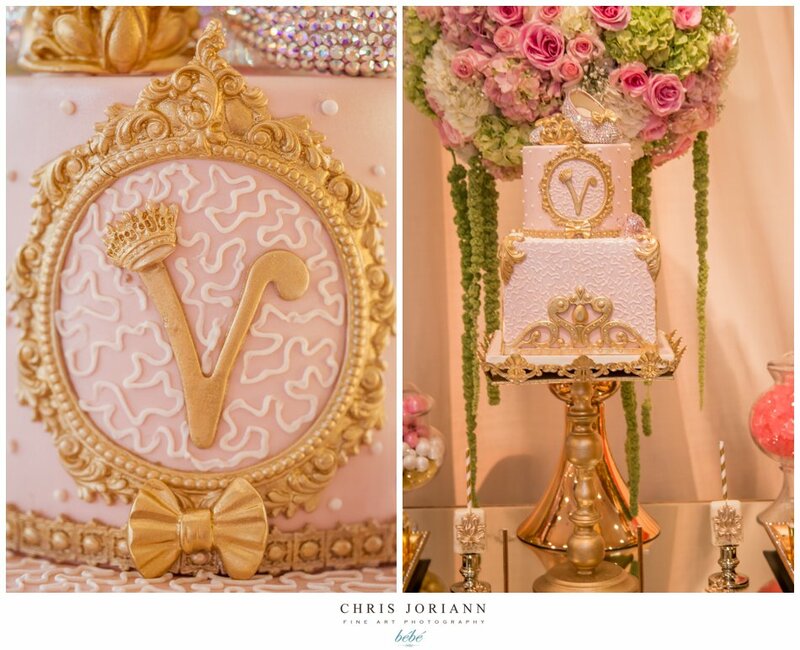 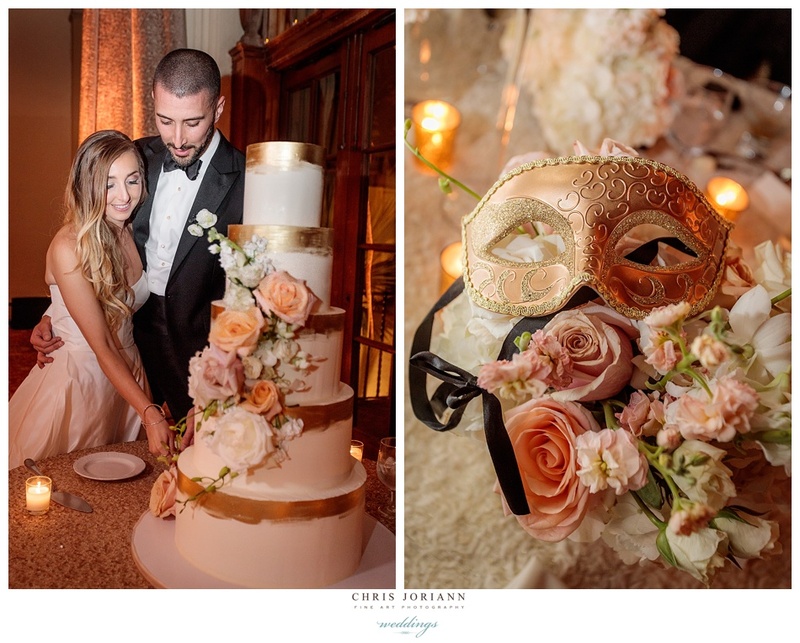 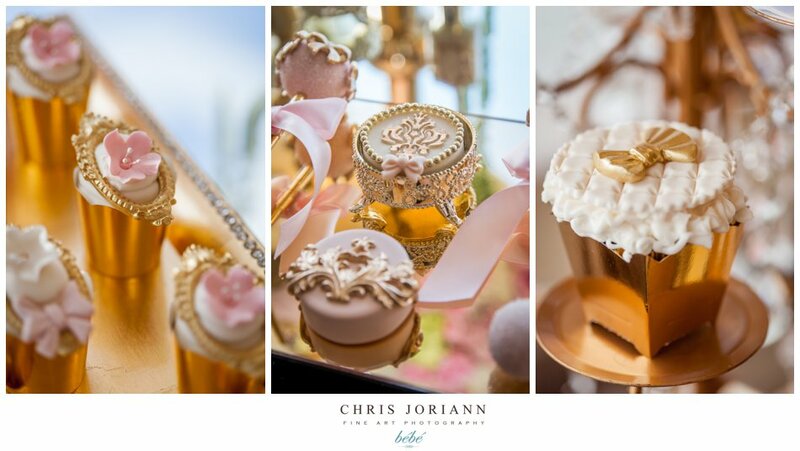 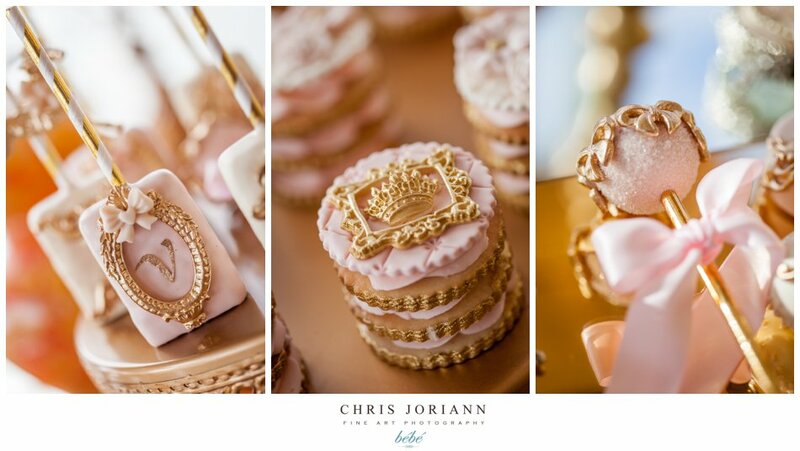 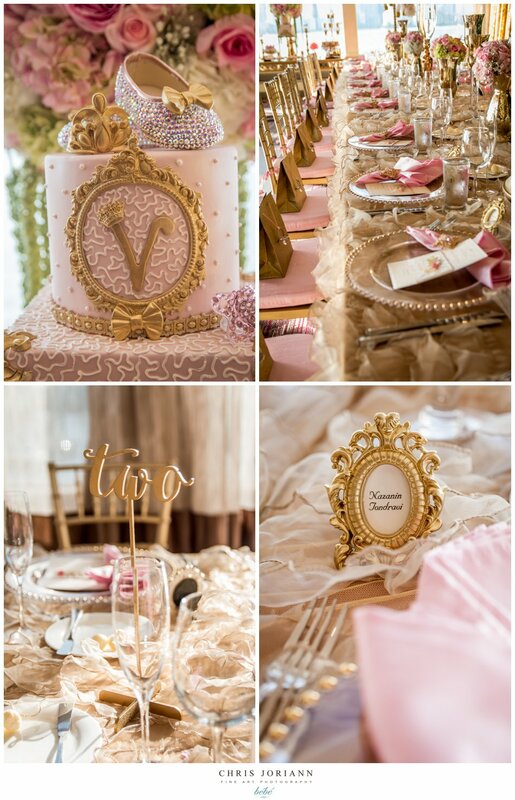 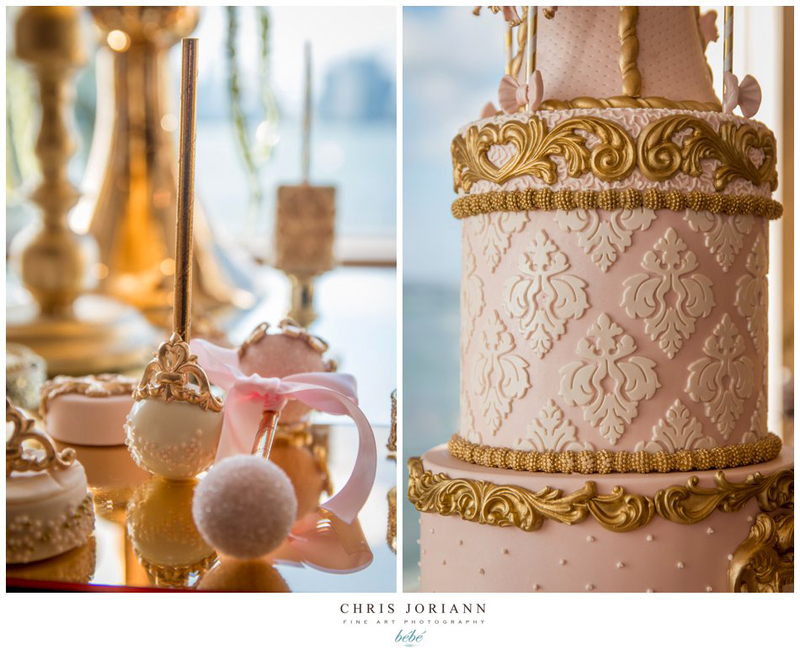 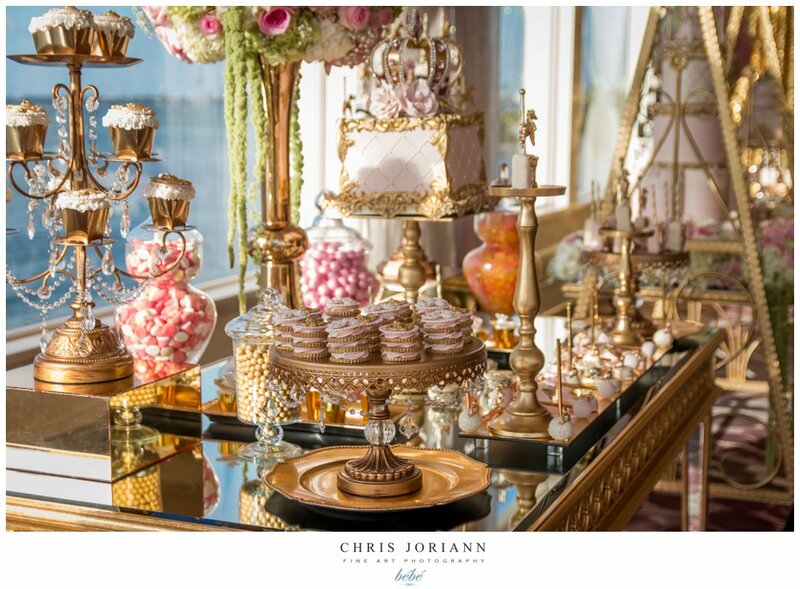 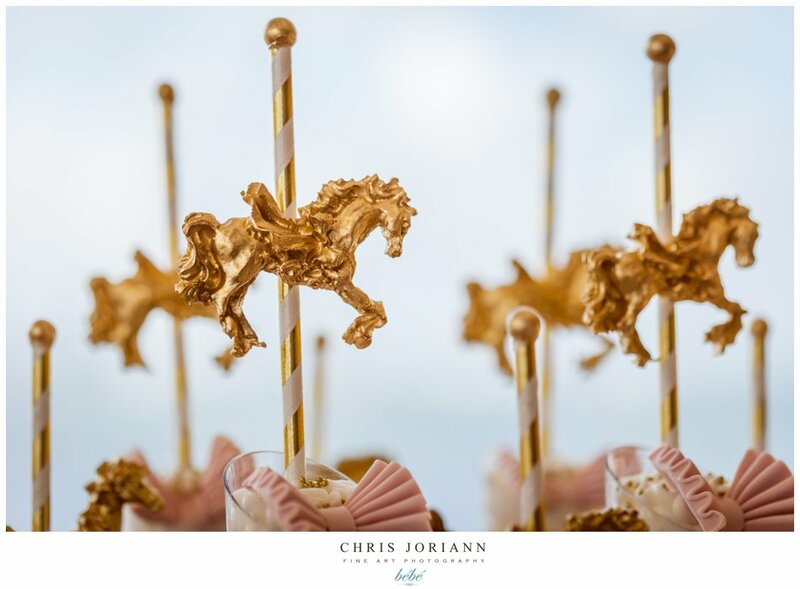 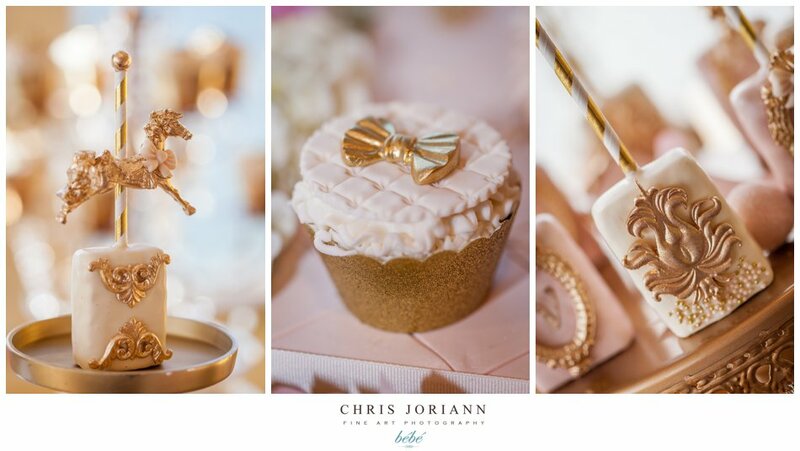 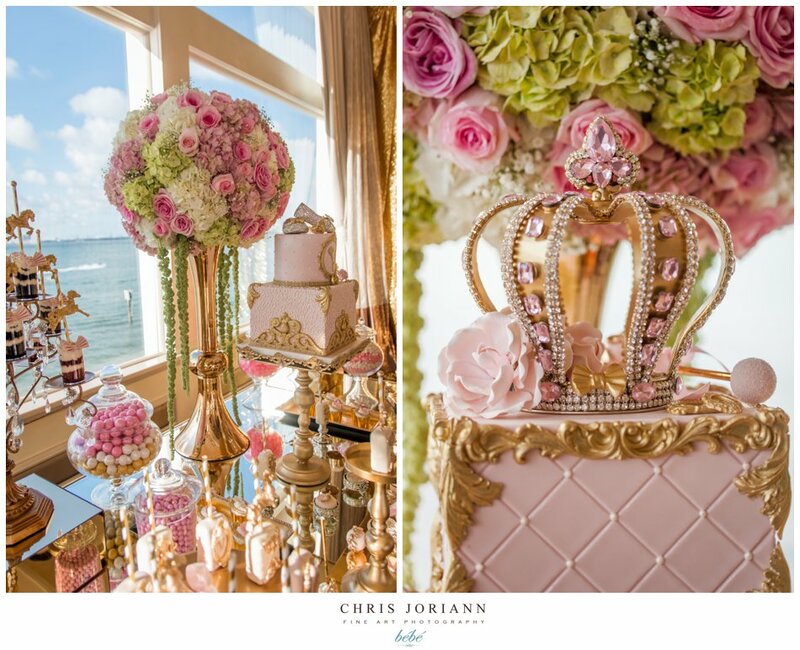 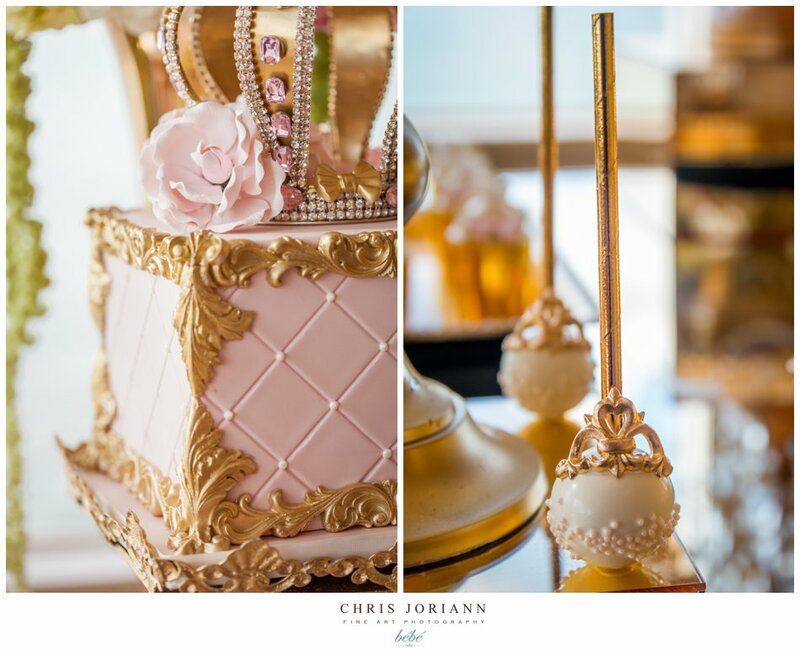 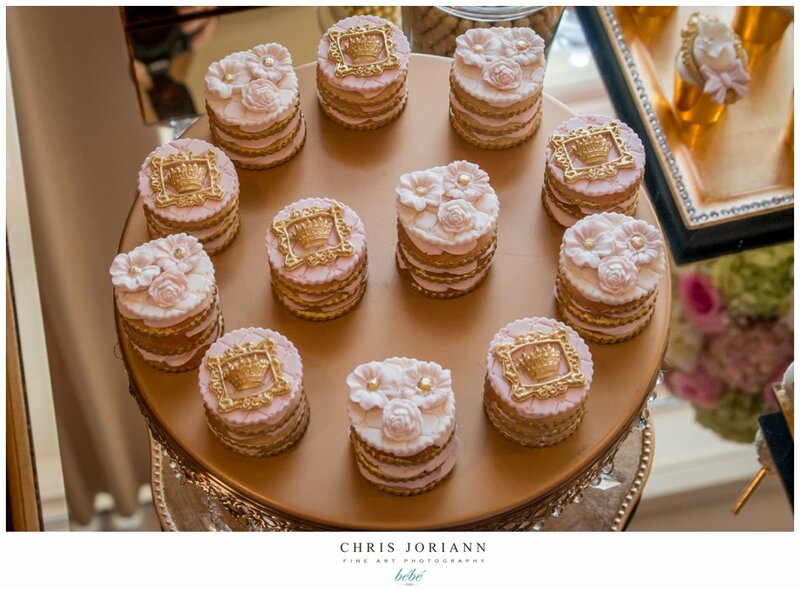 The 14k gold and blush palette, incorporated crowns + carousels + bows and was created by Bambini Soiree and The Gilded Group. 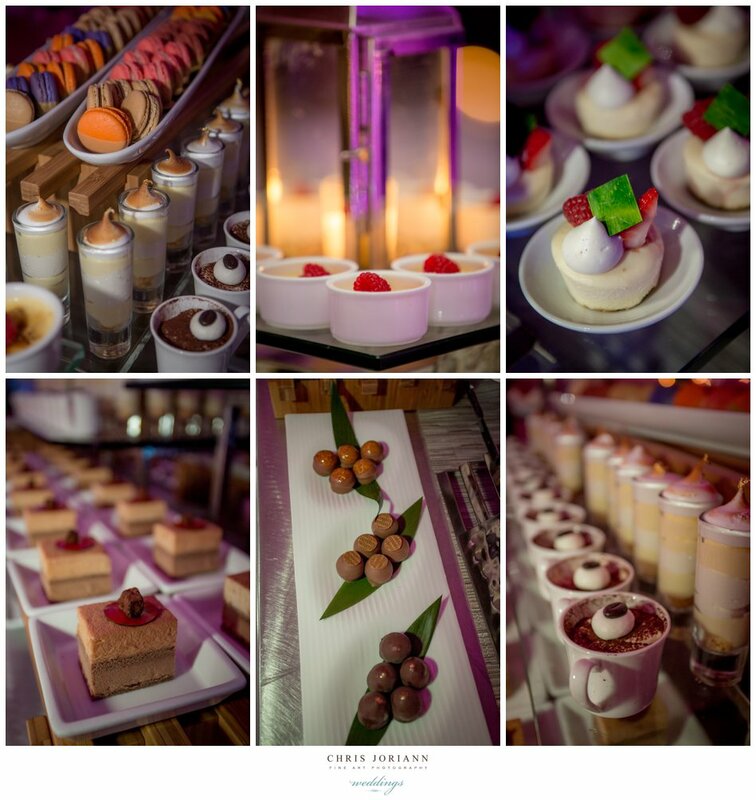 The desserts were quite simply, a work of art, way too beautiful to eat. 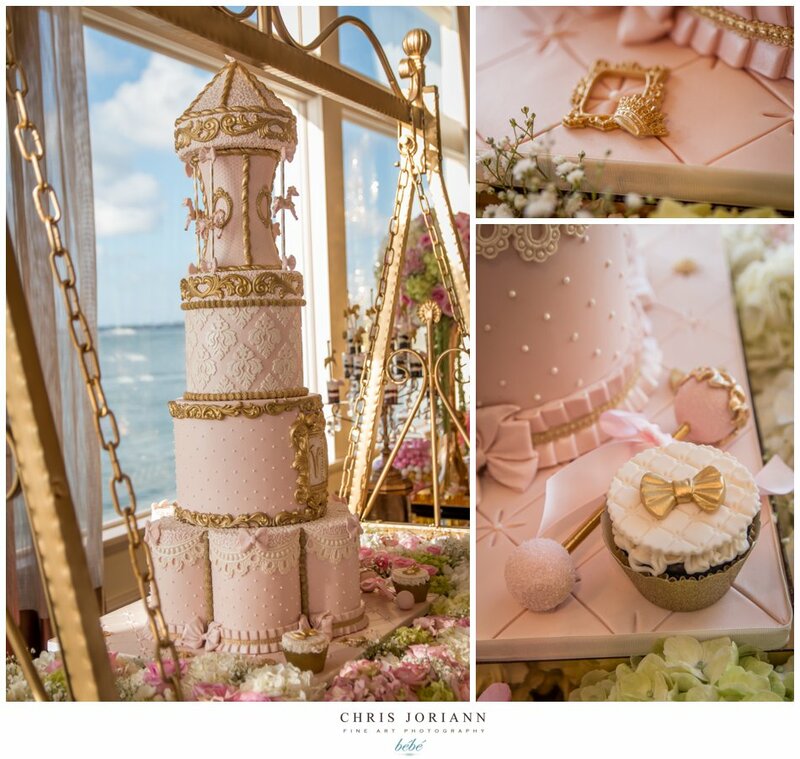 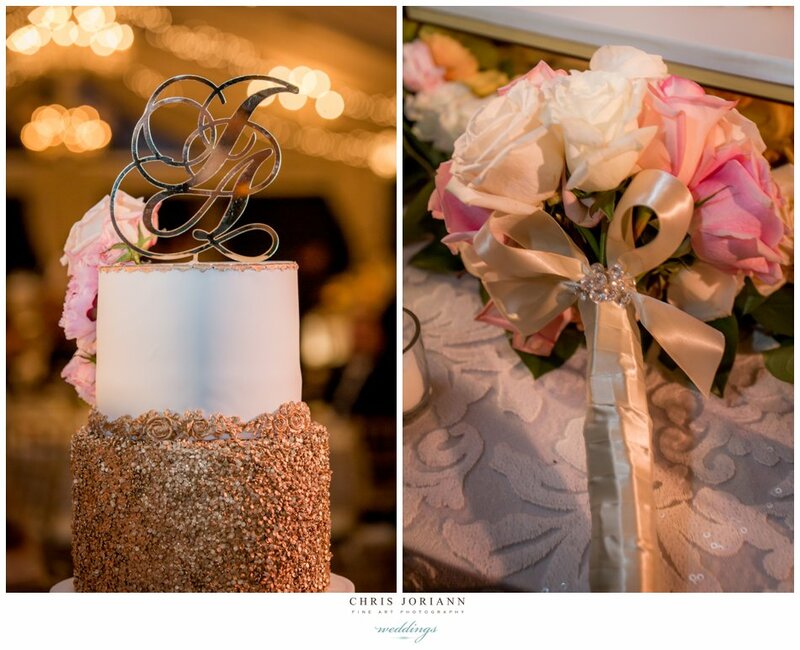 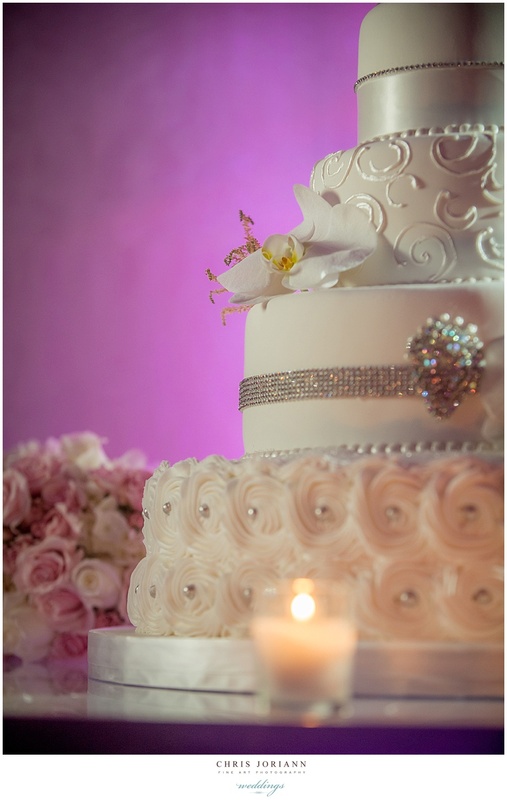 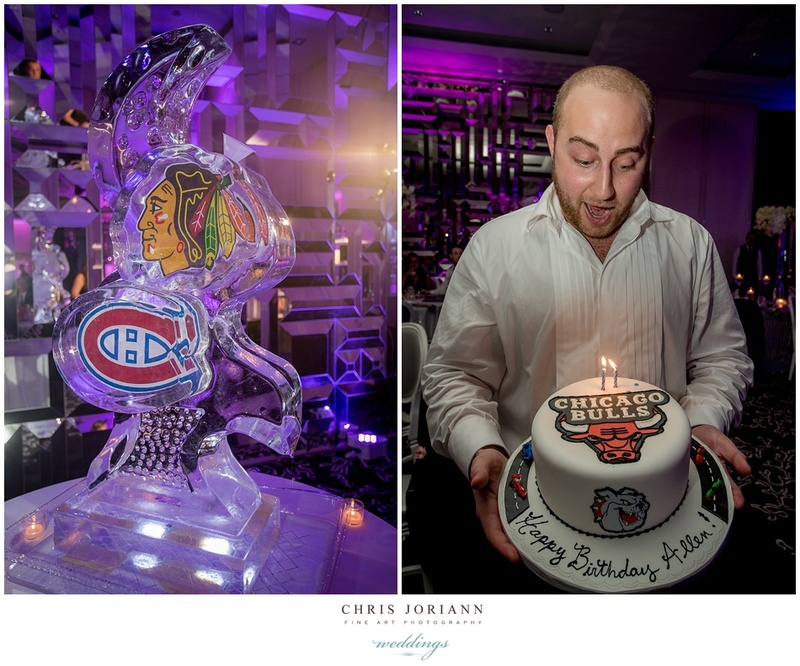 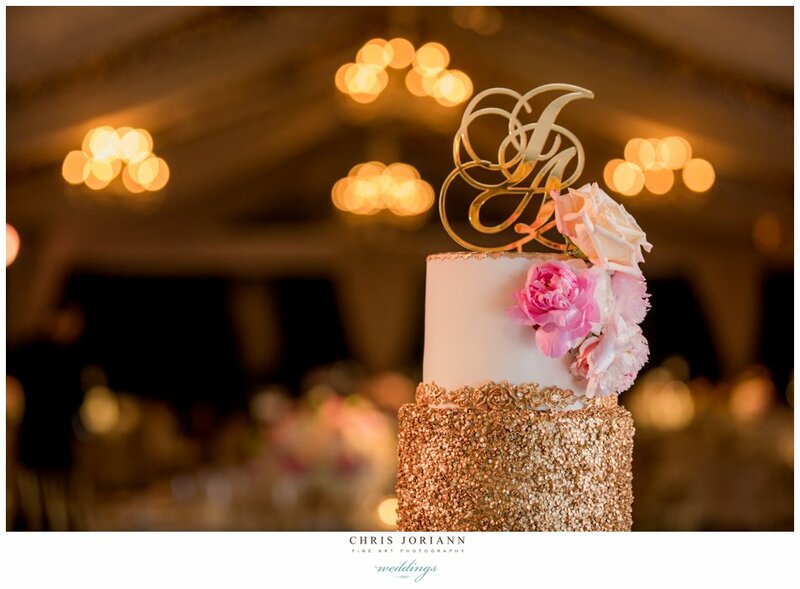 Created by Elegant Tempations Cakes of Miami, there was not one, but three, stunning cakes featured, along with an assortment of other delectables, from rattles and carousel cake pops to crown topped cupcakes, and even rhinestone slippers. 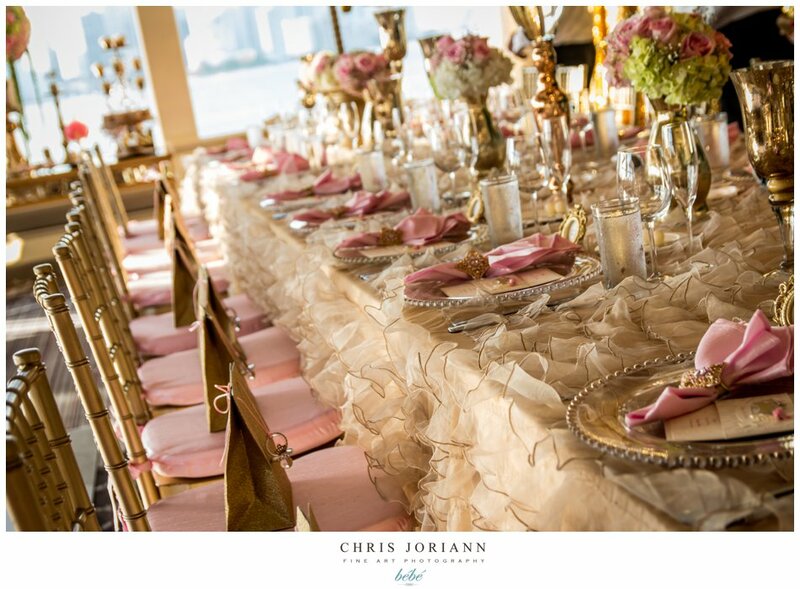 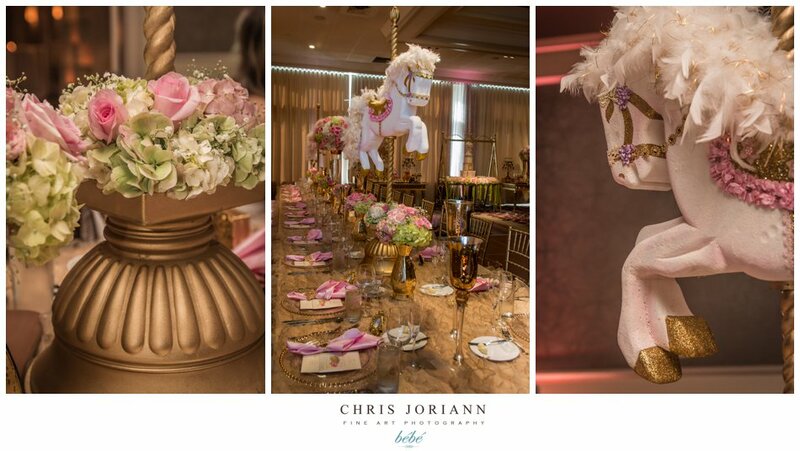 The kings tables were draped in a blush silk organza cloth, with jeweled napkin rings, gold framed place cards, carousel horse centerpieces. 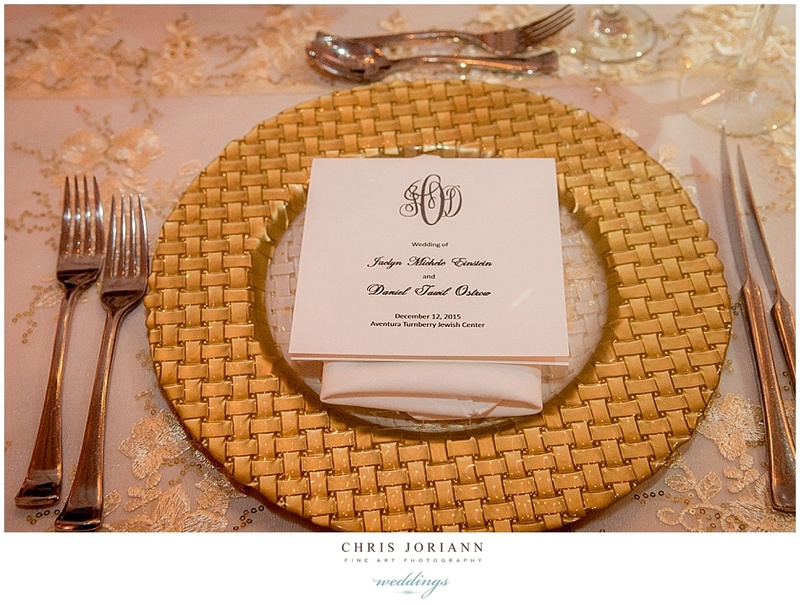 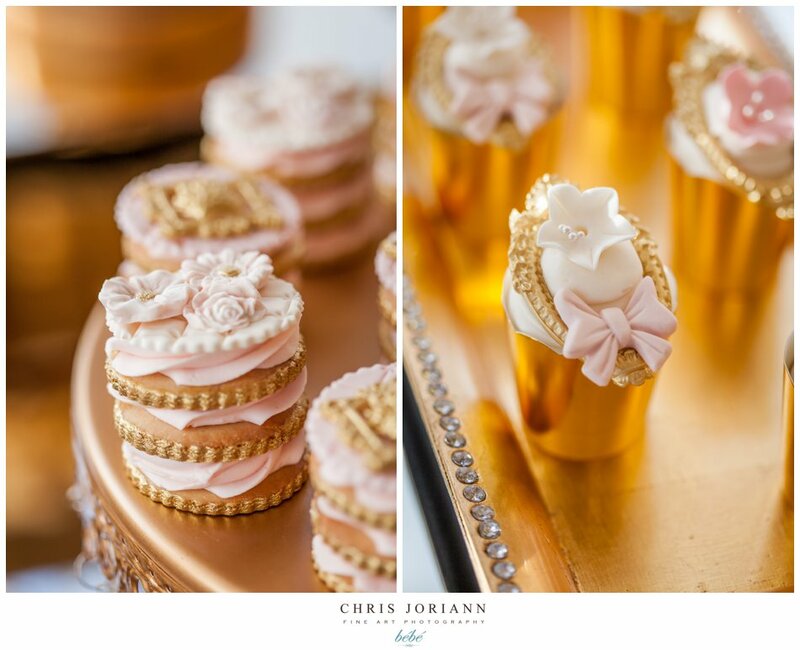 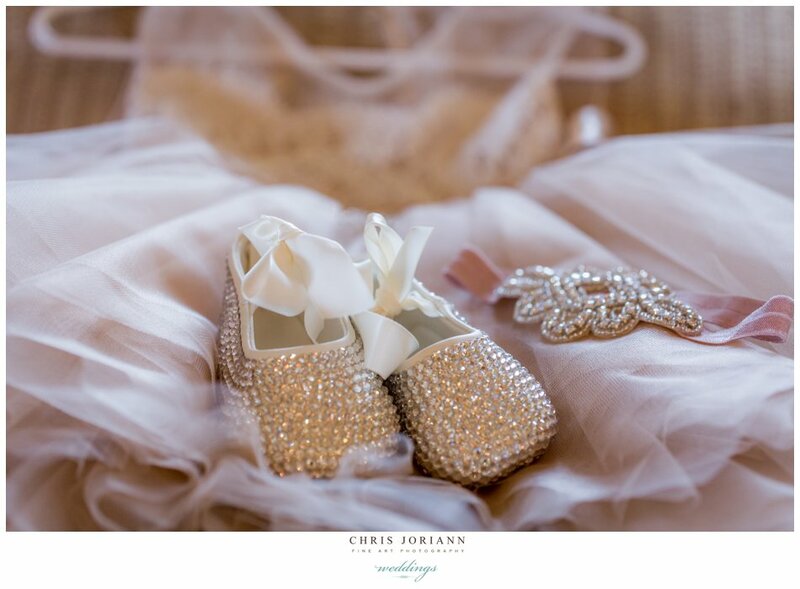 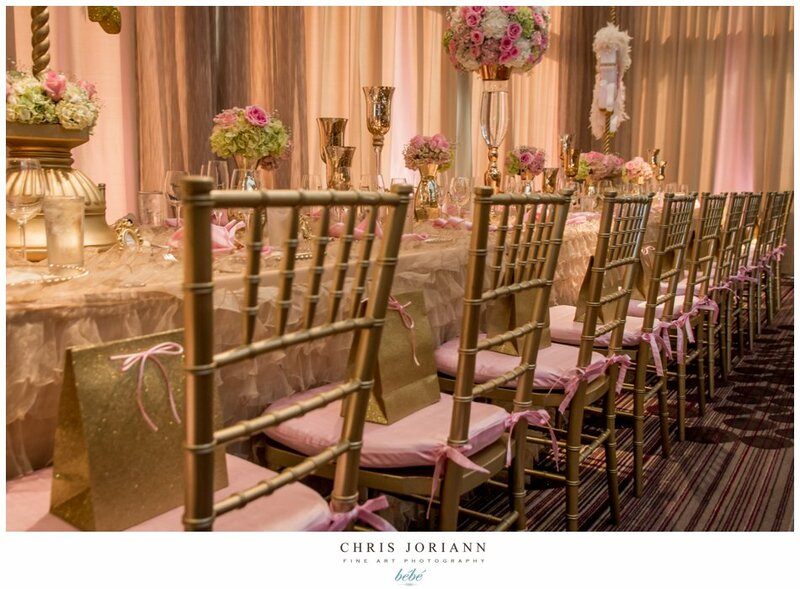 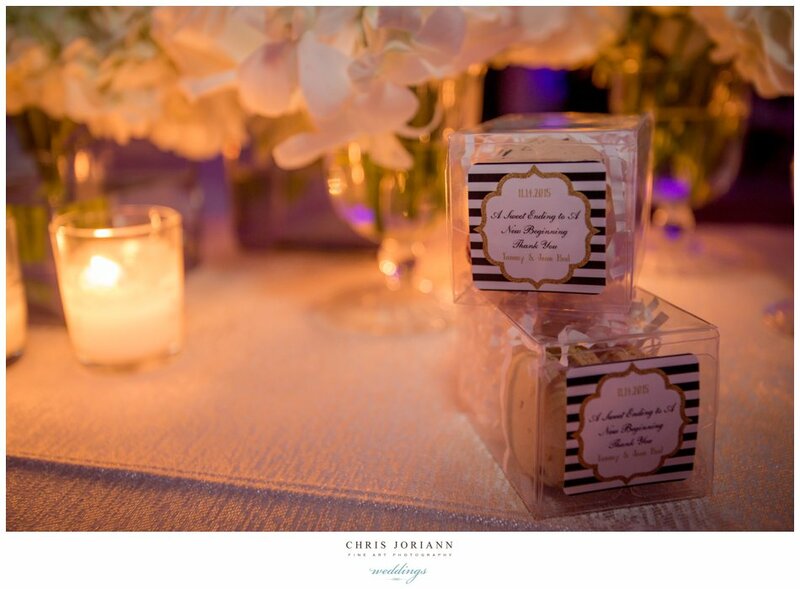 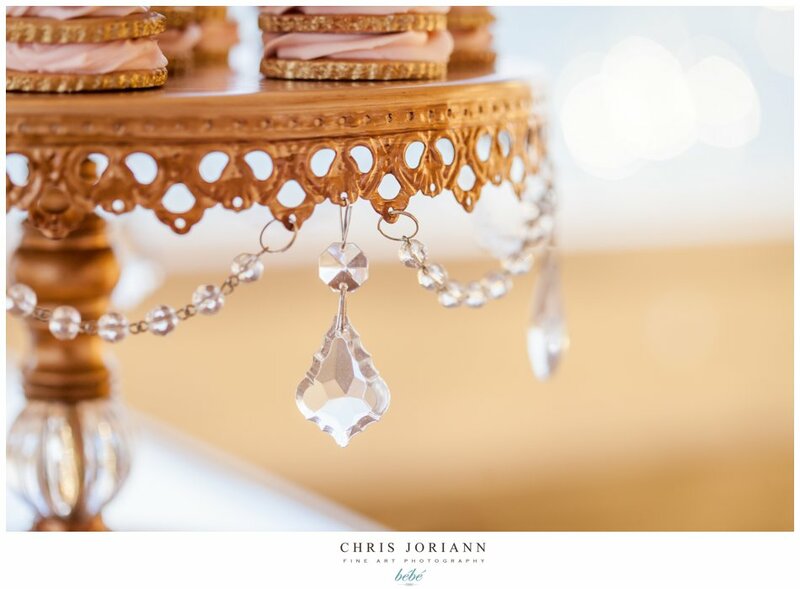 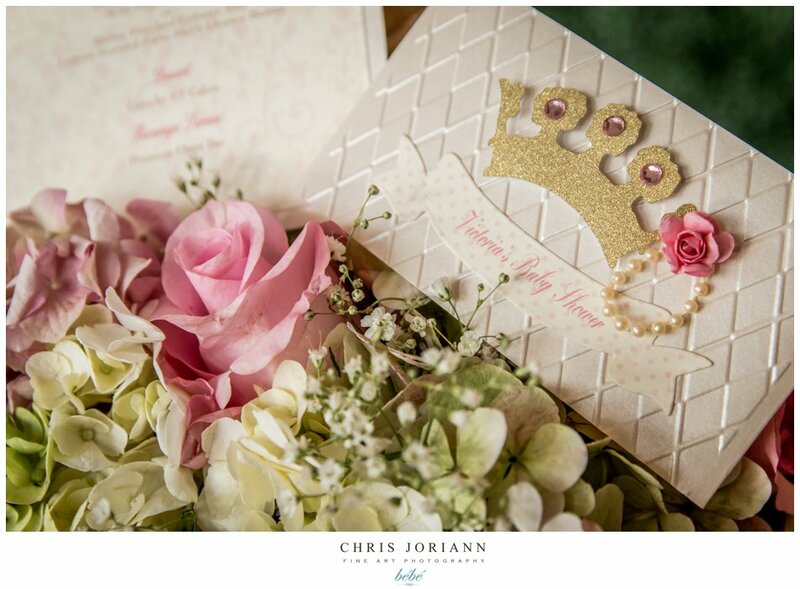 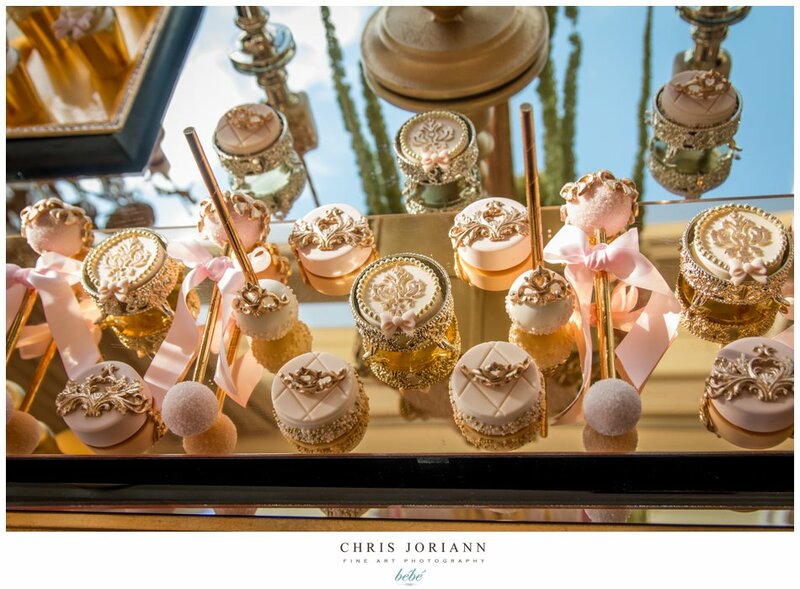 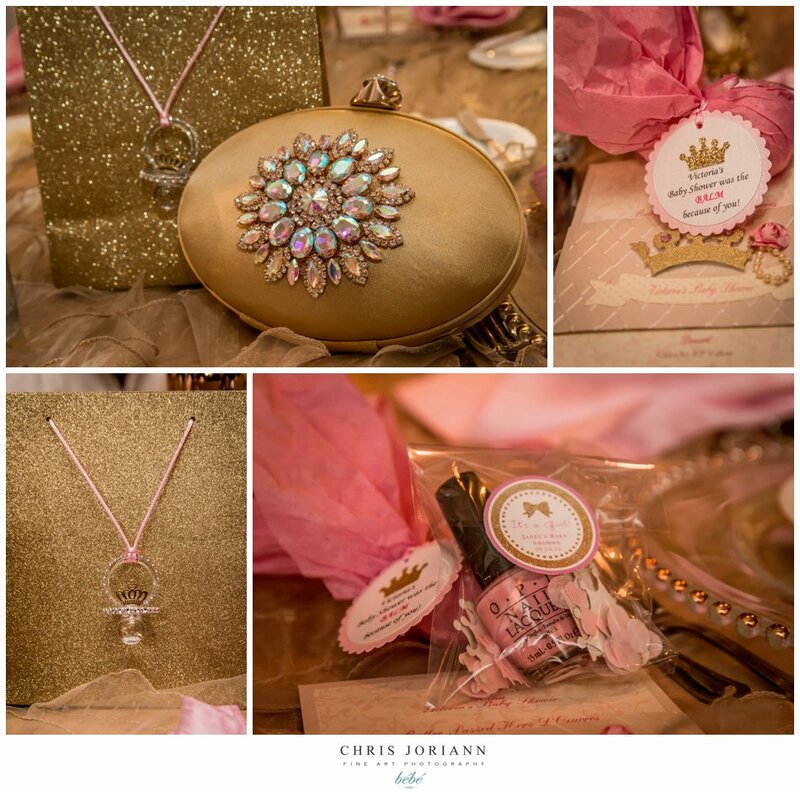 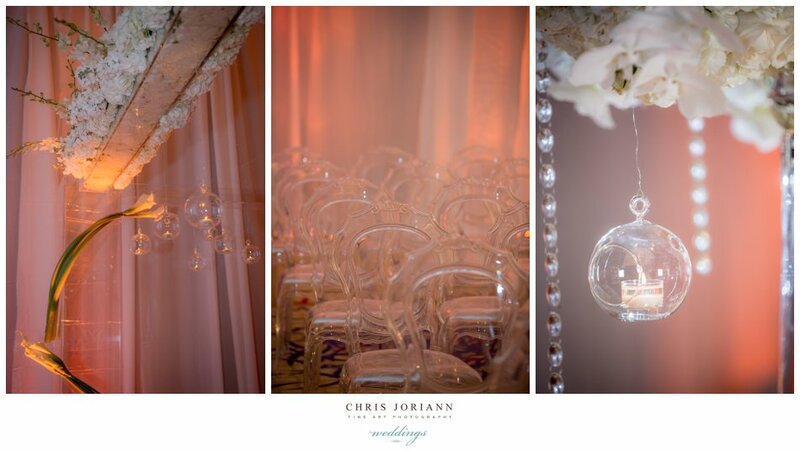 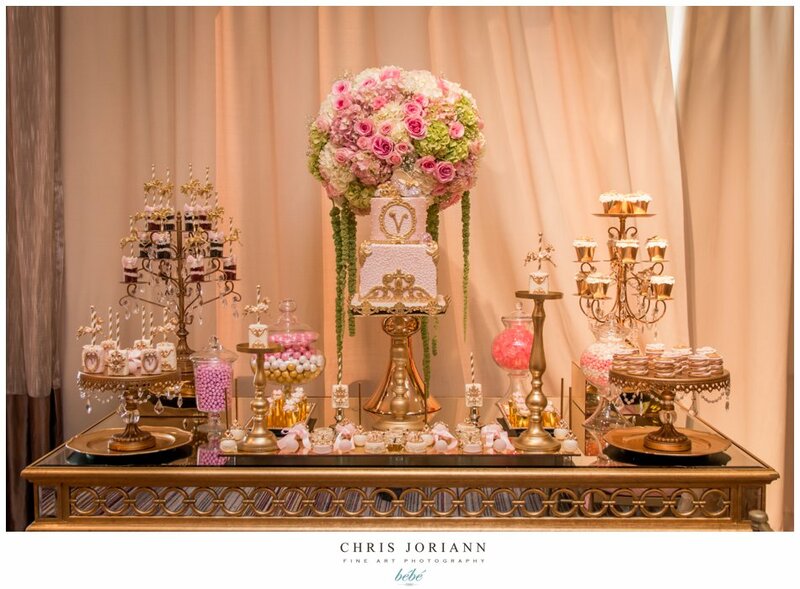 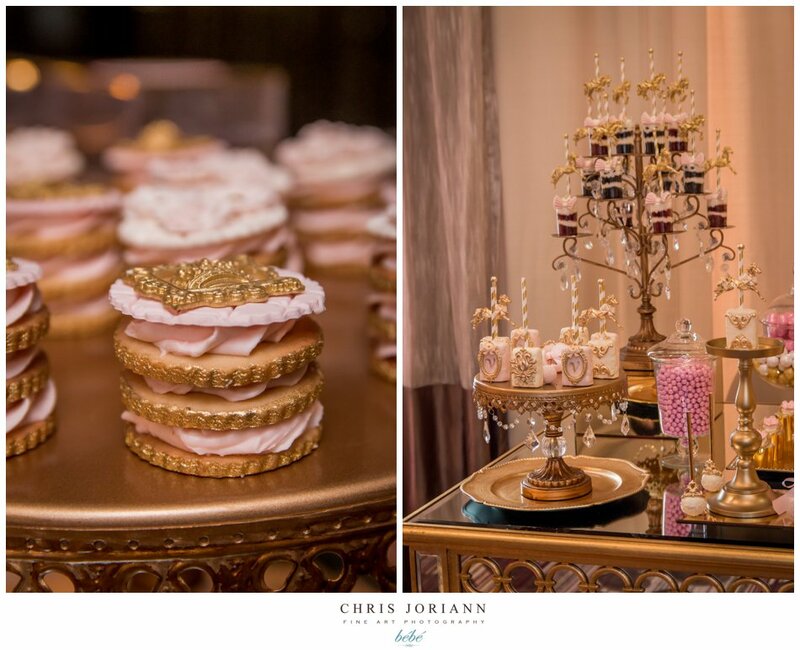 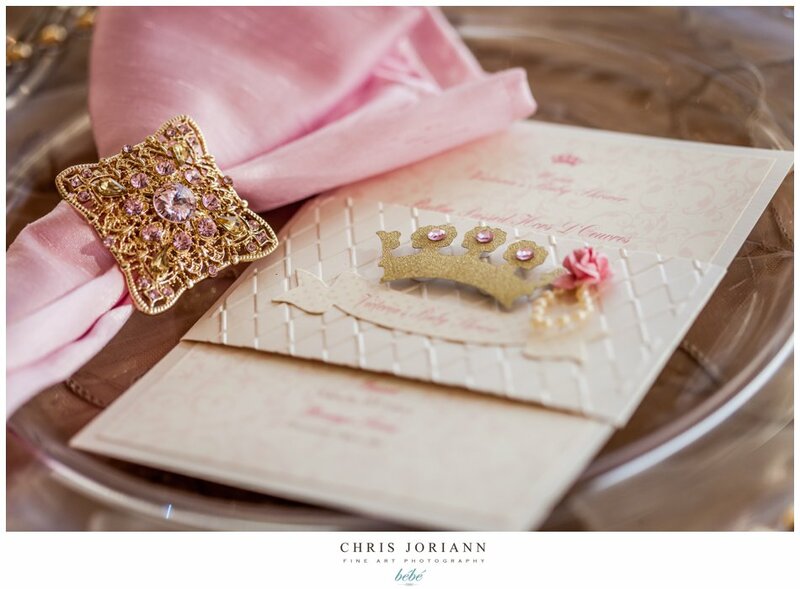 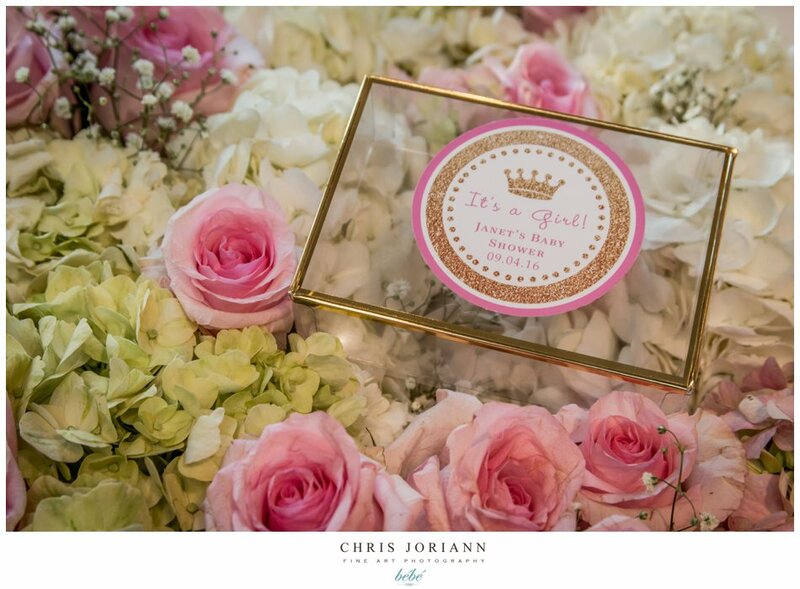 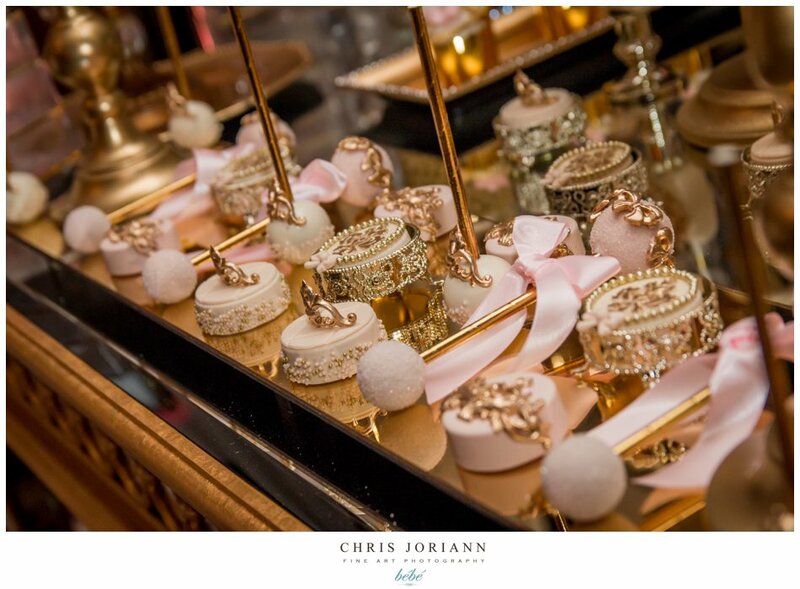 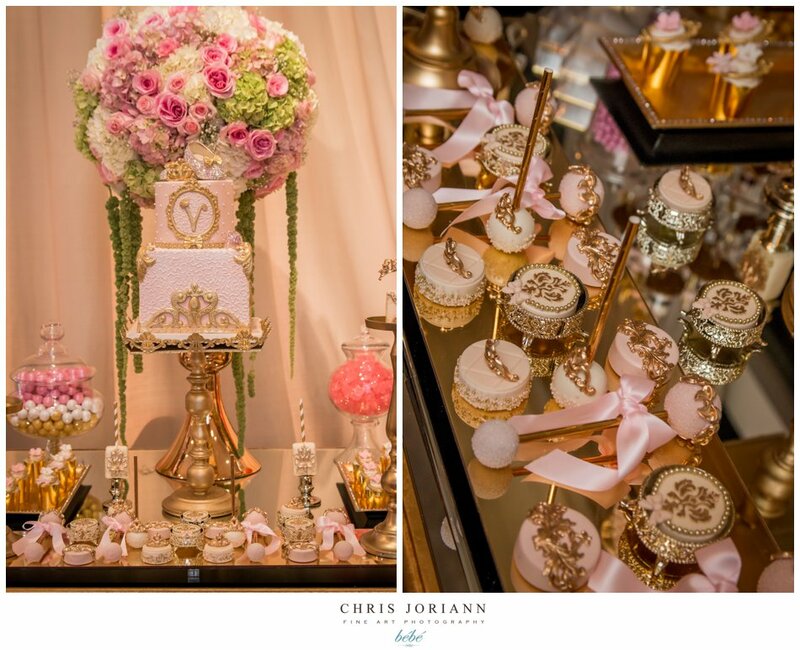 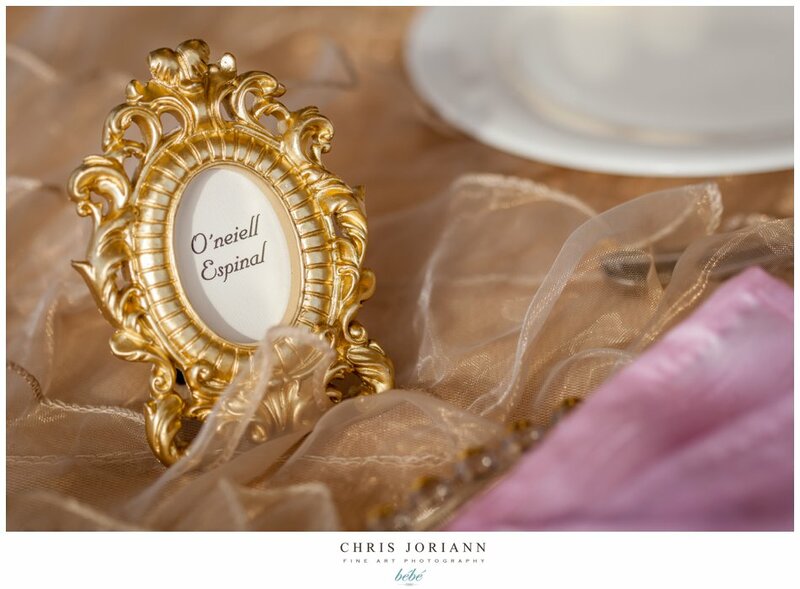 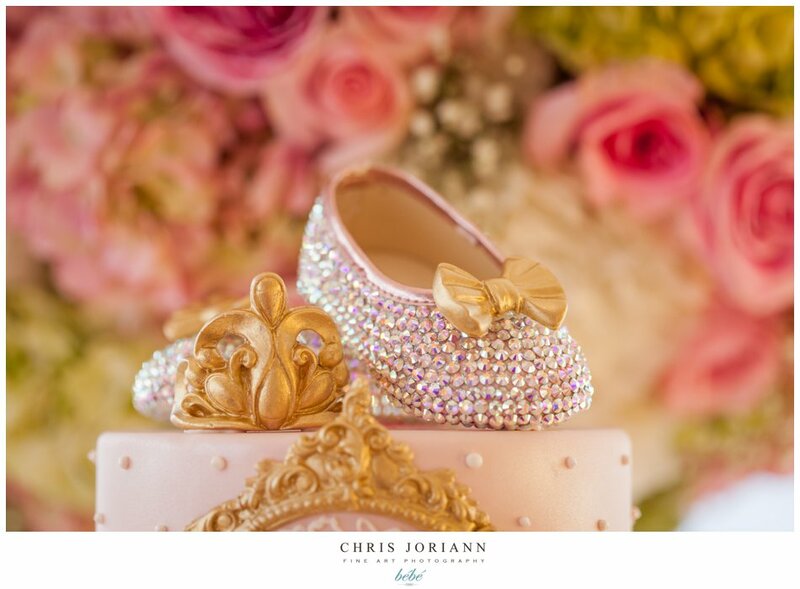 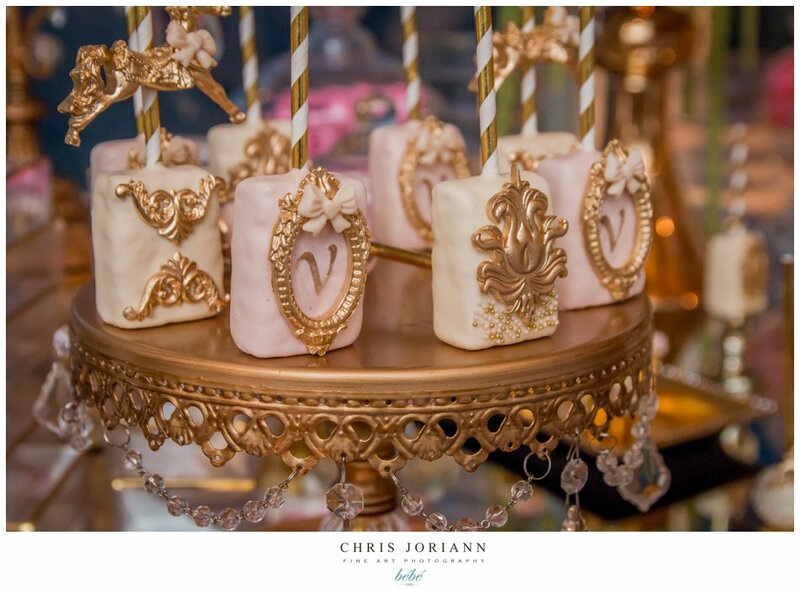 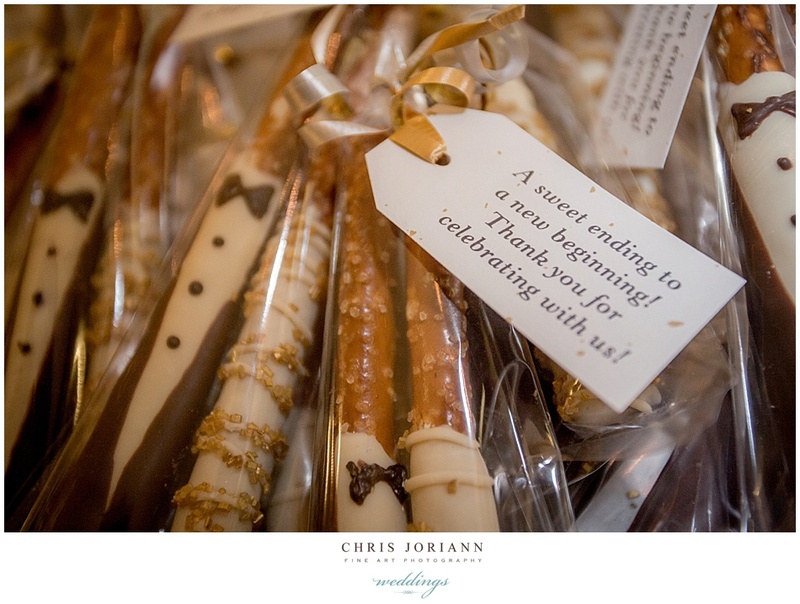 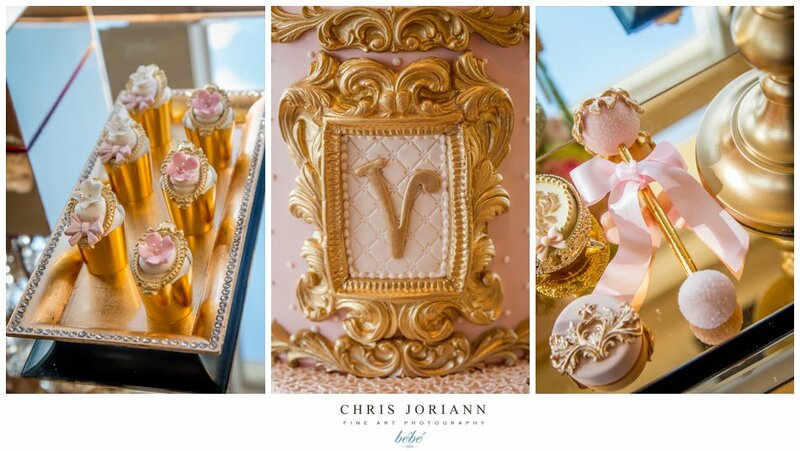 Each gold chiavari chair had a favor bag, with a crystal pacifier and an array of swag inside. 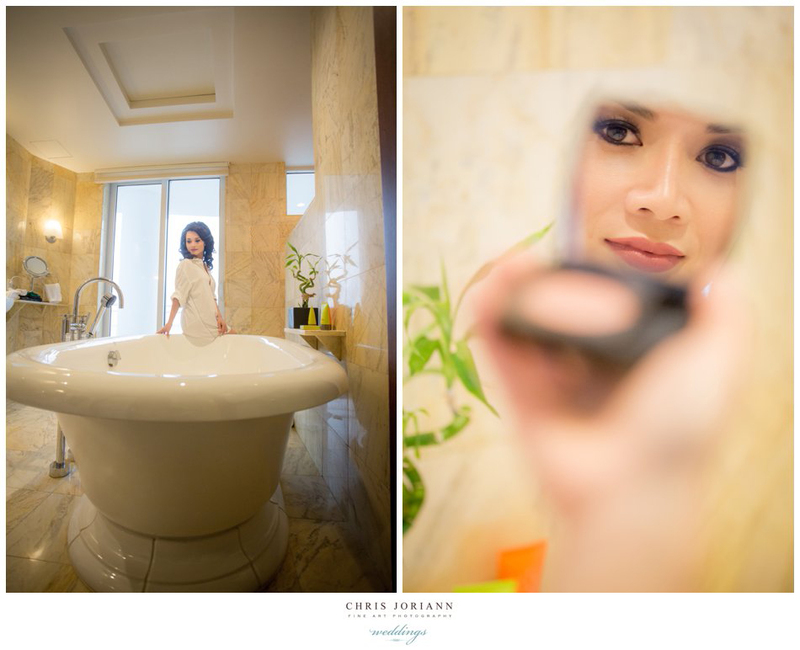 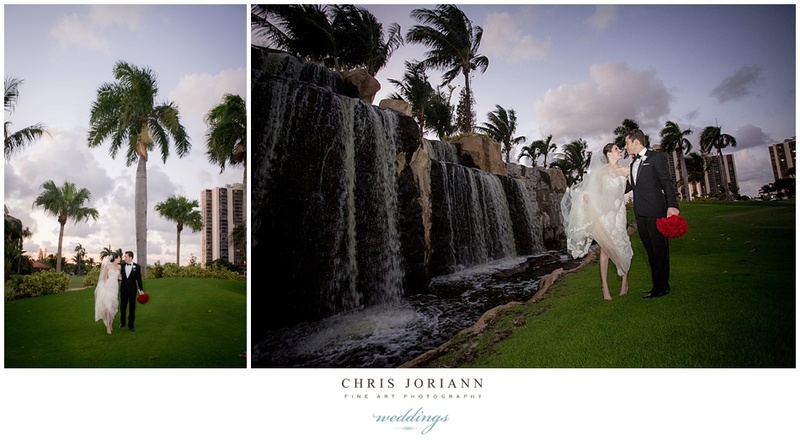 Can’t wait to capture the mom-to-be’s high fashion materinté shoot on location at The Breakers in a couple of weeks!!! 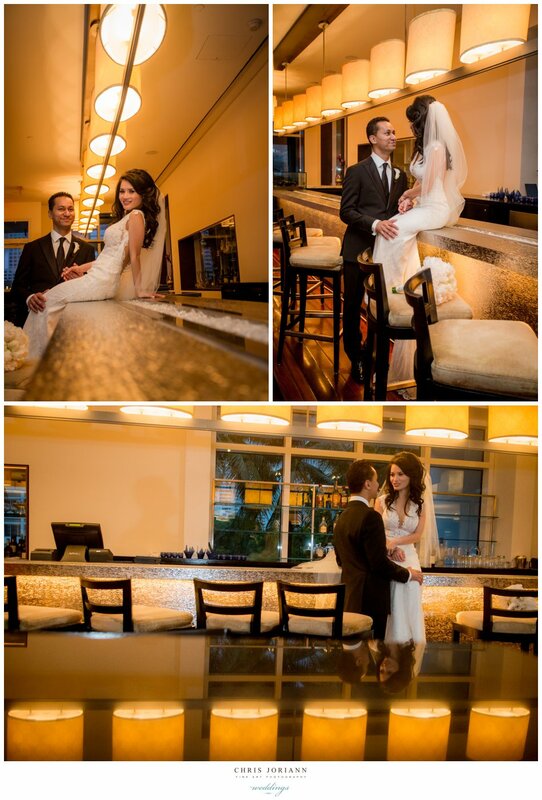 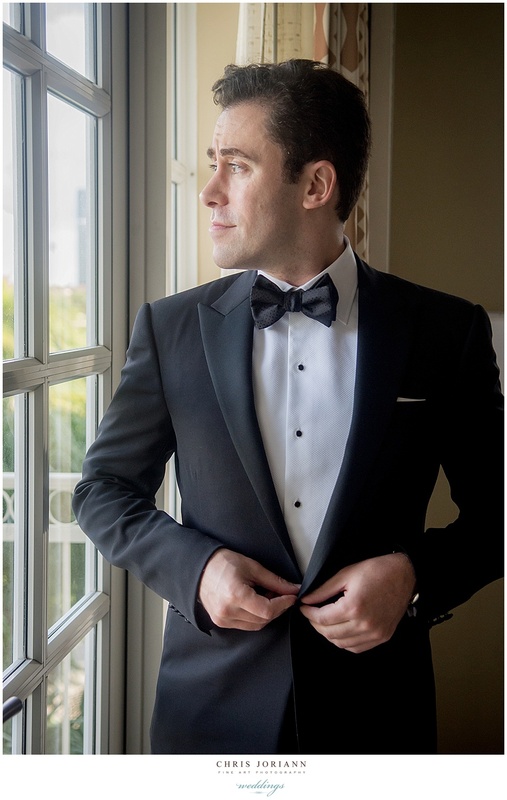 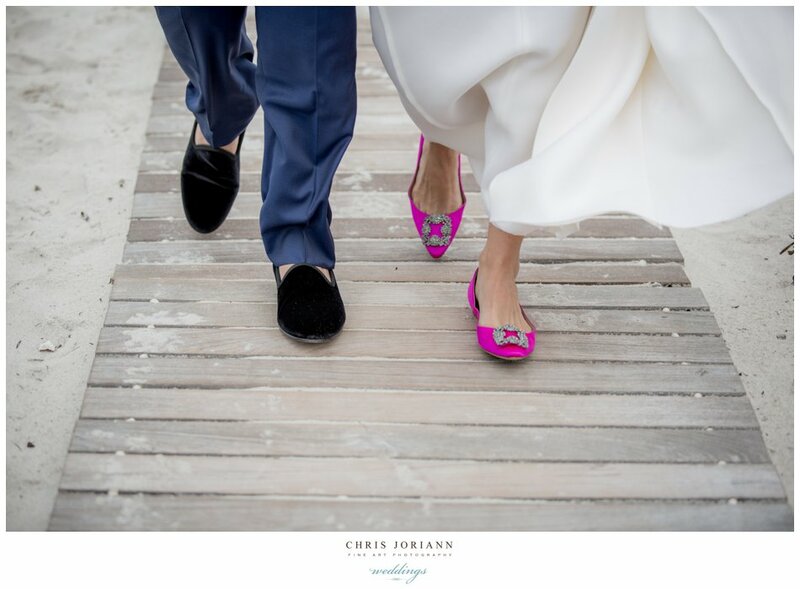 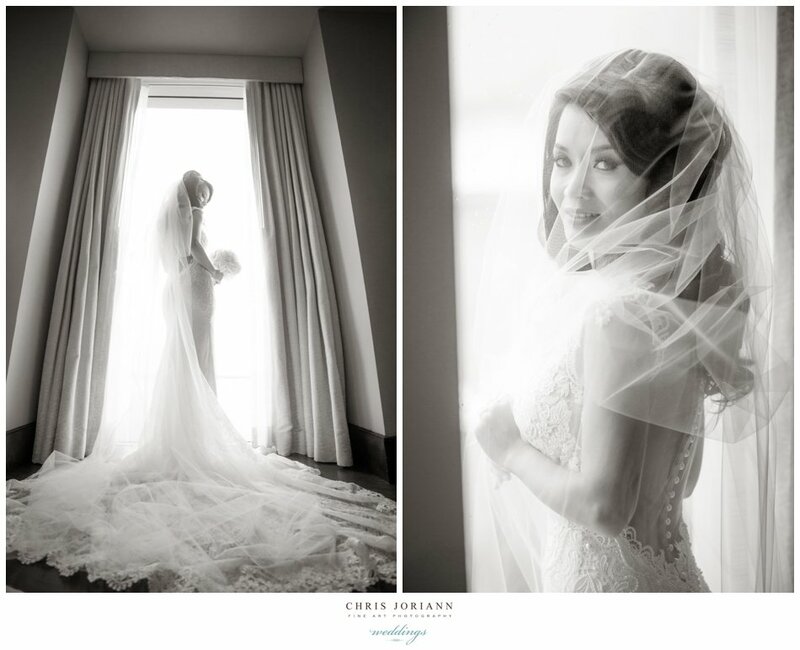 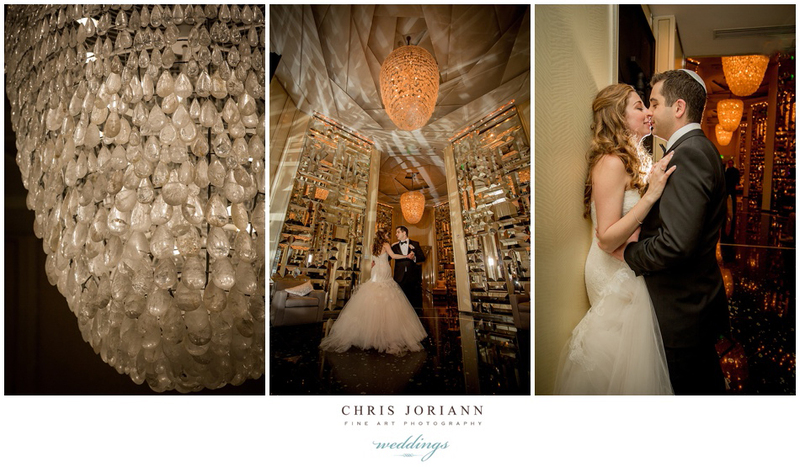 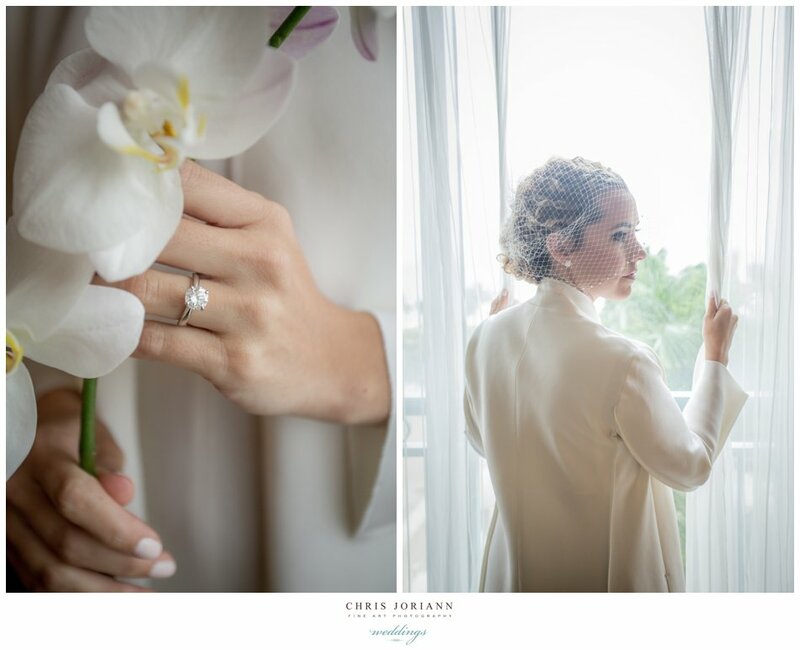 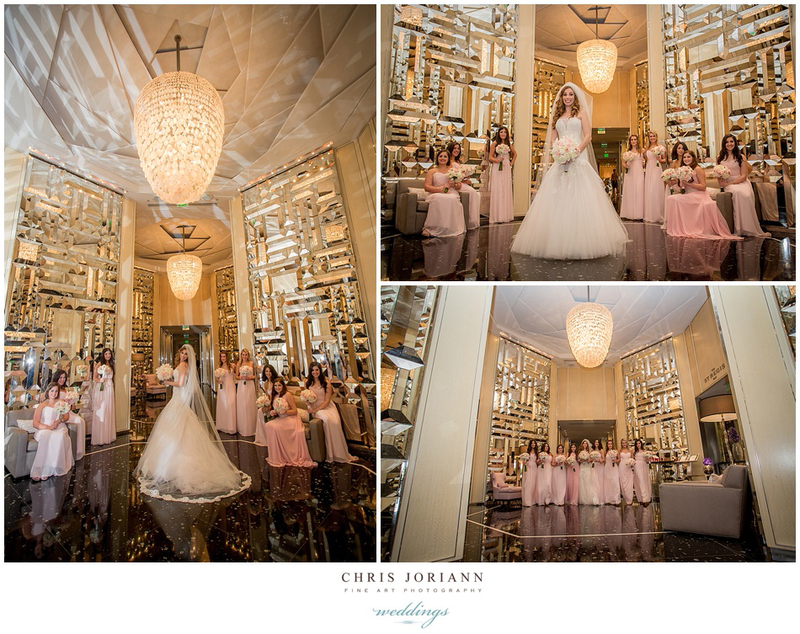 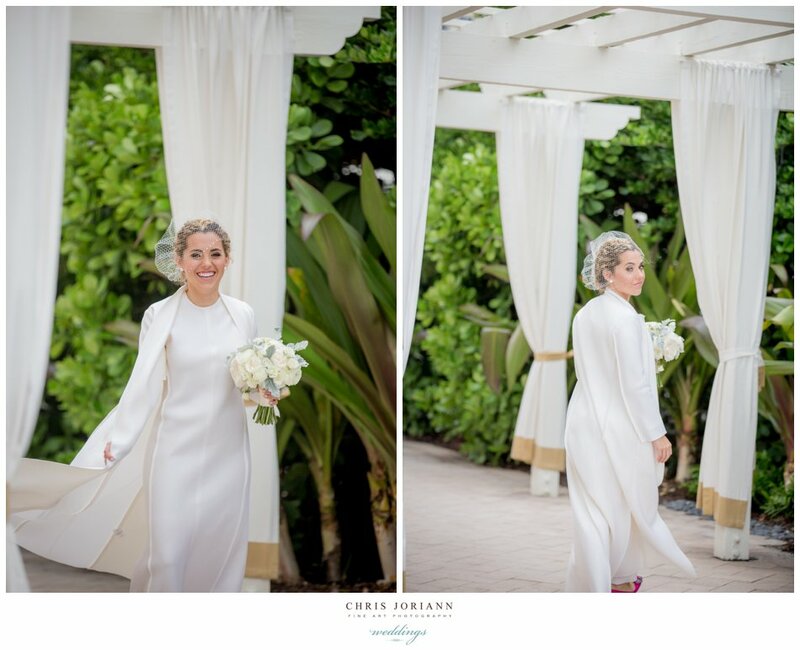 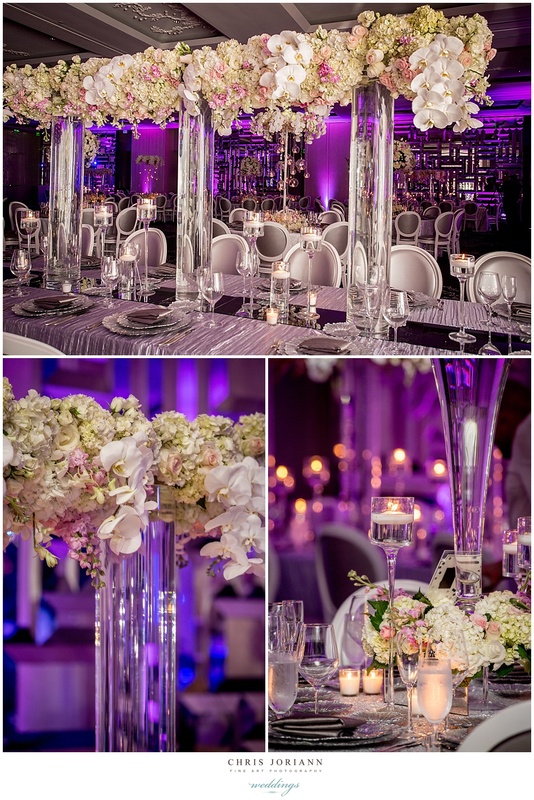 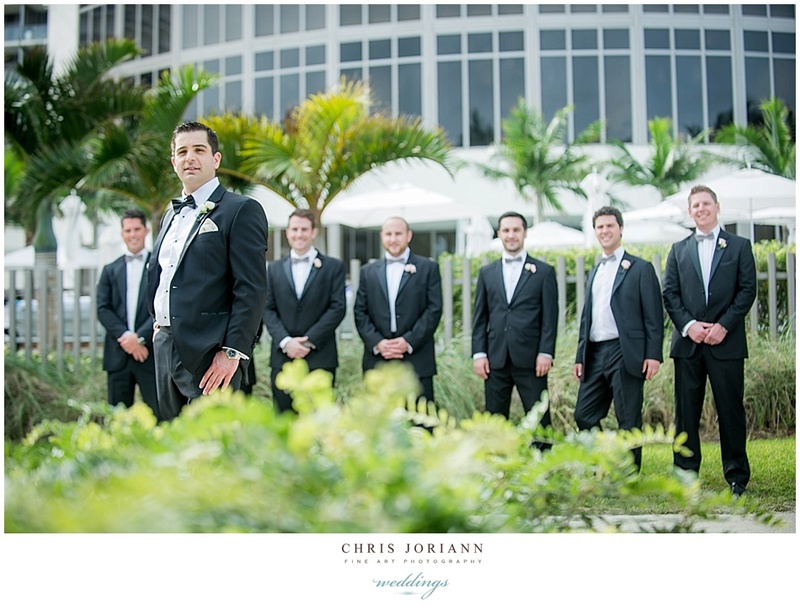 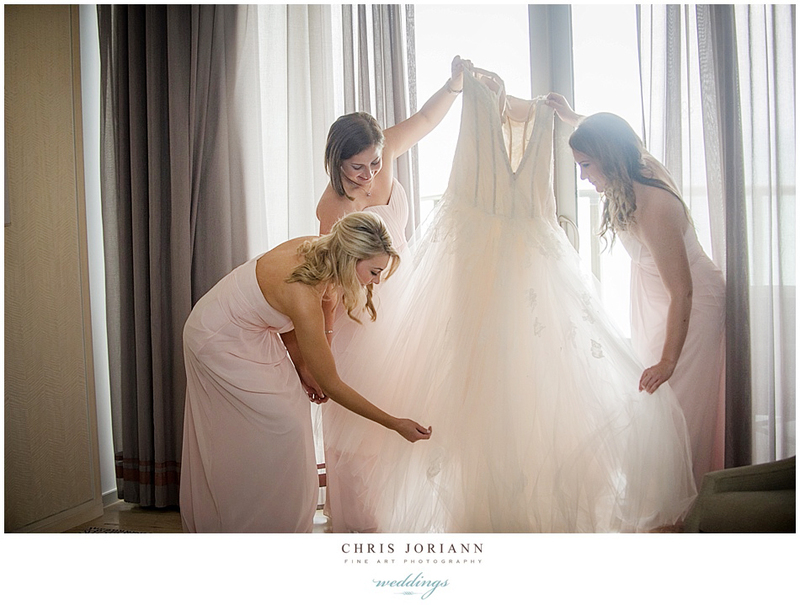 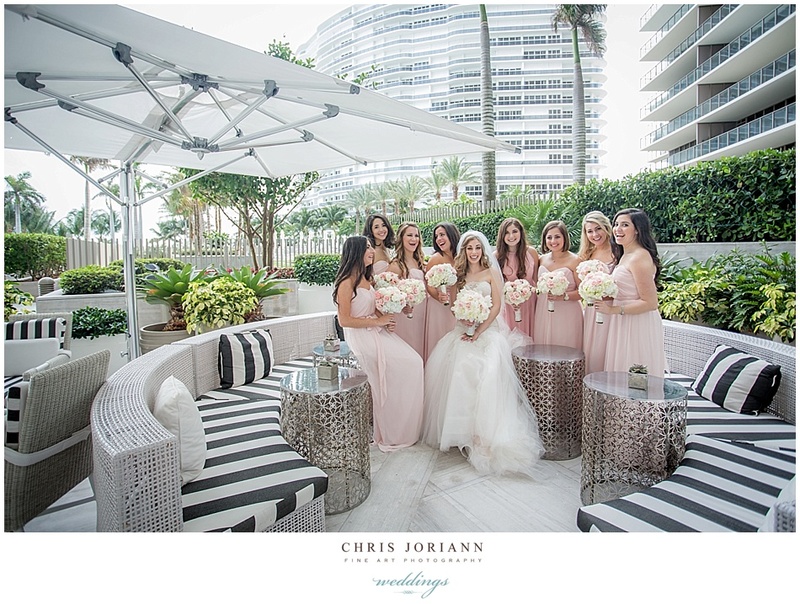 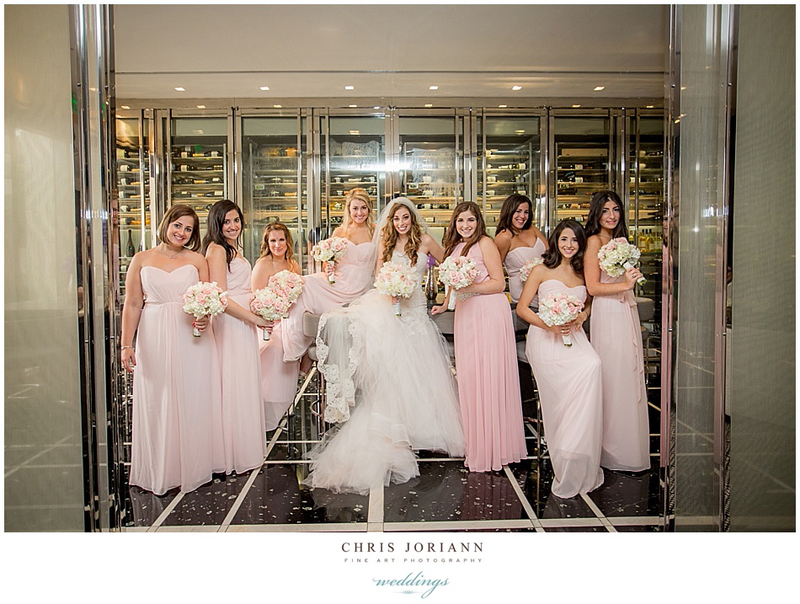 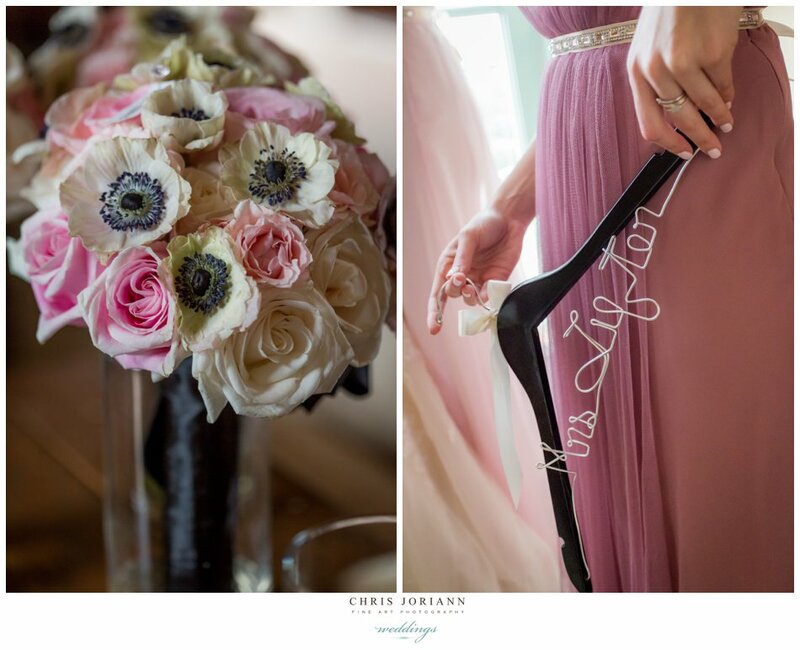 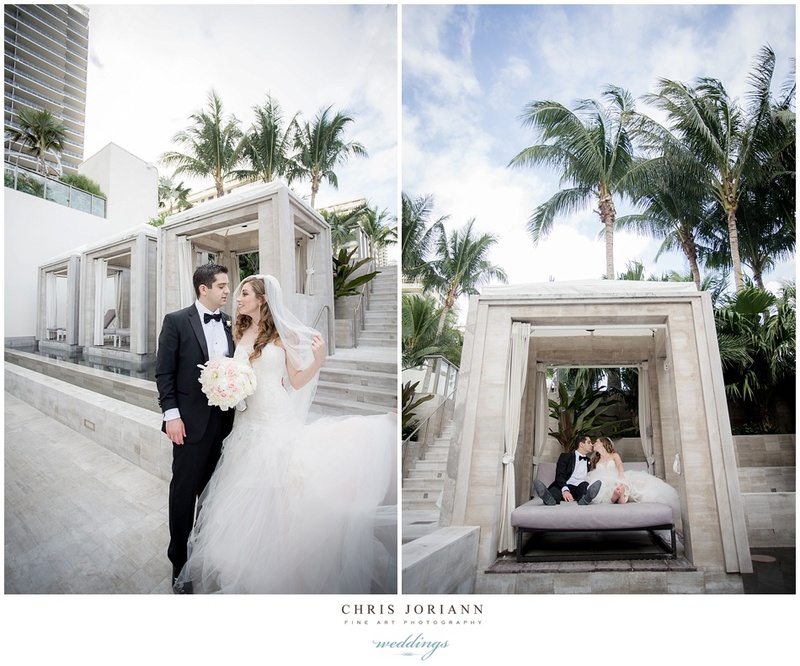 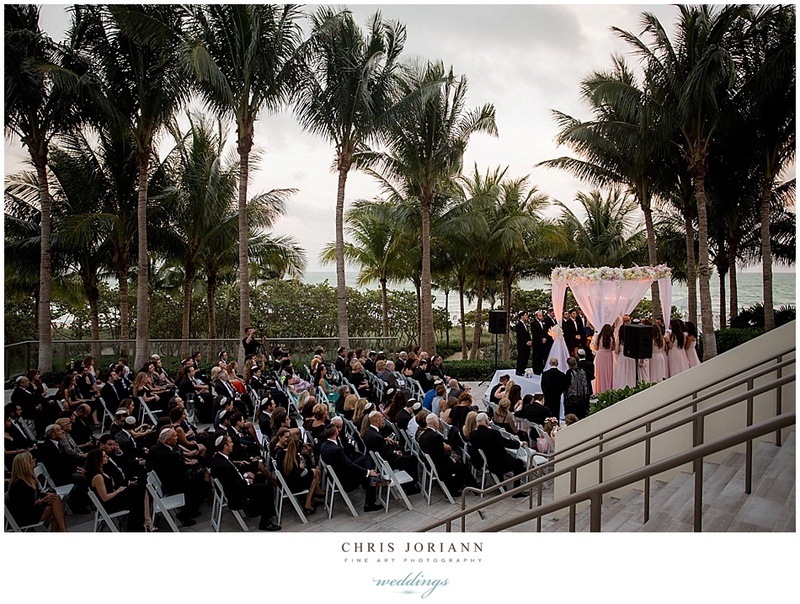 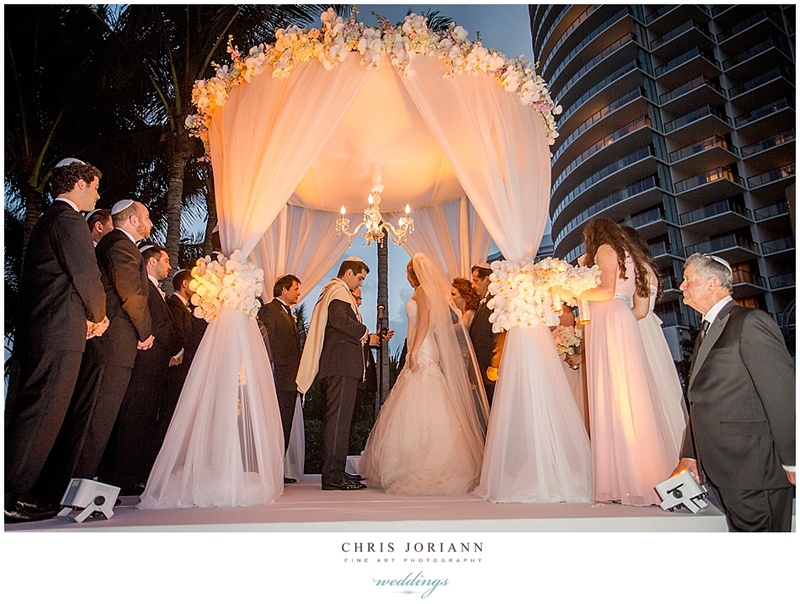 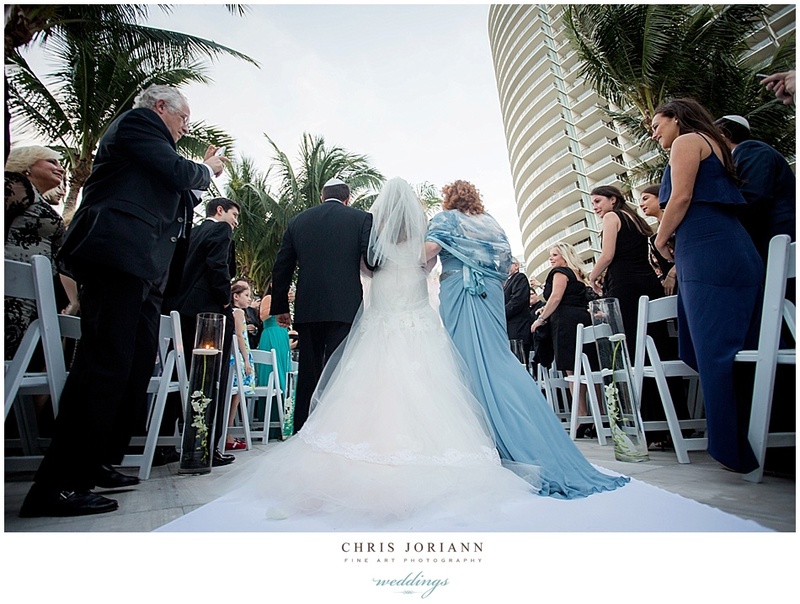 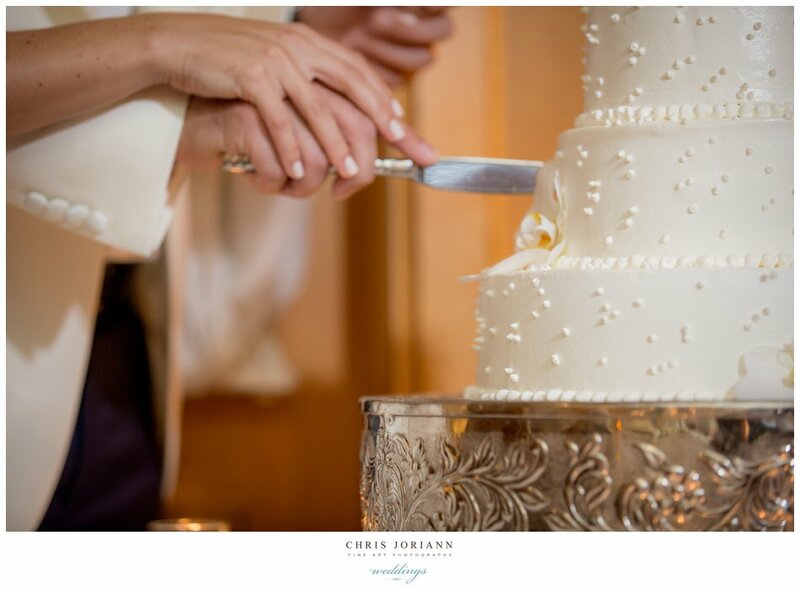 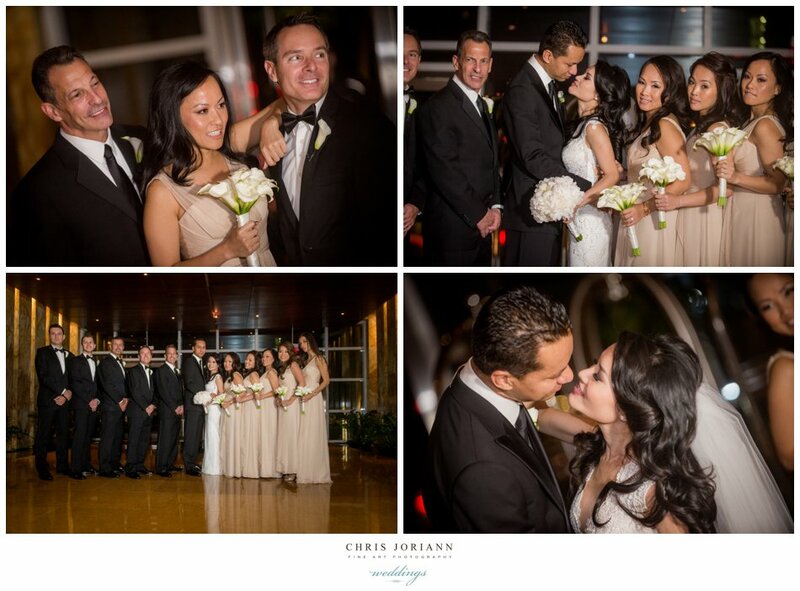 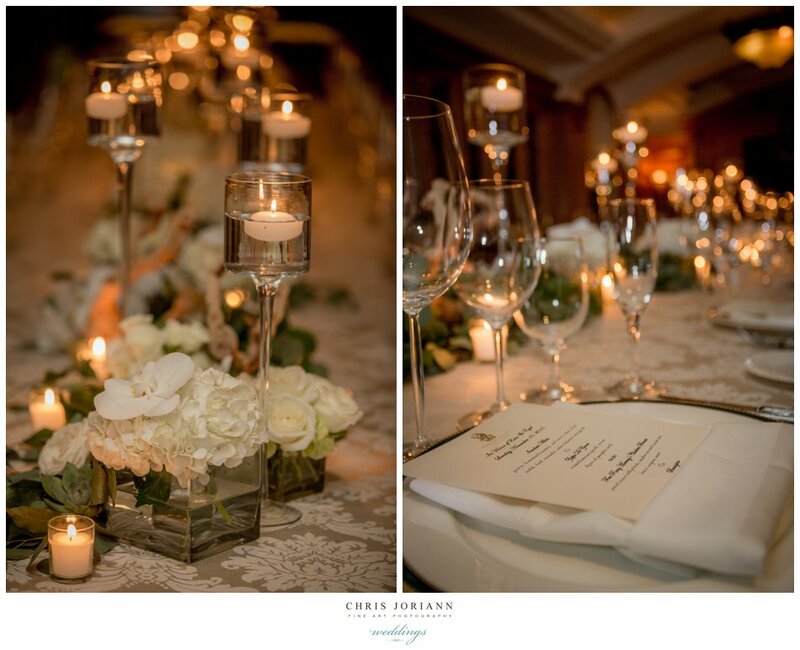 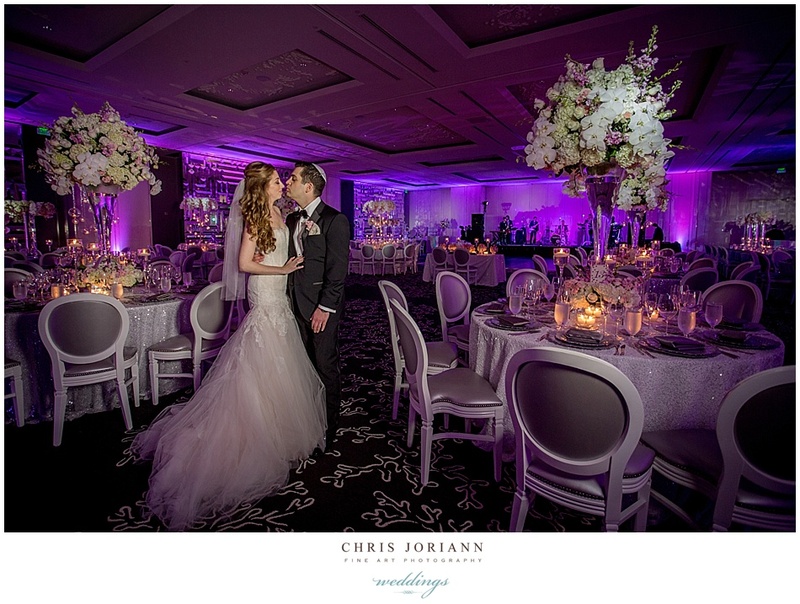 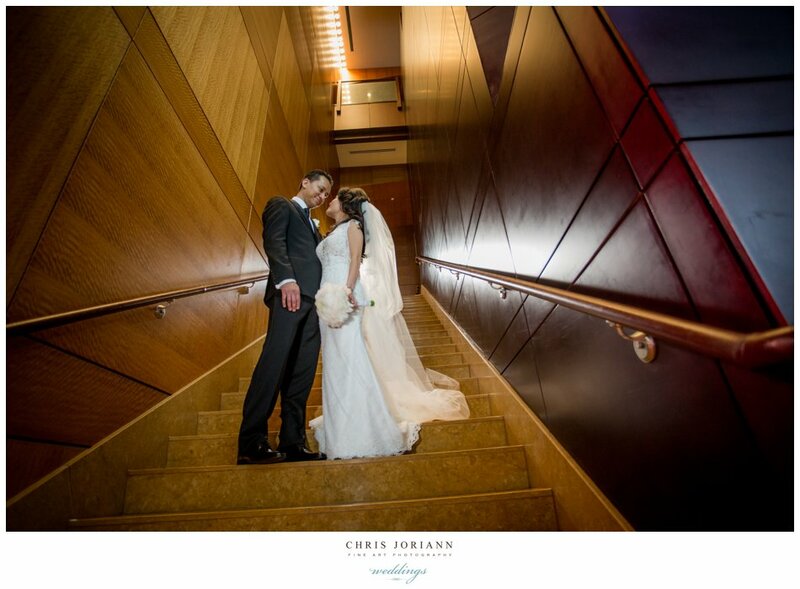 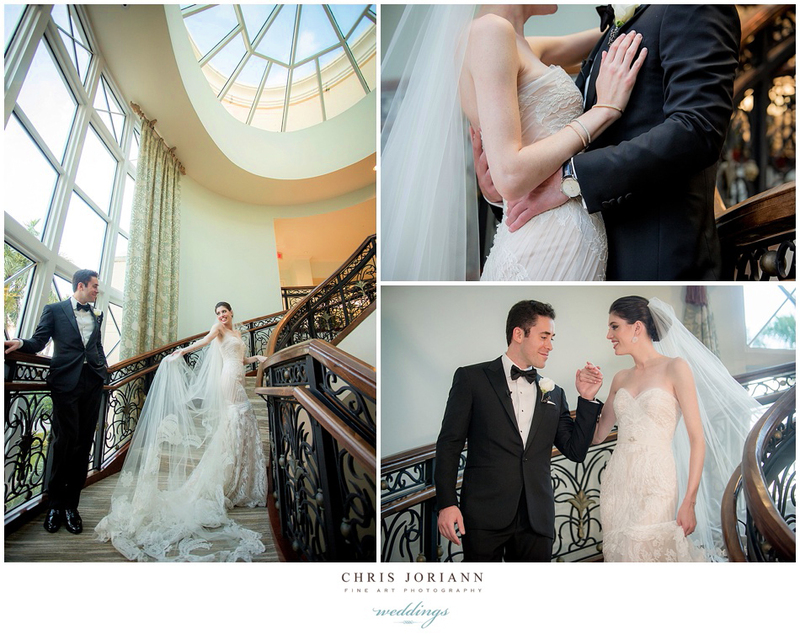 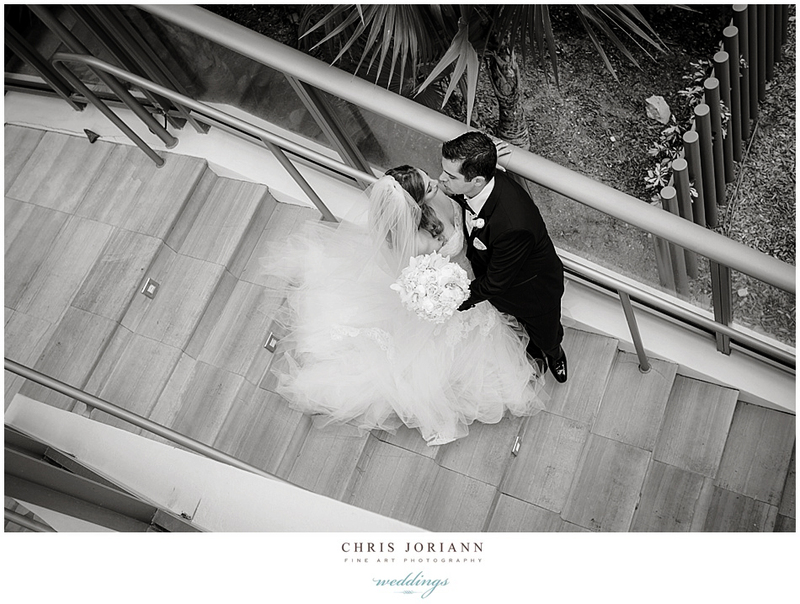 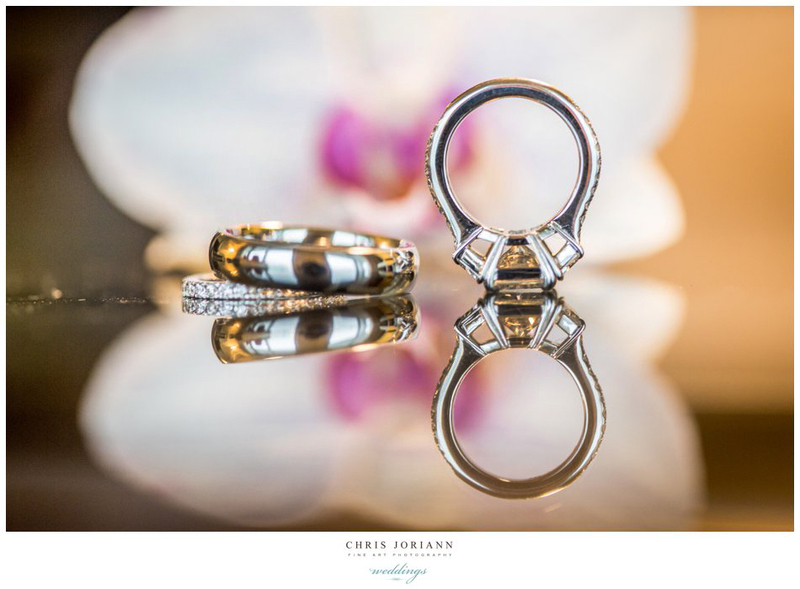 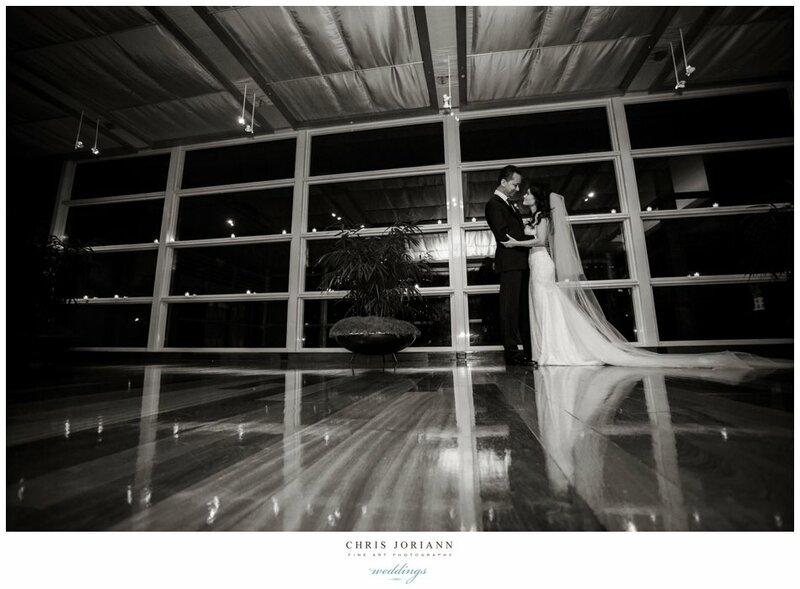 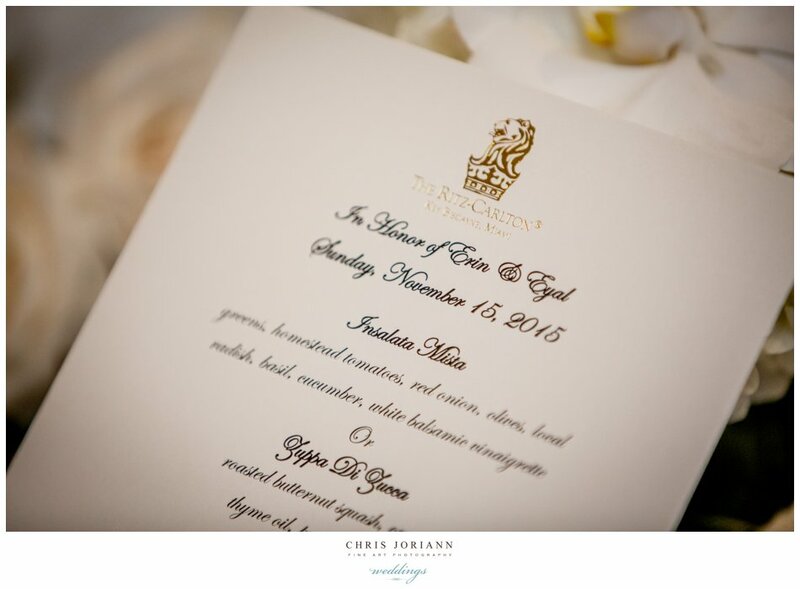 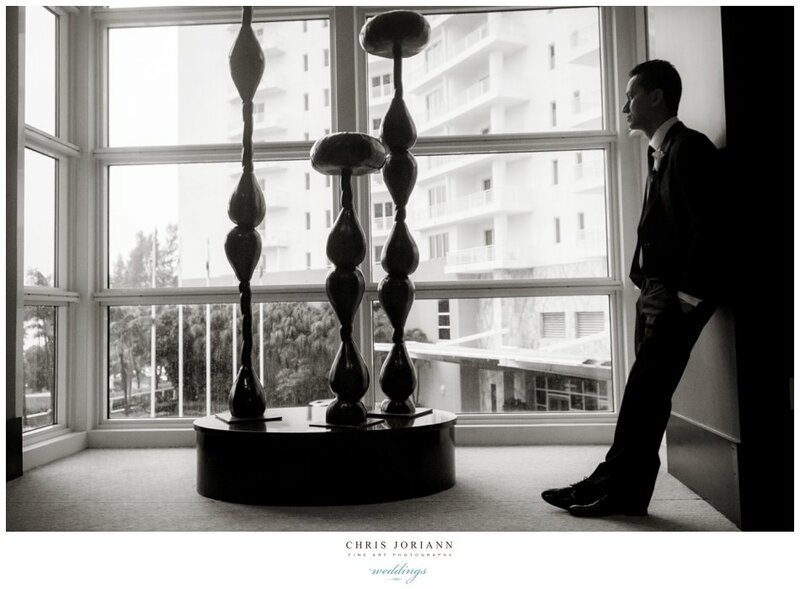 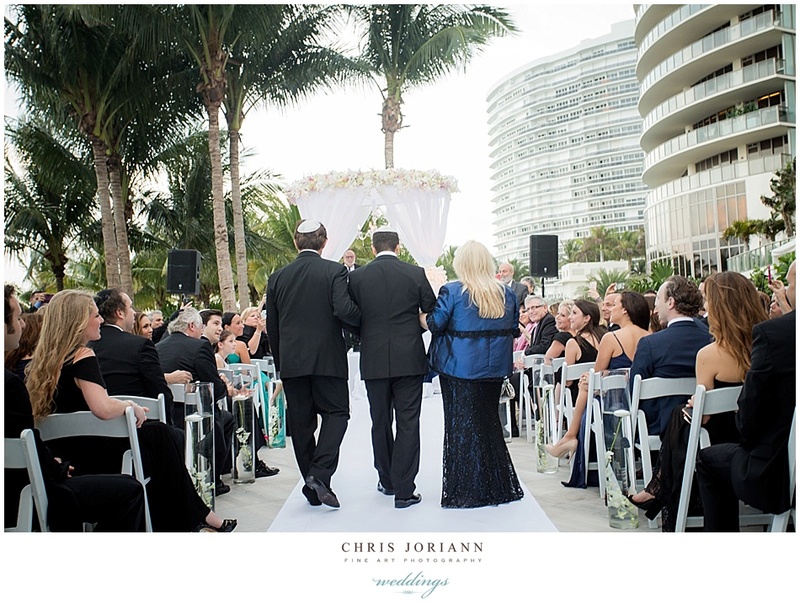 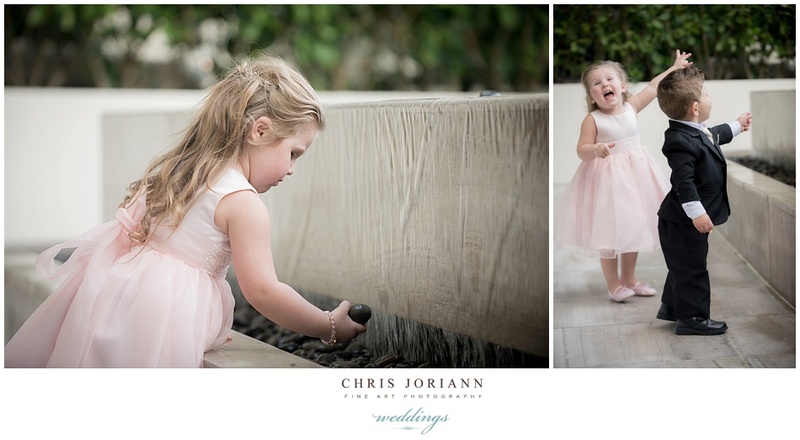 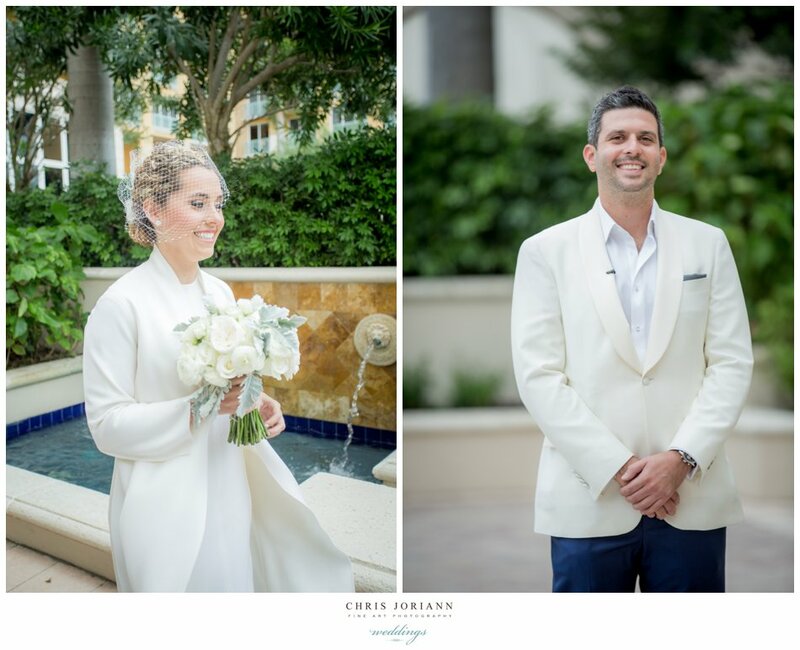 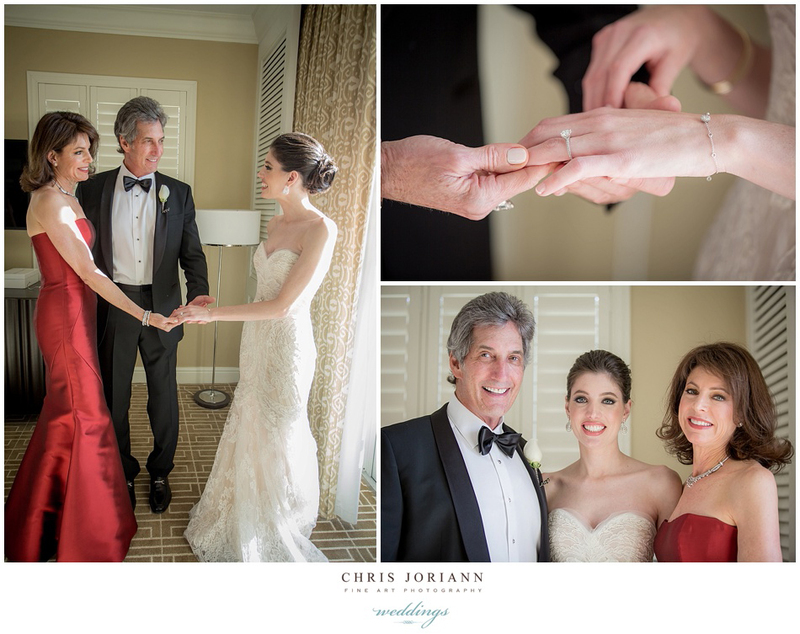 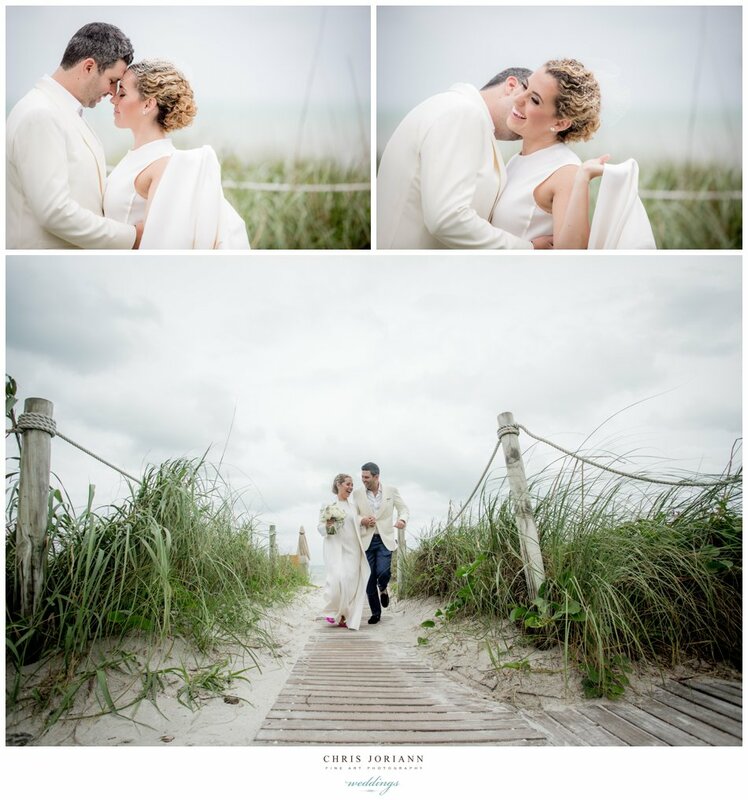 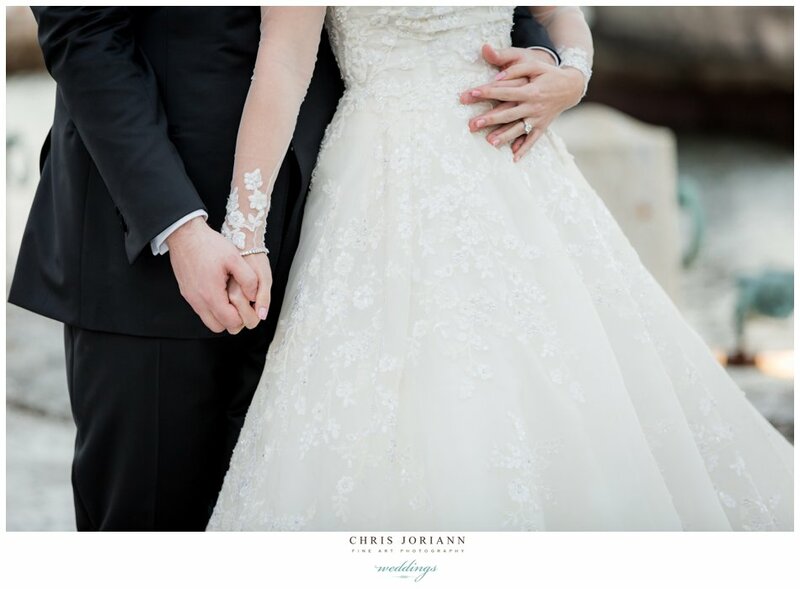 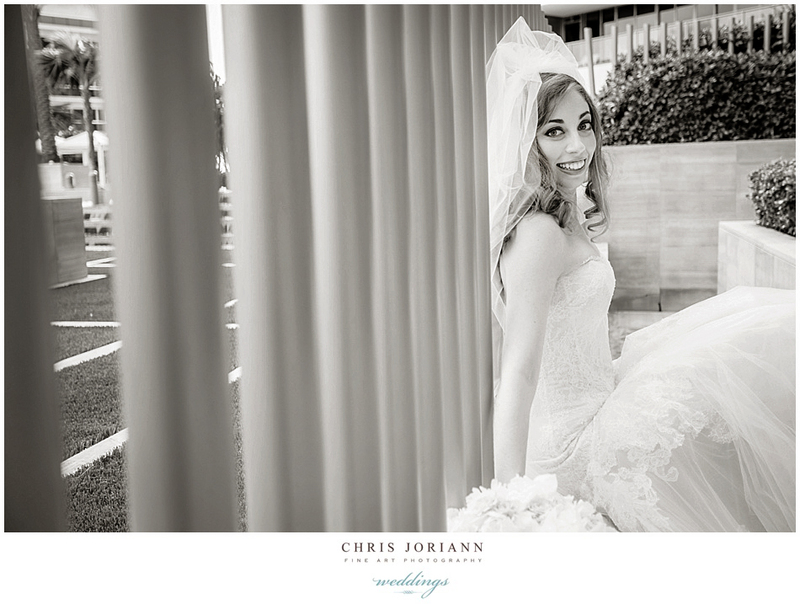 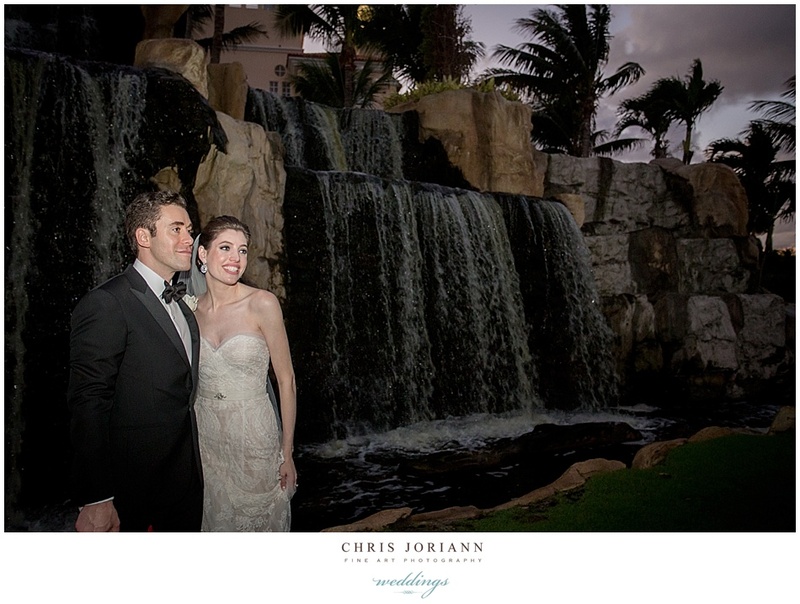 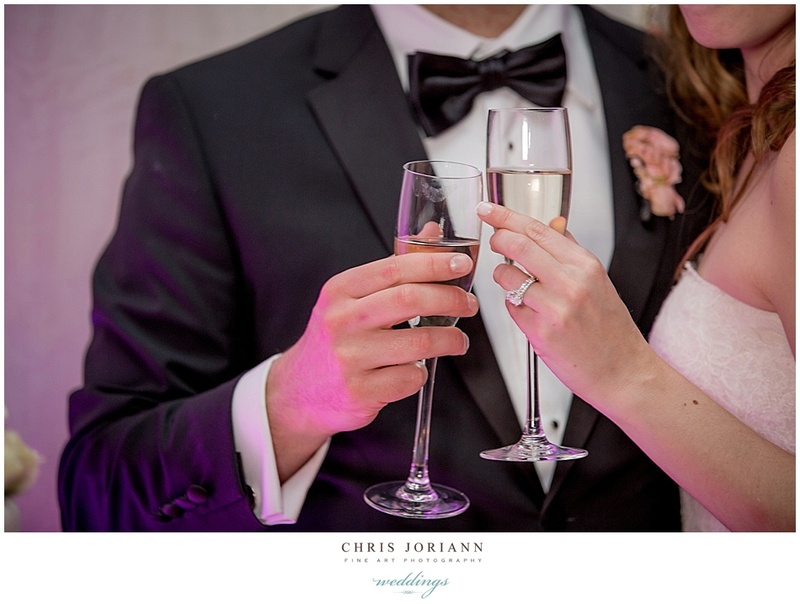 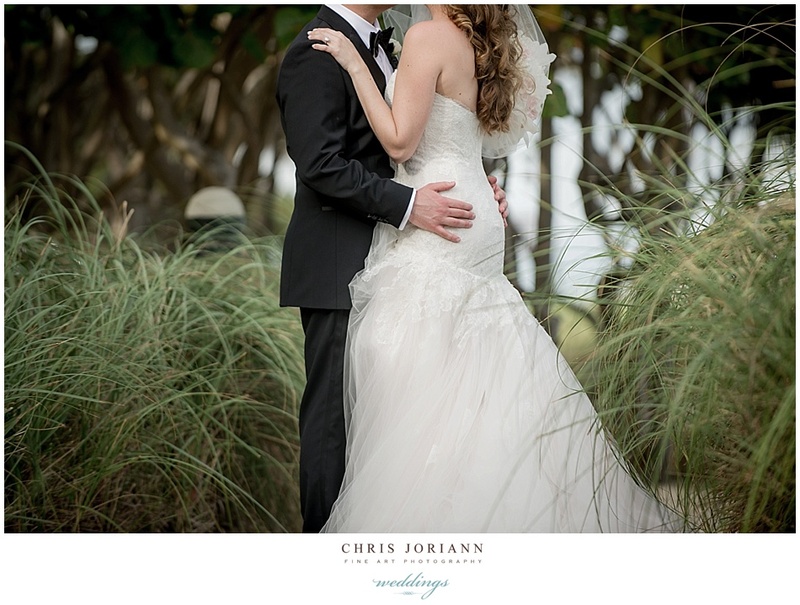 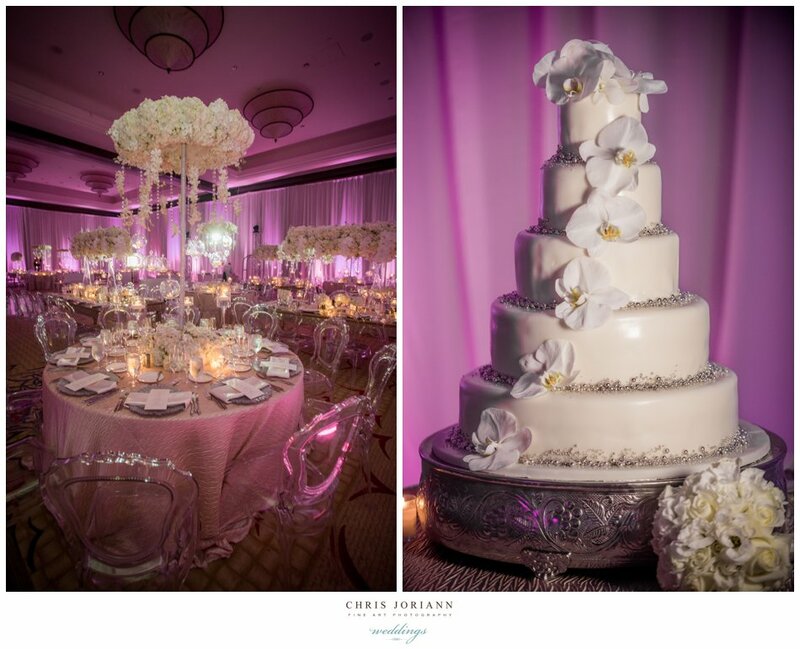 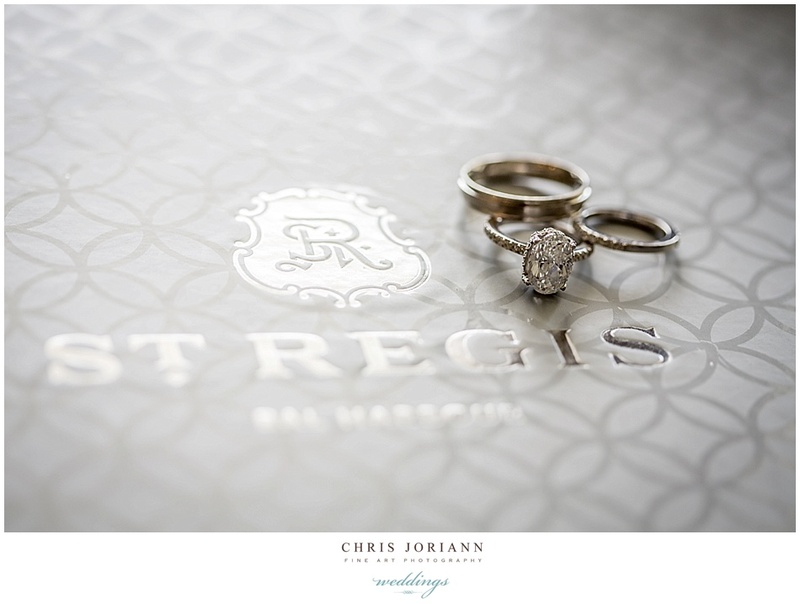 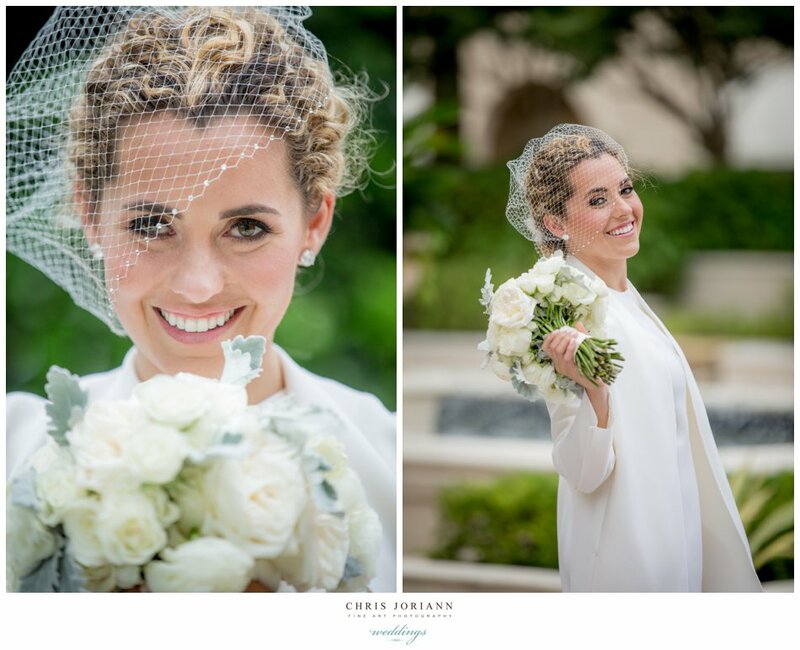 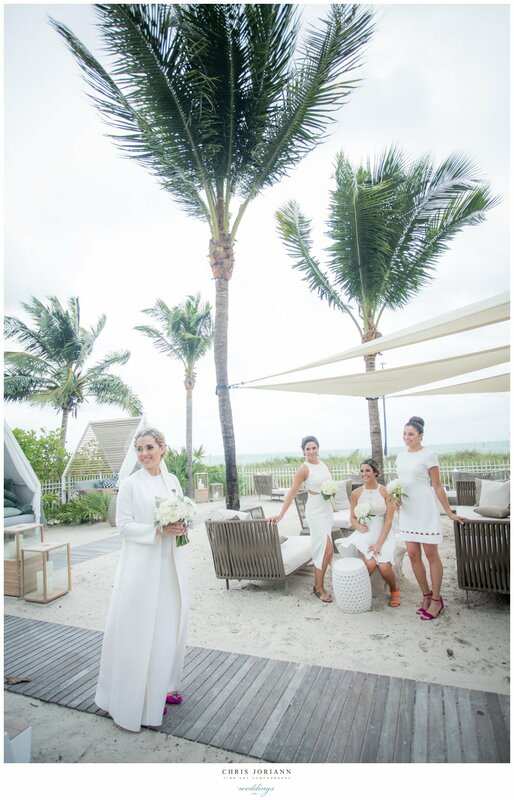 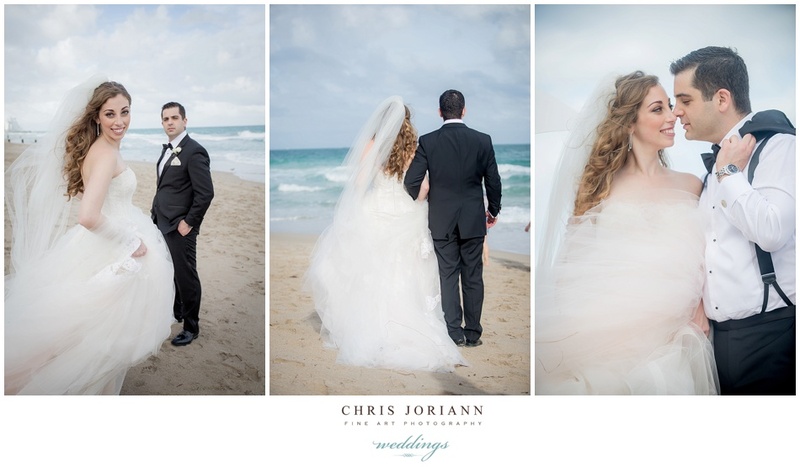 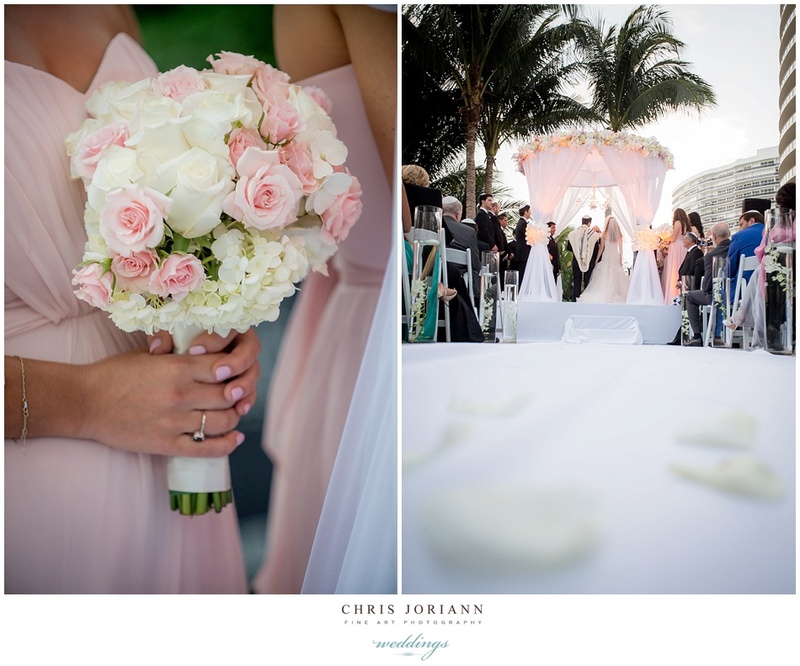 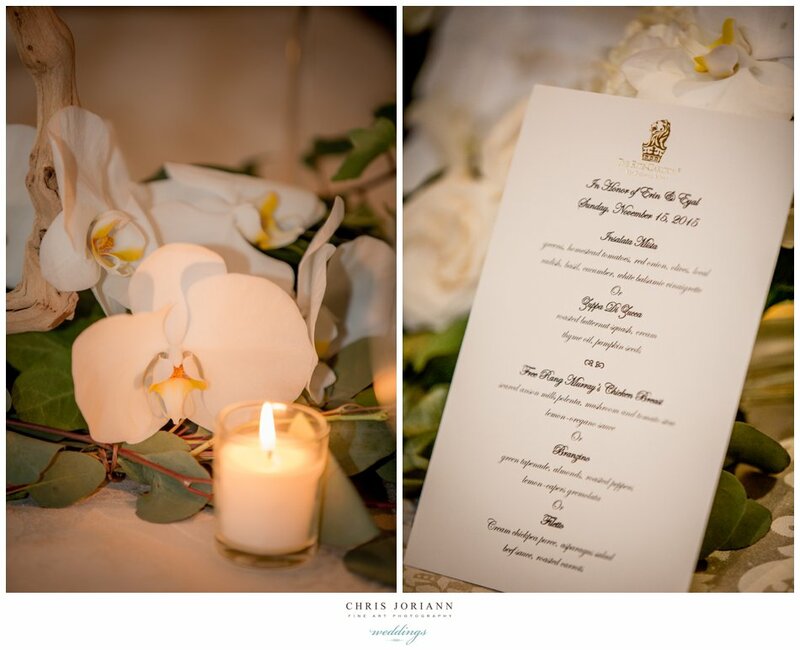 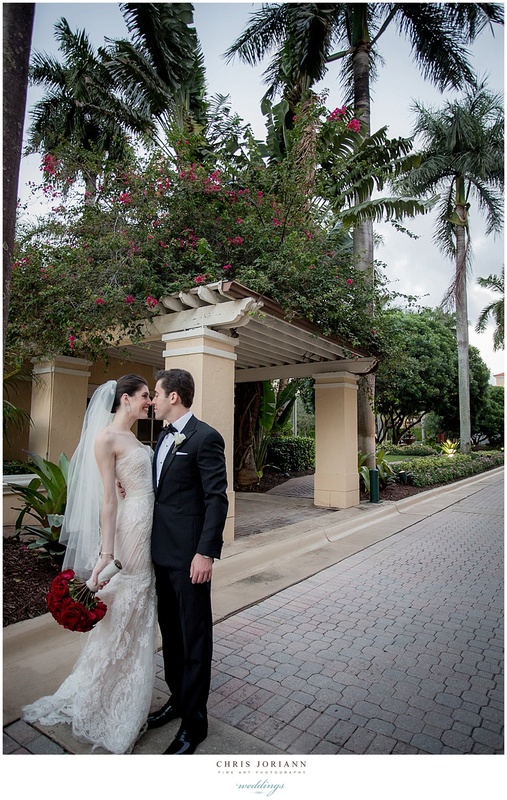 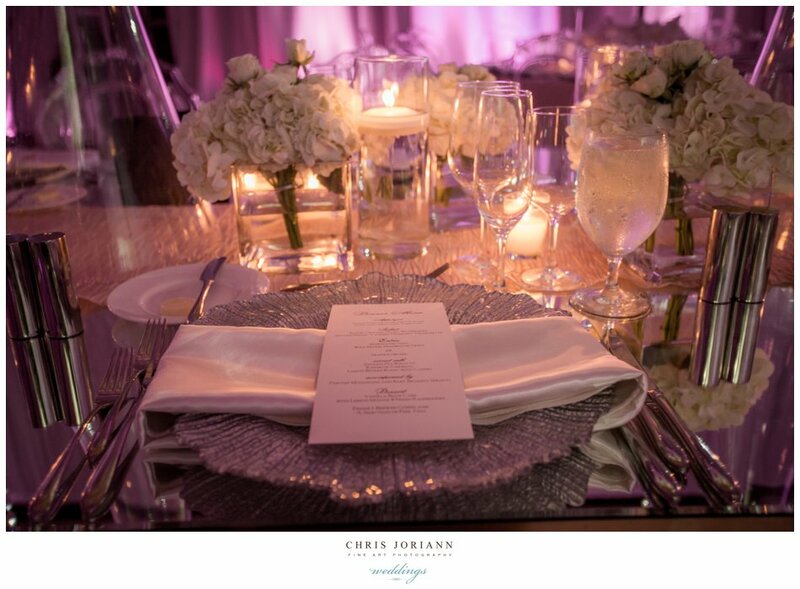 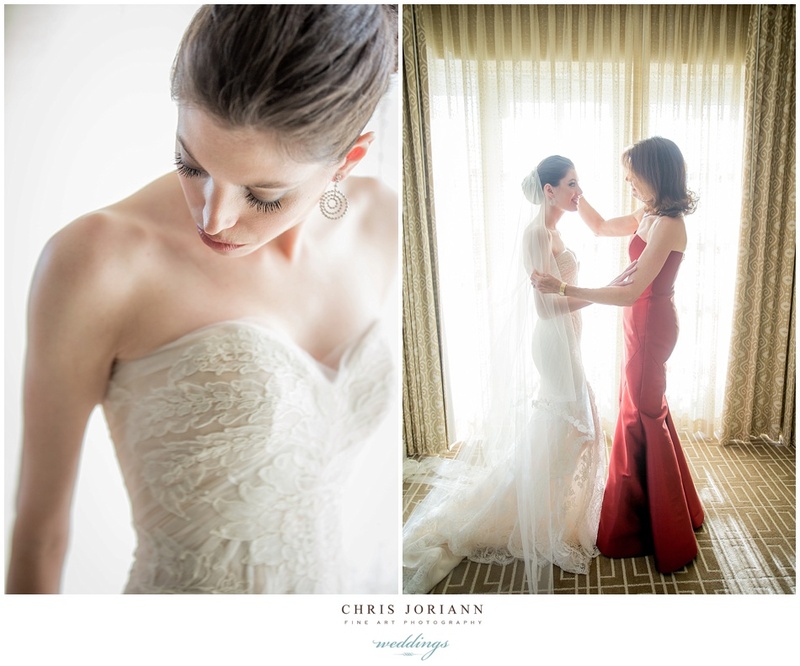 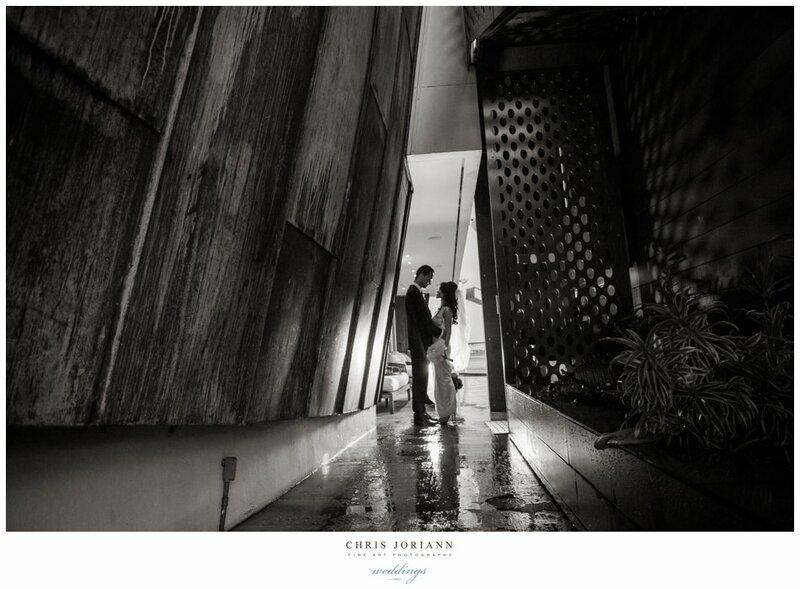 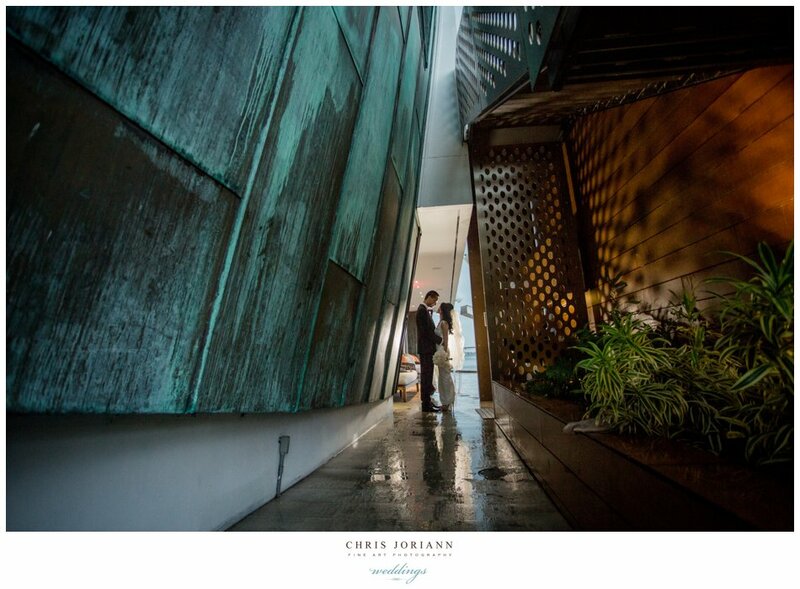 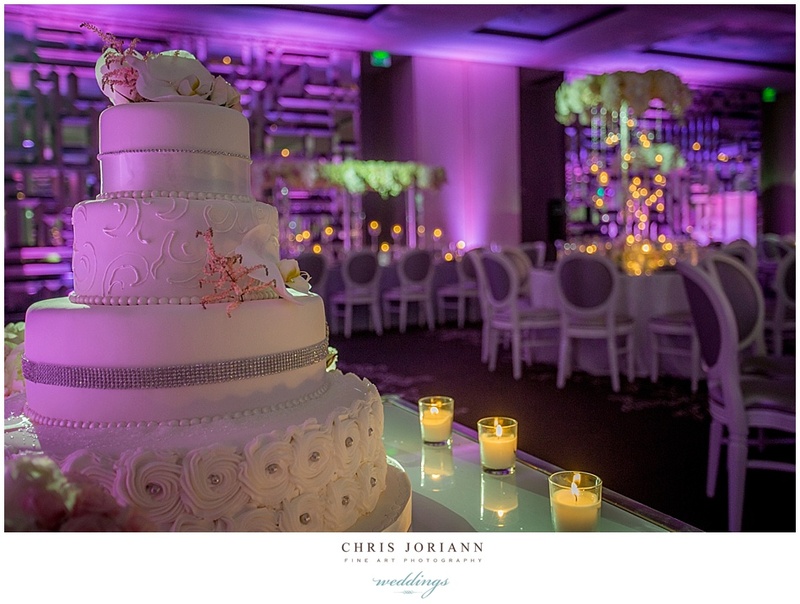 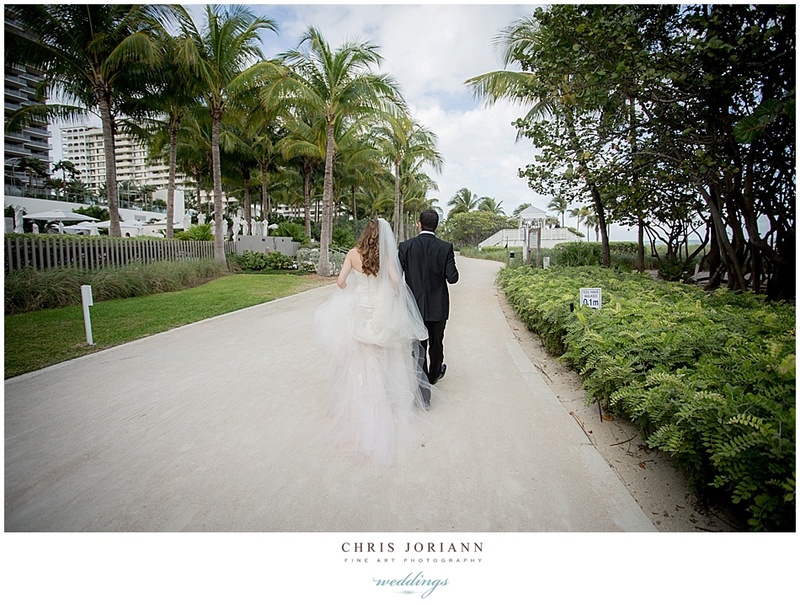 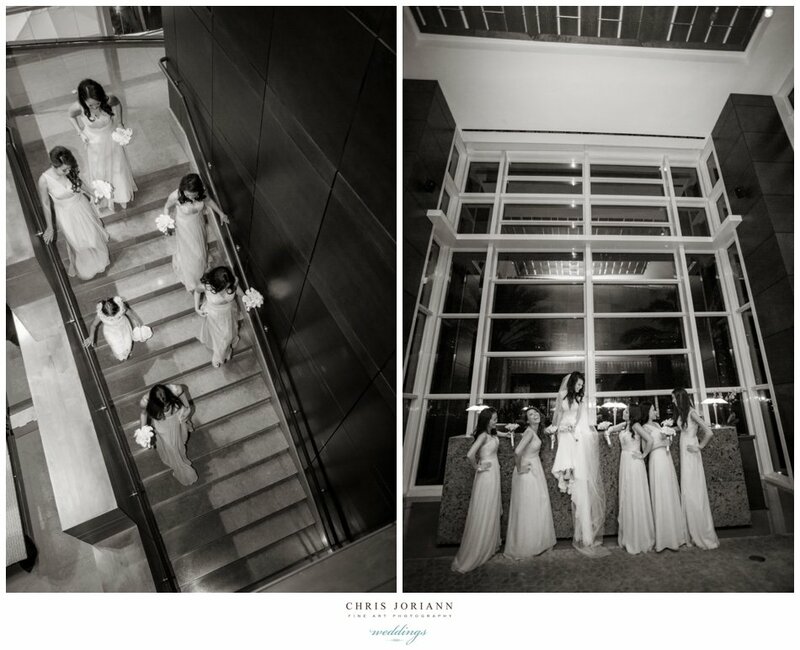 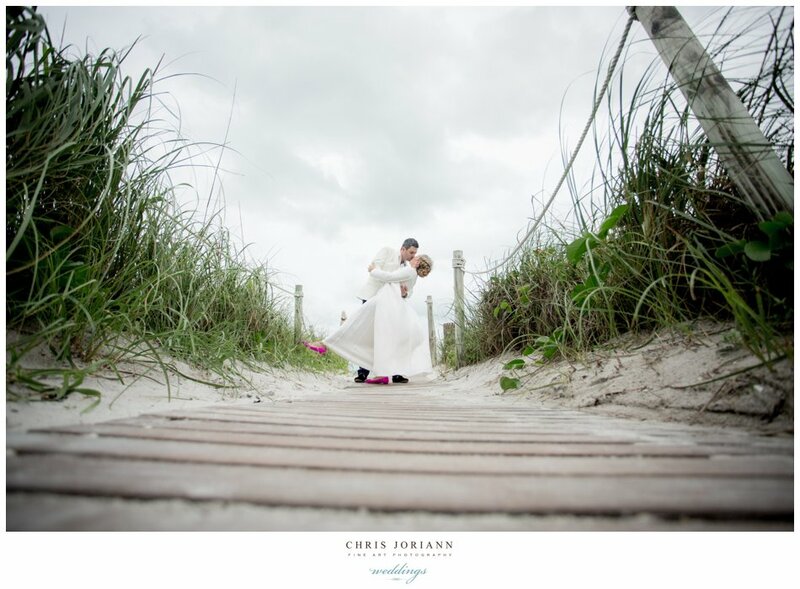 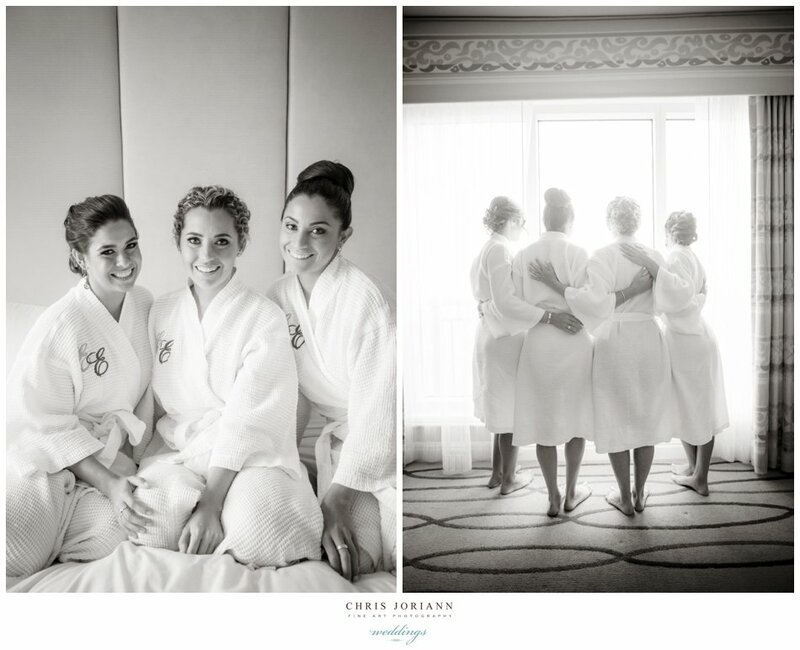 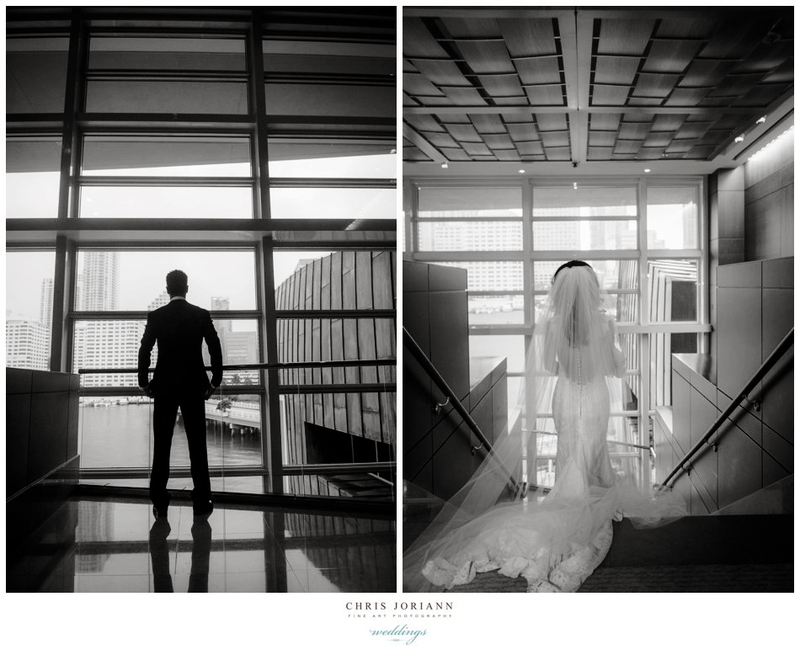 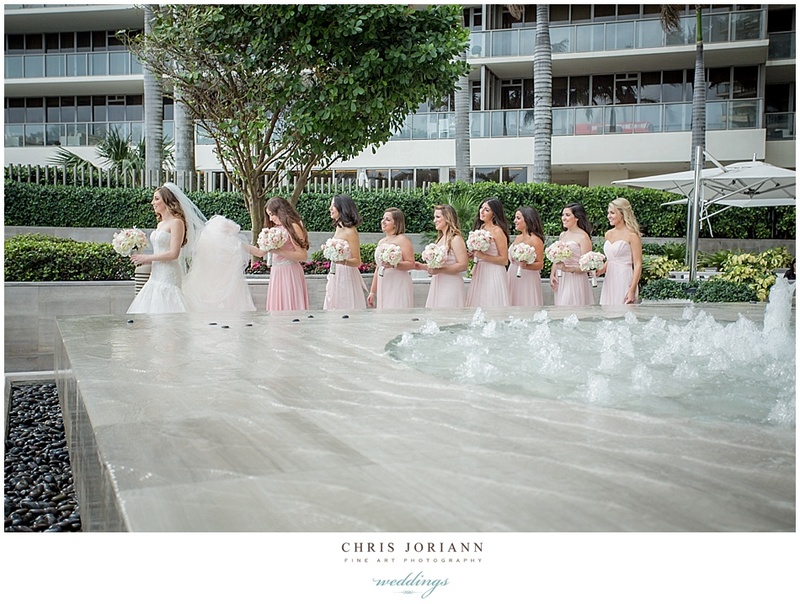 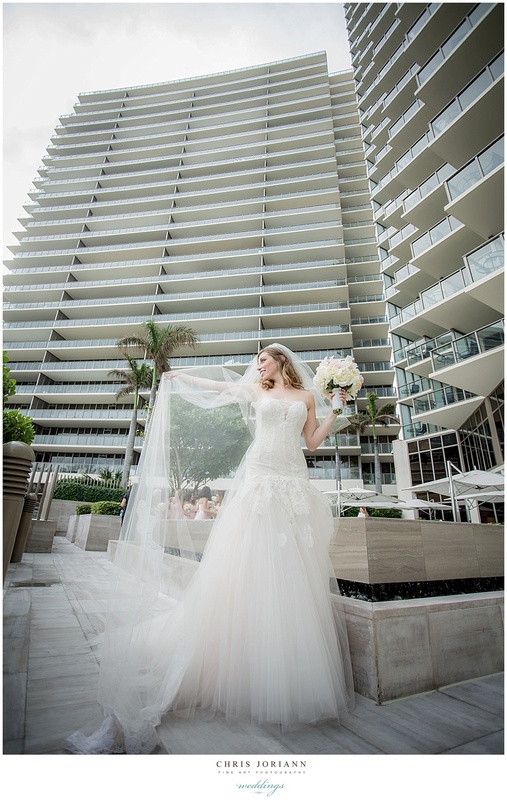 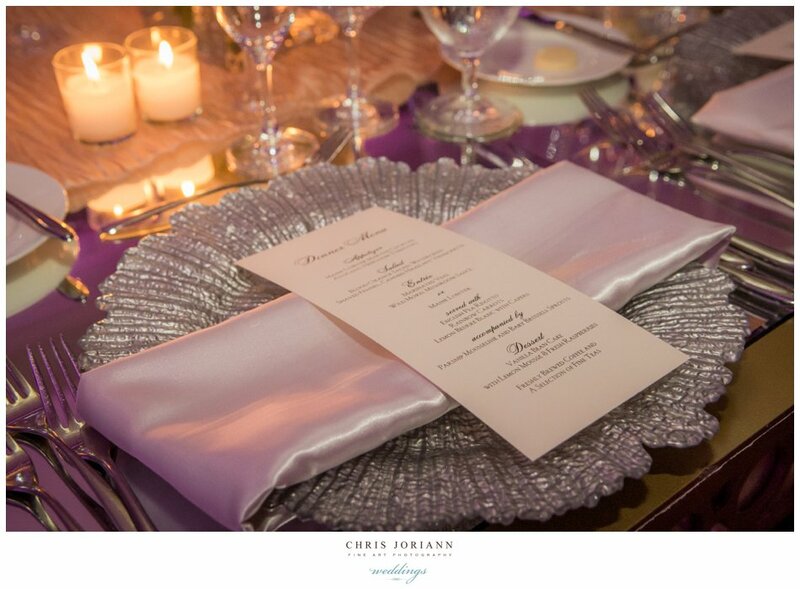 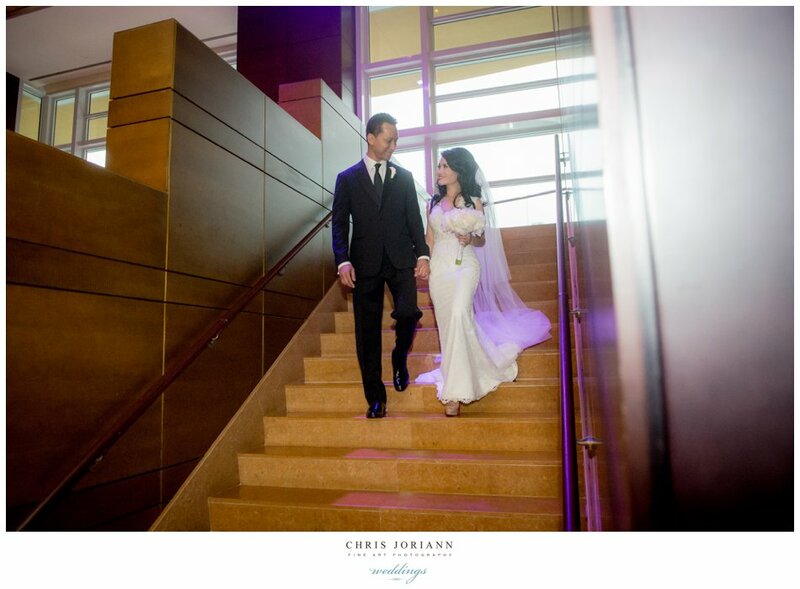 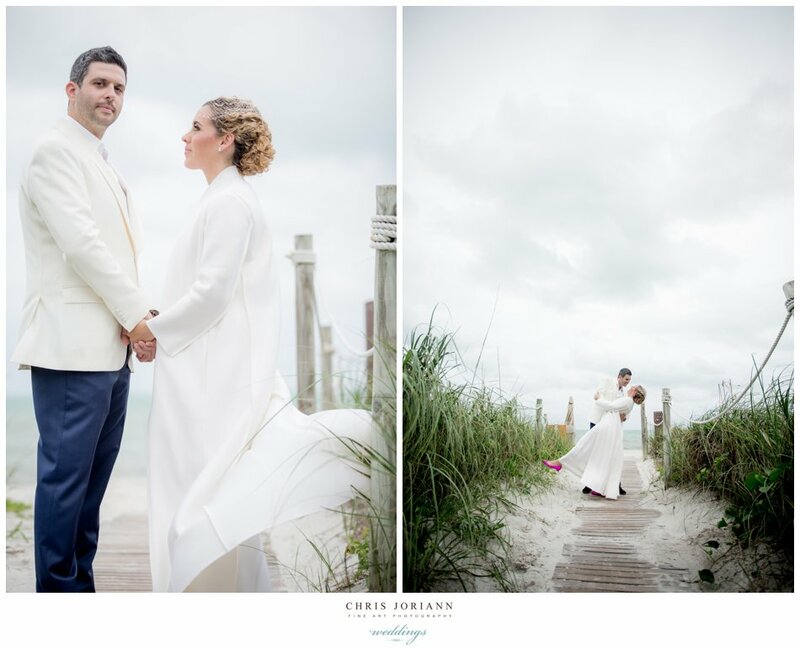 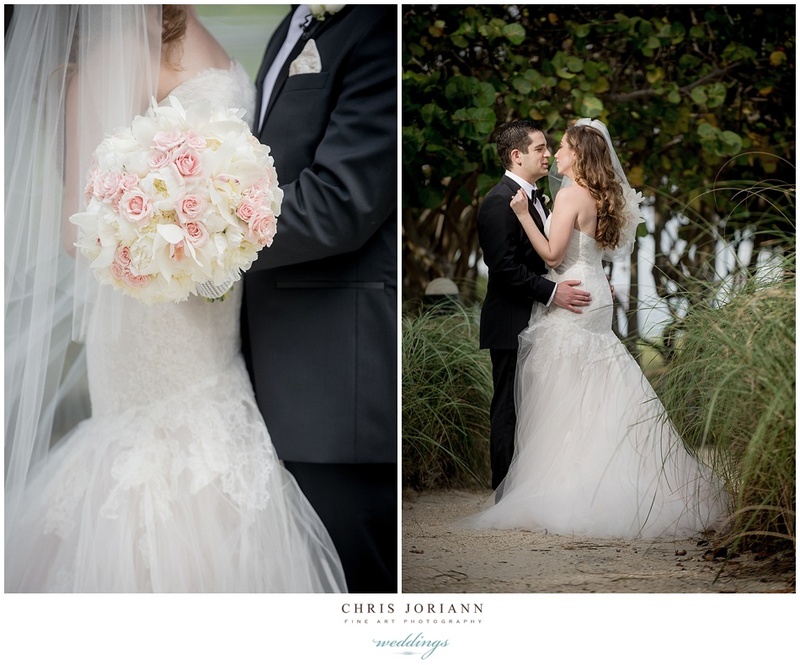 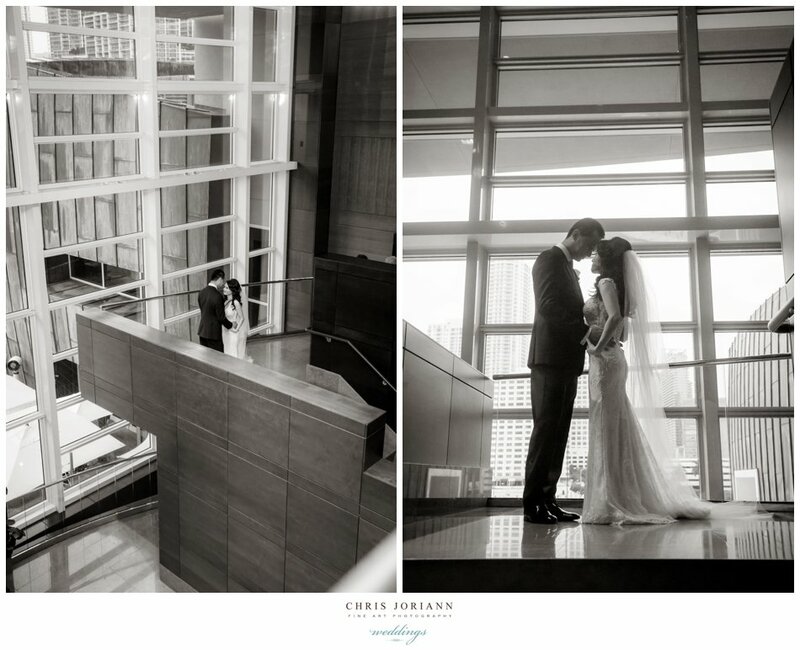 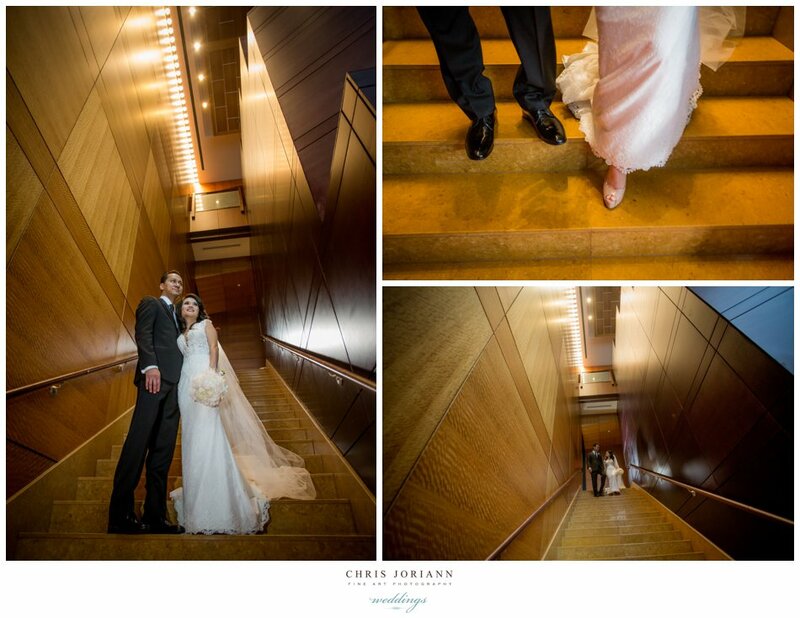 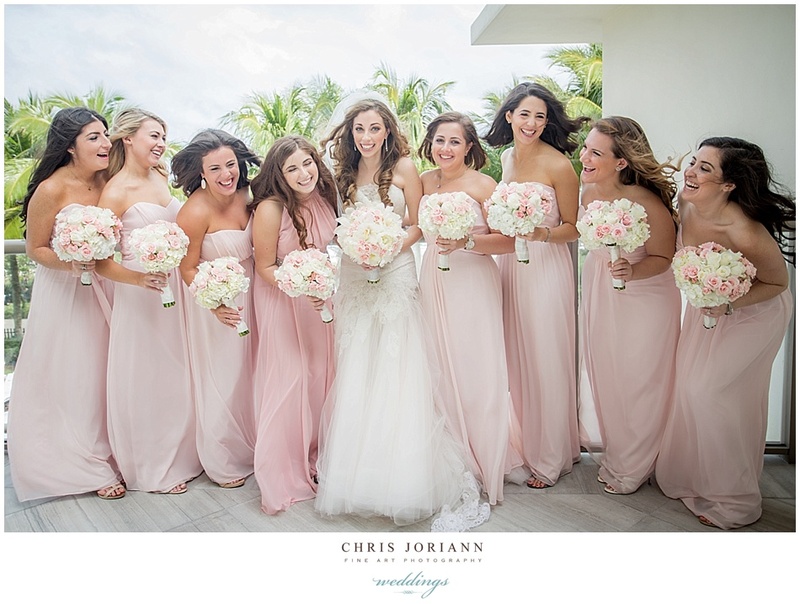 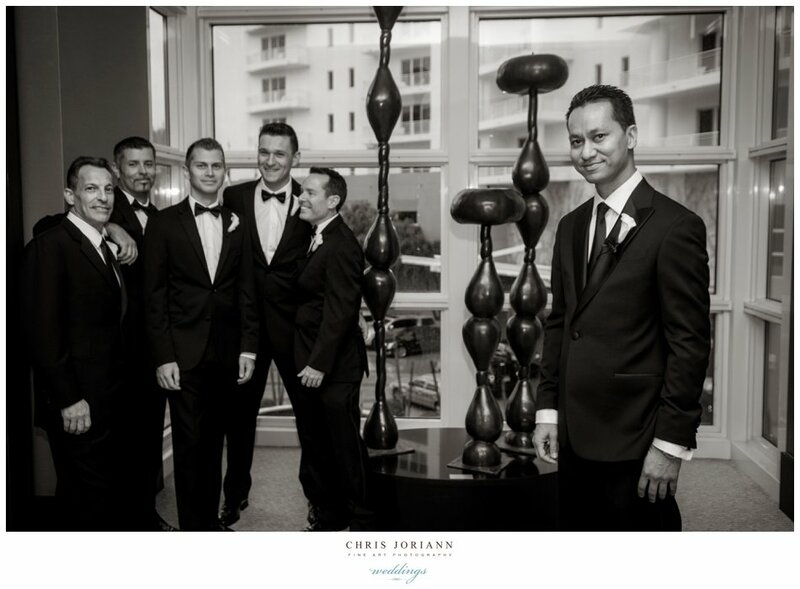 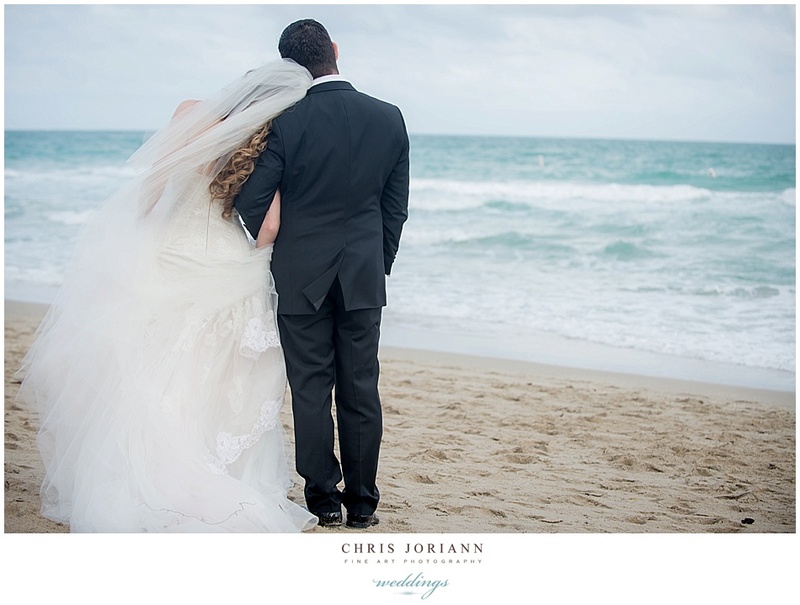 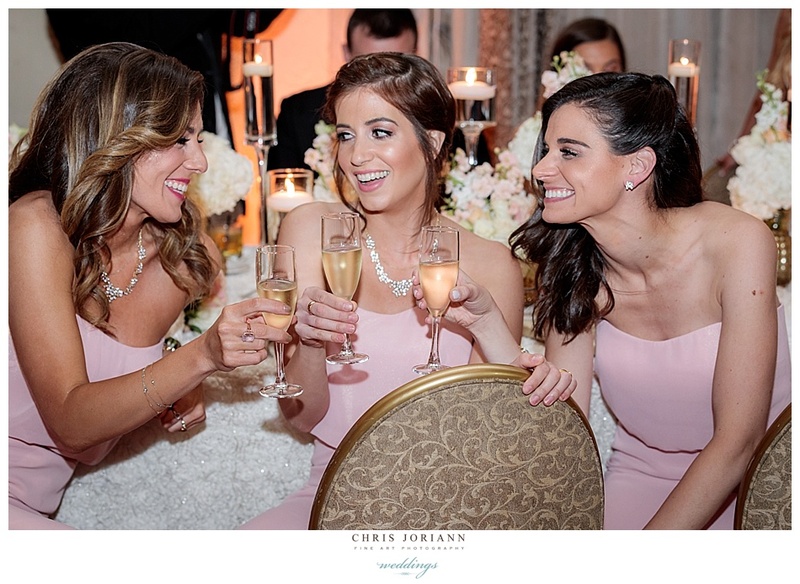 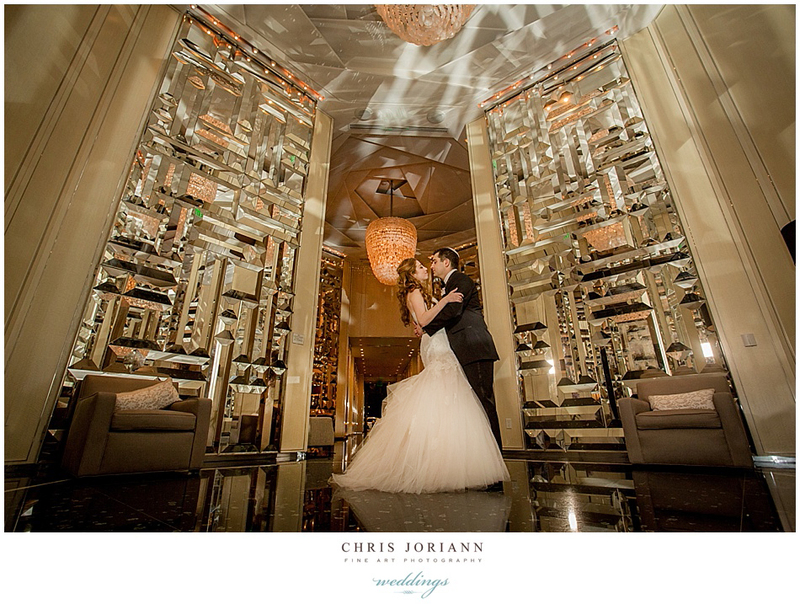 The St. Regis Bal Harbour Resort was the chosen venue for Maura + Zachary’s fabulous destination wedding. 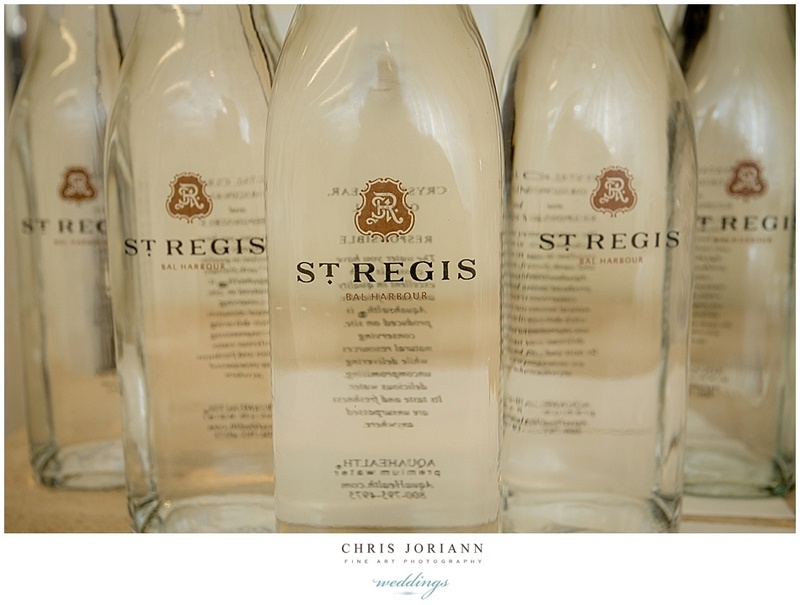 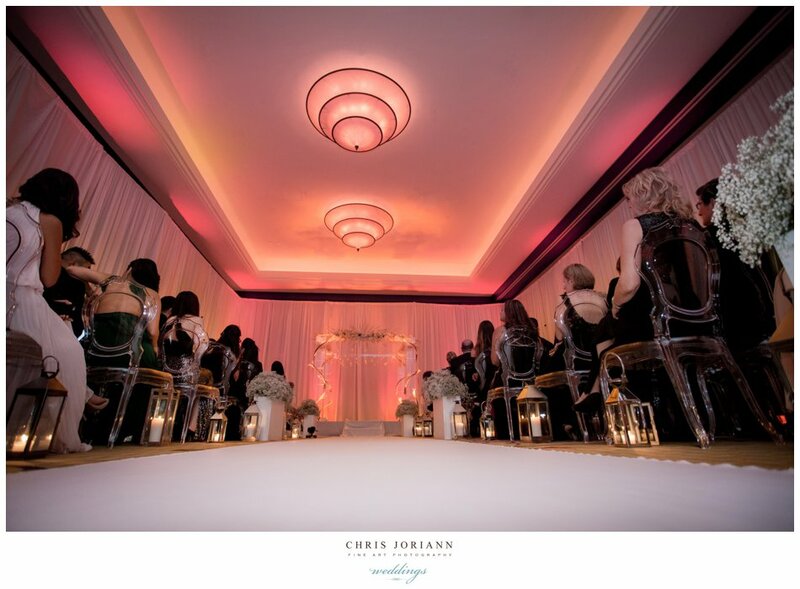 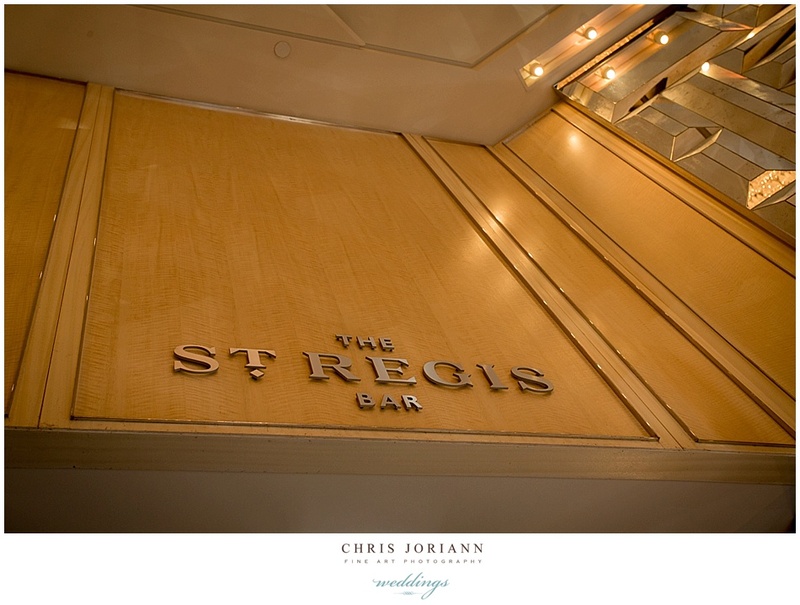 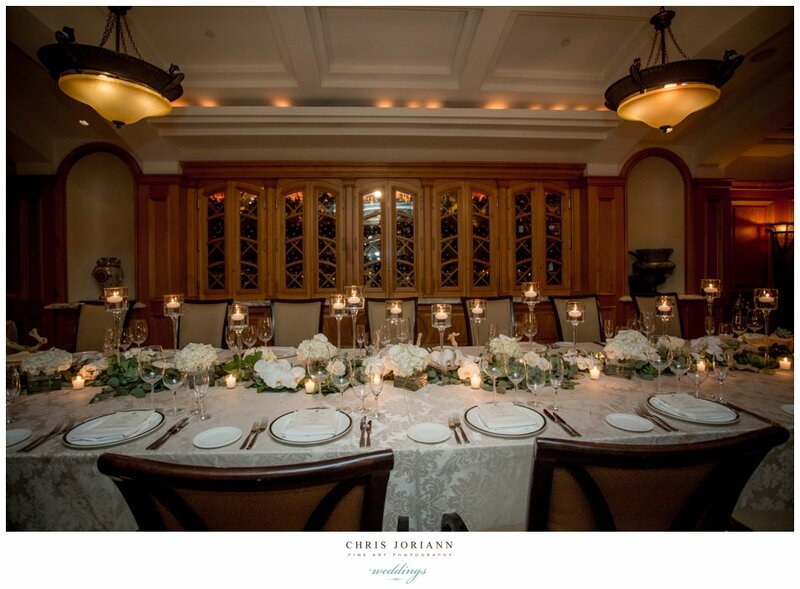 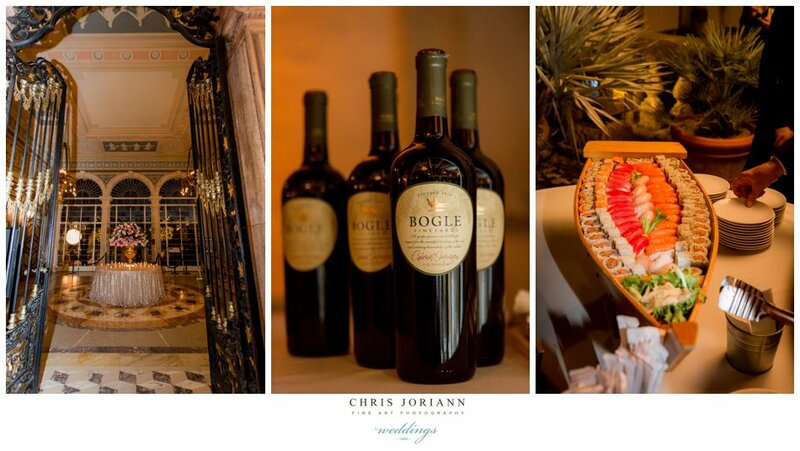 The reception space, was coordinated by planner Jamie Lipman for Absolute Events, and directed by Nancy Brenner for the St. Regis. 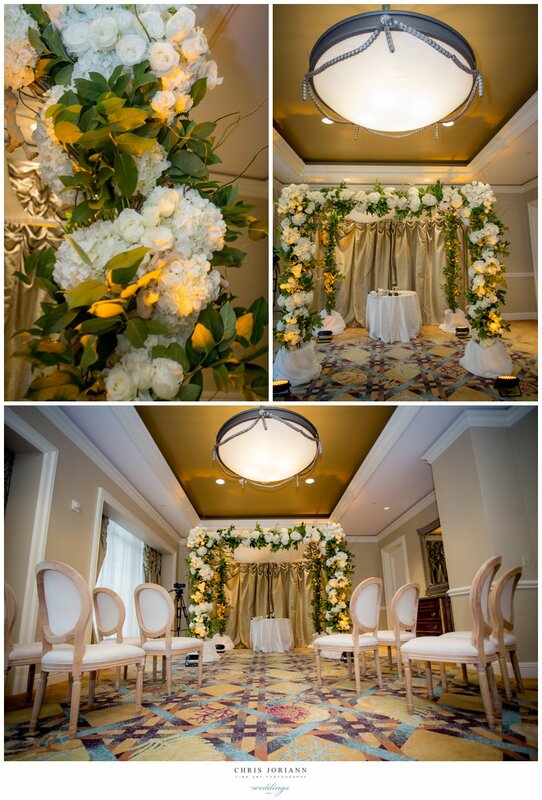 Décor + florals by Petal Productions transformed the space. 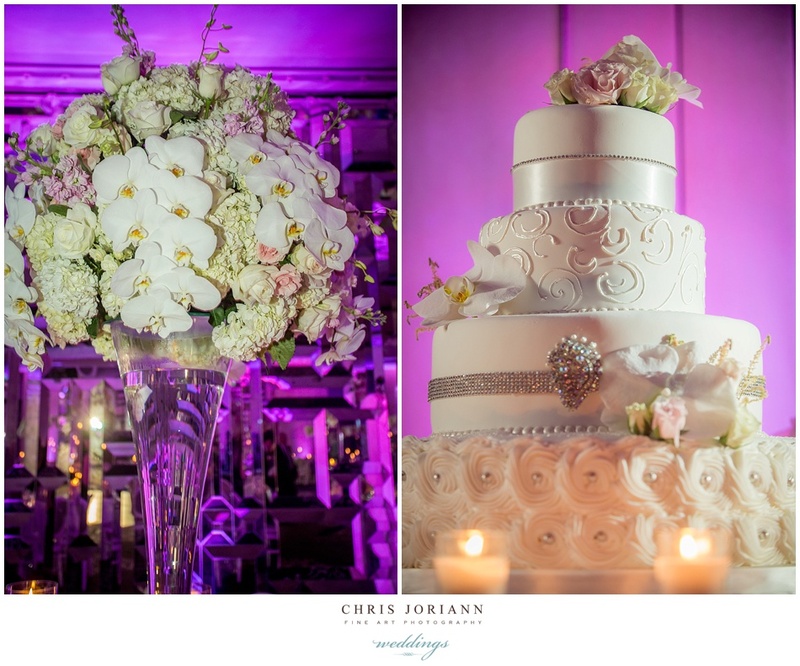 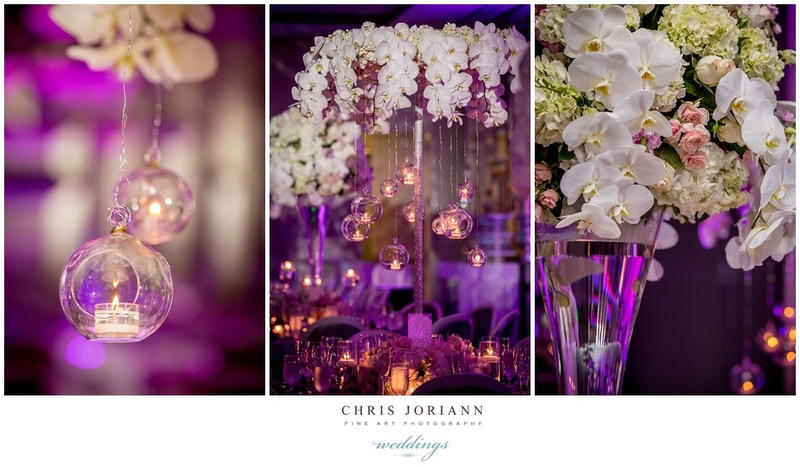 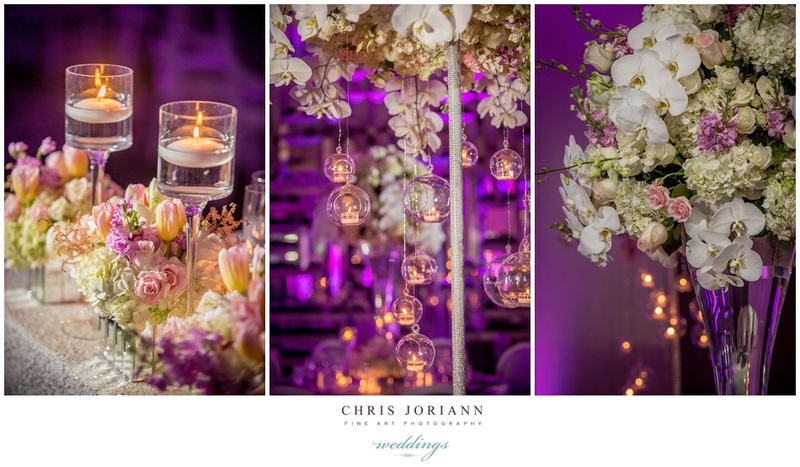 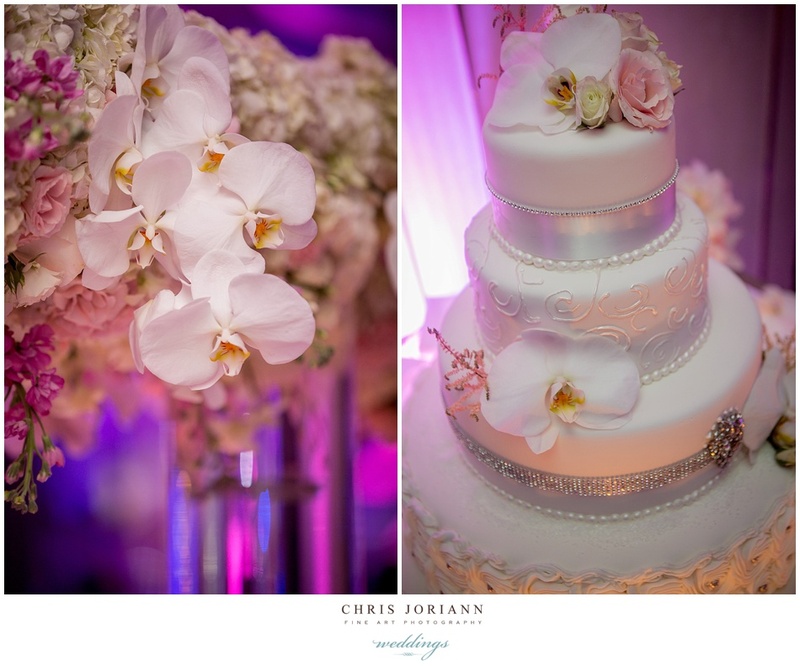 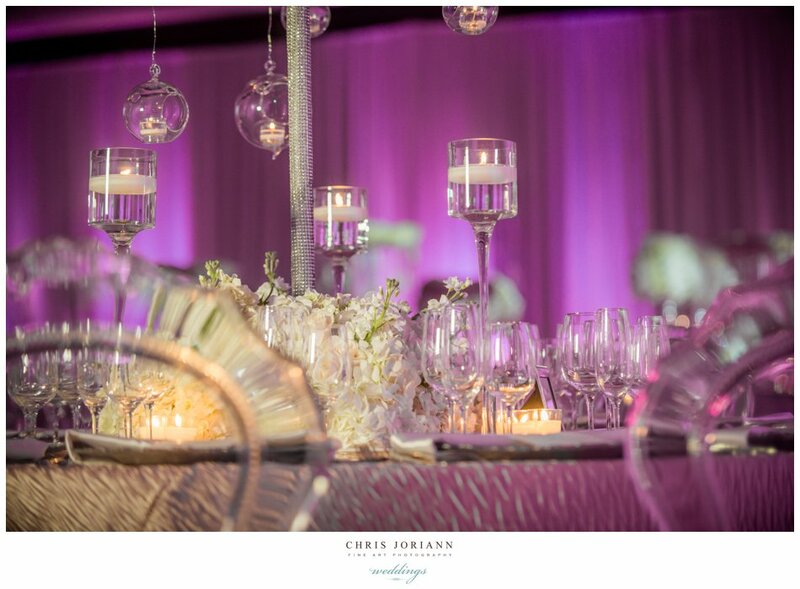 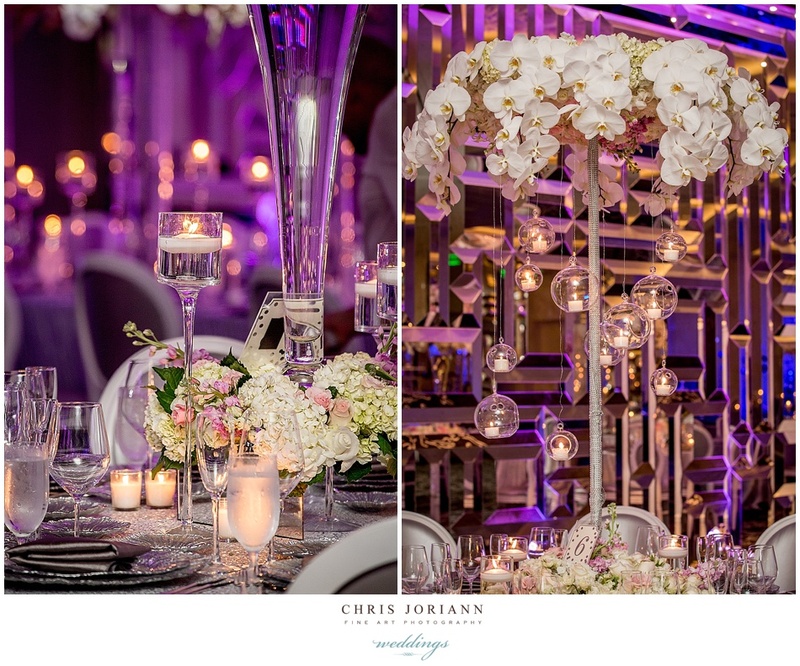 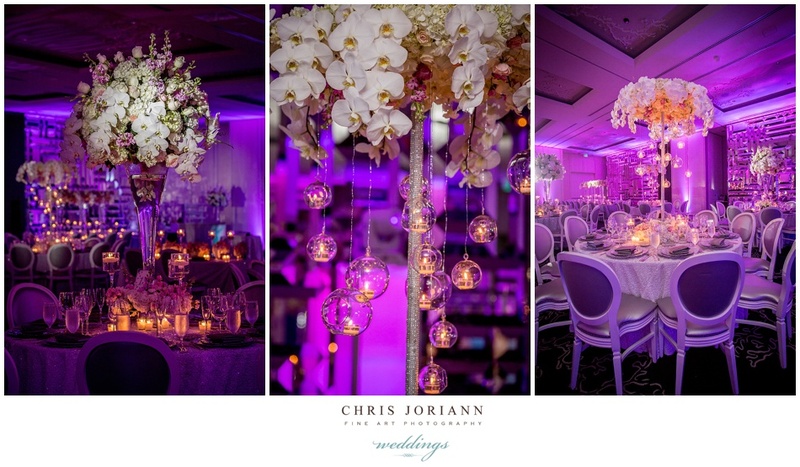 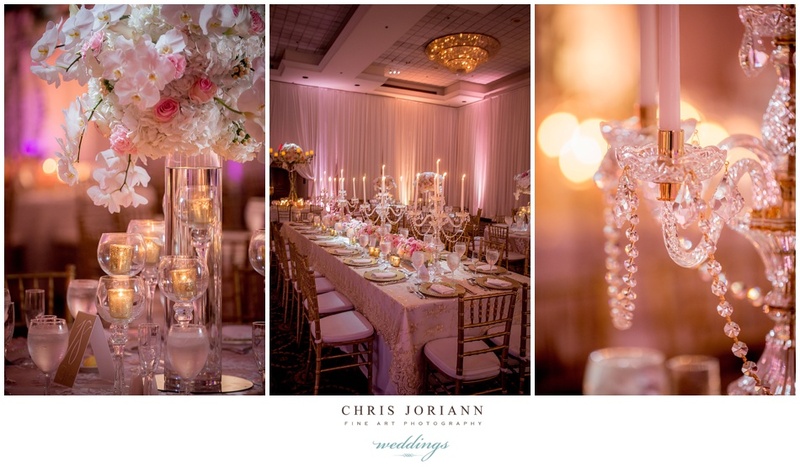 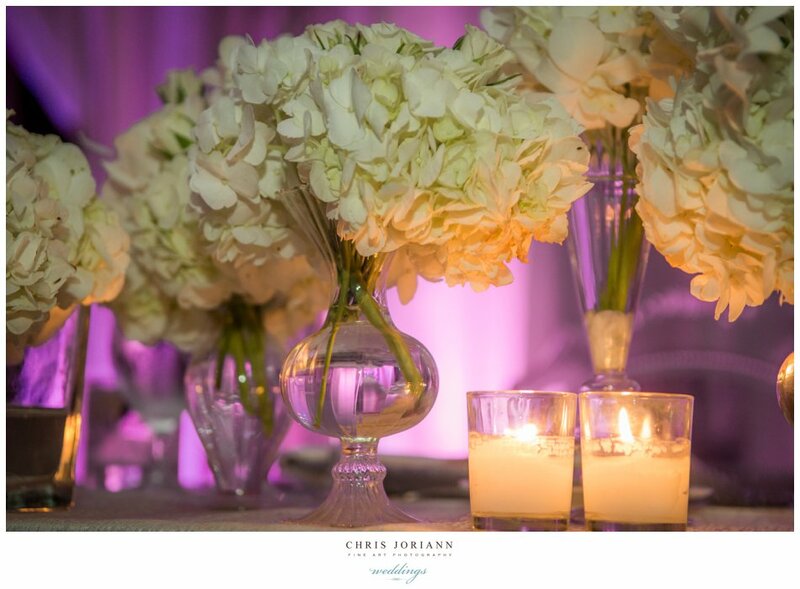 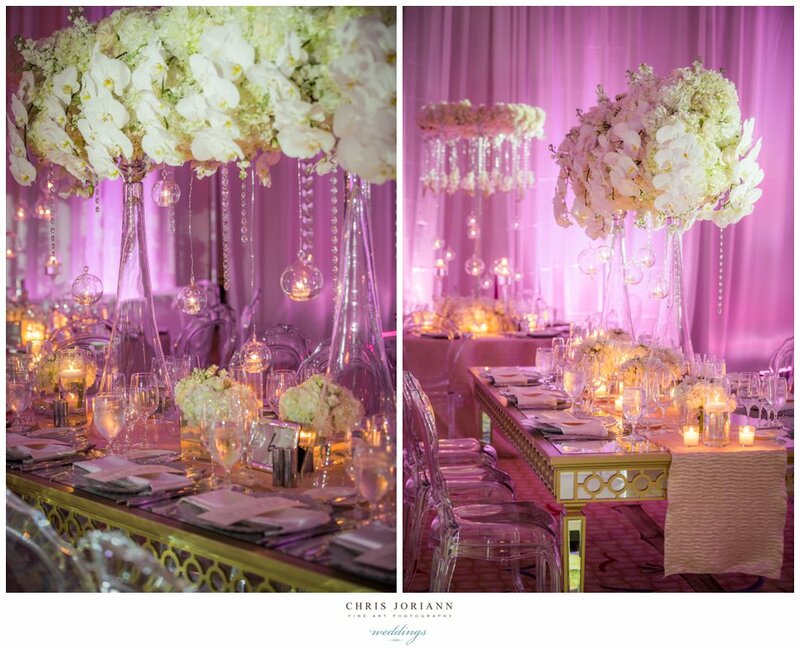 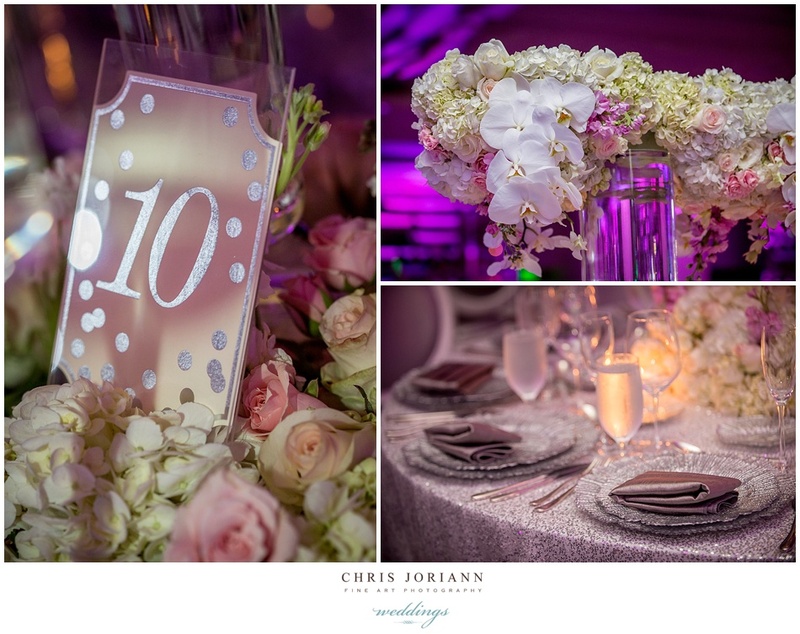 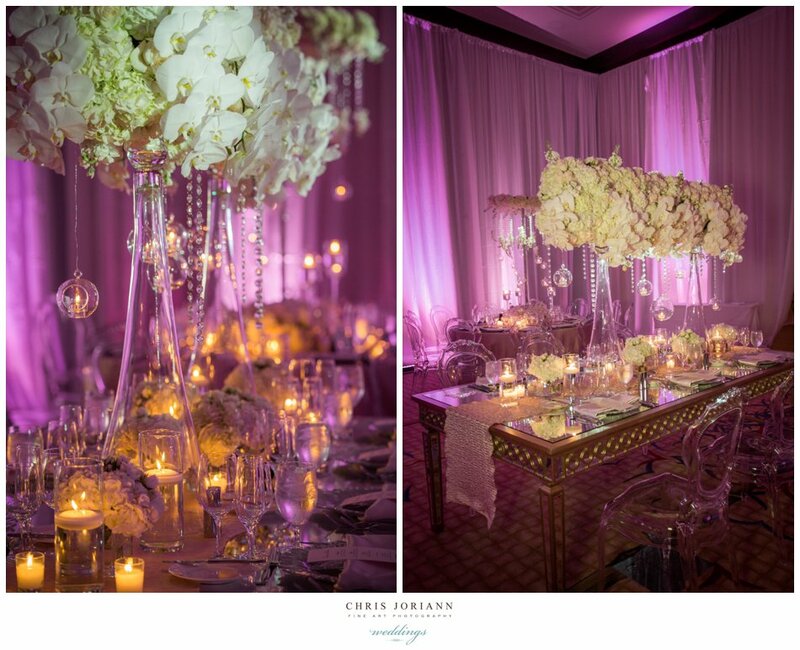 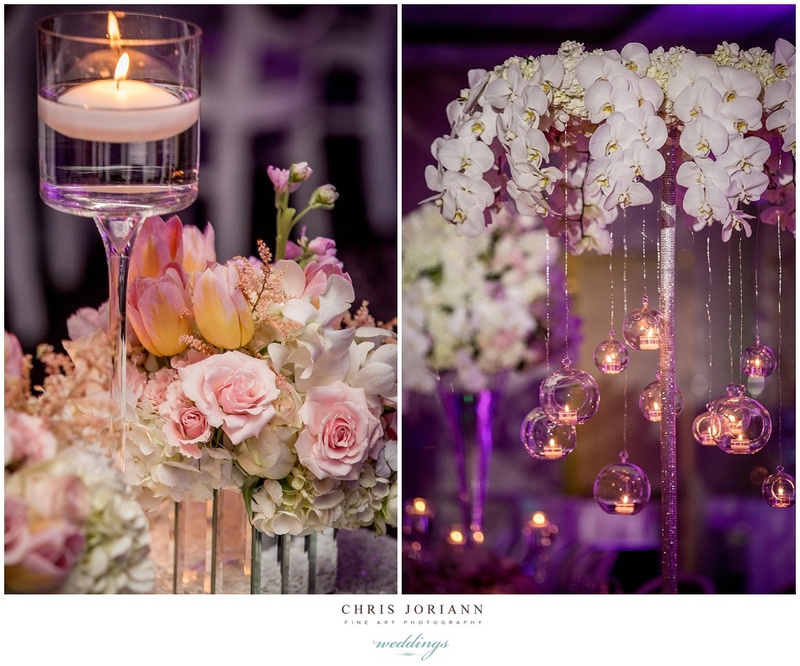 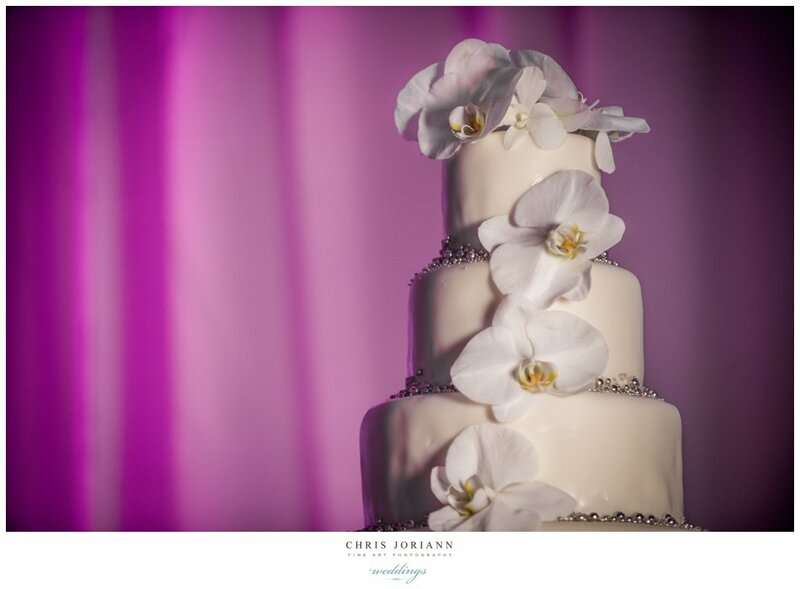 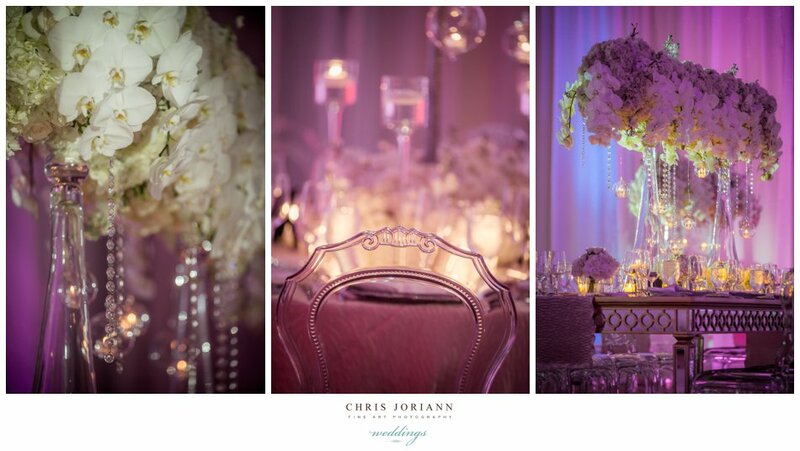 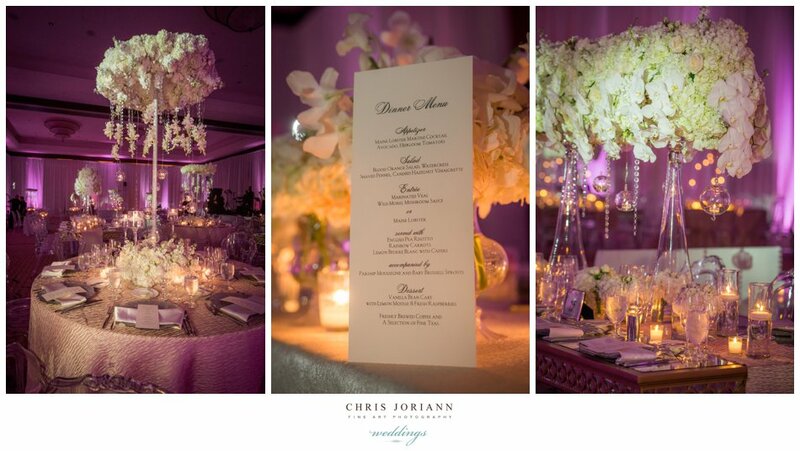 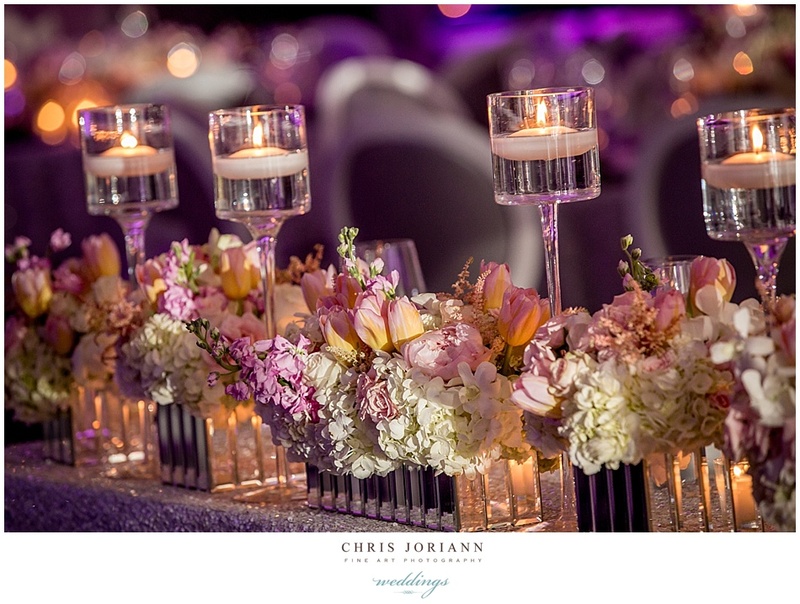 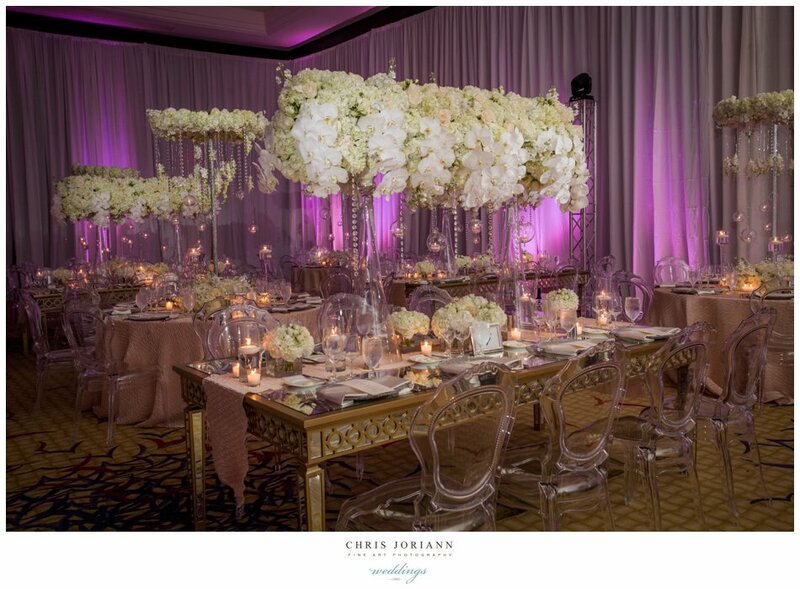 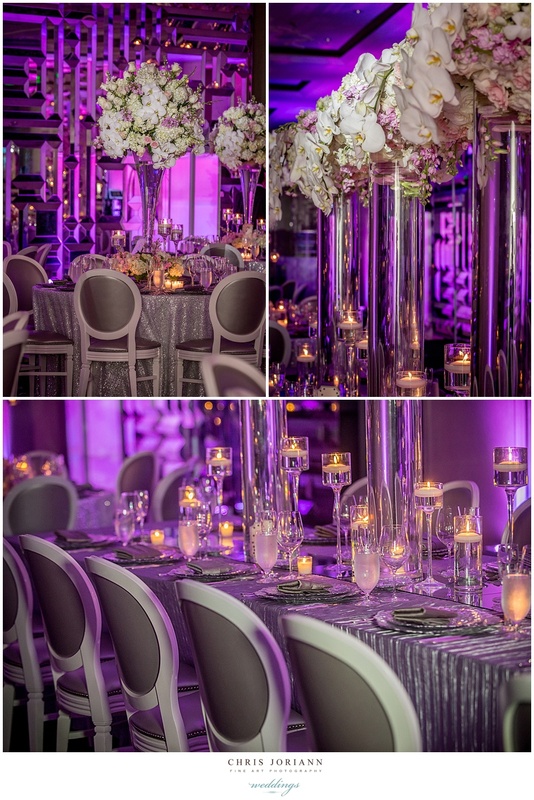 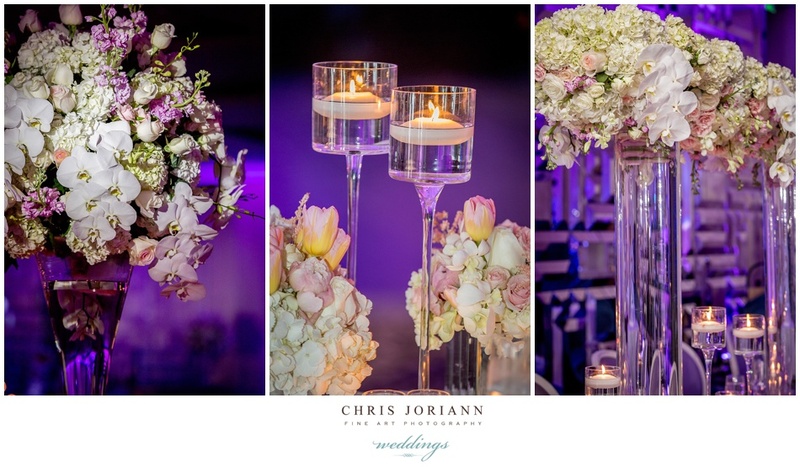 Awash in lavender hues, cascading orchids + floating votives, pastel florals + mercury candelabras created stunning table scapes. 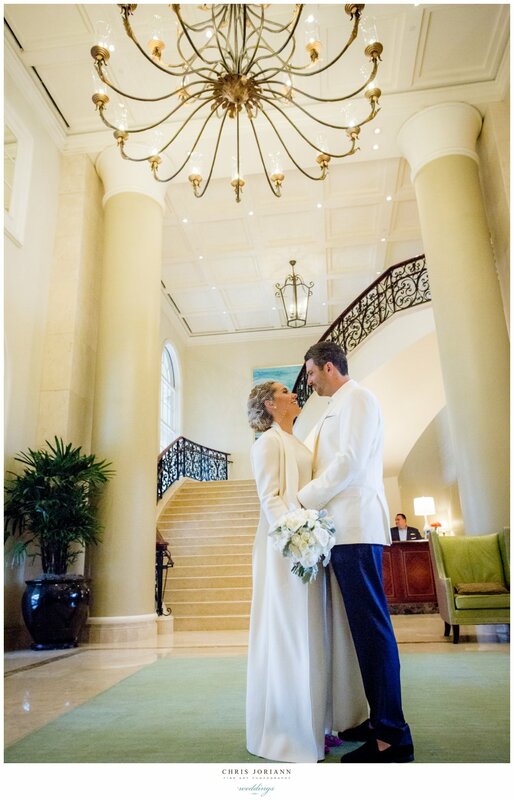 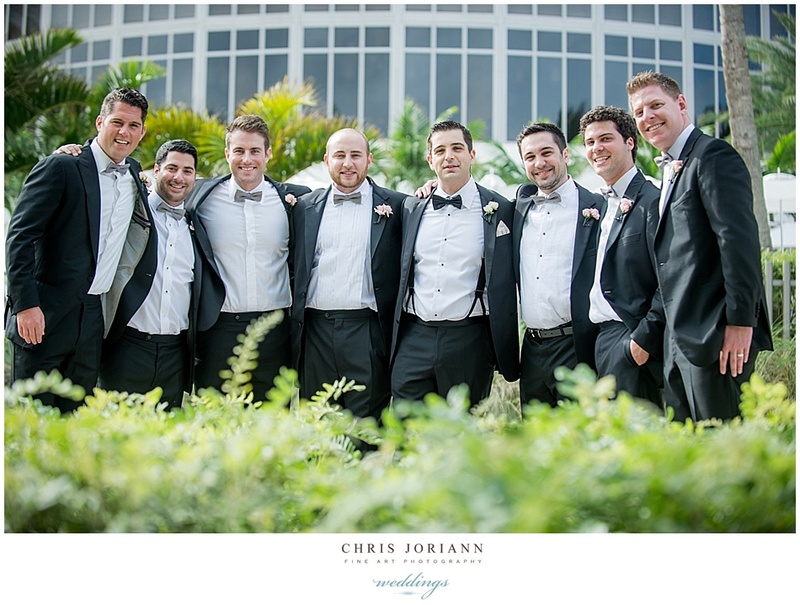 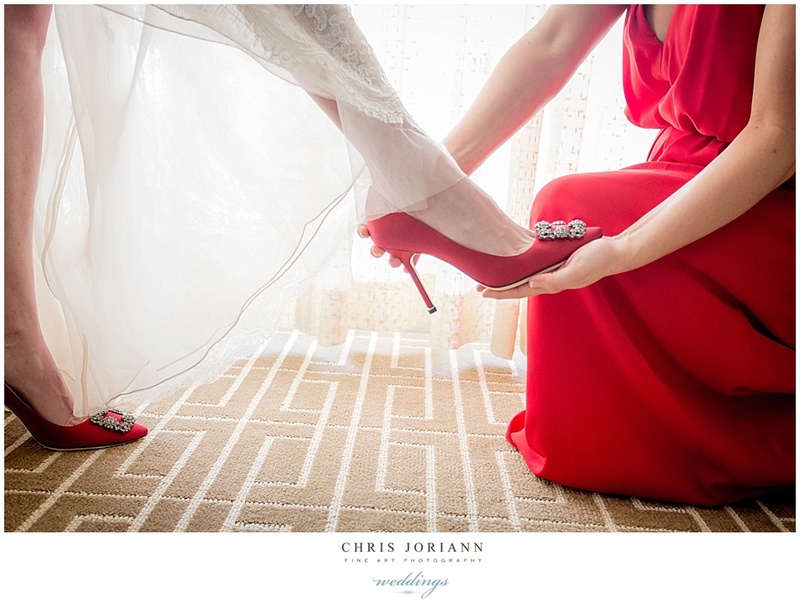 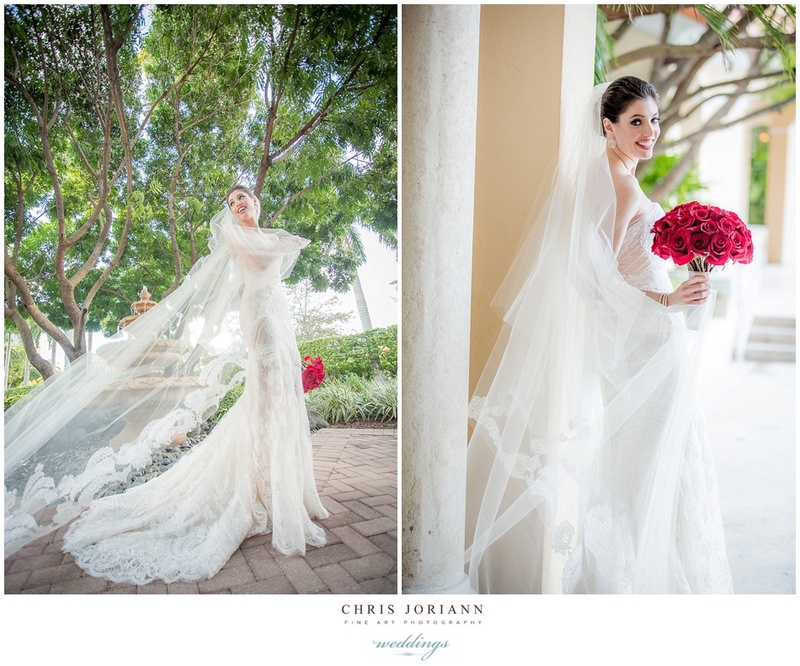 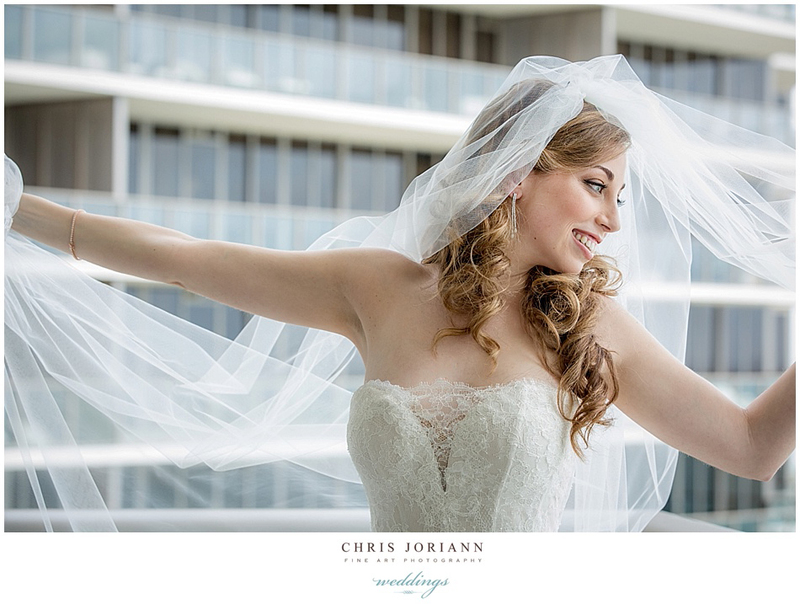 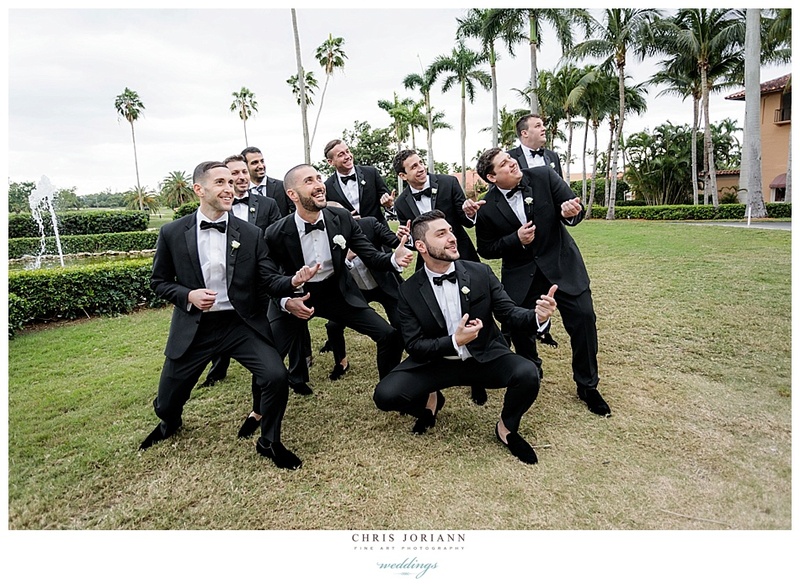 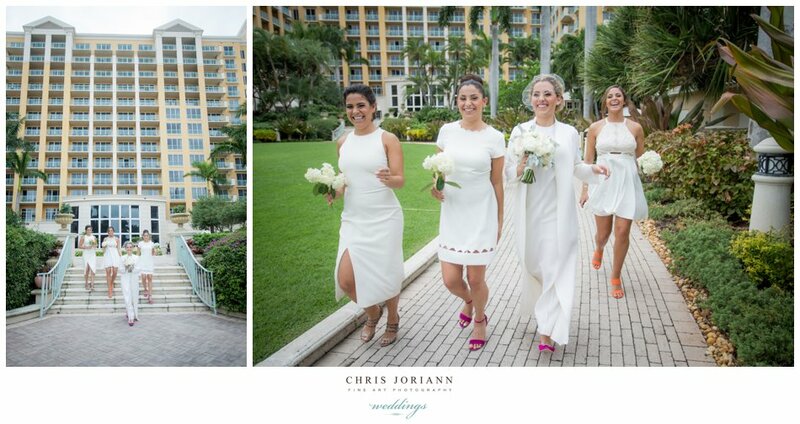 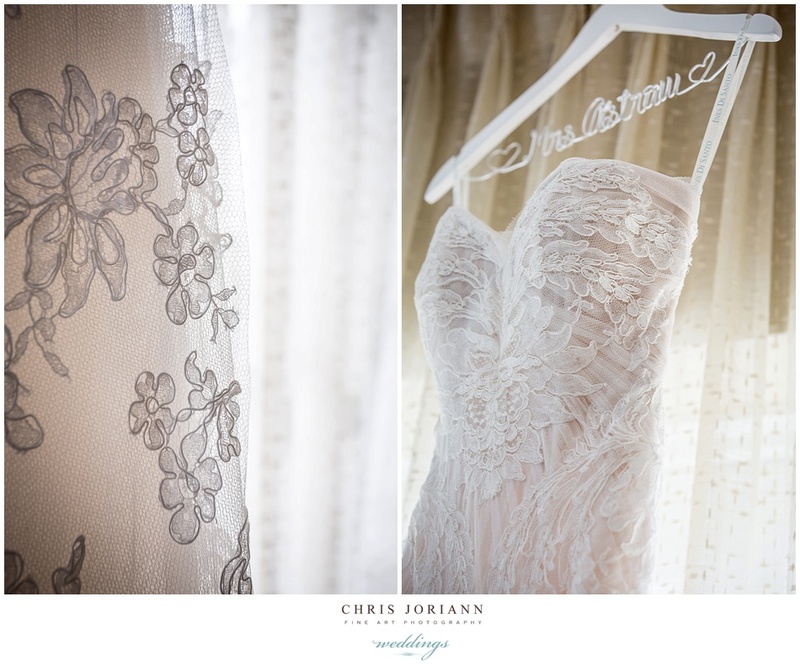 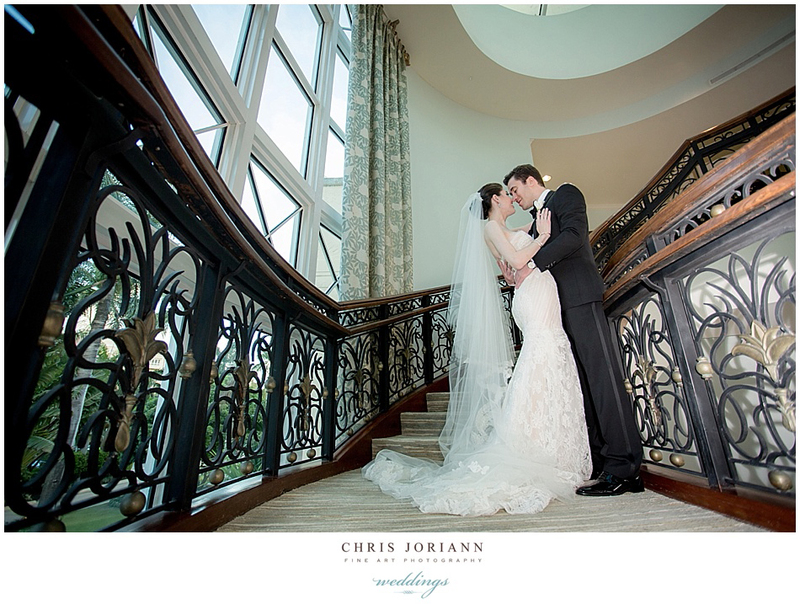 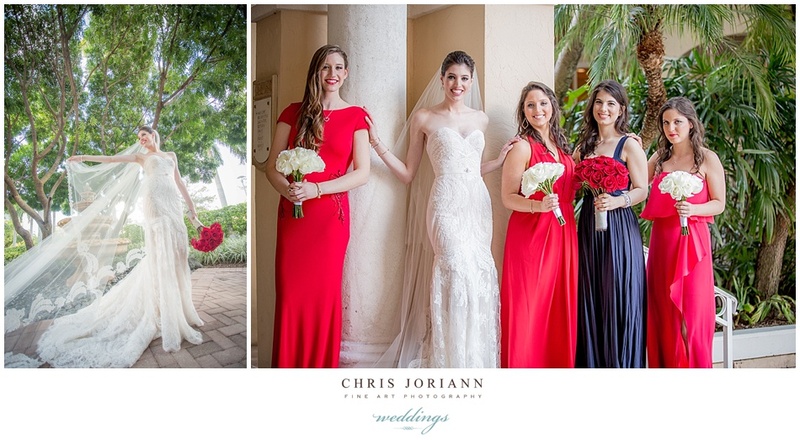 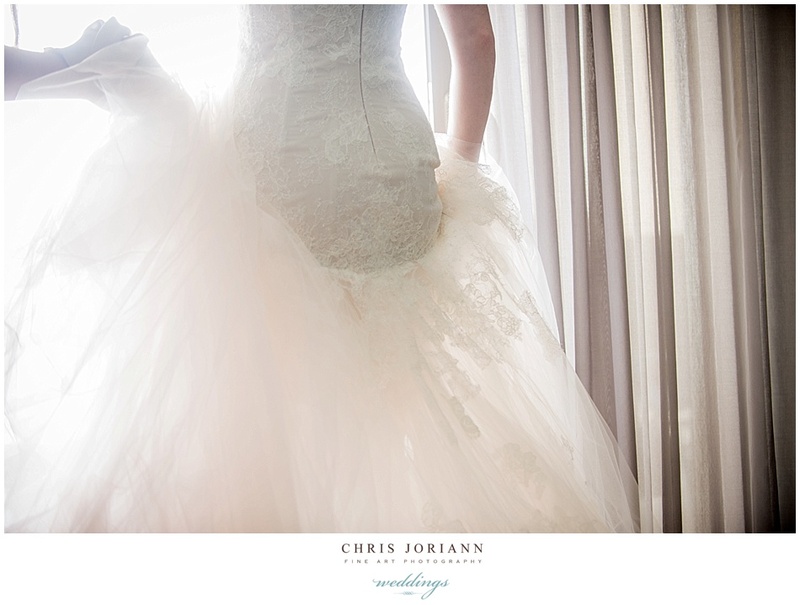 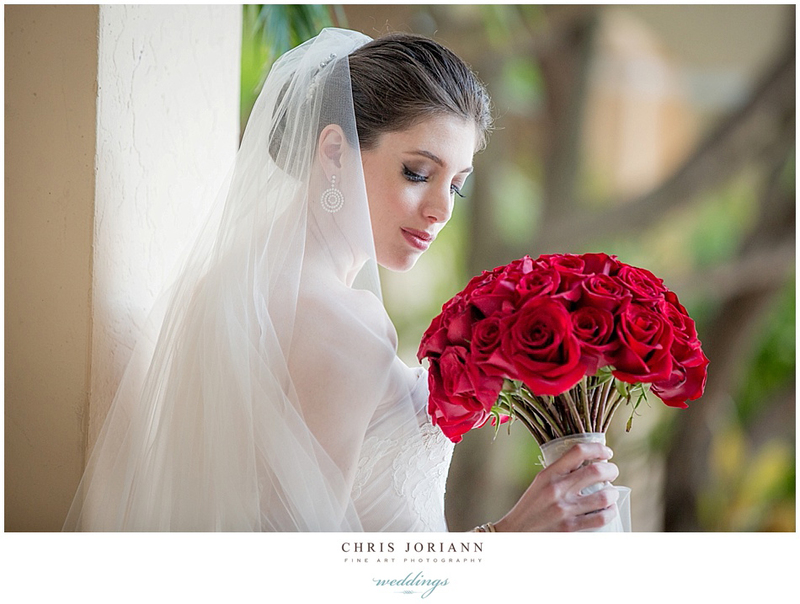 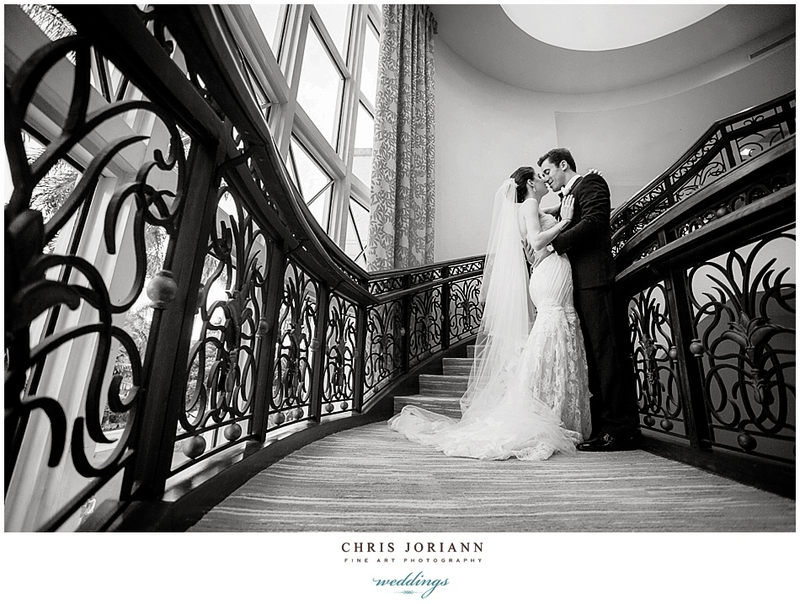 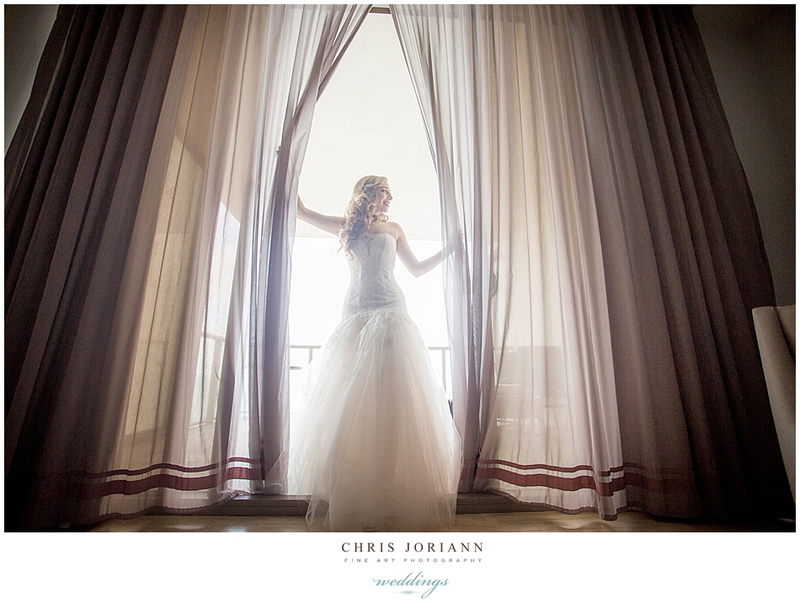 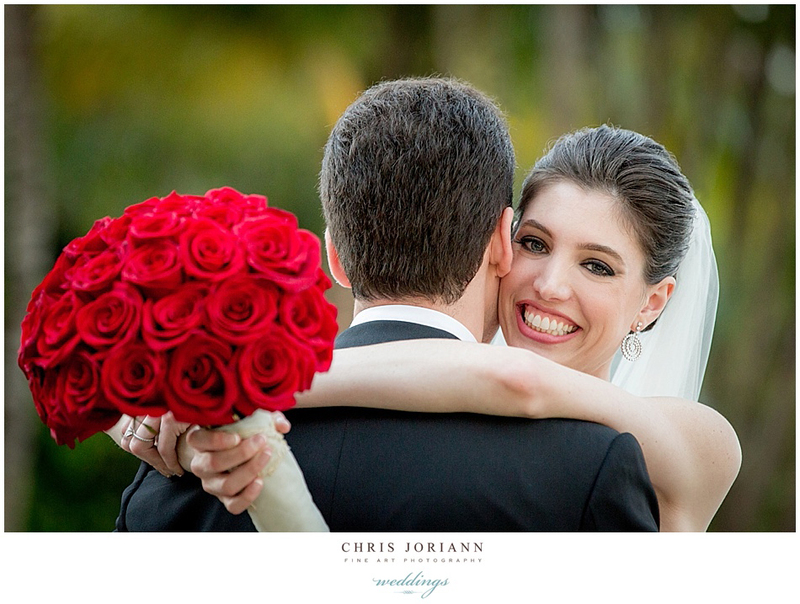 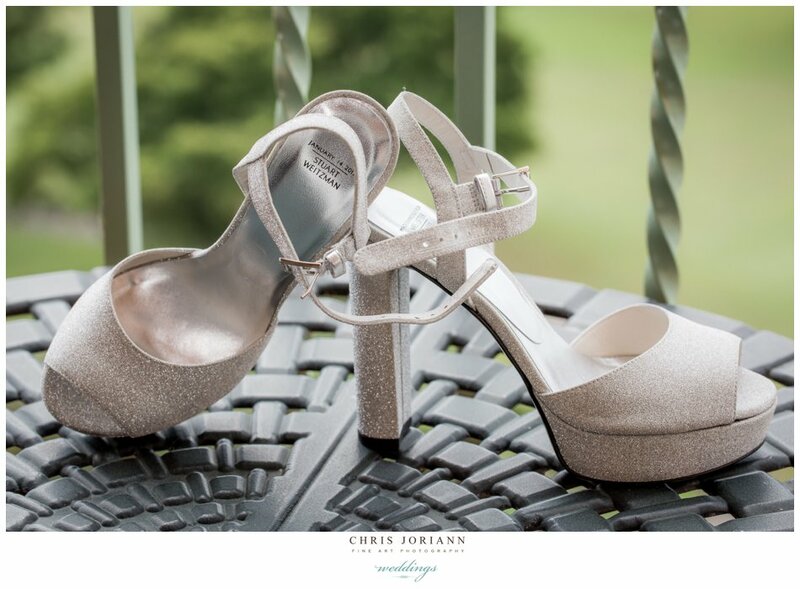 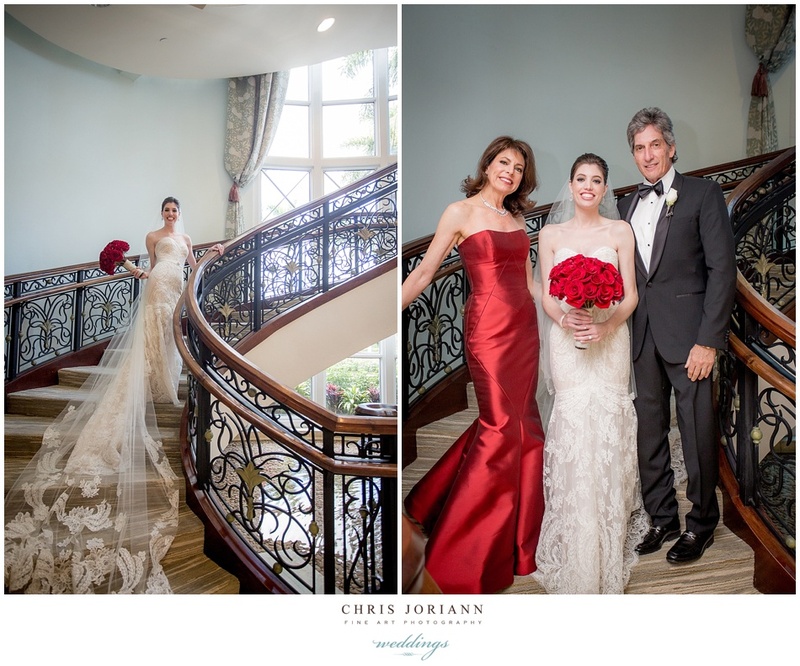 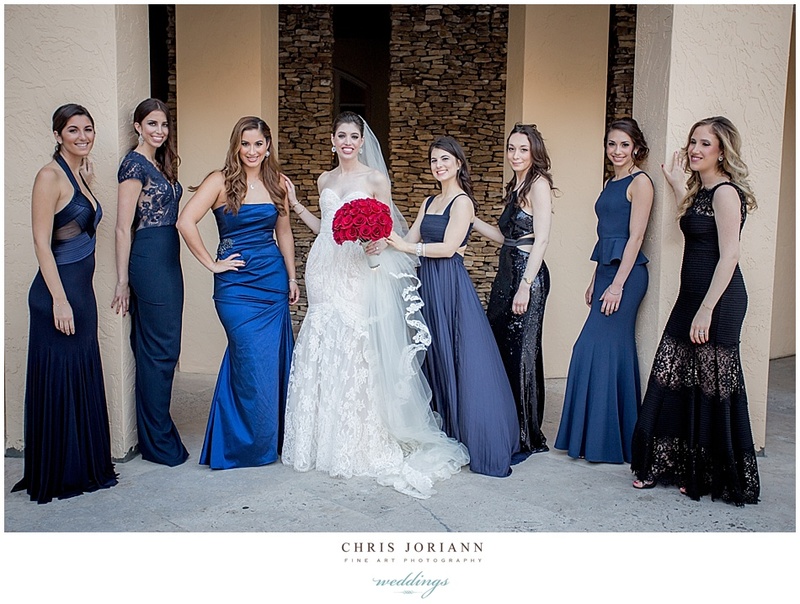 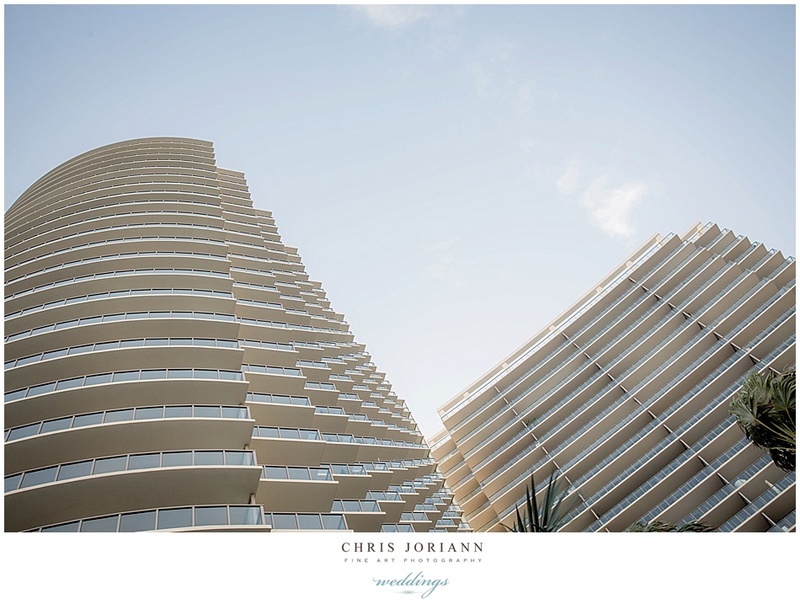 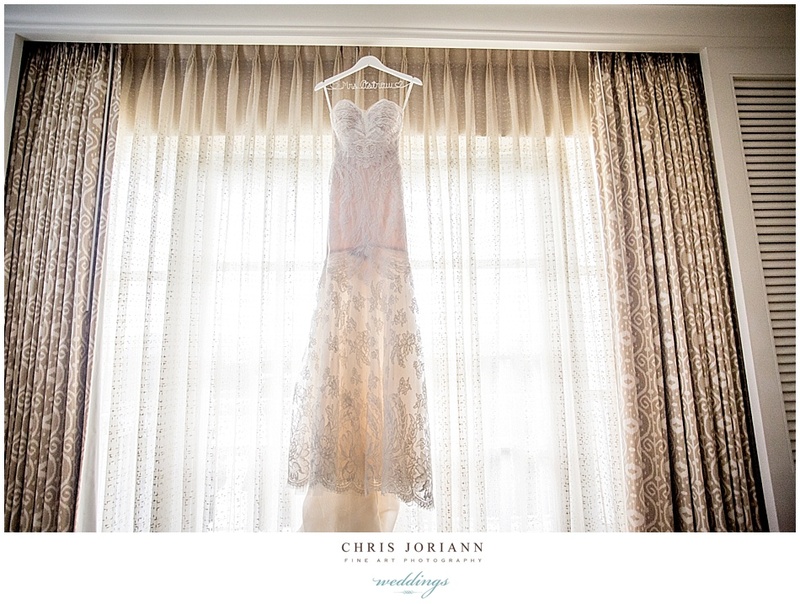 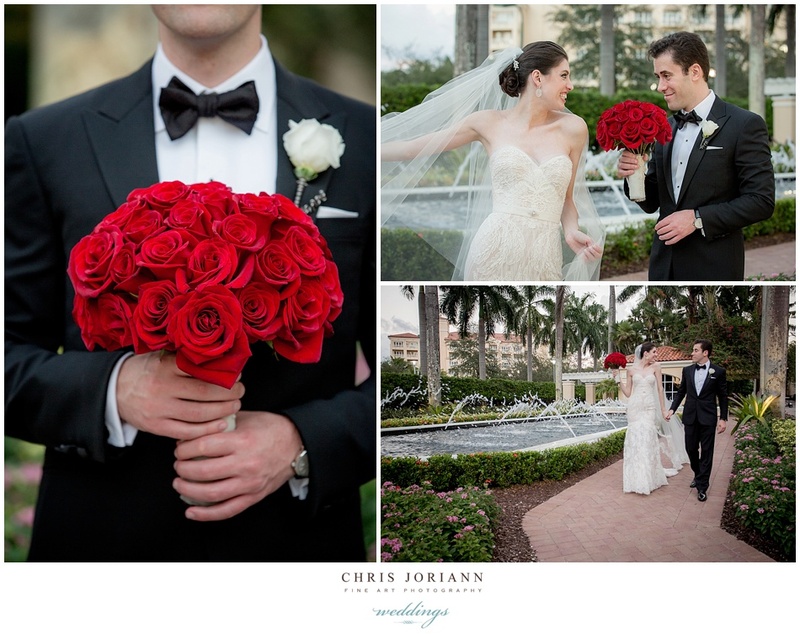 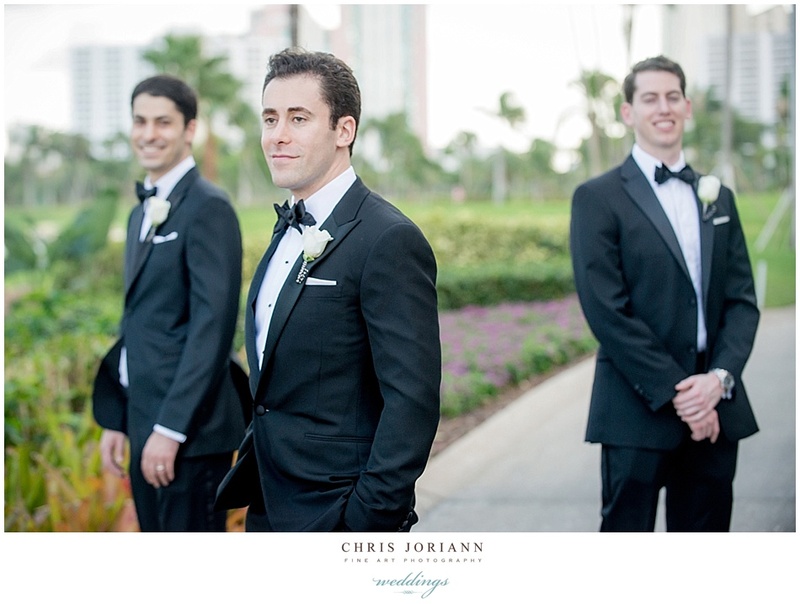 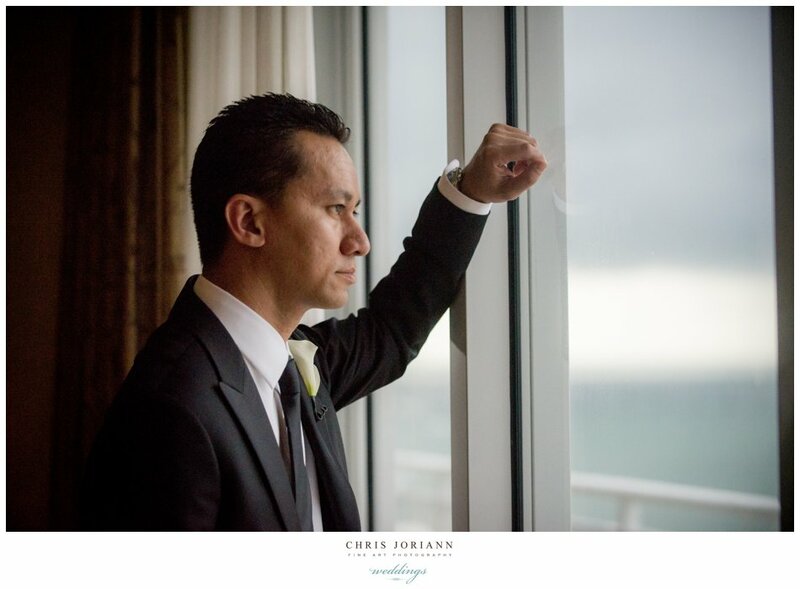 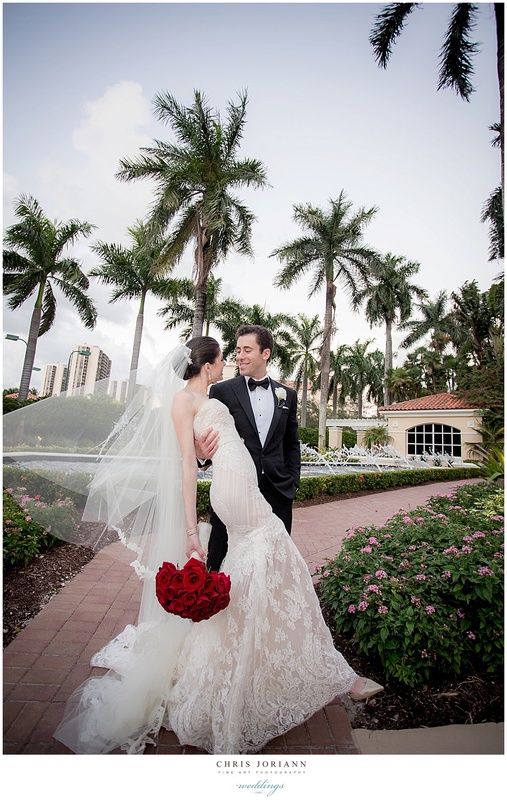 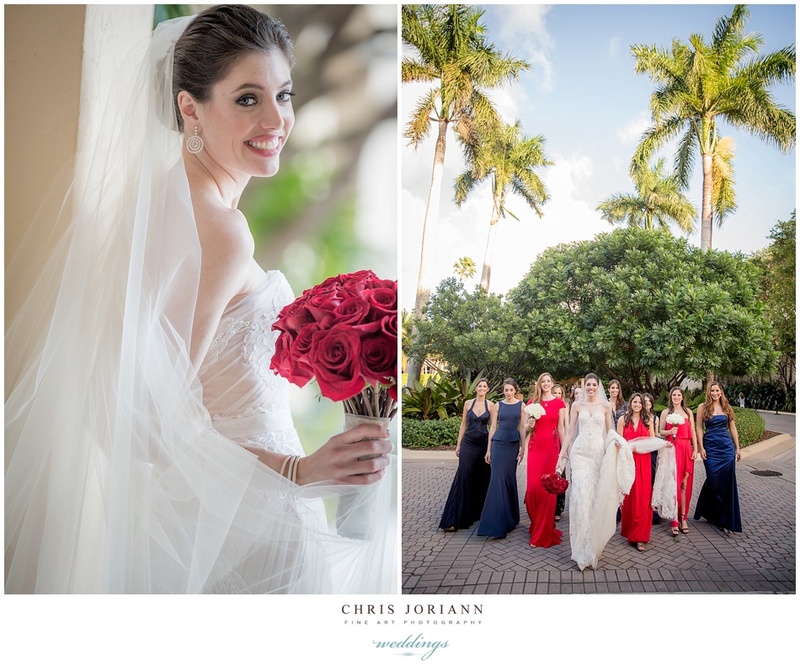 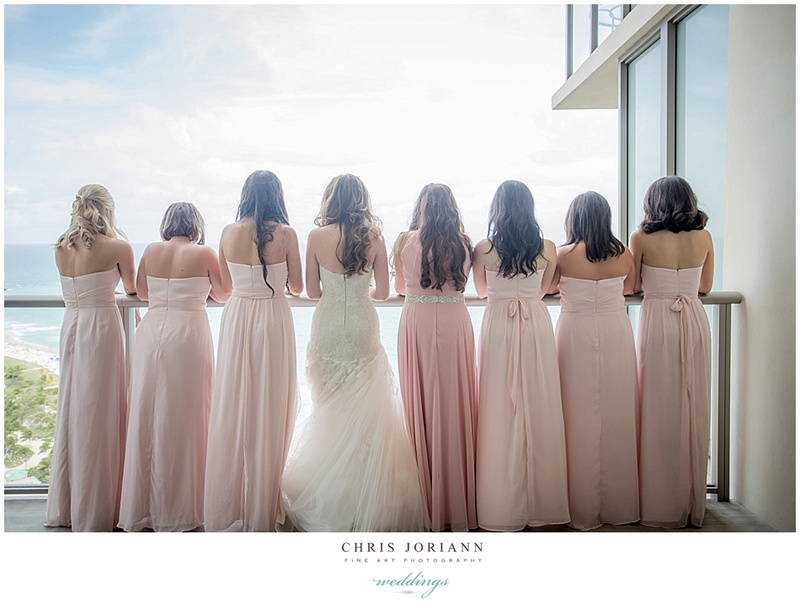 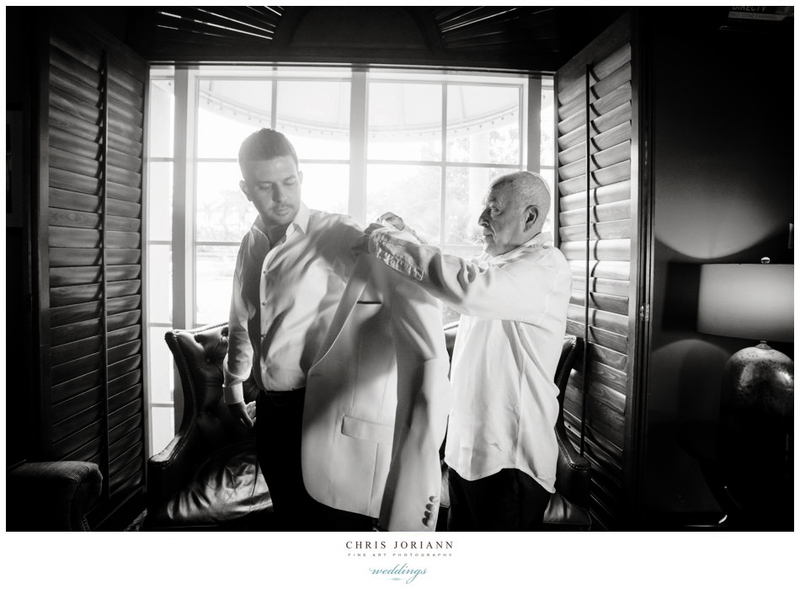 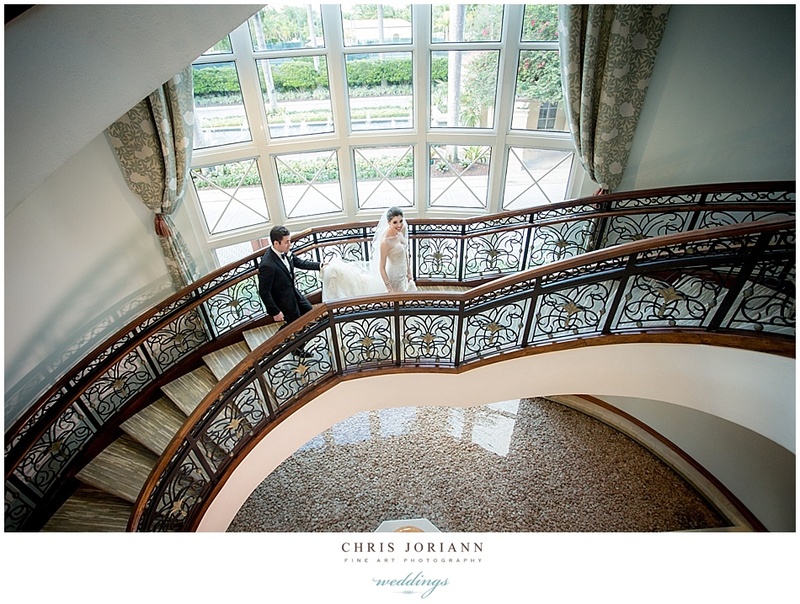 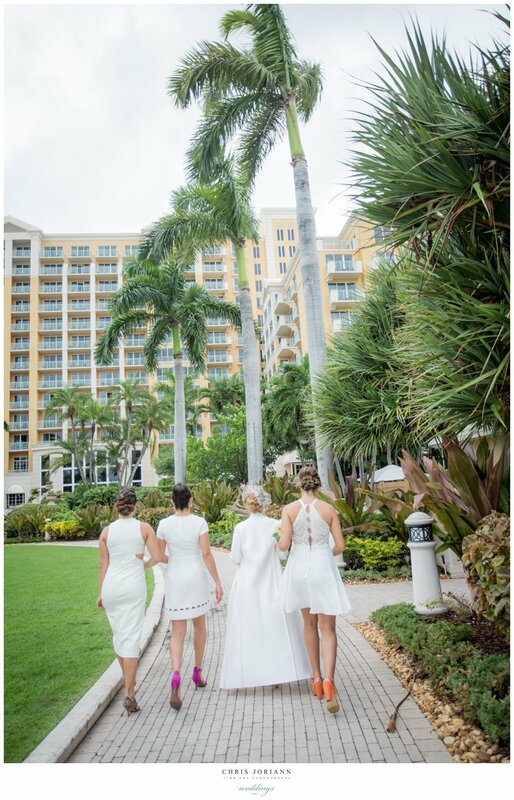 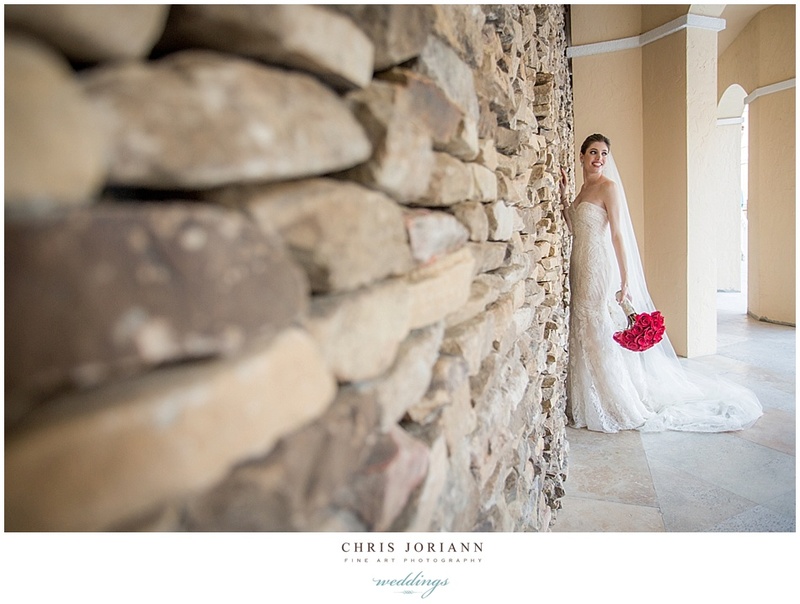 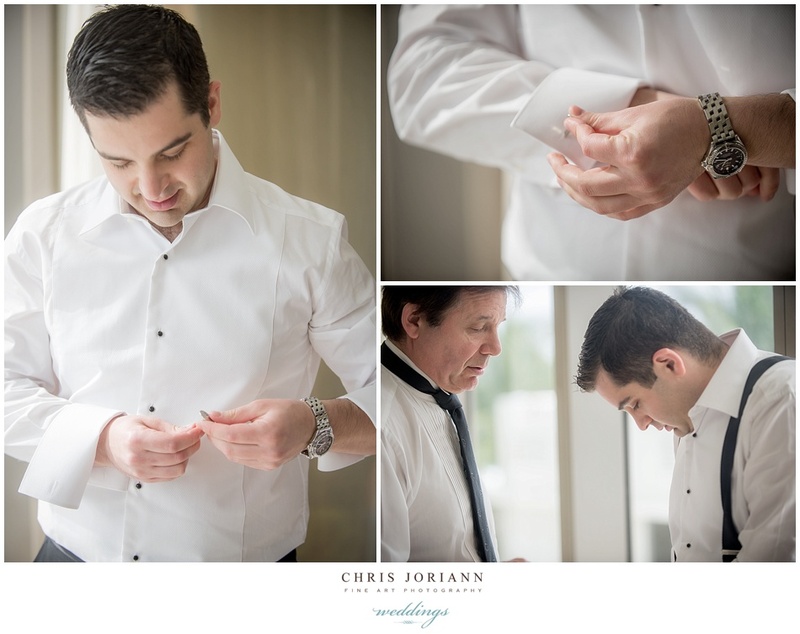 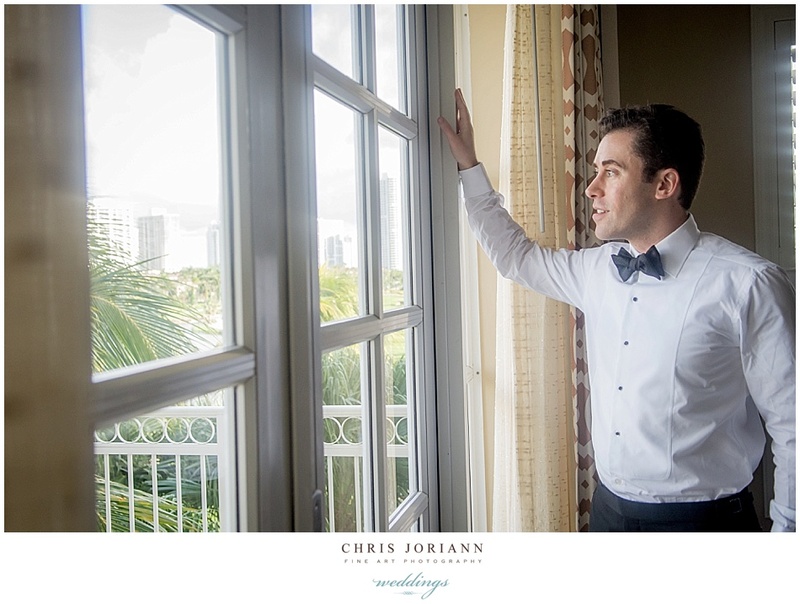 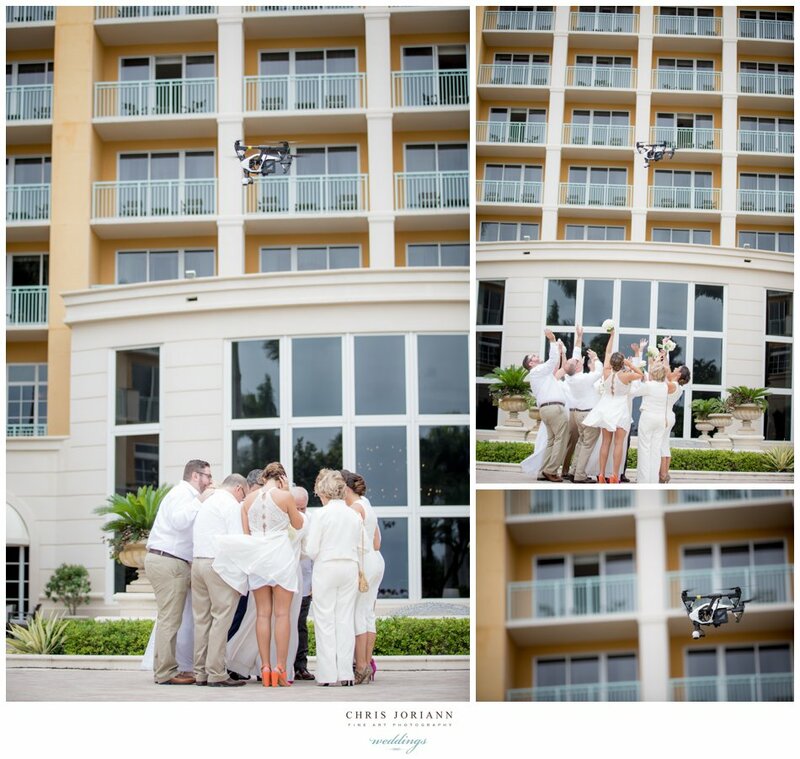 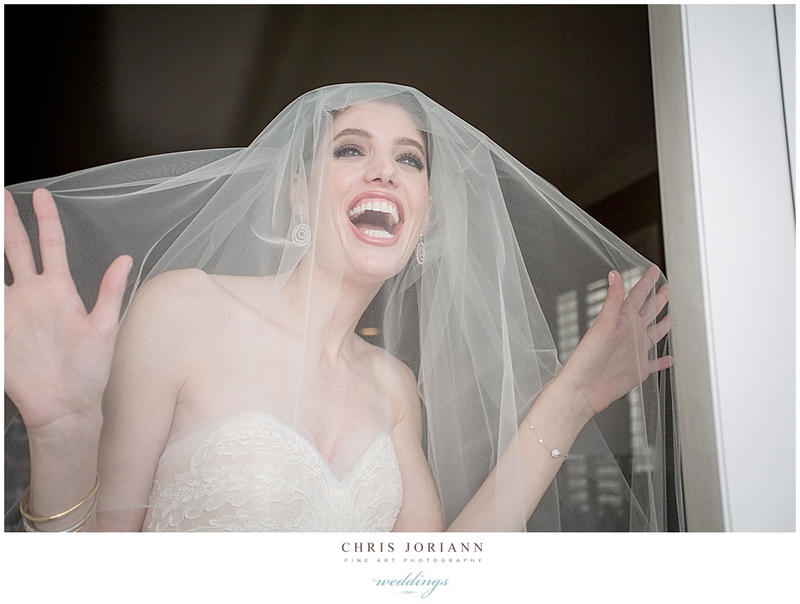 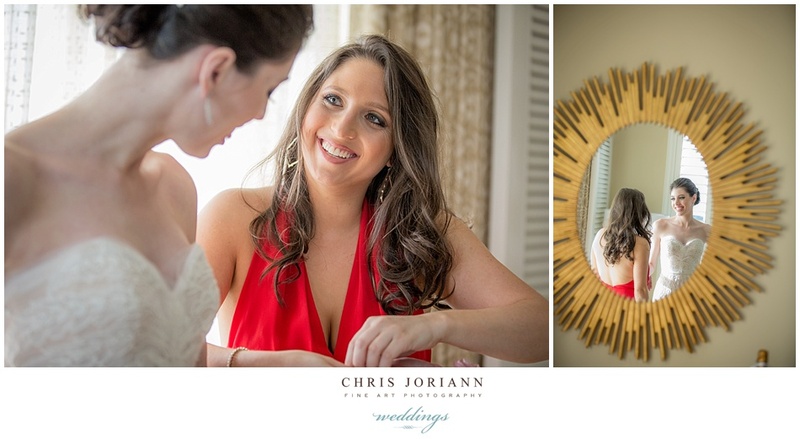 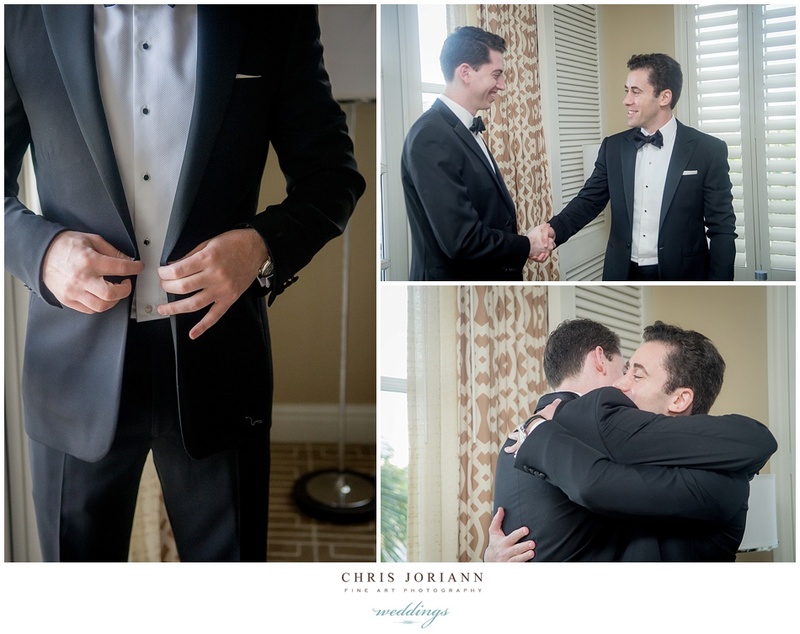 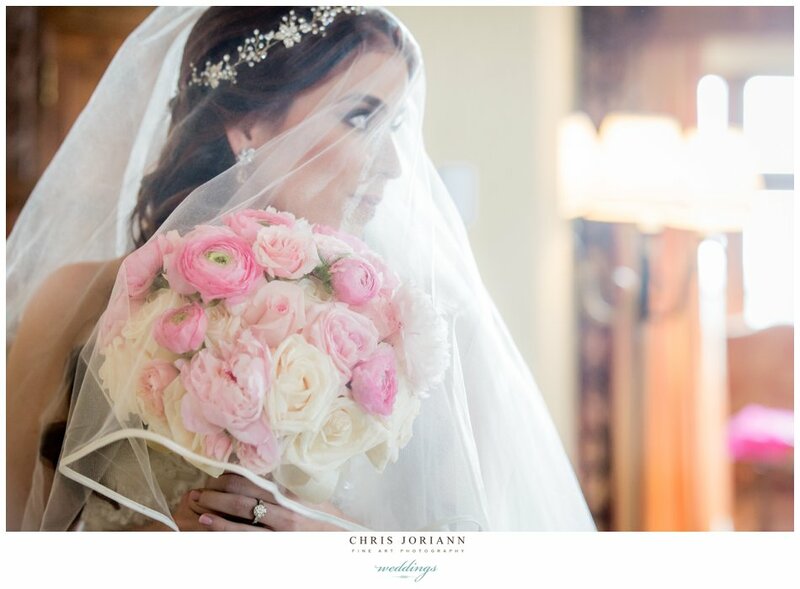 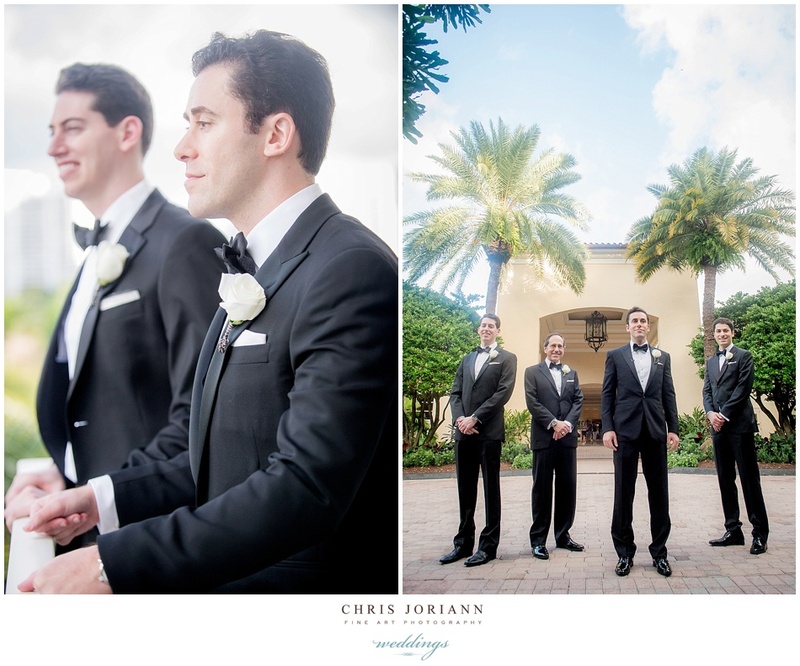 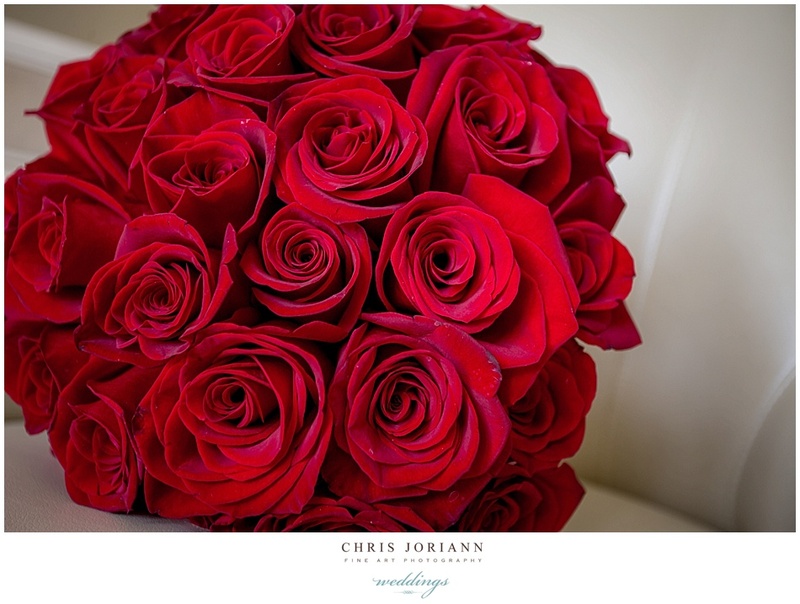 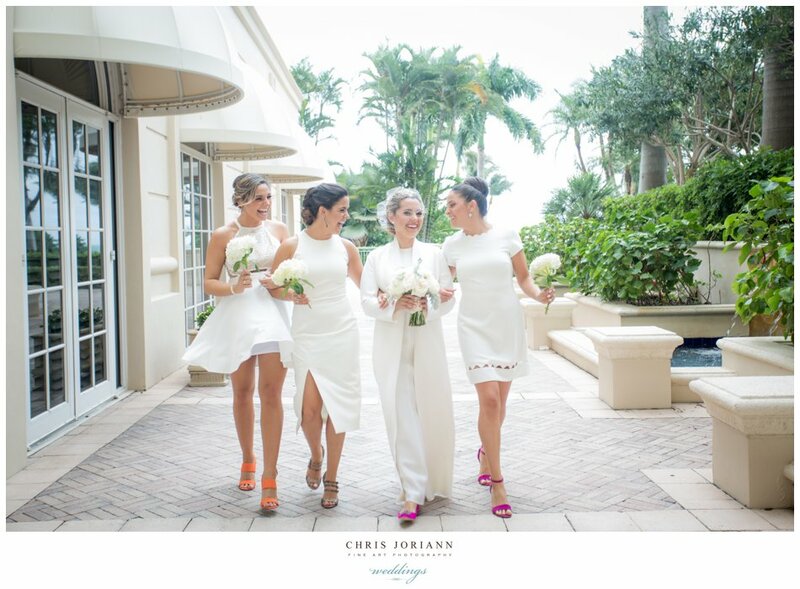 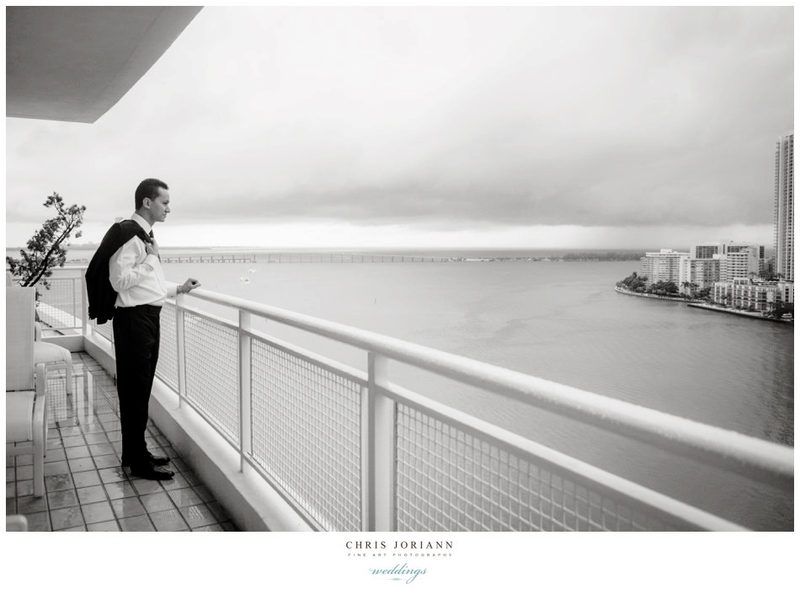 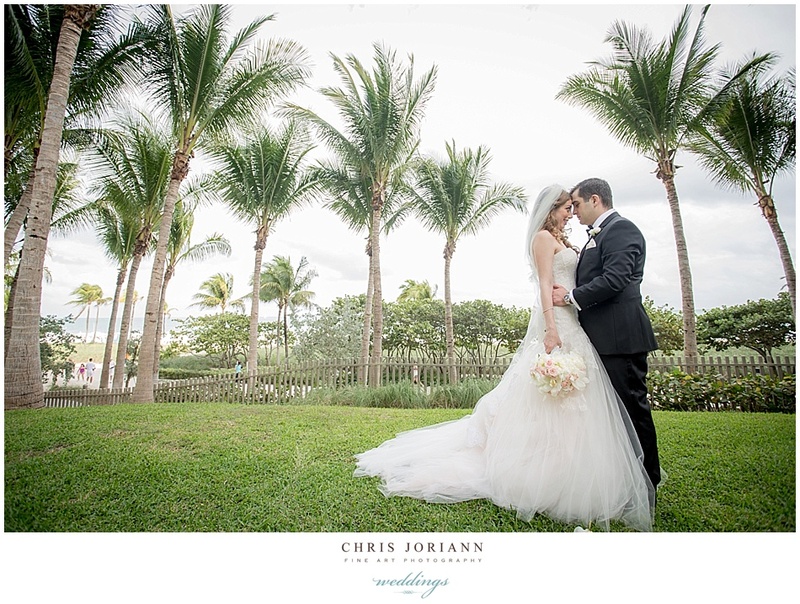 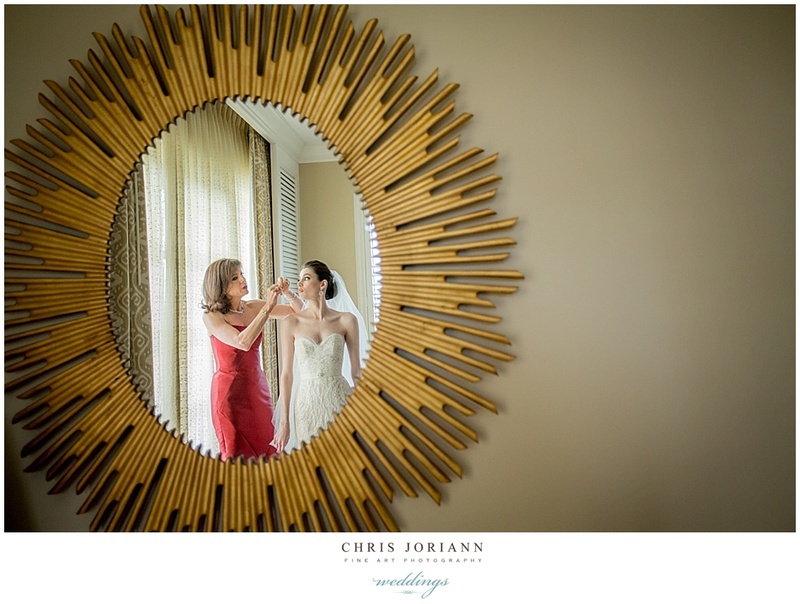 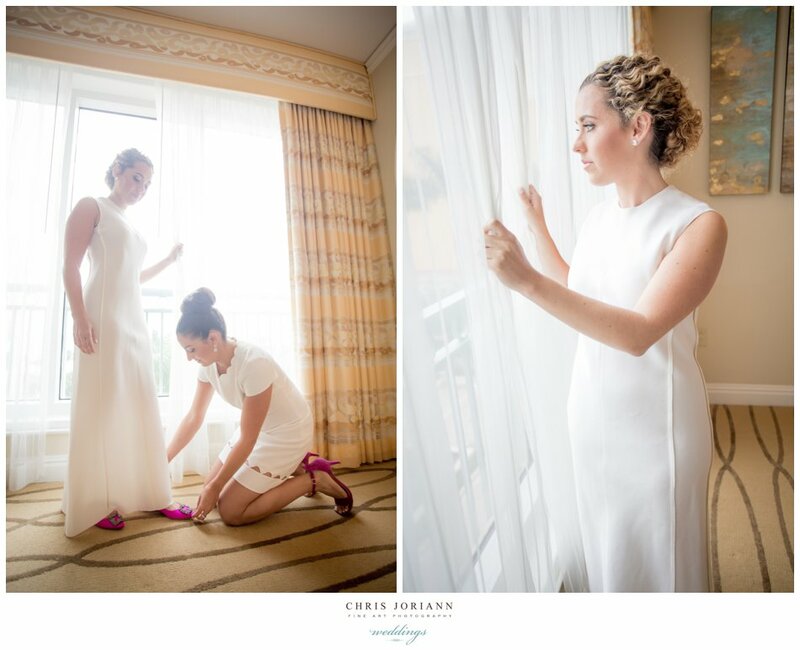 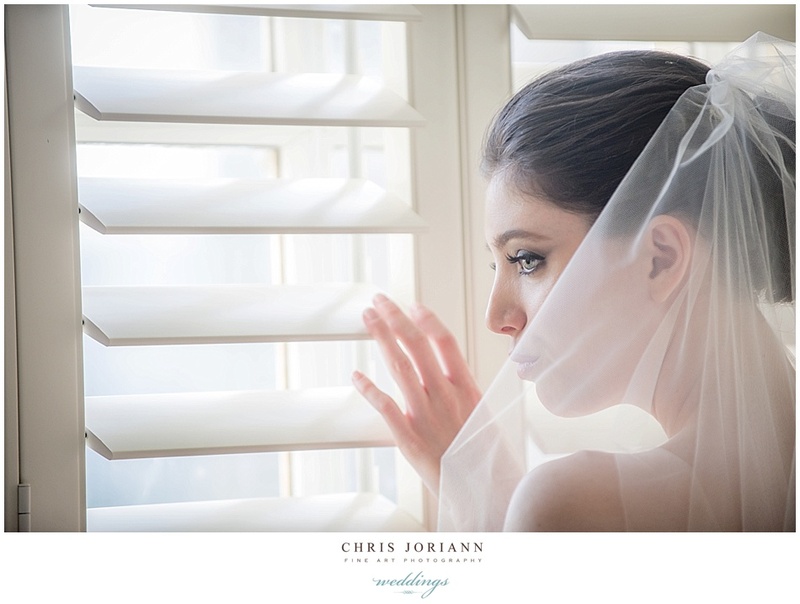 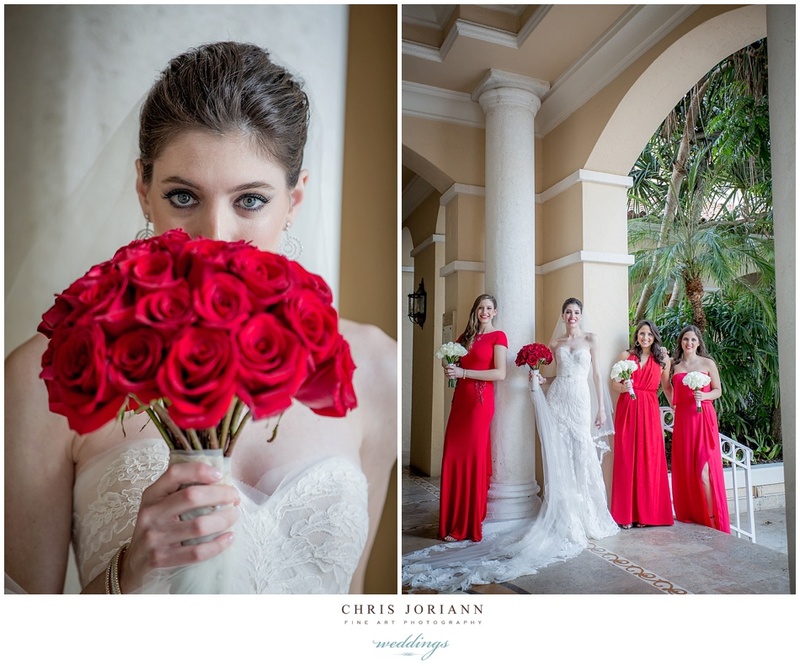 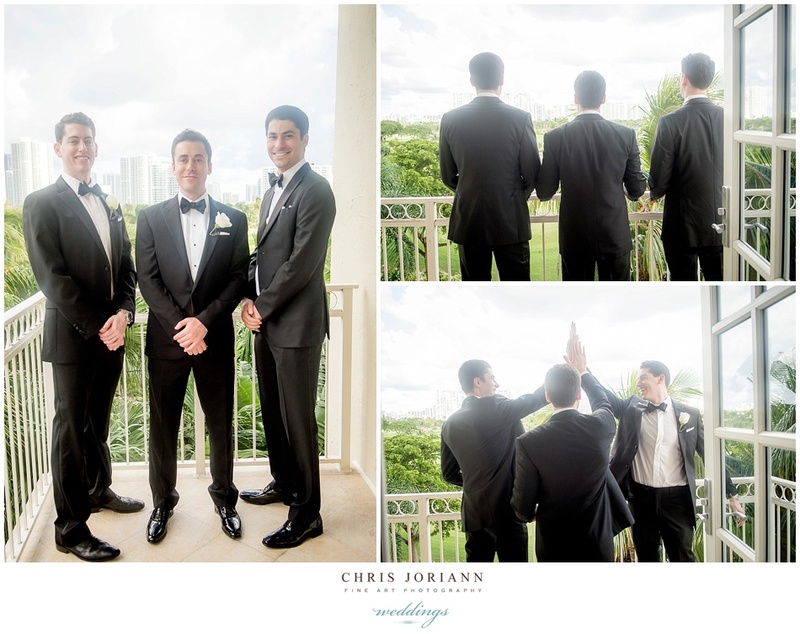 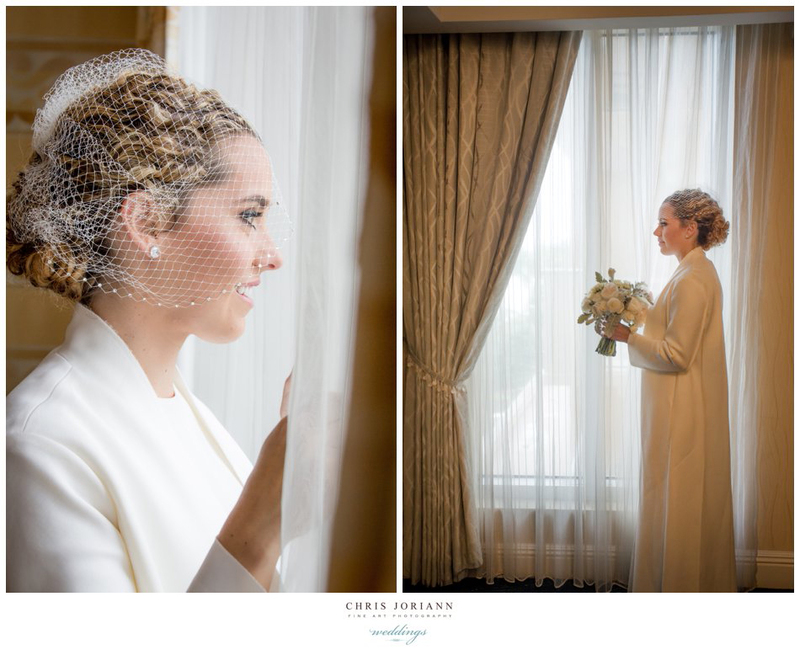 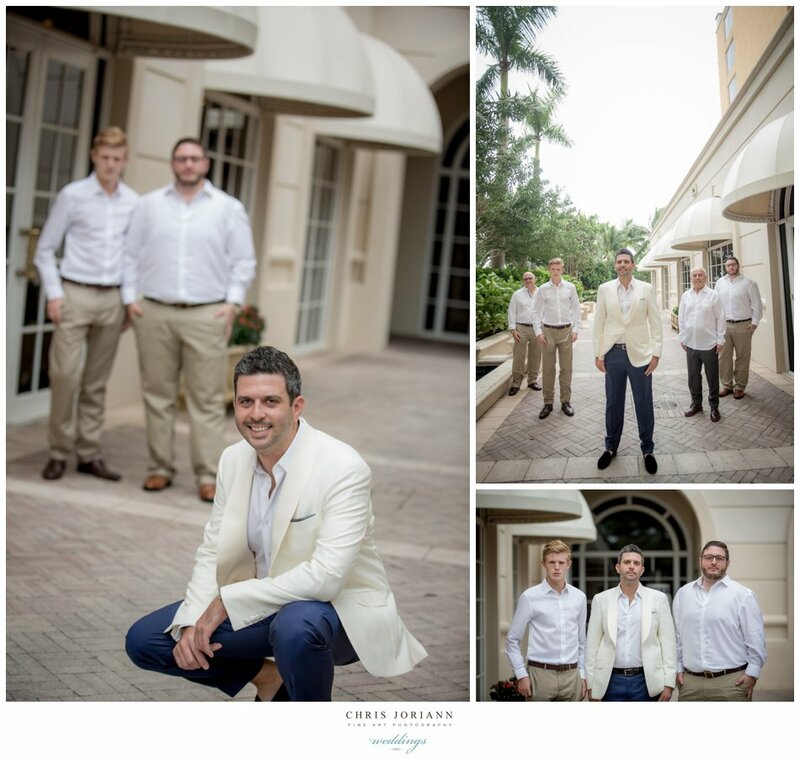 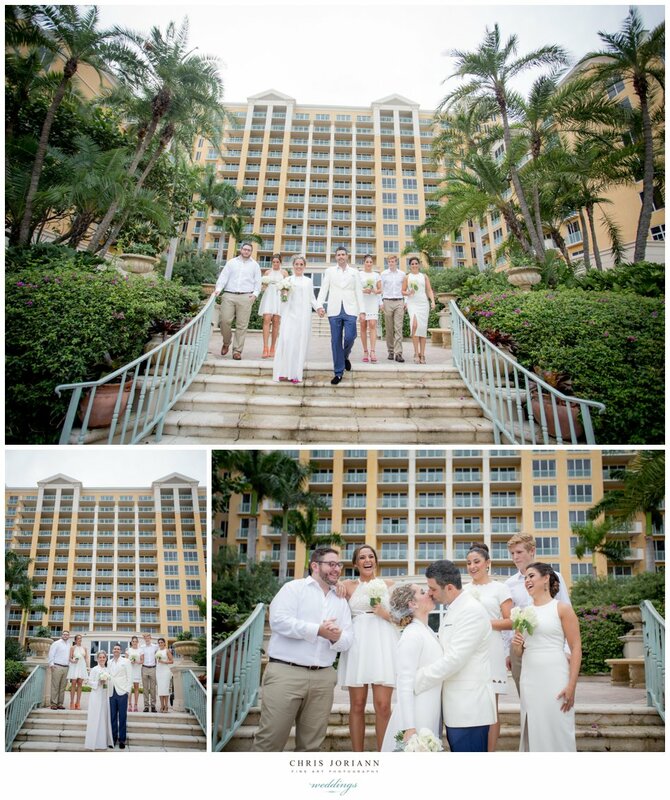 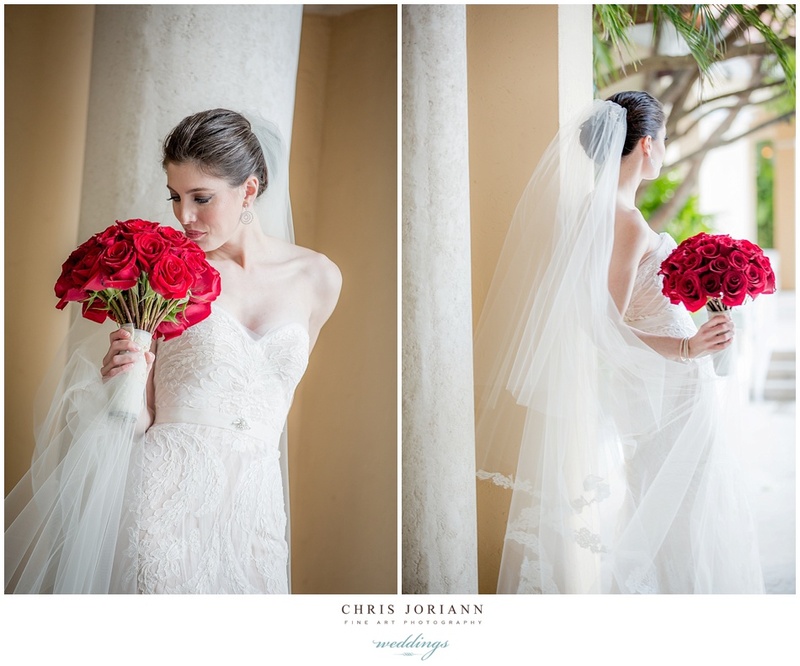 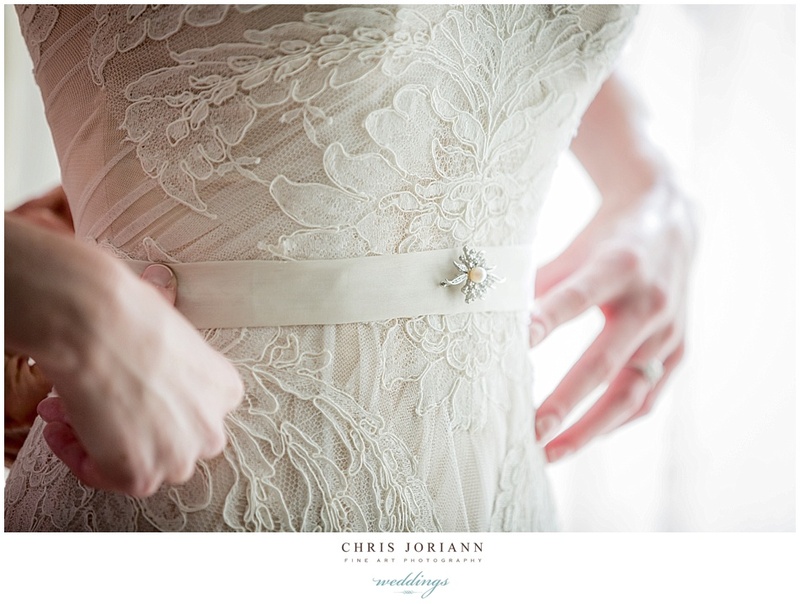 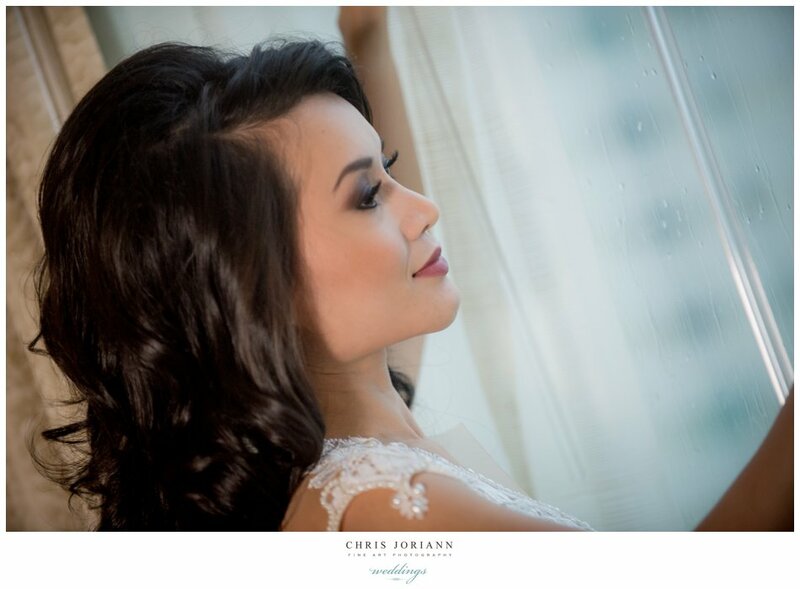 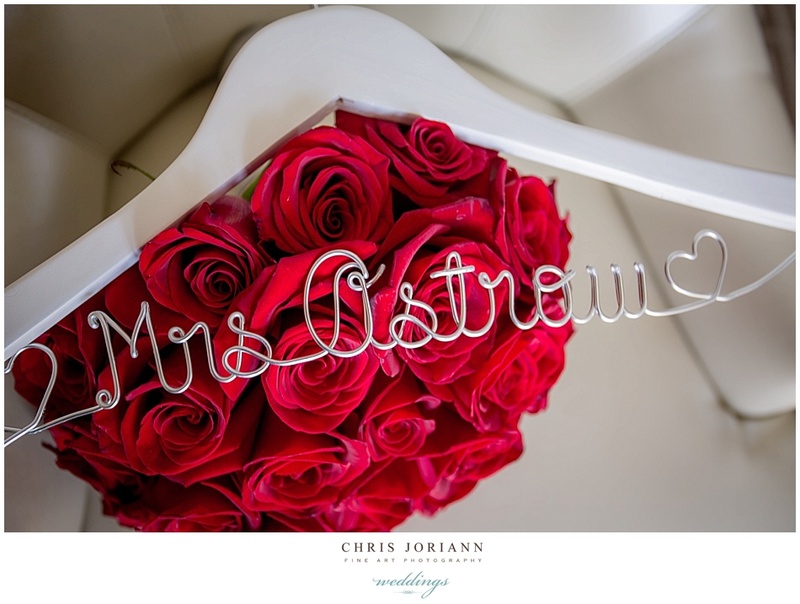 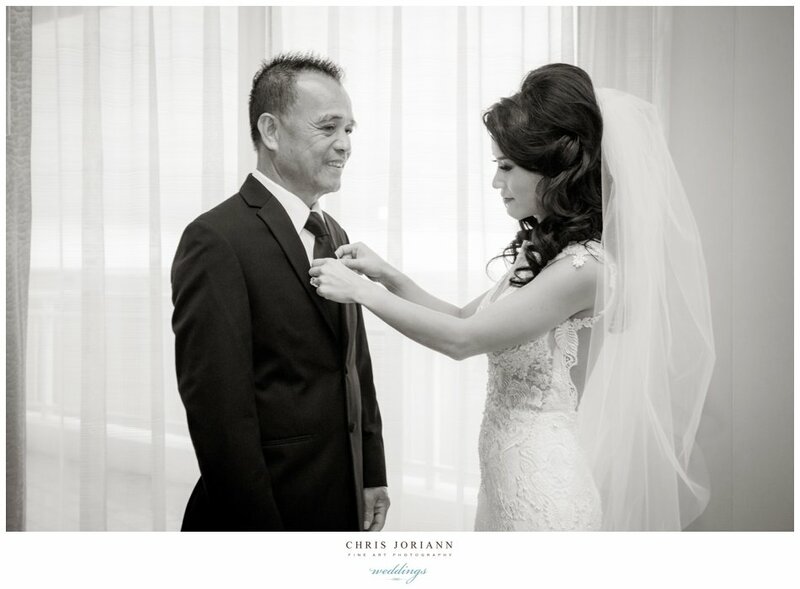 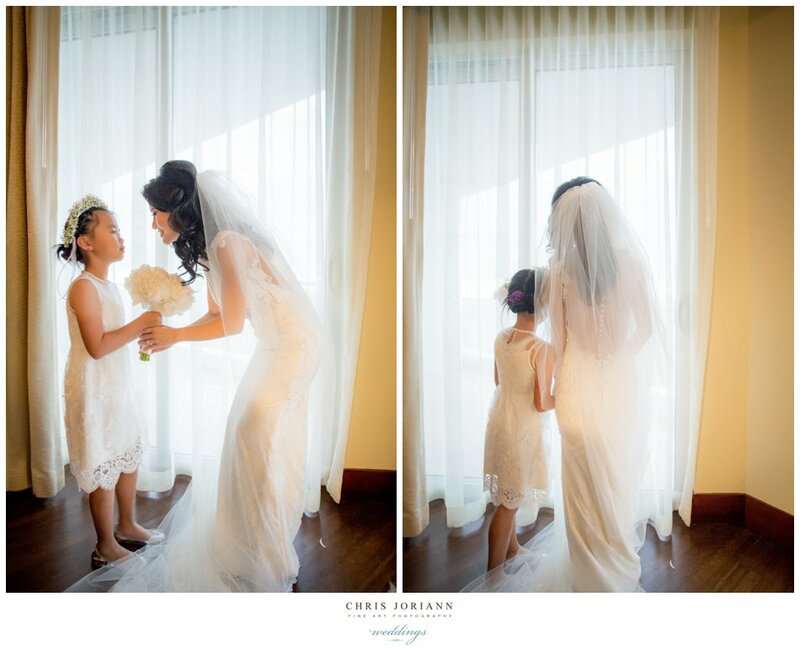 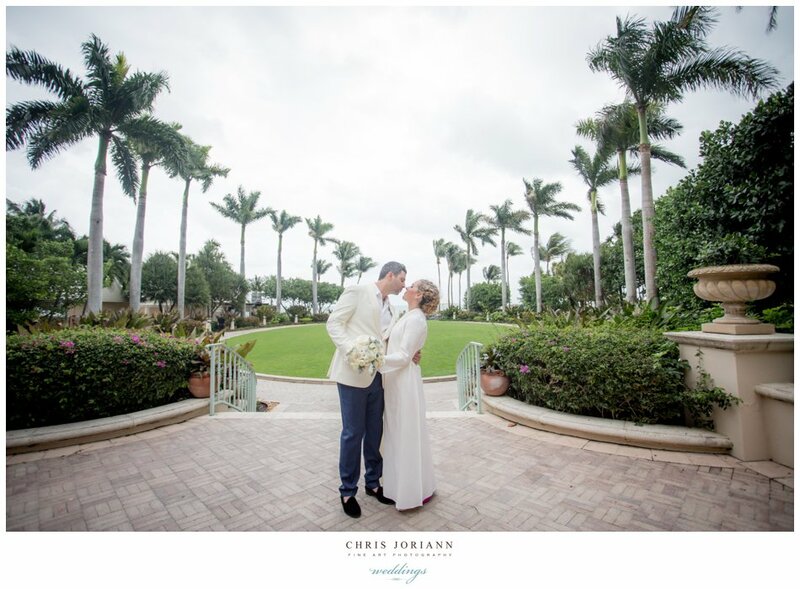 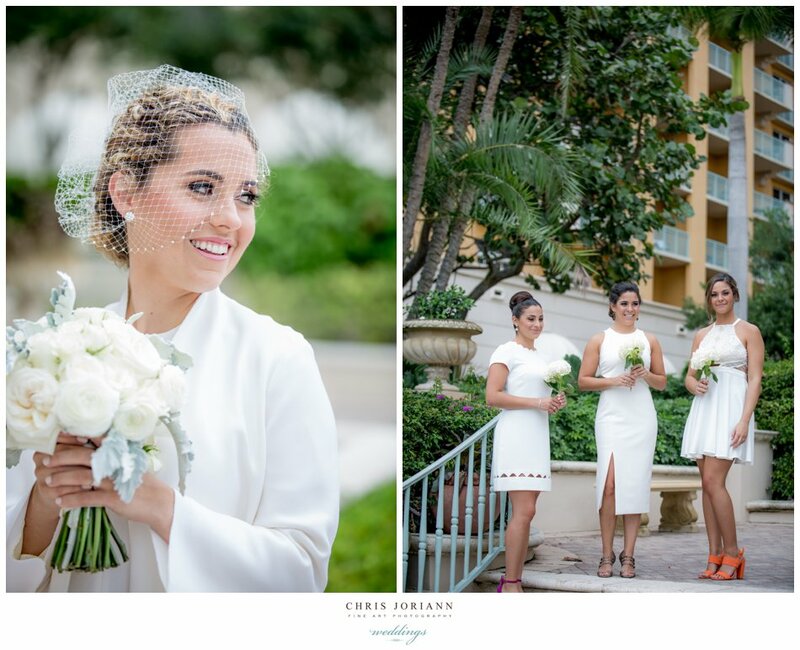 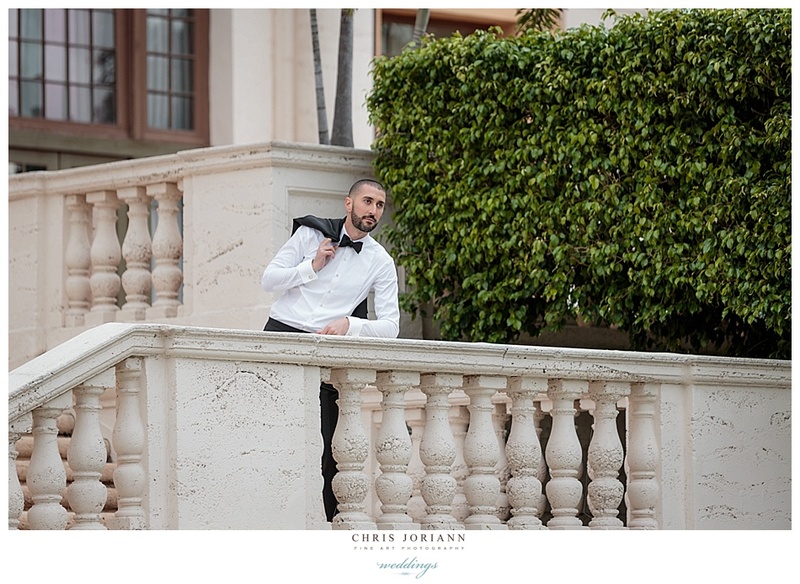 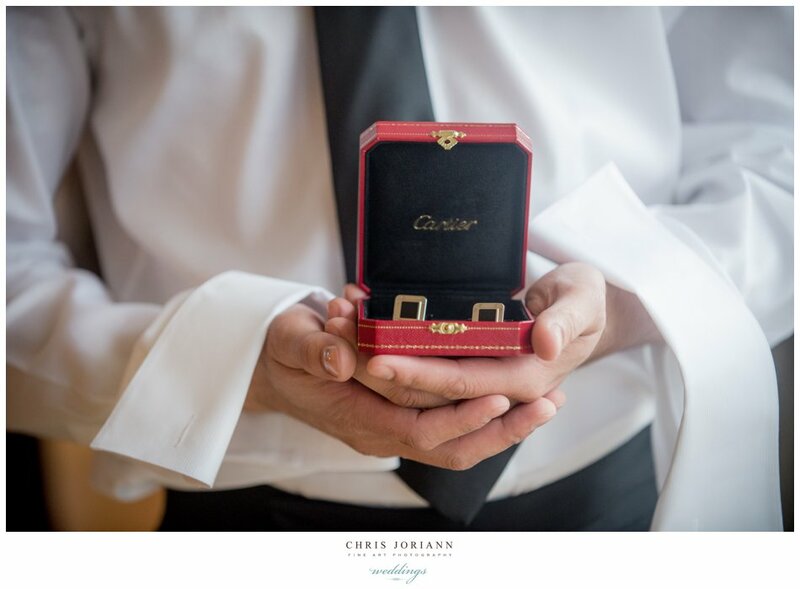 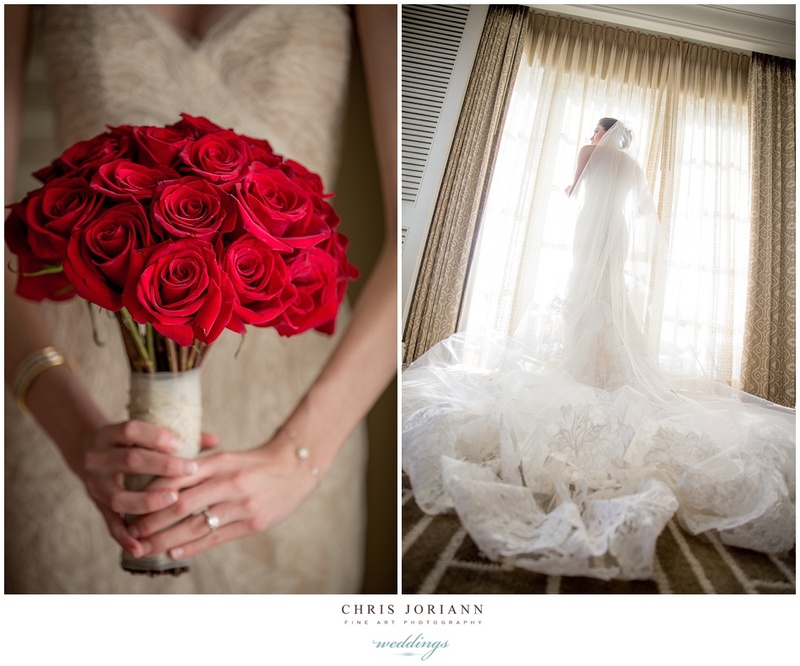 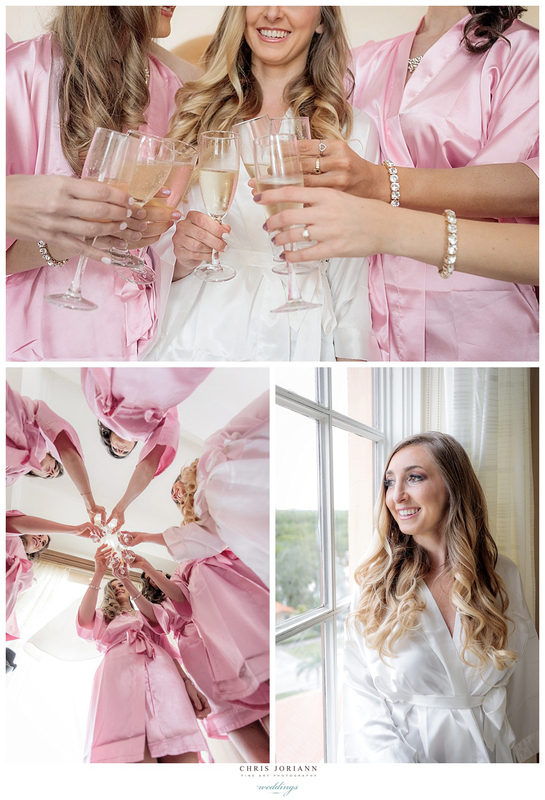 Jaclyn + Daniel’s Turnberry Isle wedding in Miami was all about the romance. 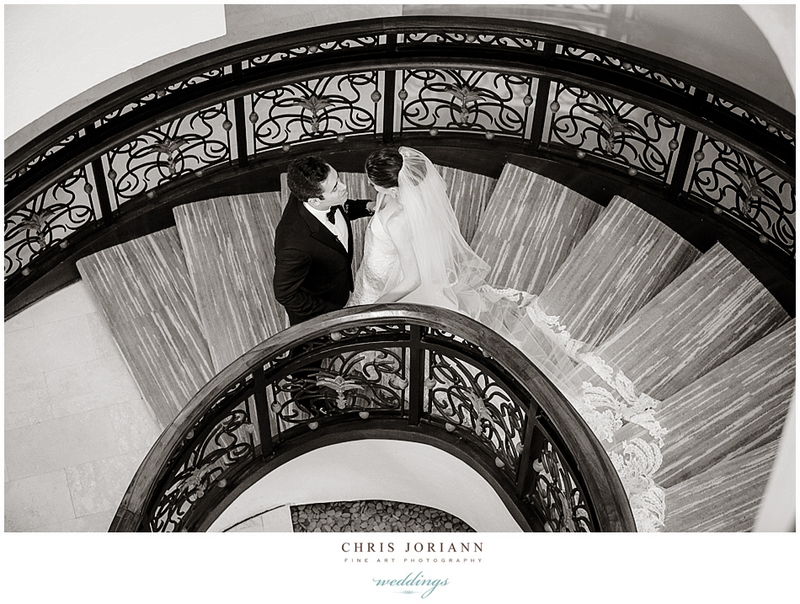 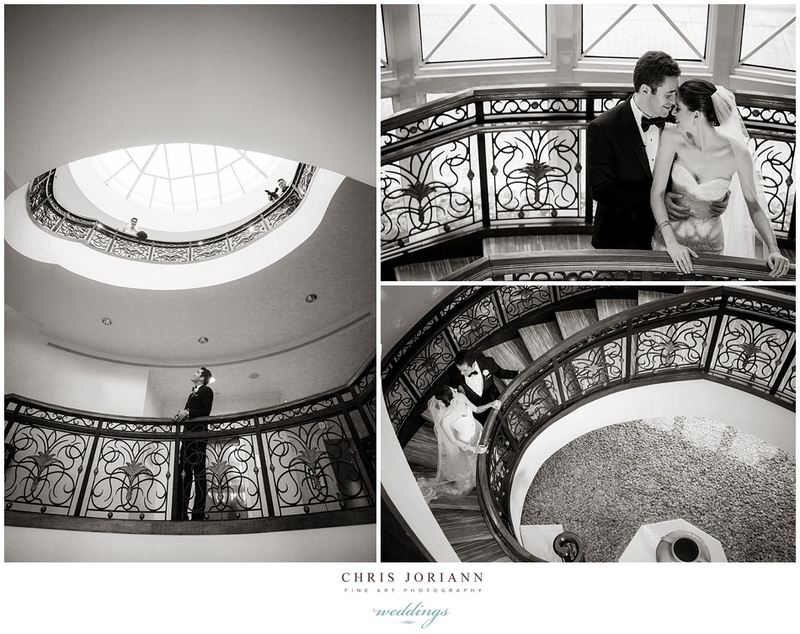 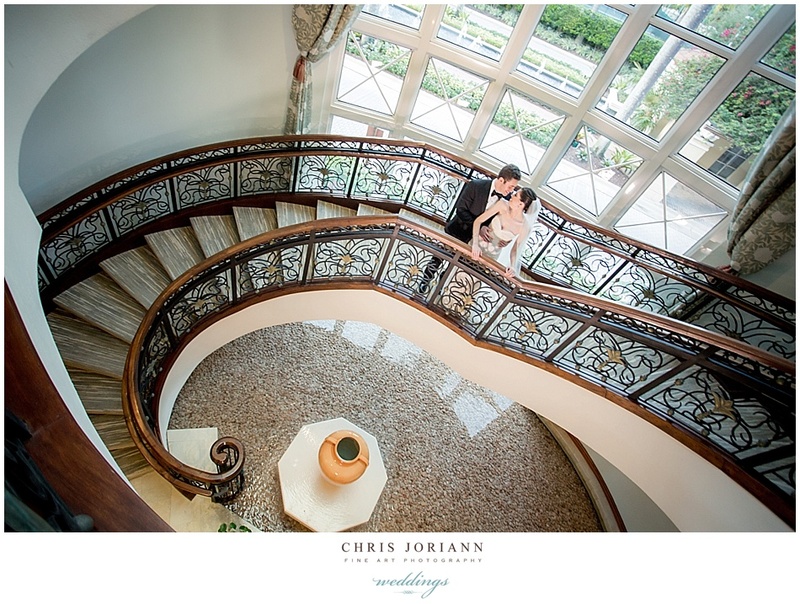 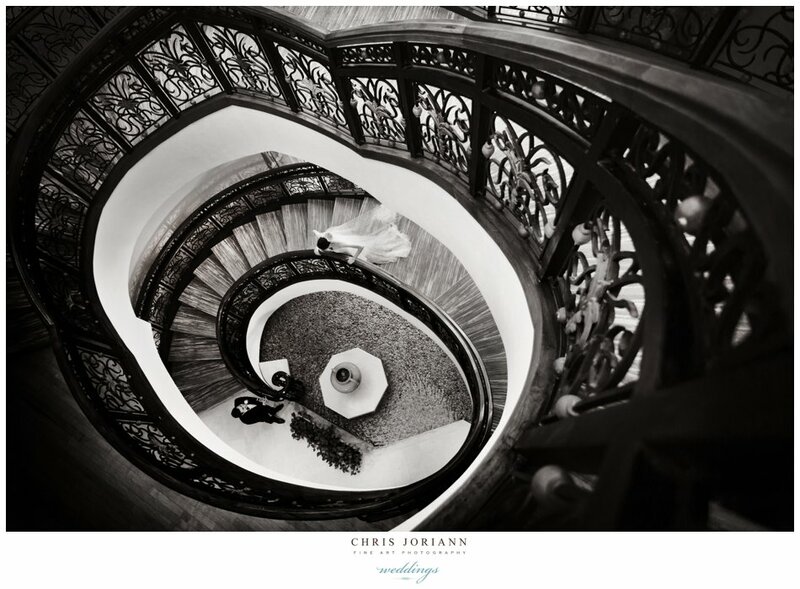 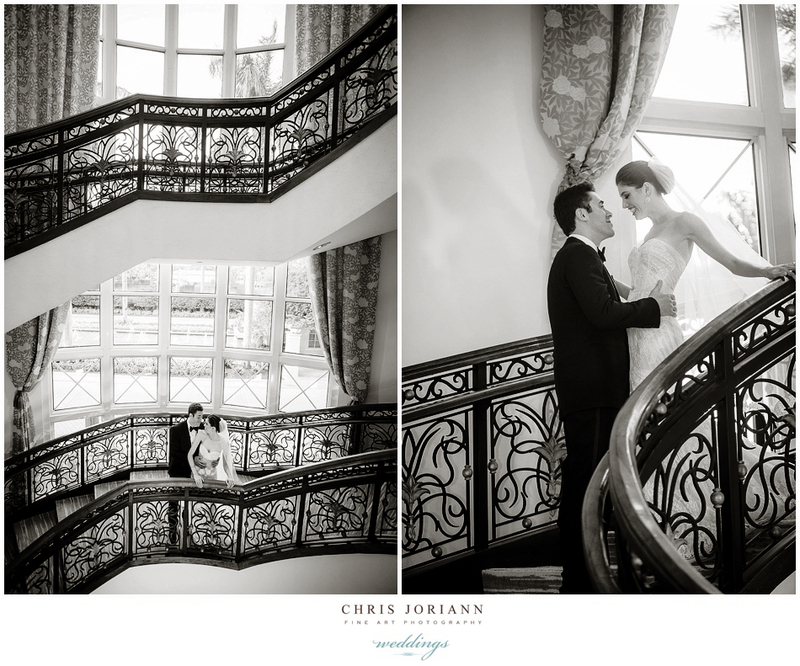 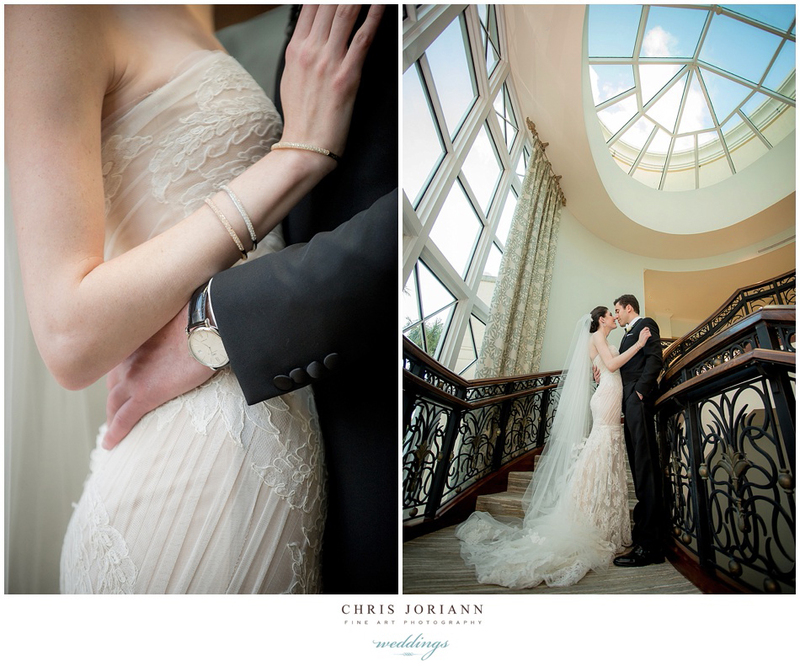 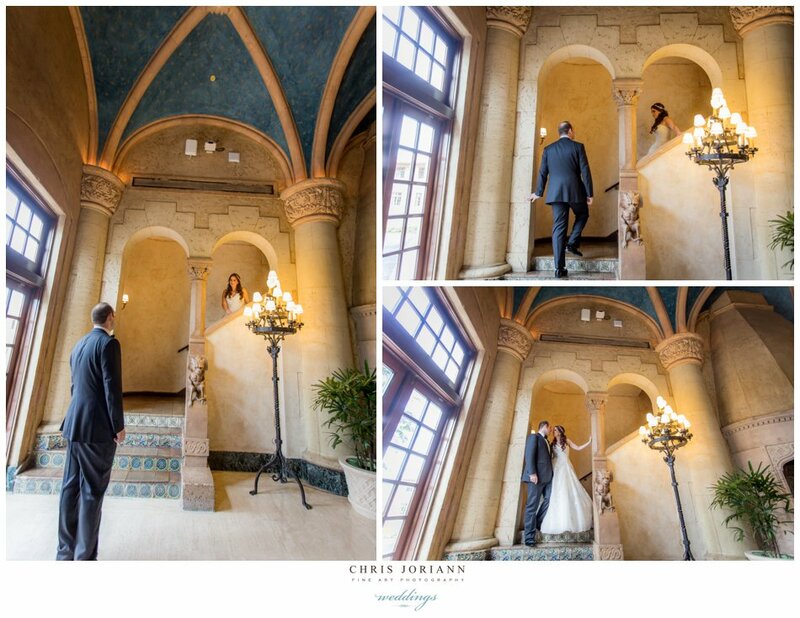 The couples first look on this epic spiral staircase was my favorite ever. 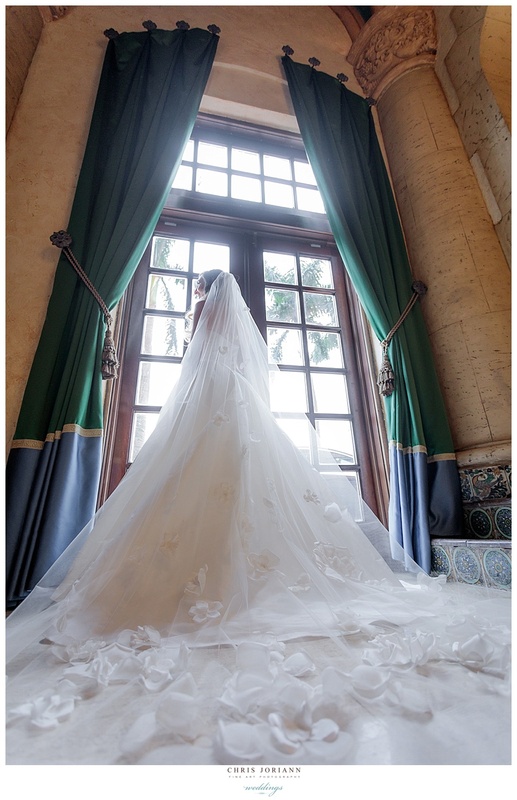 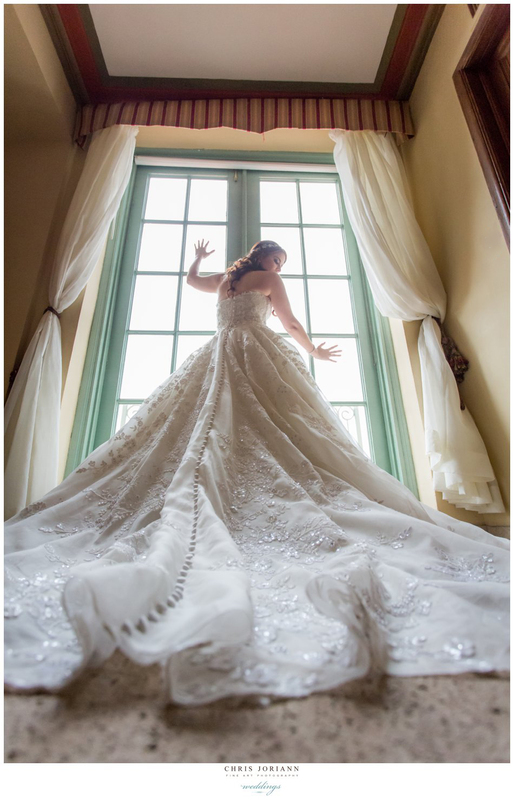 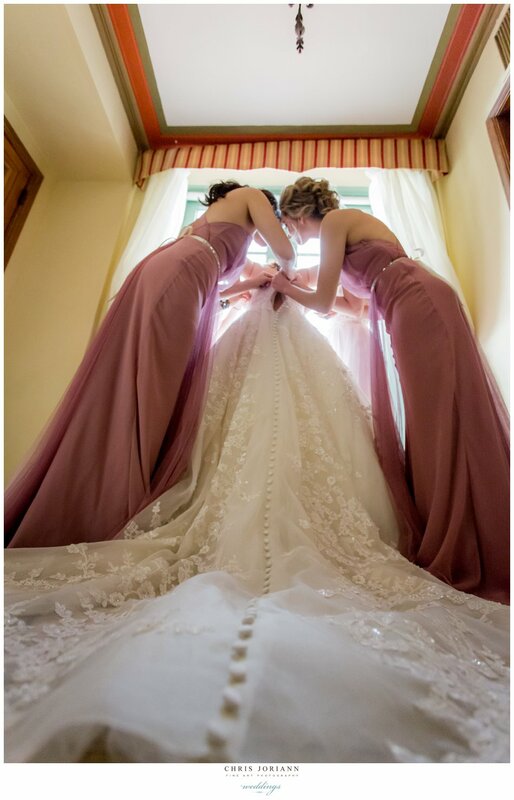 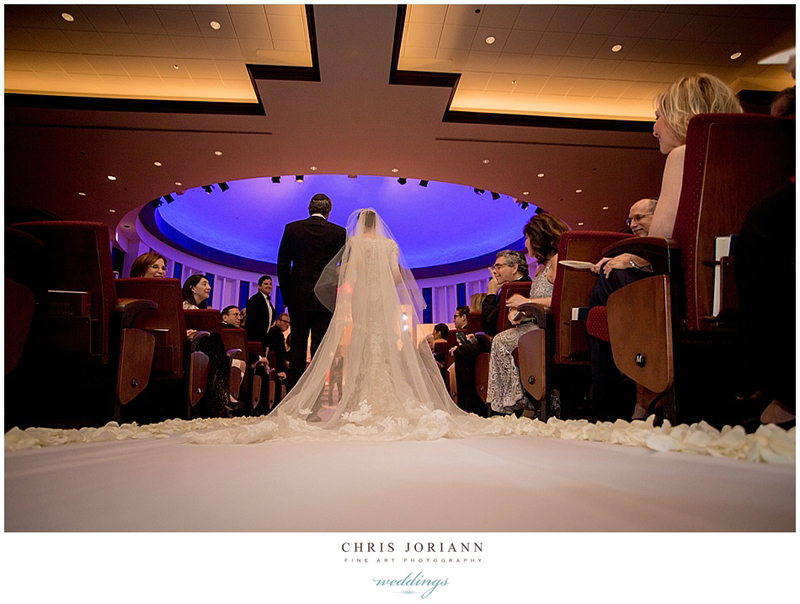 Shot from above, Jaclyn glided dowm, with her lace embroidered cathedral veil trailing behind, right into Daniel’s arms. 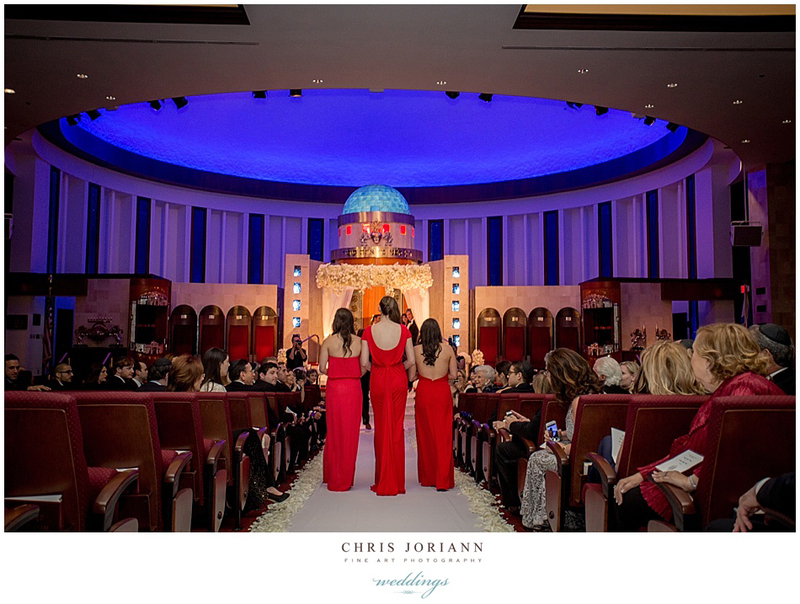 This “December to Remember” event featured bold holiday RED florals, RED satin jeweled Manolo Blahniks, and RED bridesmaids gowns. 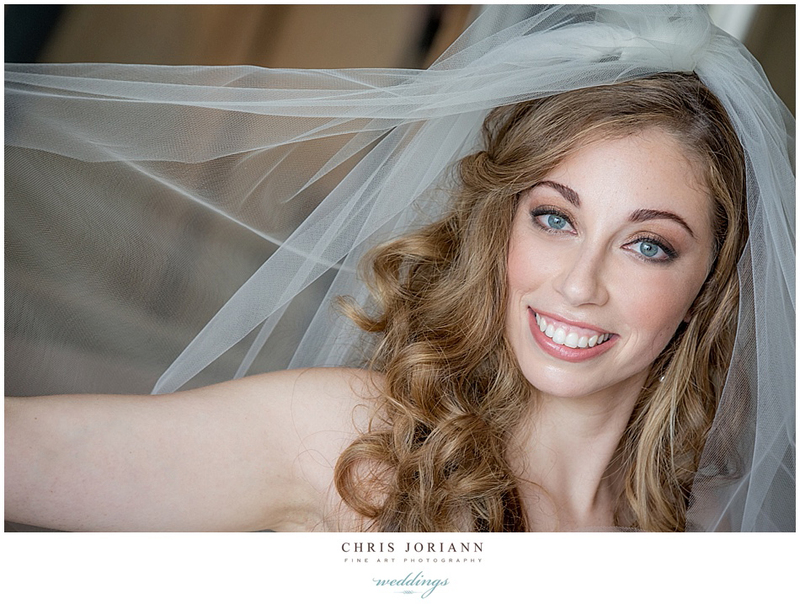 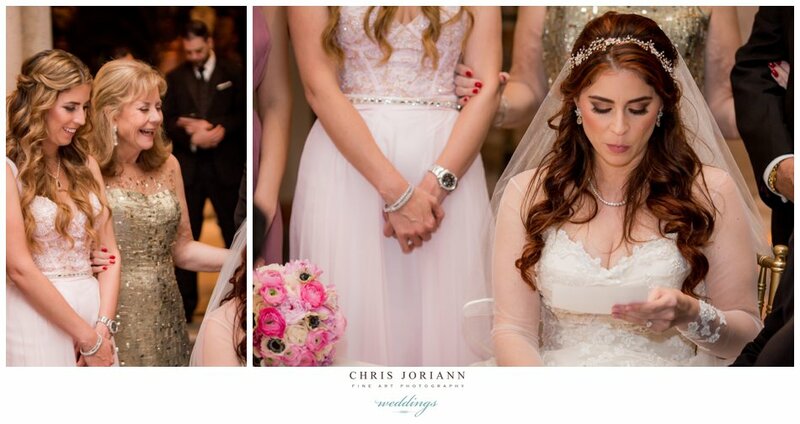 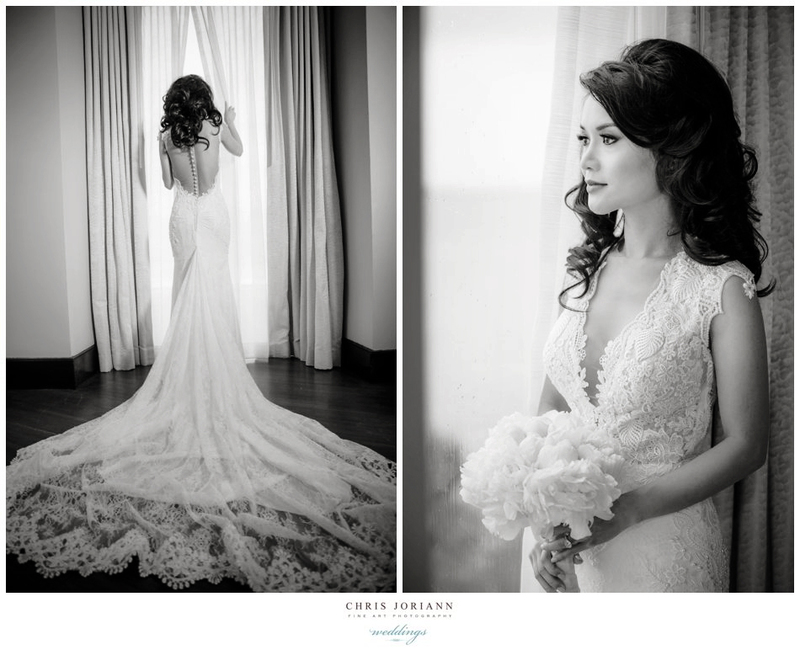 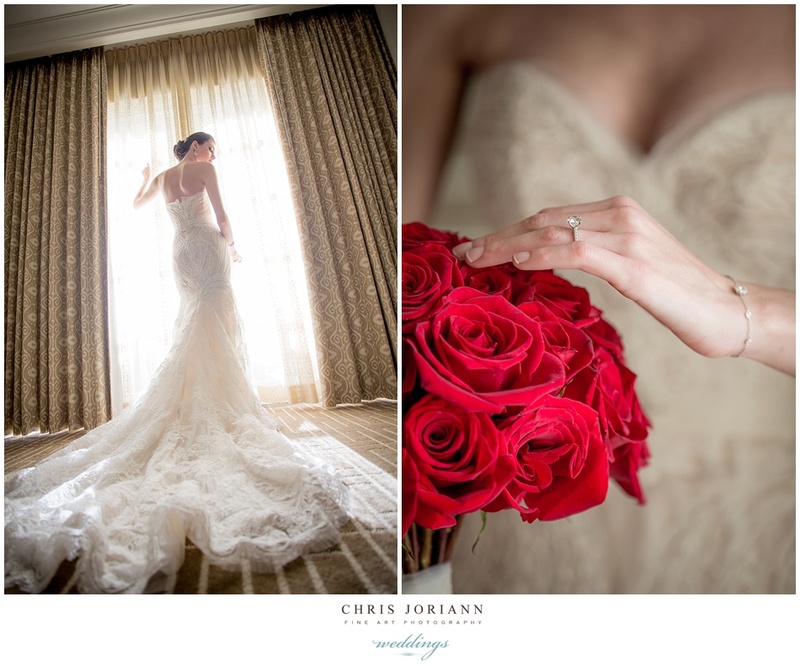 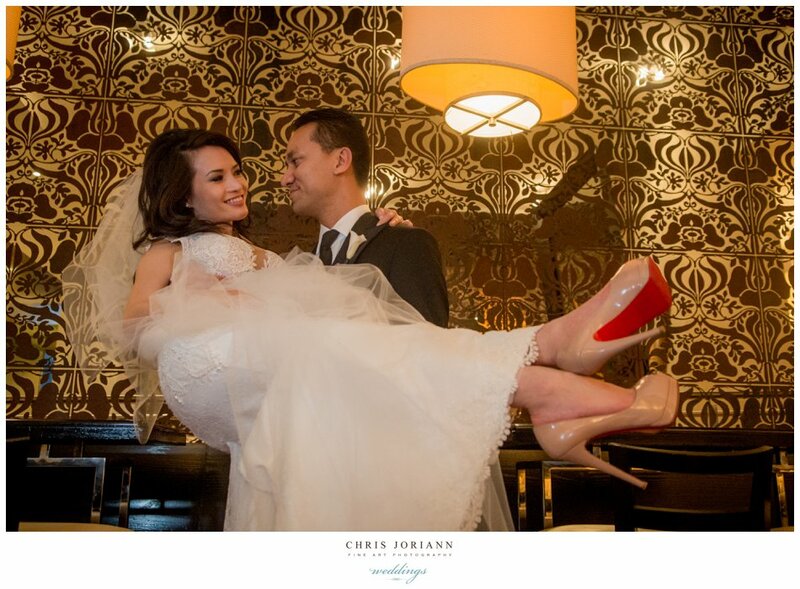 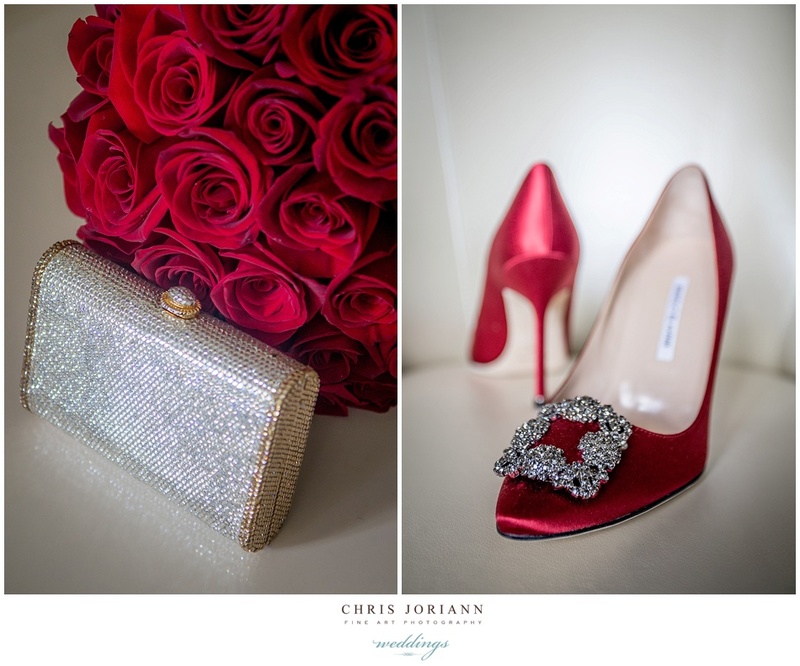 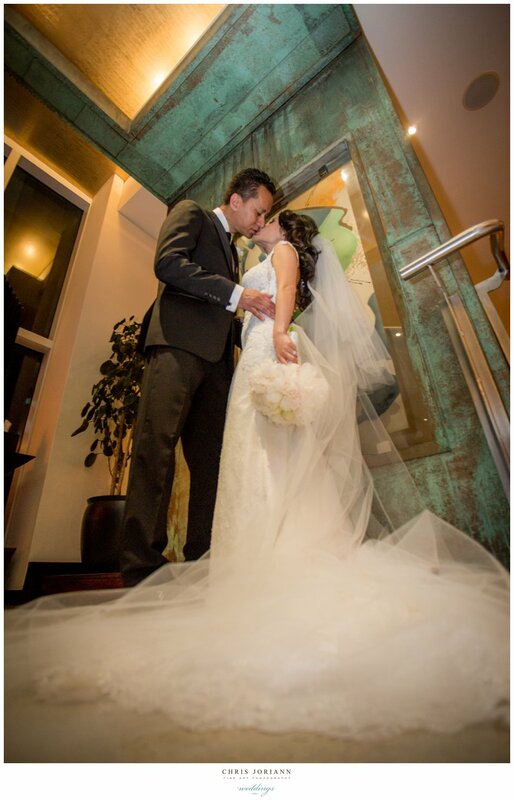 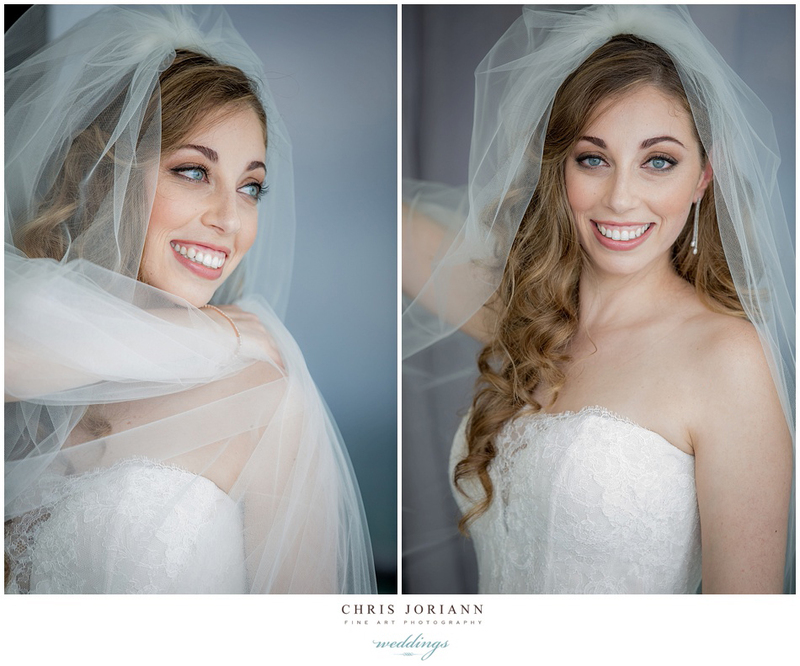 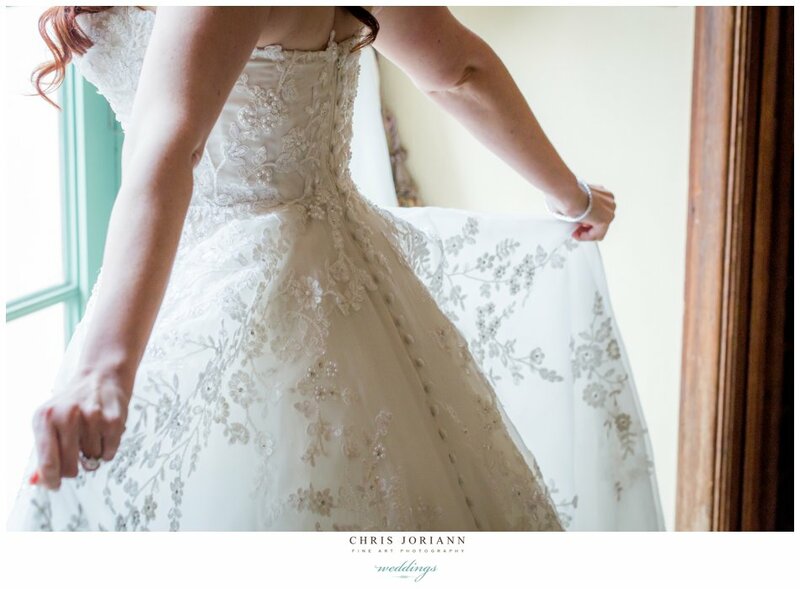 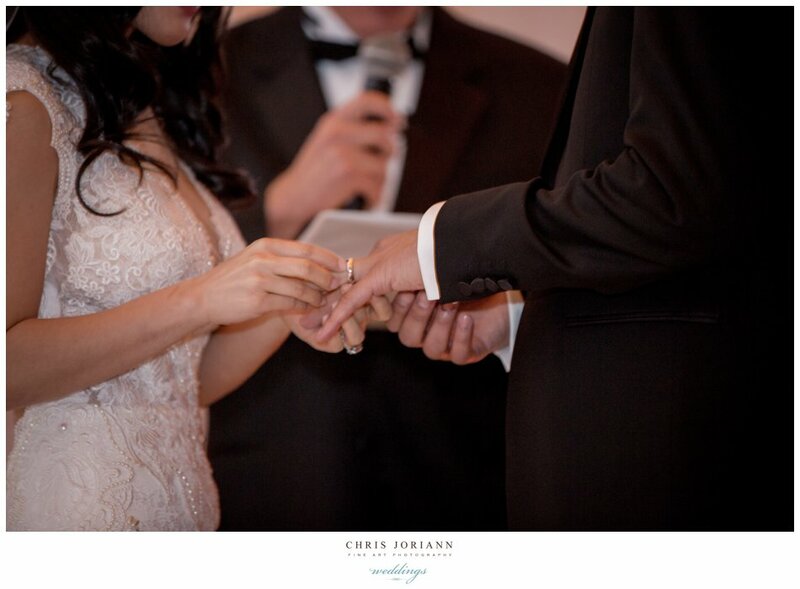 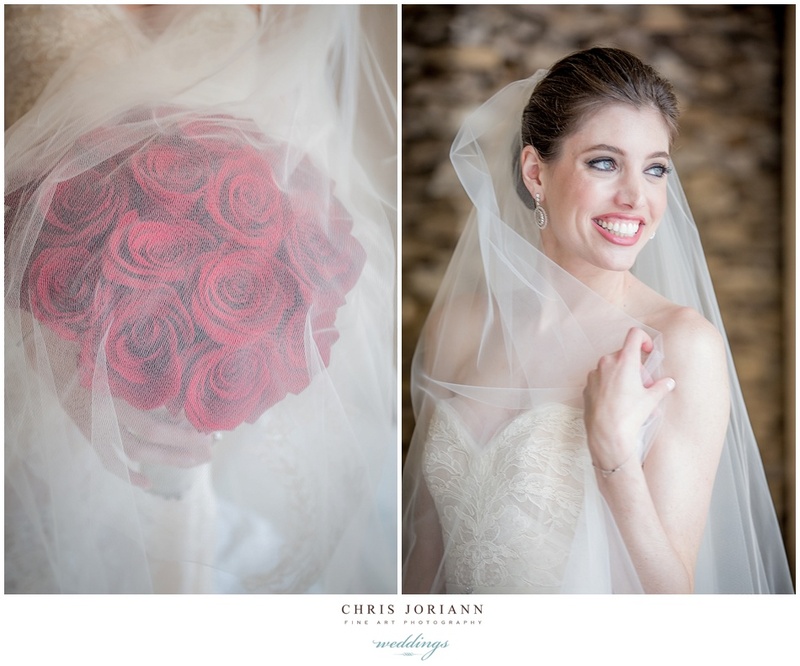 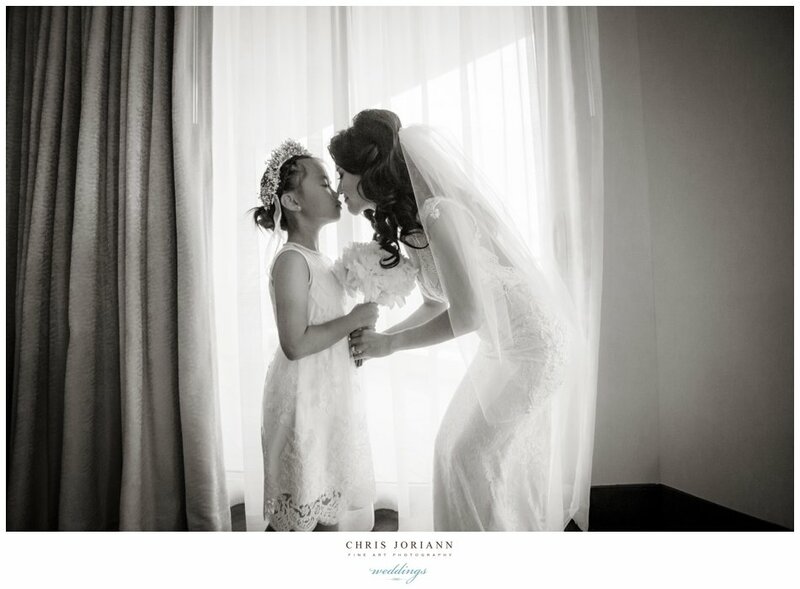 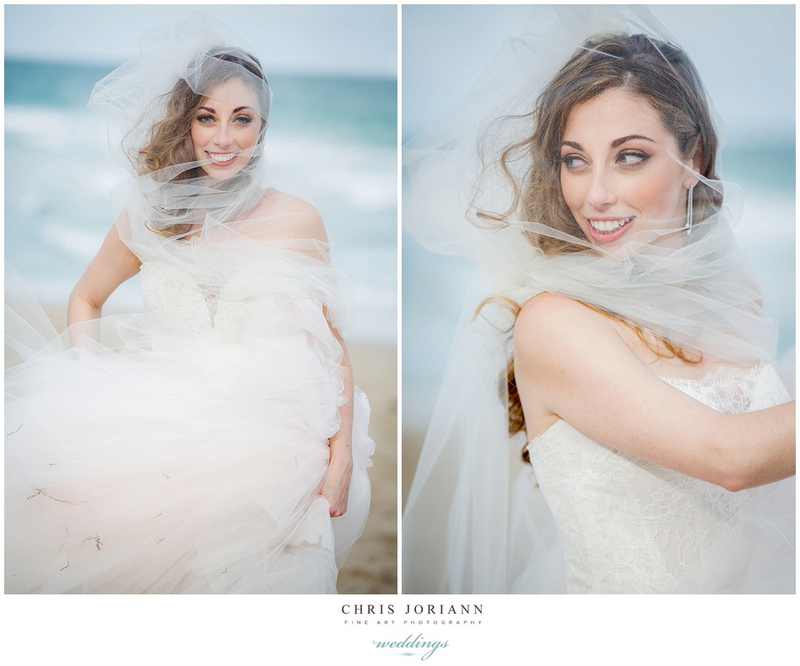 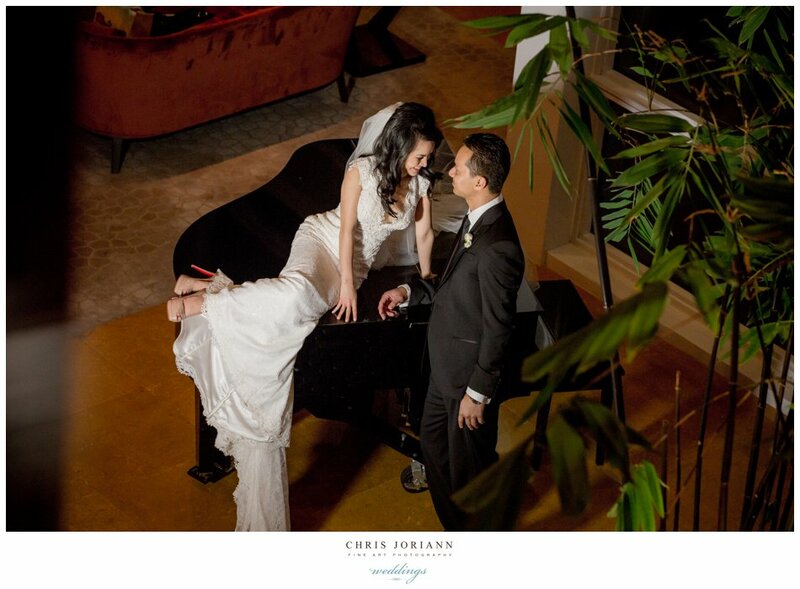 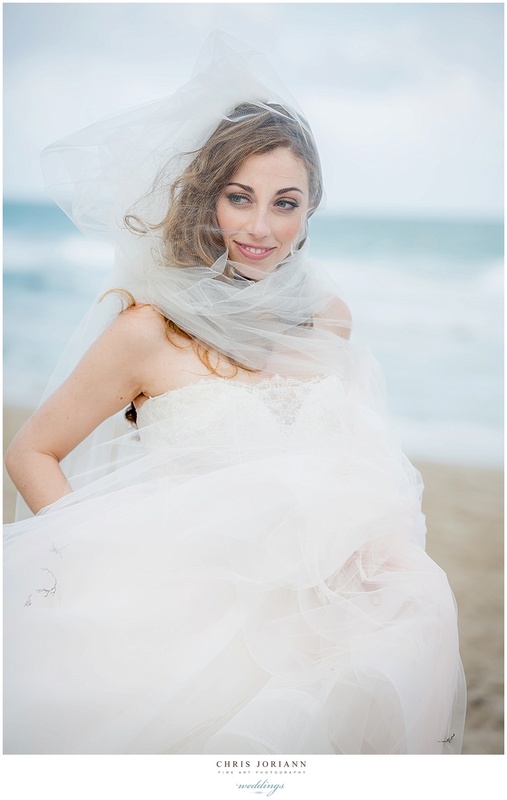 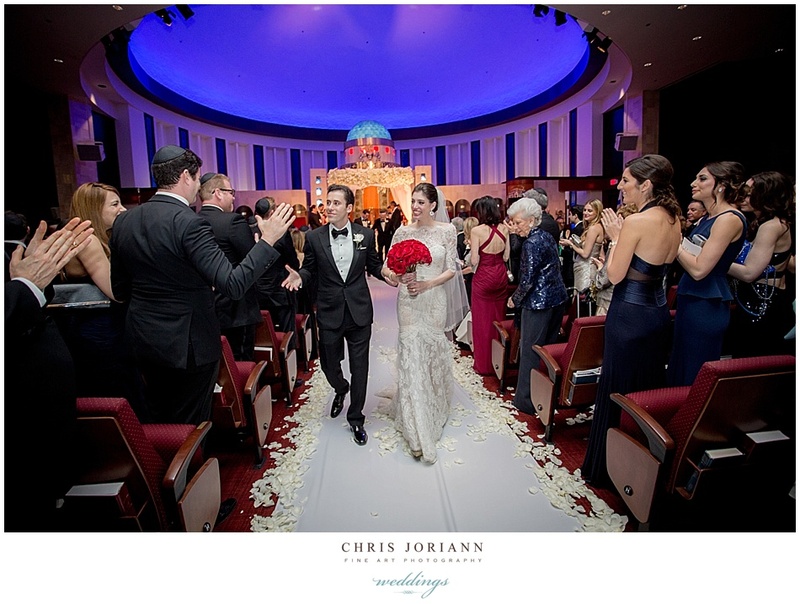 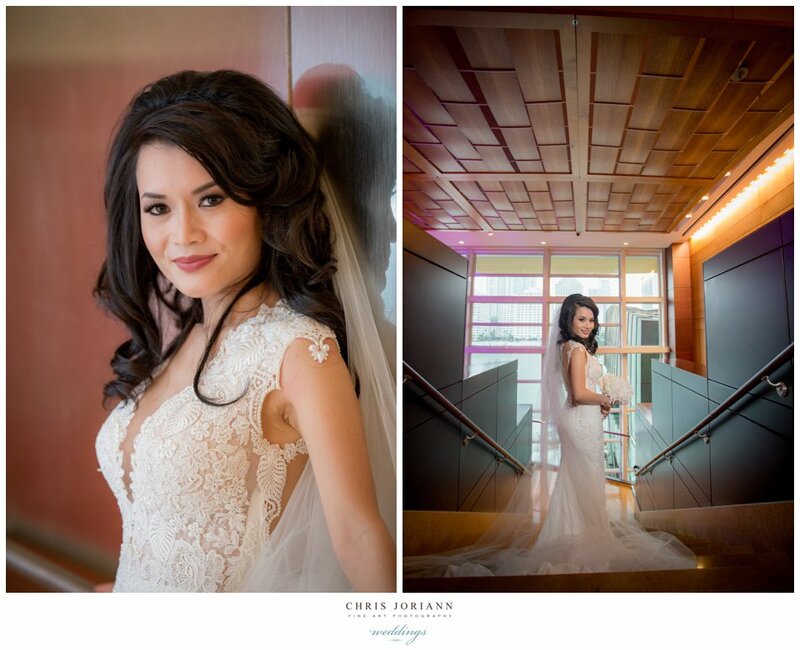 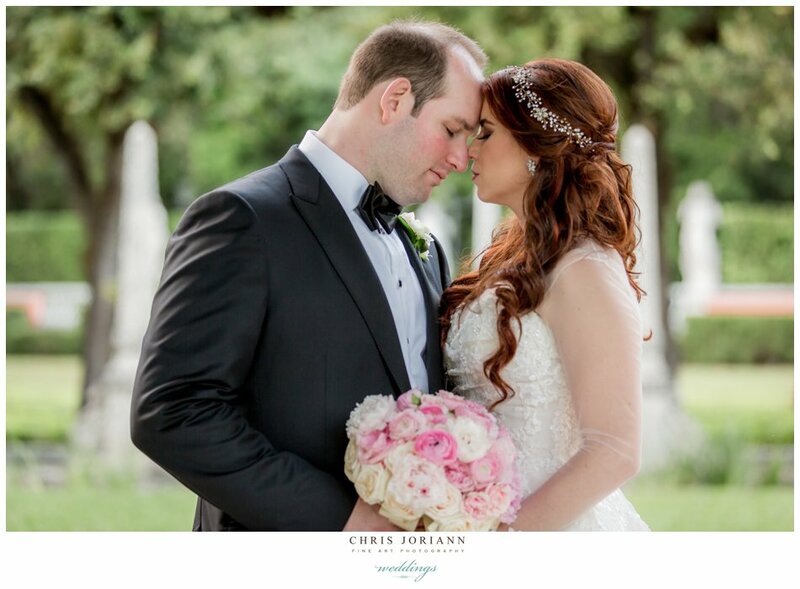 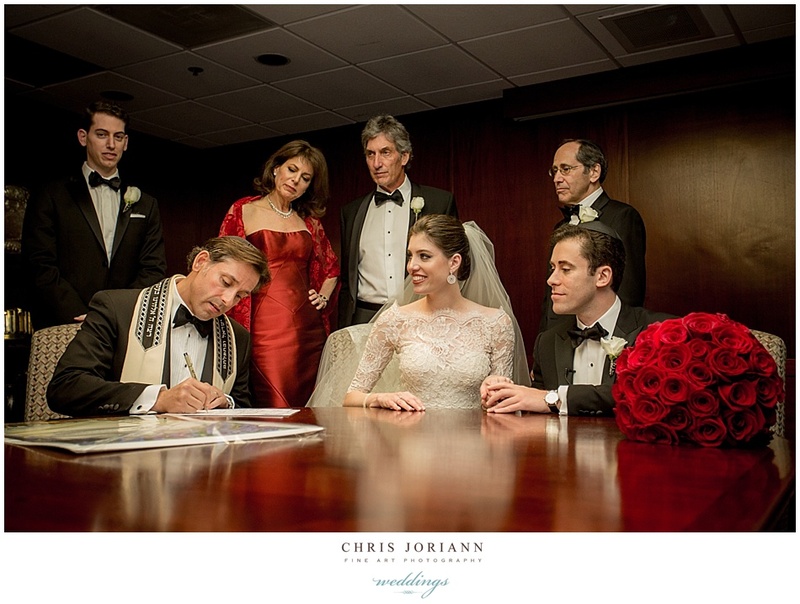 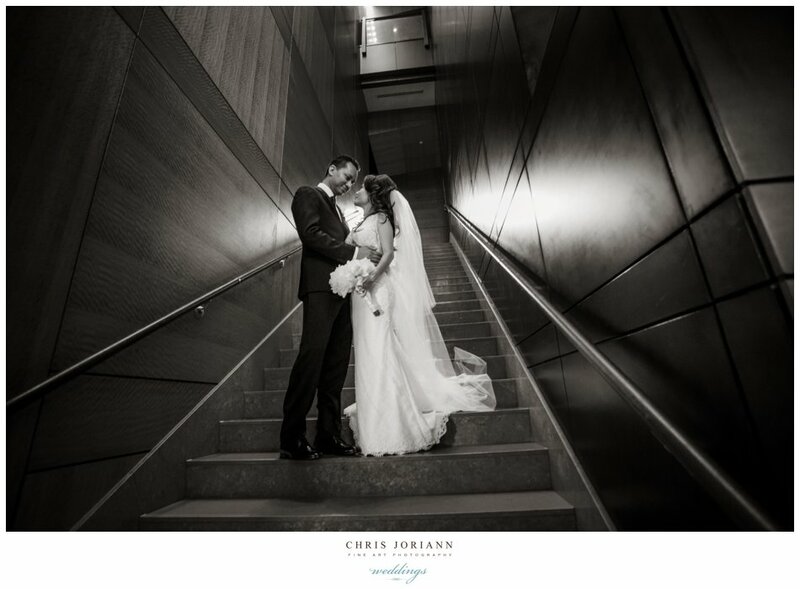 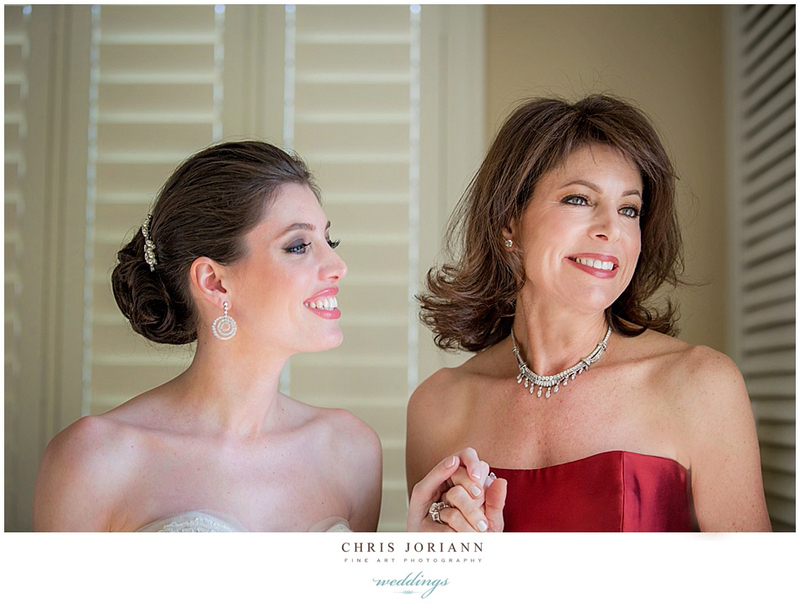 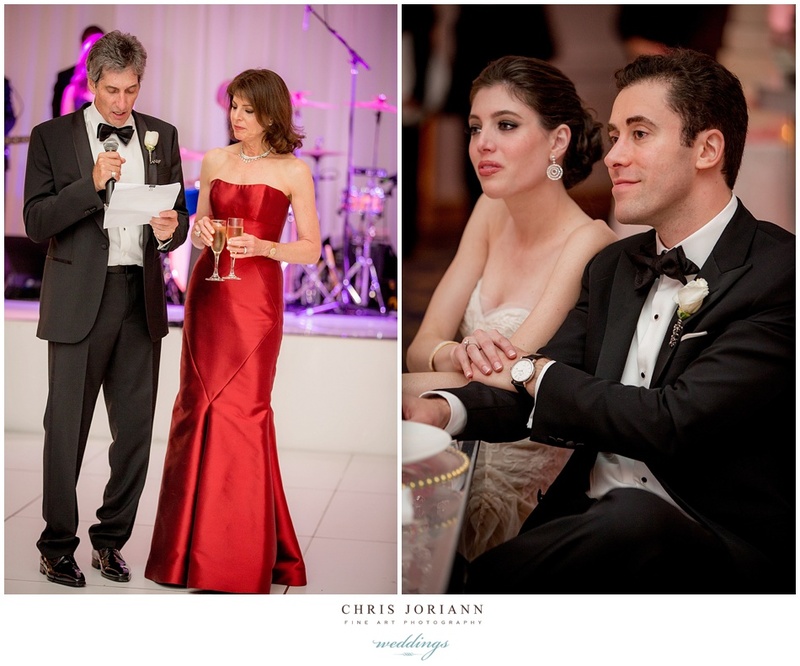 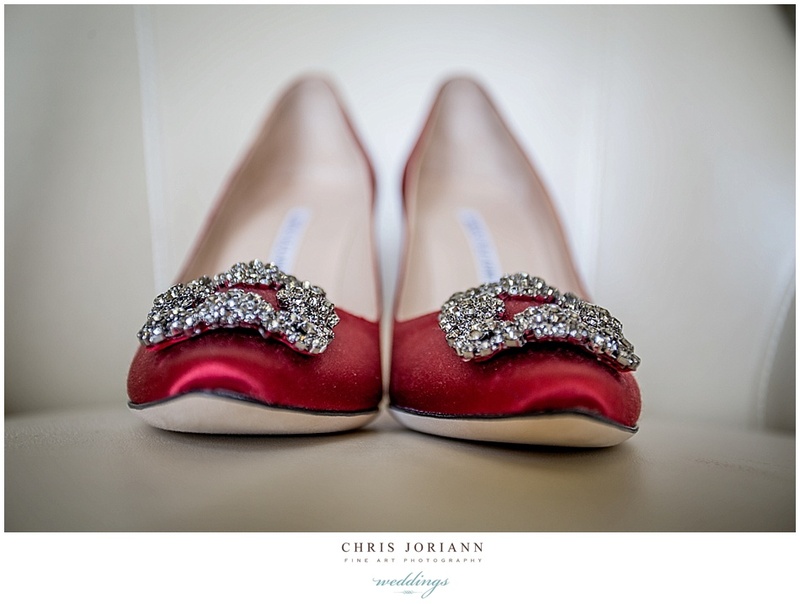 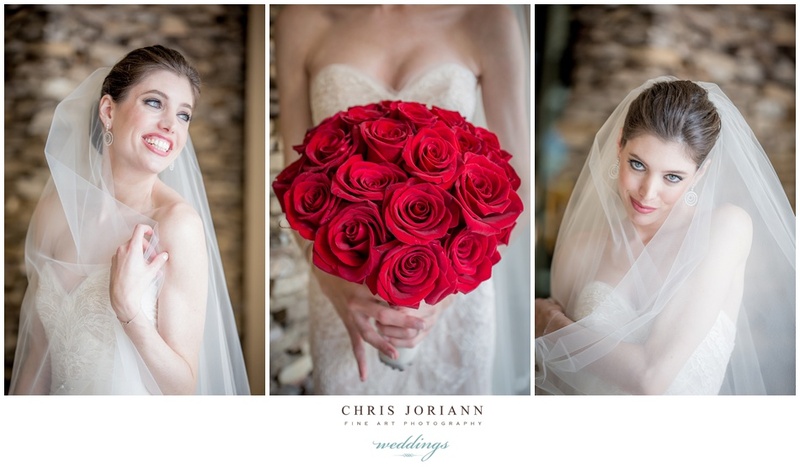 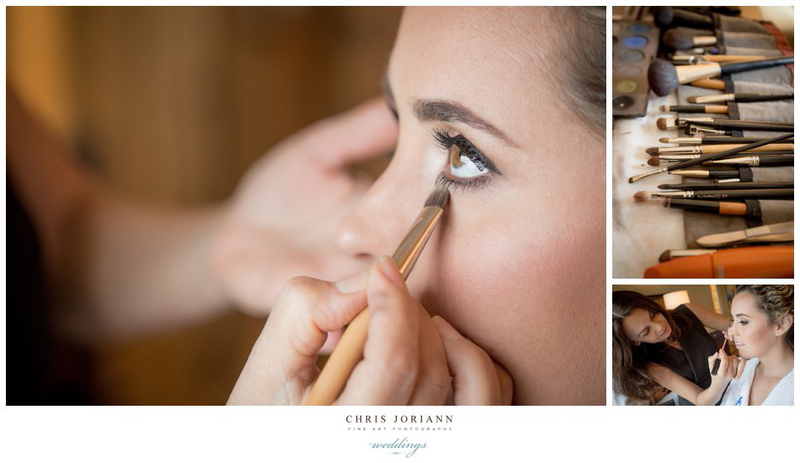 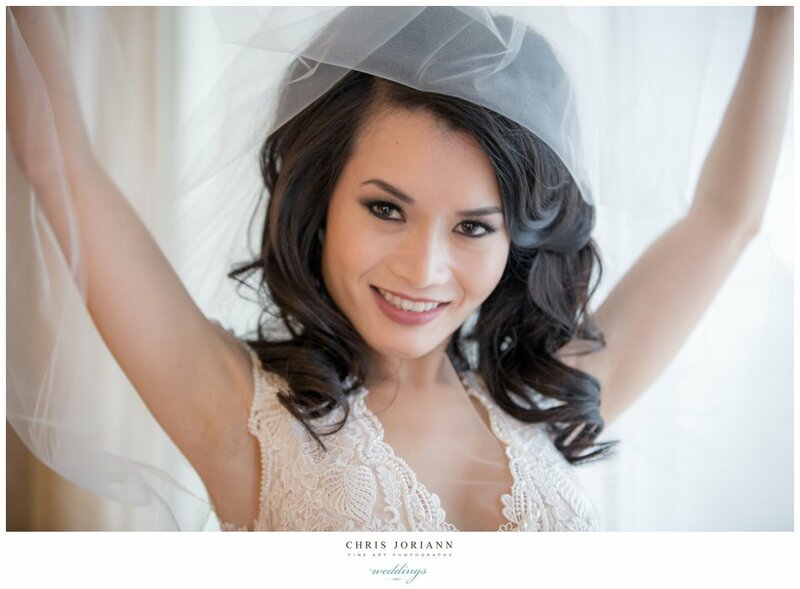 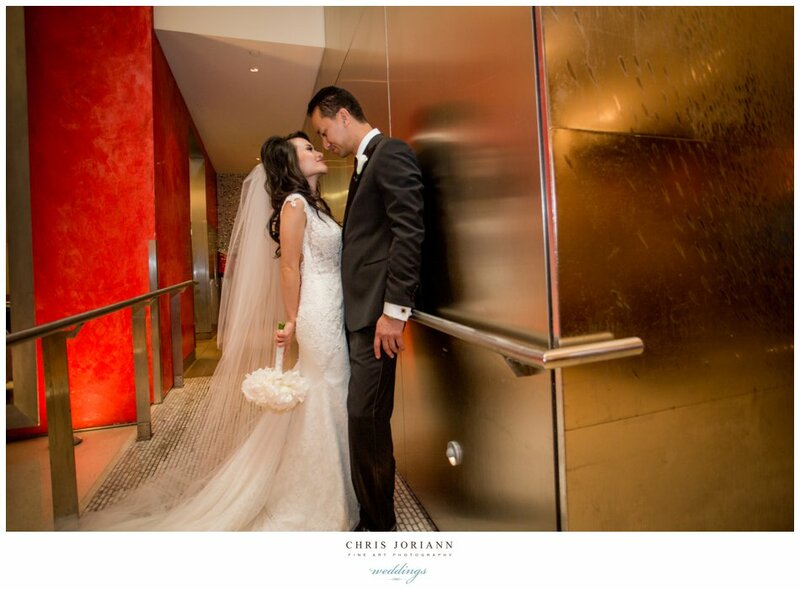 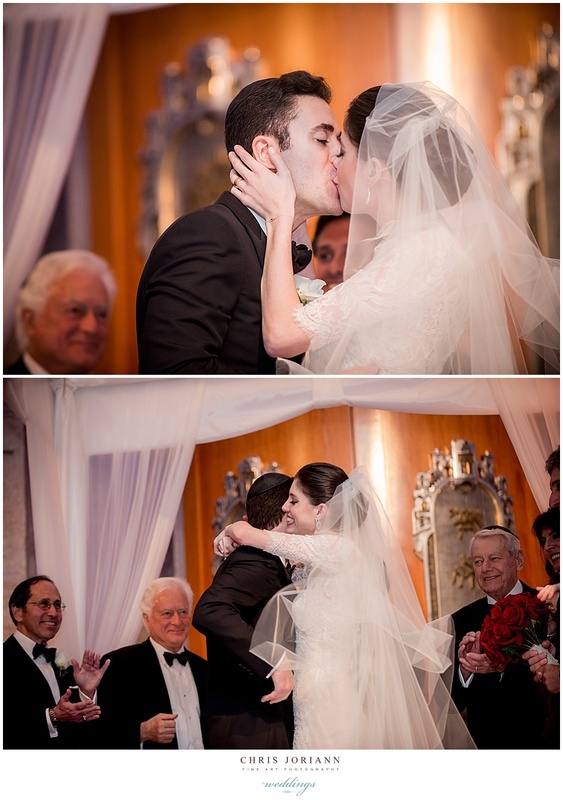 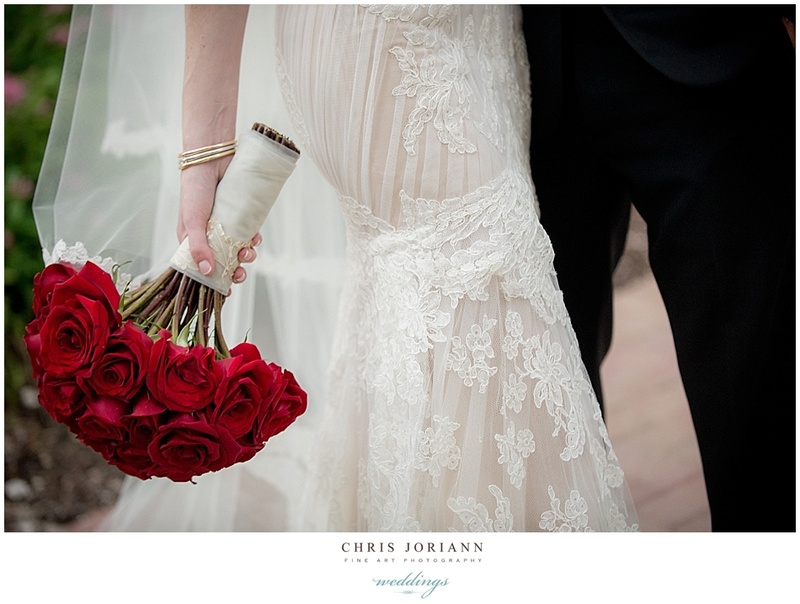 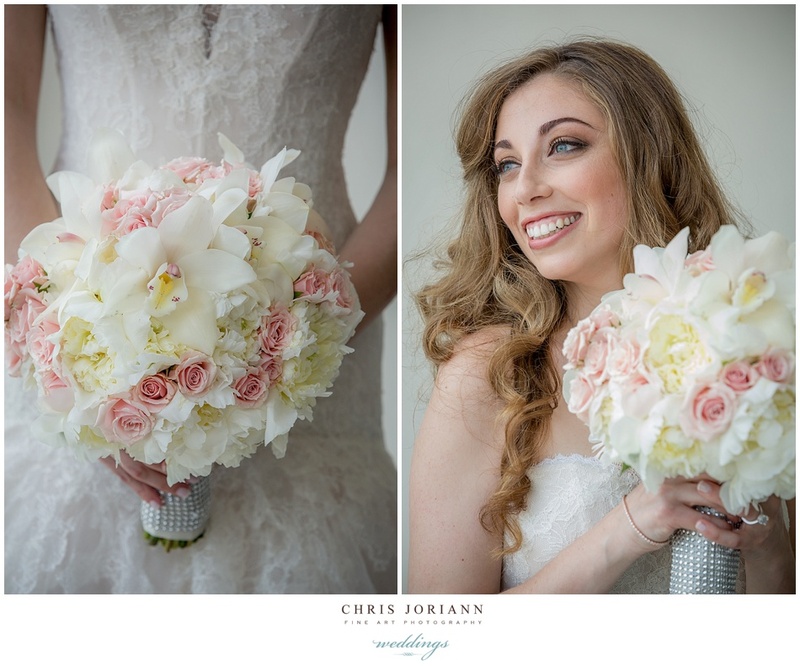 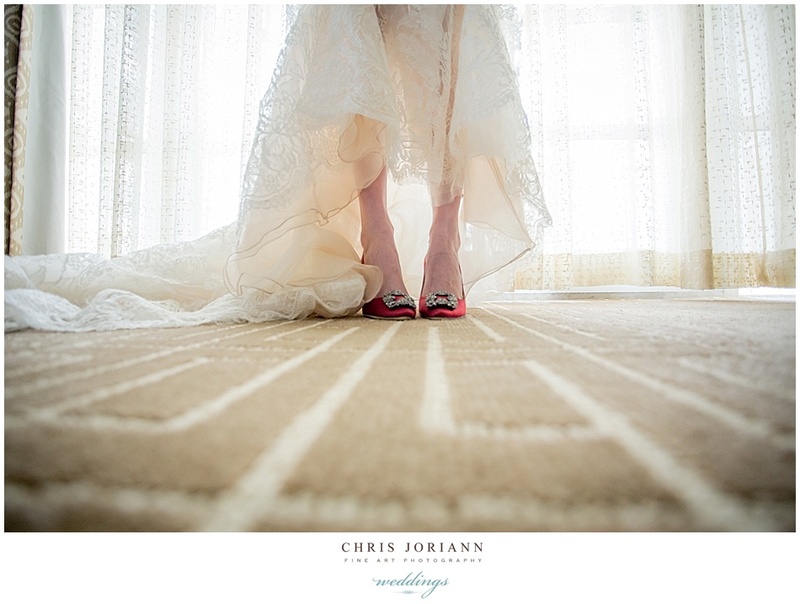 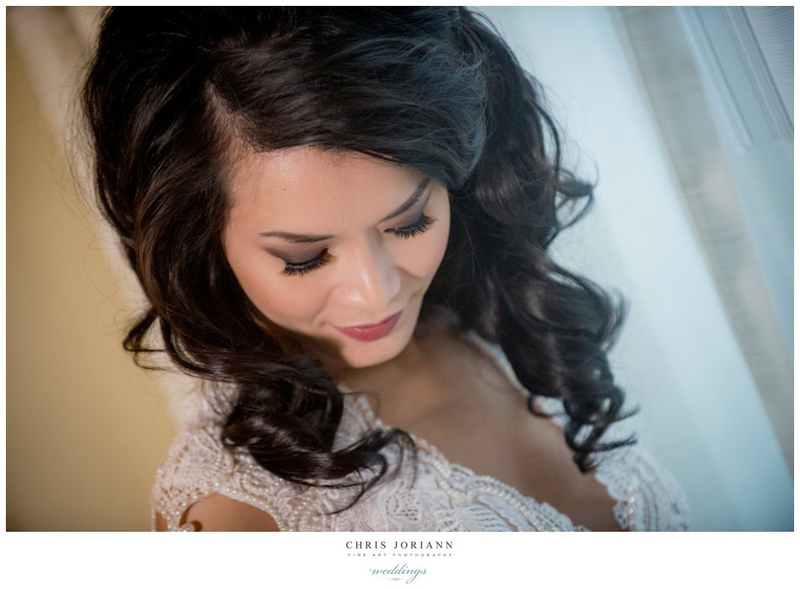 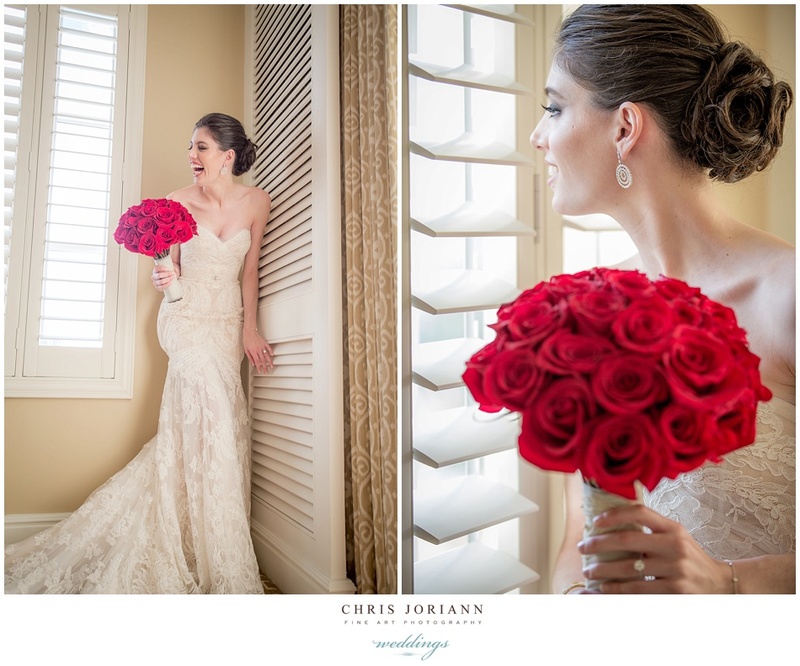 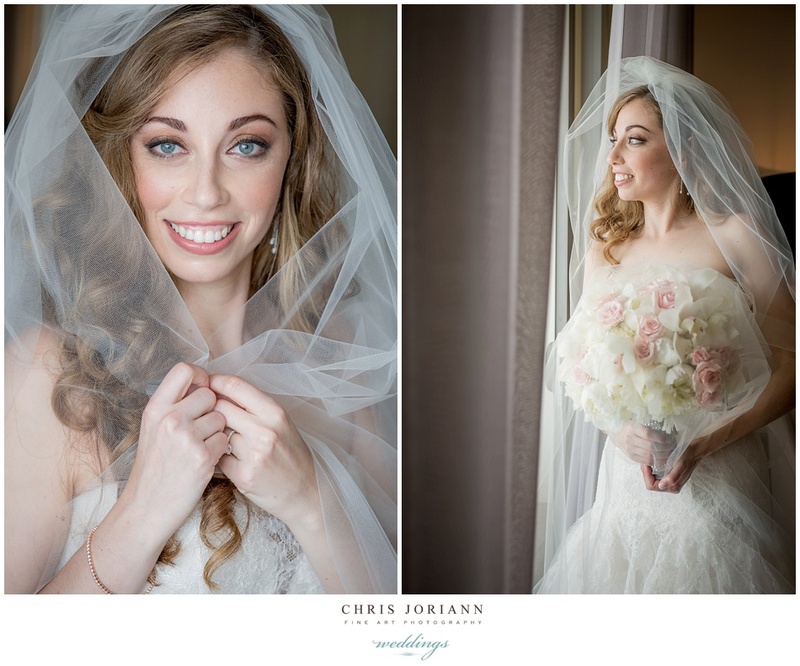 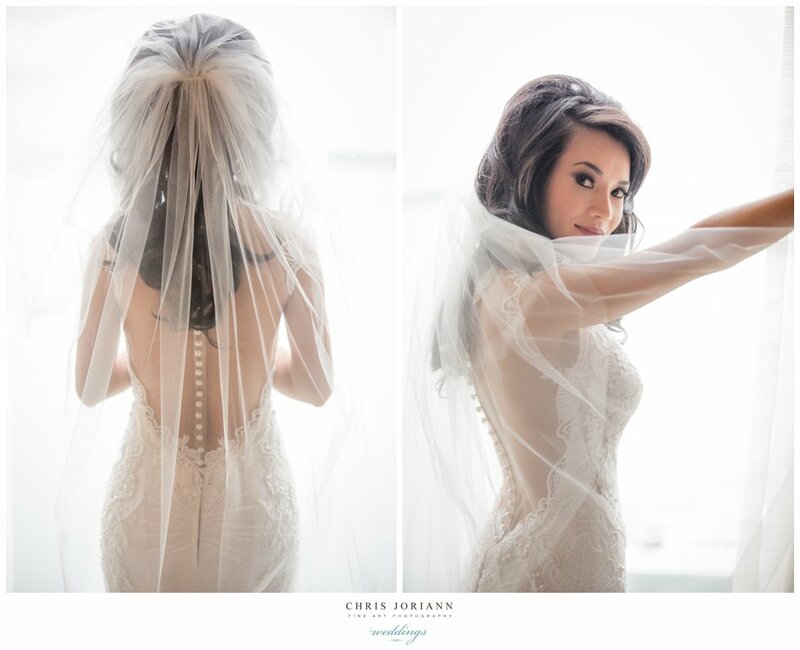 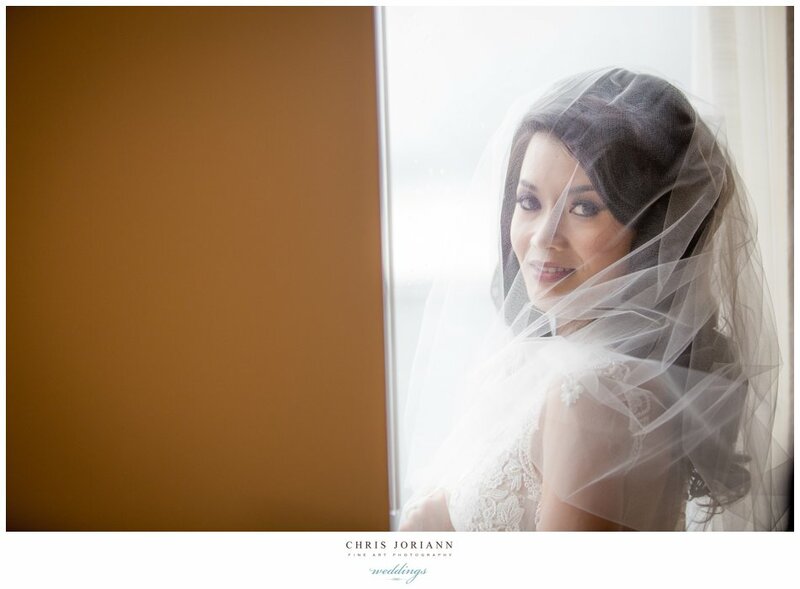 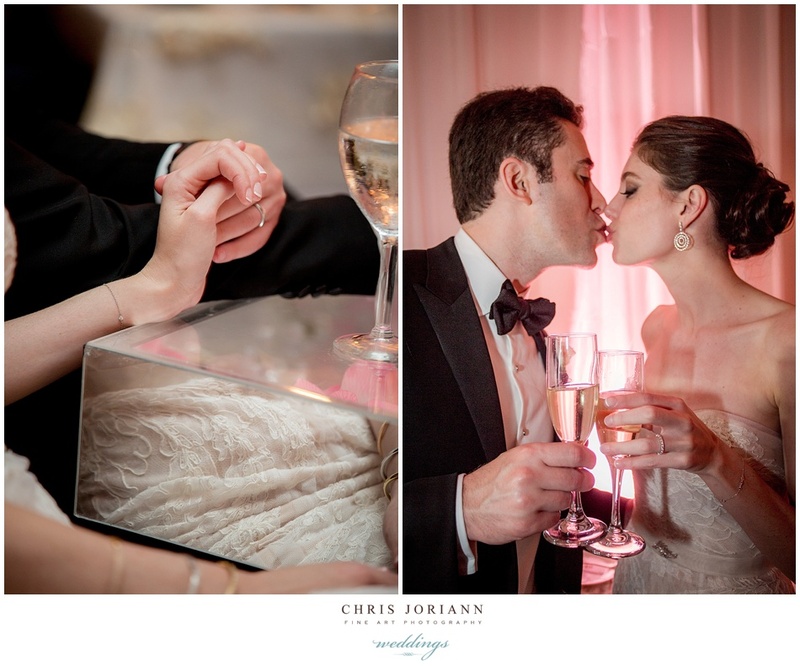 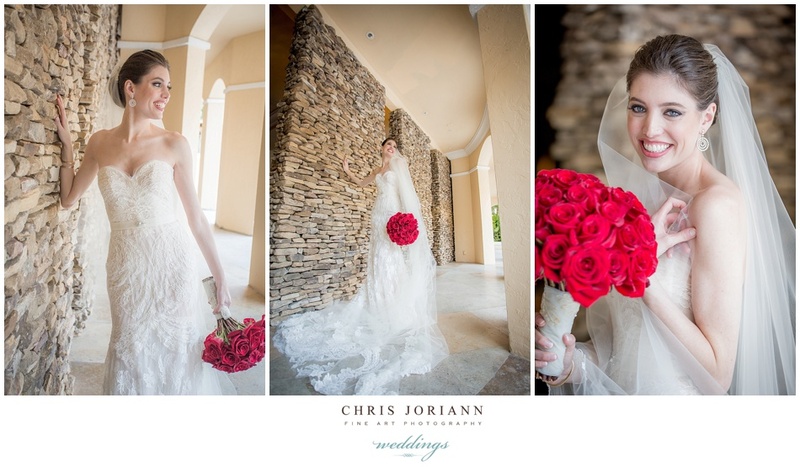 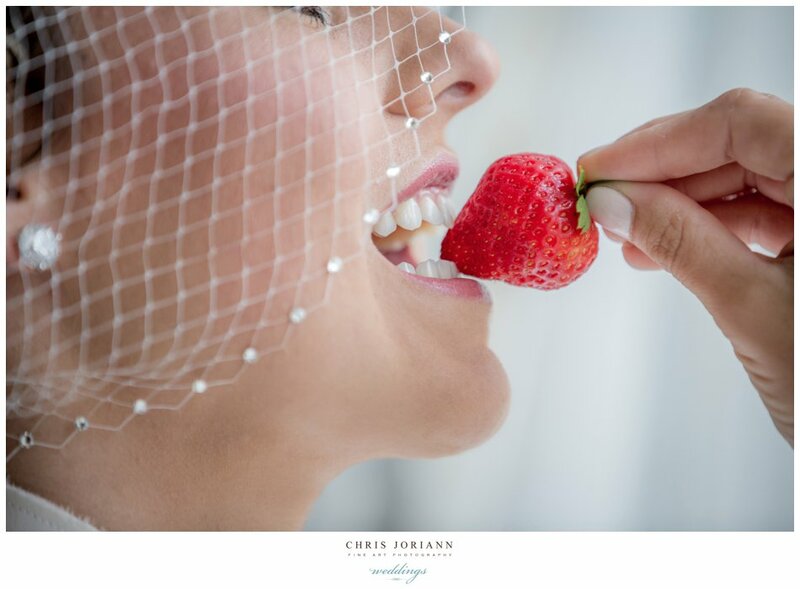 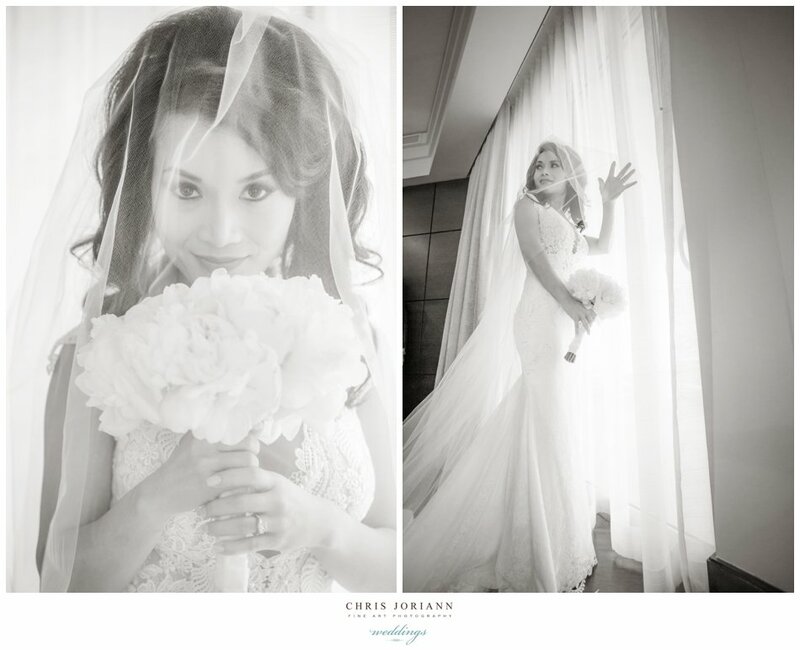 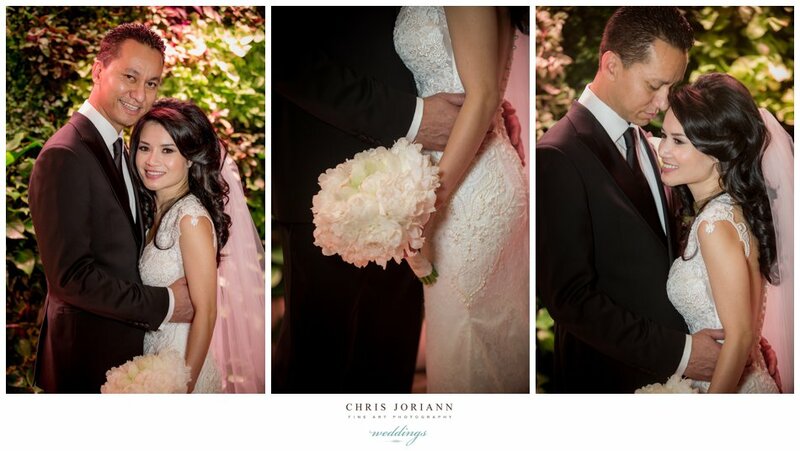 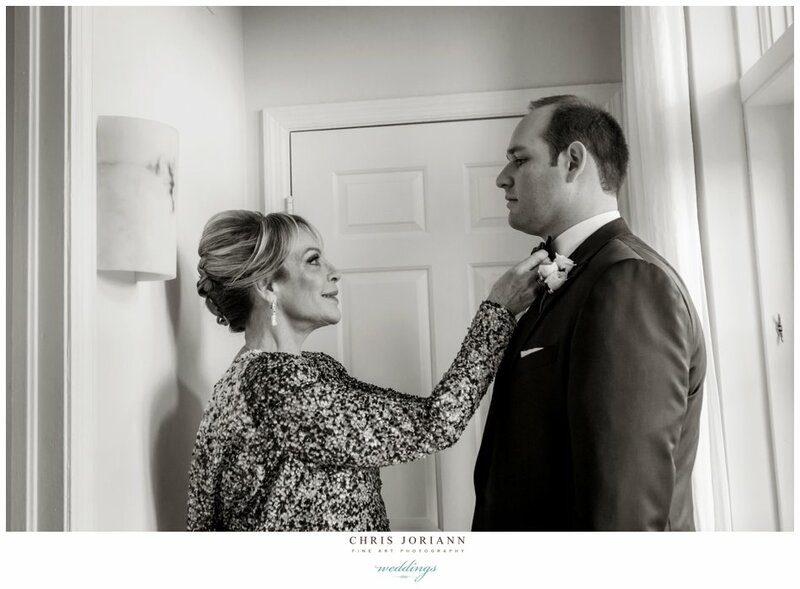 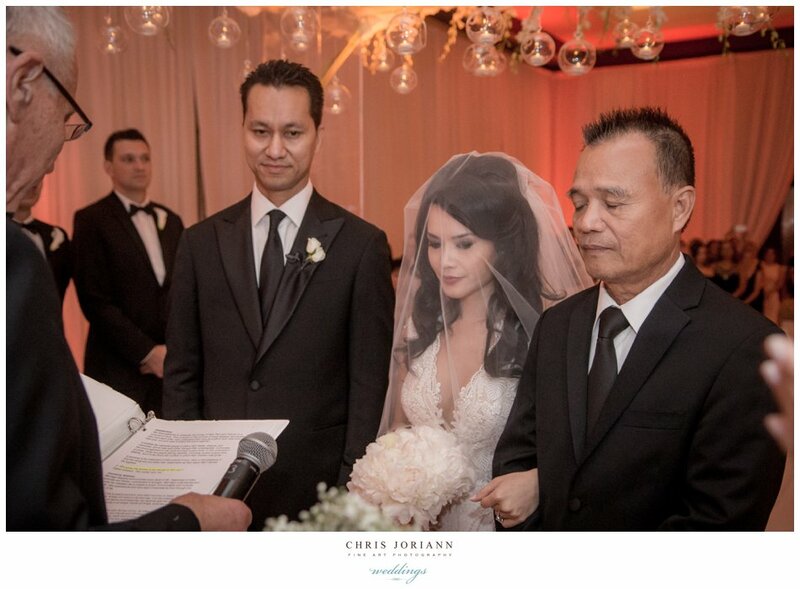 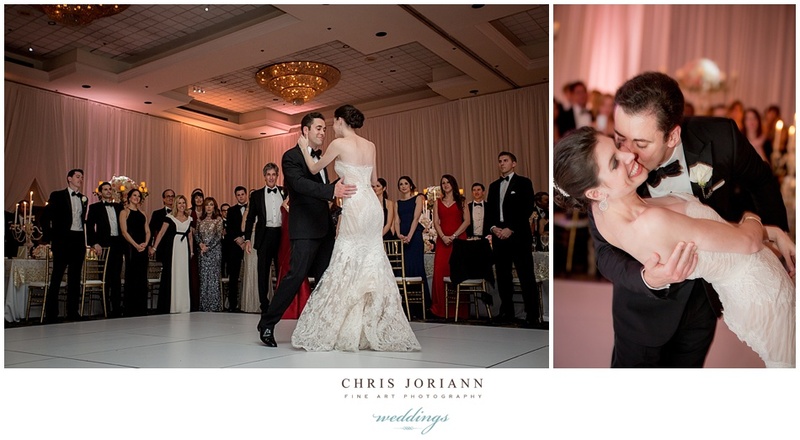 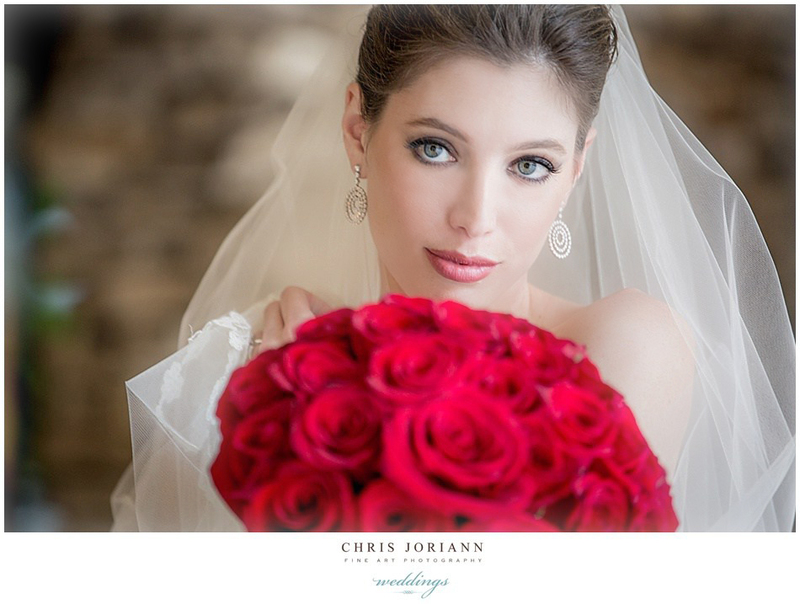 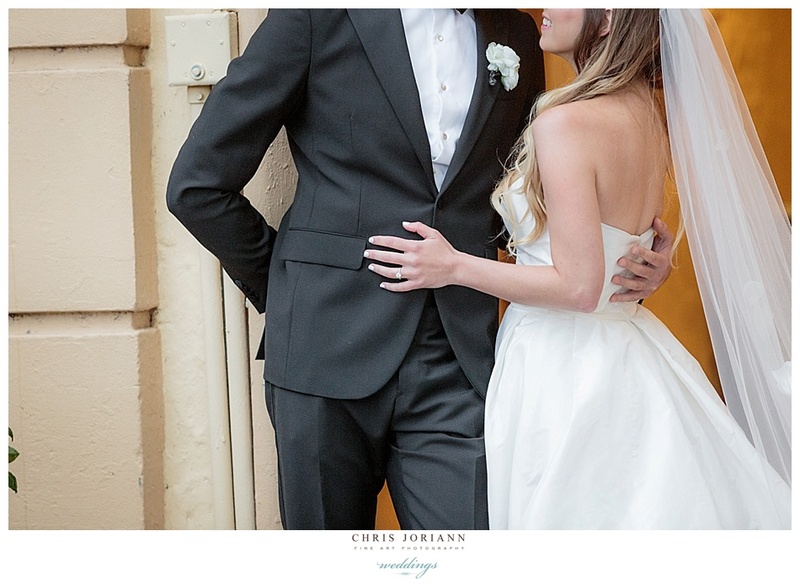 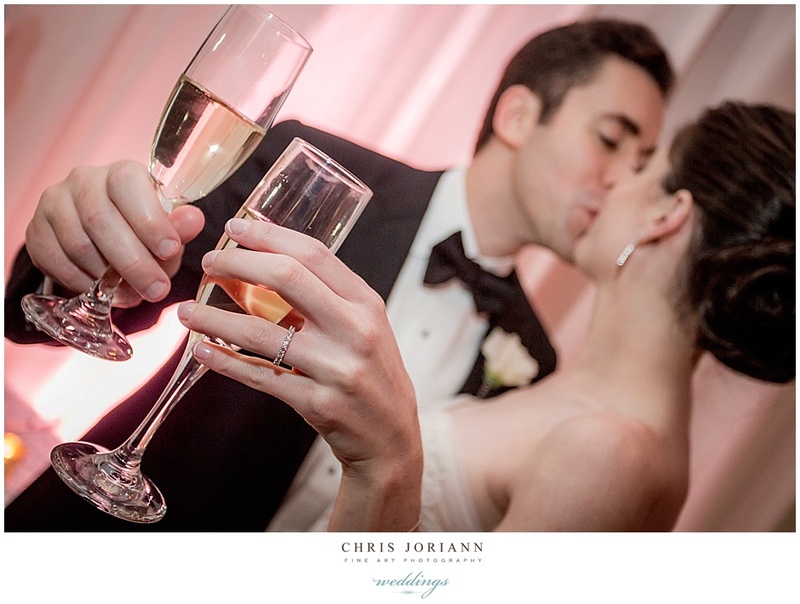 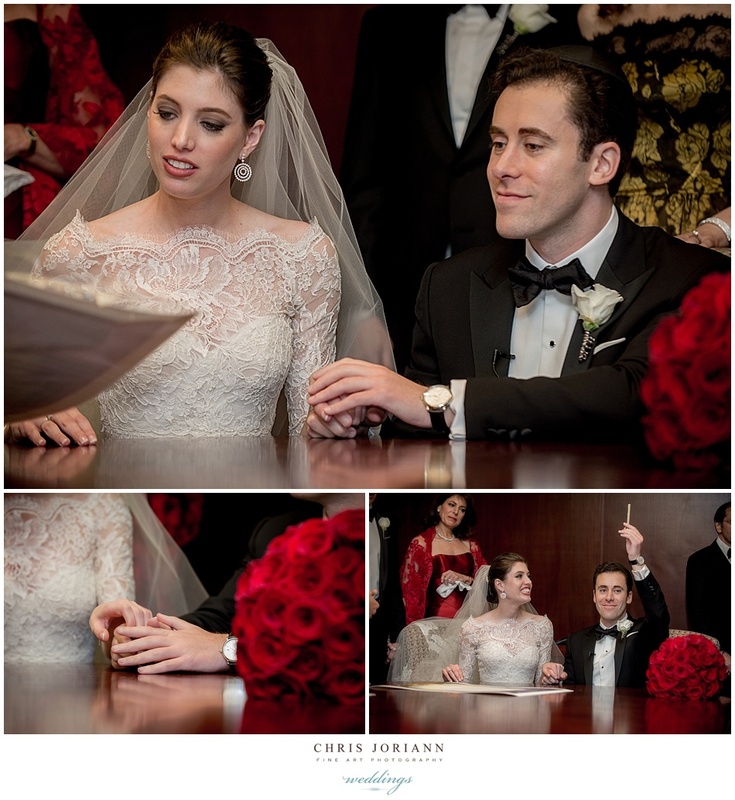 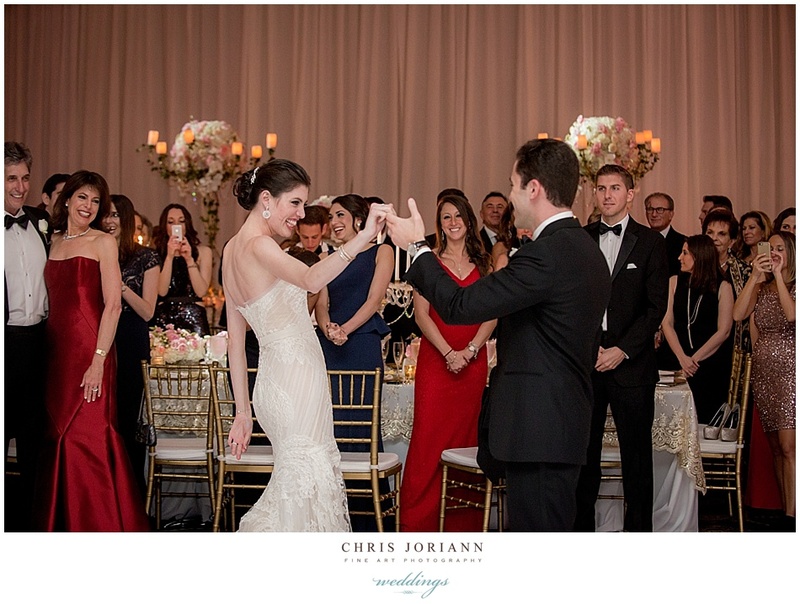 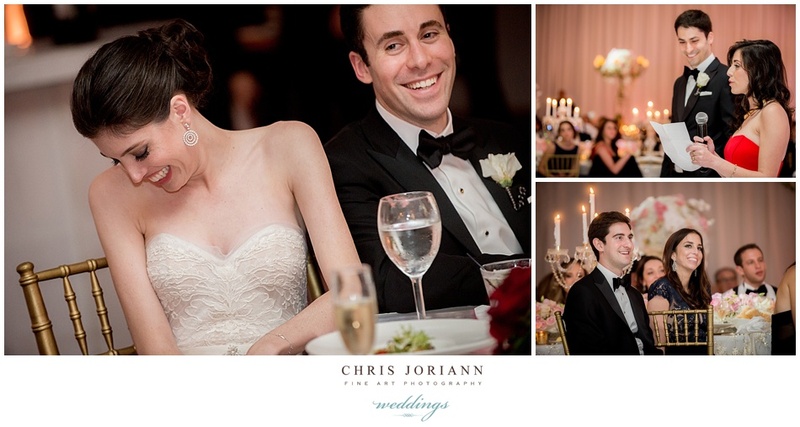 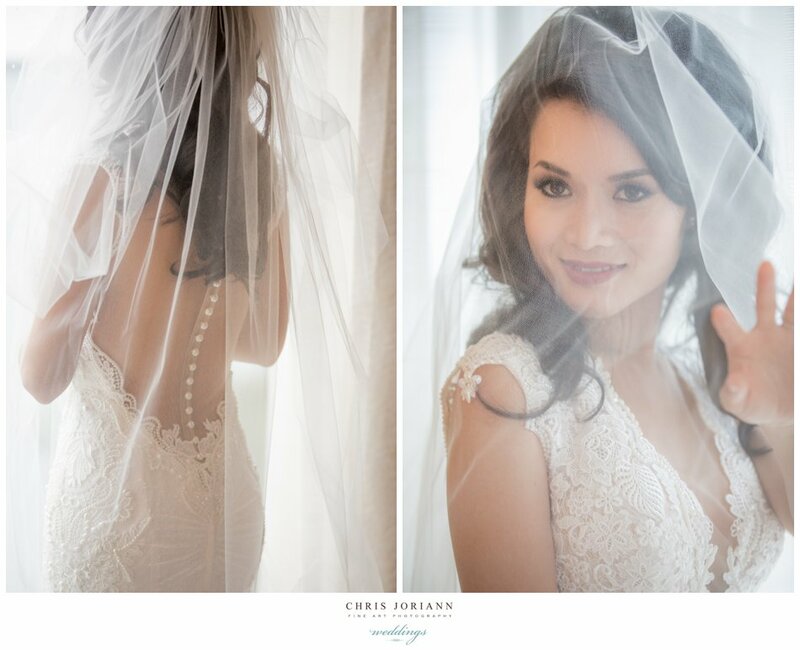 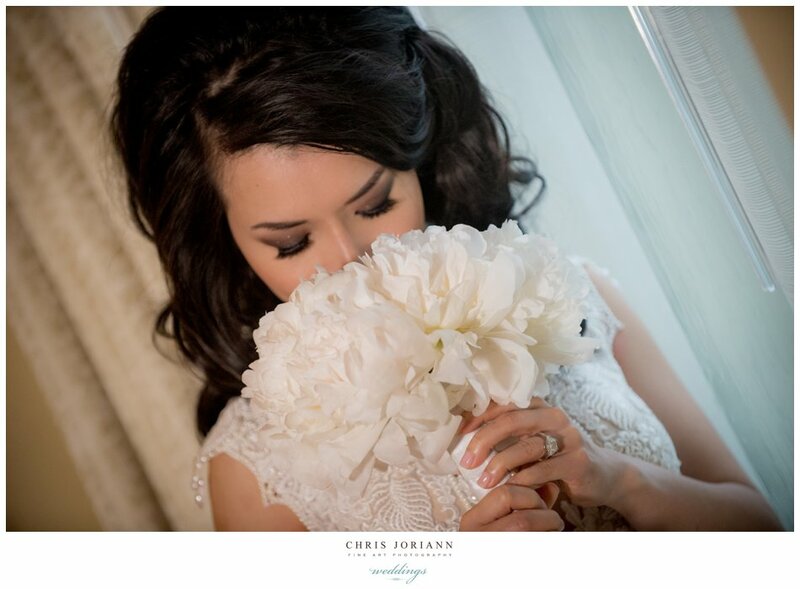 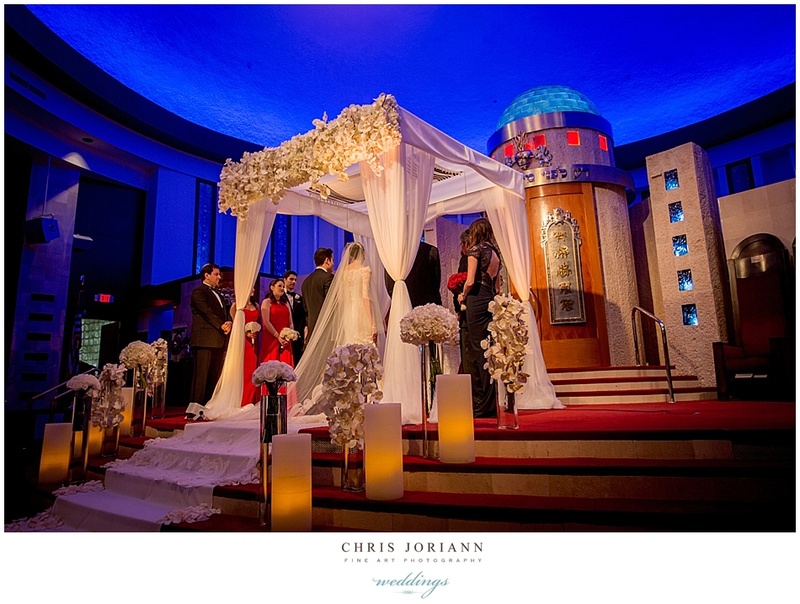 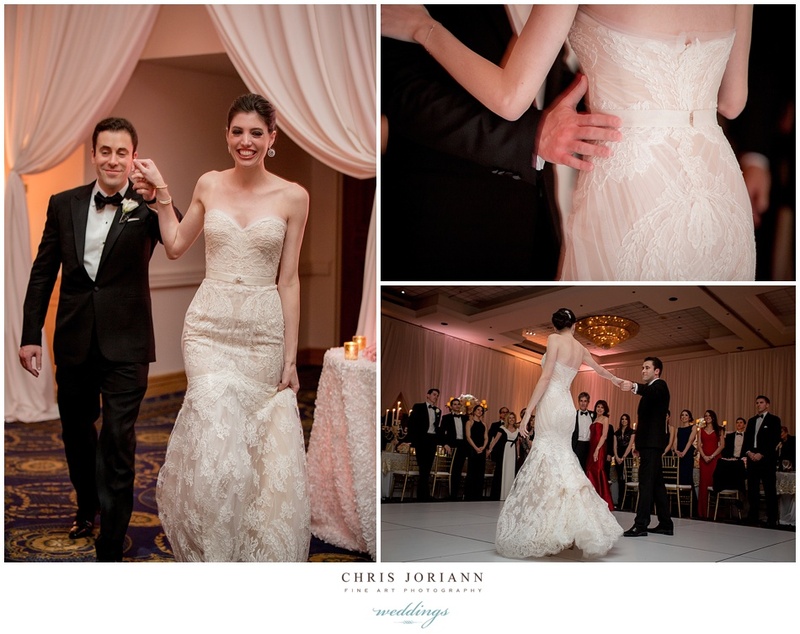 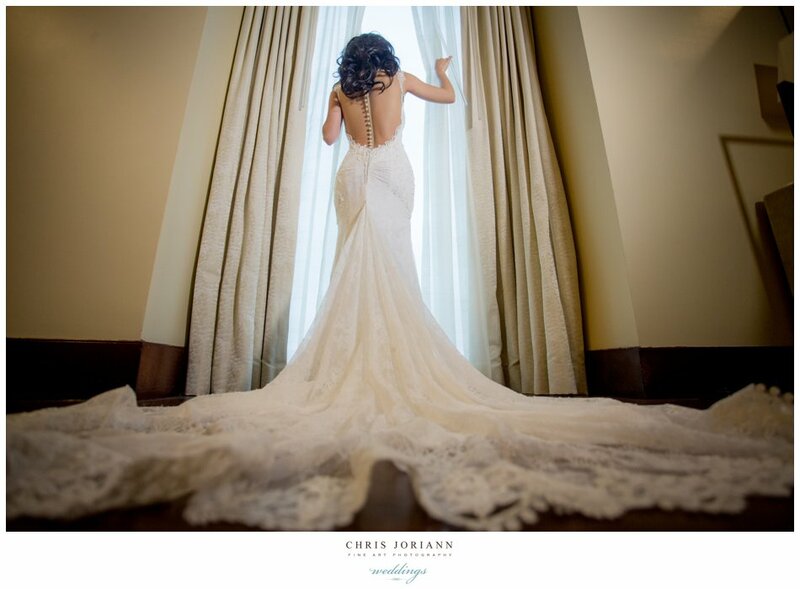 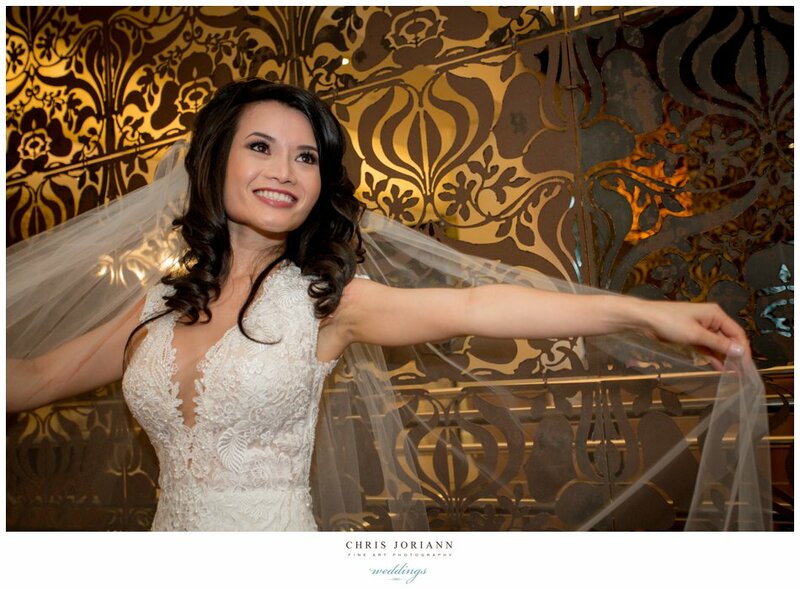 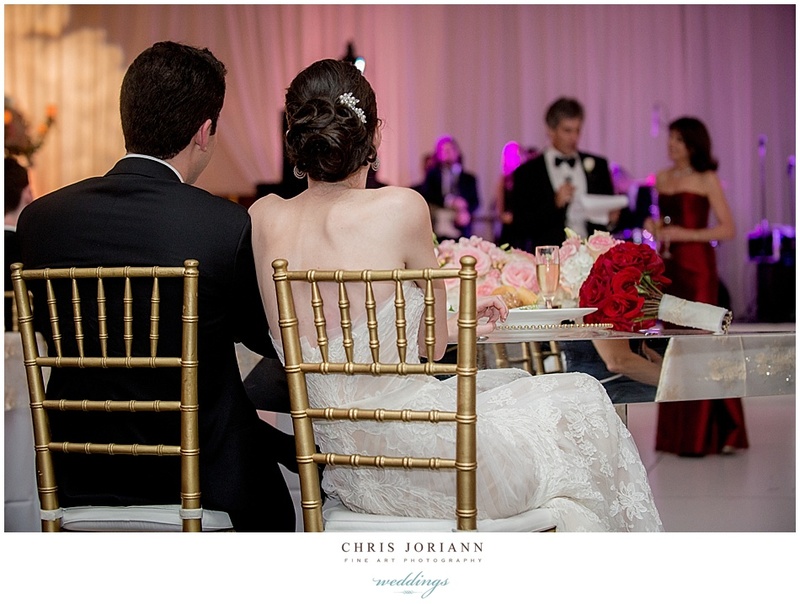 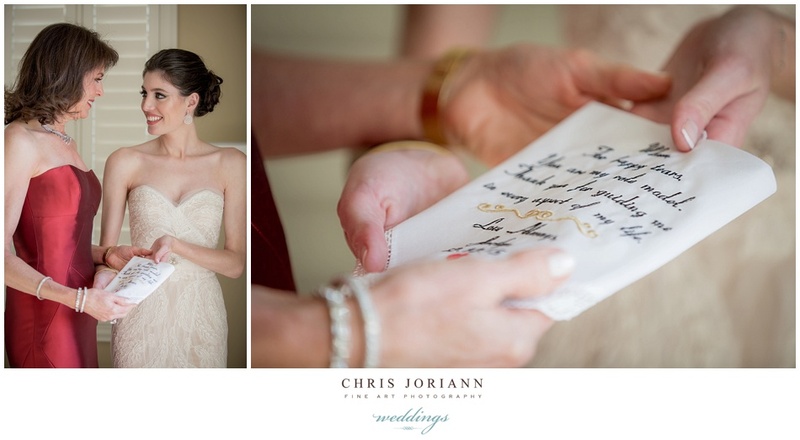 The bride wore a stunning Ines DiSanto couture gown and of course, classic RED Chanel lips!!! 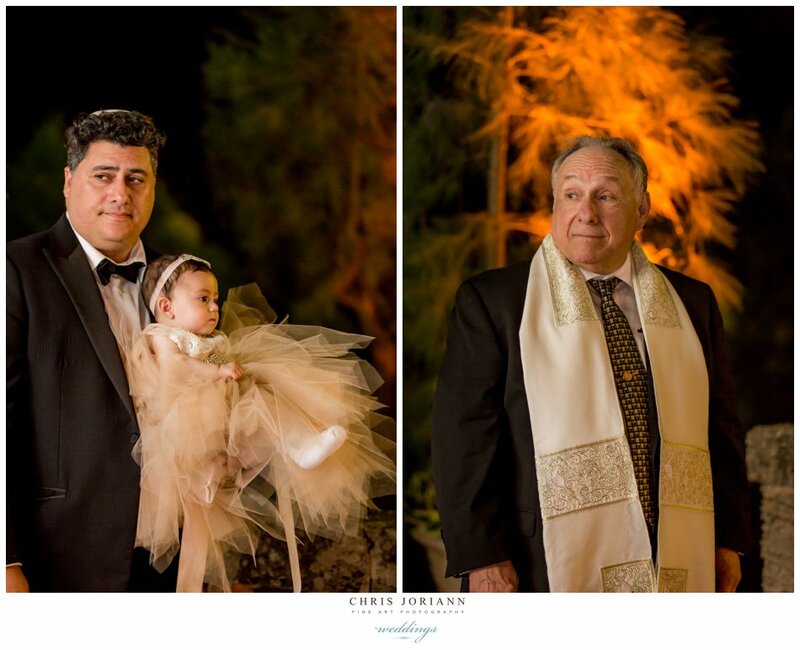 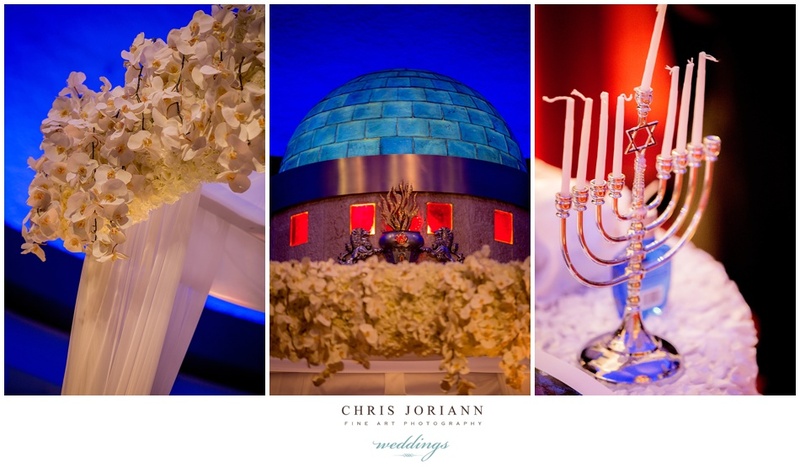 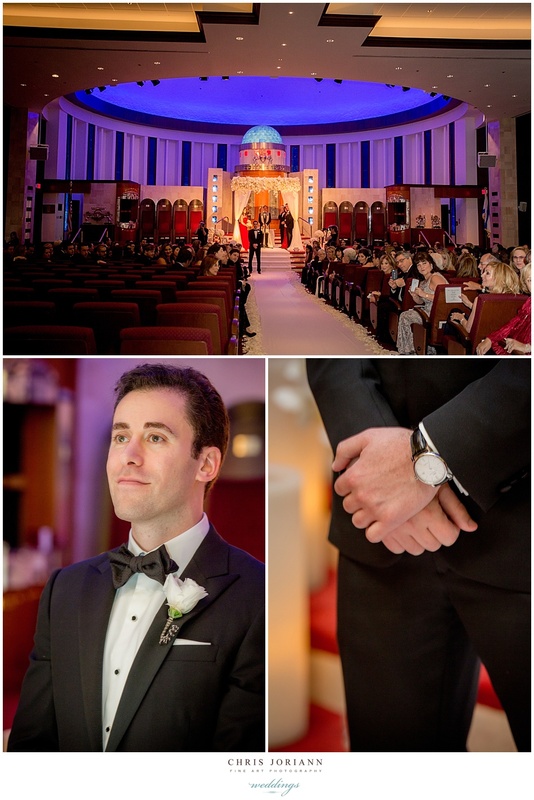 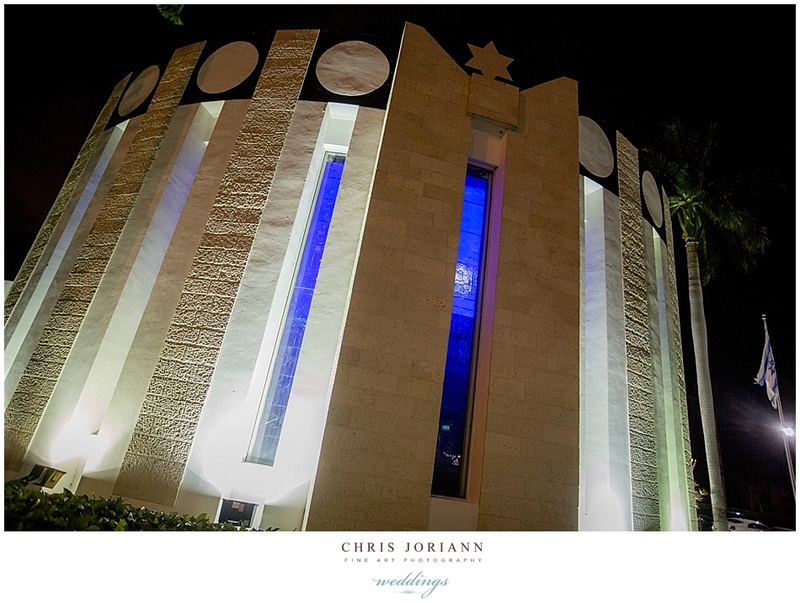 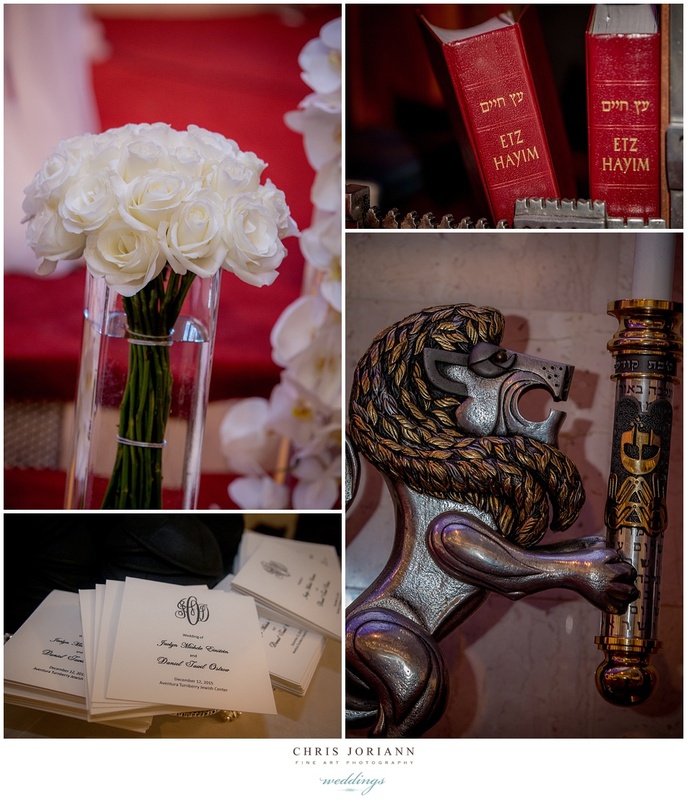 Later that evening, the ceremony was held in the temple at Aventura Turnberry Jewish Center, with cocktails and reception, organized by event planner Lori Kelly, following. 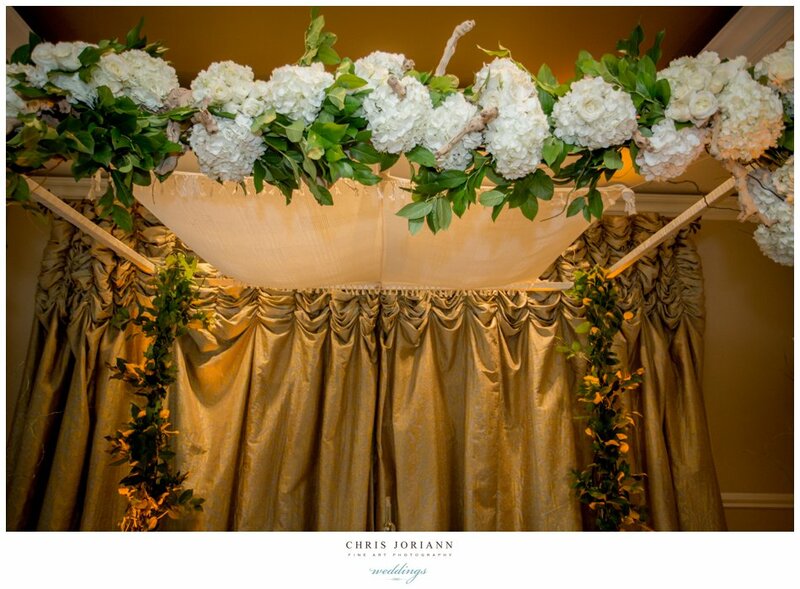 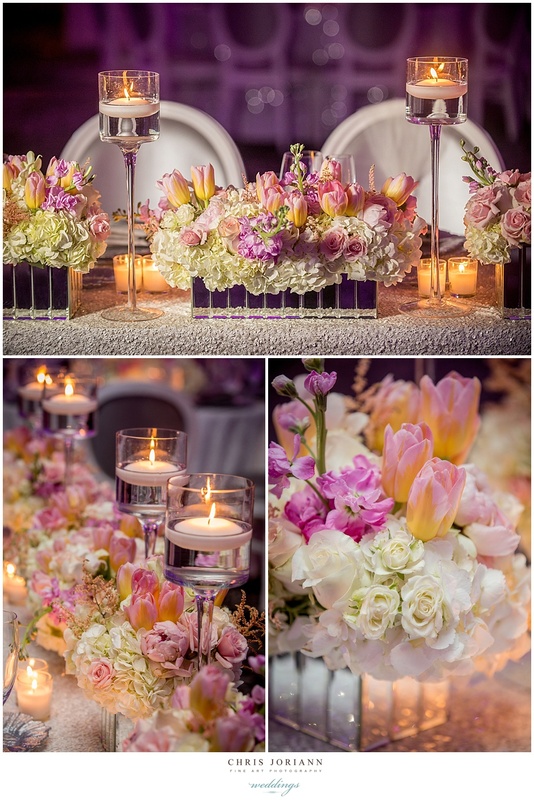 Florals and Décor by Corinne Abuaram for Blooming Events, transformed the space. 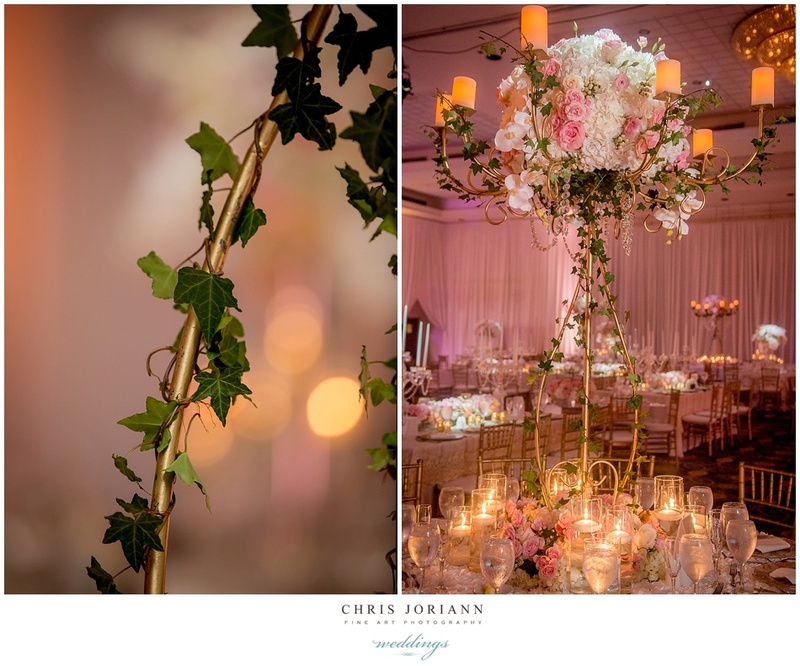 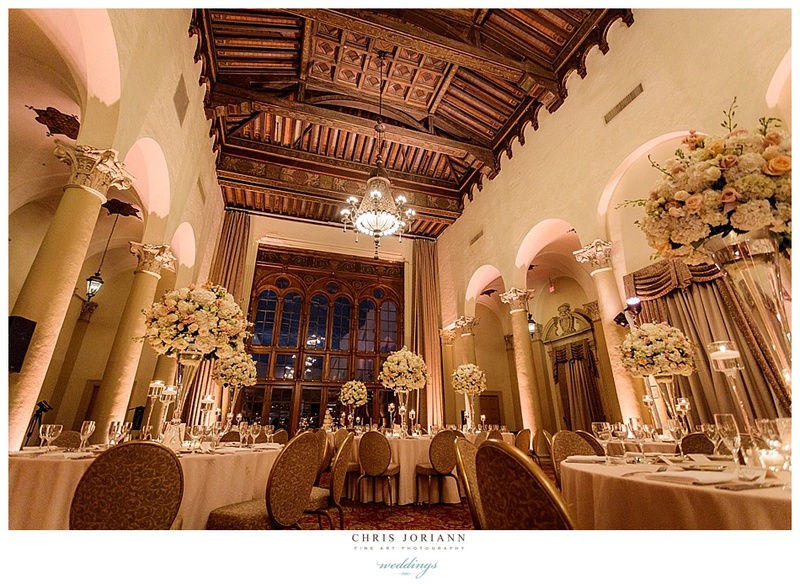 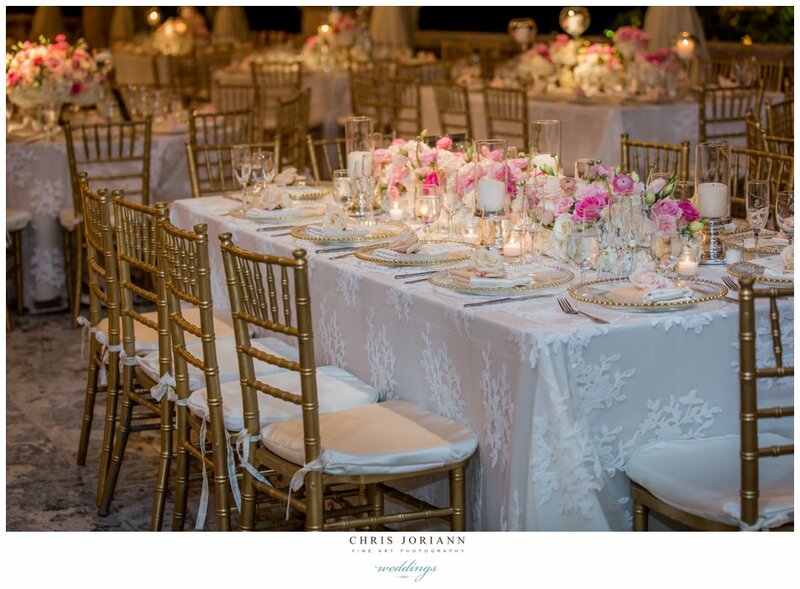 Gold chiavari chairs surrounded tables set in crystal candelabras, and gold centerpieces featured dripping ivy and white orchids in a blush lit room. 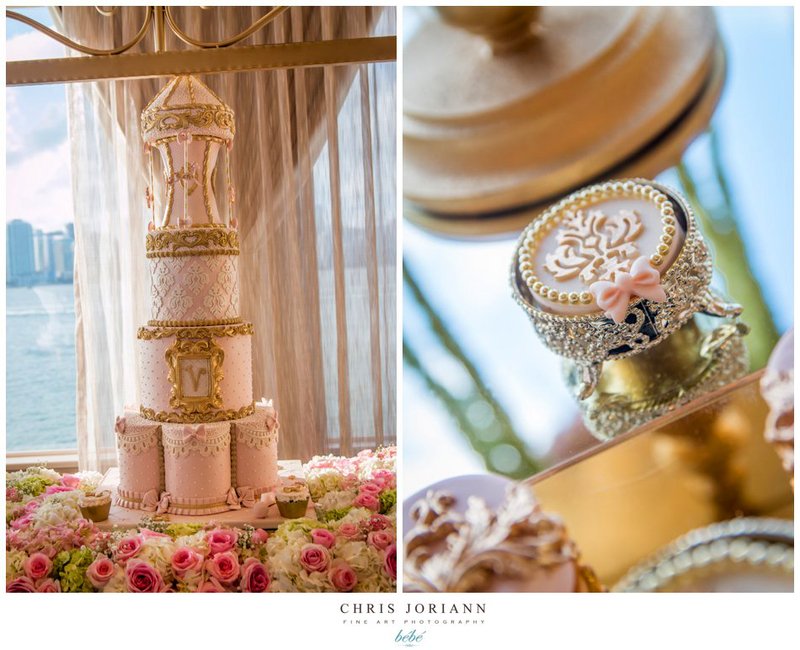 An Ana Paz 5-tiered, 14k gold accented fondant wedding cake added a touch of nostalgia, with a Lladro statuette which years before stood a top the bride’s parents cake. 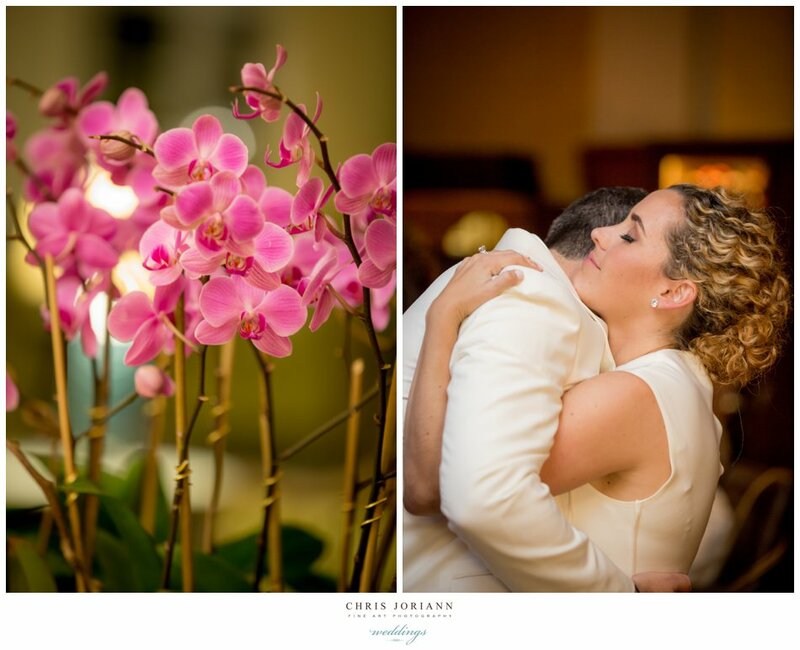 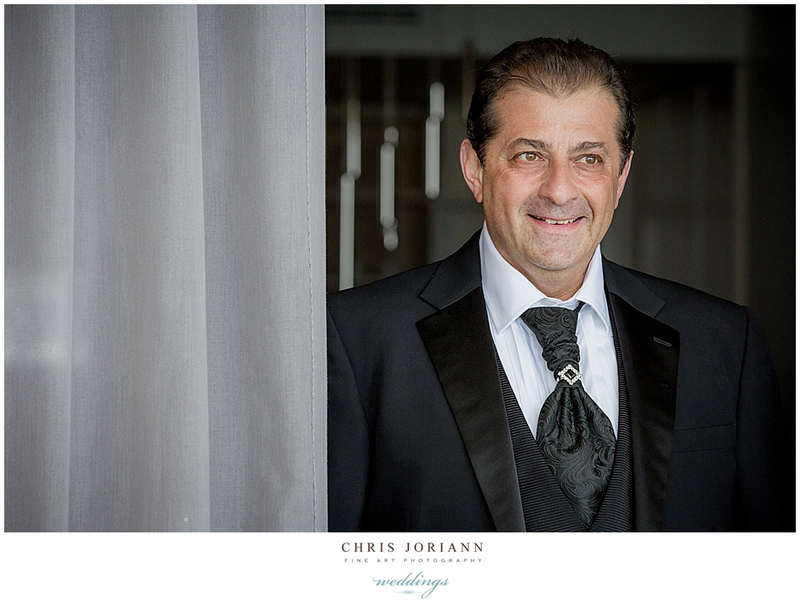 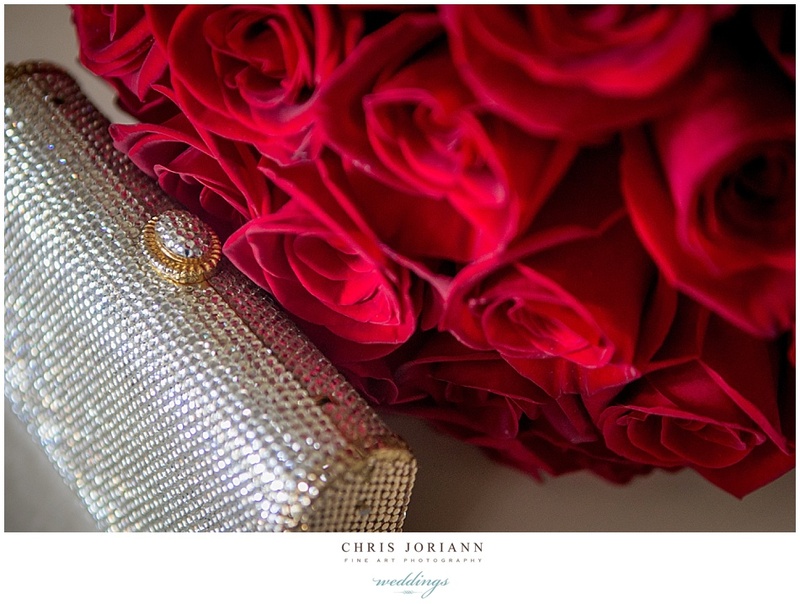 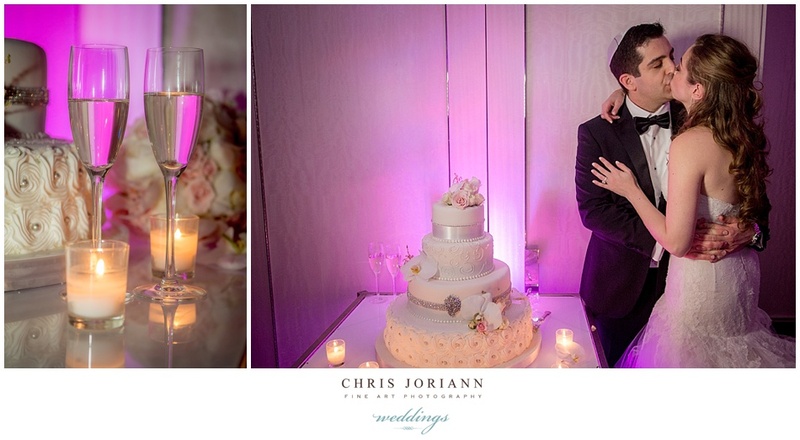 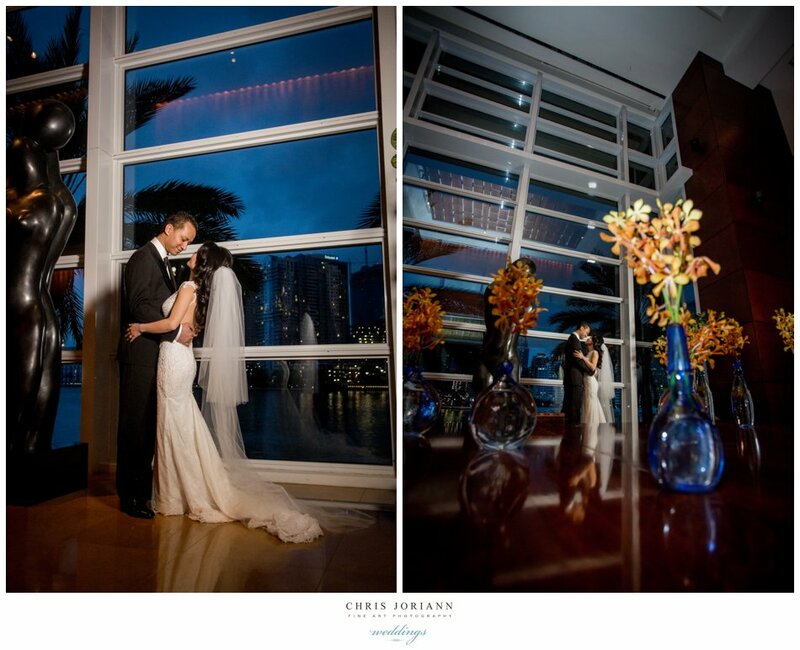 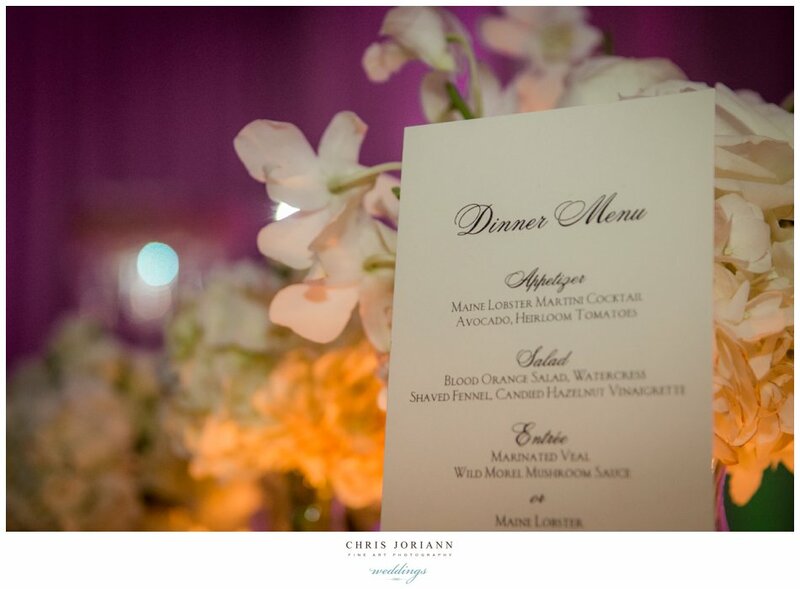 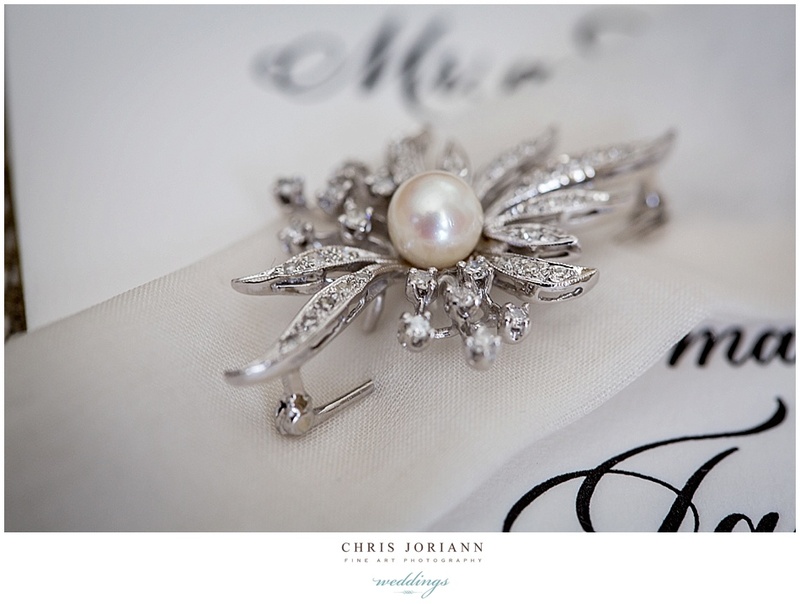 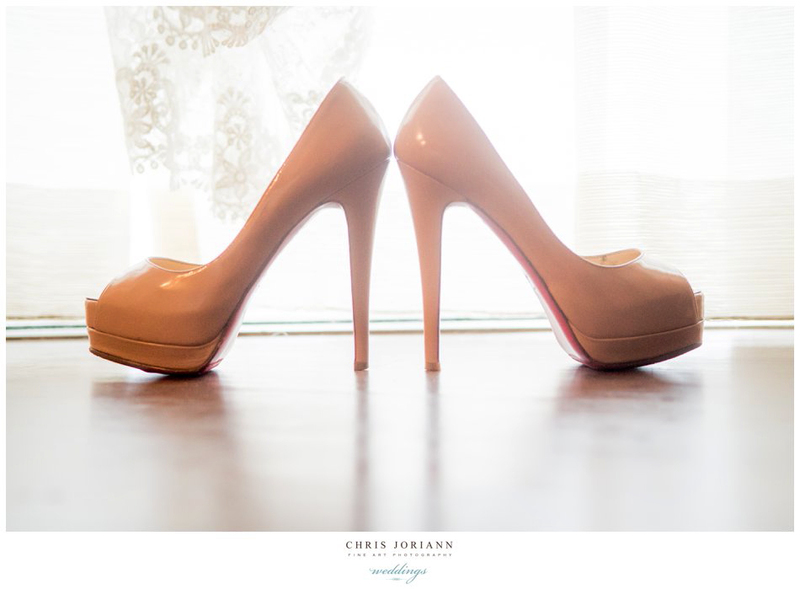 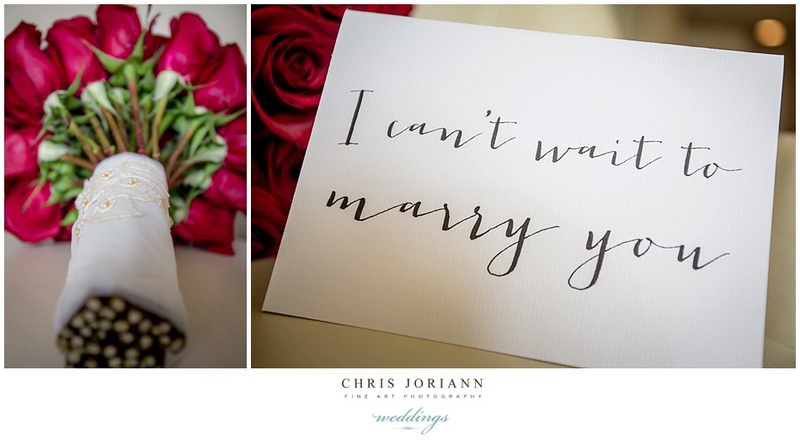 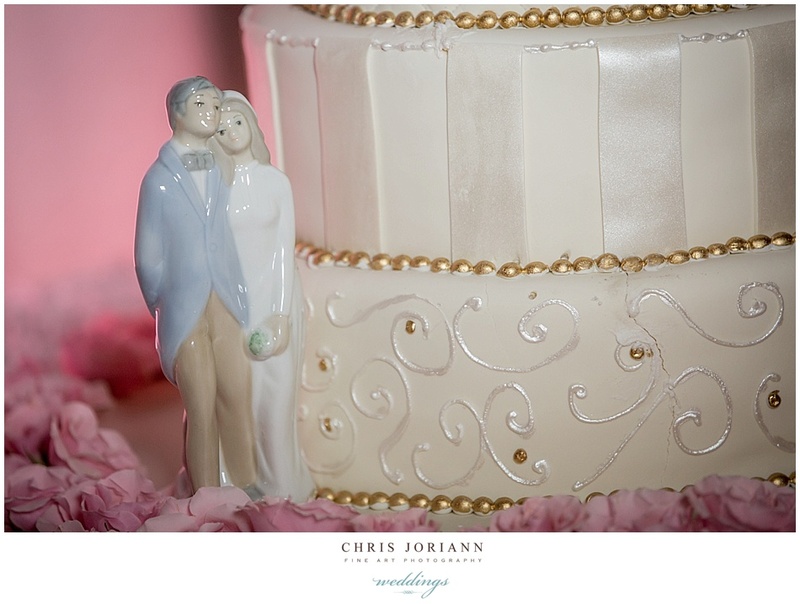 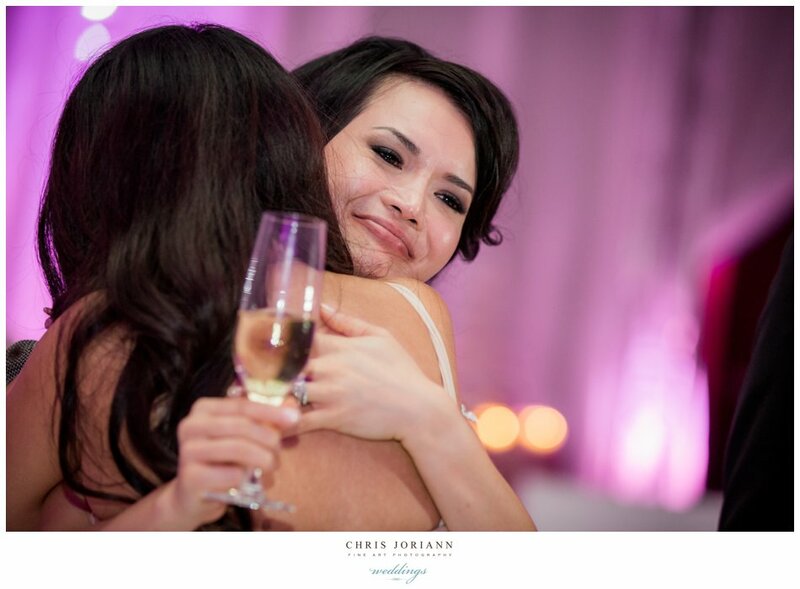 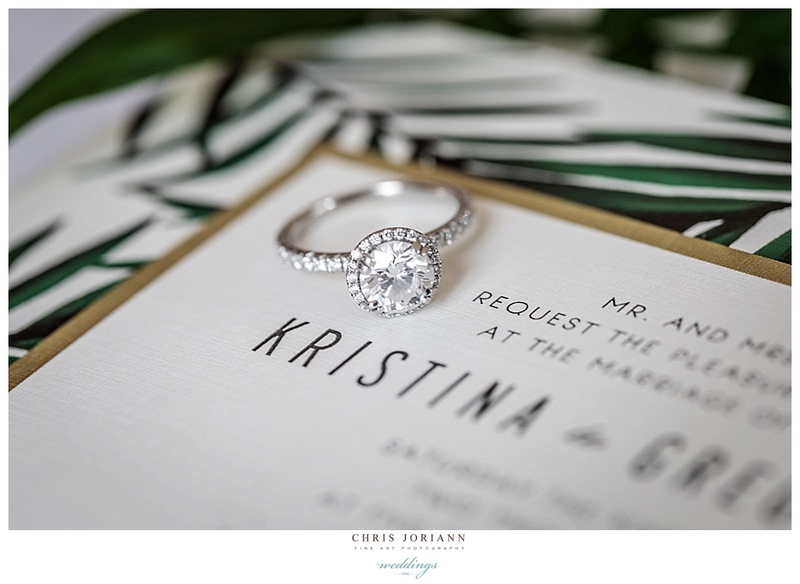 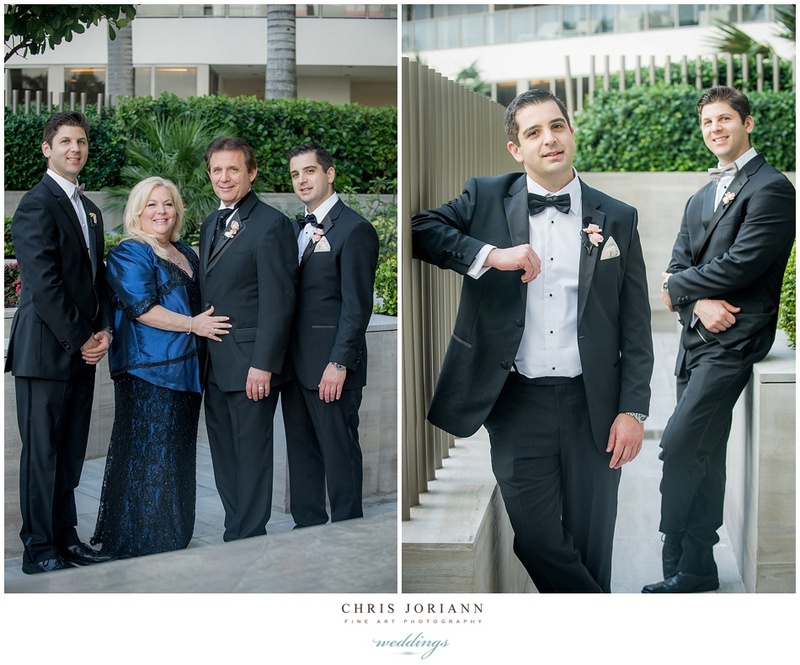 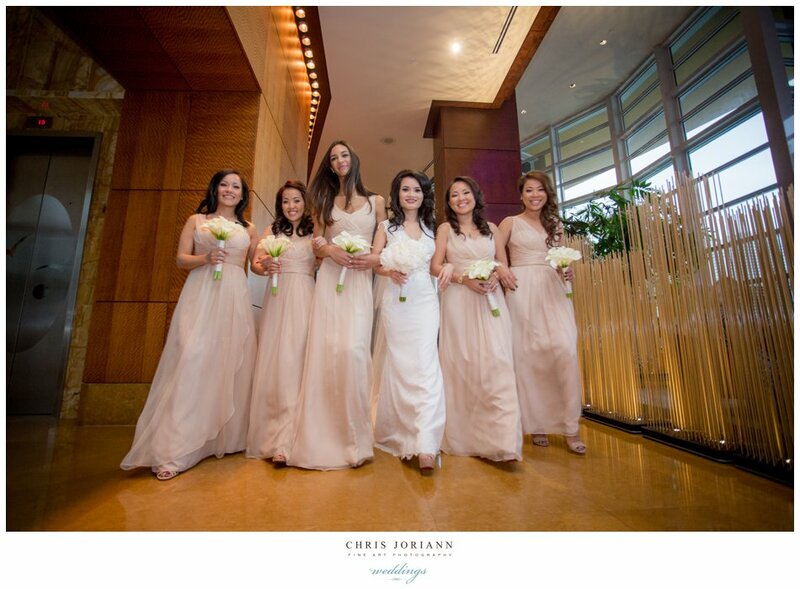 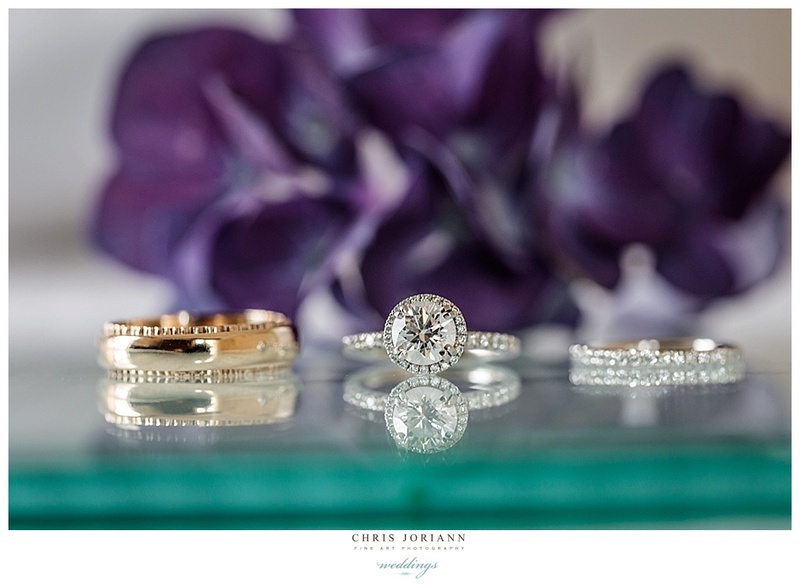 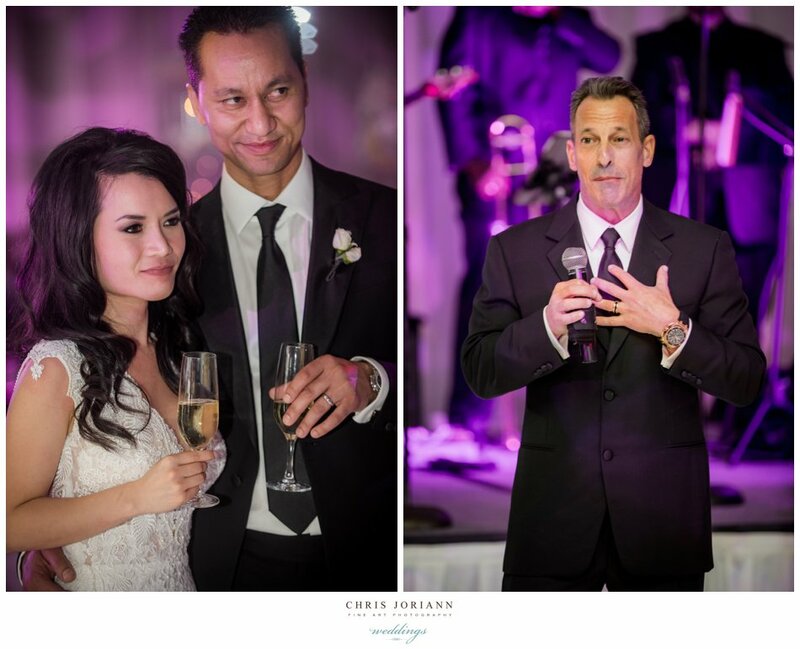 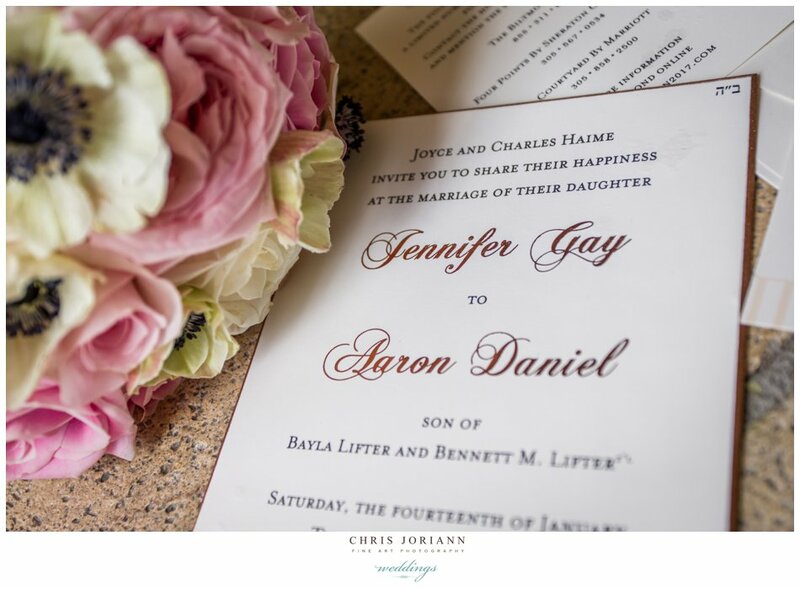 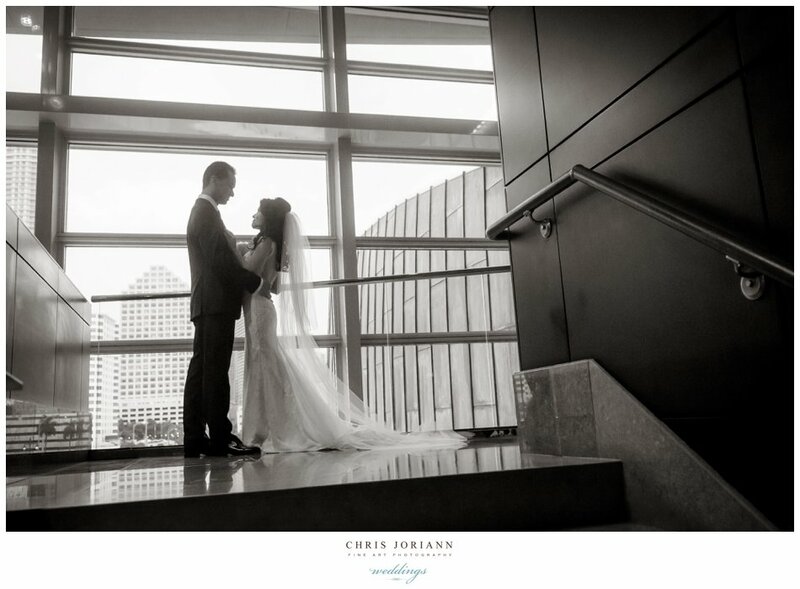 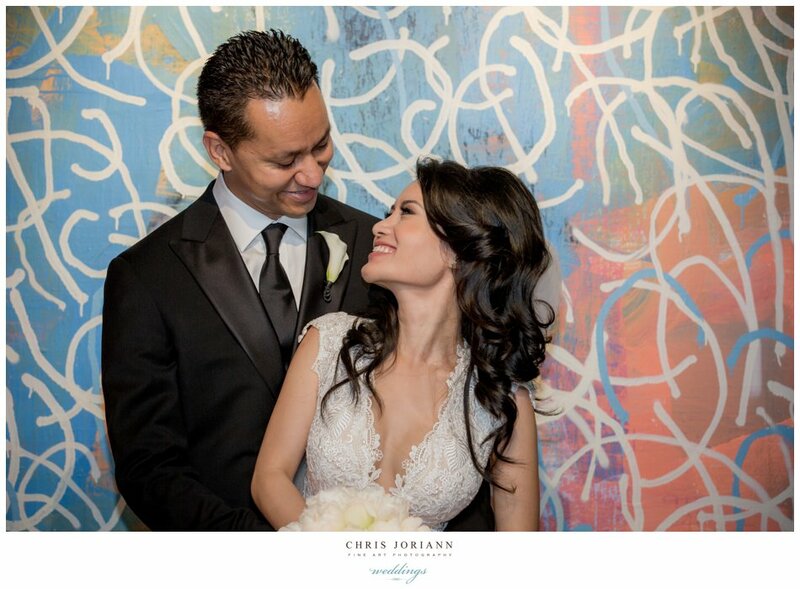 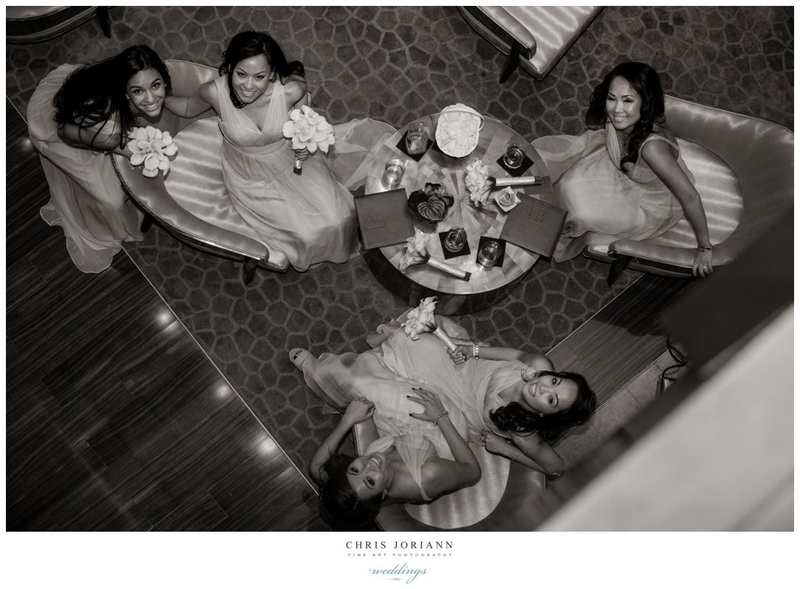 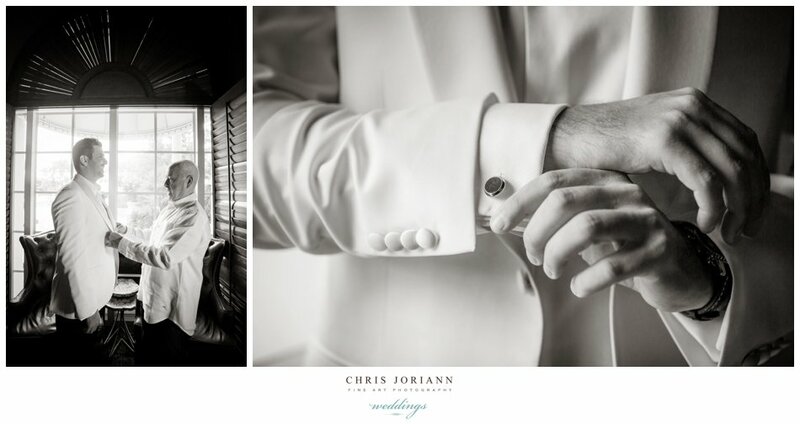 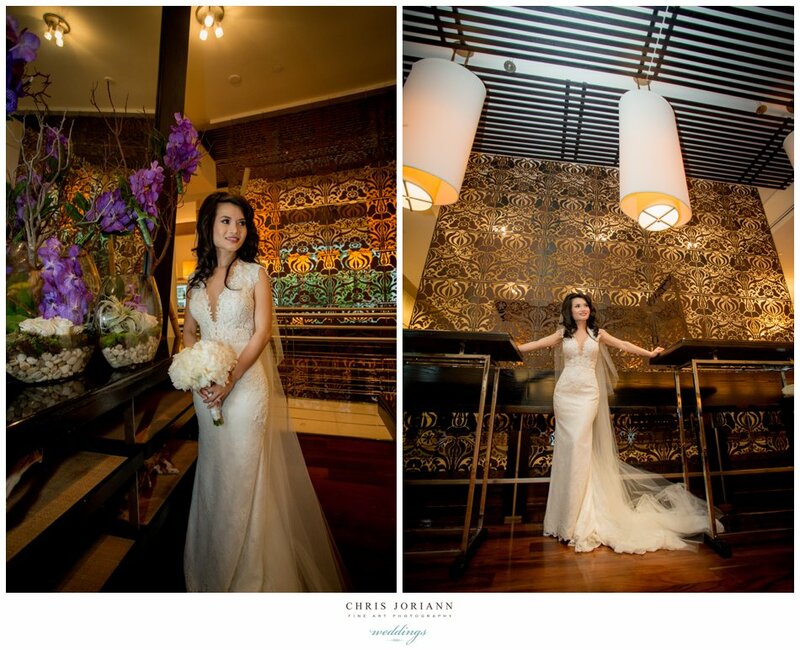 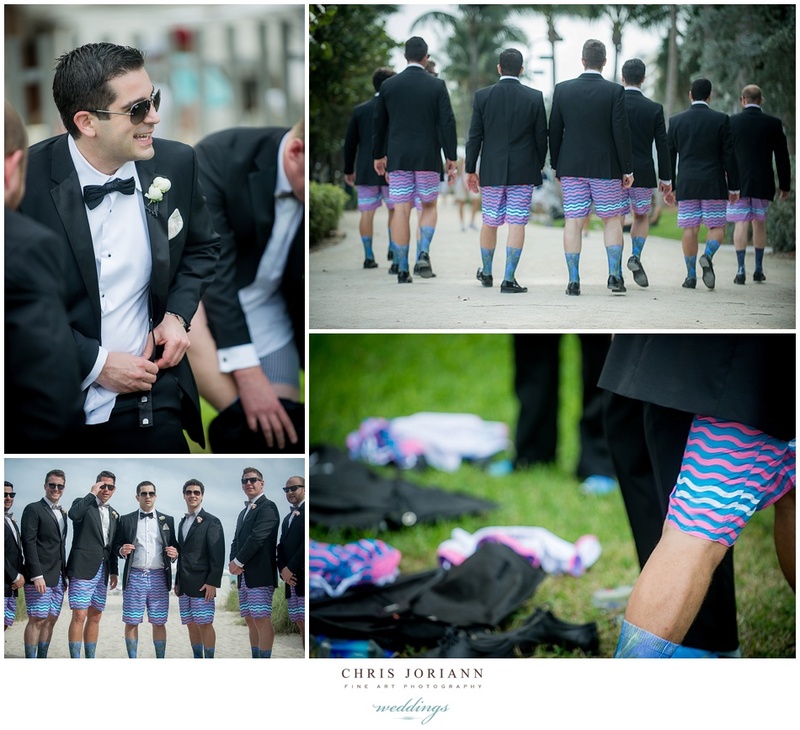 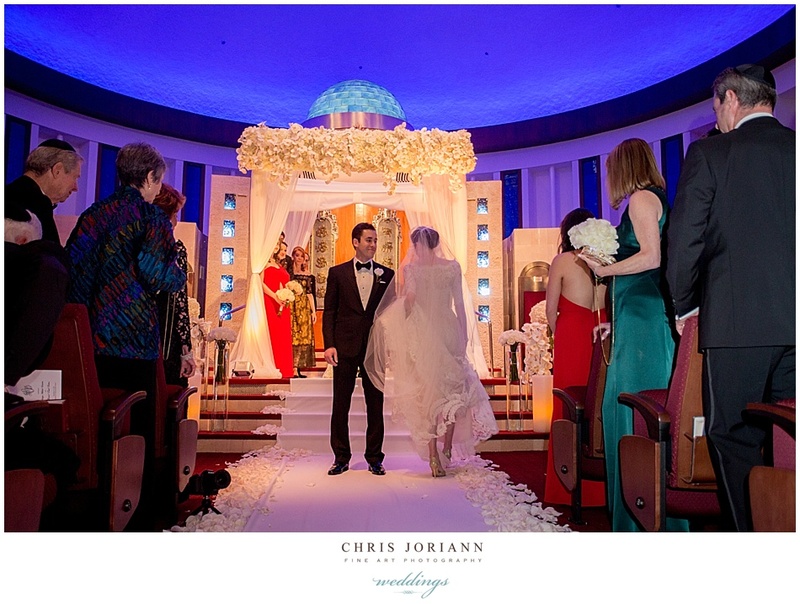 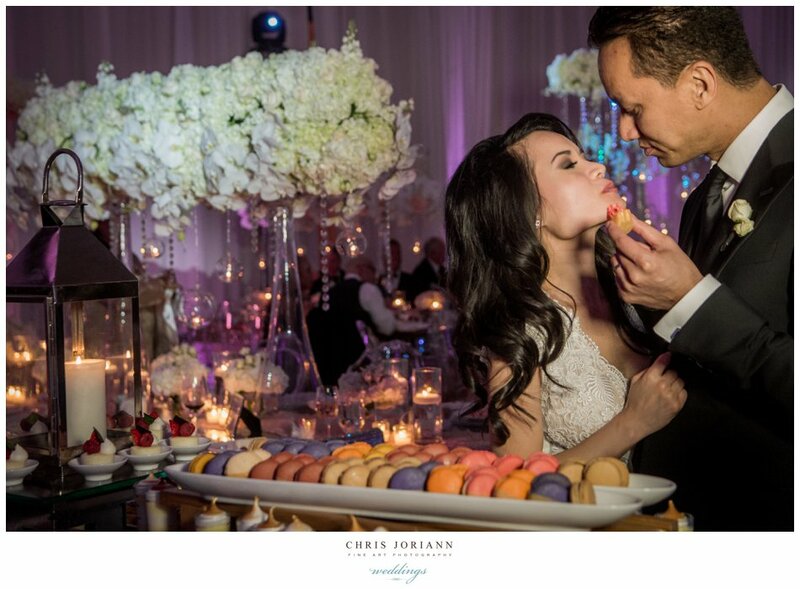 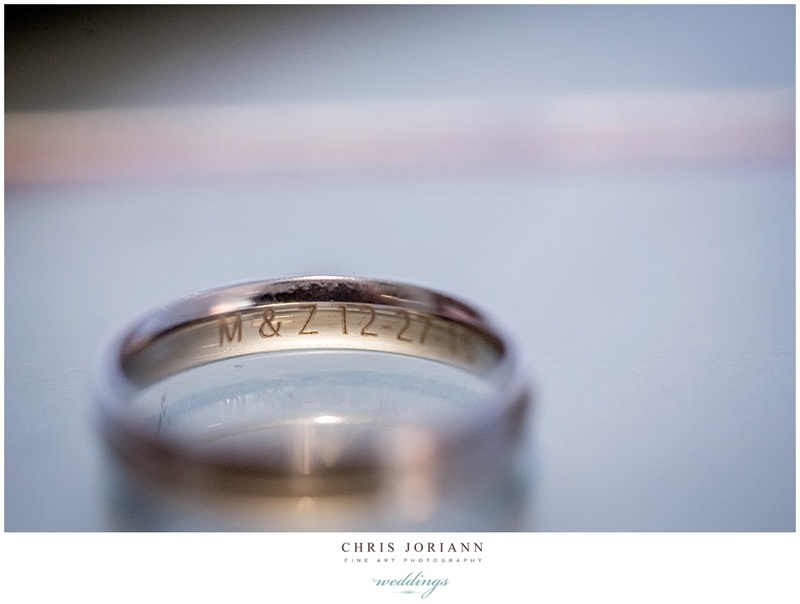 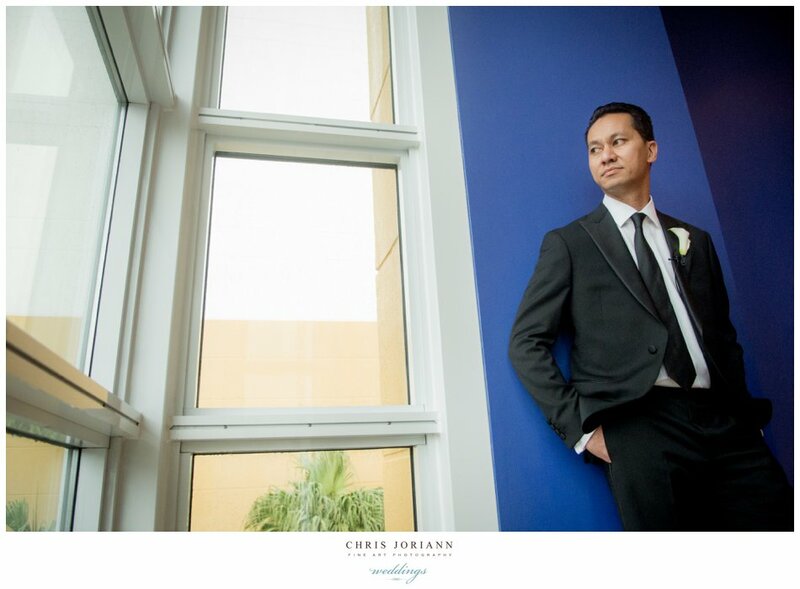 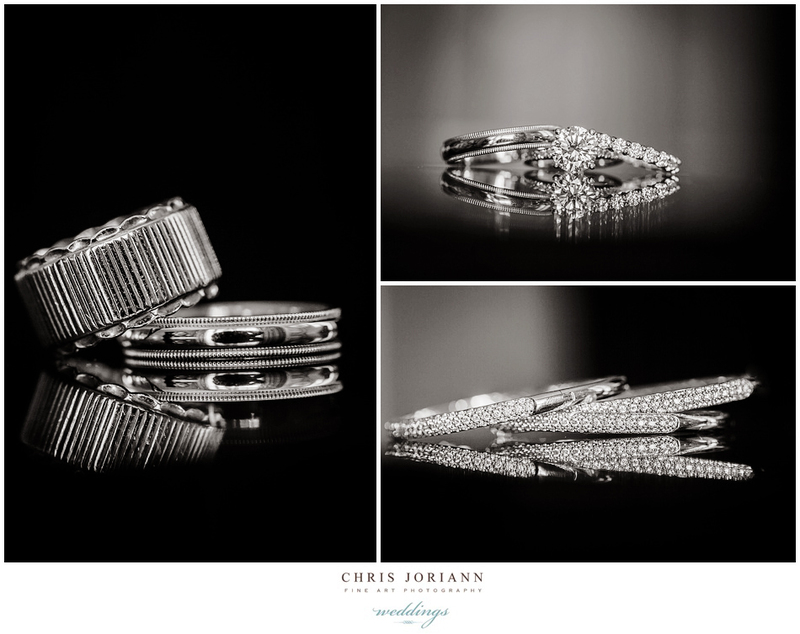 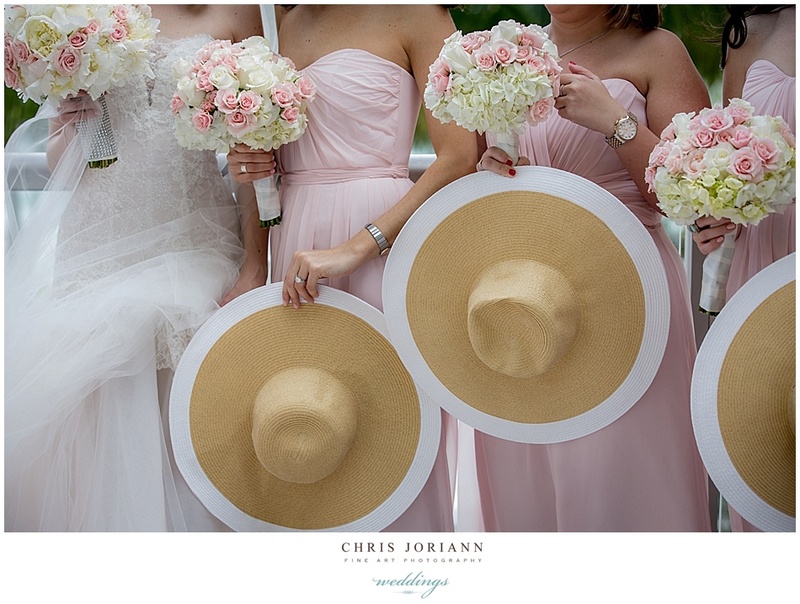 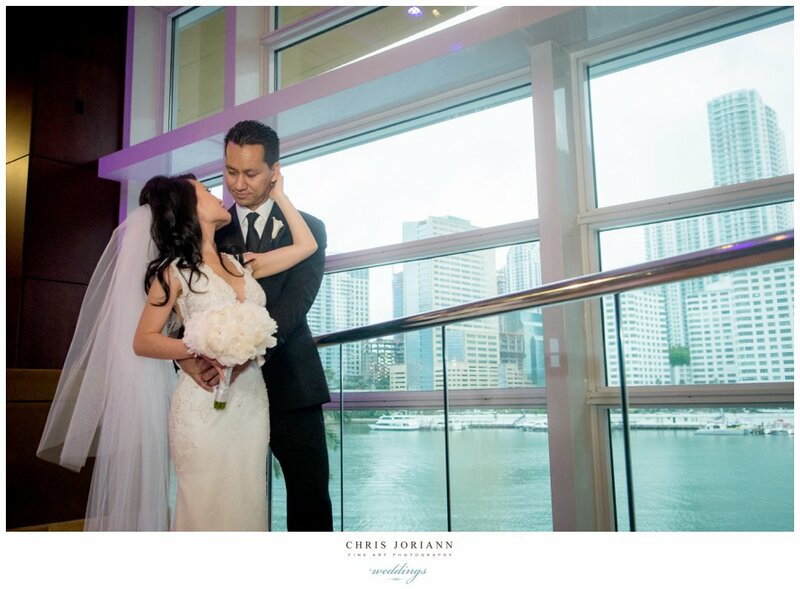 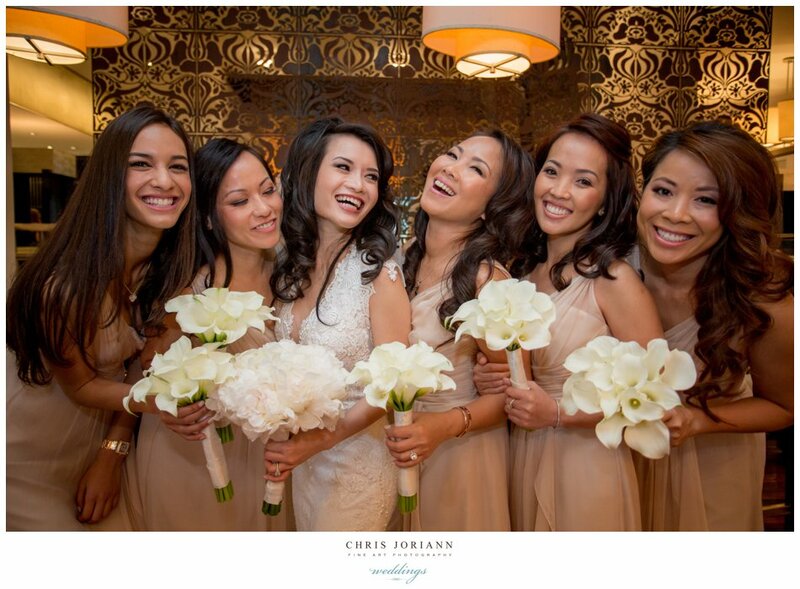 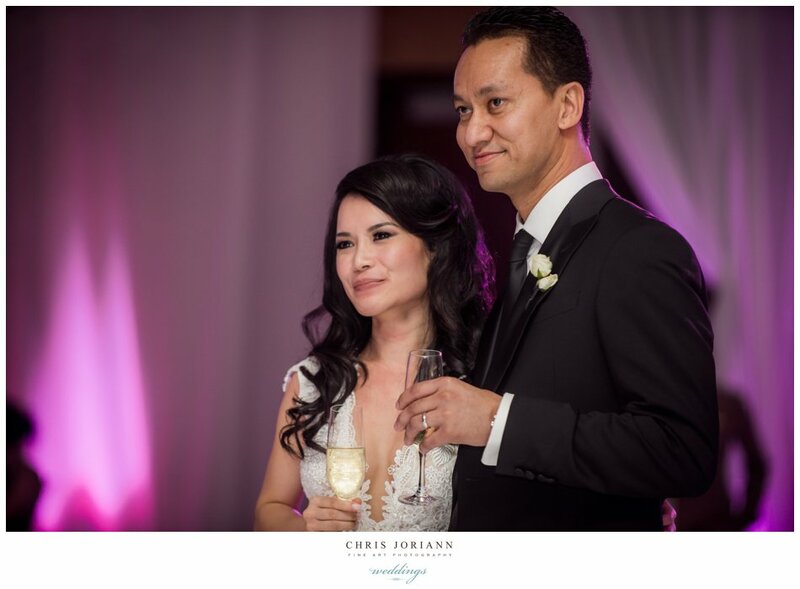 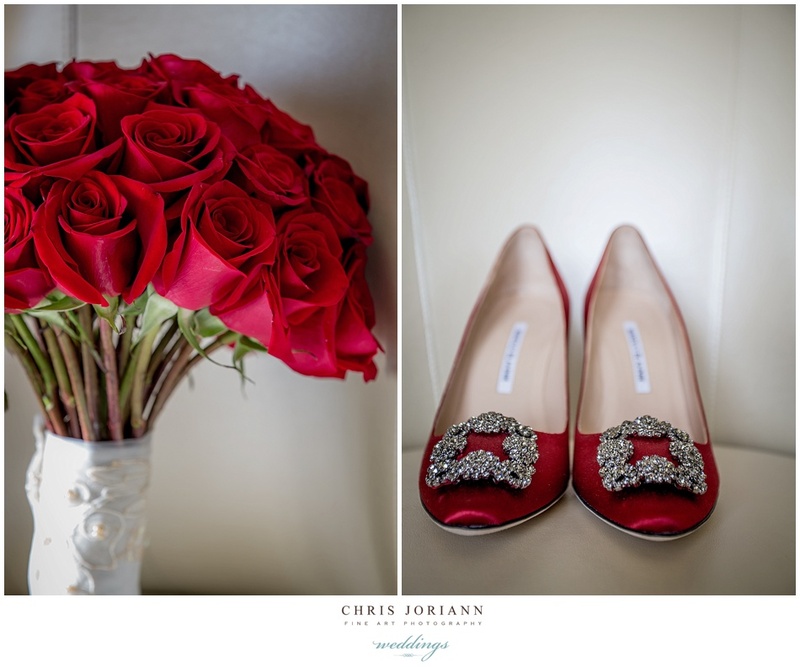 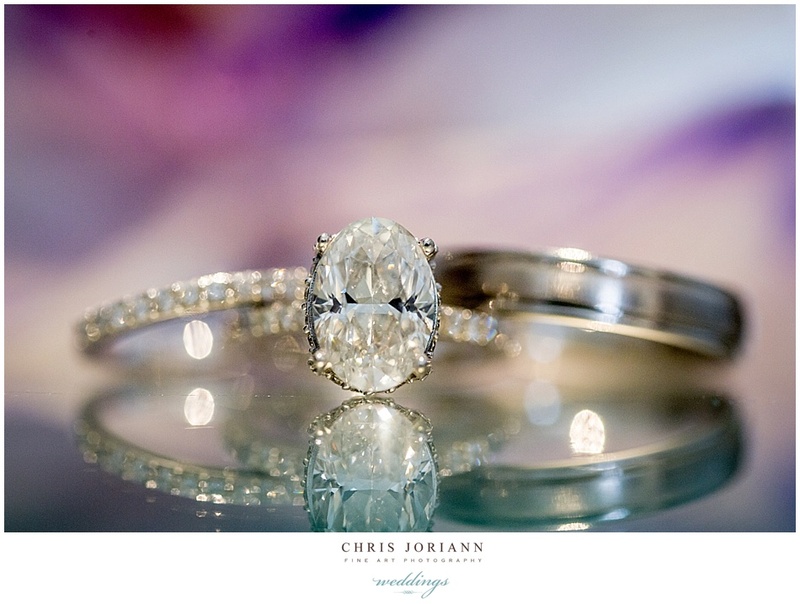 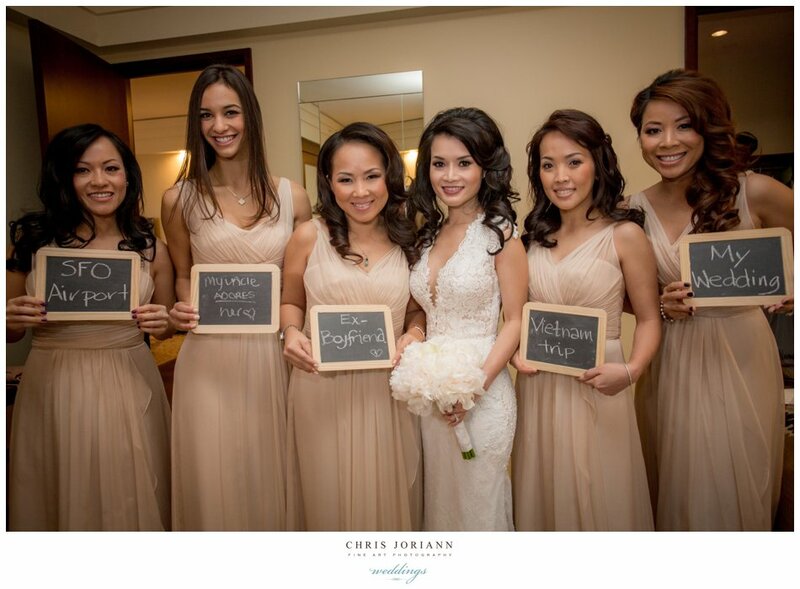 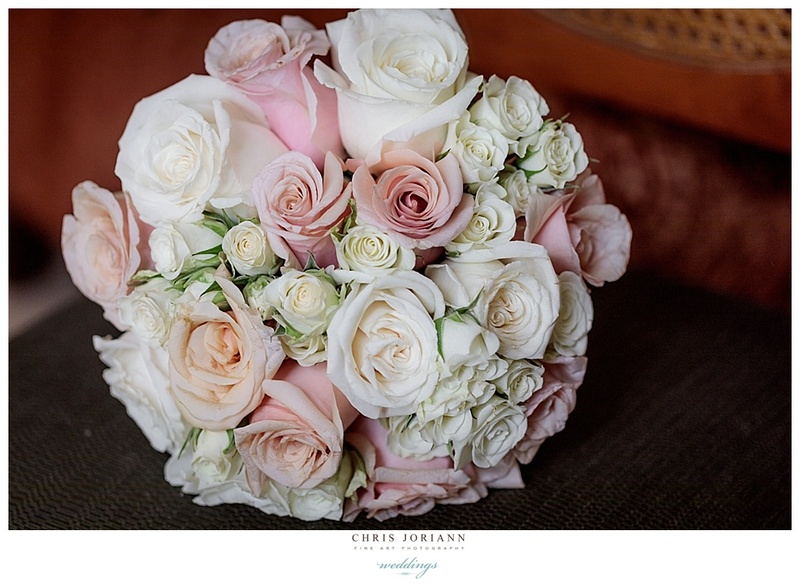 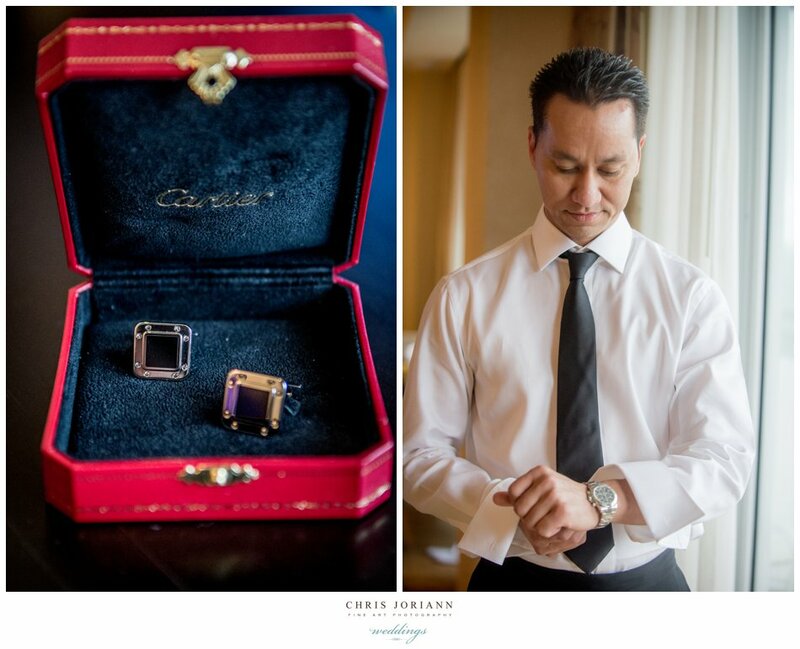 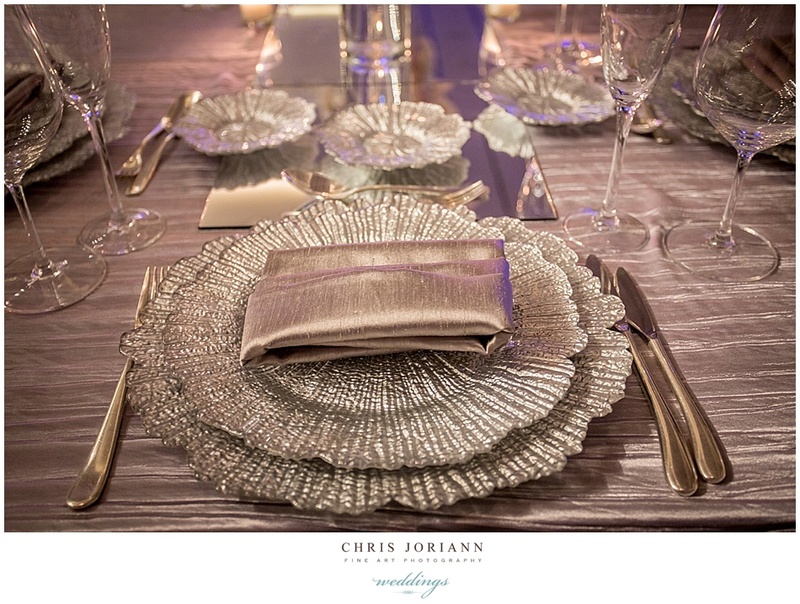 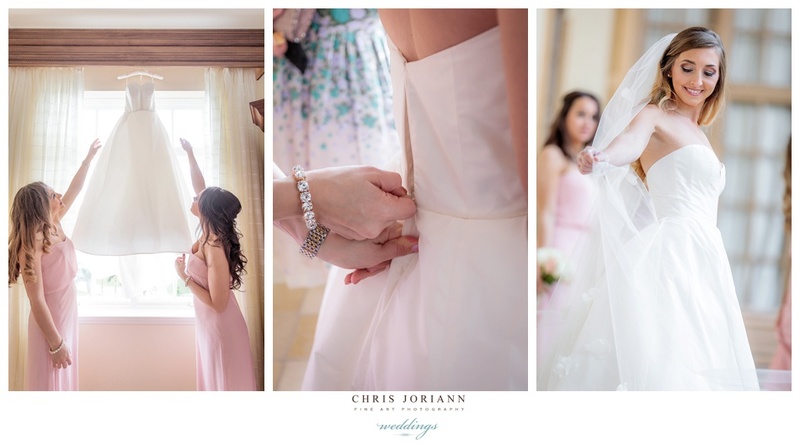 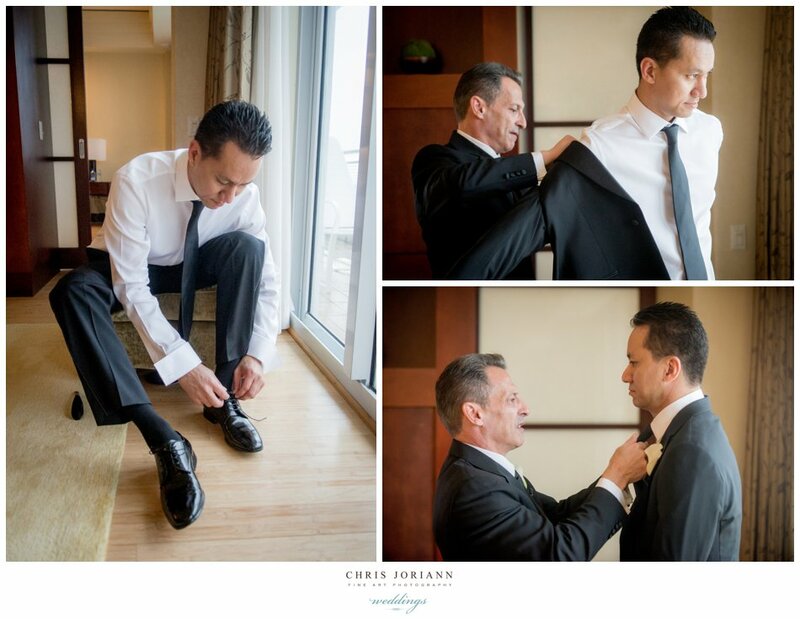 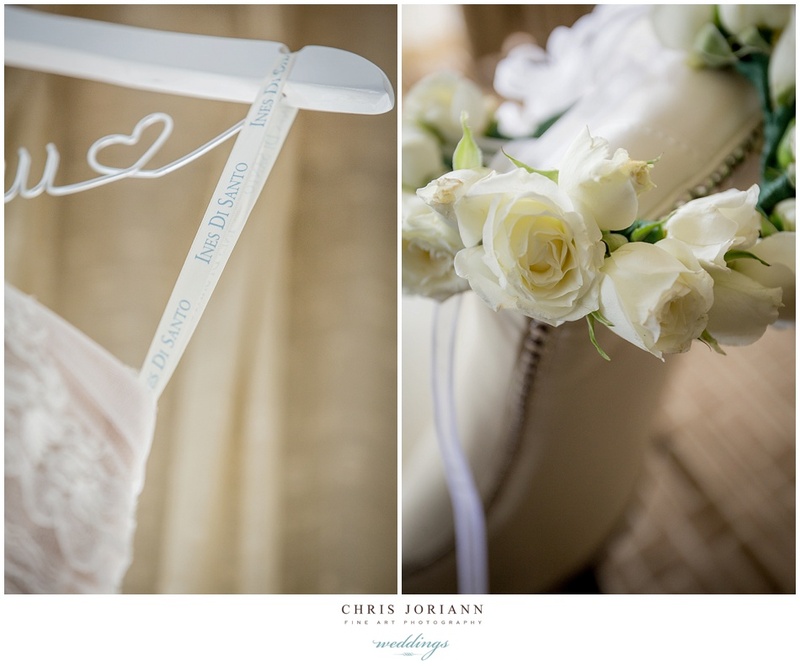 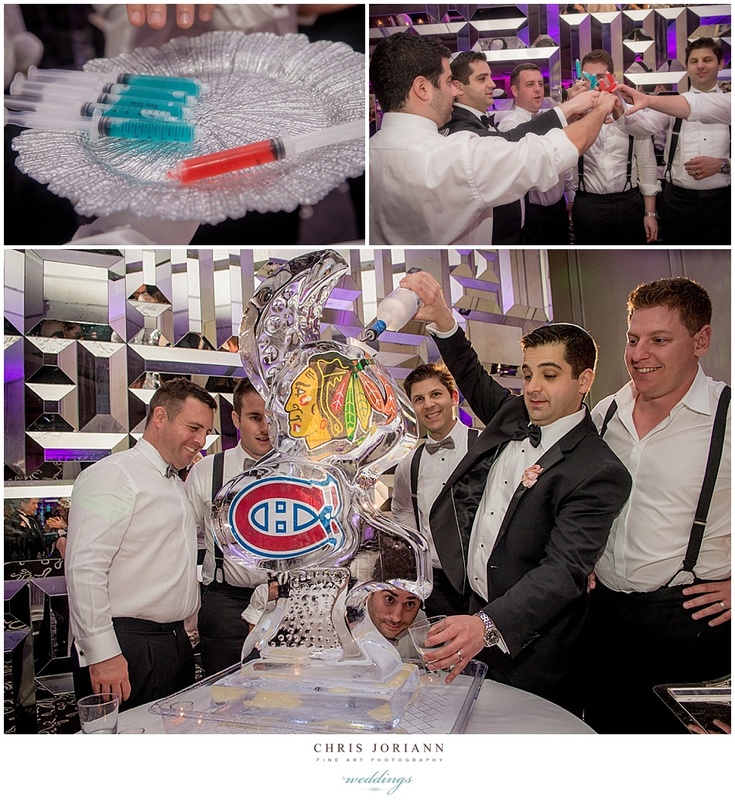 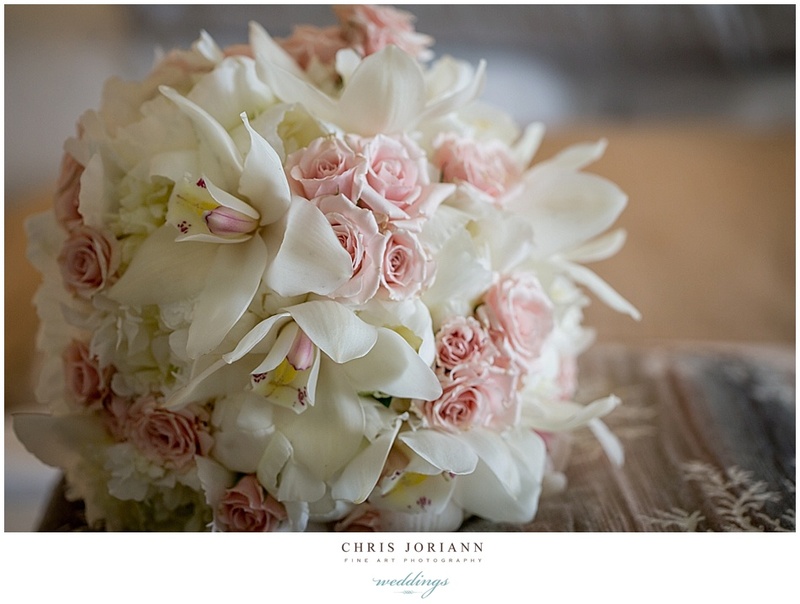 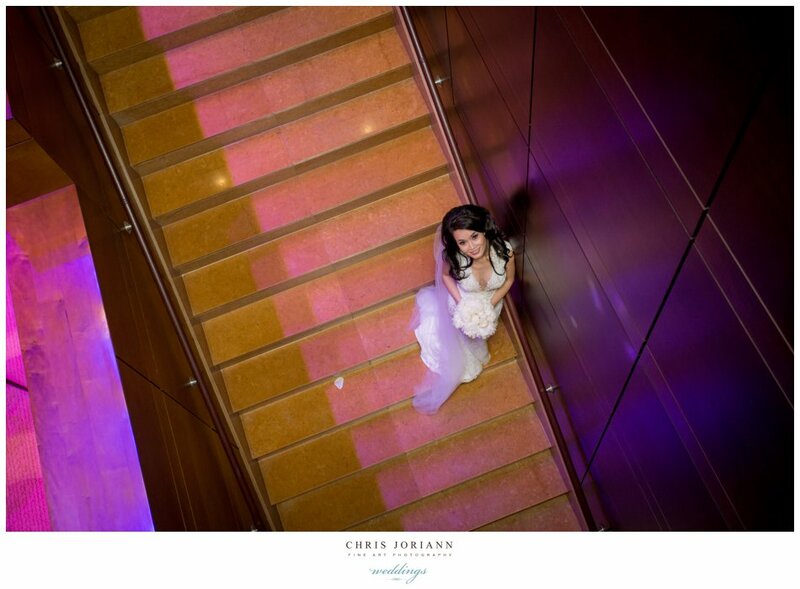 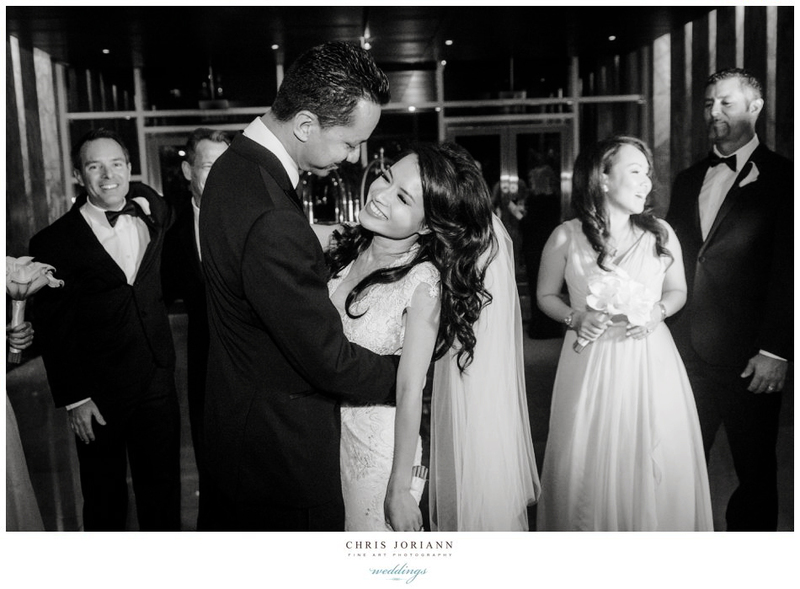 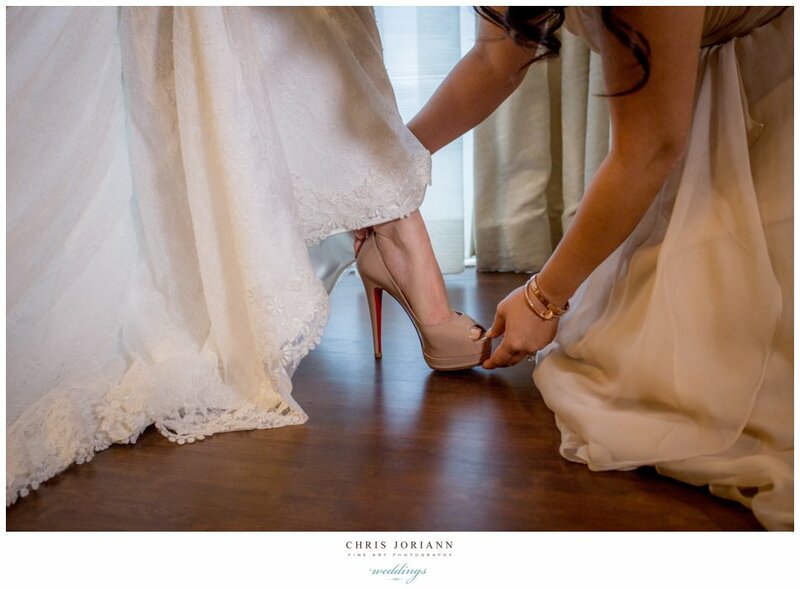 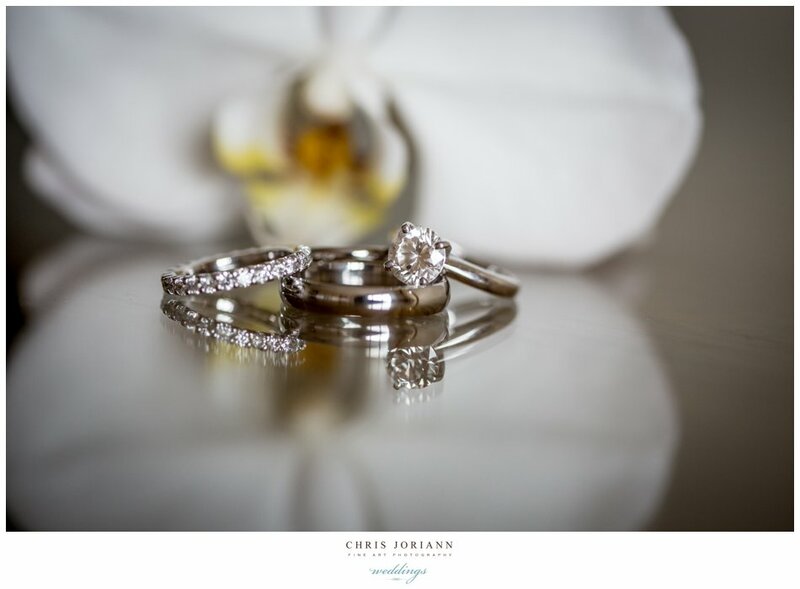 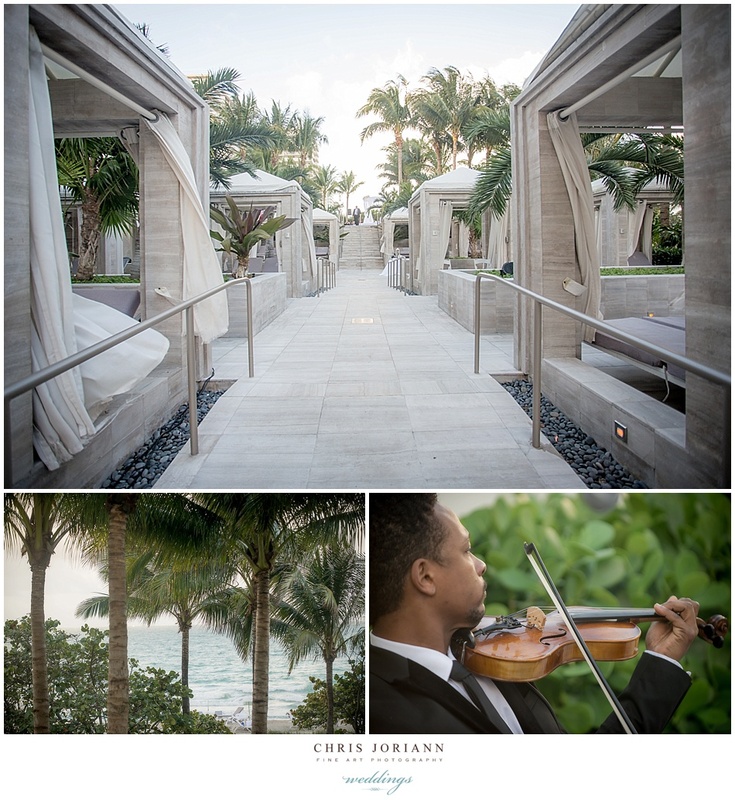 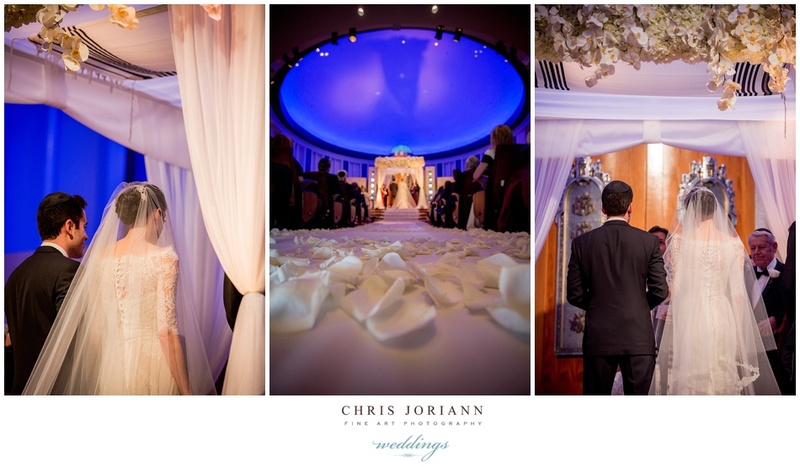 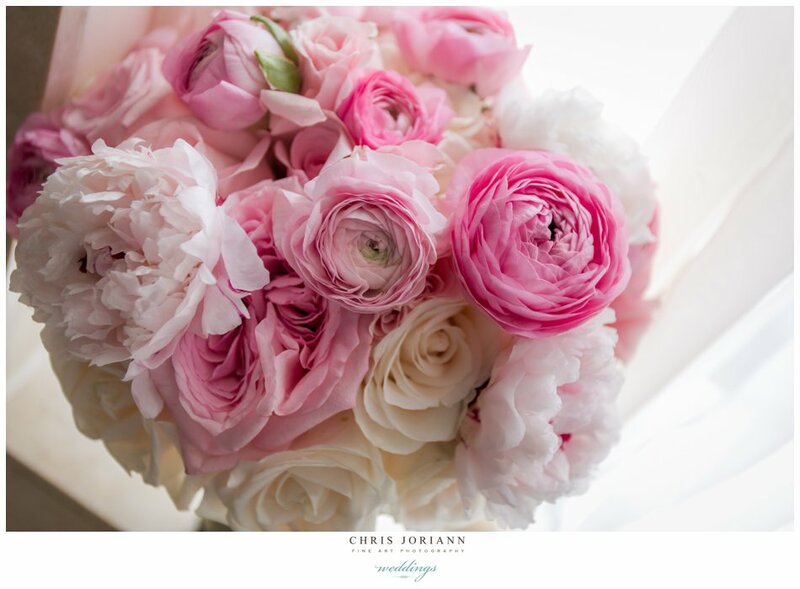 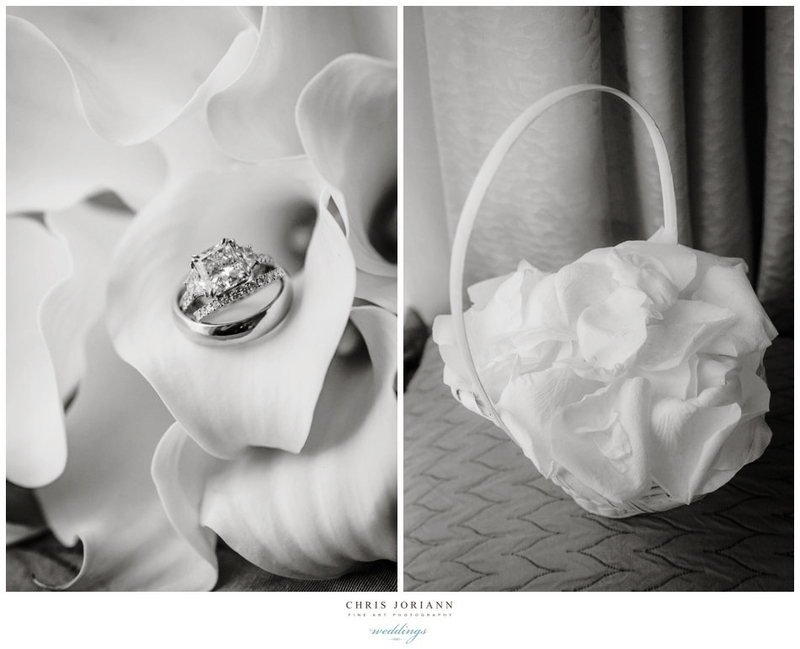 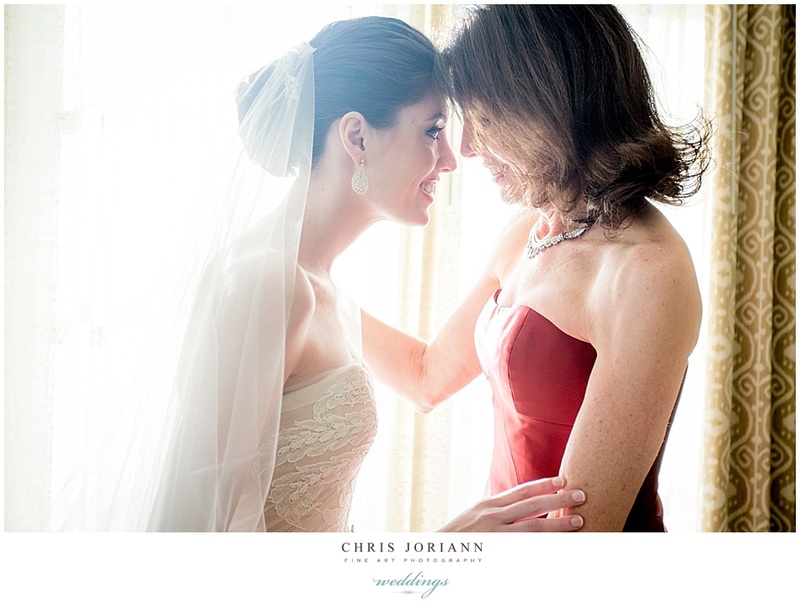 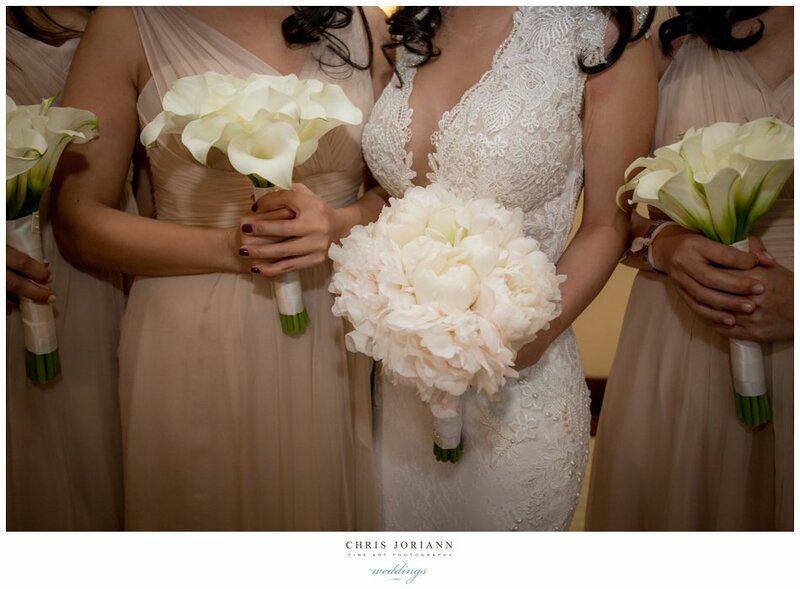 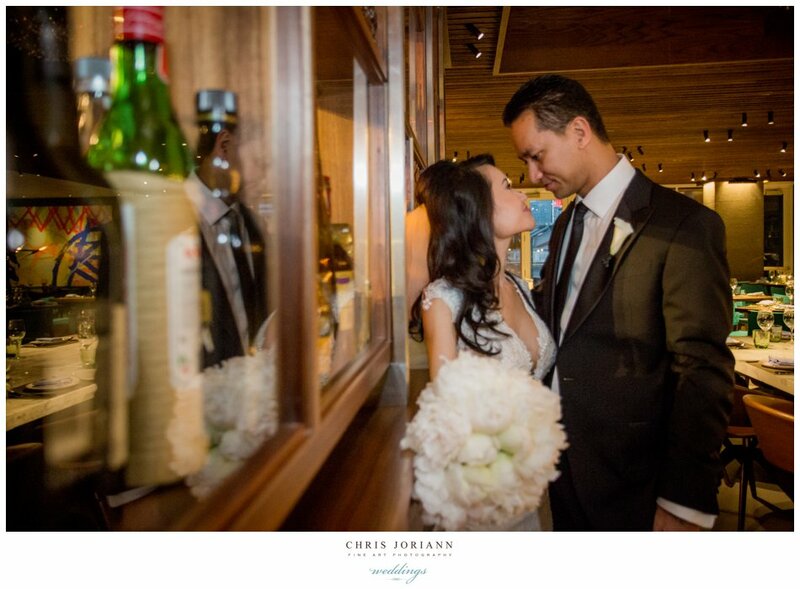 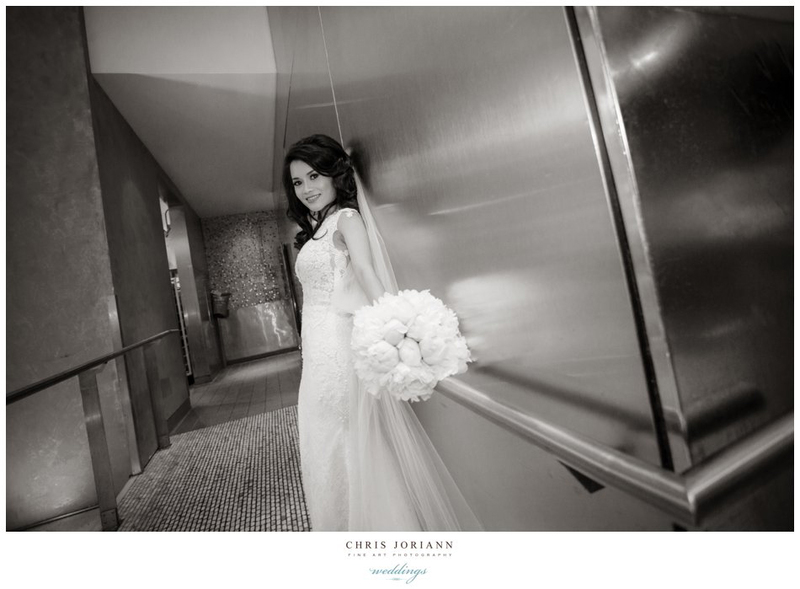 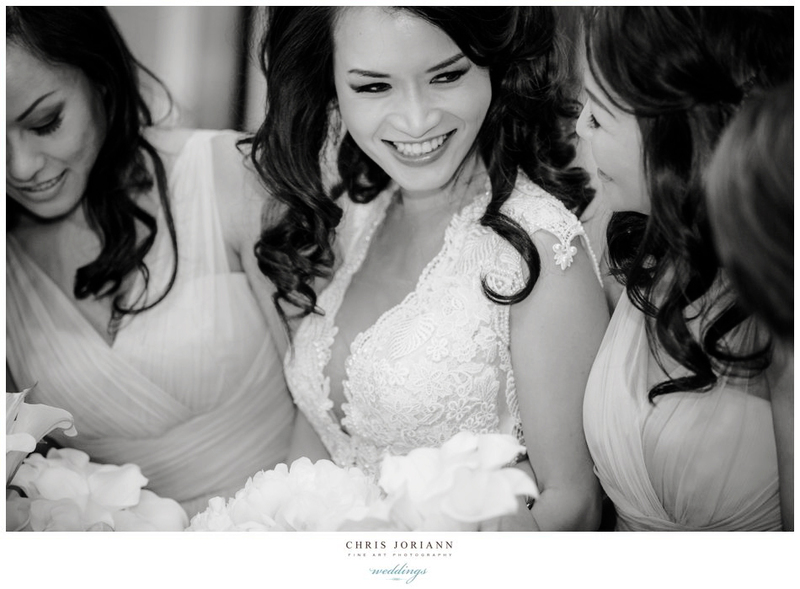 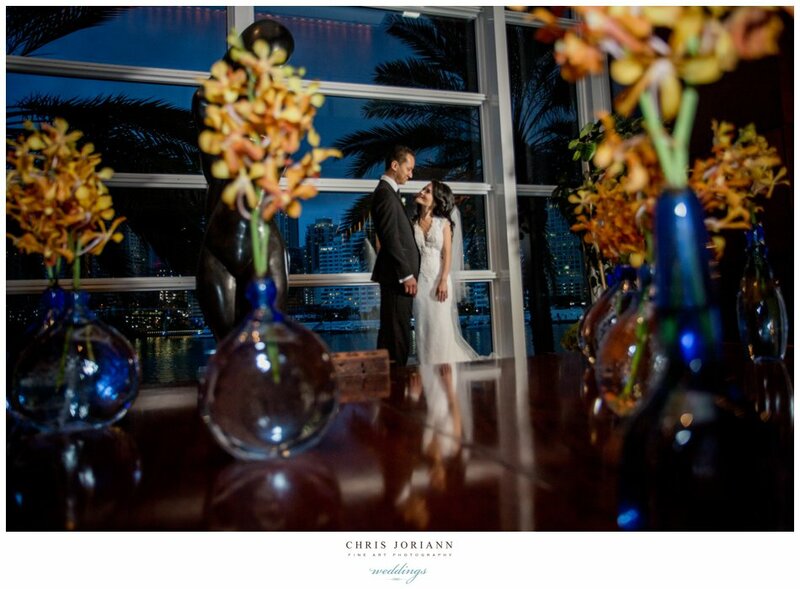 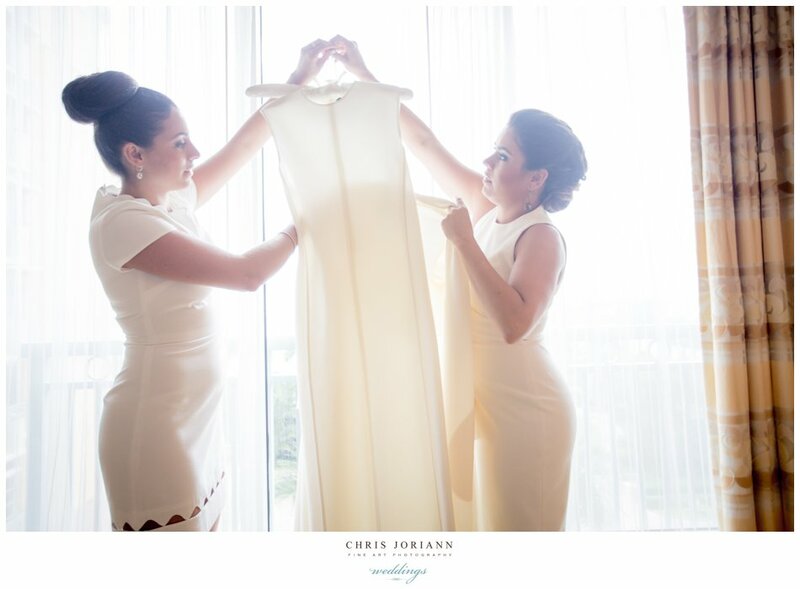 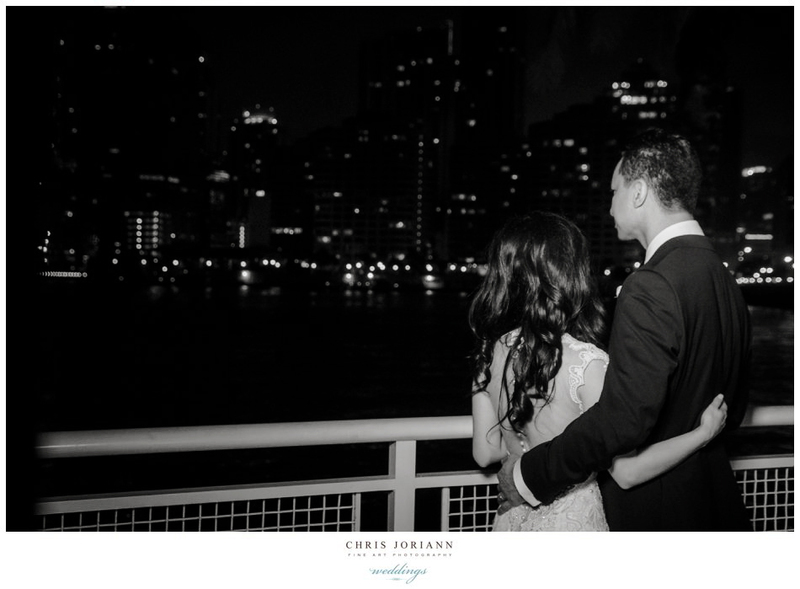 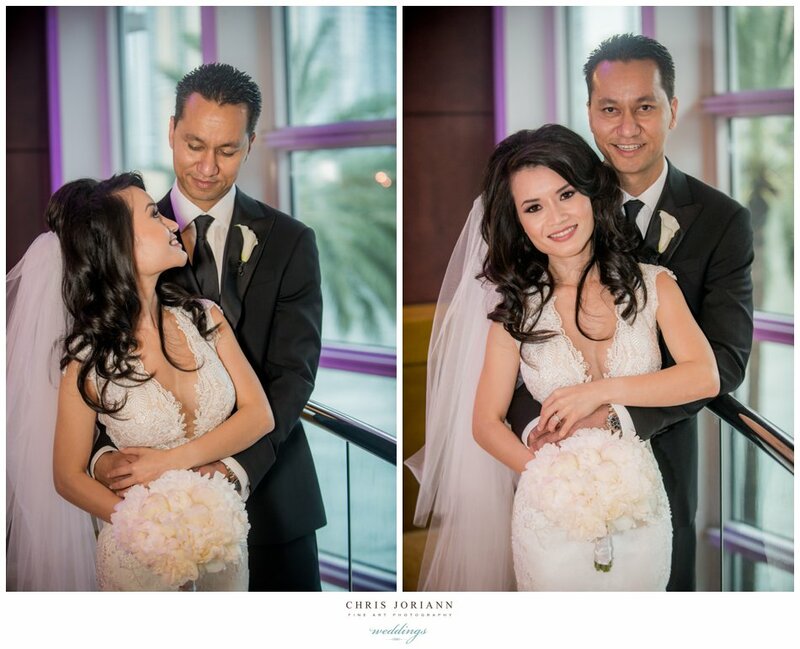 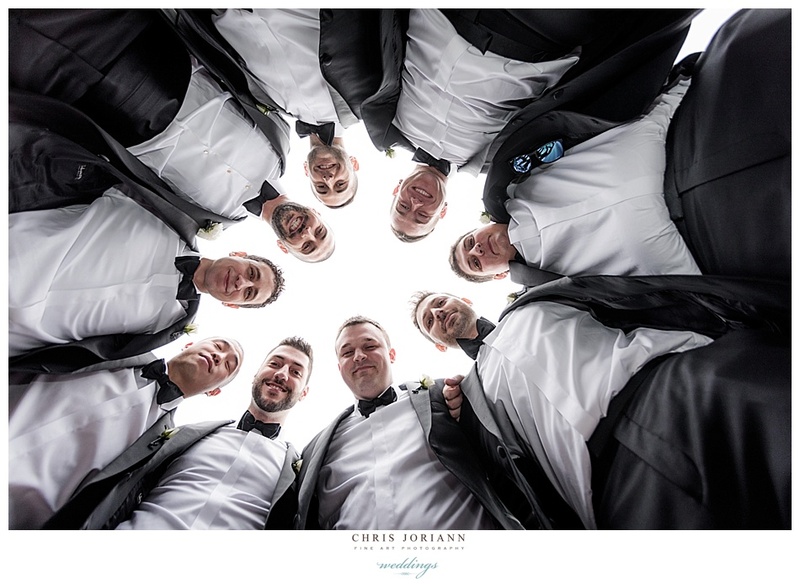 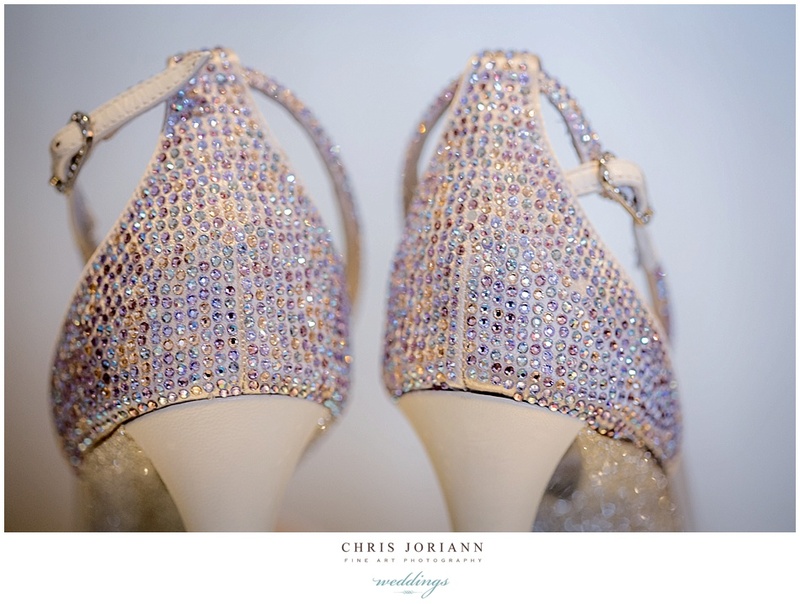 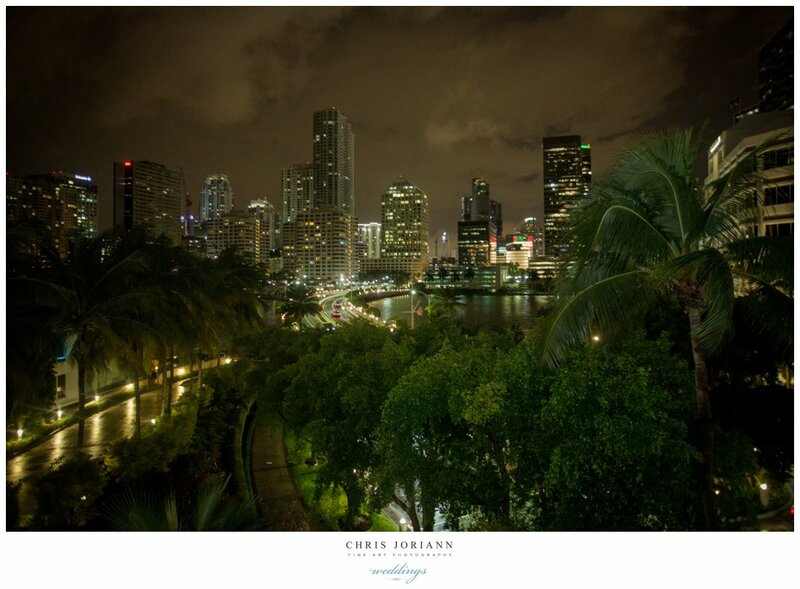 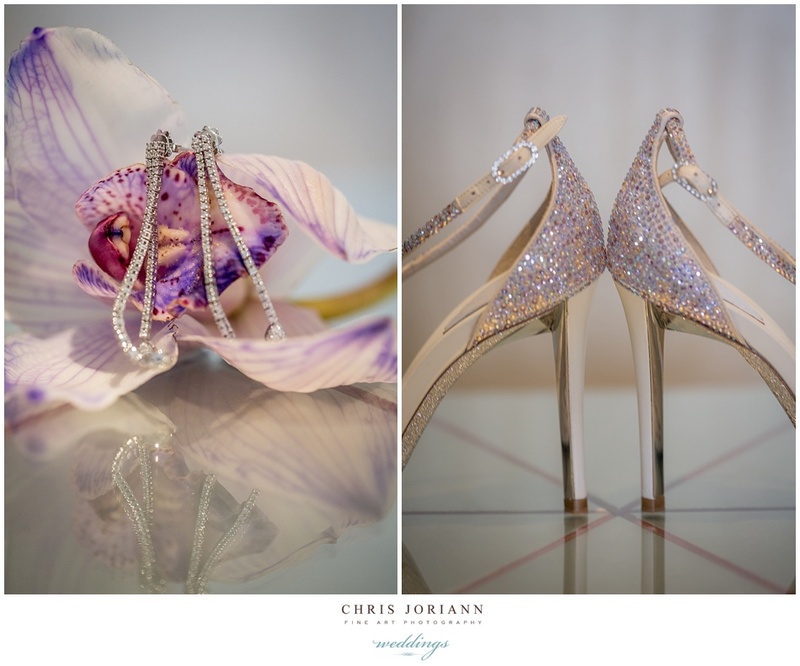 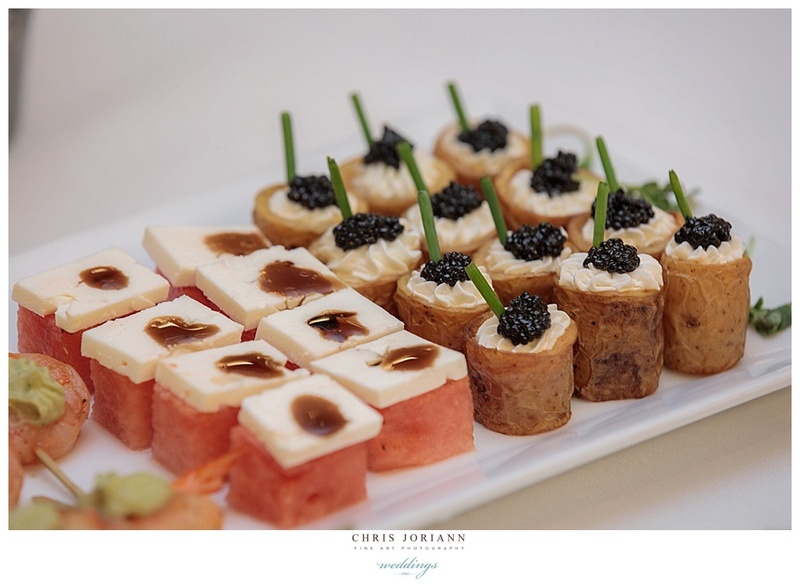 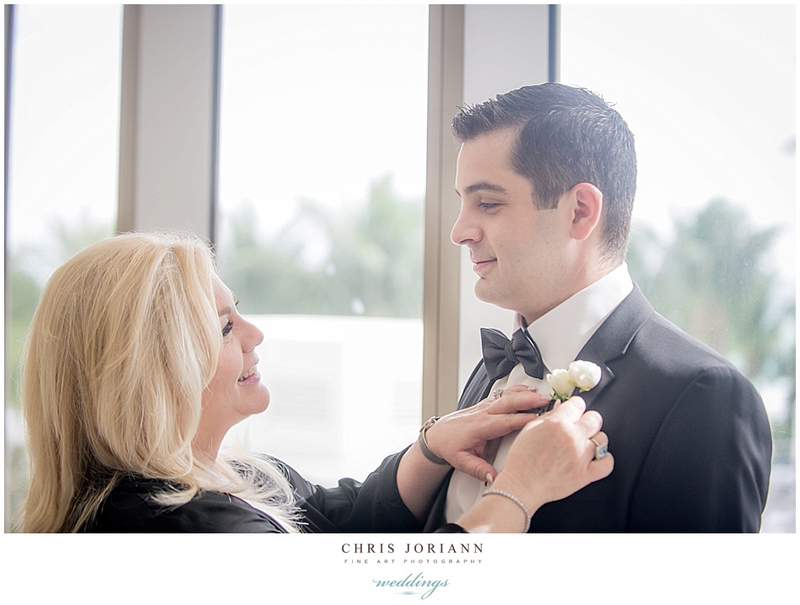 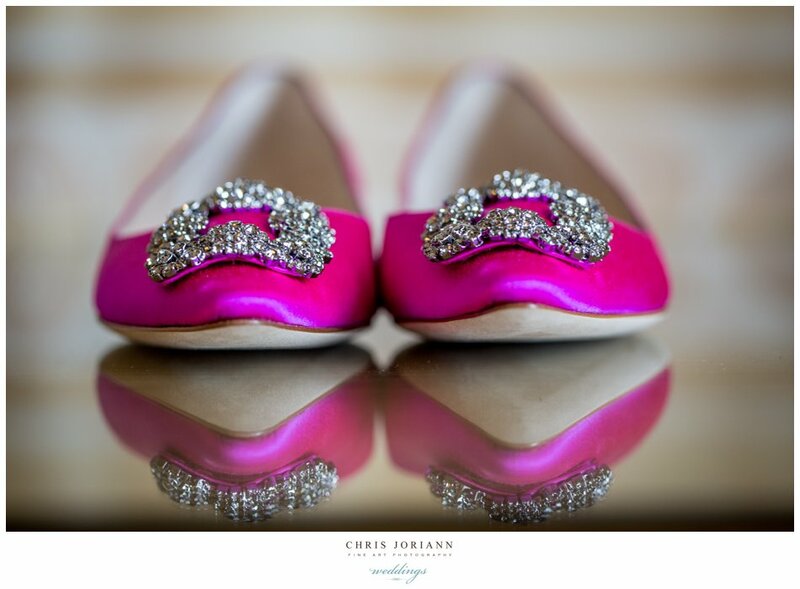 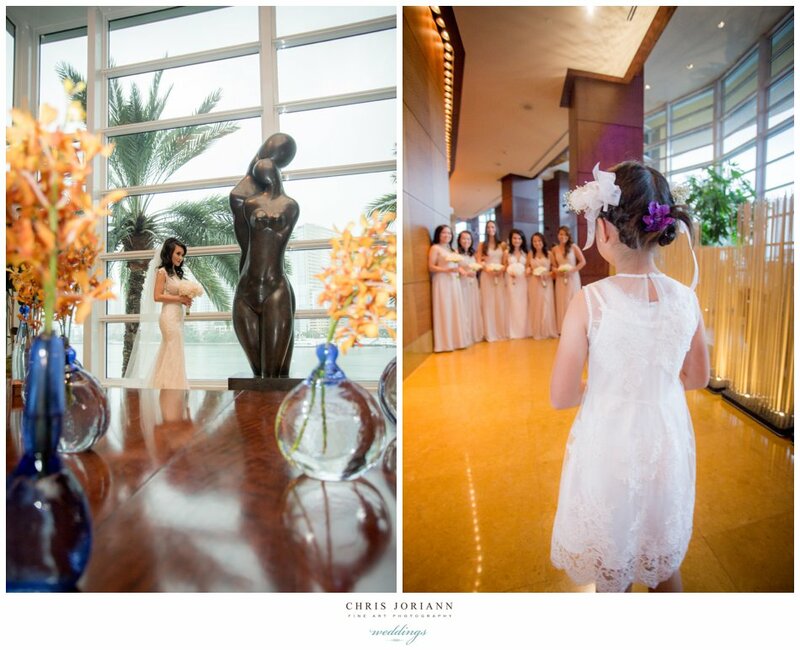 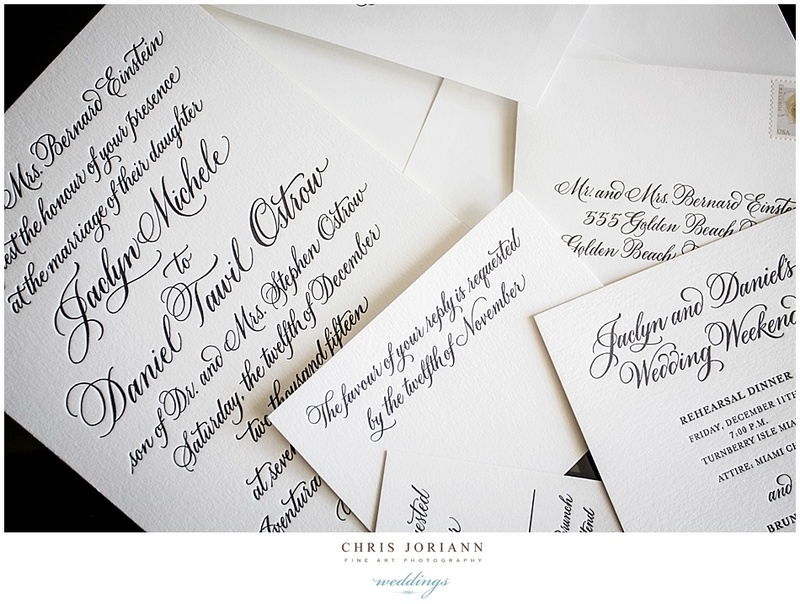 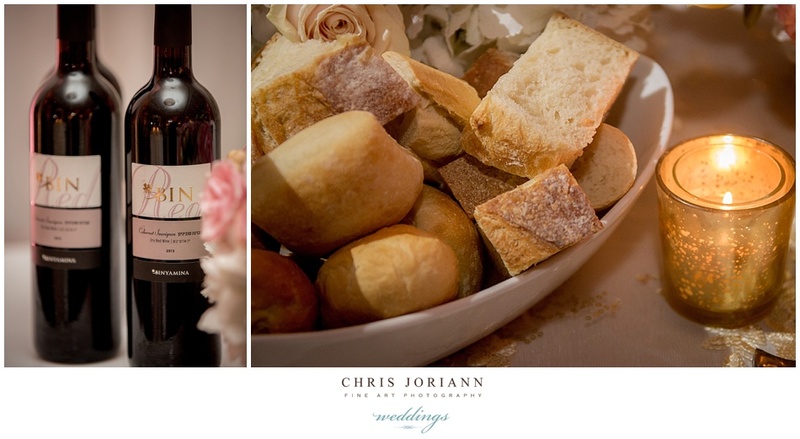 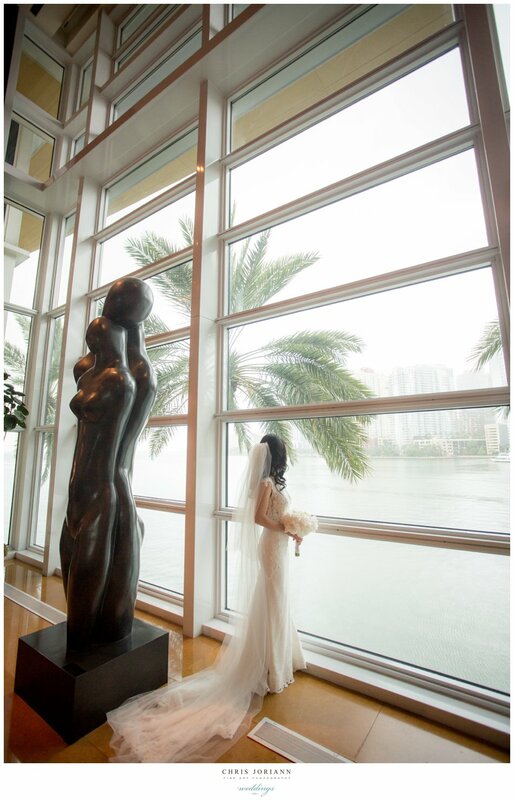 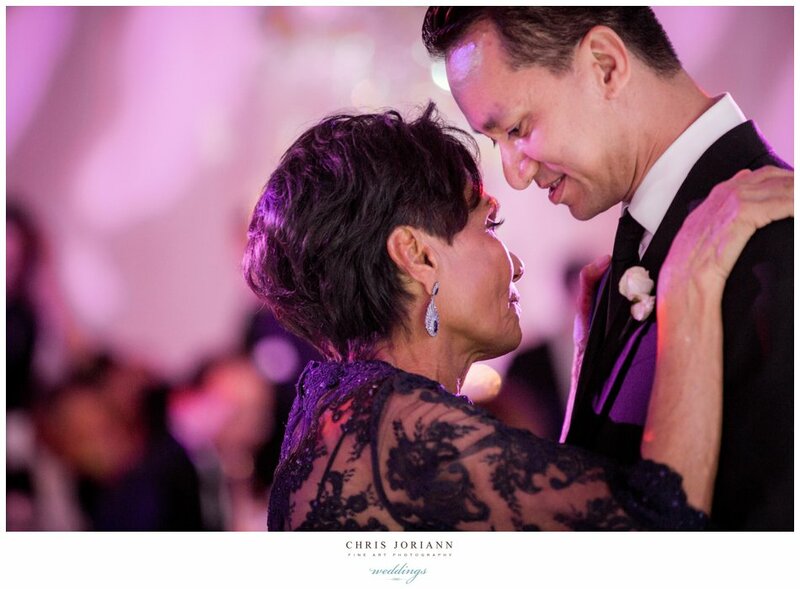 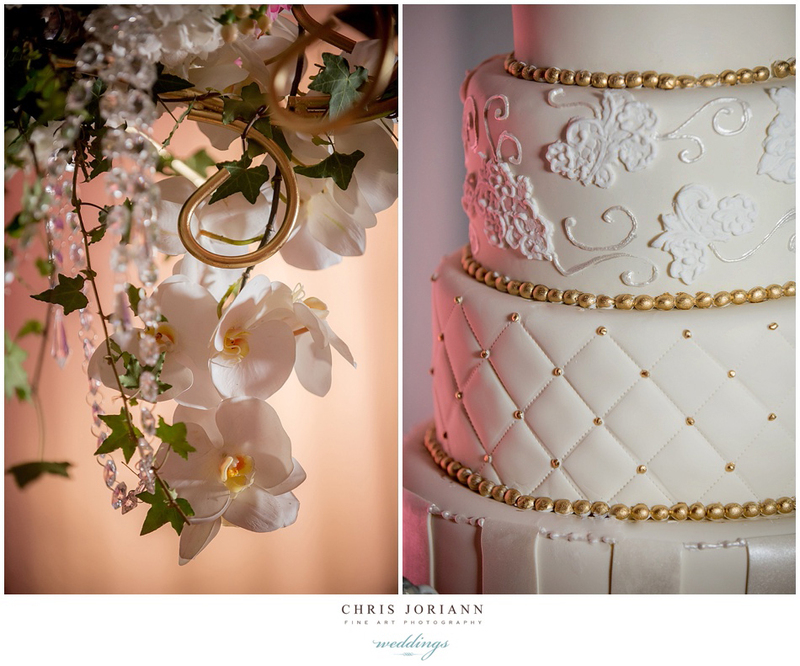 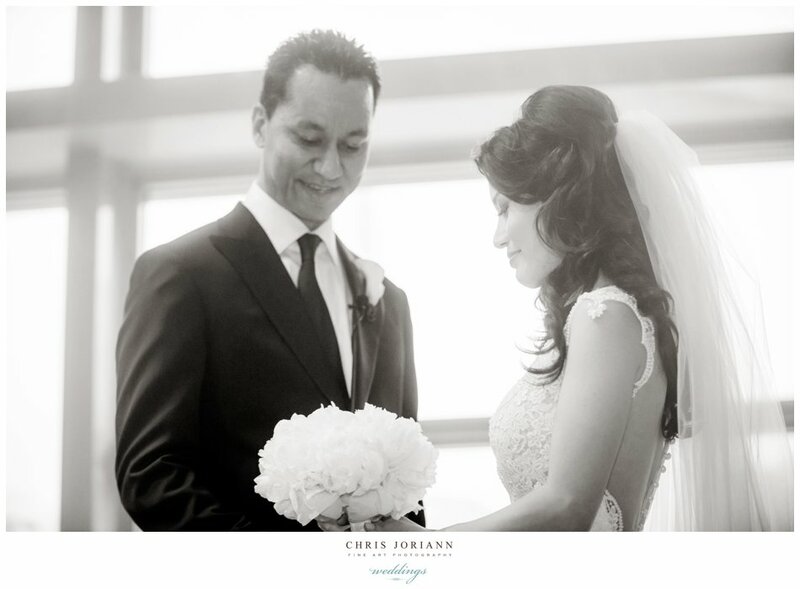 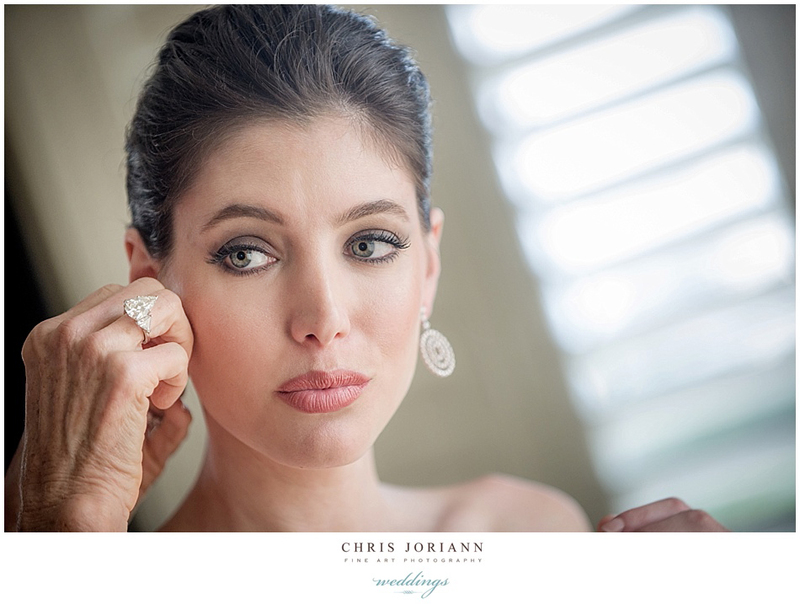 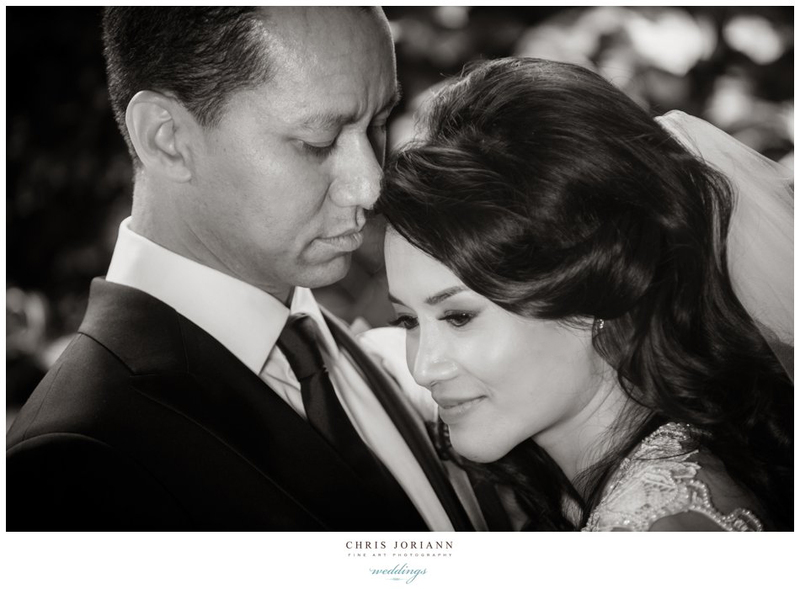 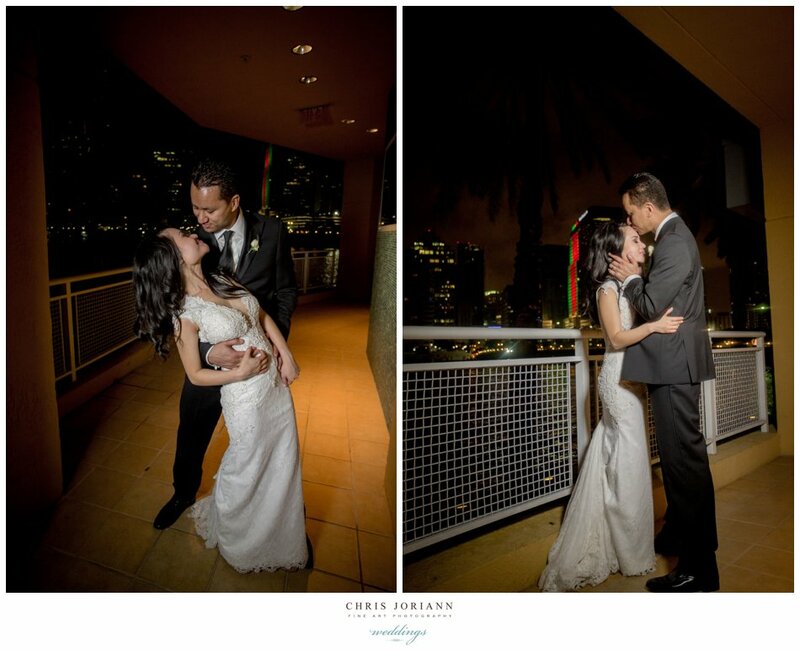 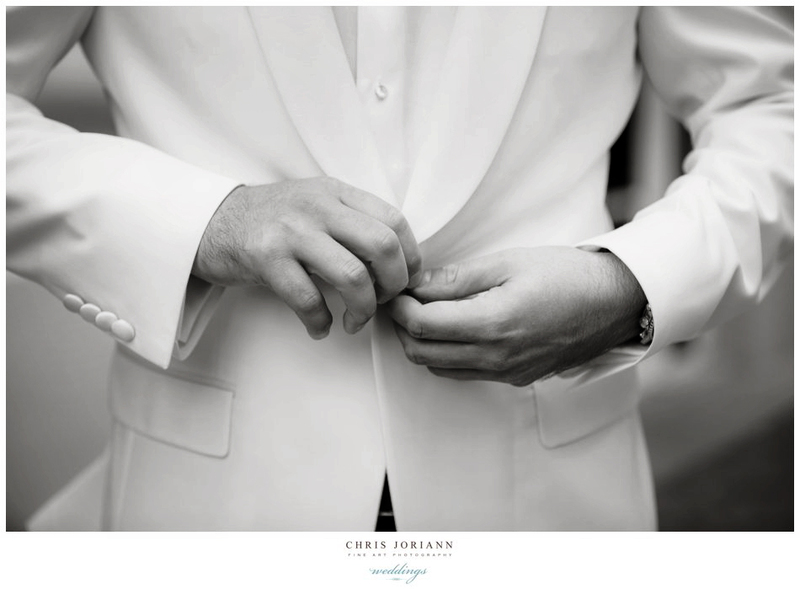 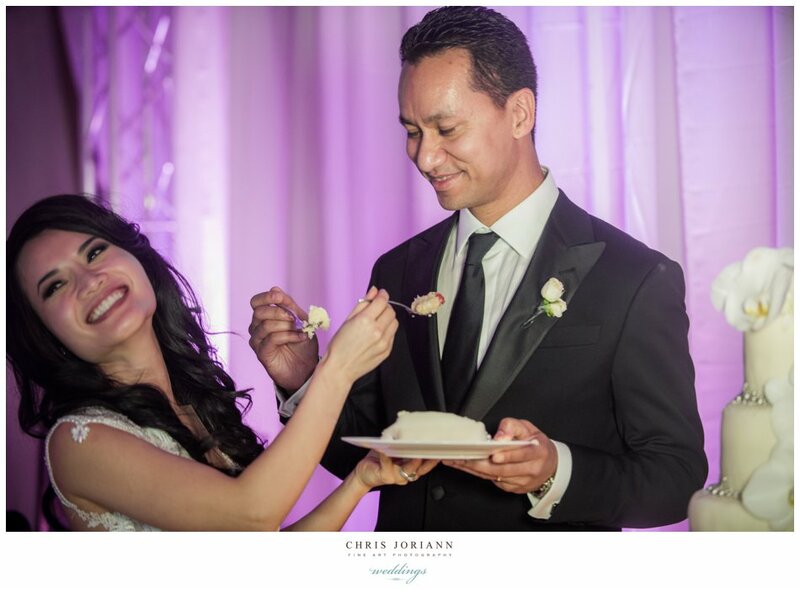 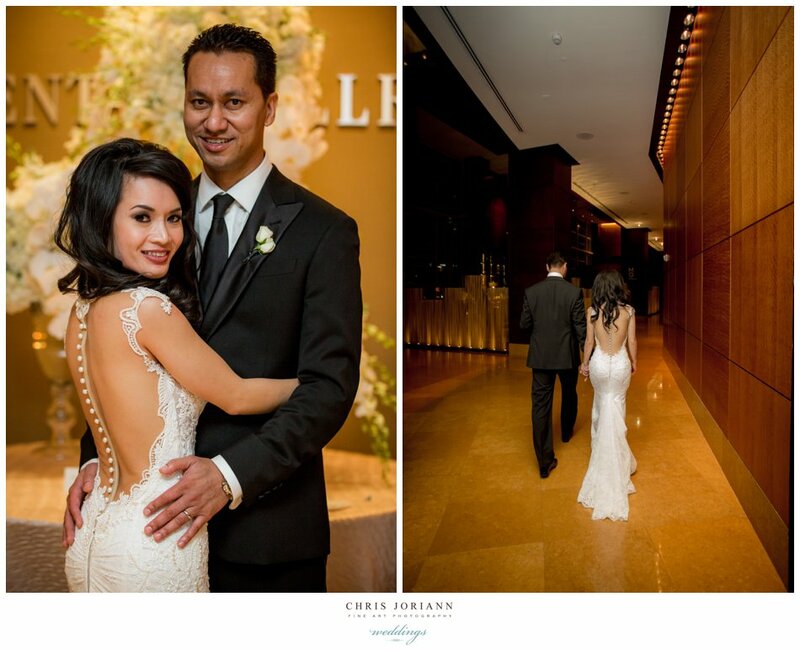 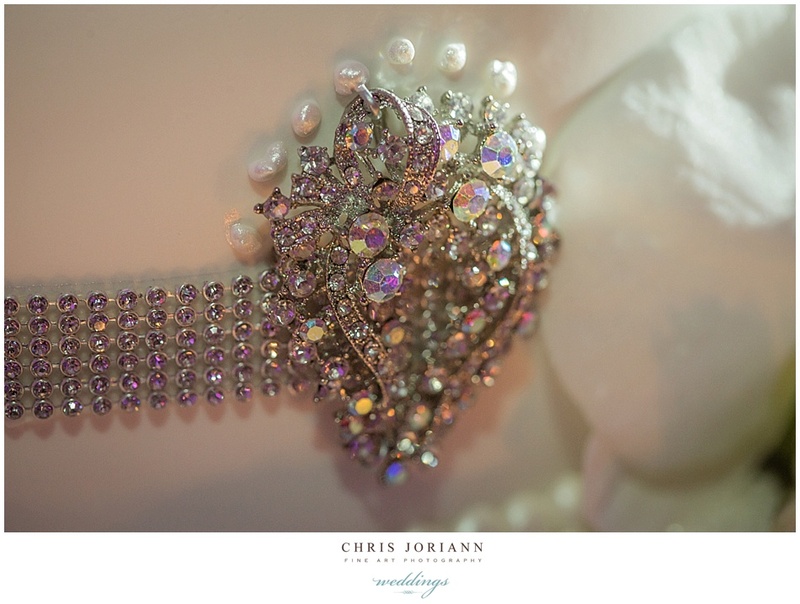 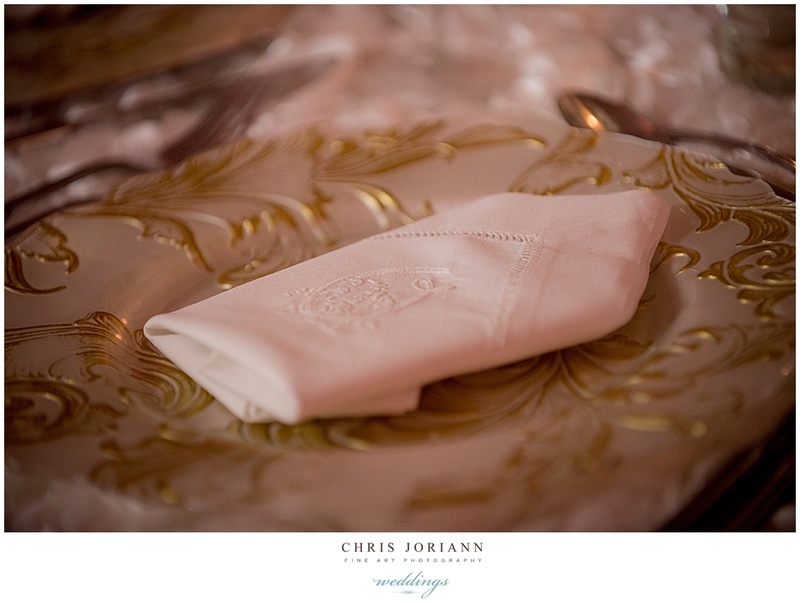 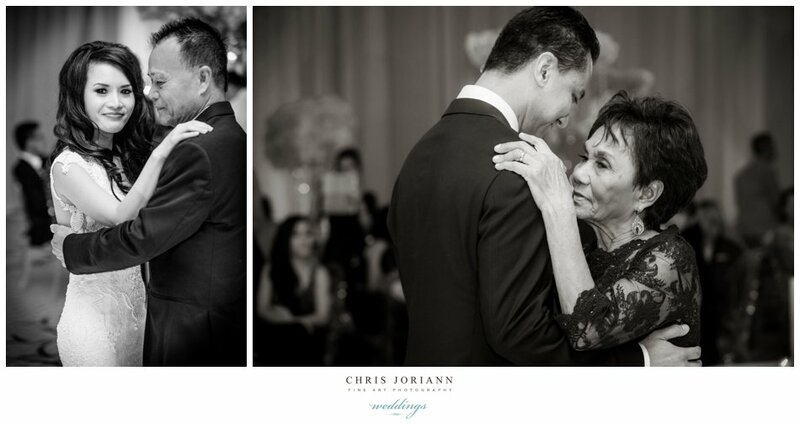 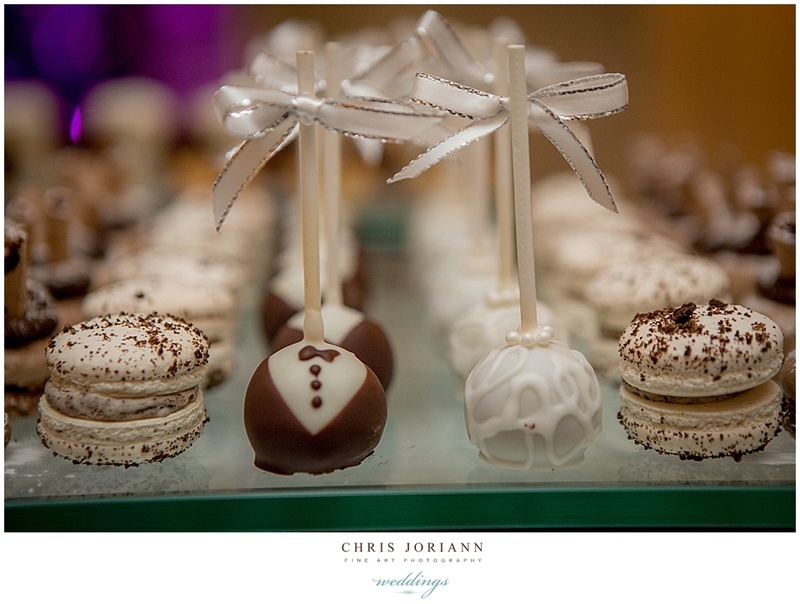 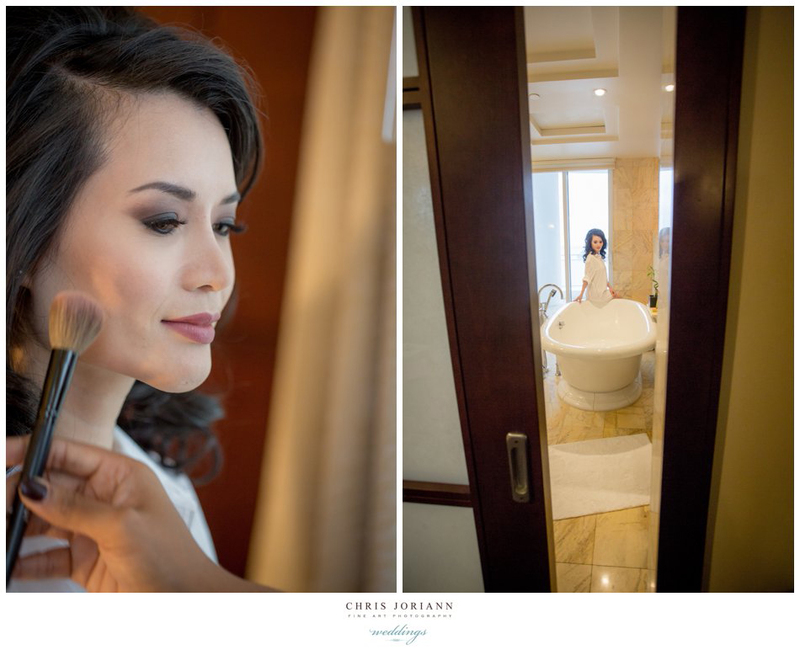 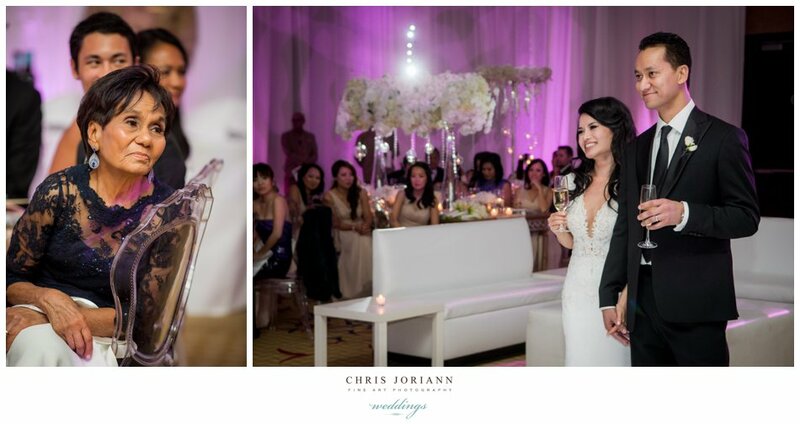 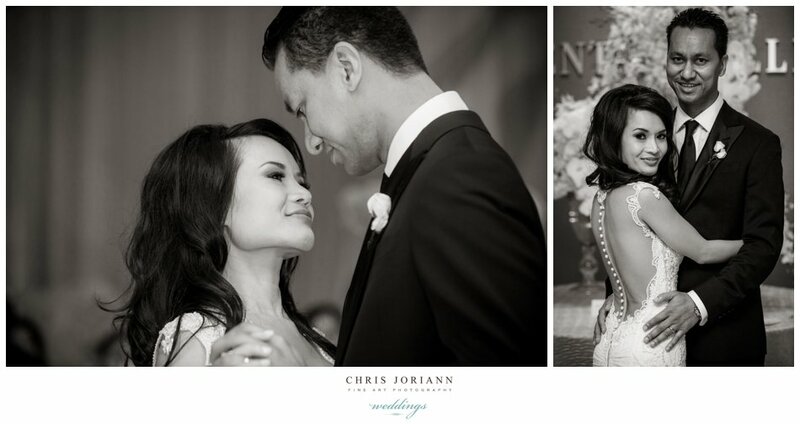 Tammy + Jean Paul’s destination wedding was held at the Mandarin Oriental in Miami. 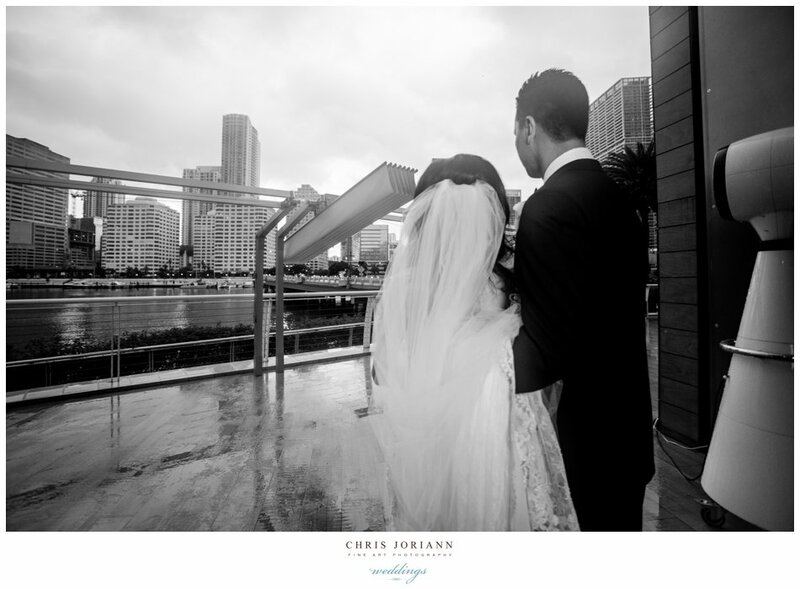 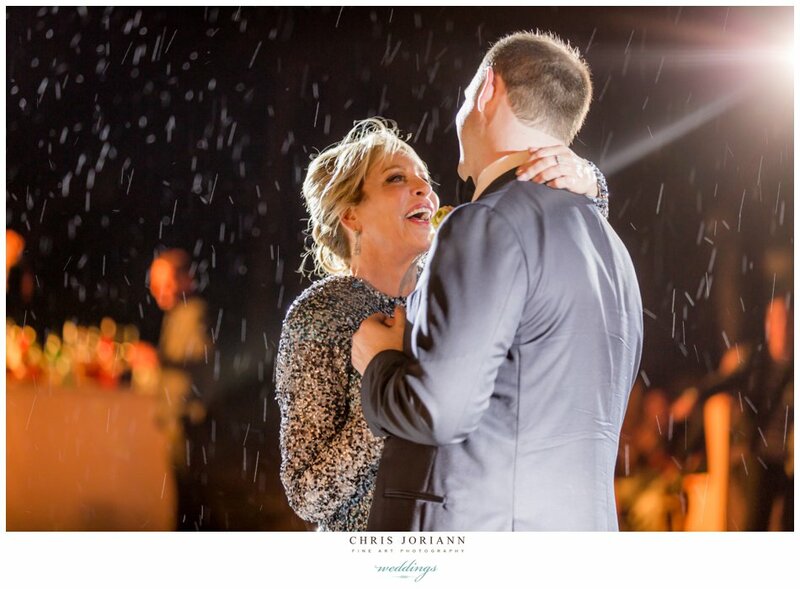 Despite stormy weather forcing the ceremony indoors, the event was absolutely gorgeous!!! 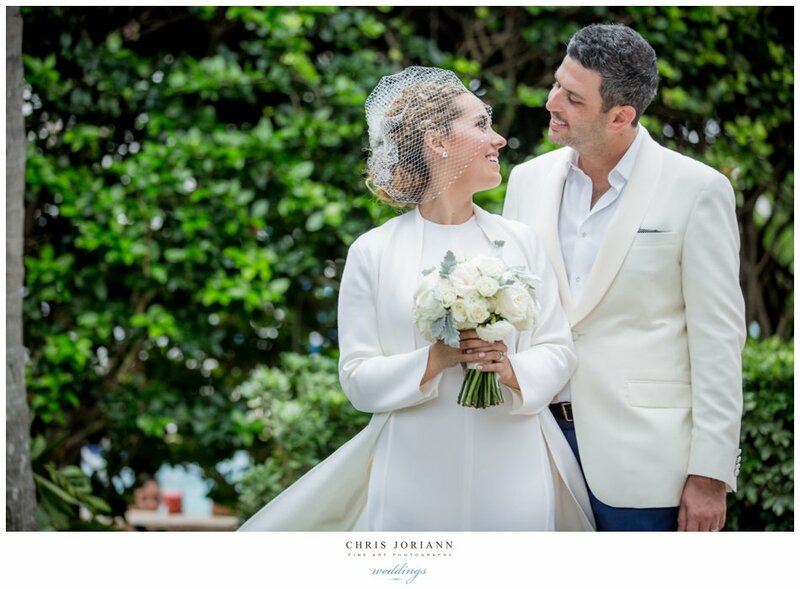 The bride was a vision in a couture gown by Israeli designer Berta. 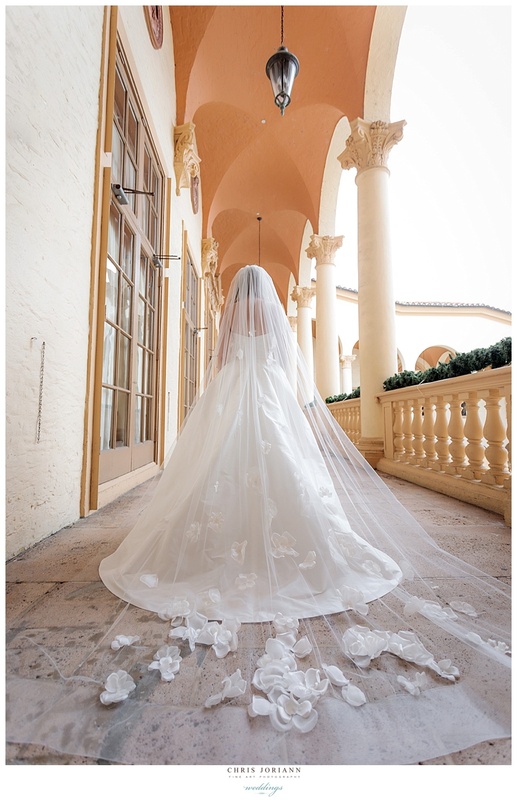 The sheer pearl backed gown was fitted to perfection creating a breathtaking silhouette. 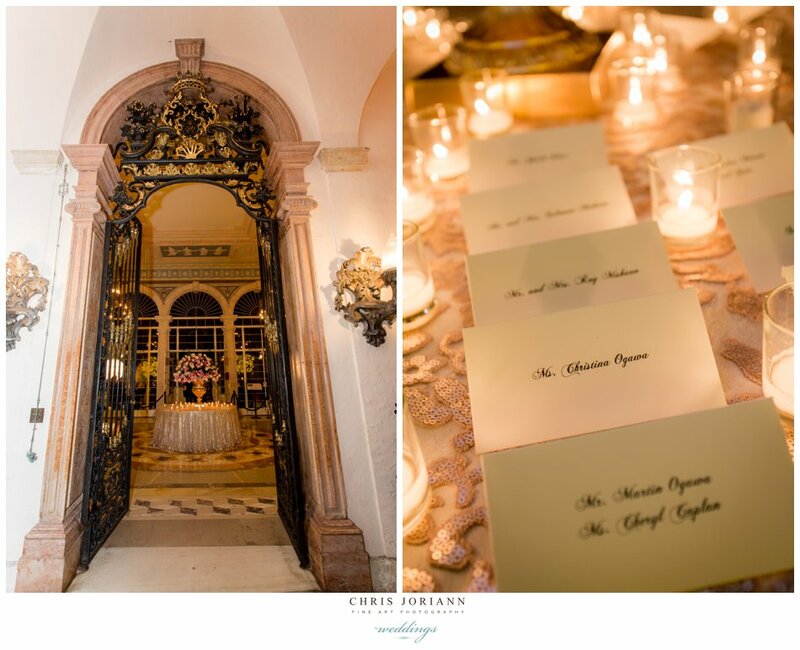 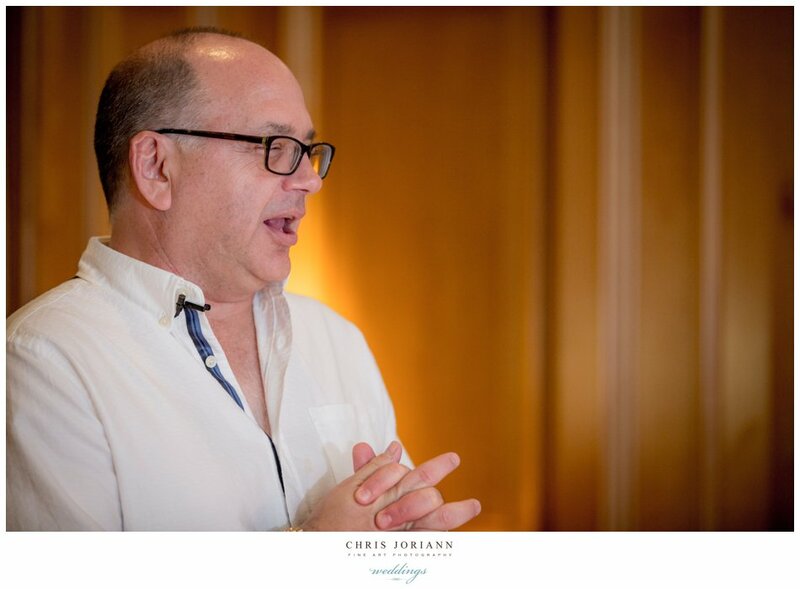 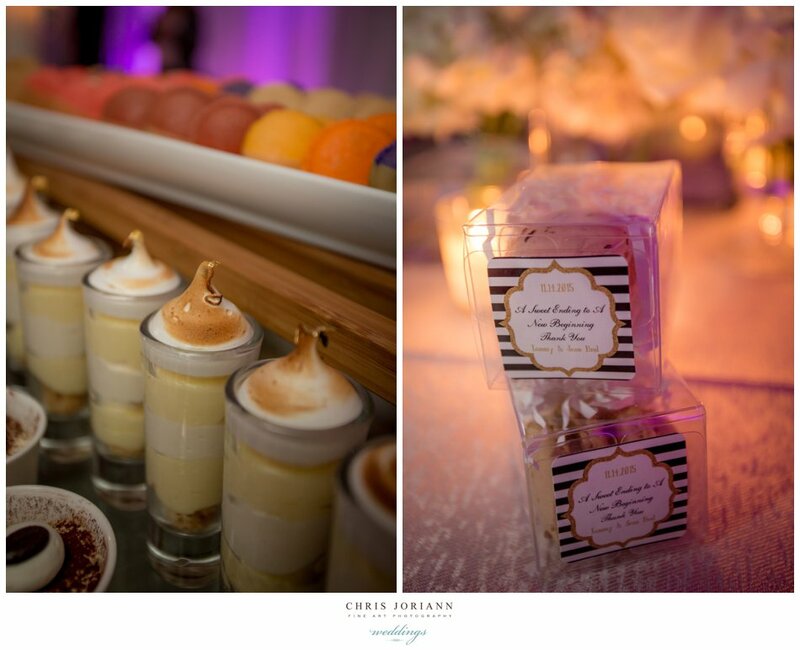 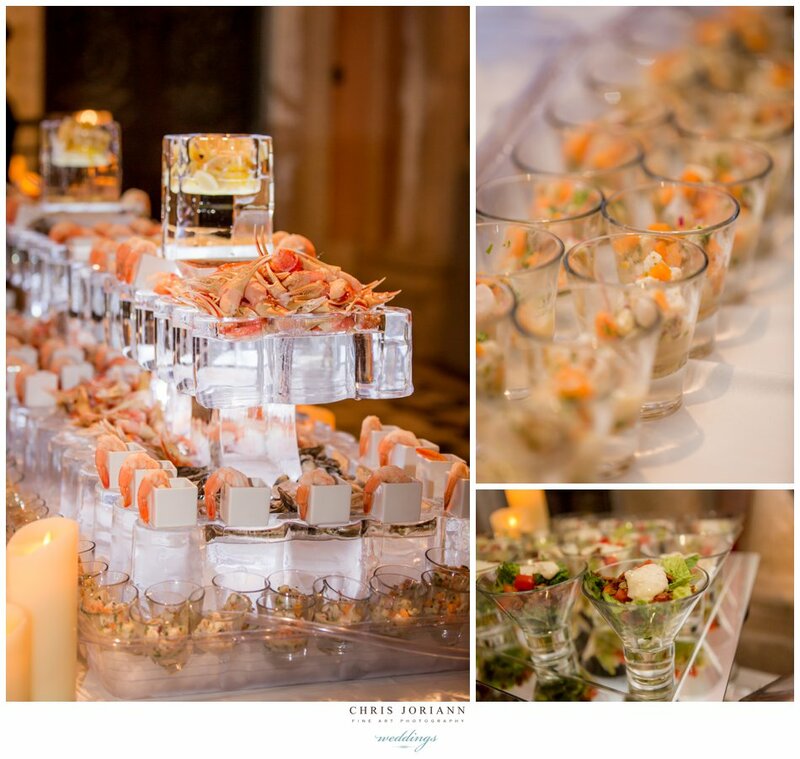 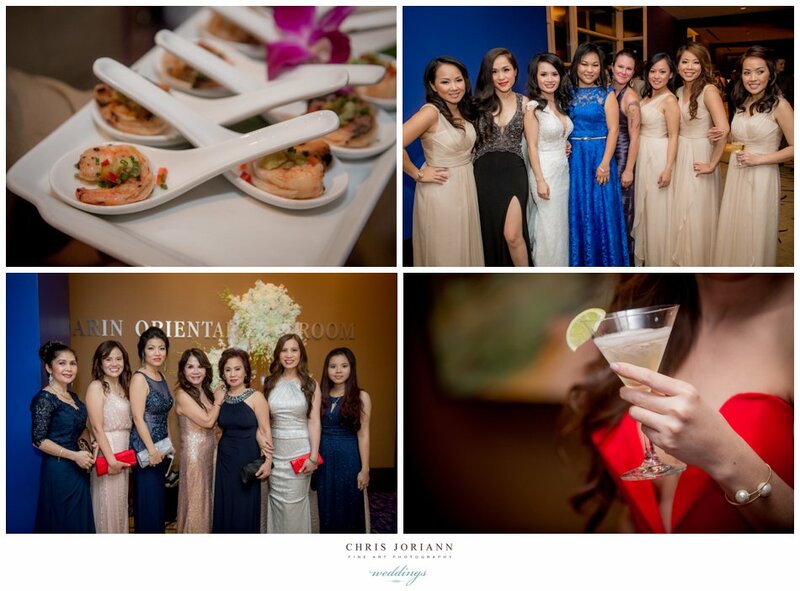 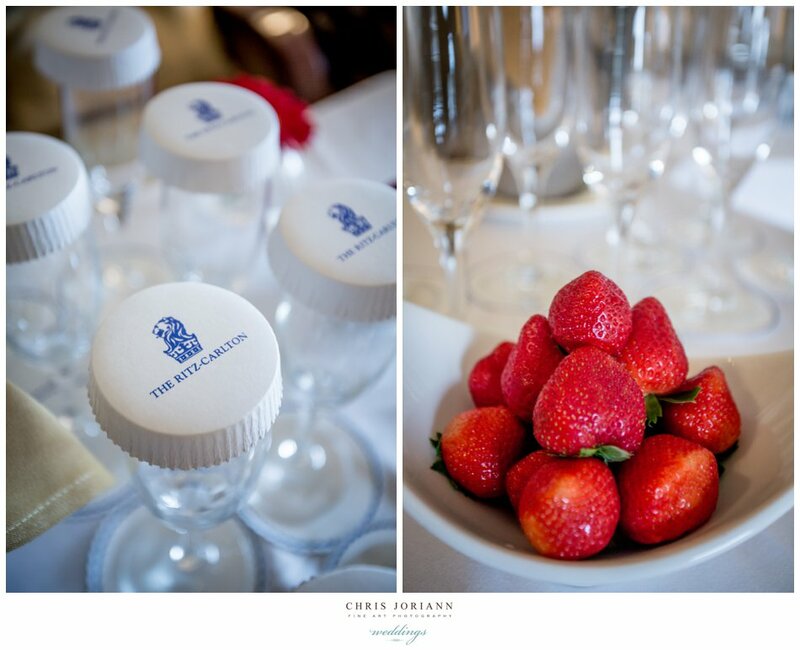 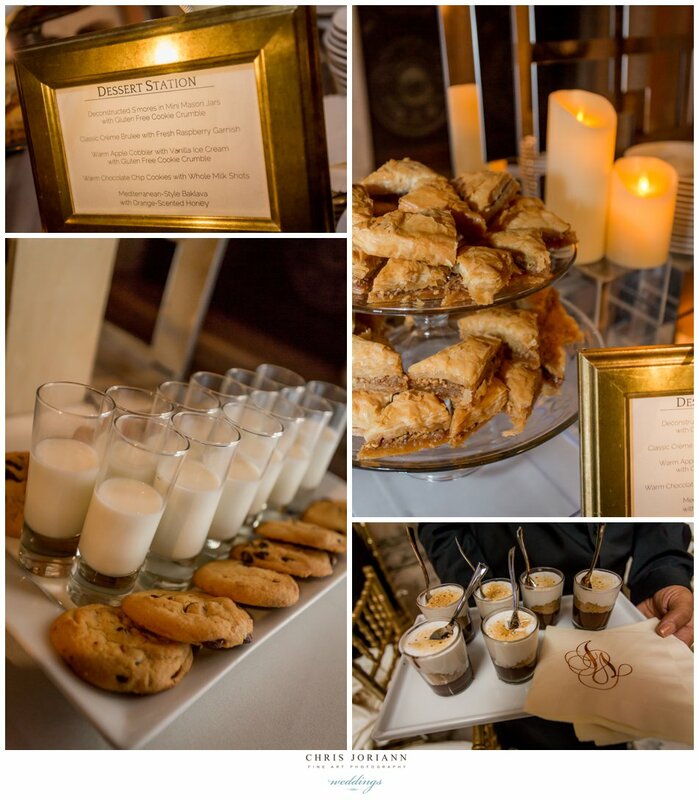 The event was directed by Victoria Chase for the Mandarin, and beautifully coordinated by Breeze Taylor Events . 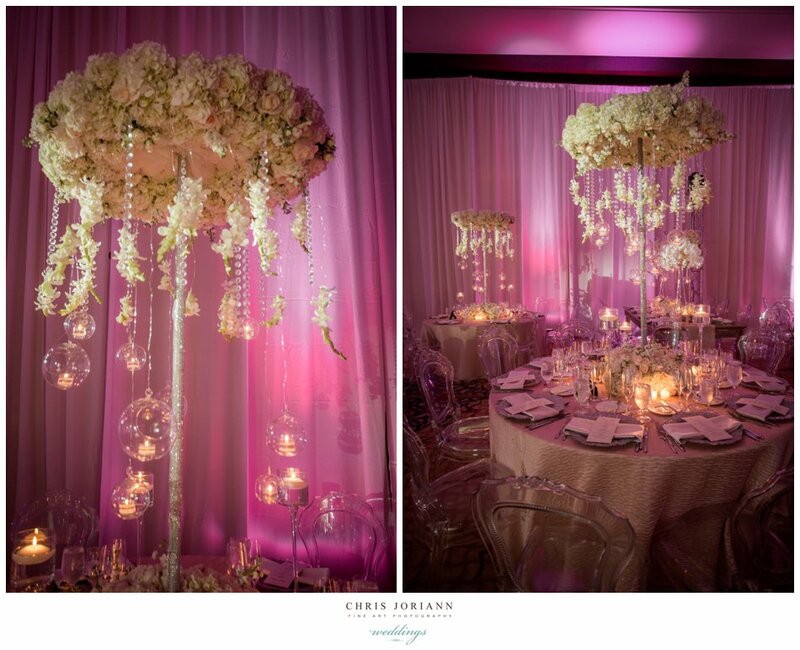 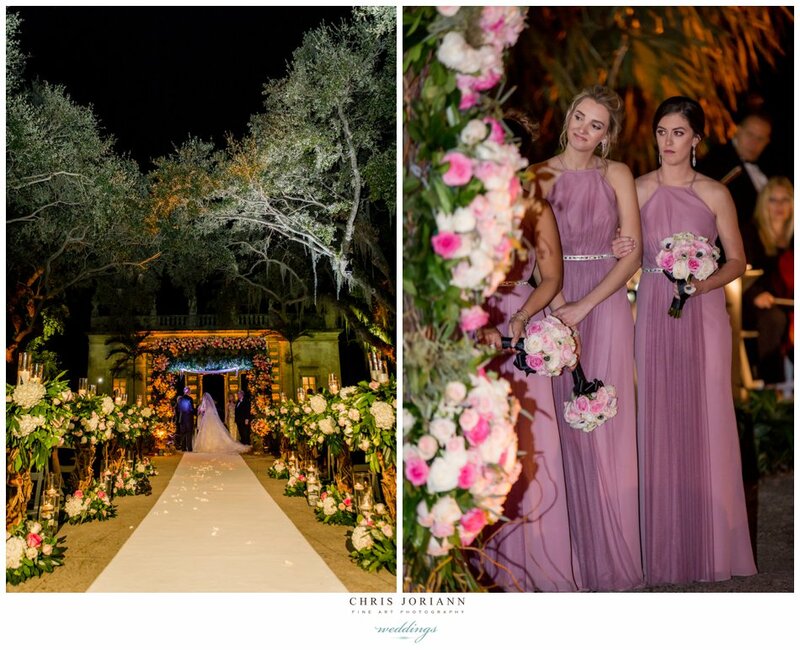 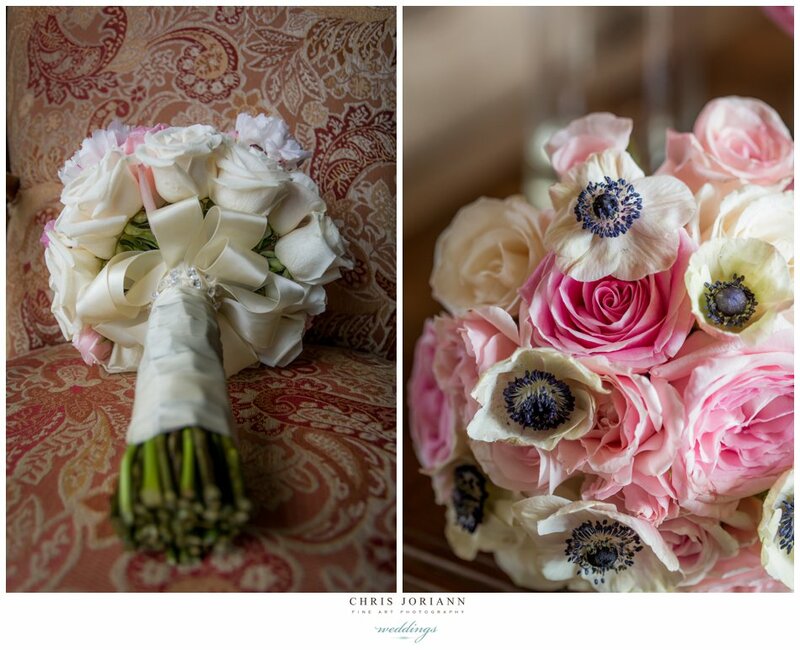 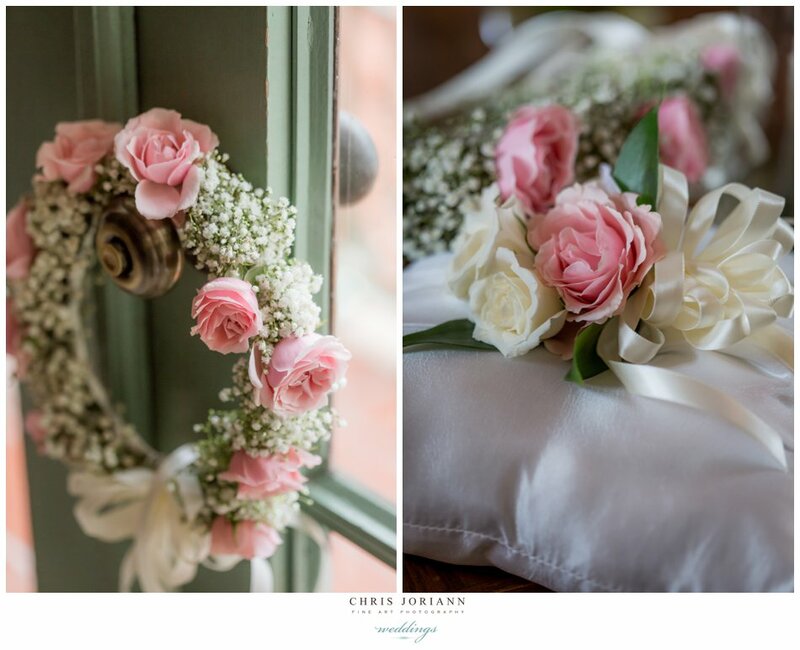 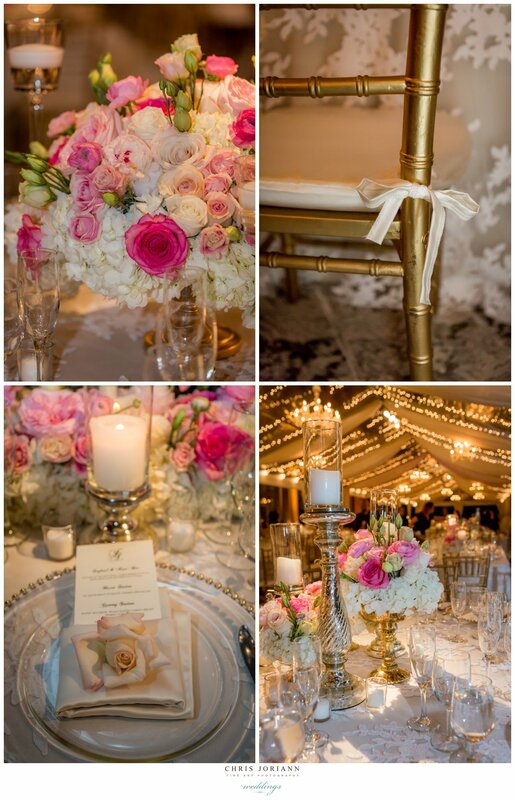 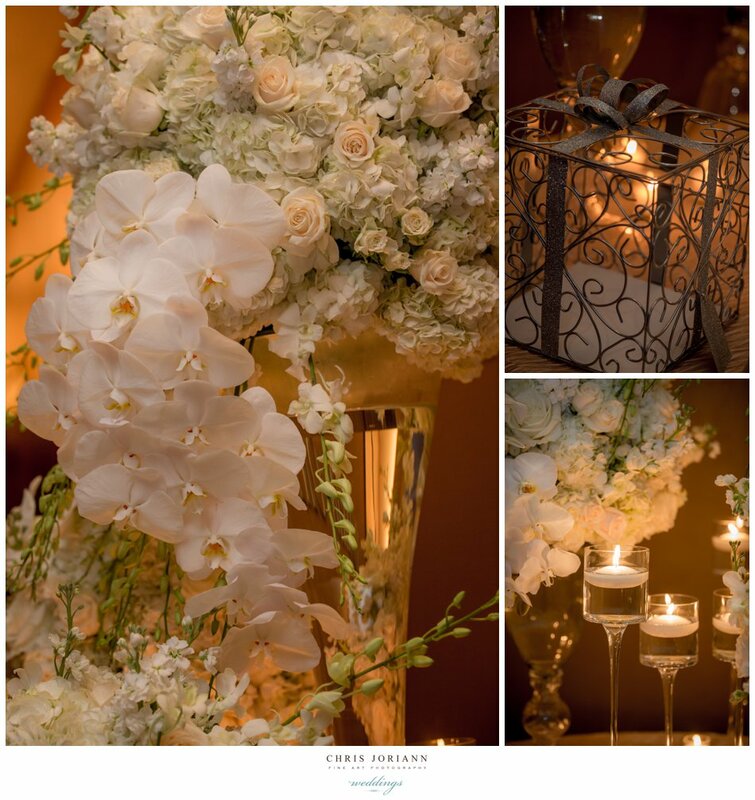 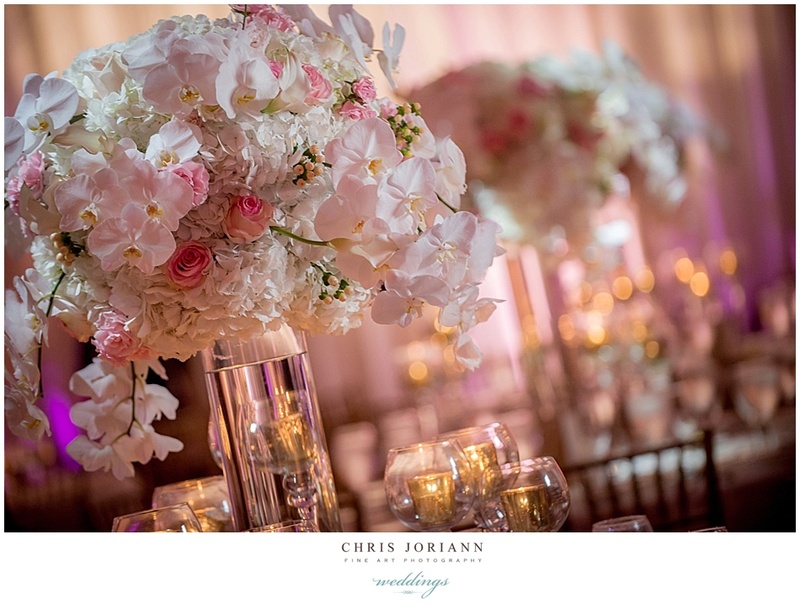 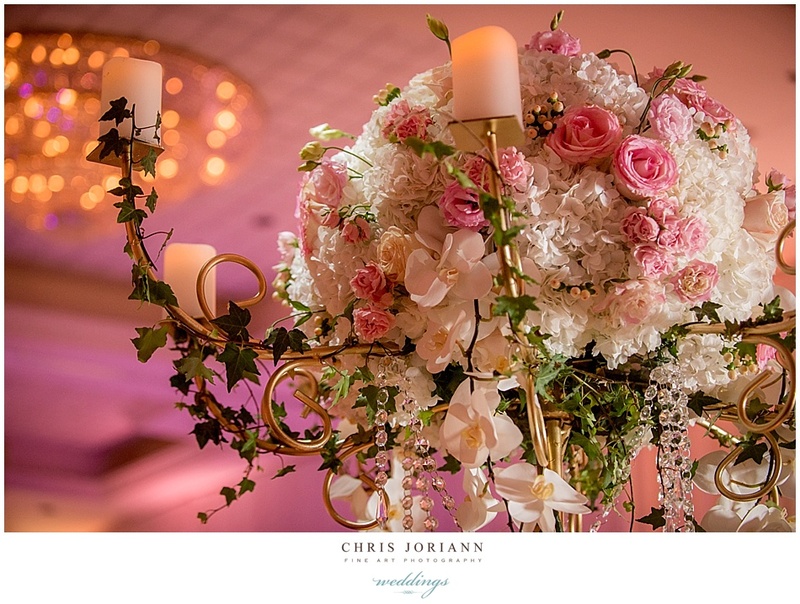 The decor and florals by the creative team at Petal Productions invoked pure romance. 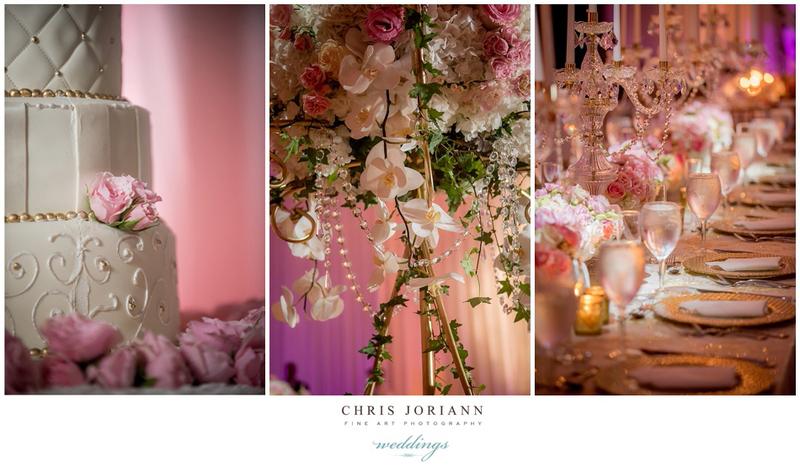 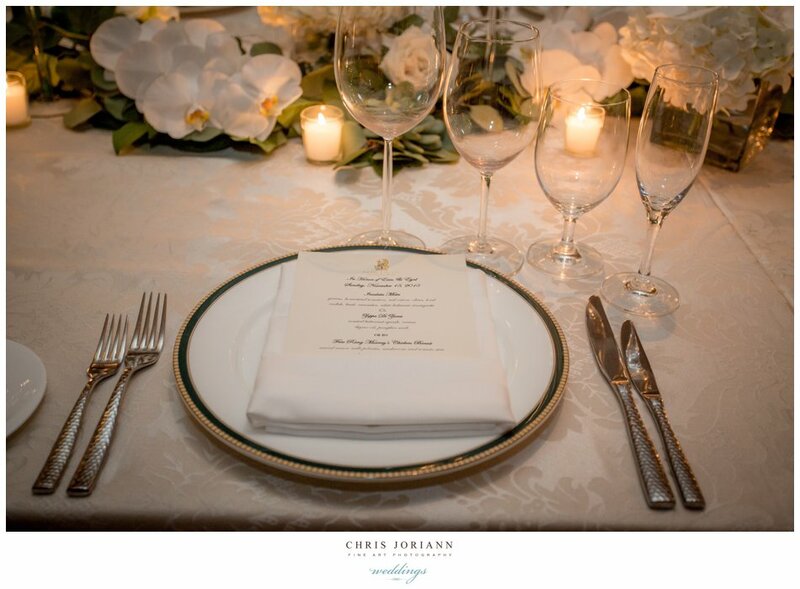 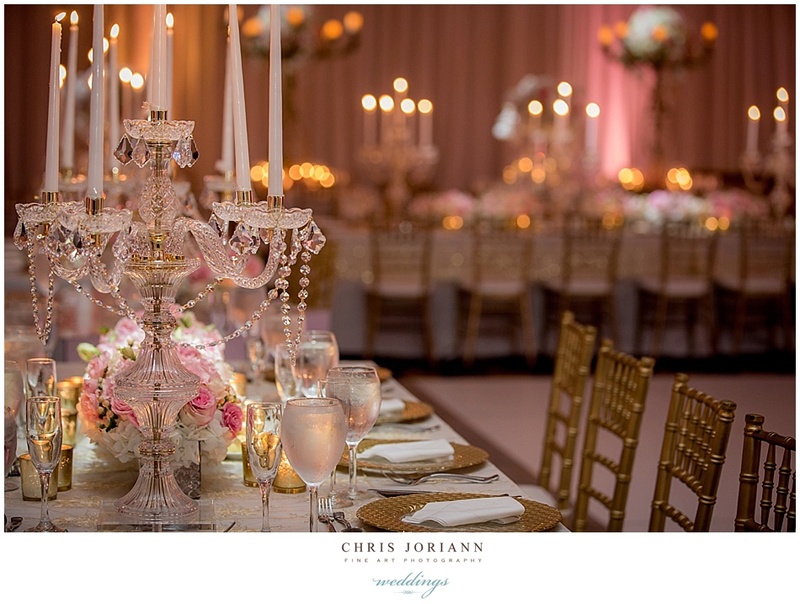 The tablescapes dripping with orchids, crystals, and floating globed votives, featured gold tables w. mirrored tabletops, blush runners, lotus flower chargers, and ghost Louis XVI chairs. 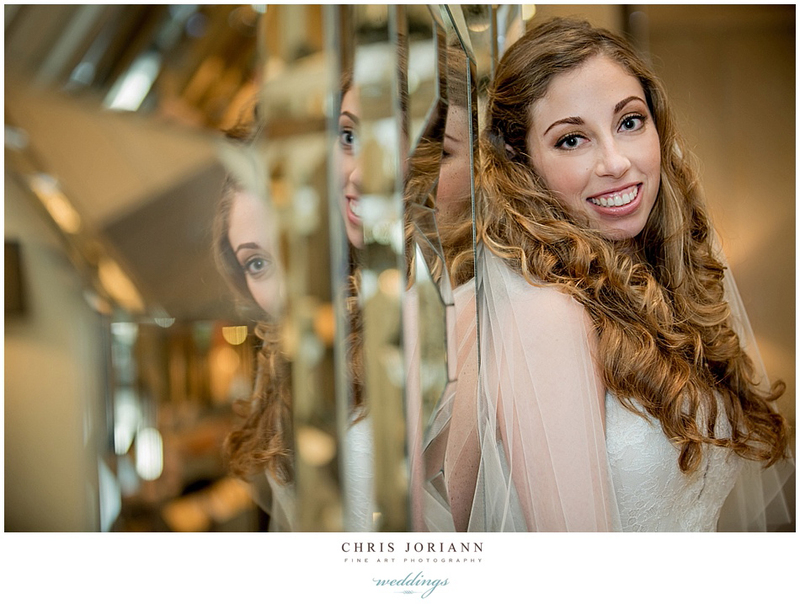 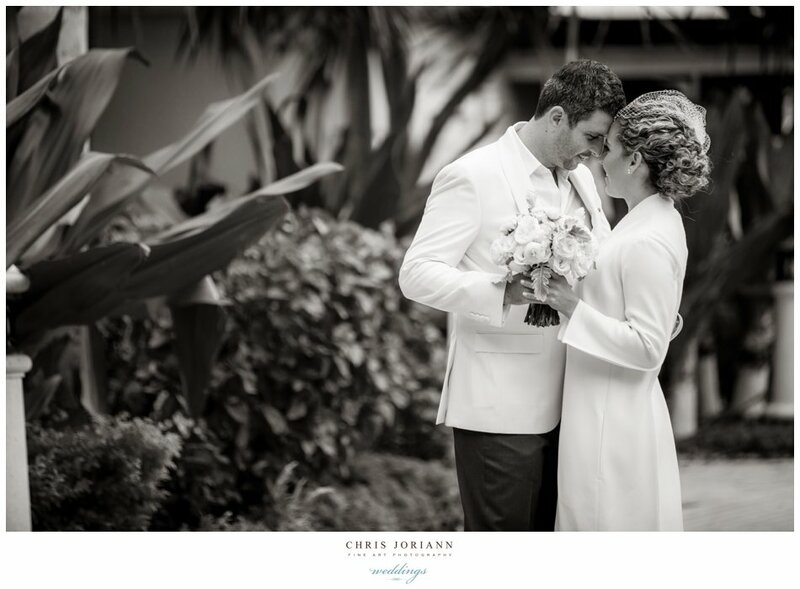 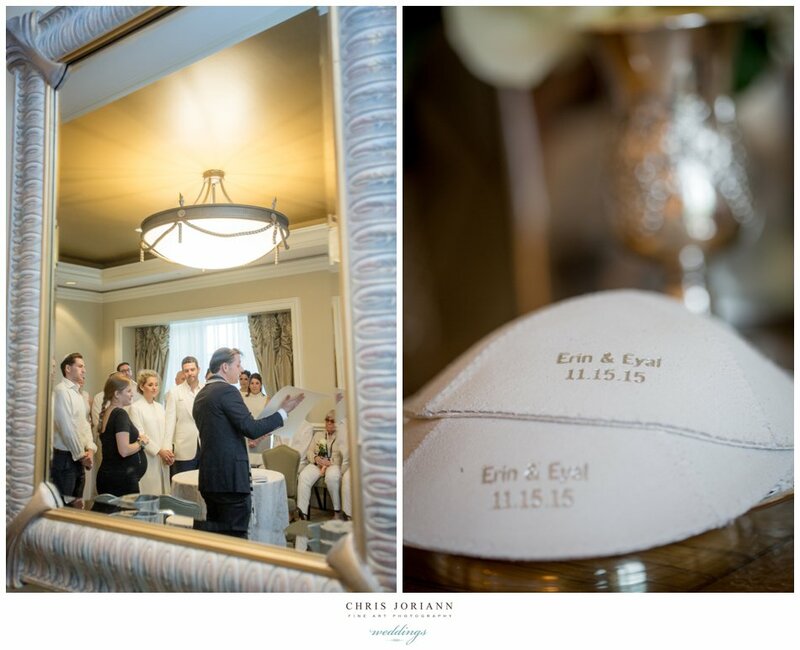 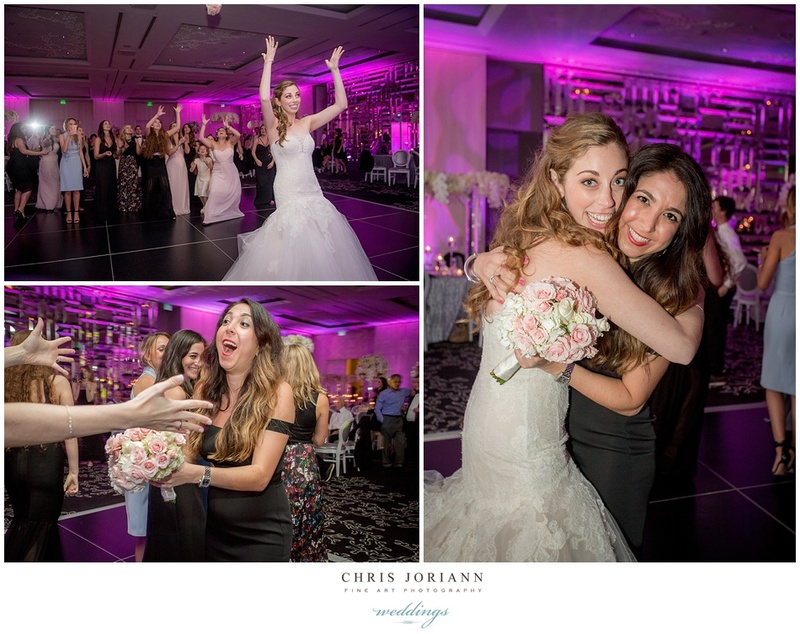 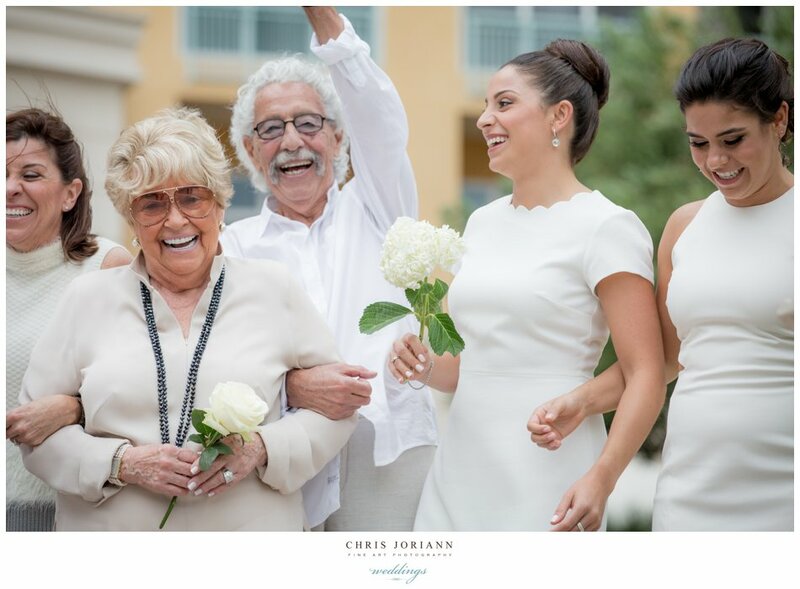 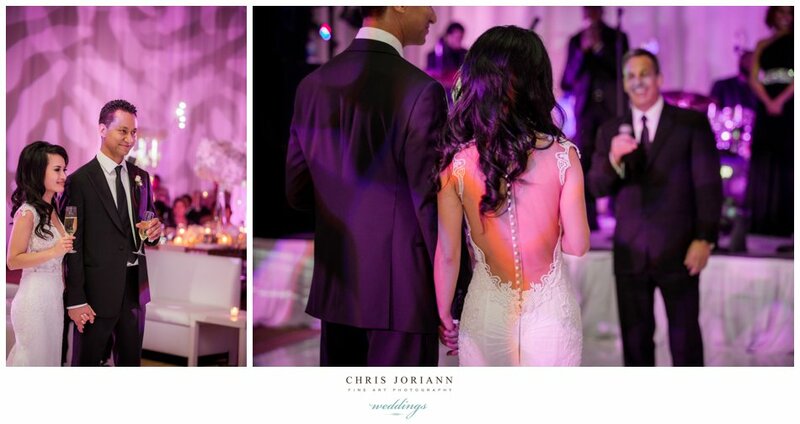 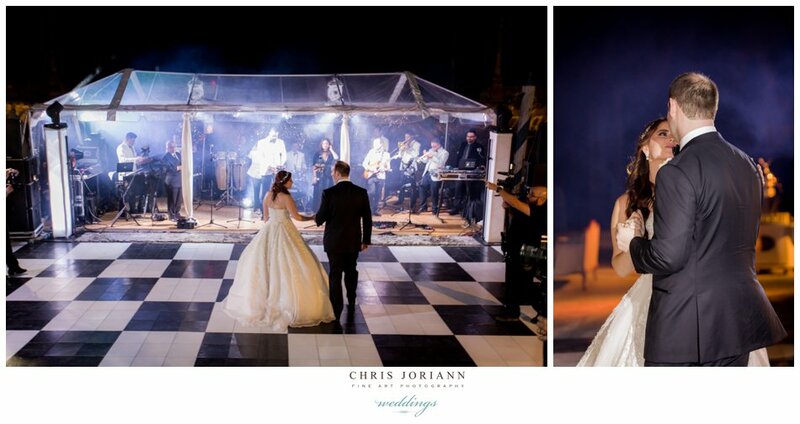 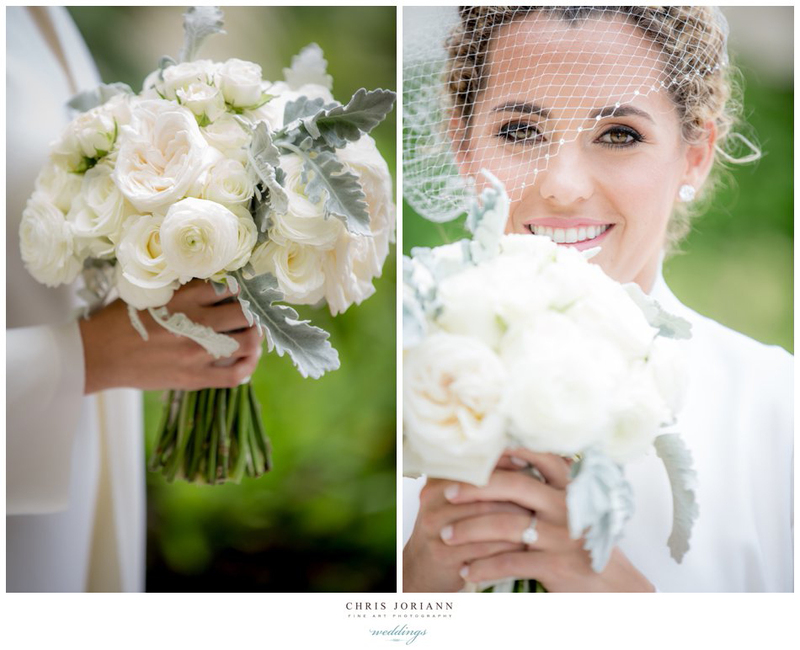 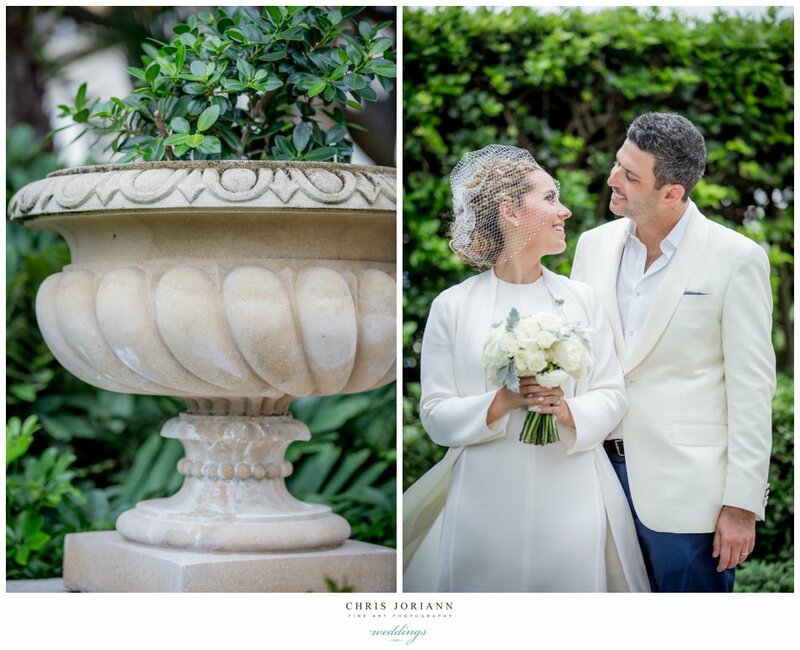 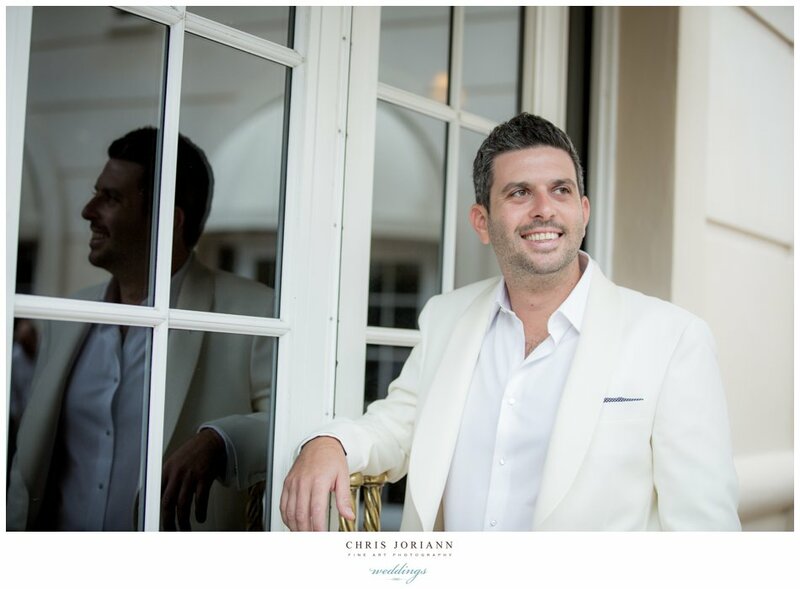 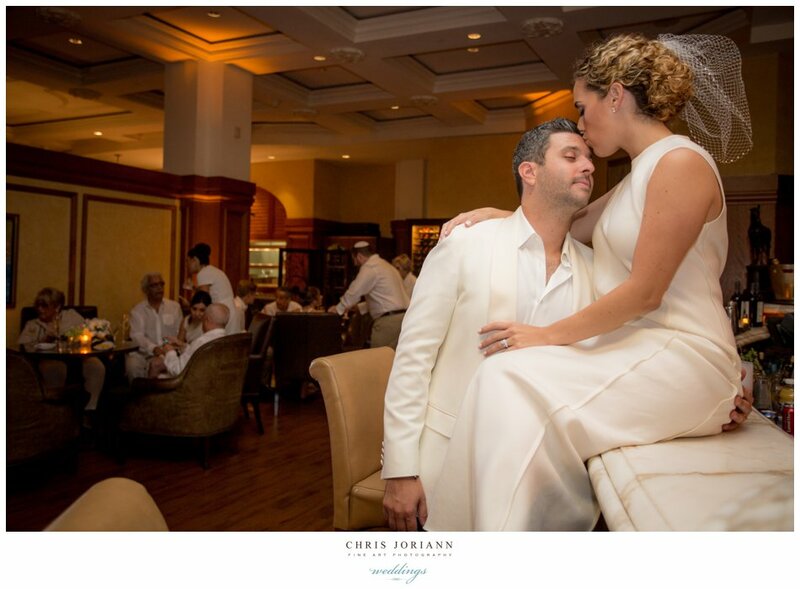 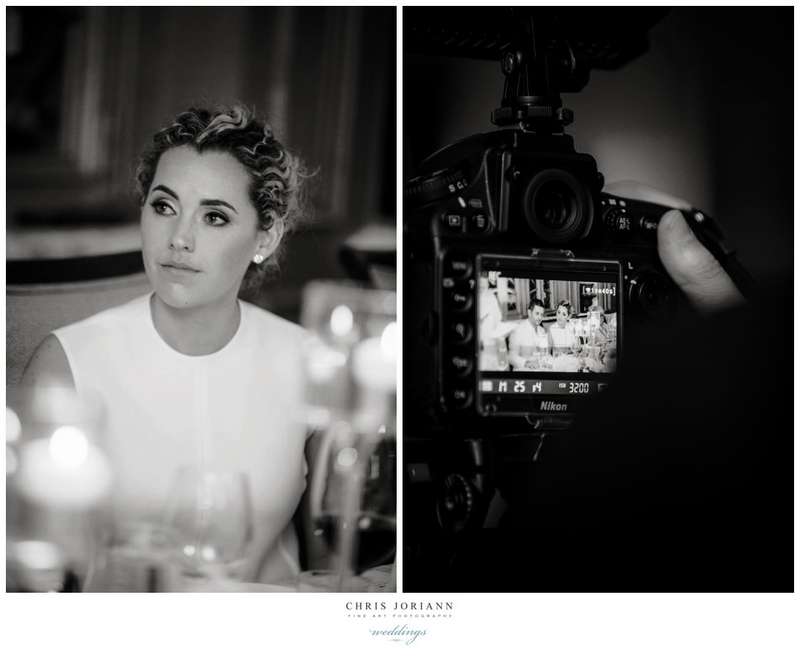 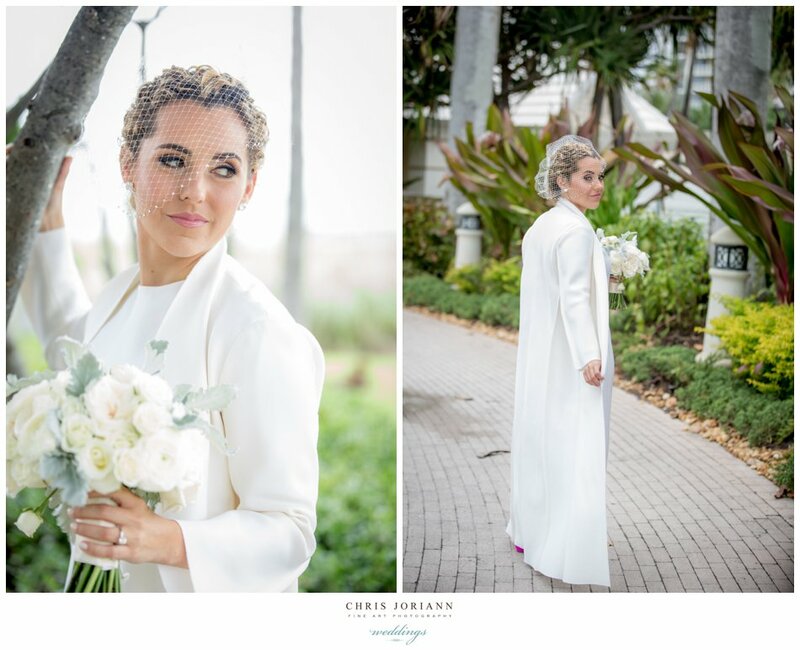 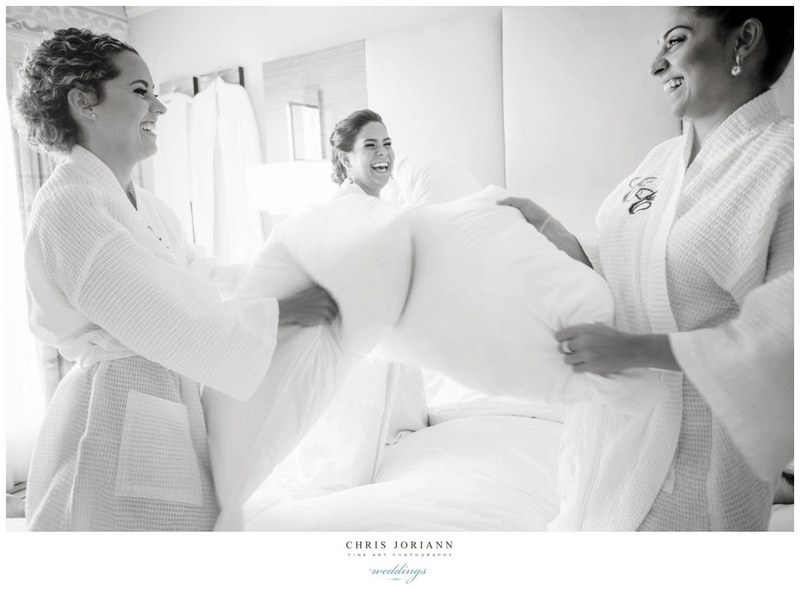 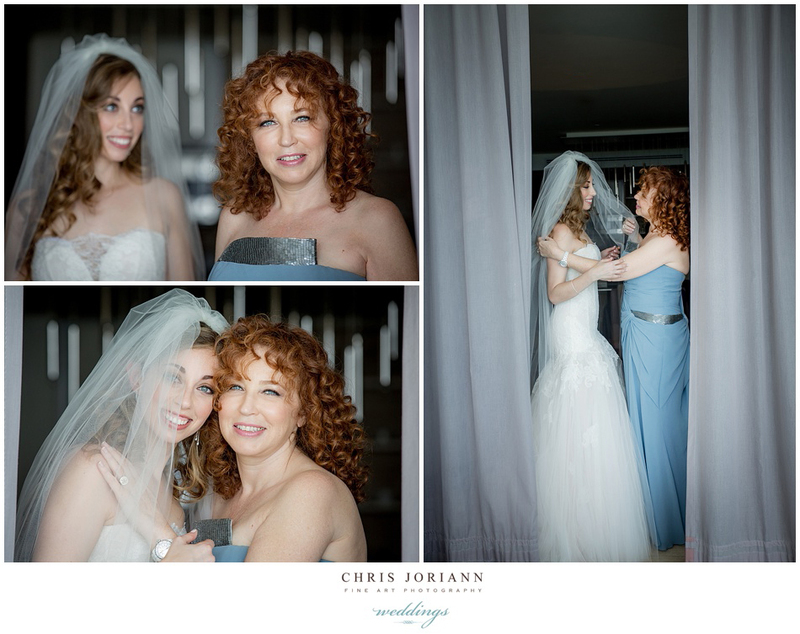 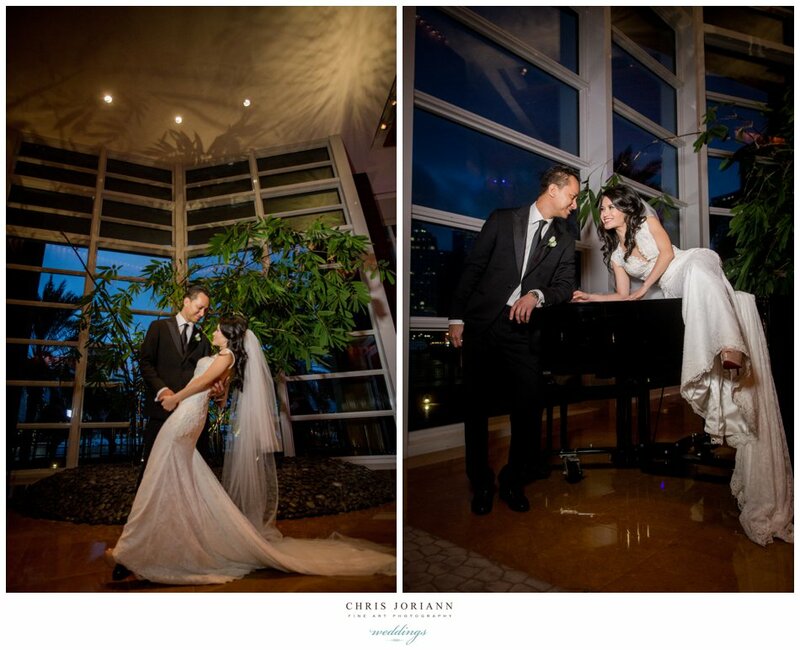 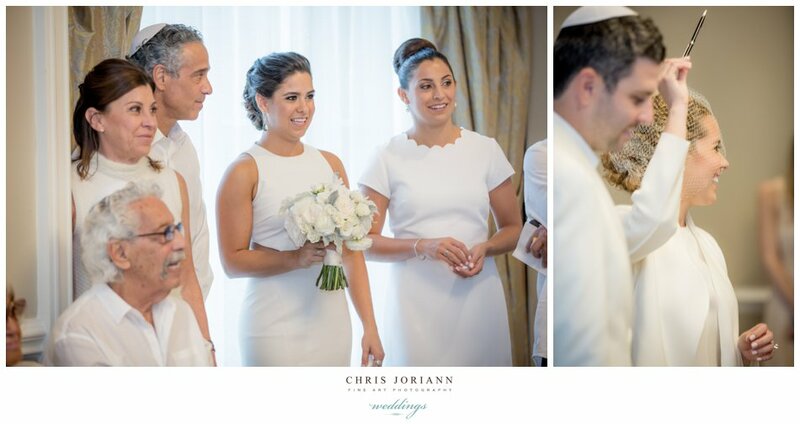 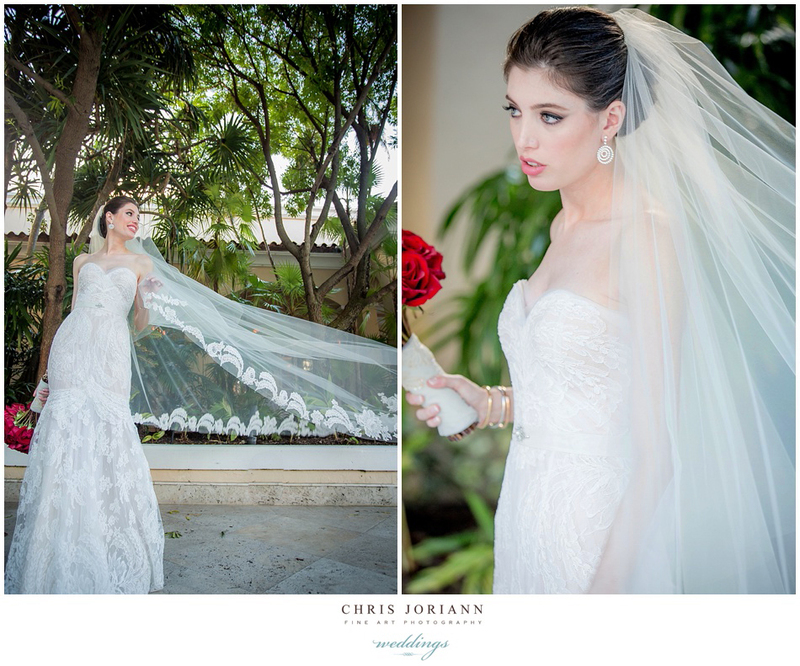 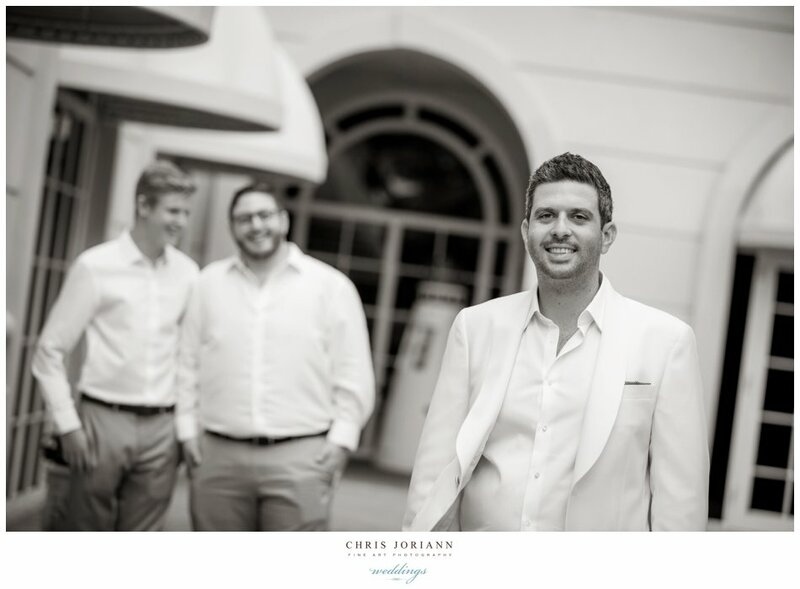 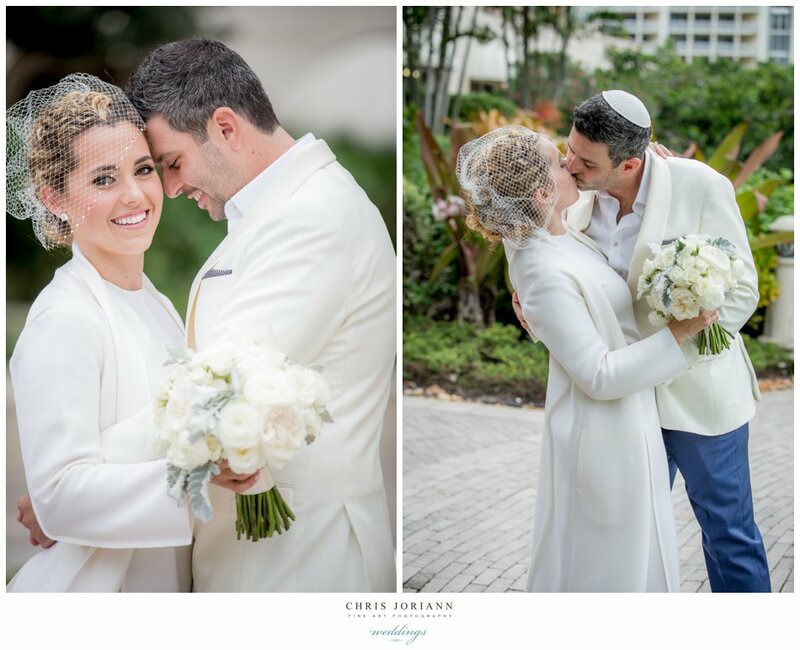 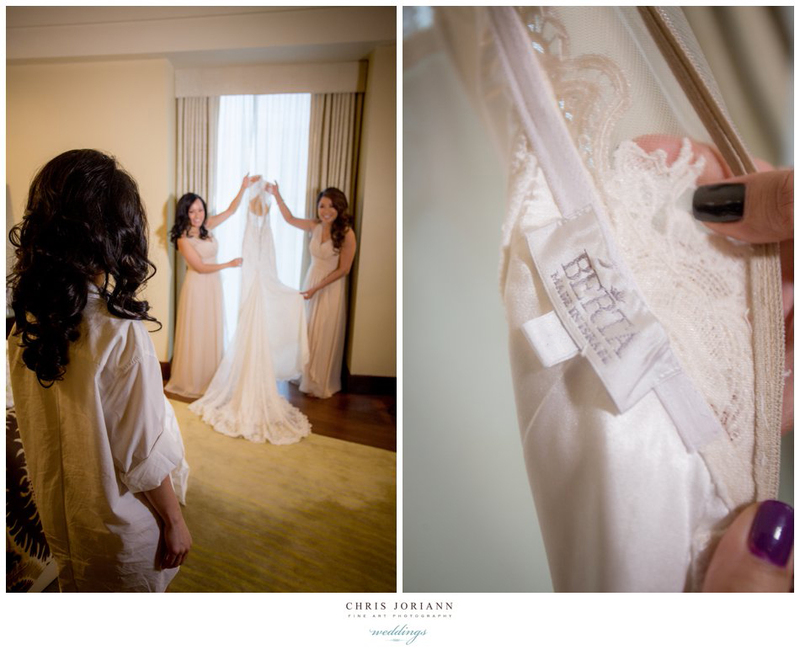 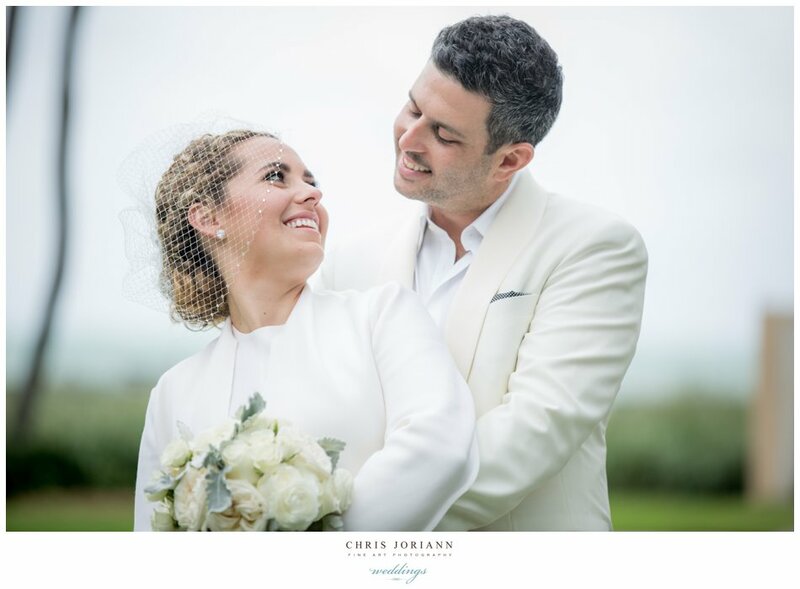 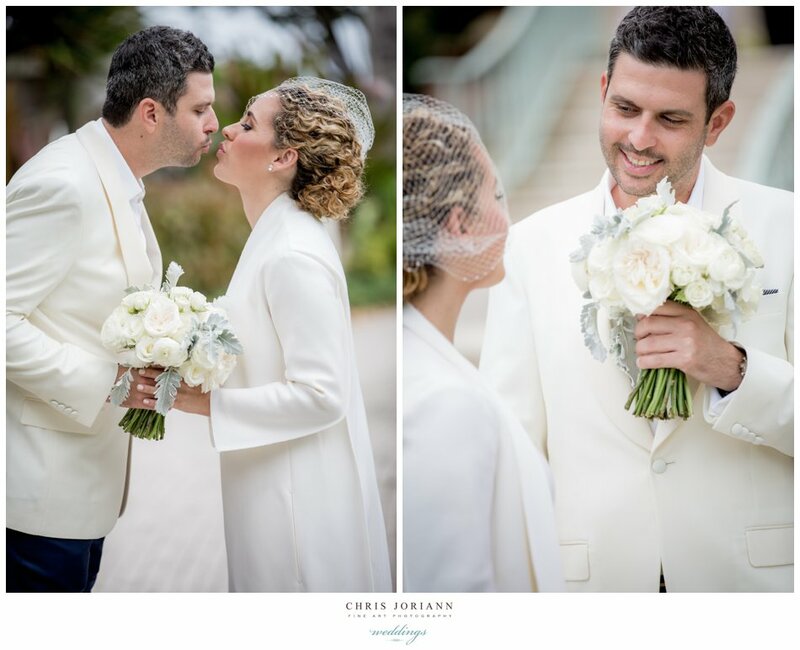 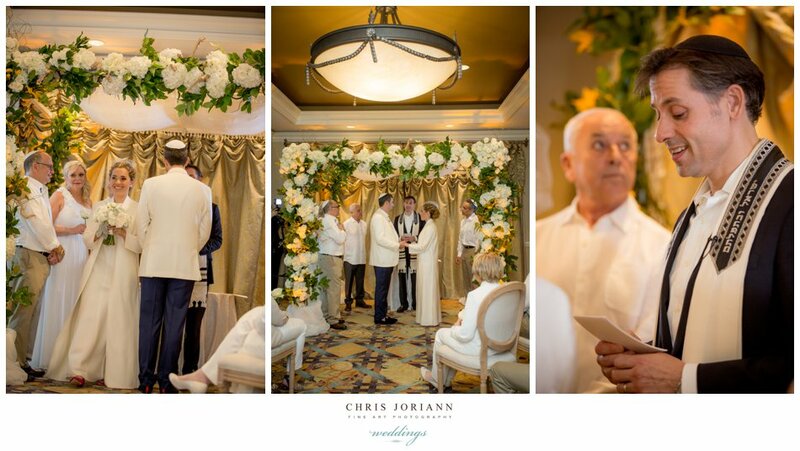 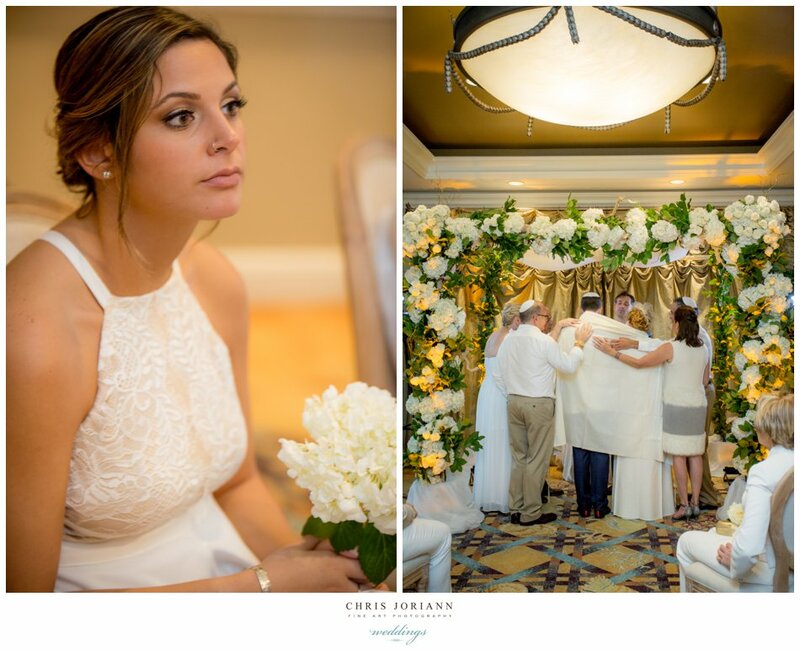 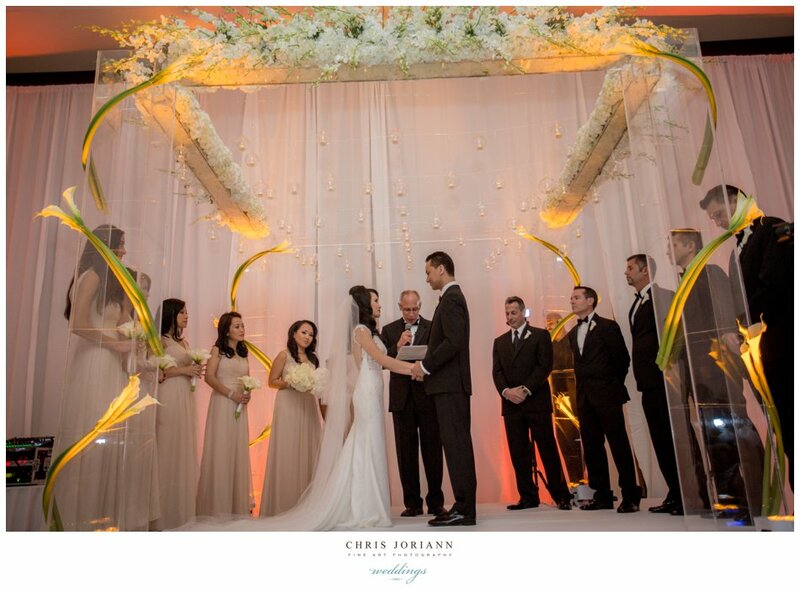 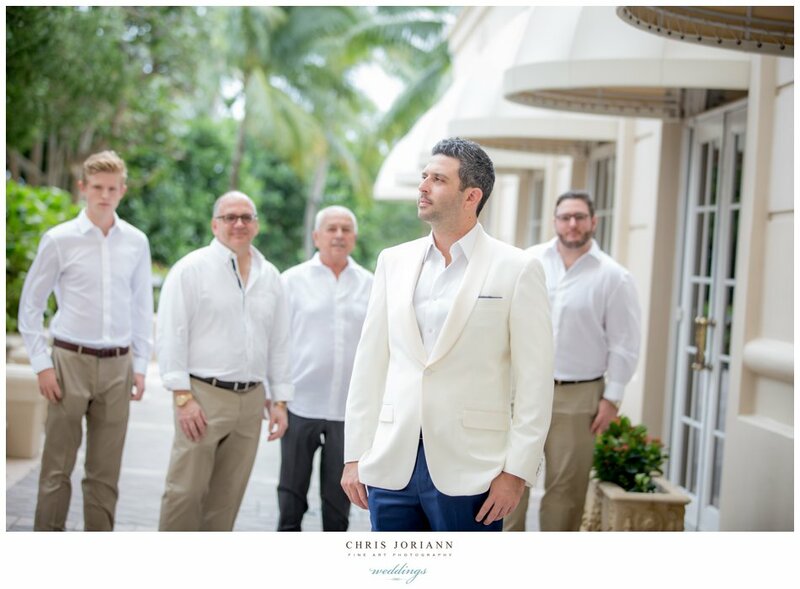 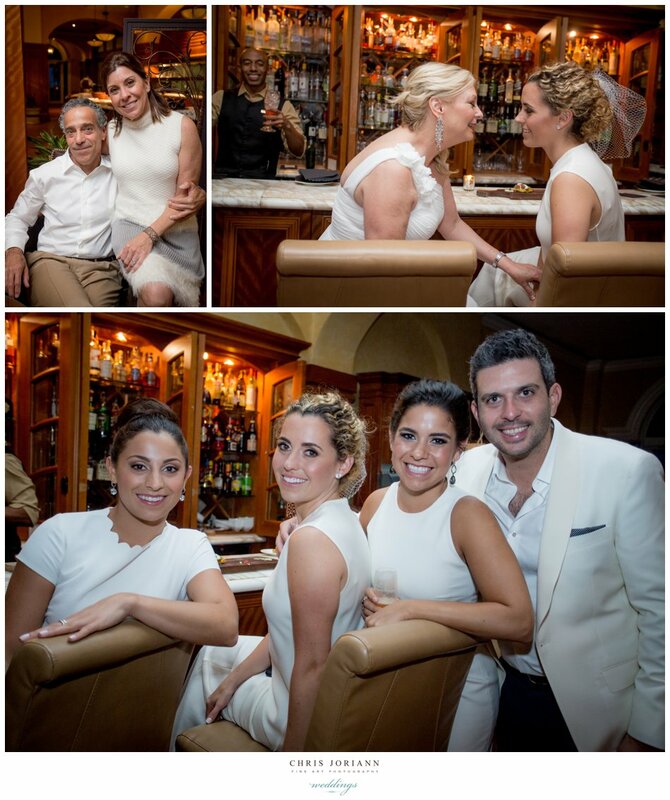 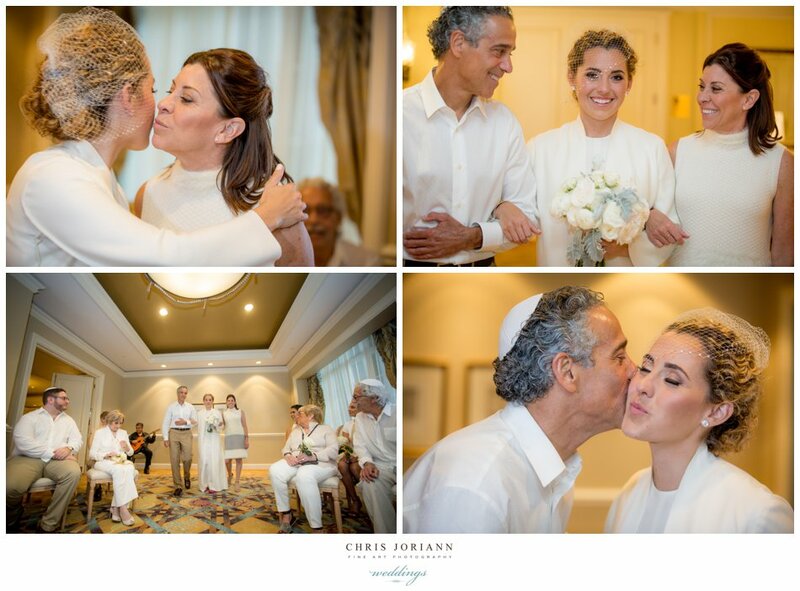 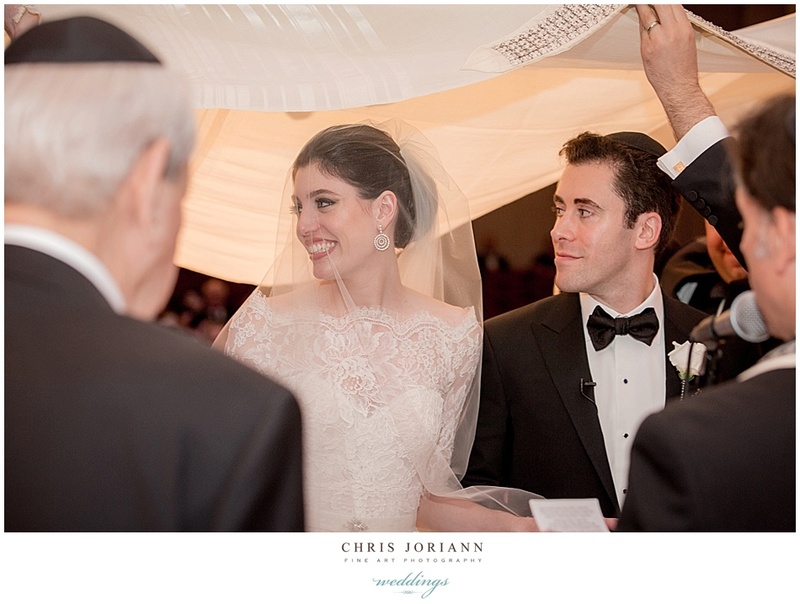 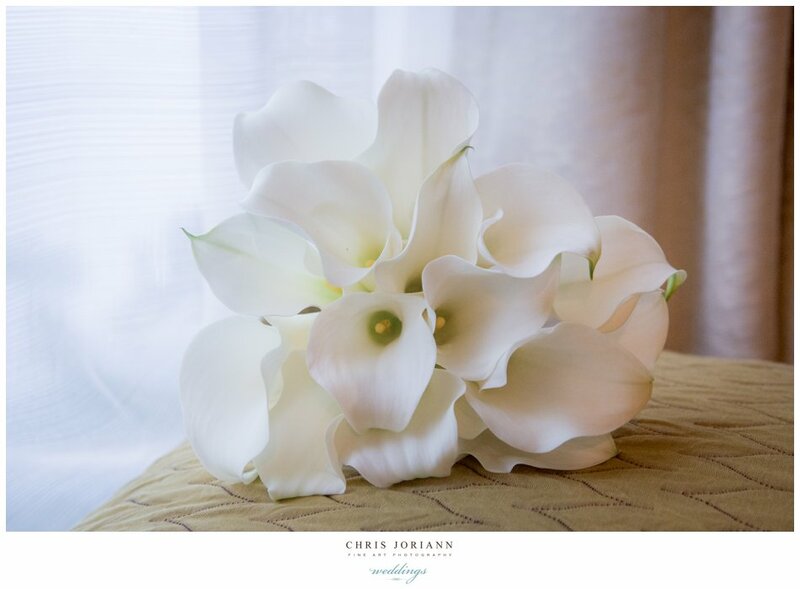 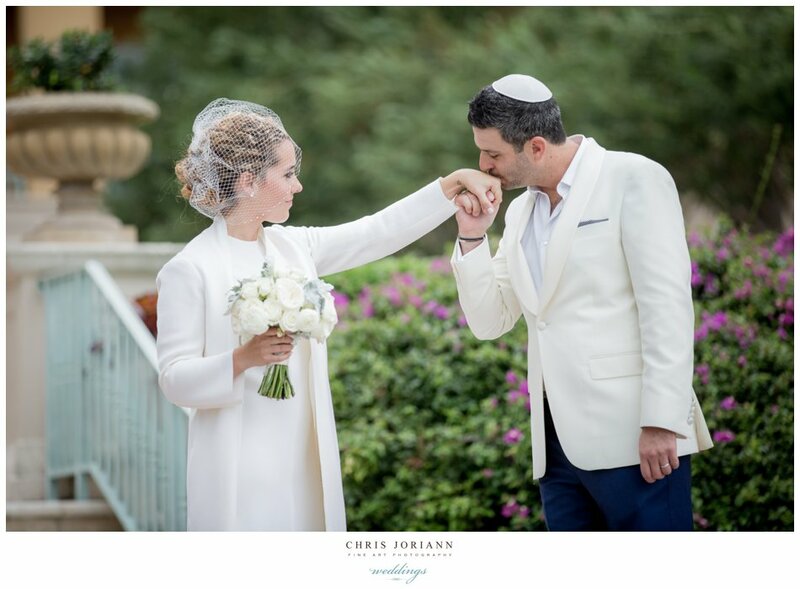 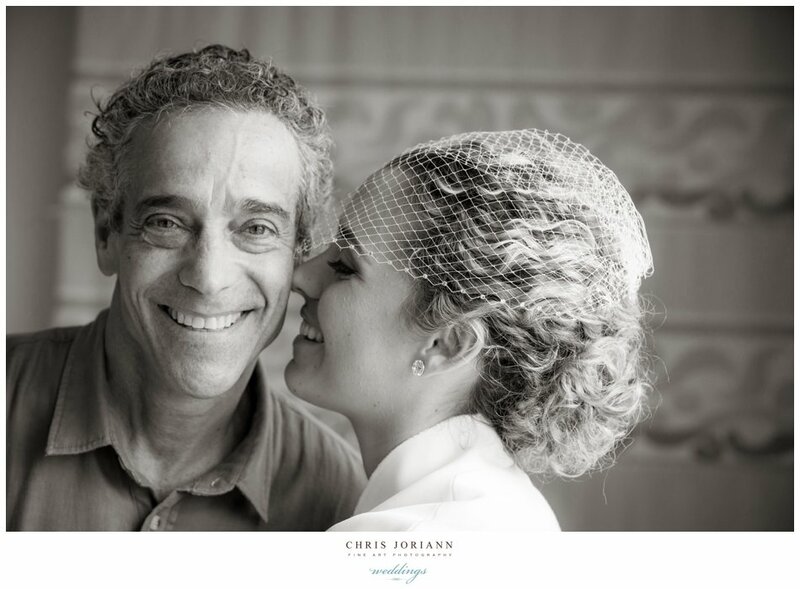 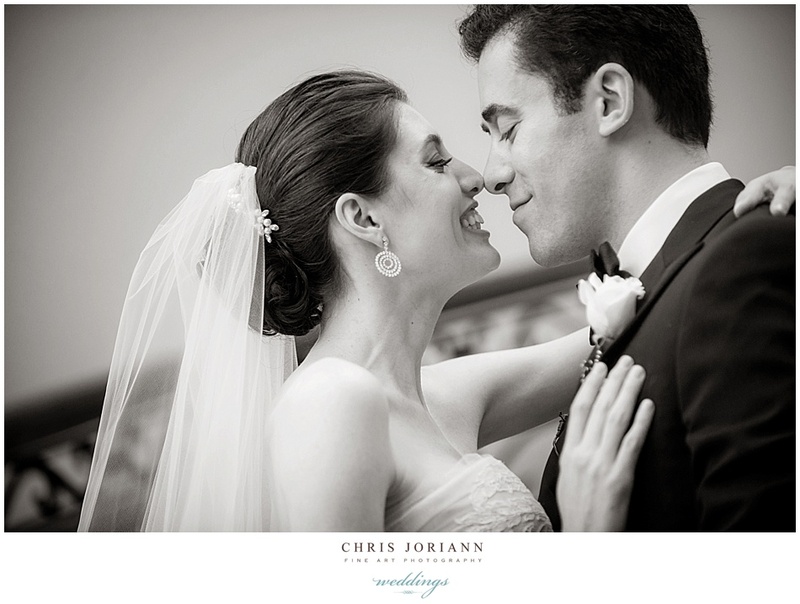 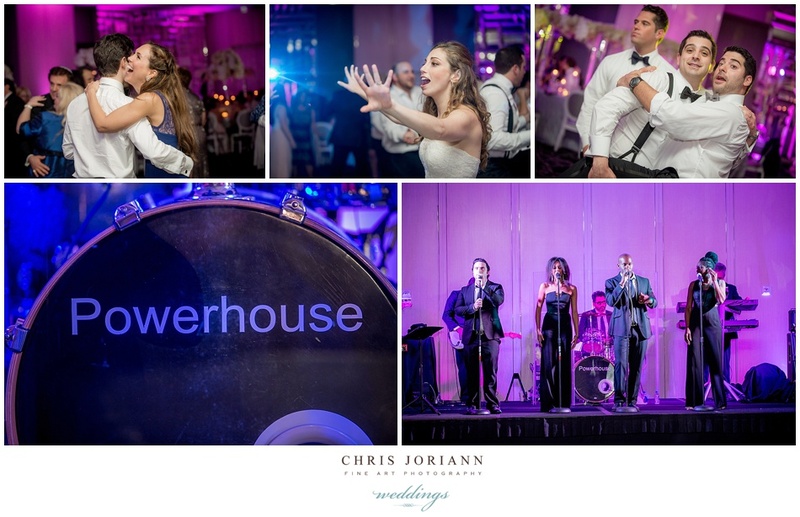 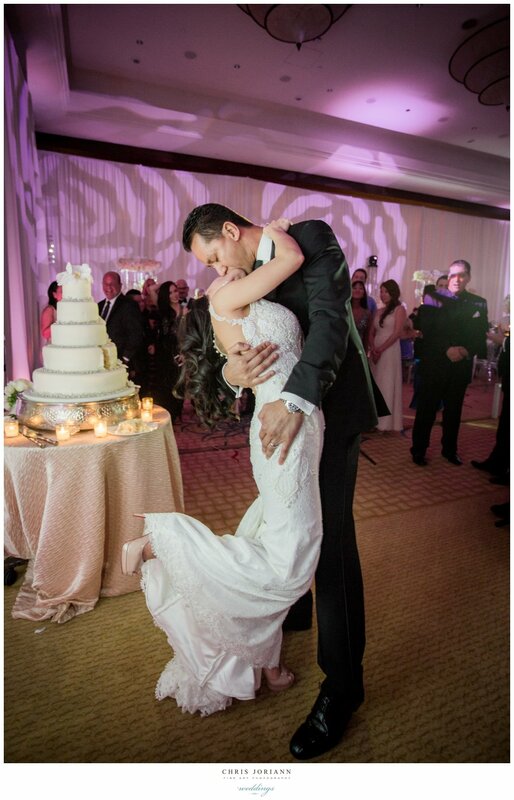 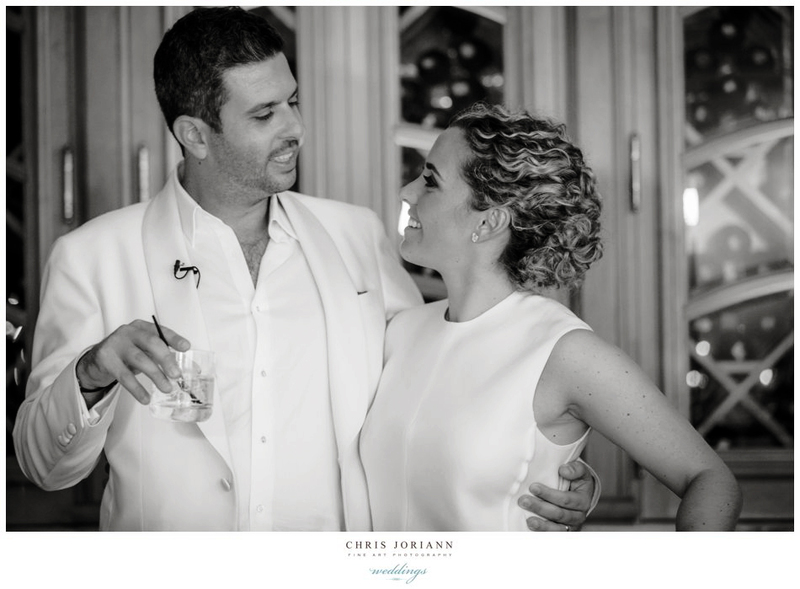 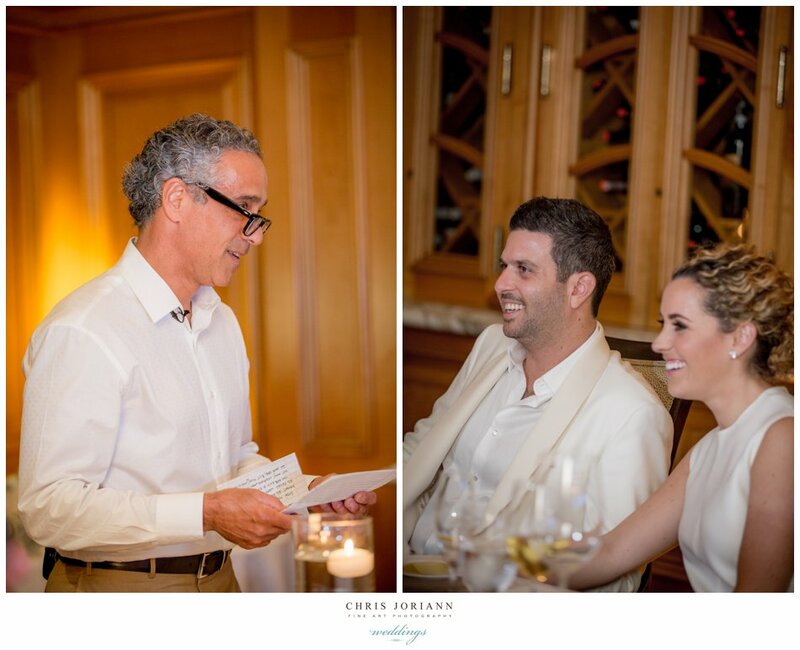 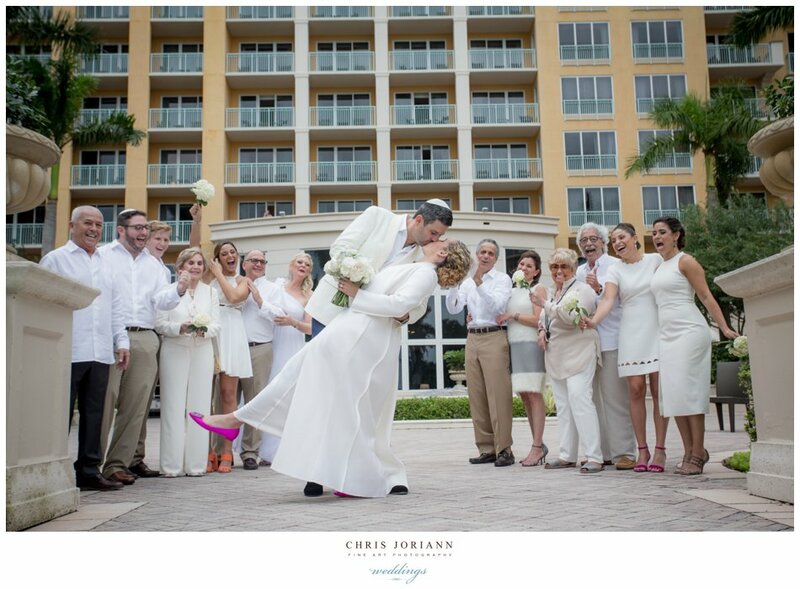 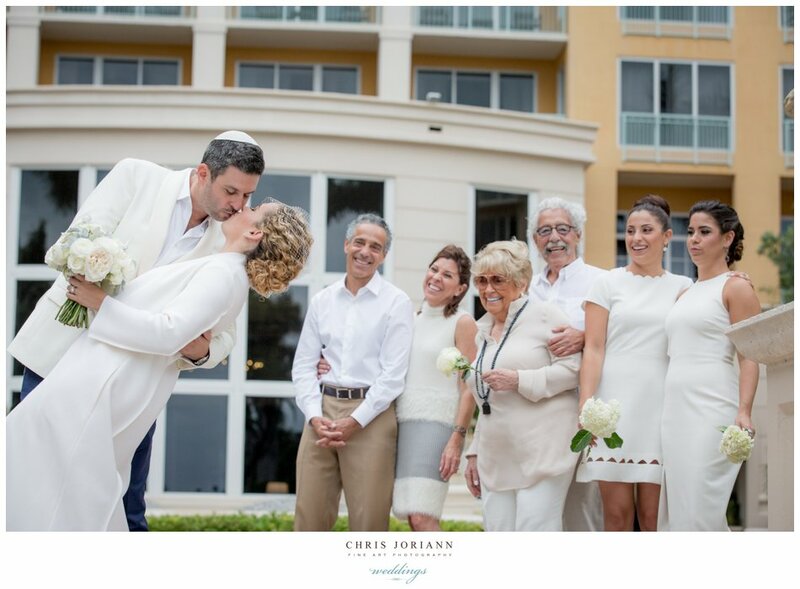 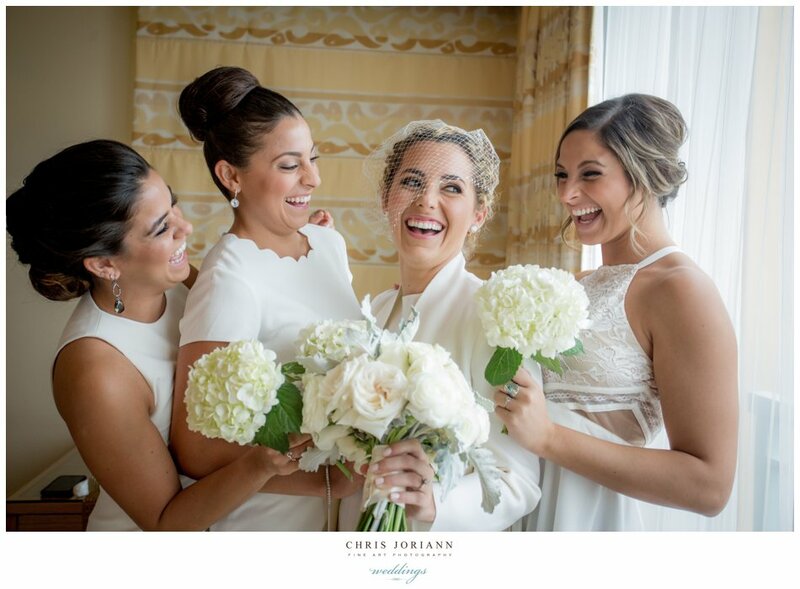 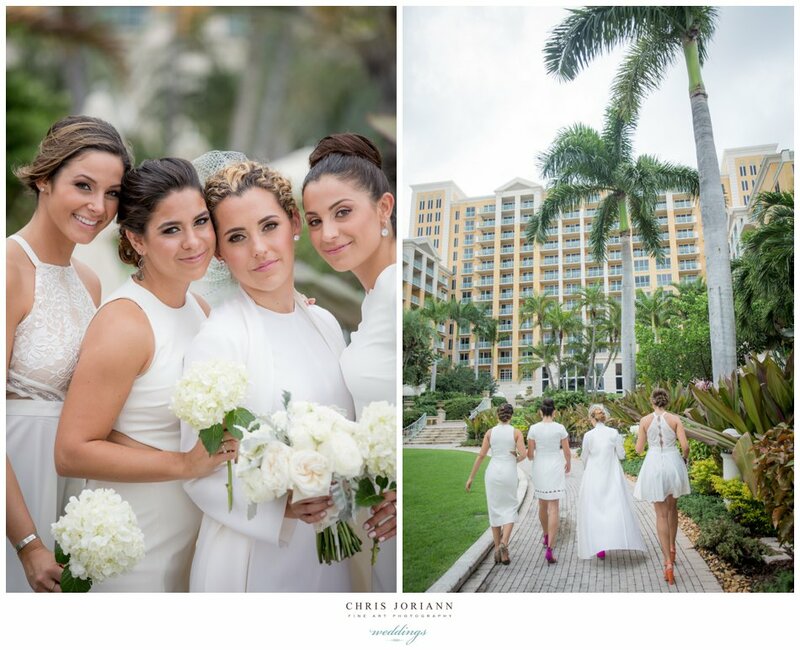 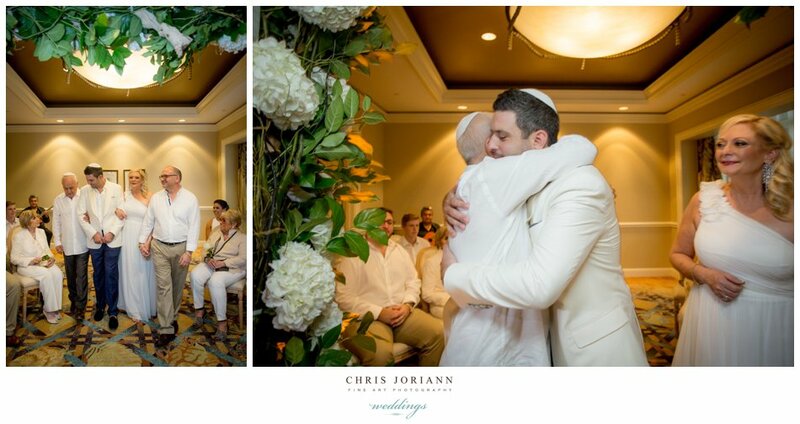 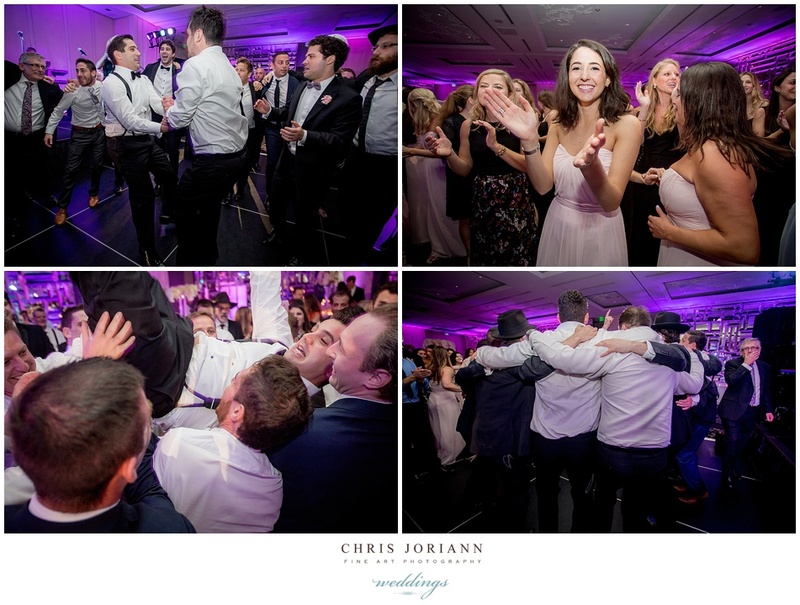 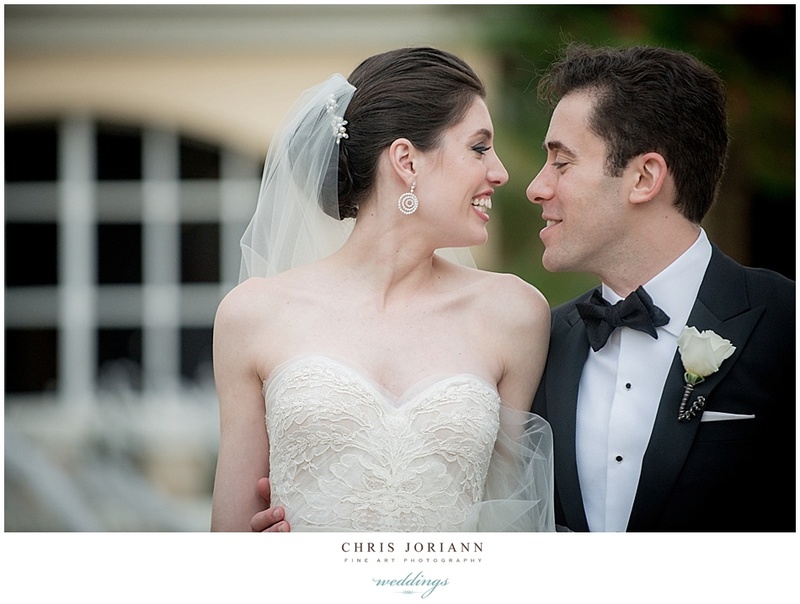 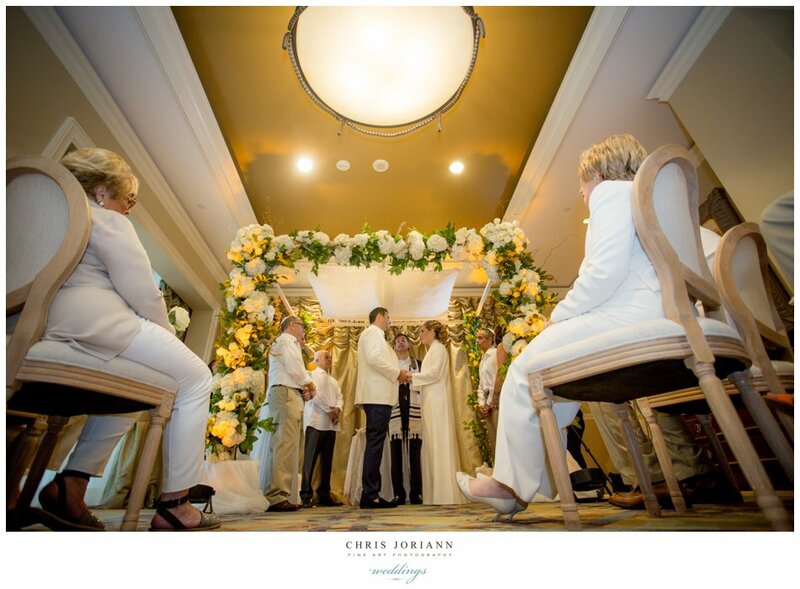 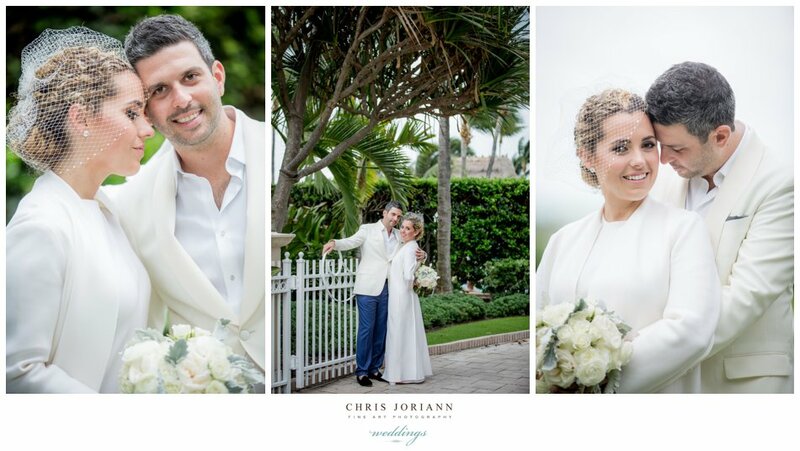 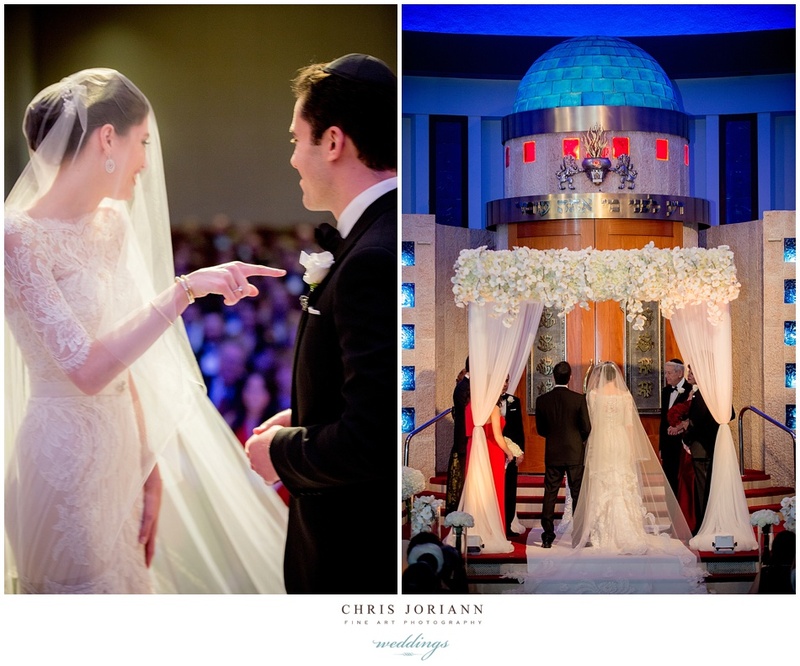 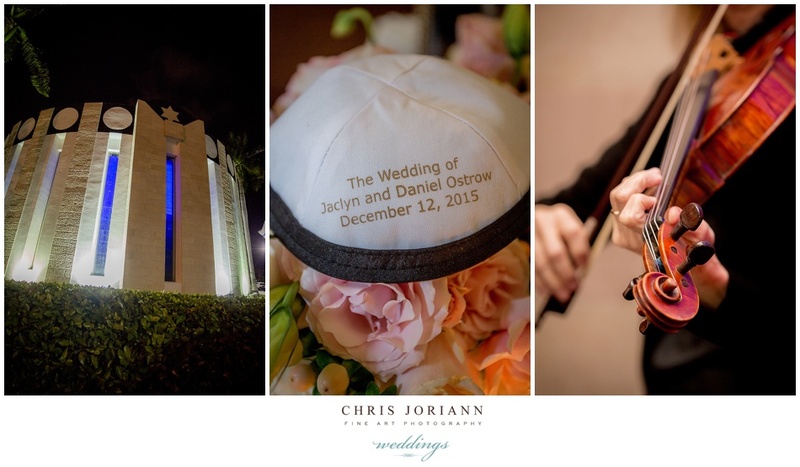 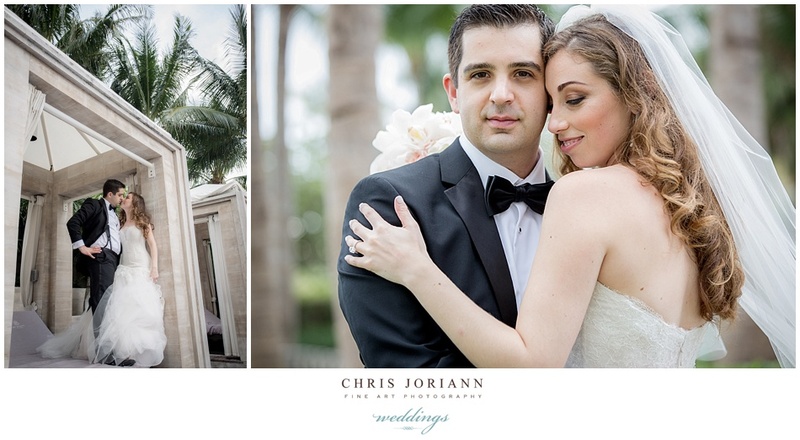 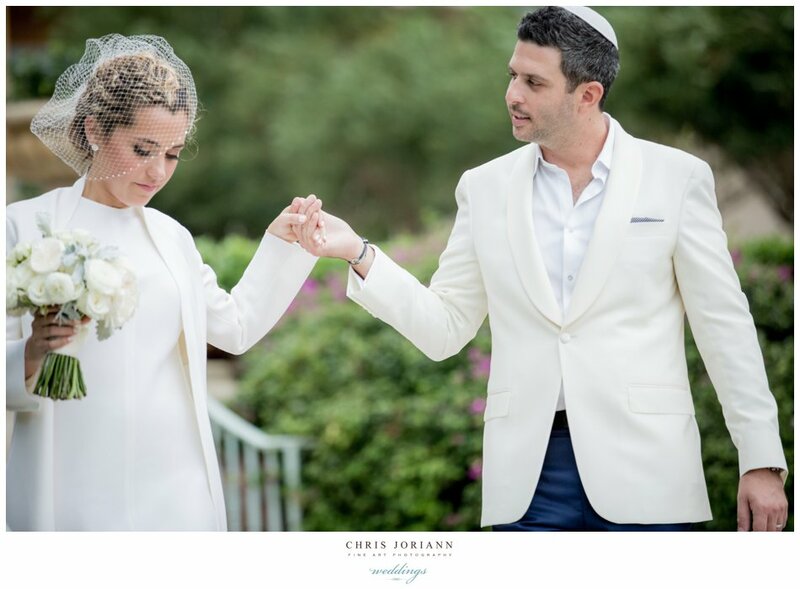 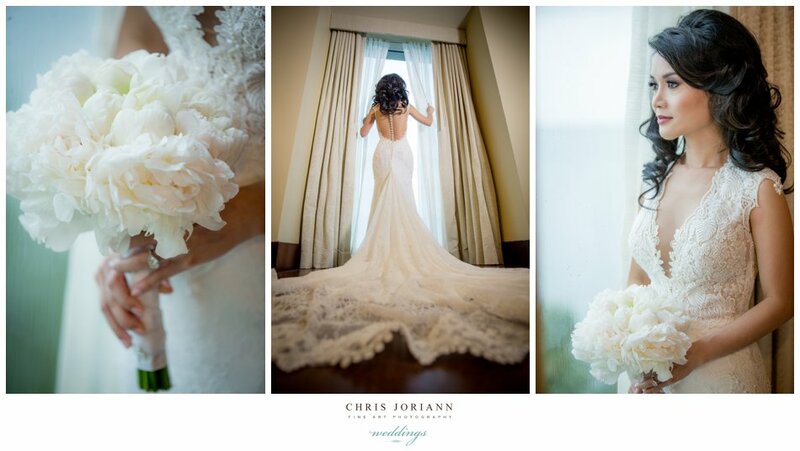 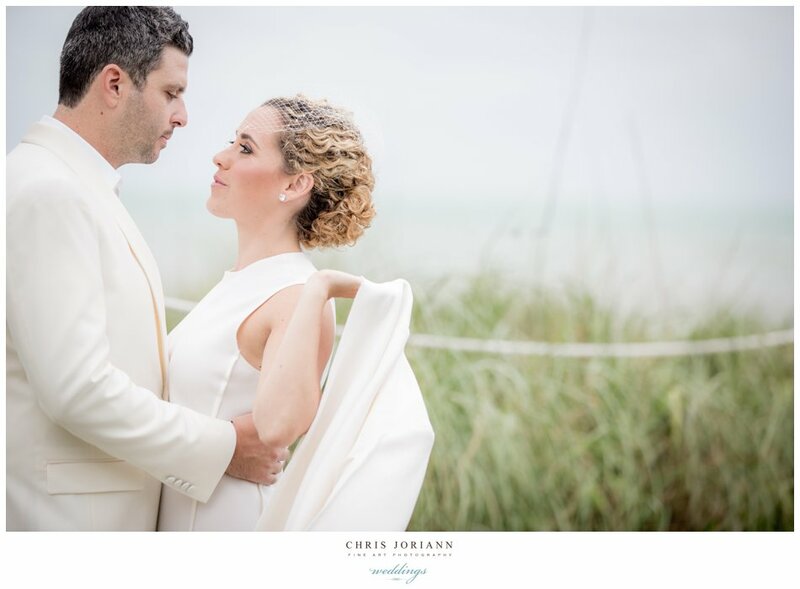 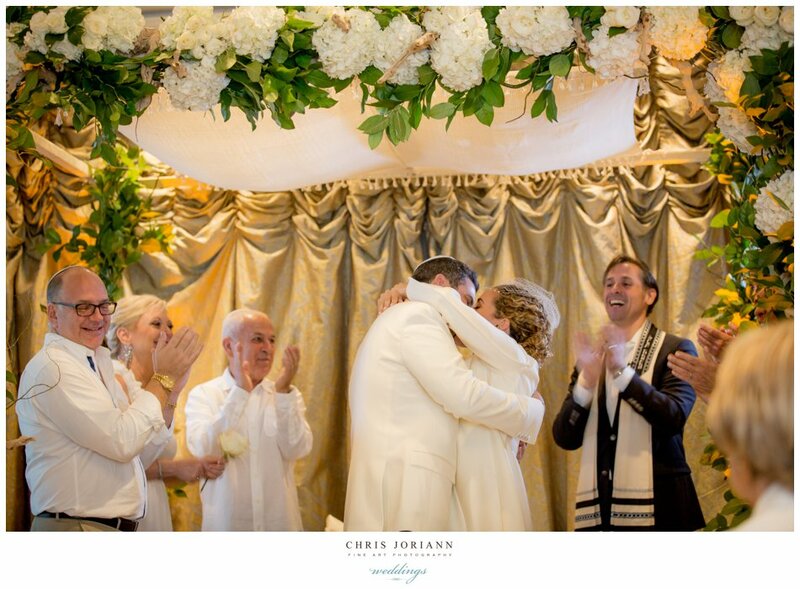 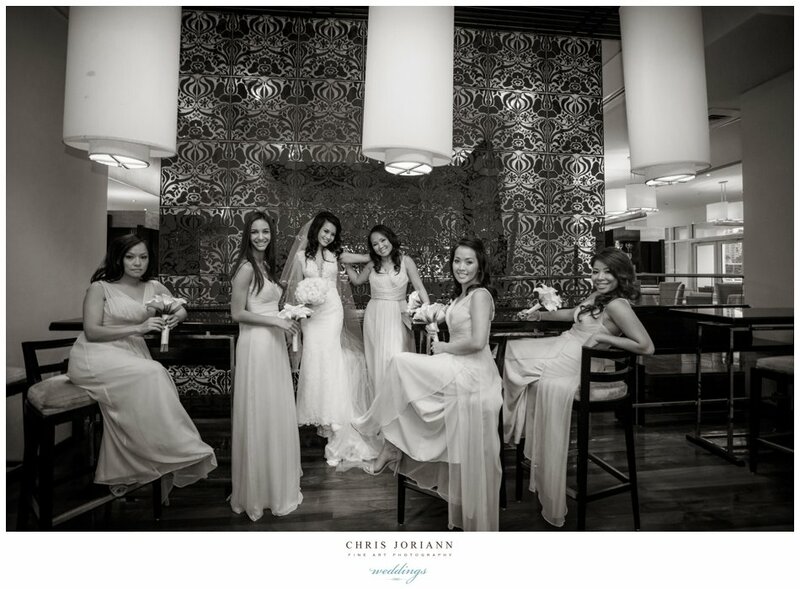 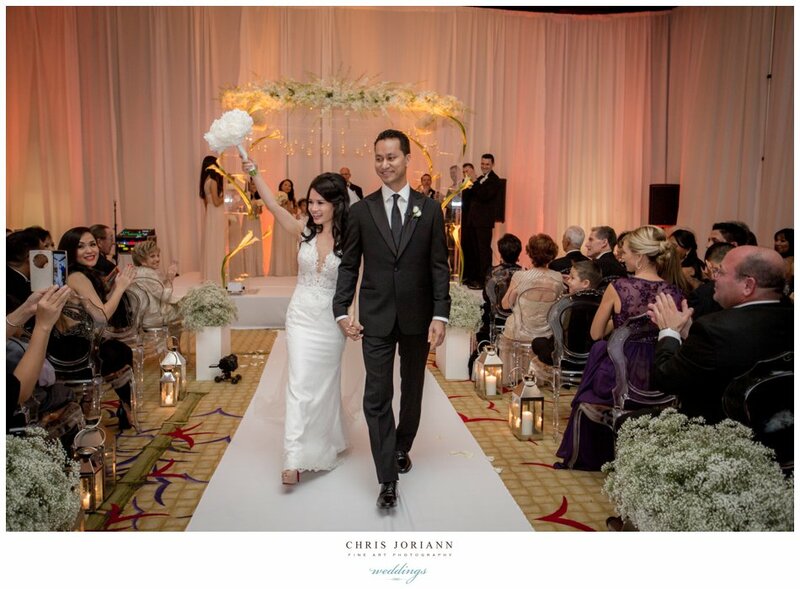 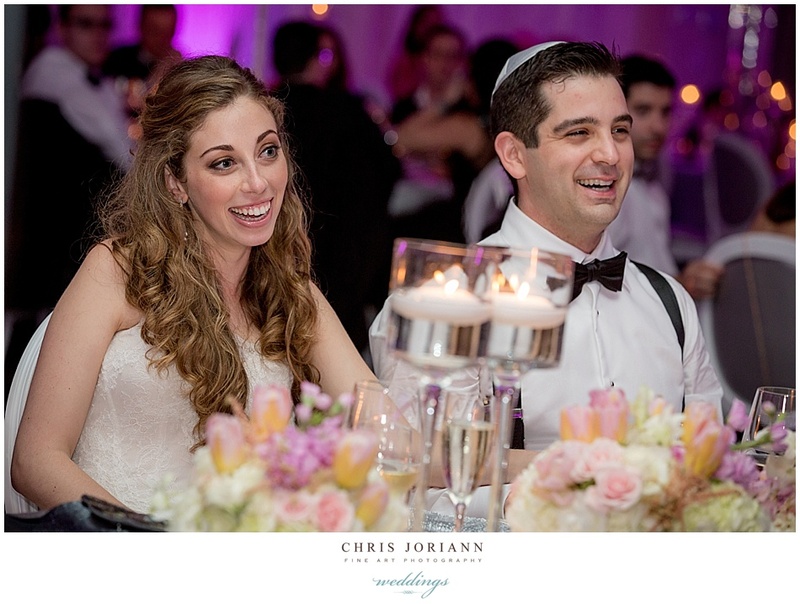 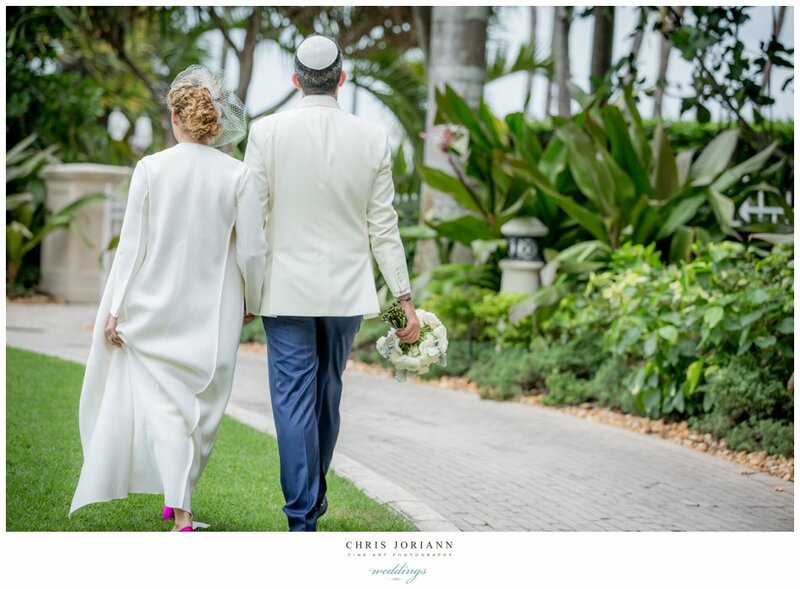 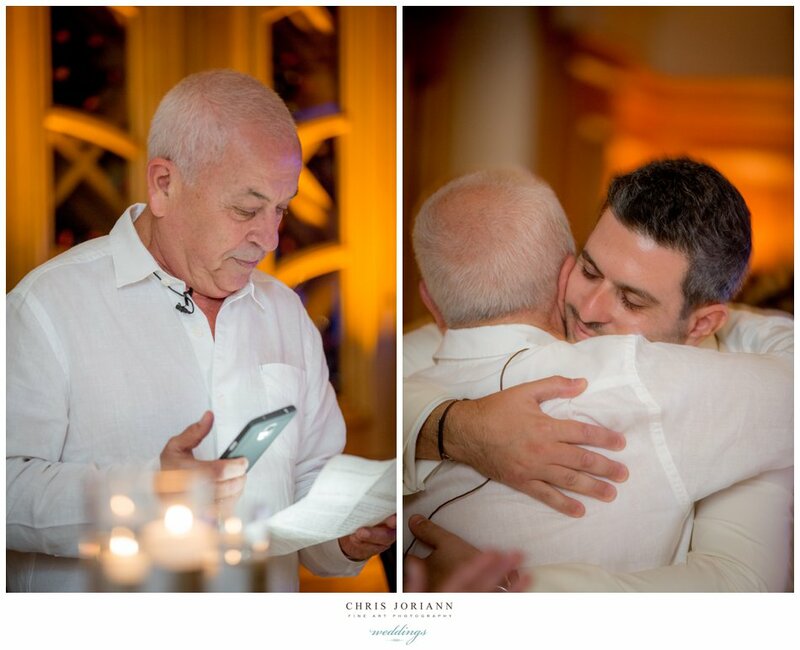 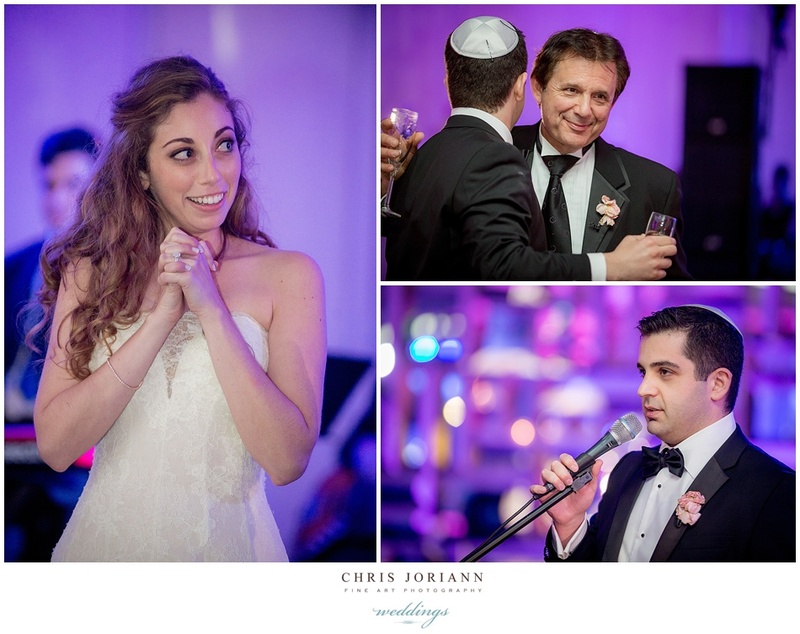 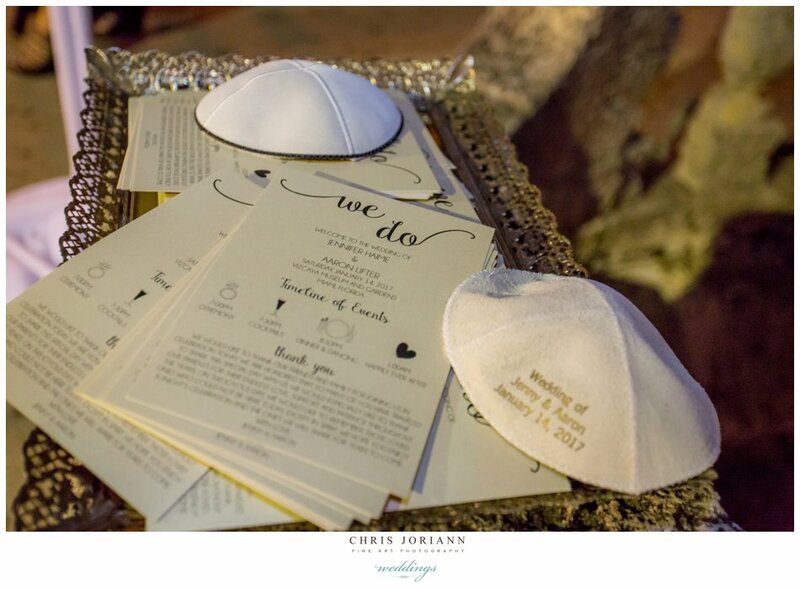 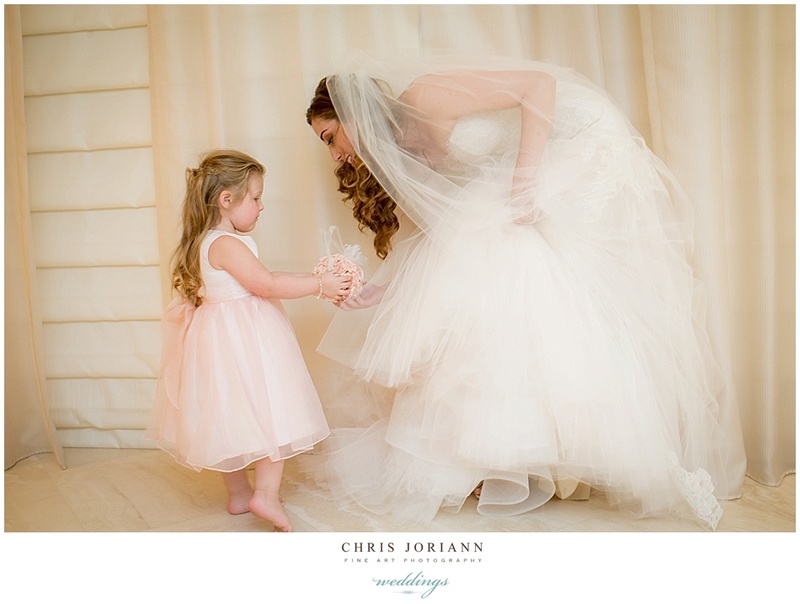 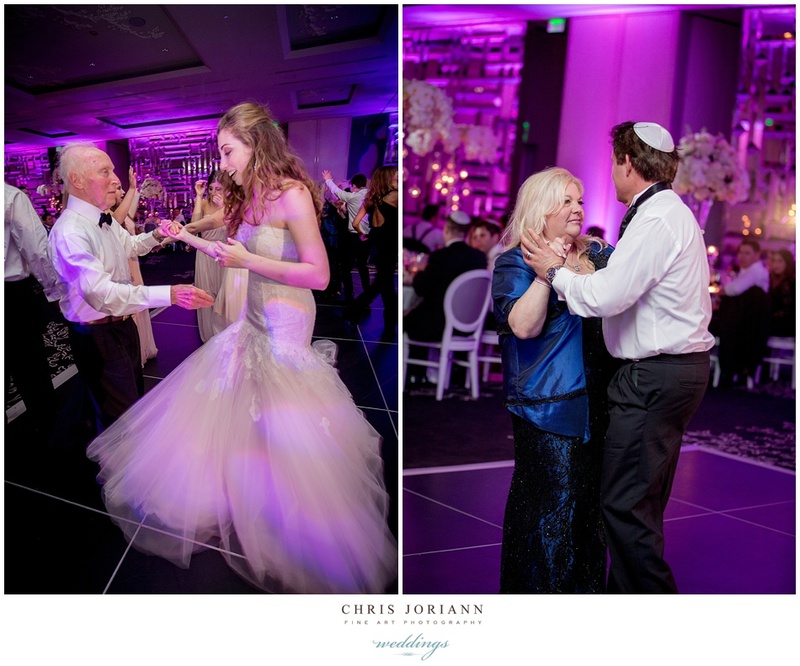 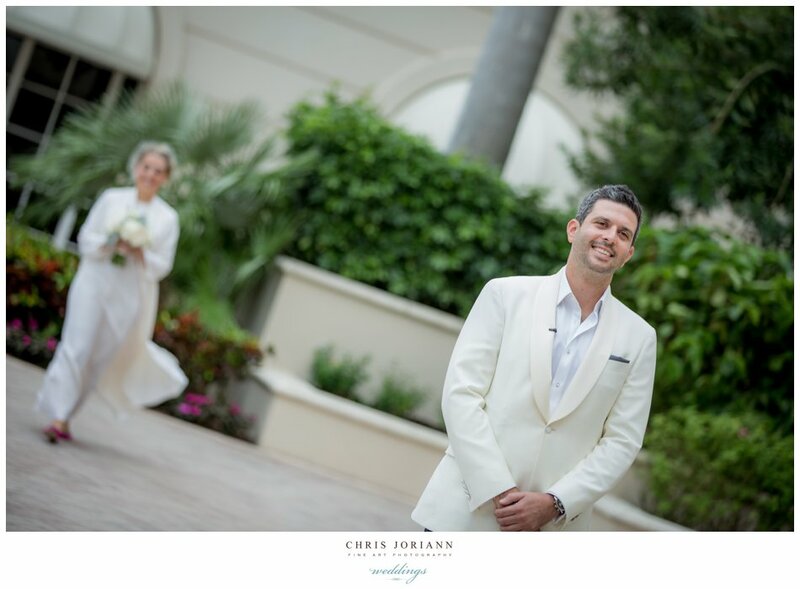 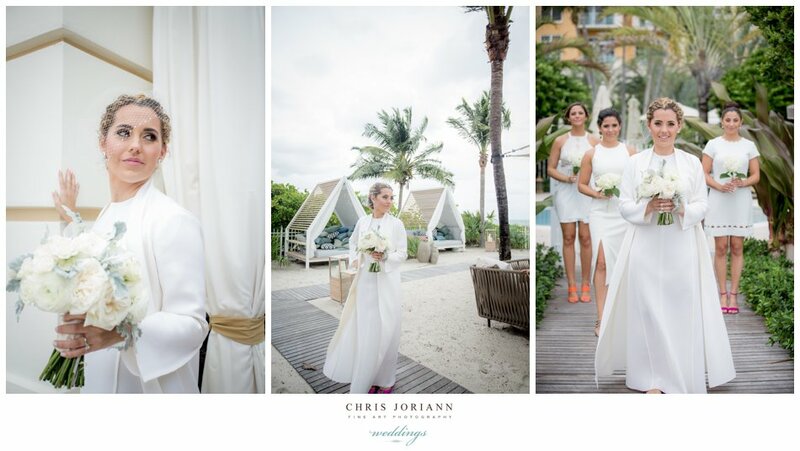 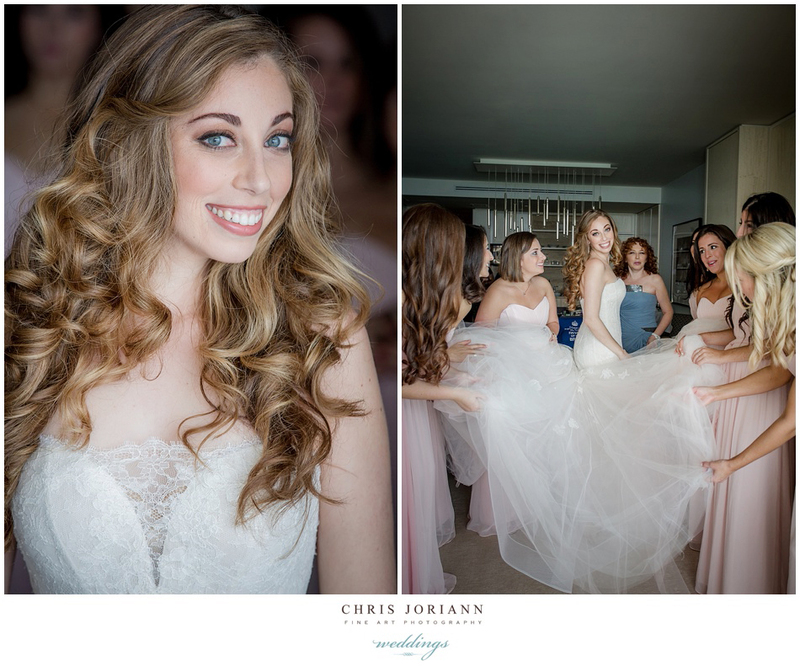 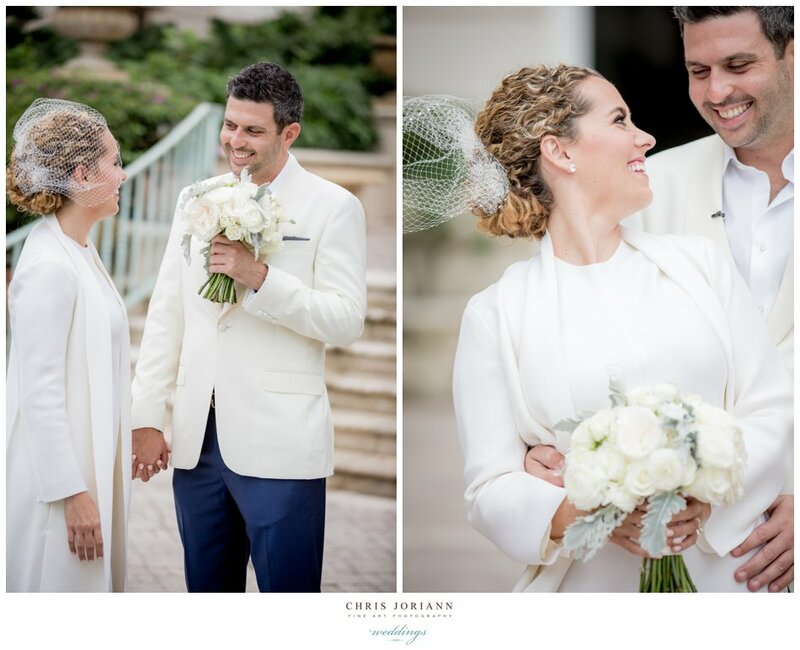 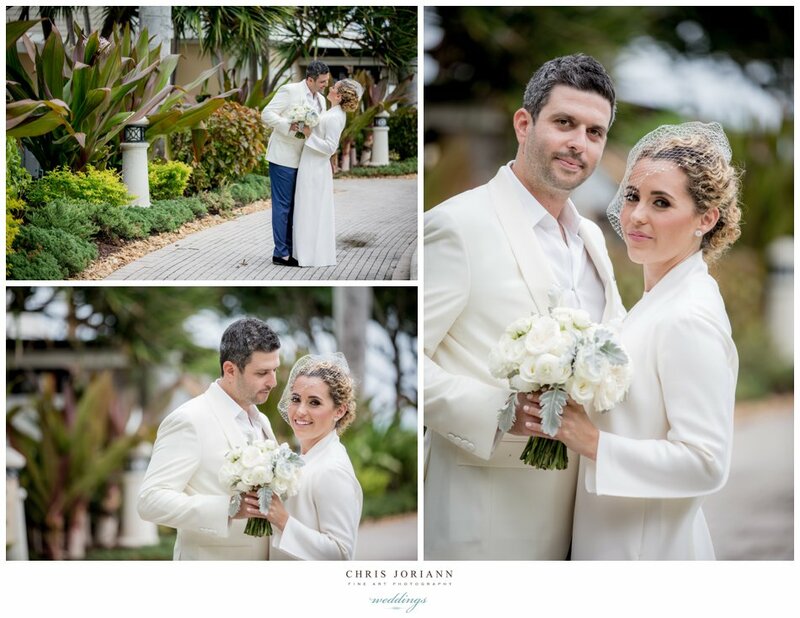 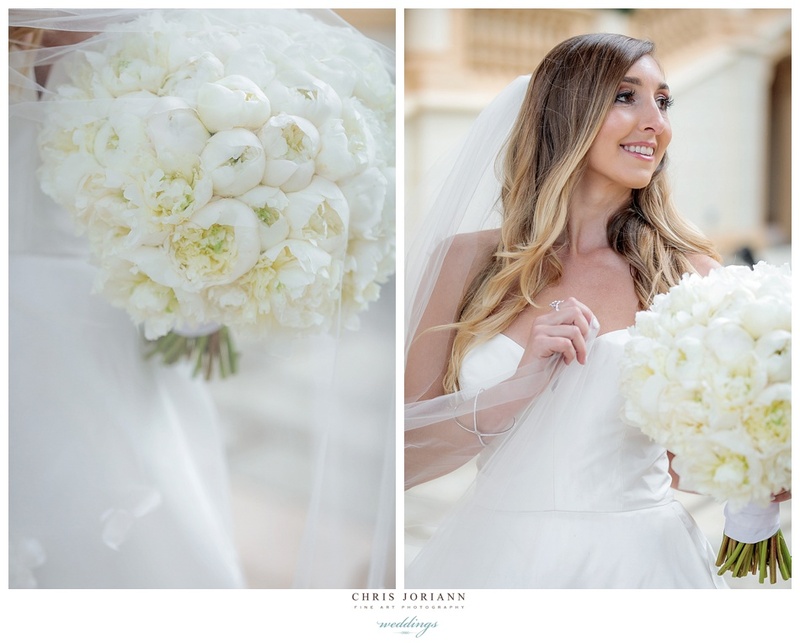 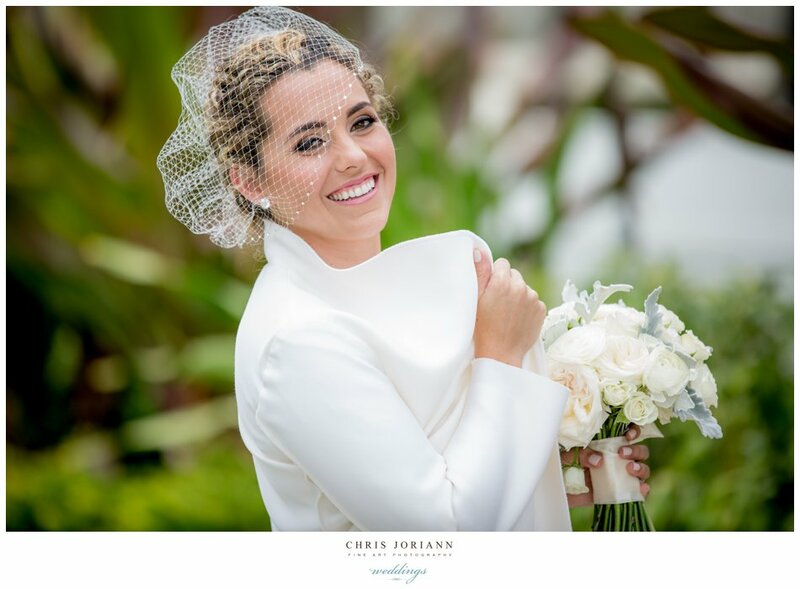 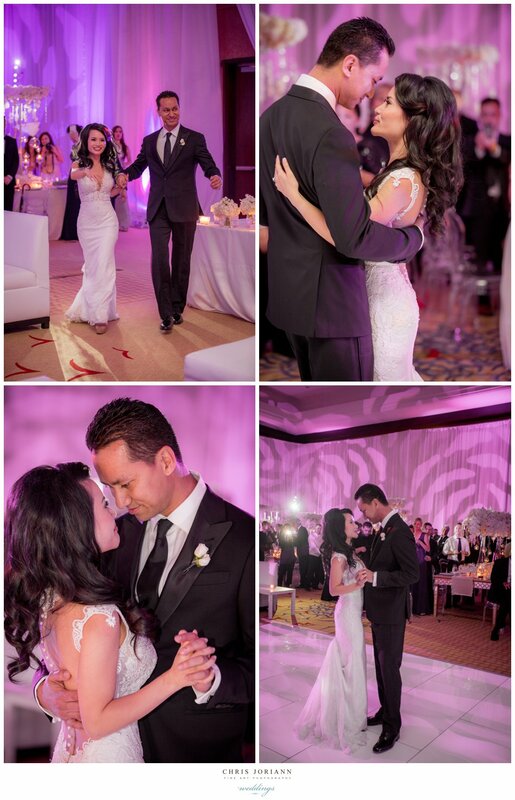 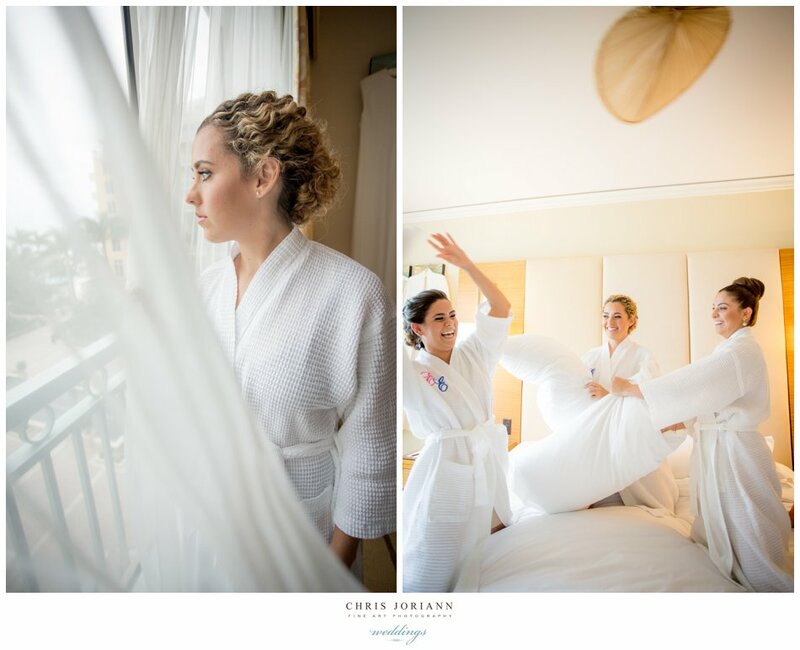 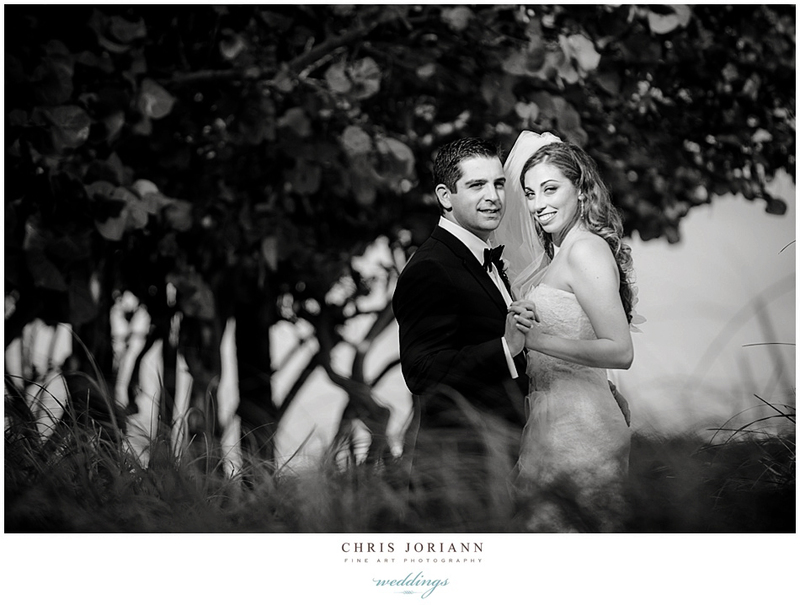 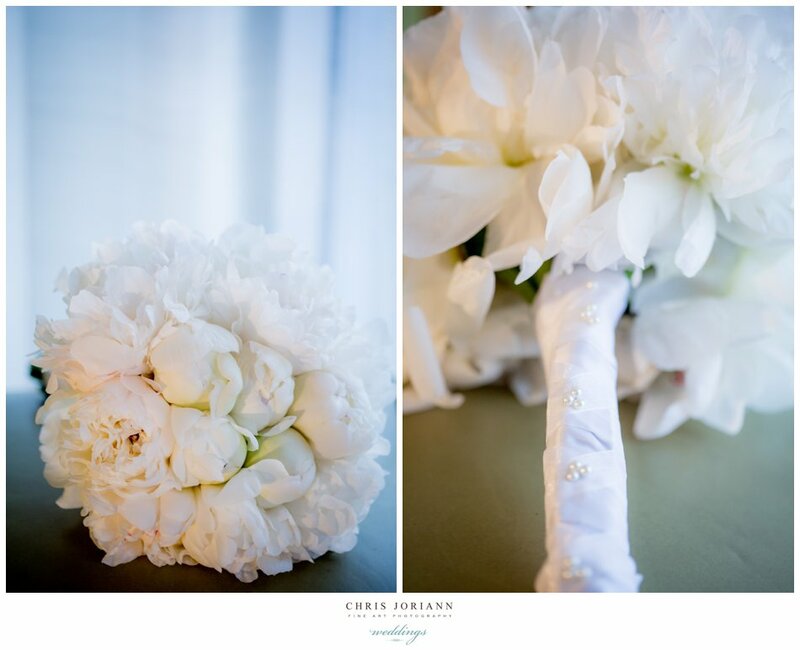 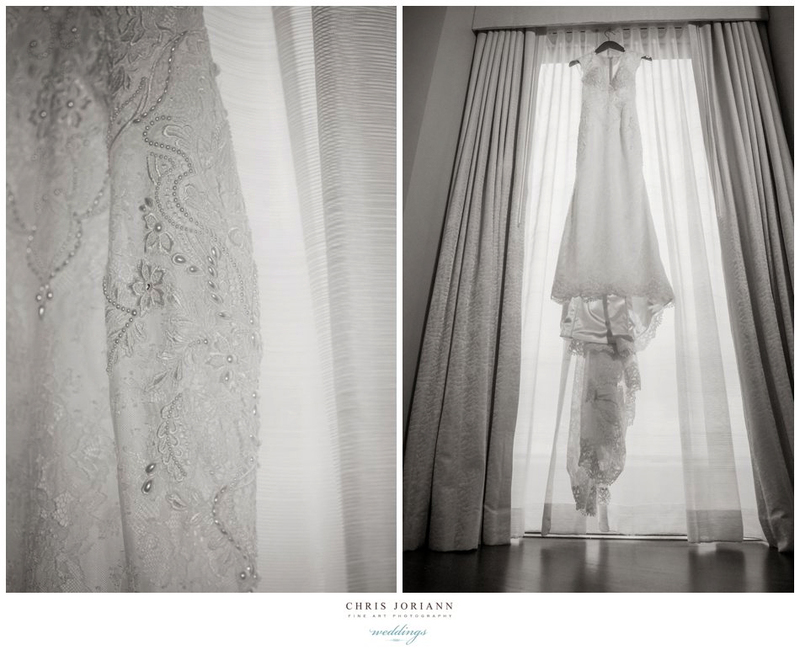 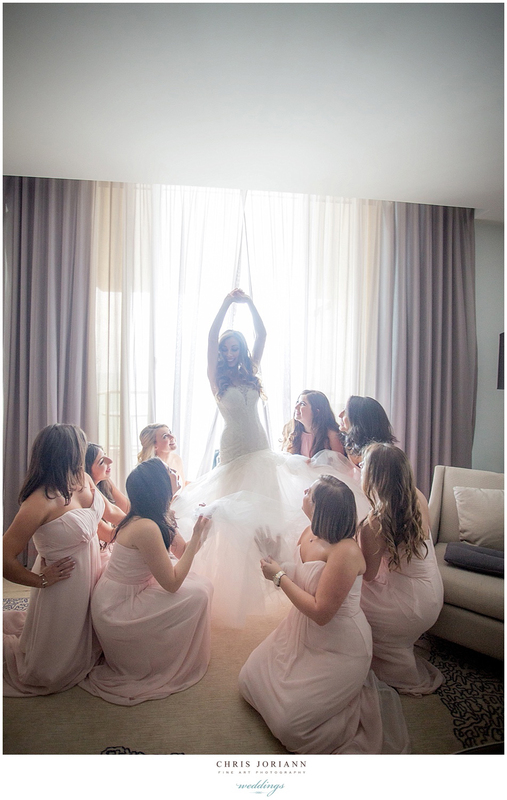 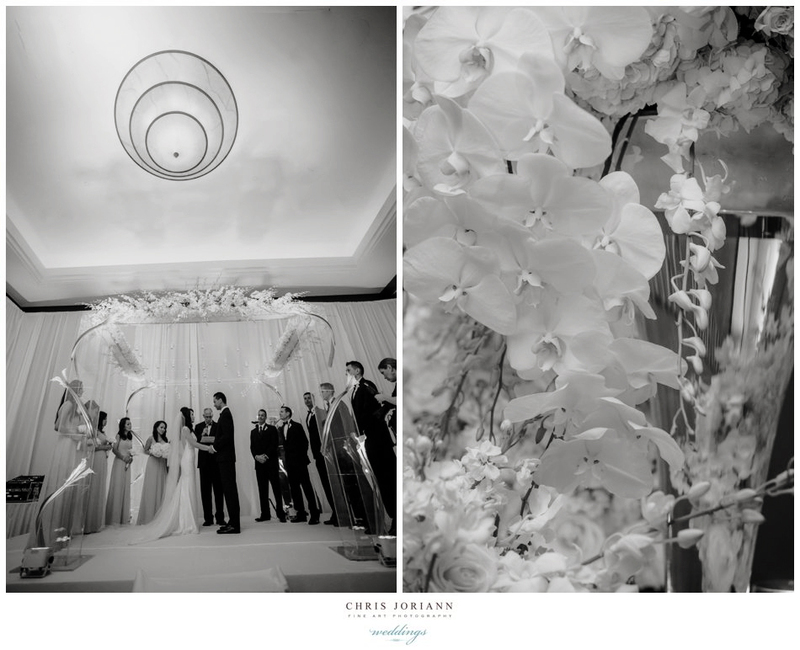 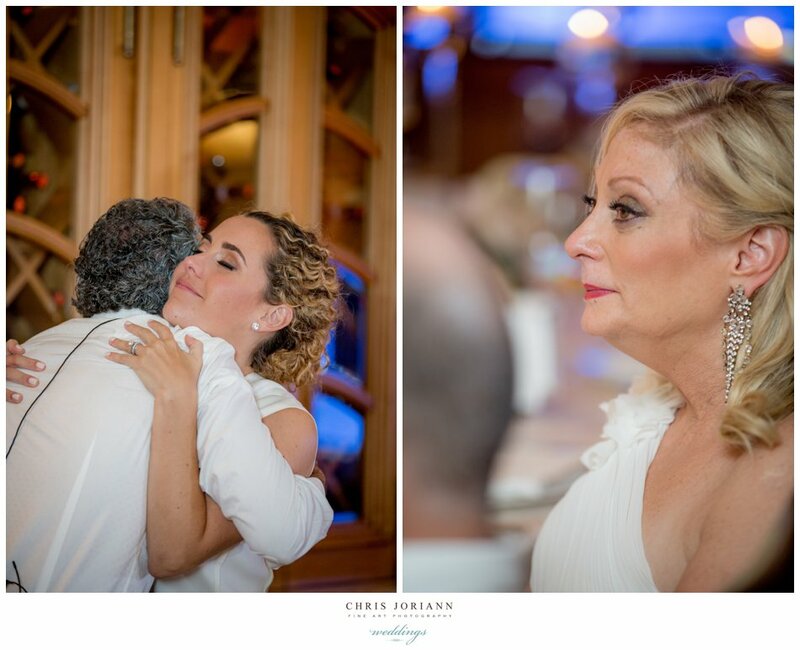 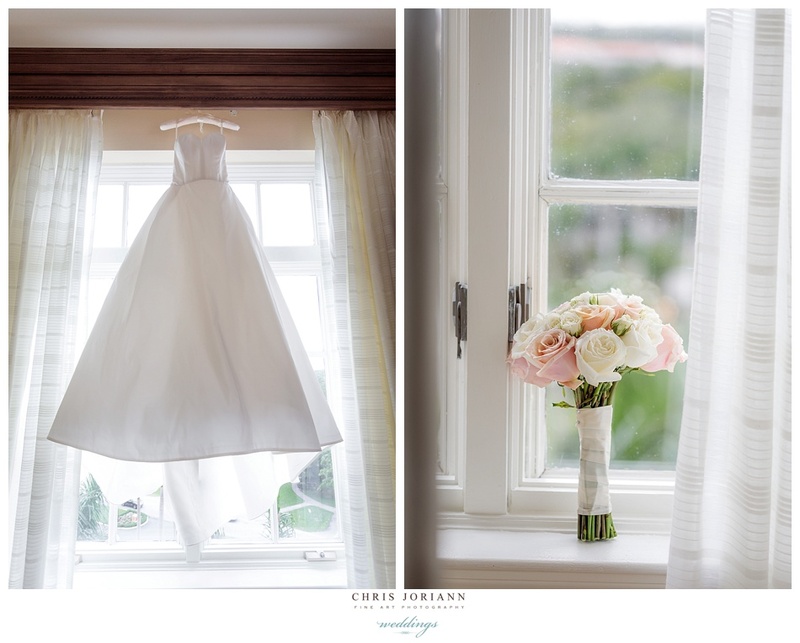 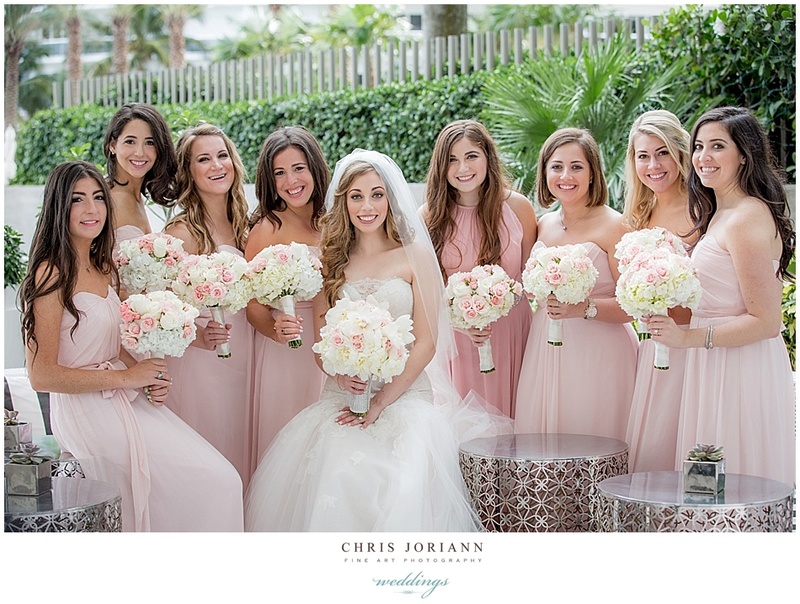 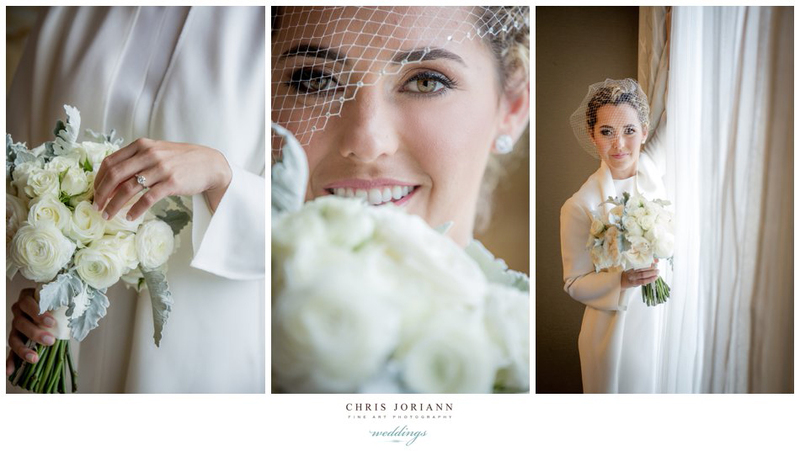 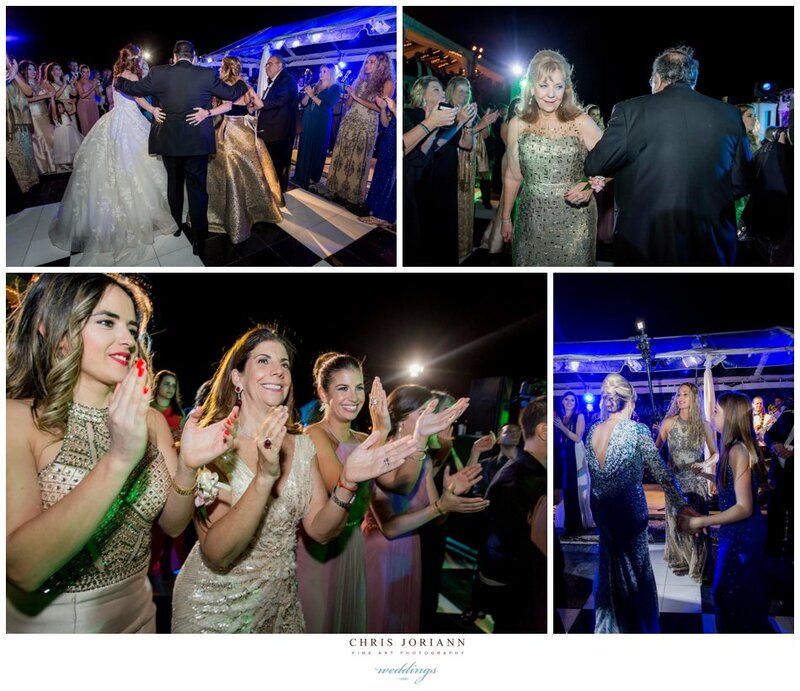 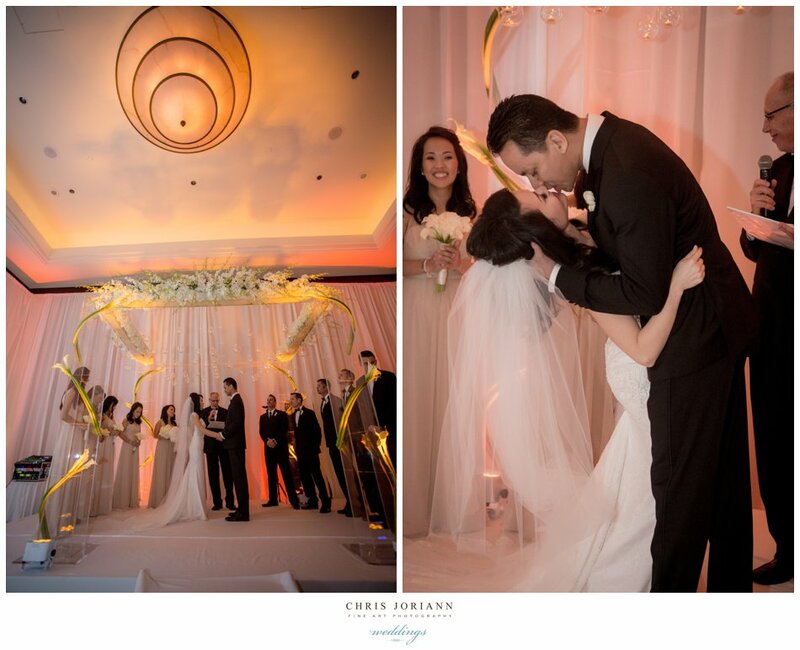 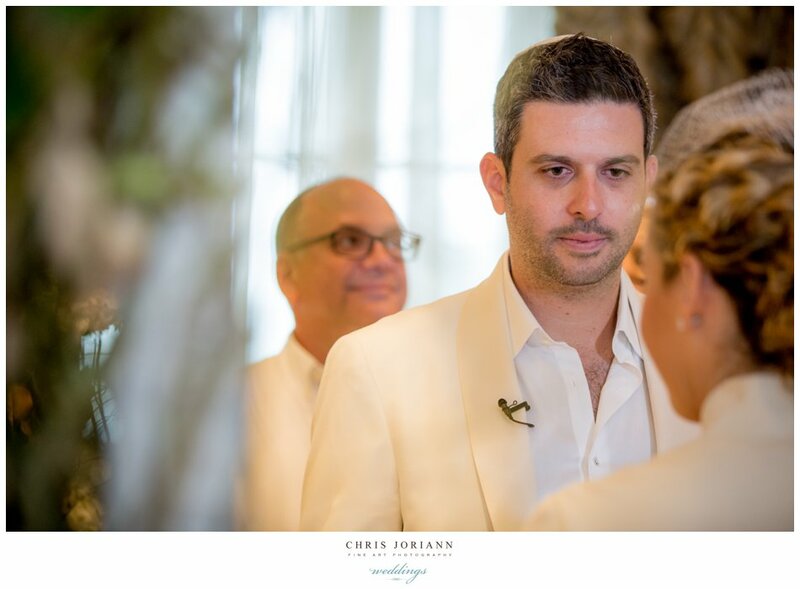 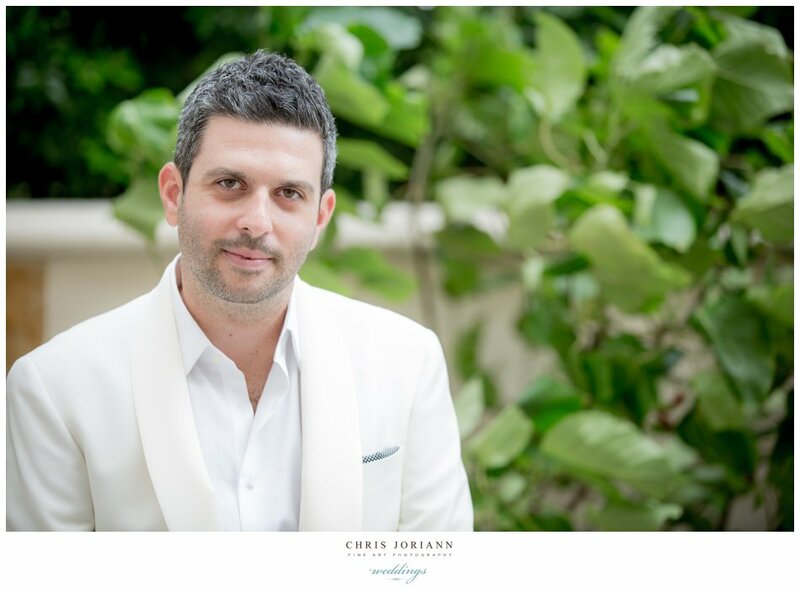 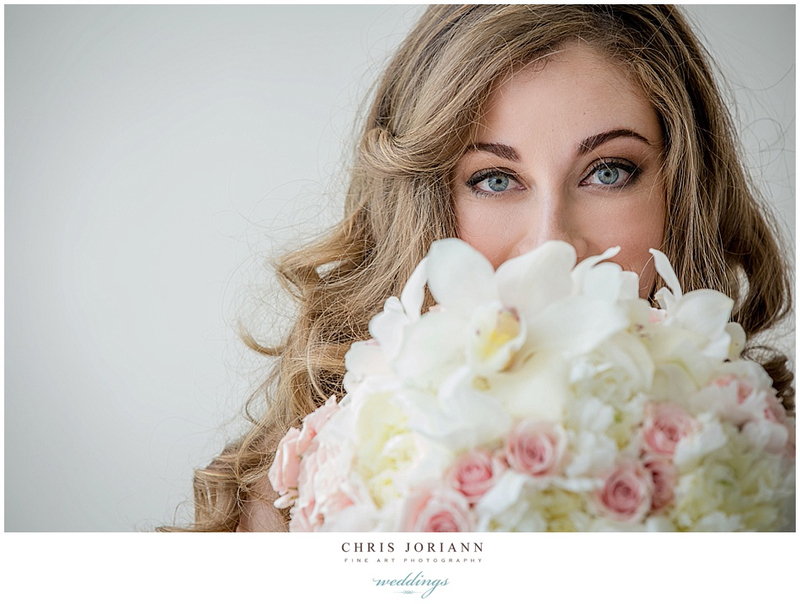 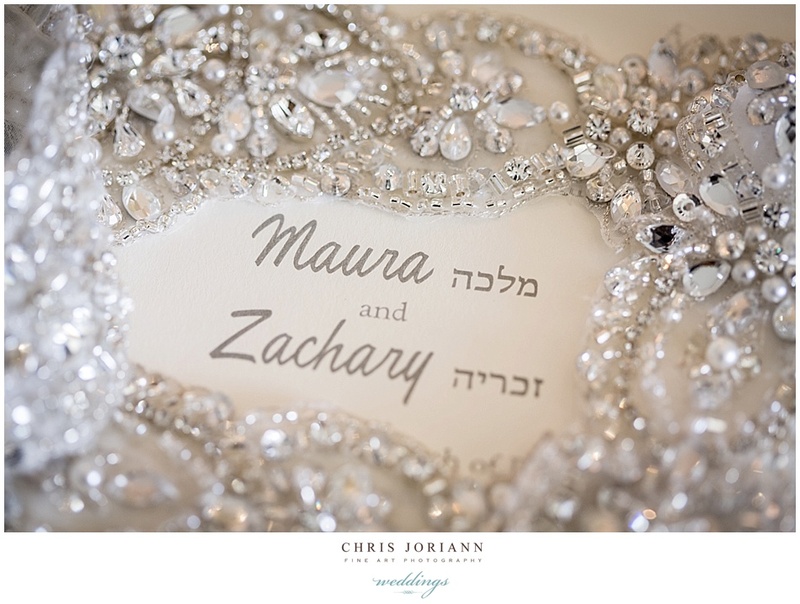 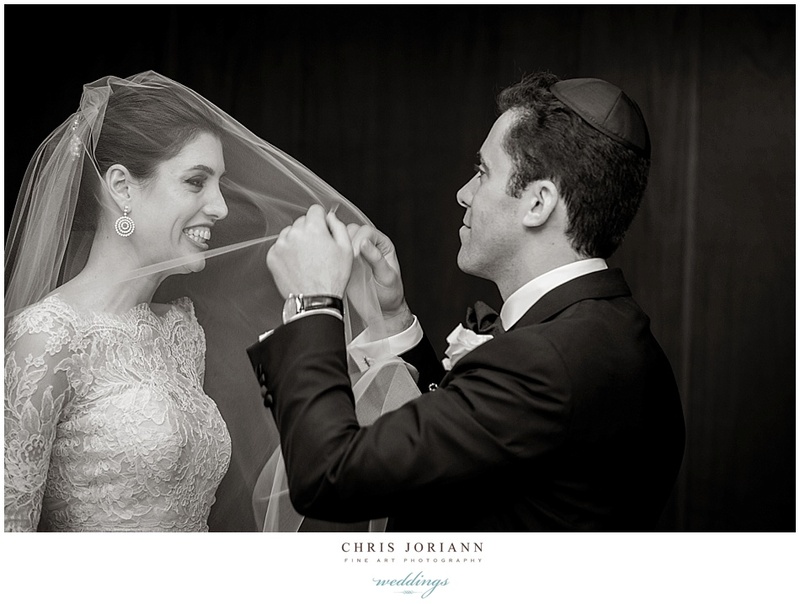 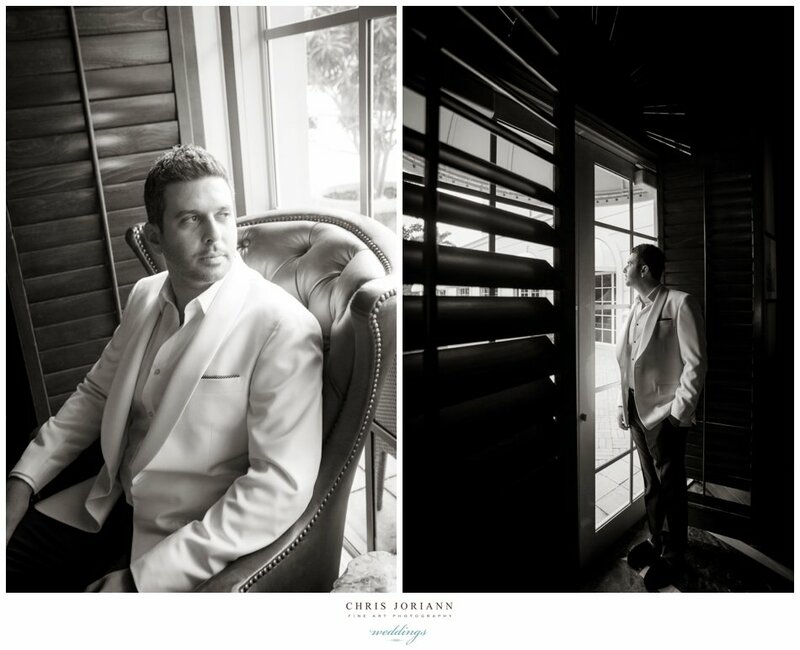 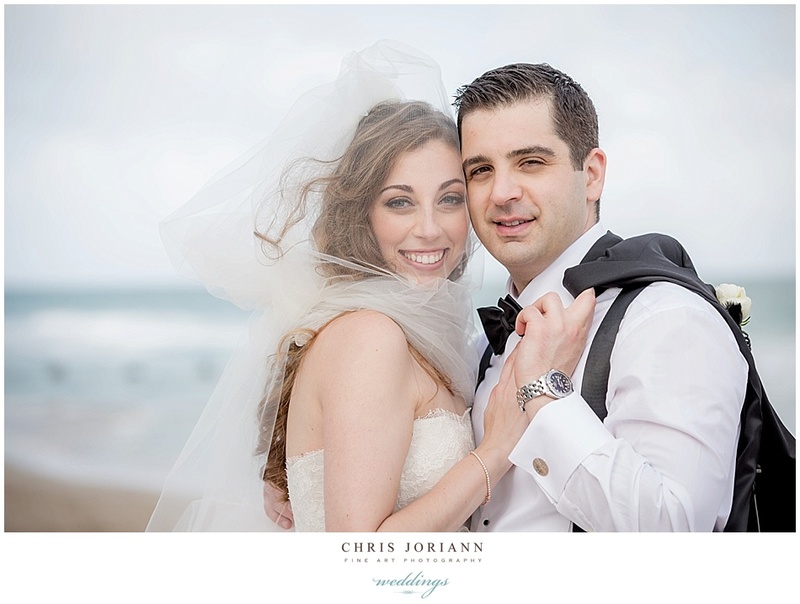 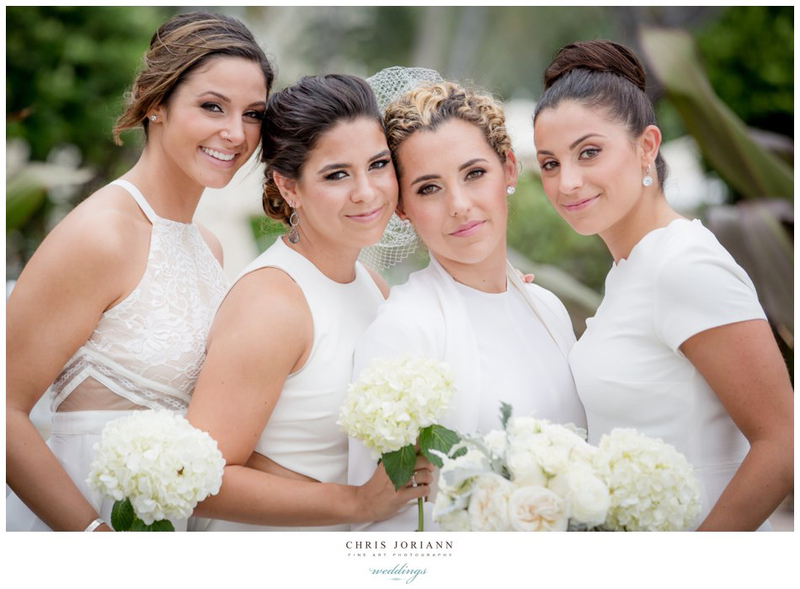 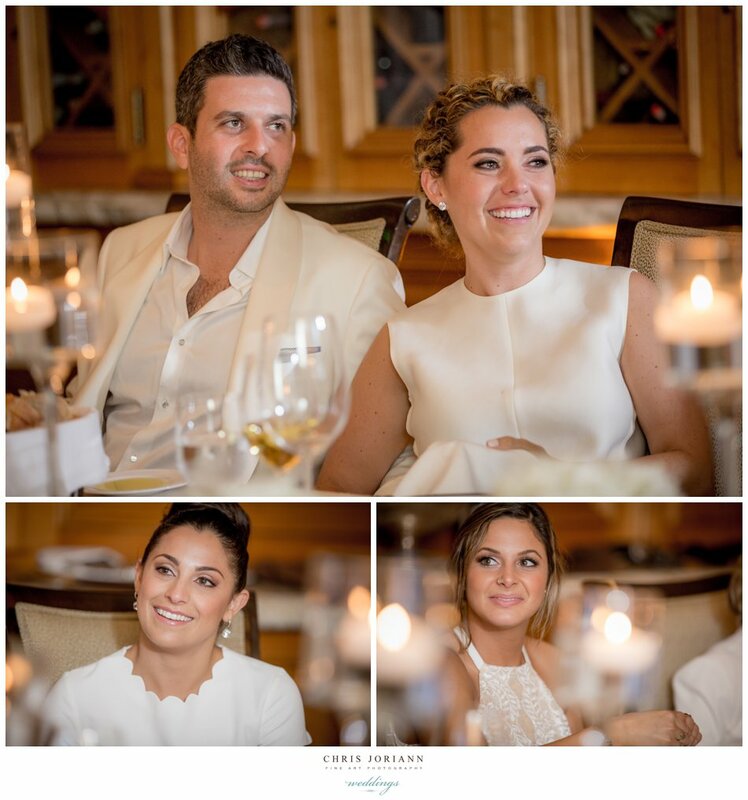 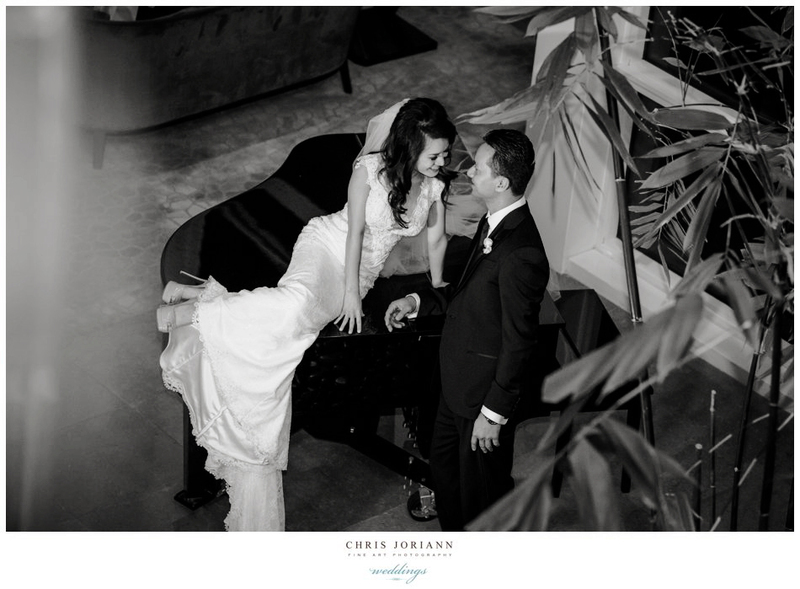 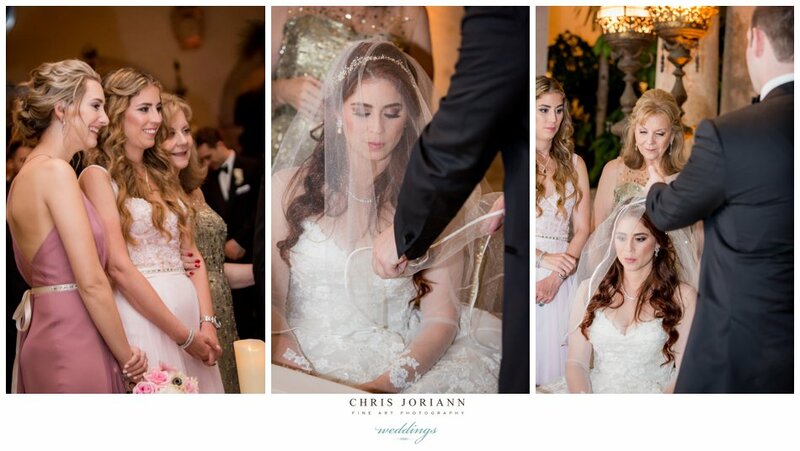 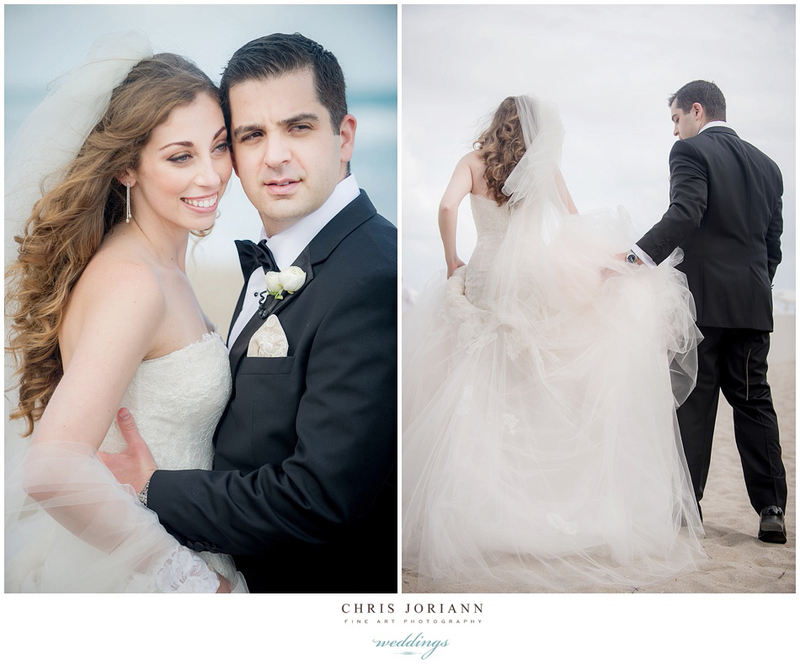 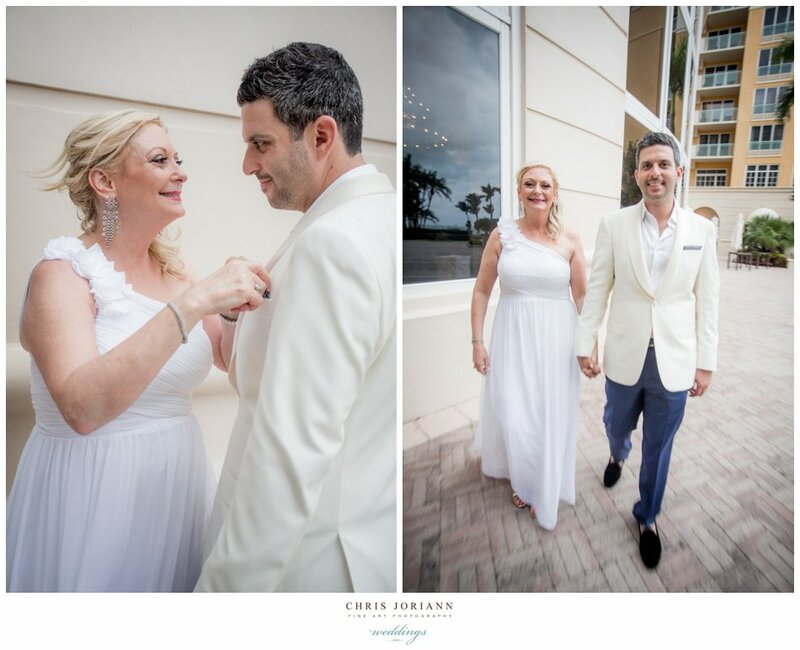 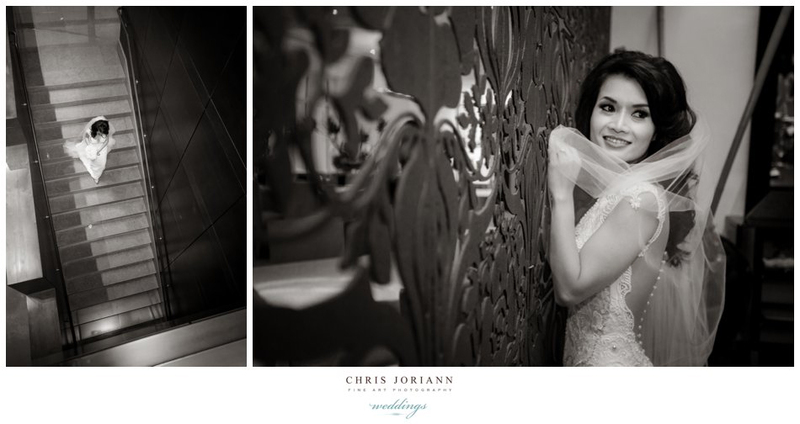 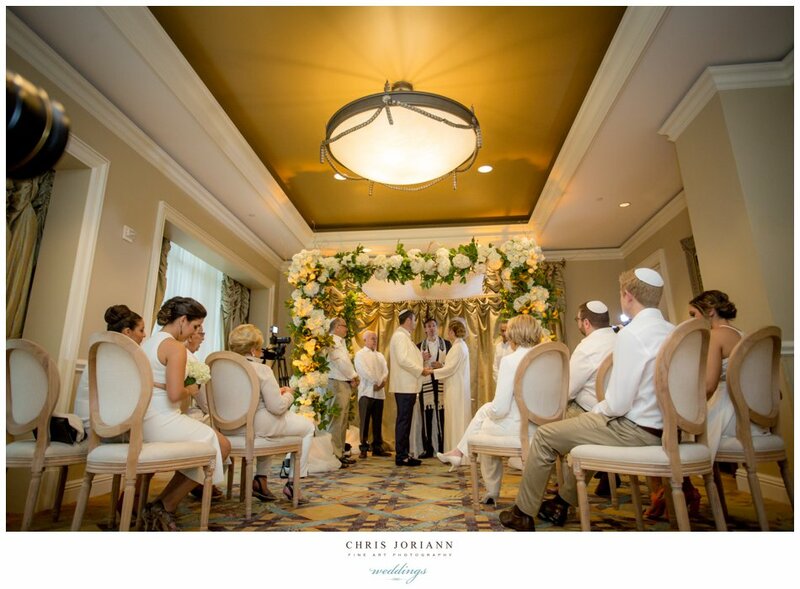 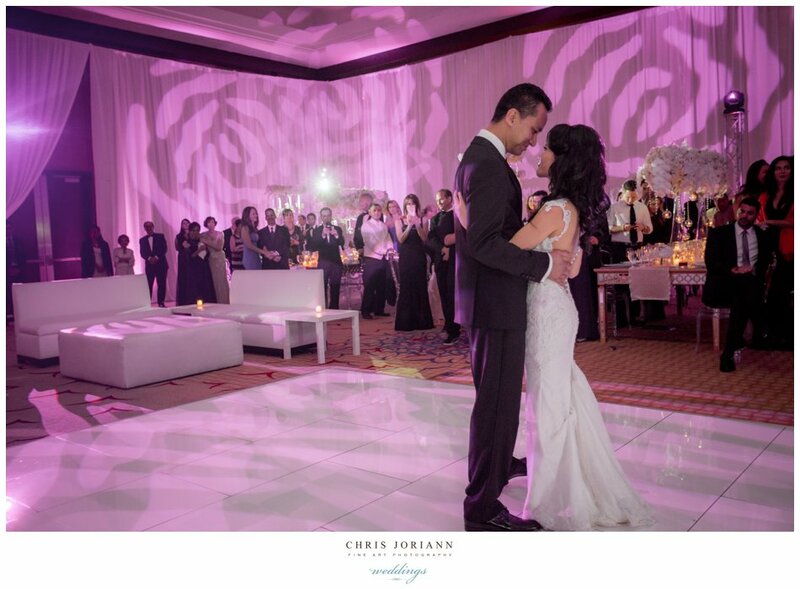 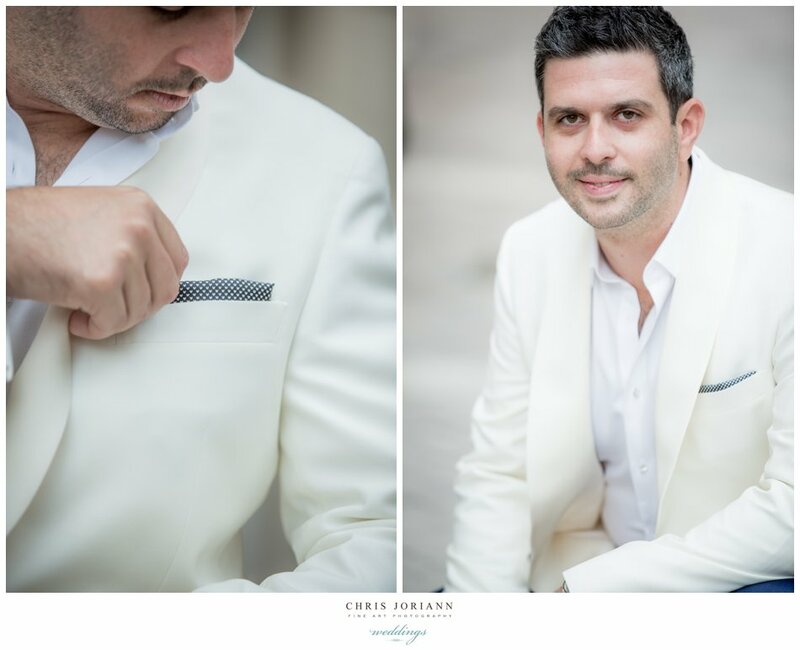 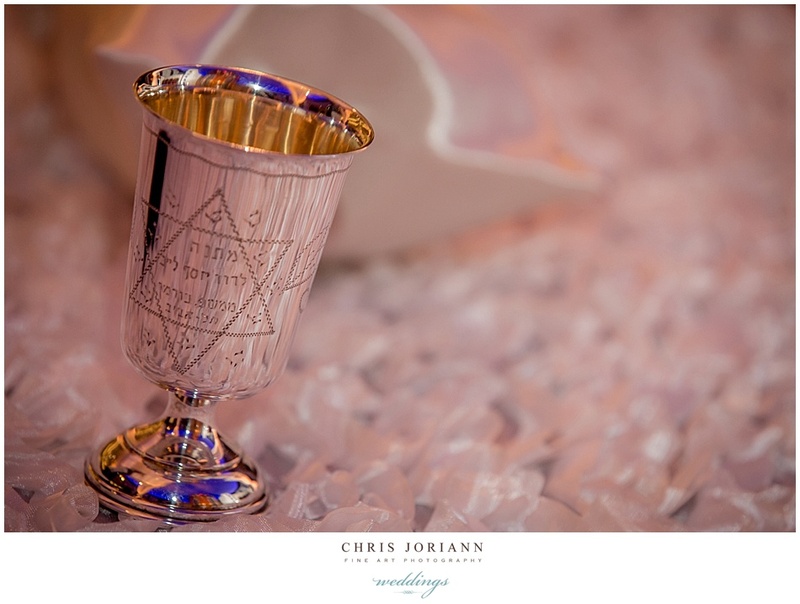 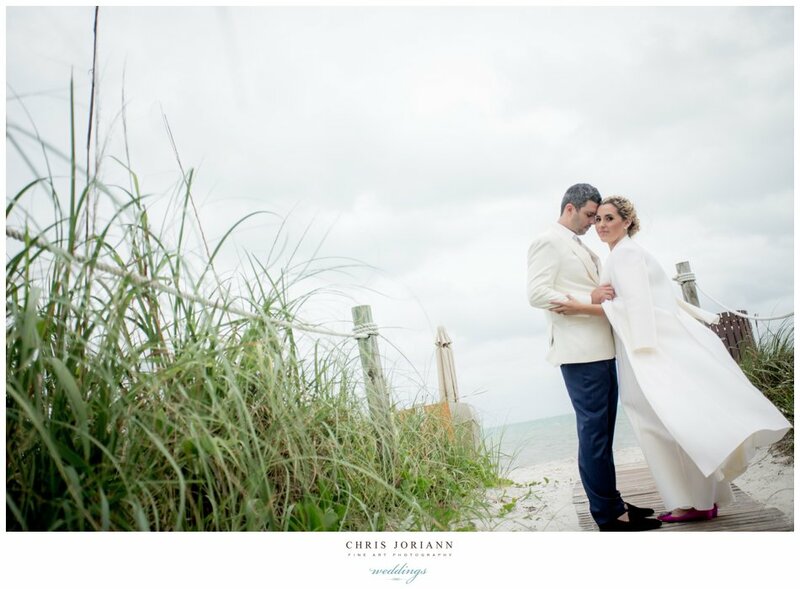 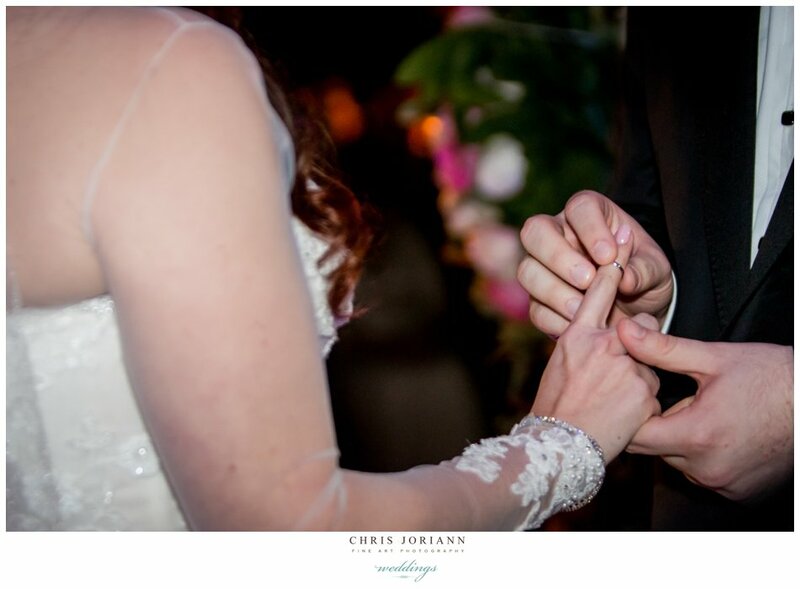 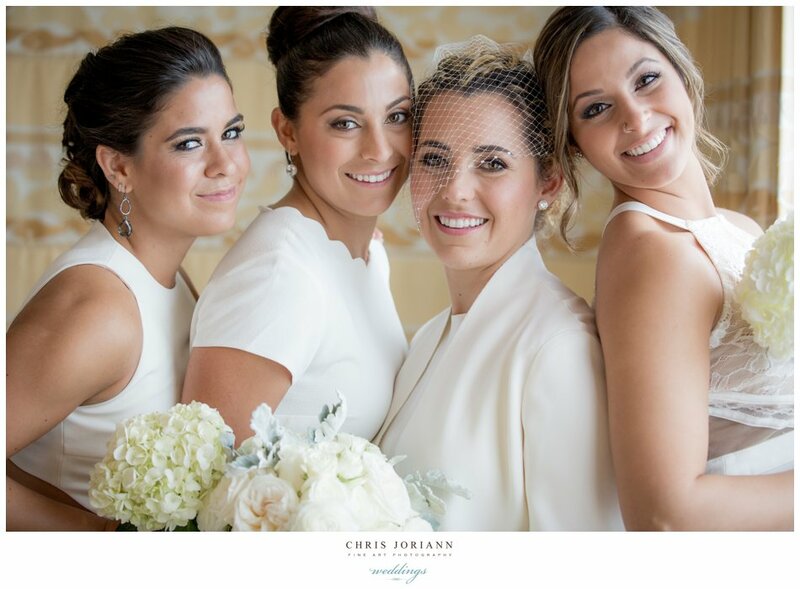 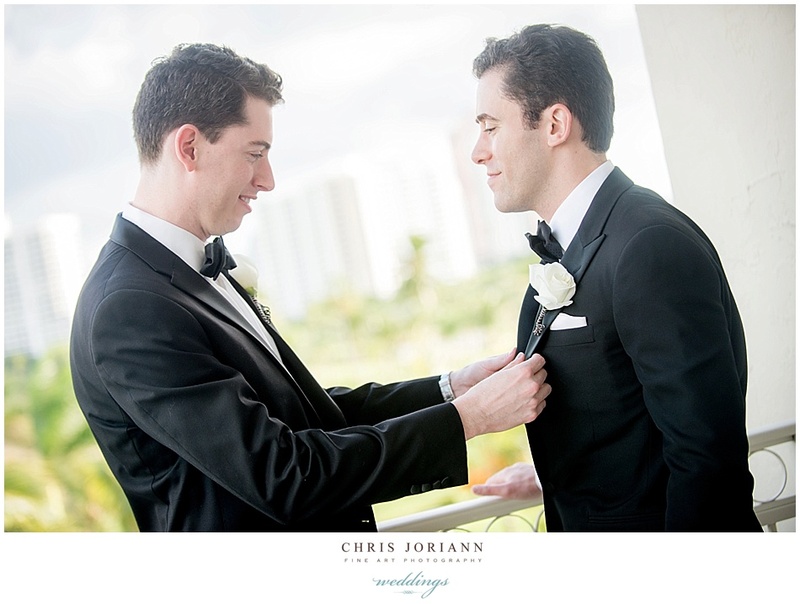 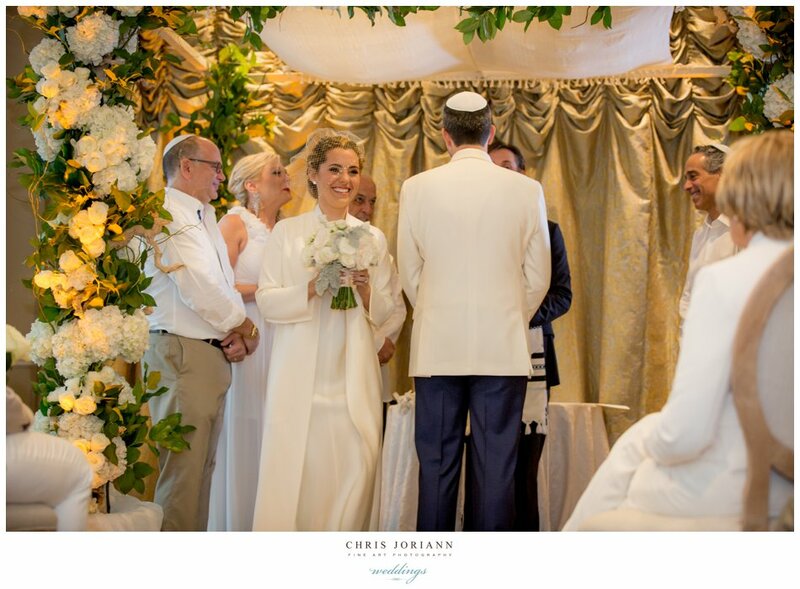 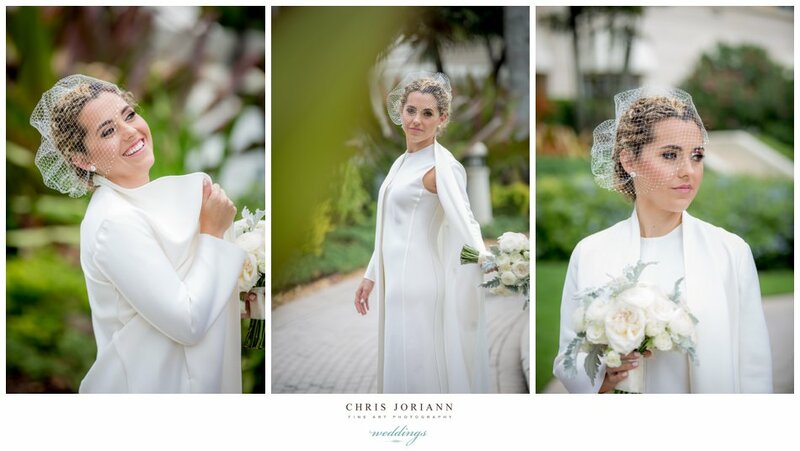 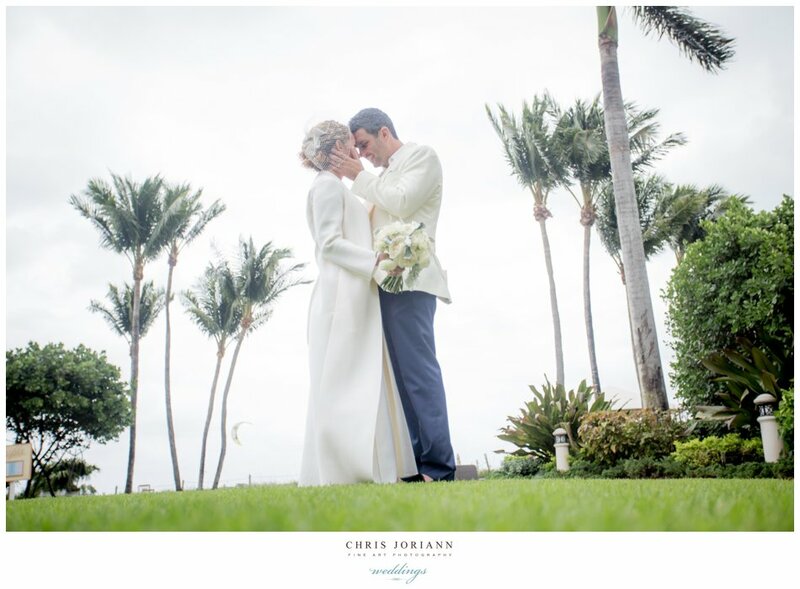 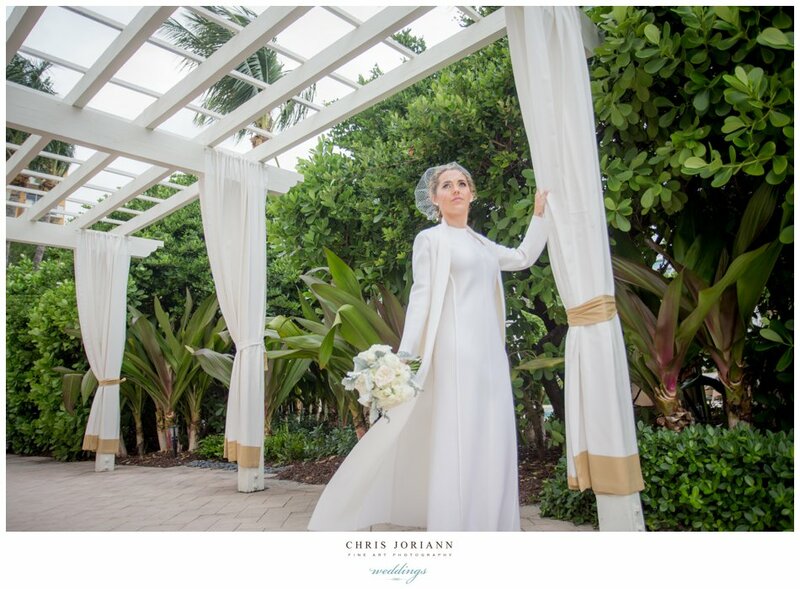 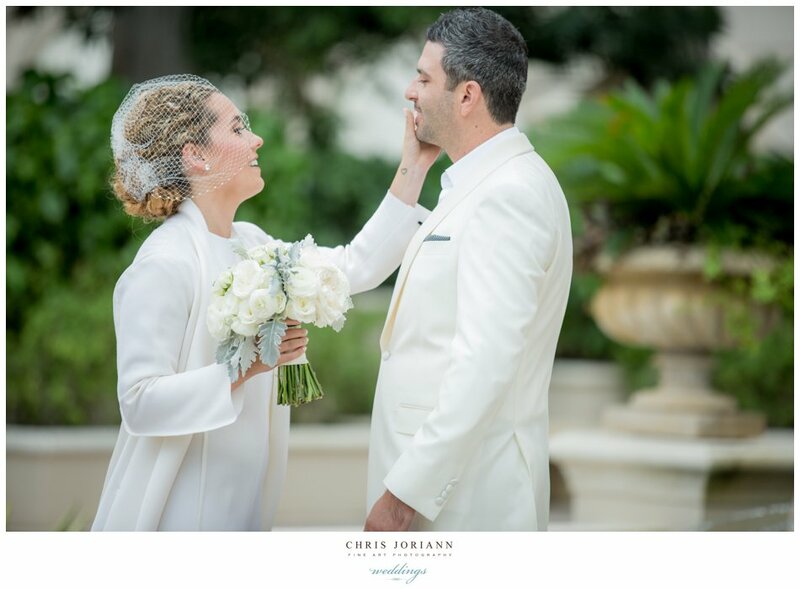 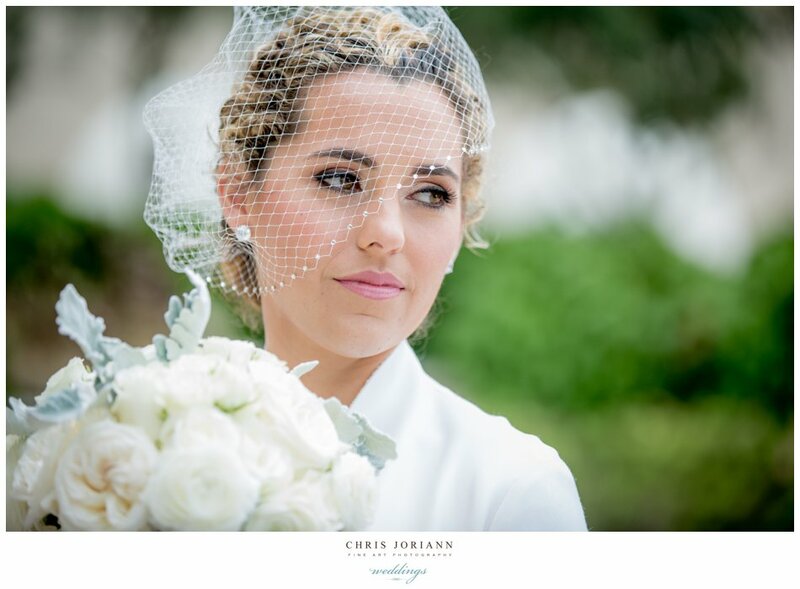 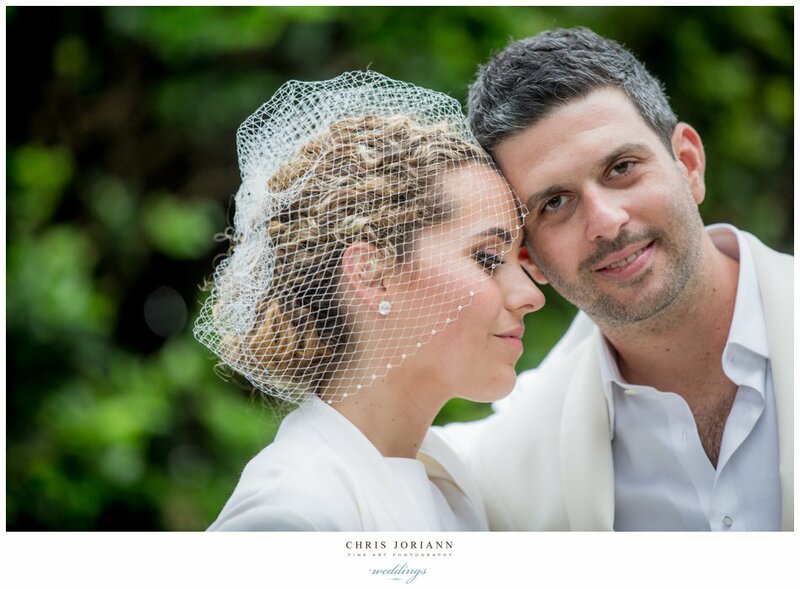 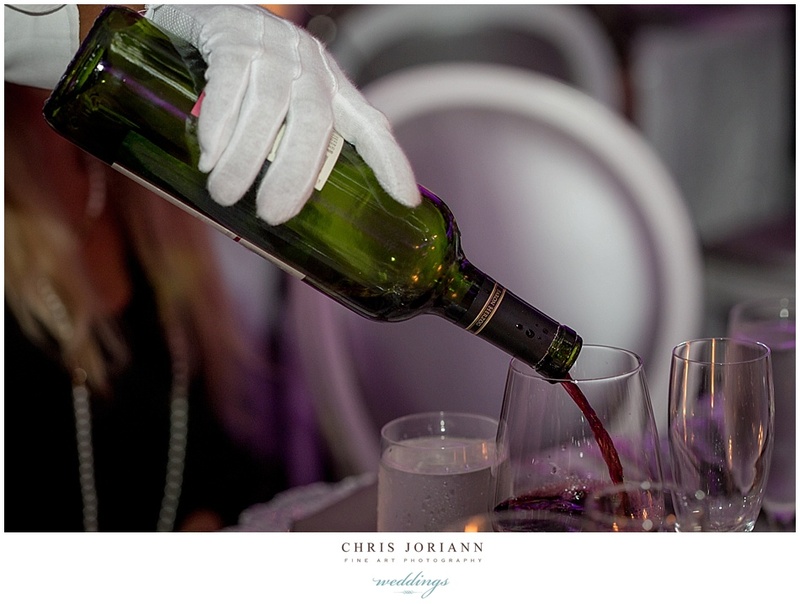 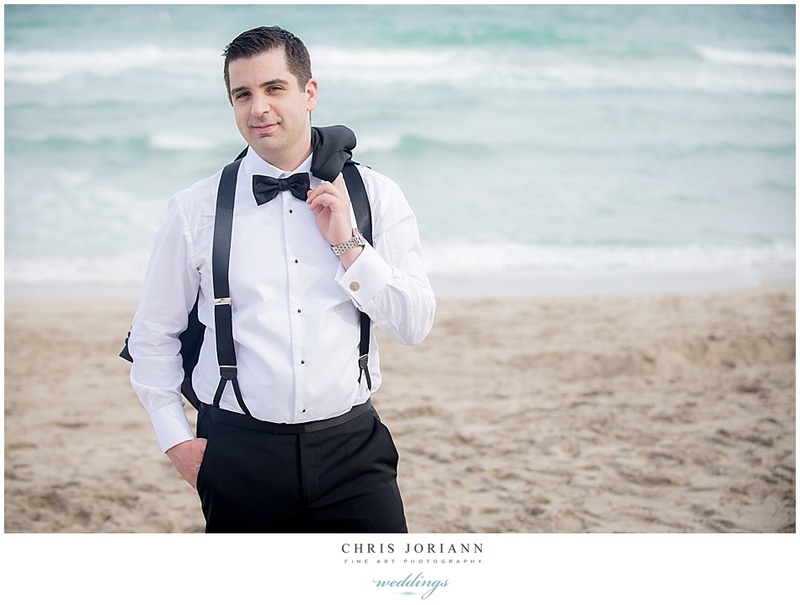 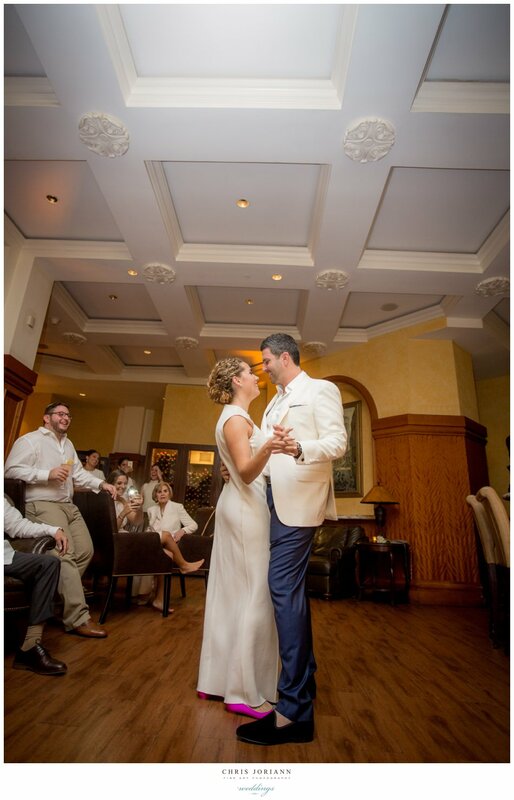 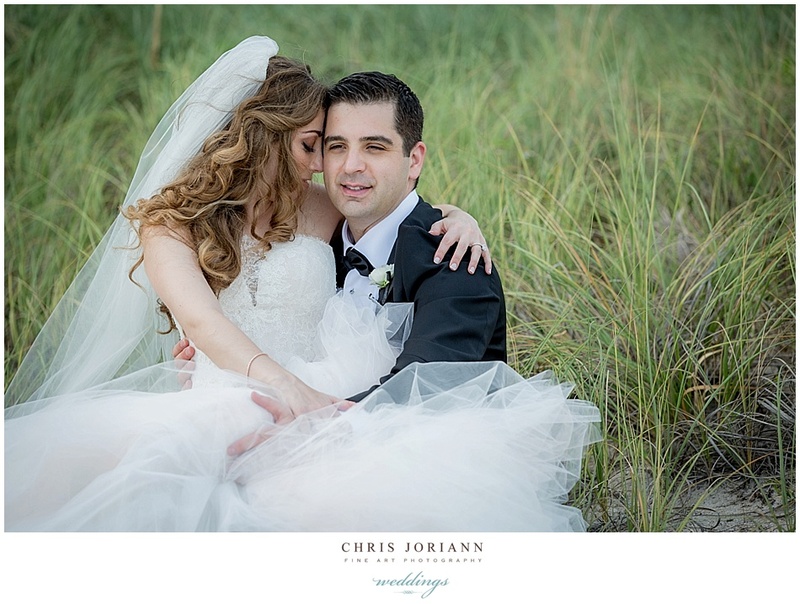 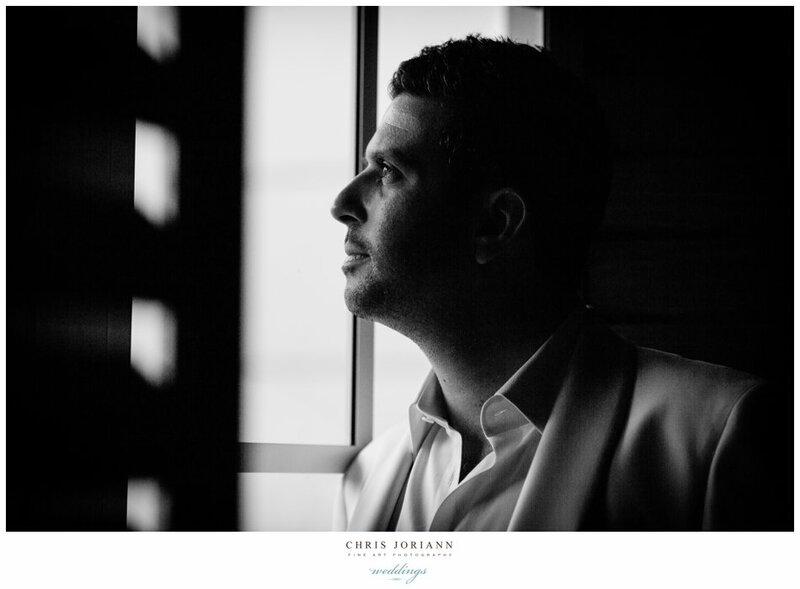 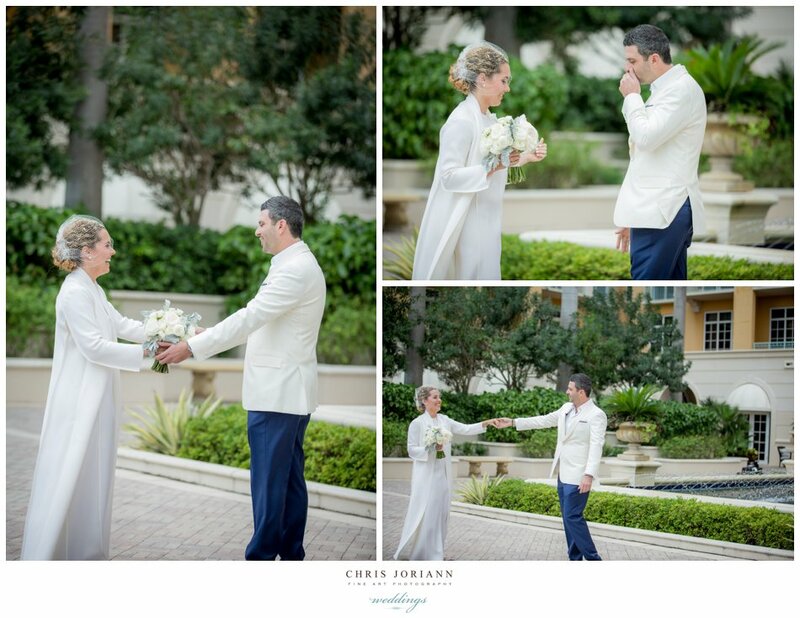 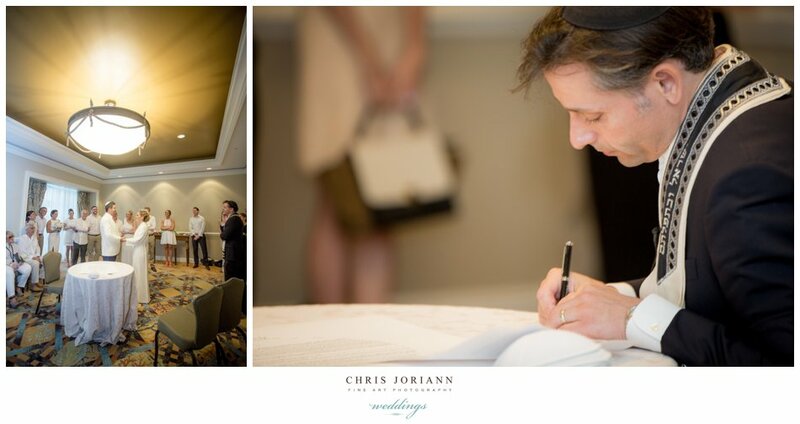 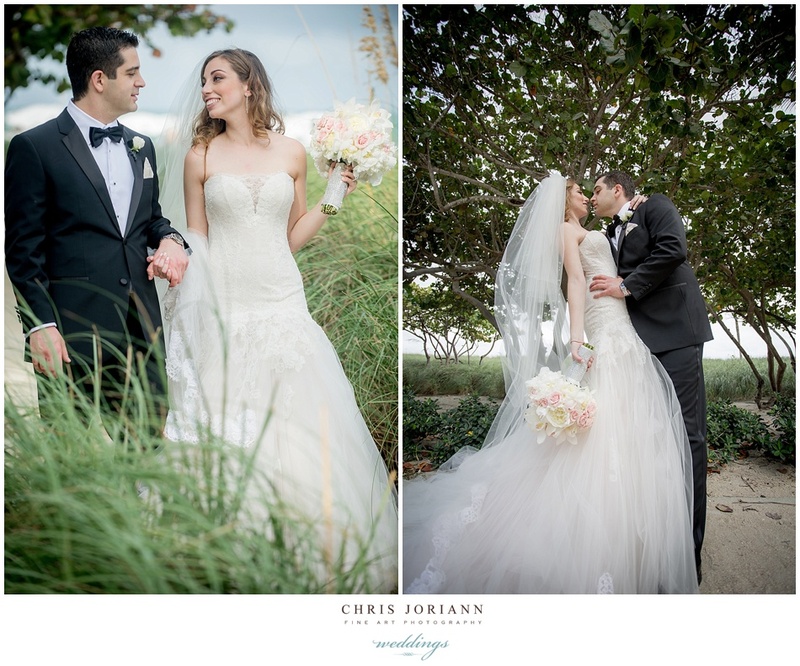 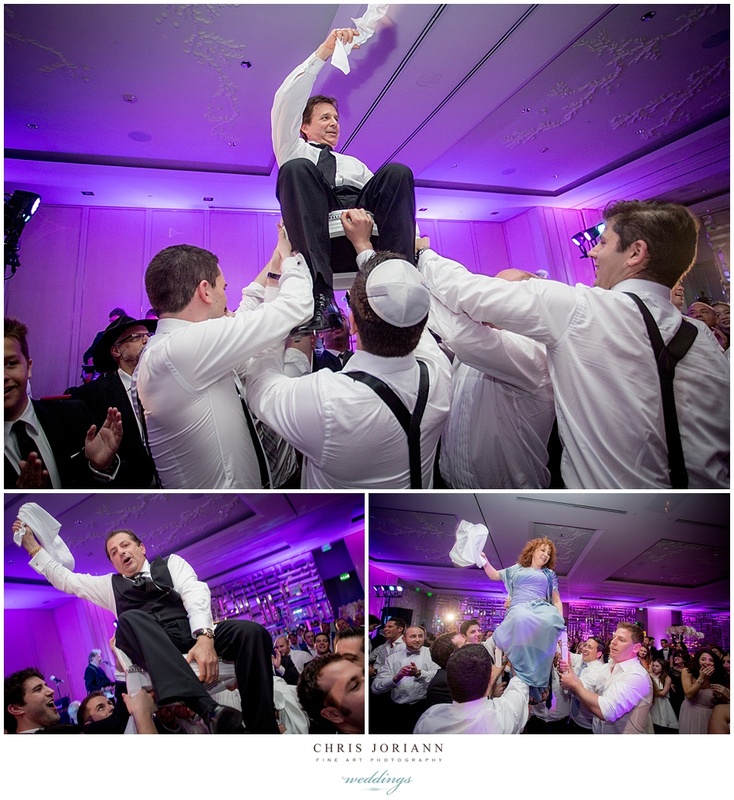 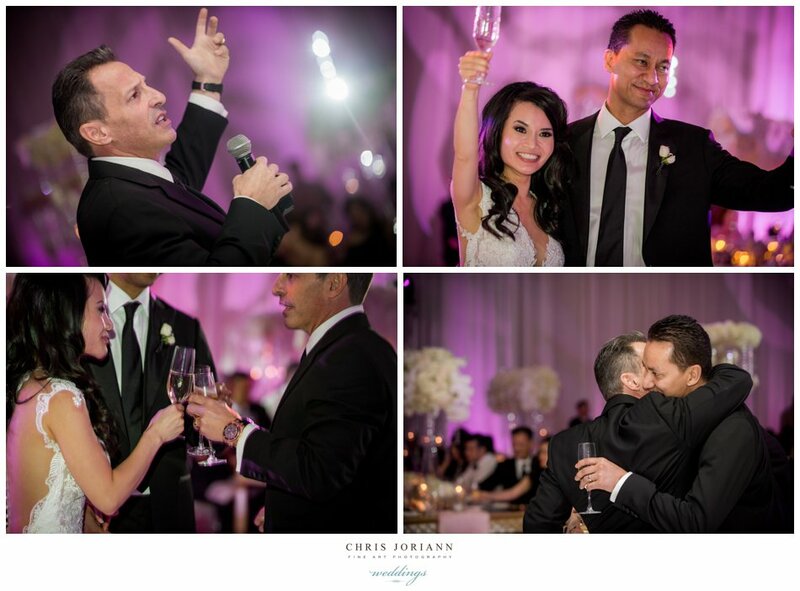 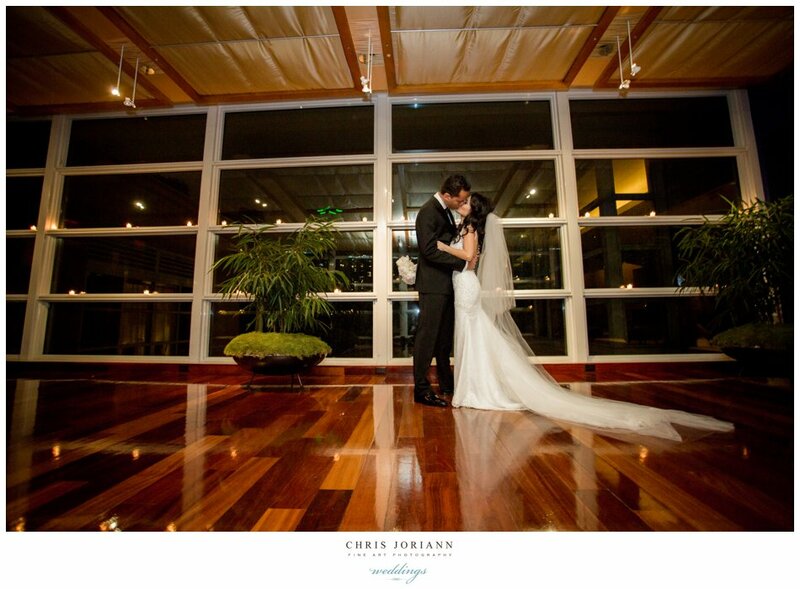 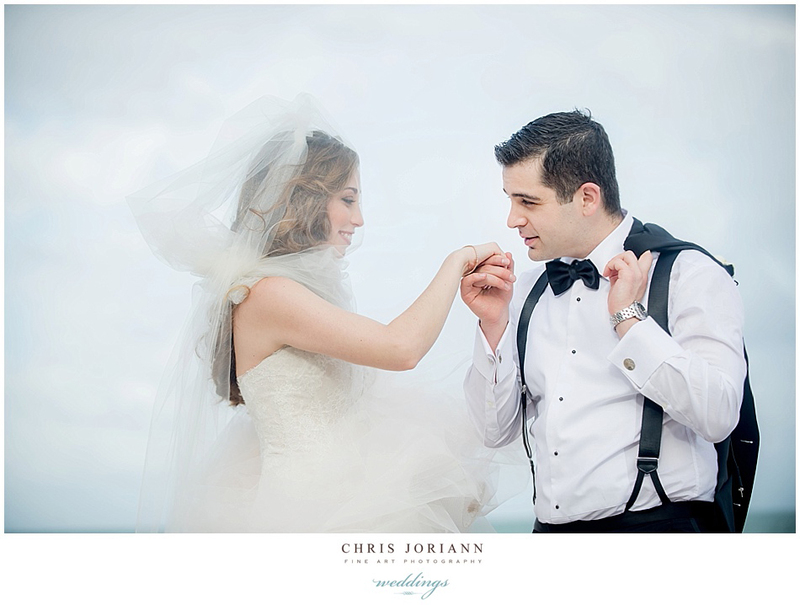 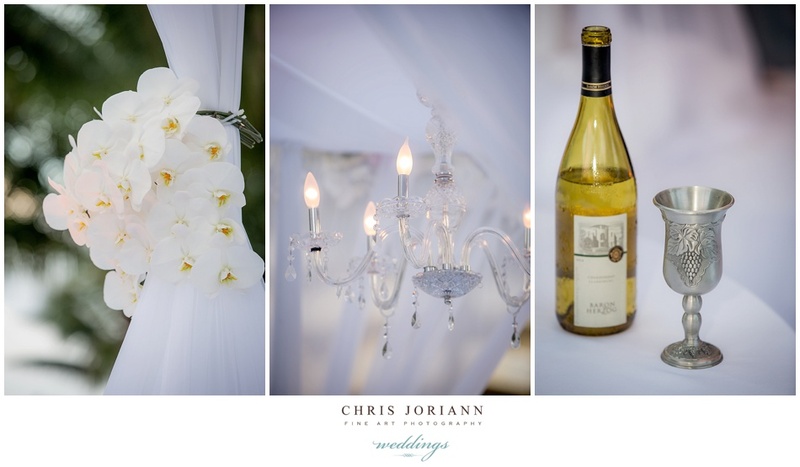 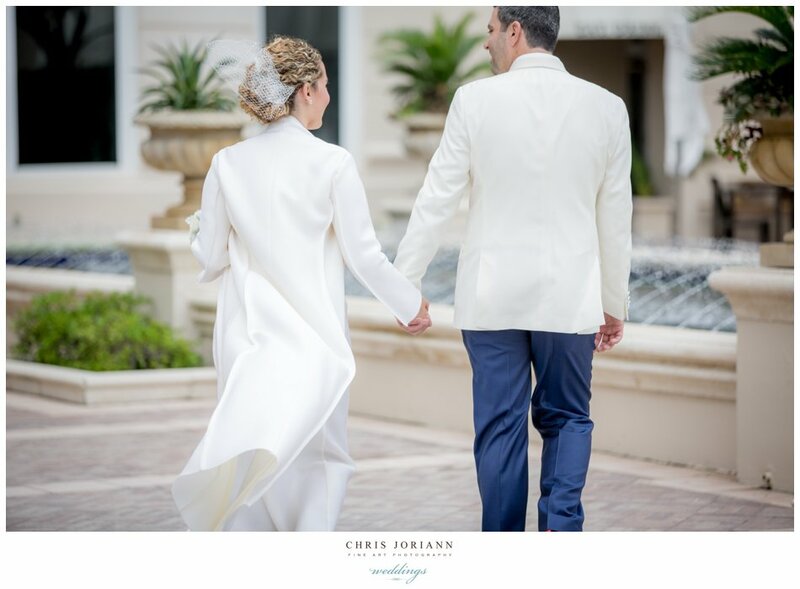 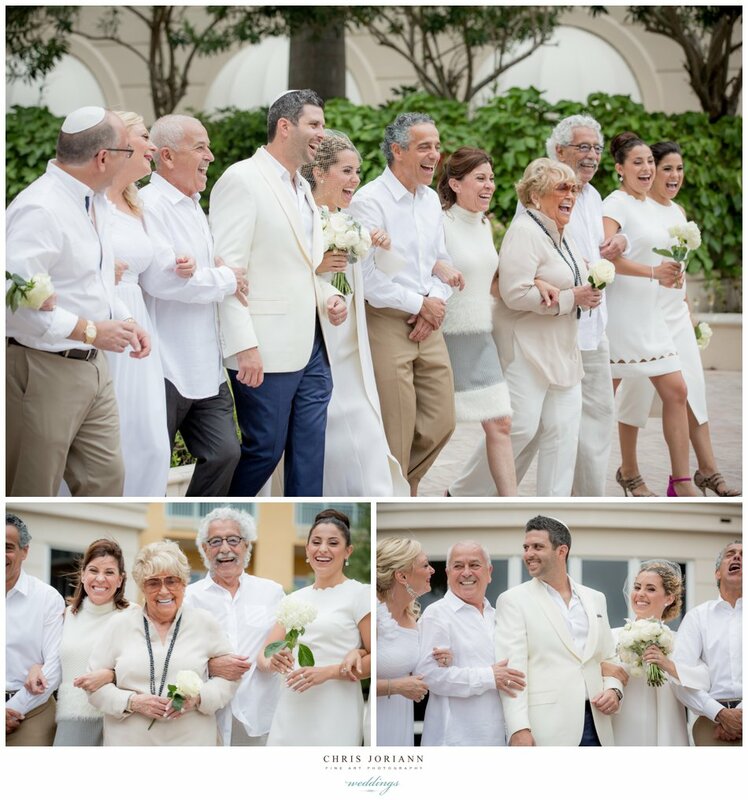 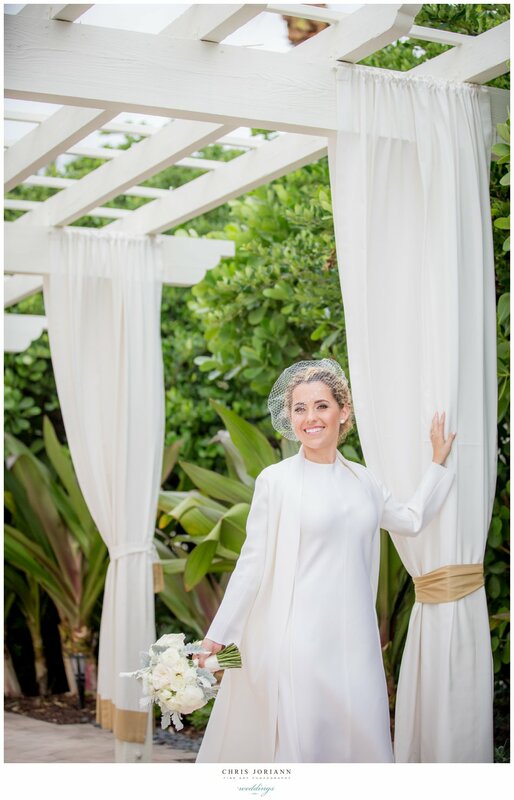 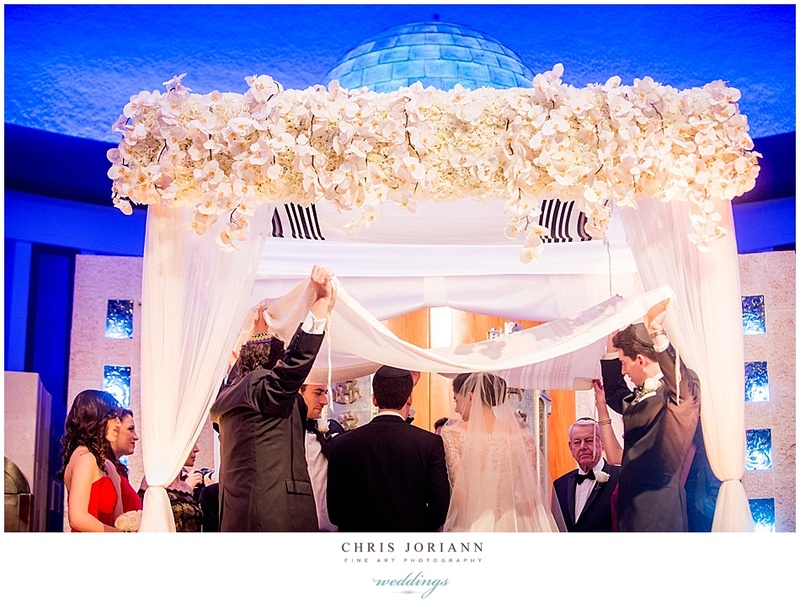 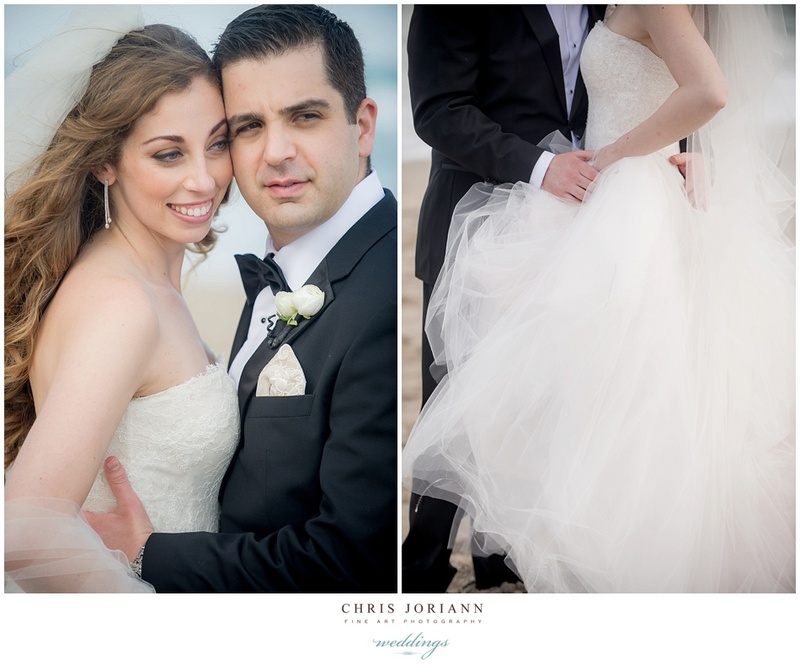 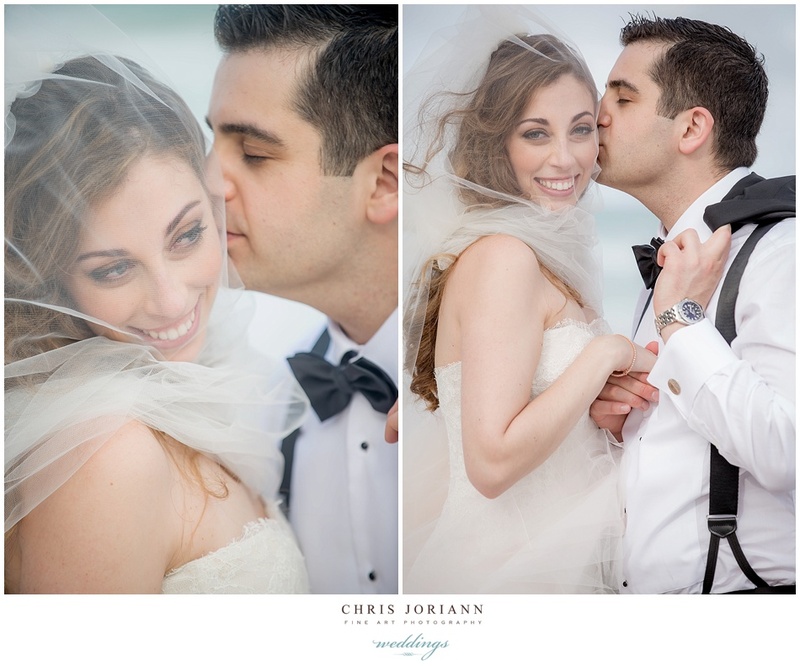 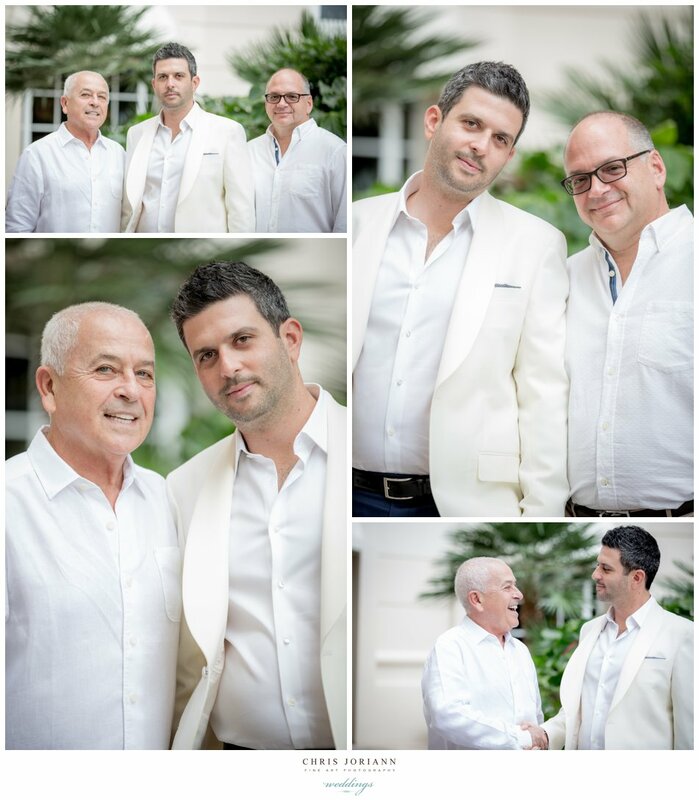 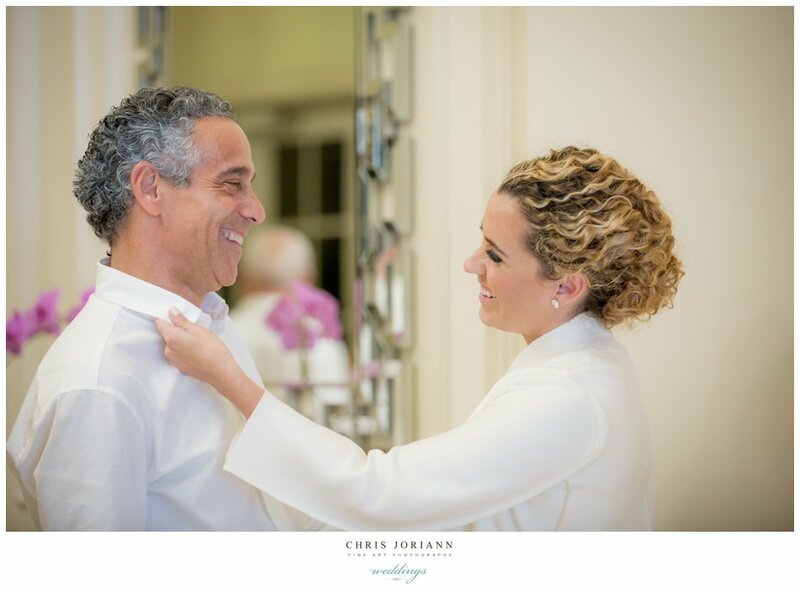 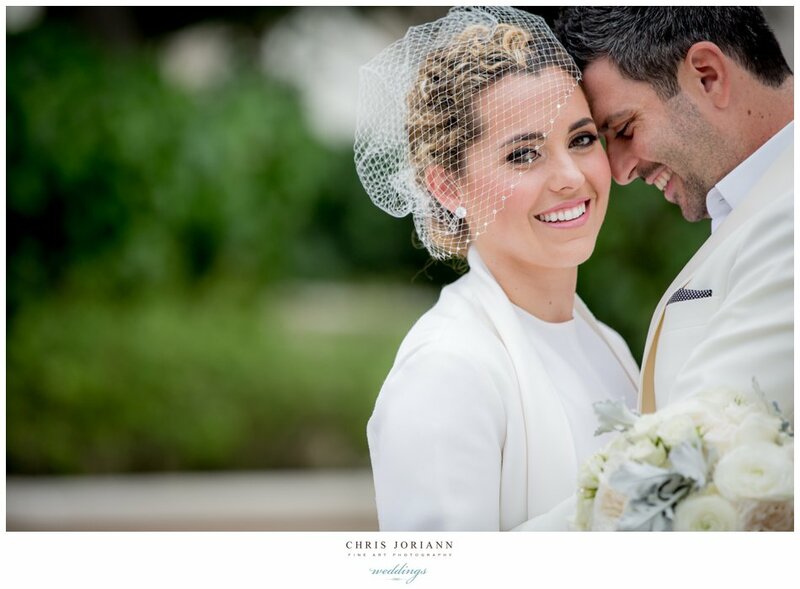 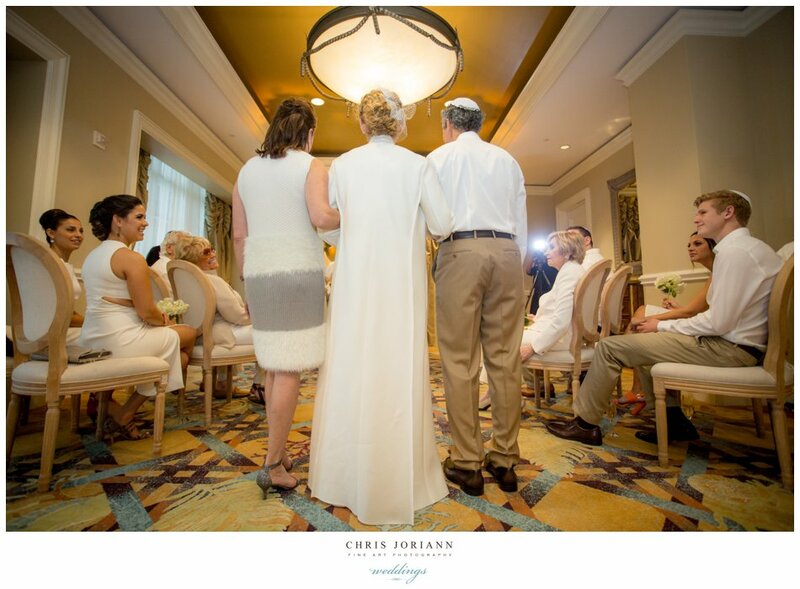 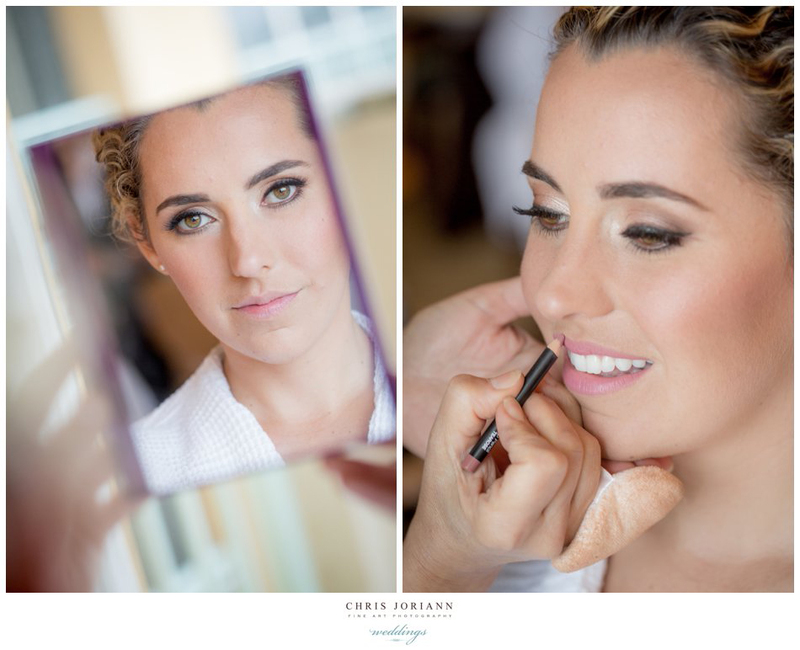 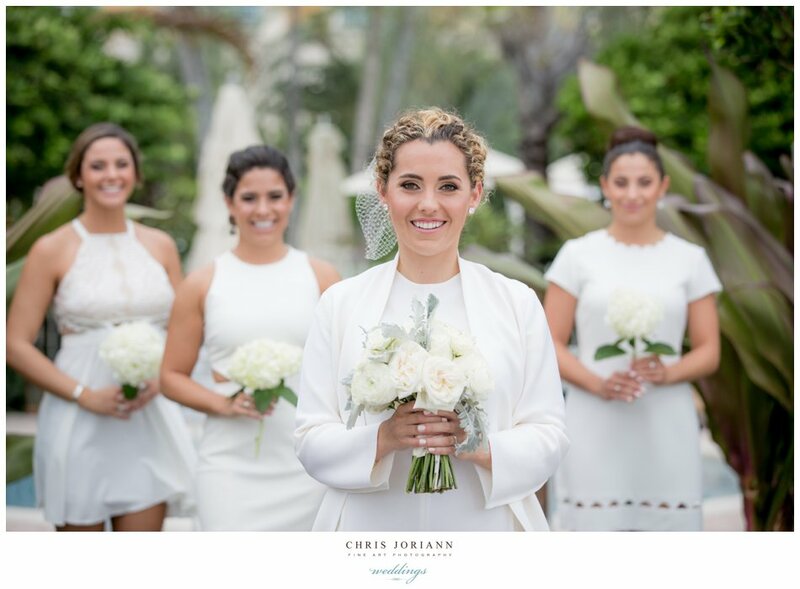 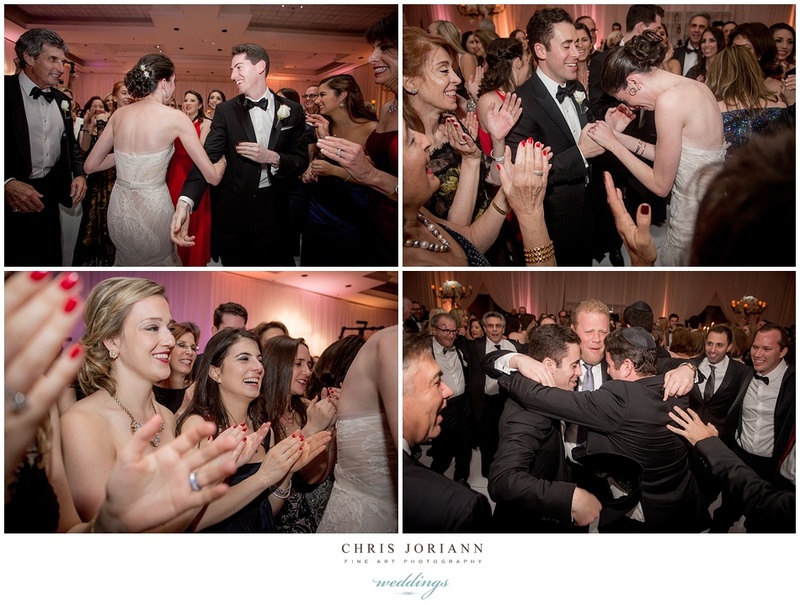 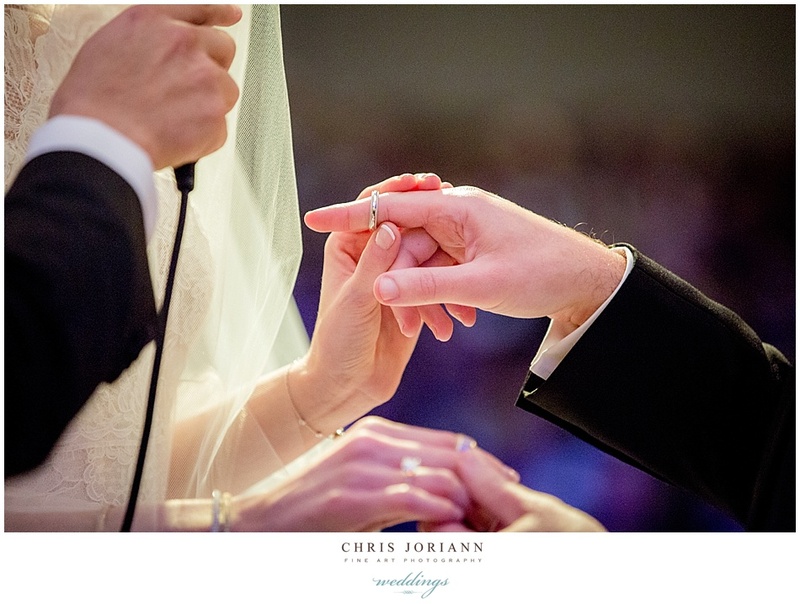 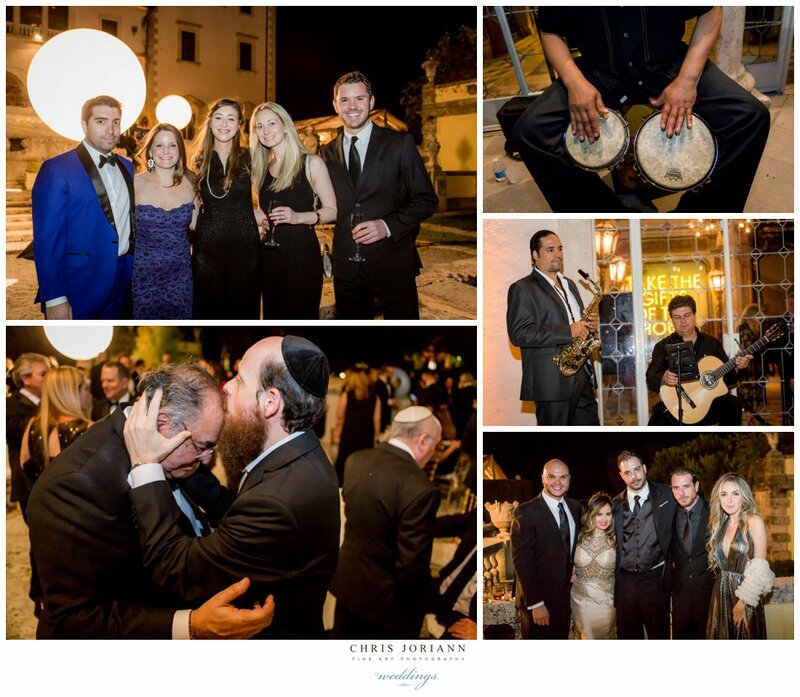 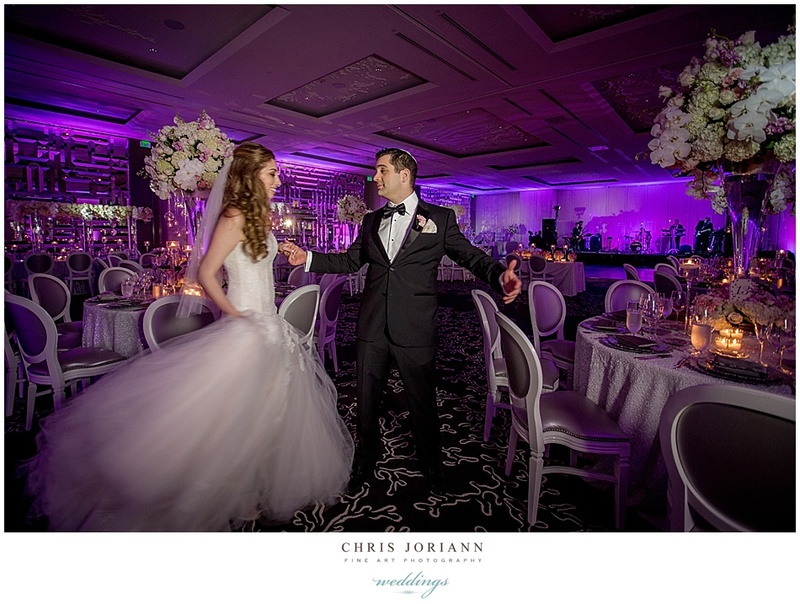 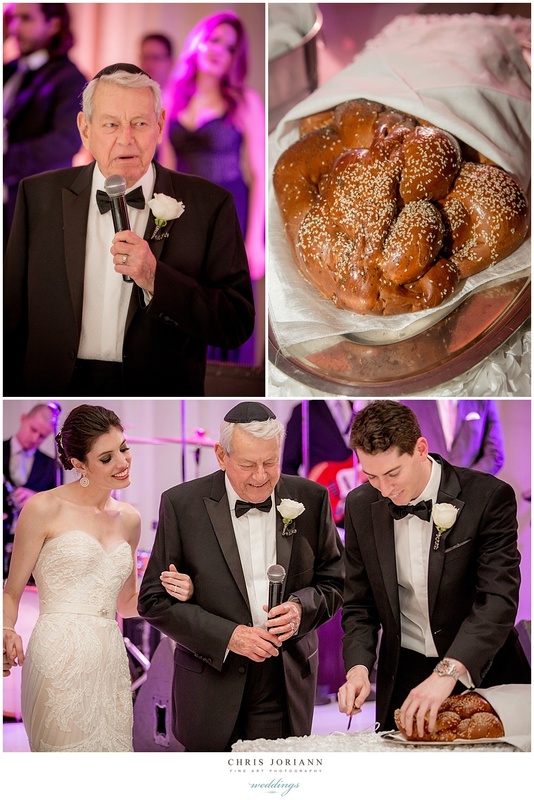 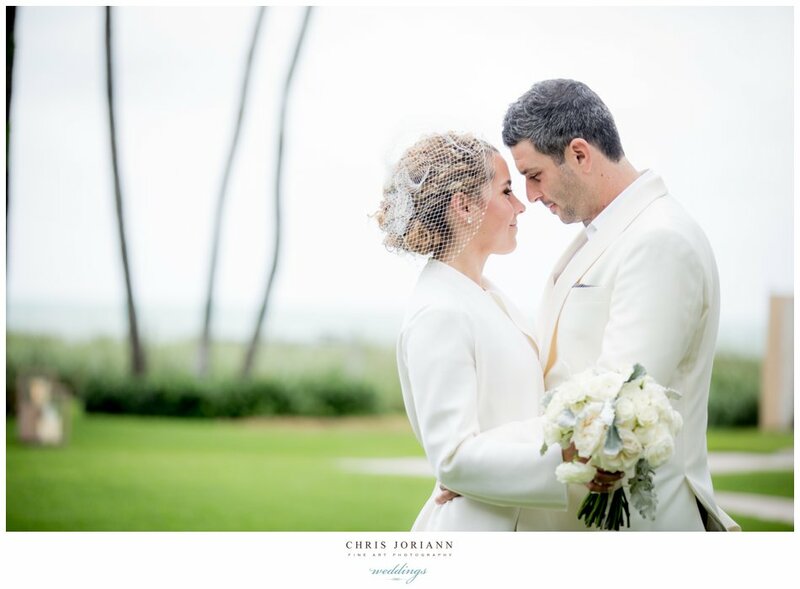 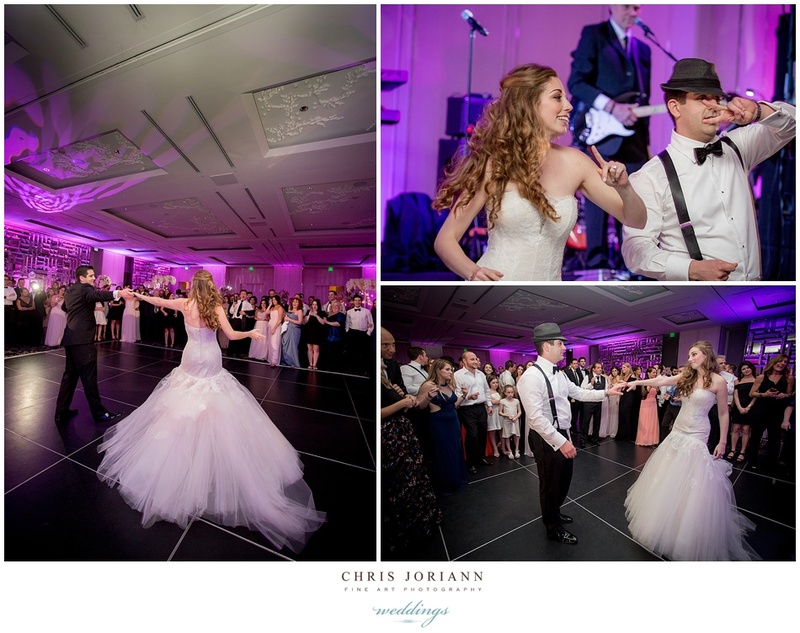 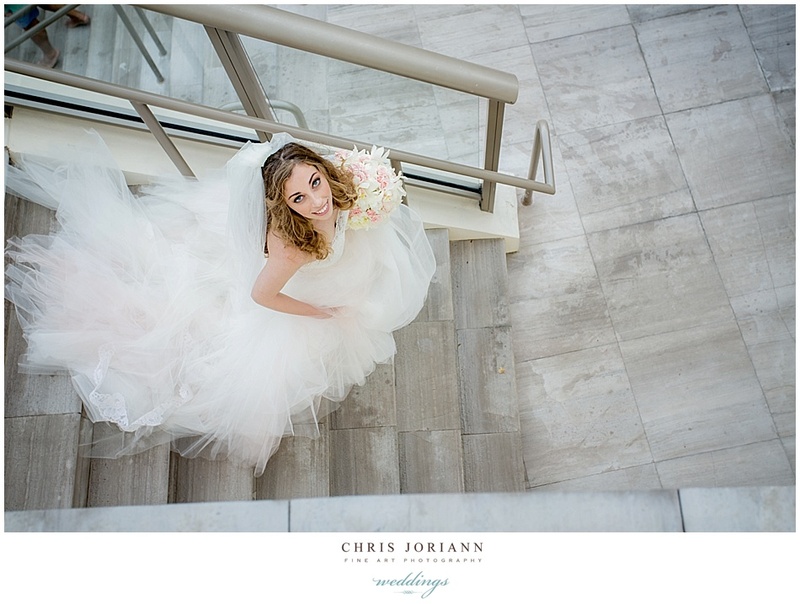 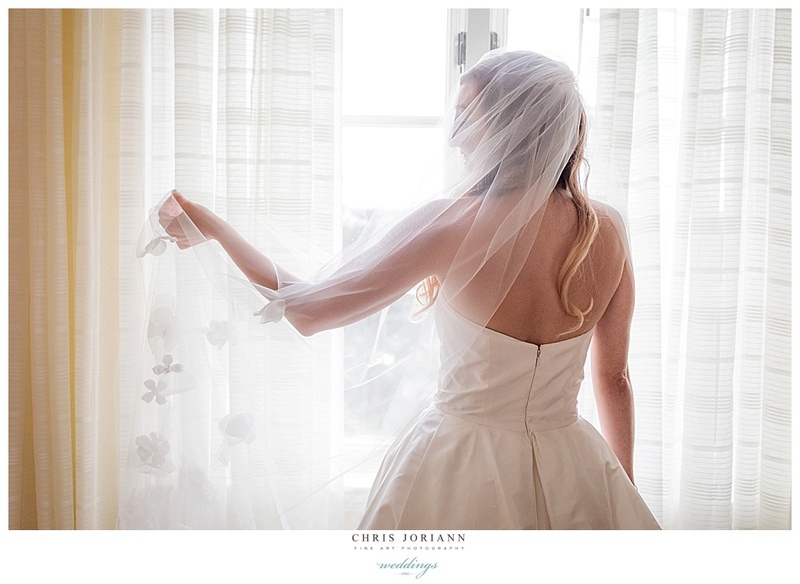 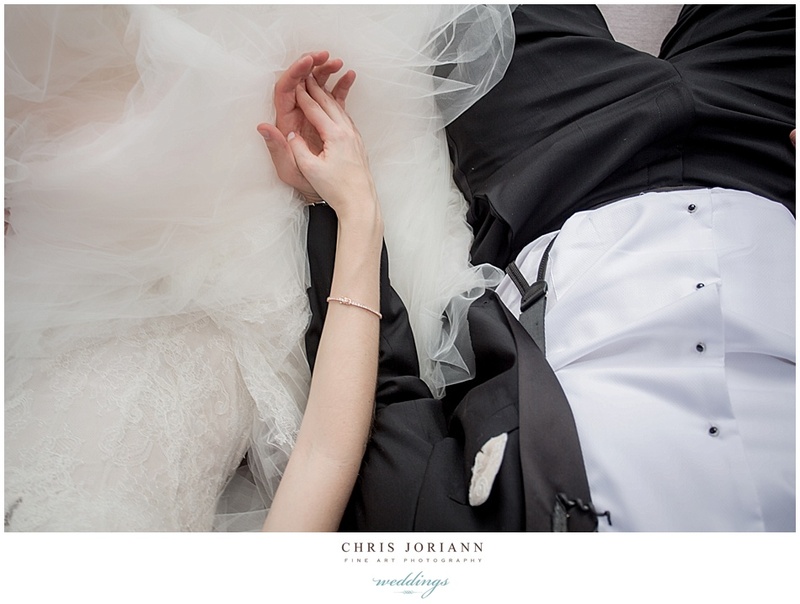 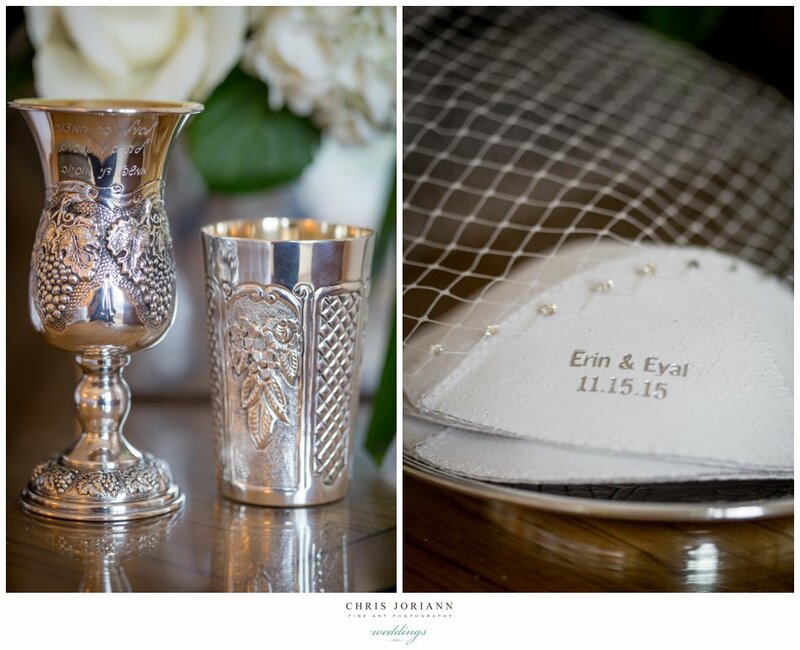 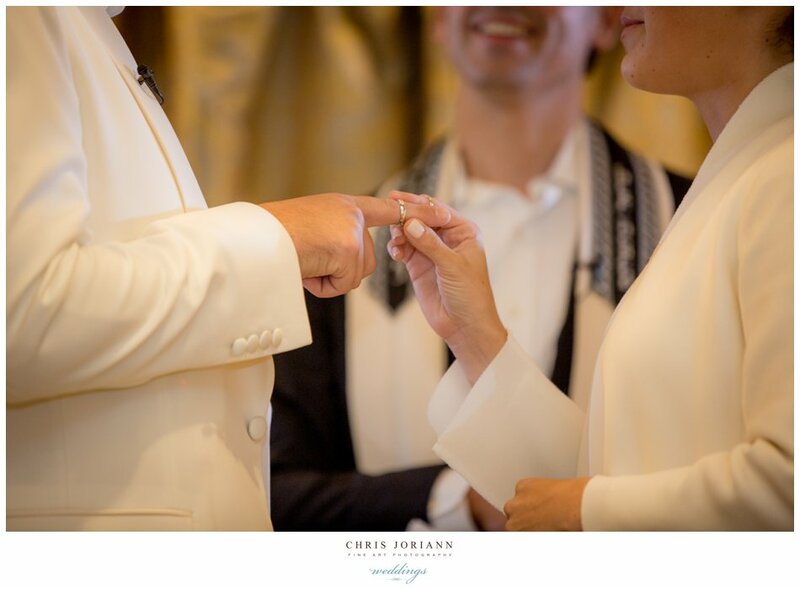 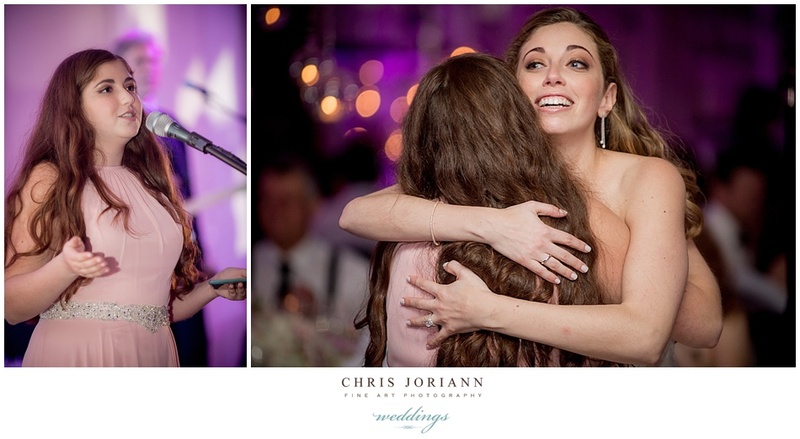 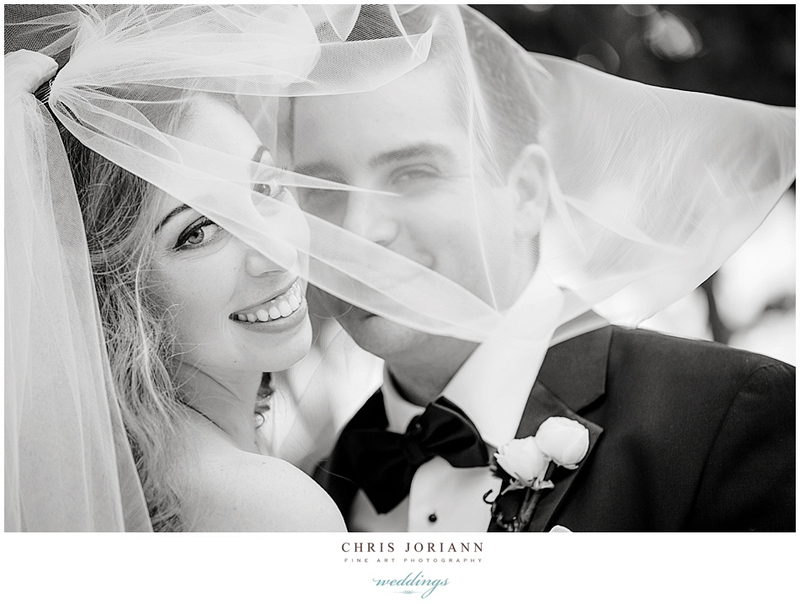 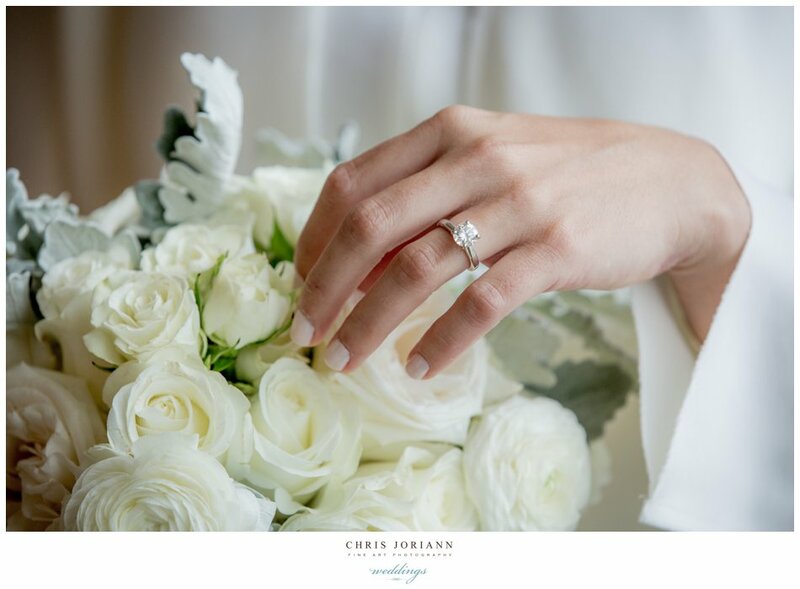 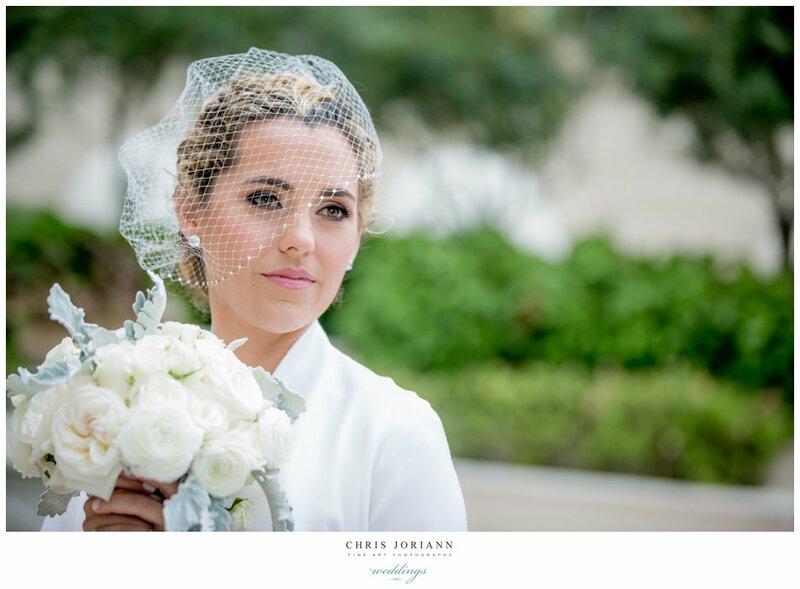 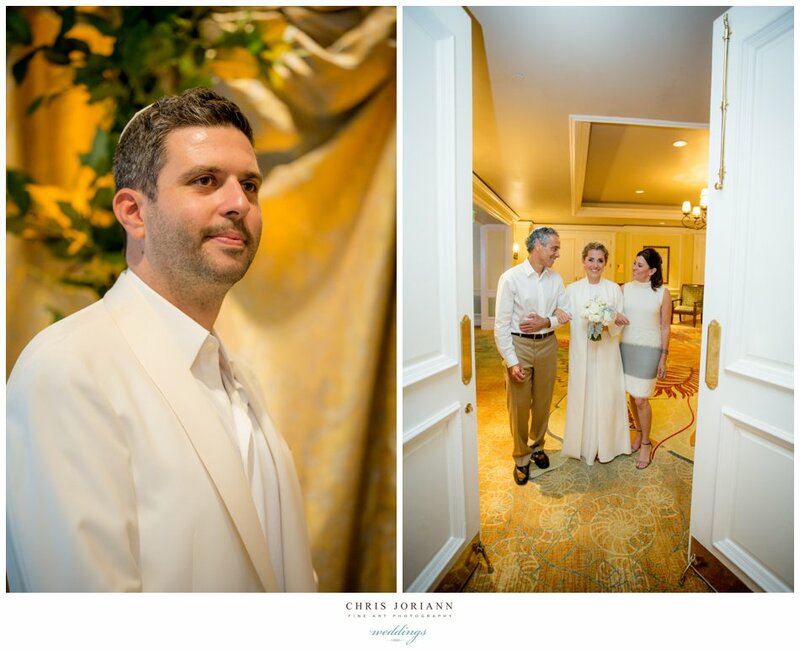 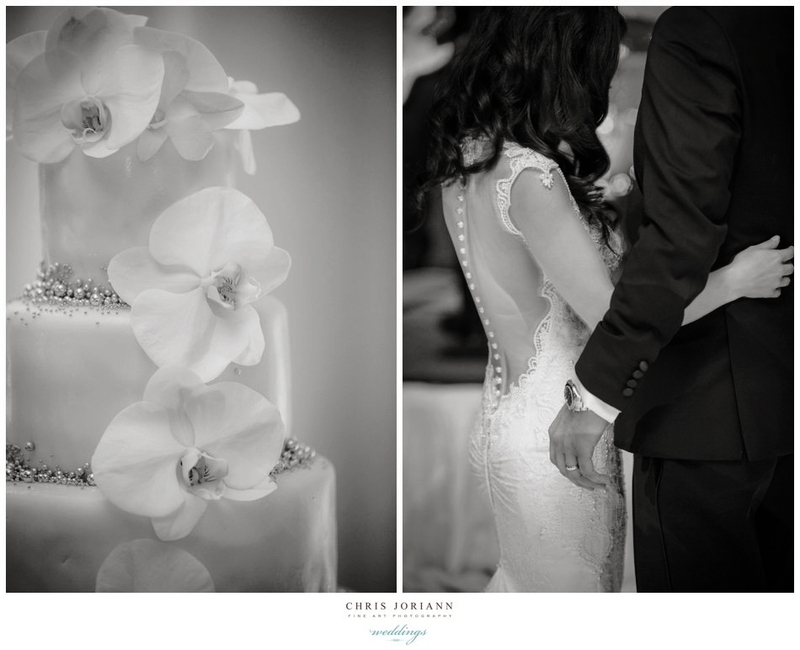 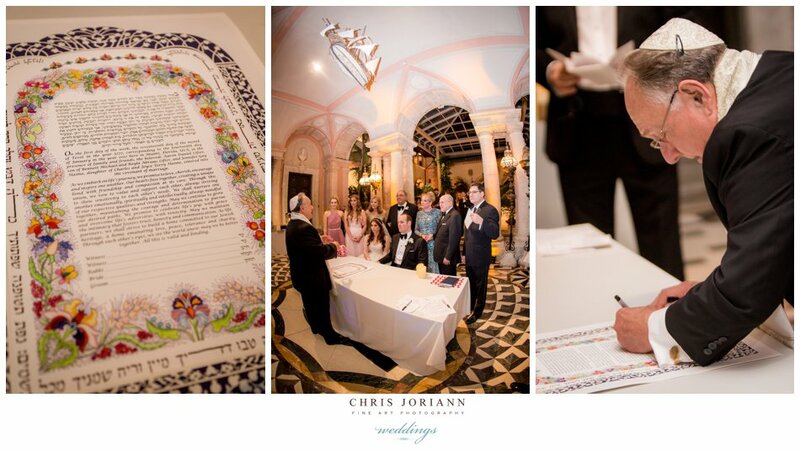 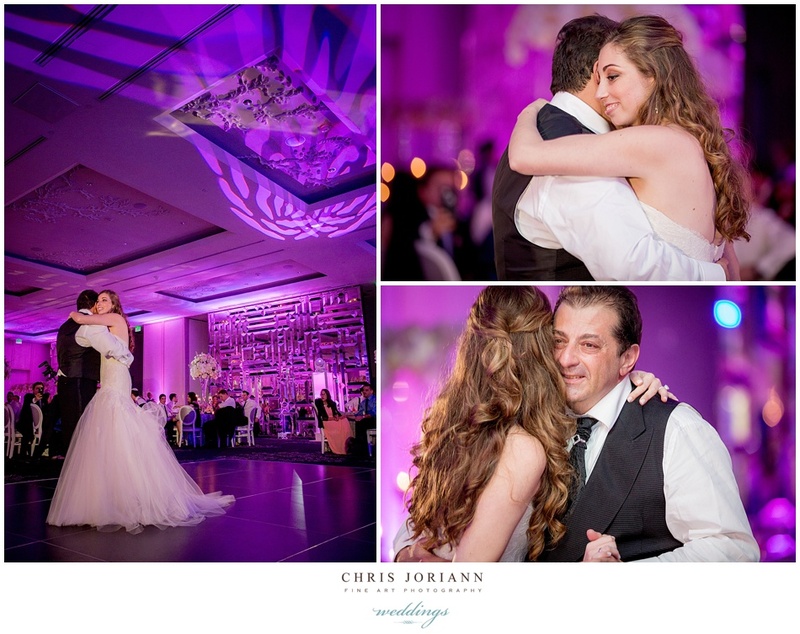 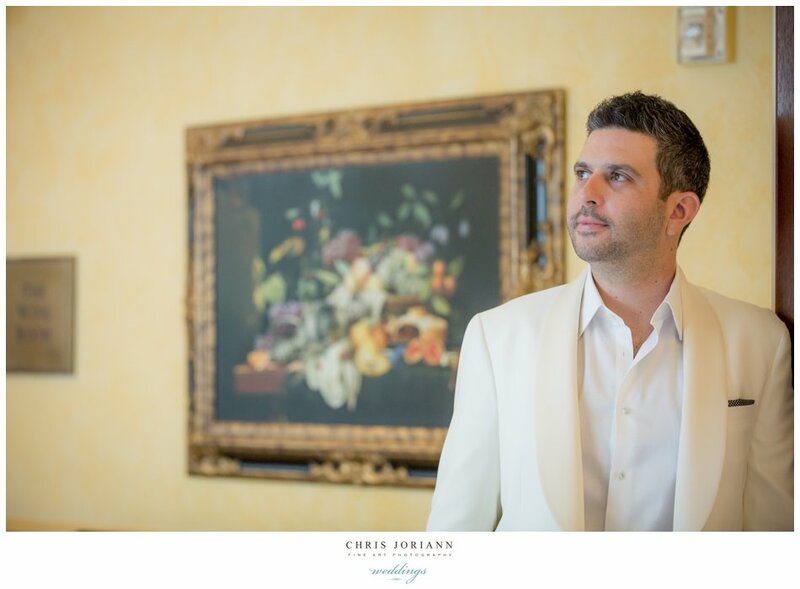 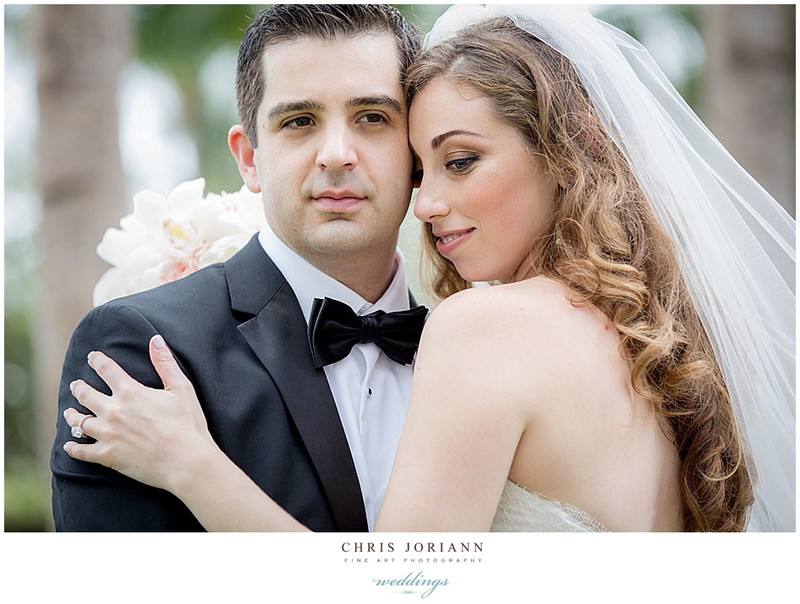 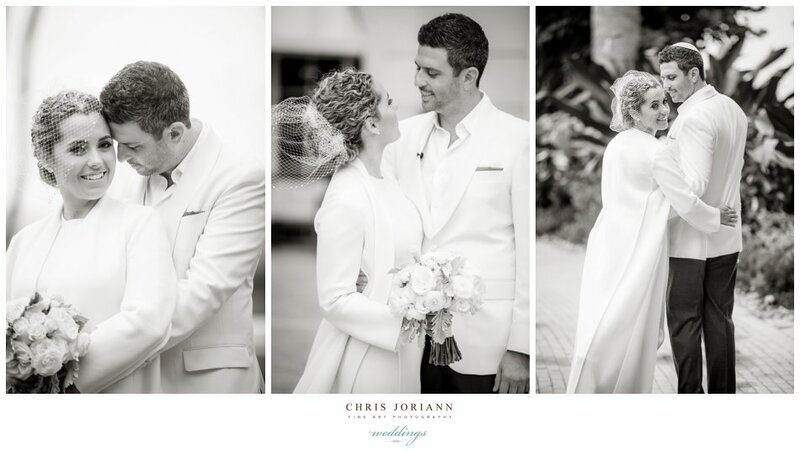 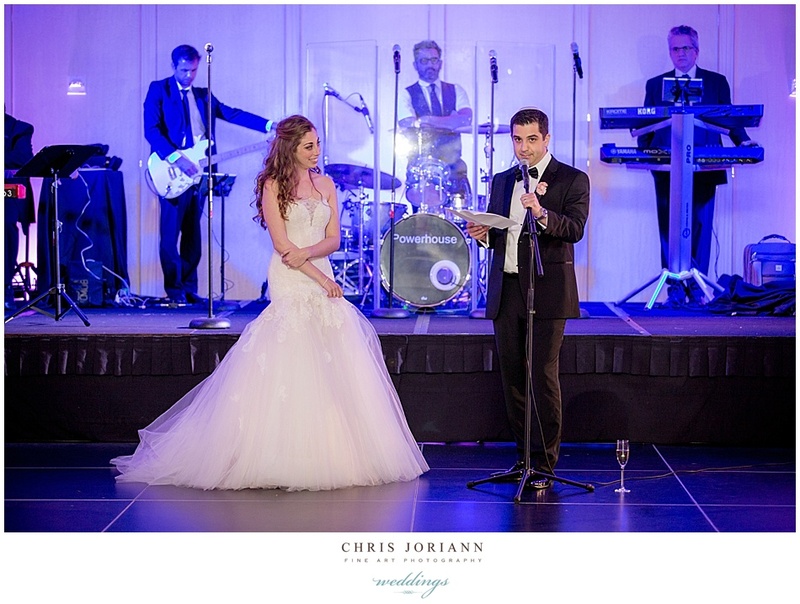 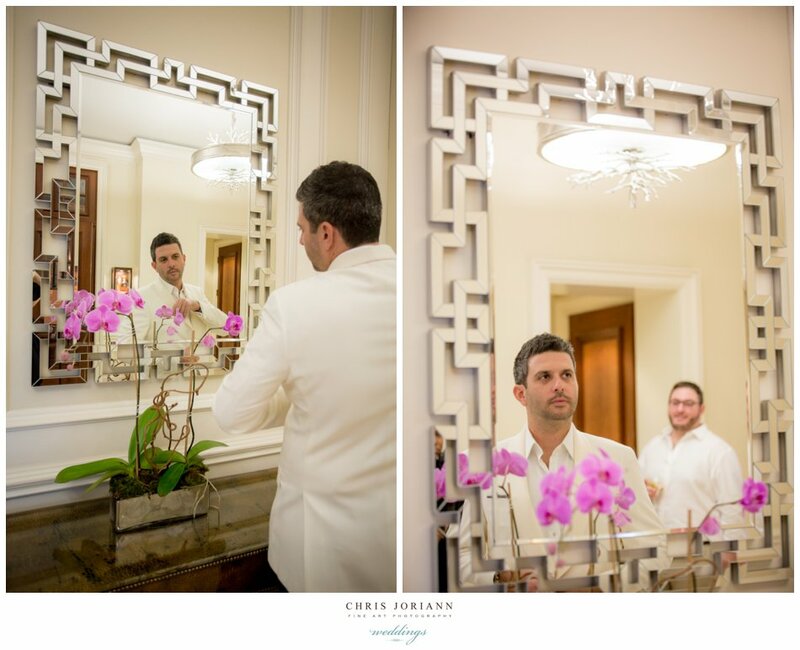 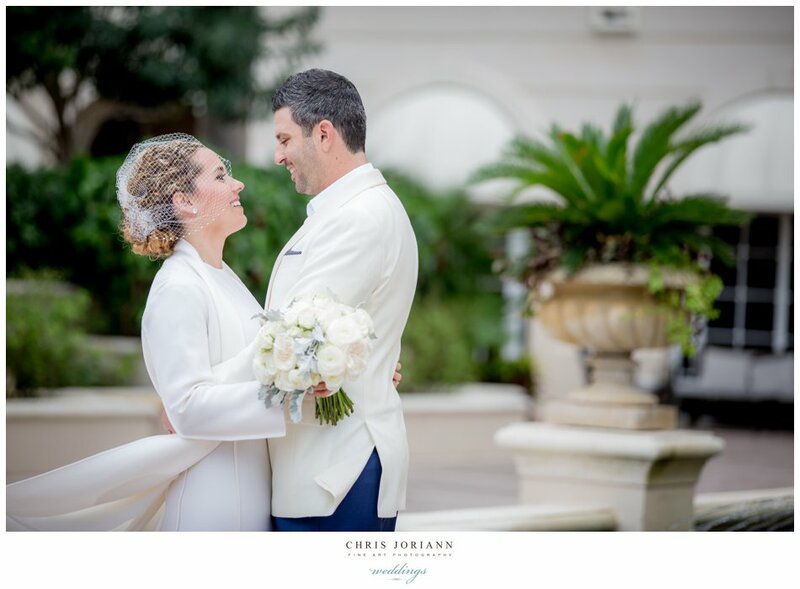 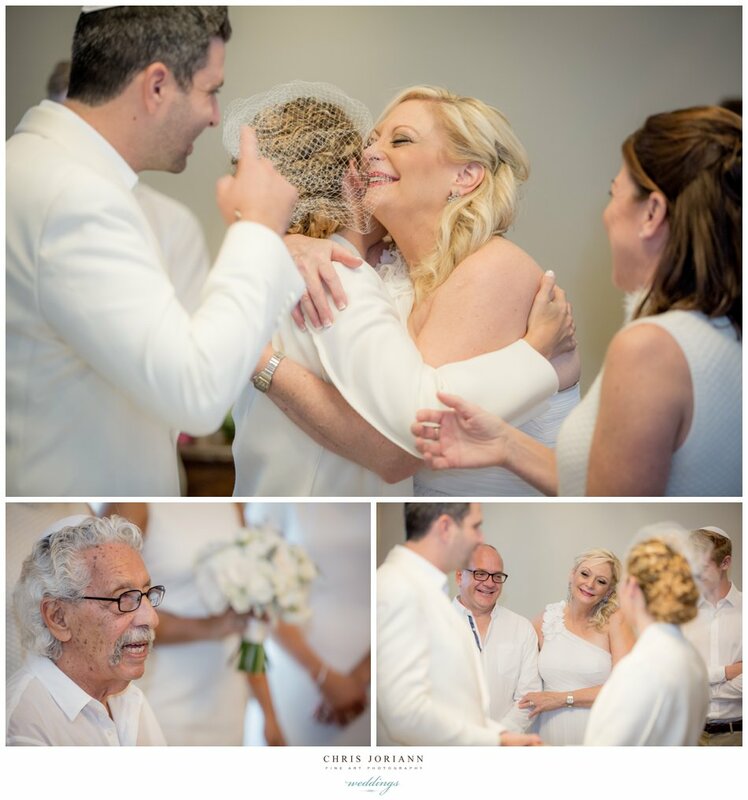 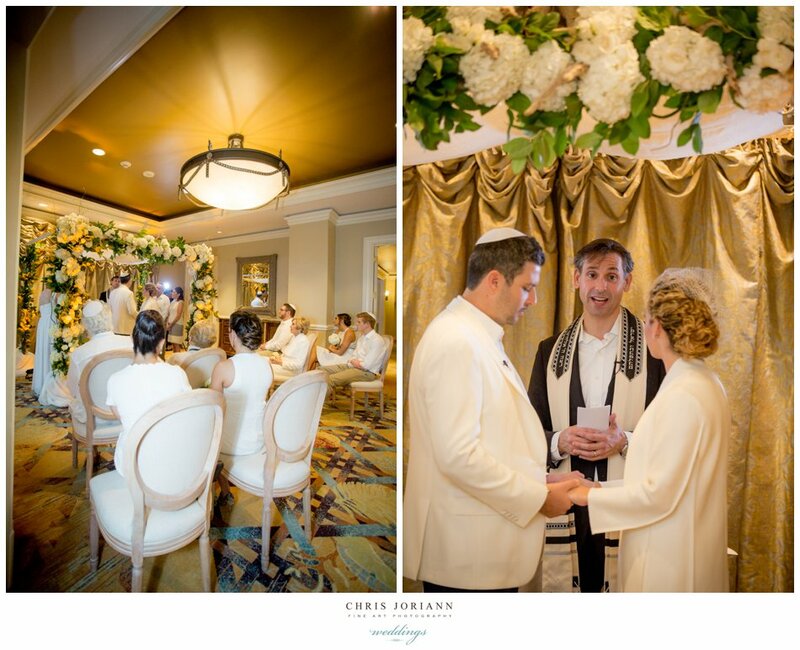 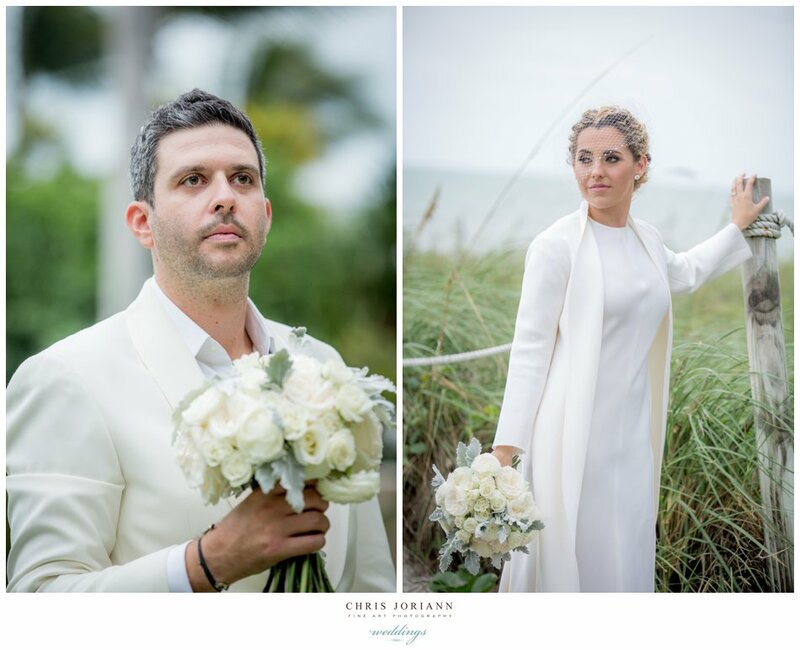 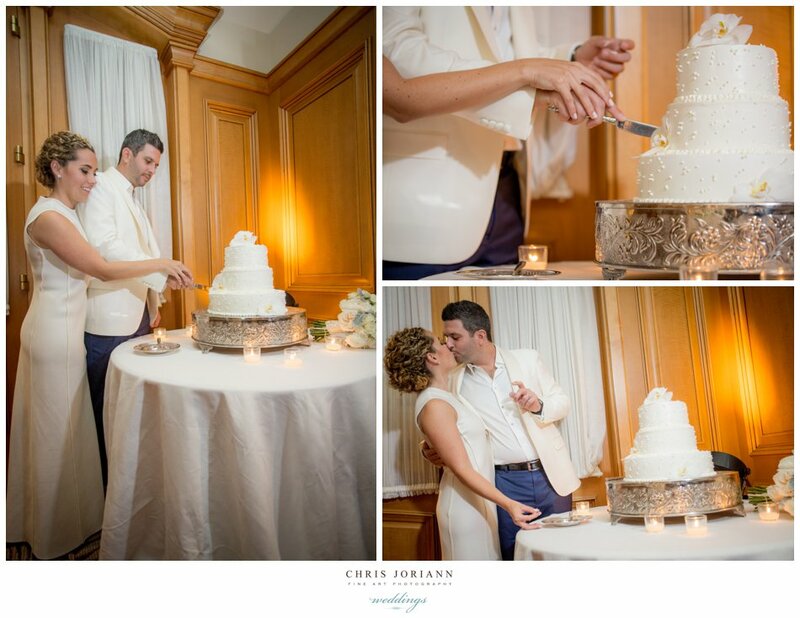 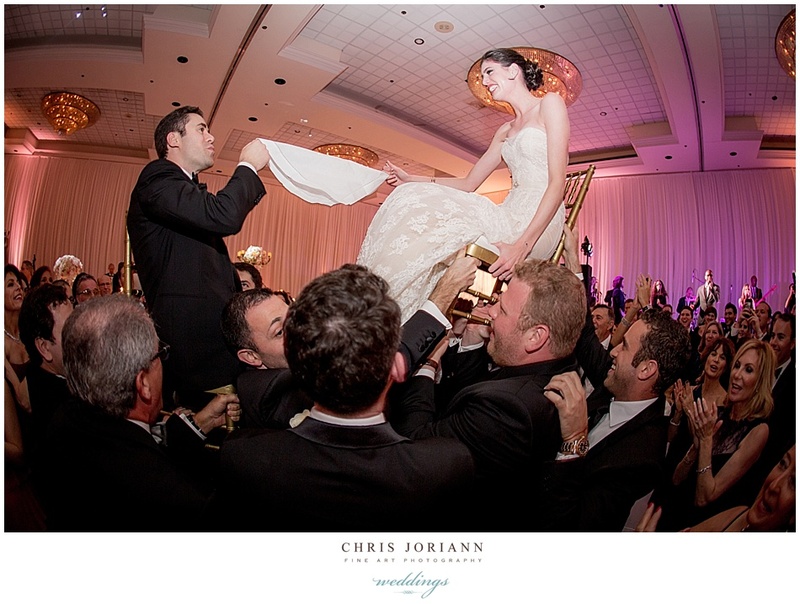 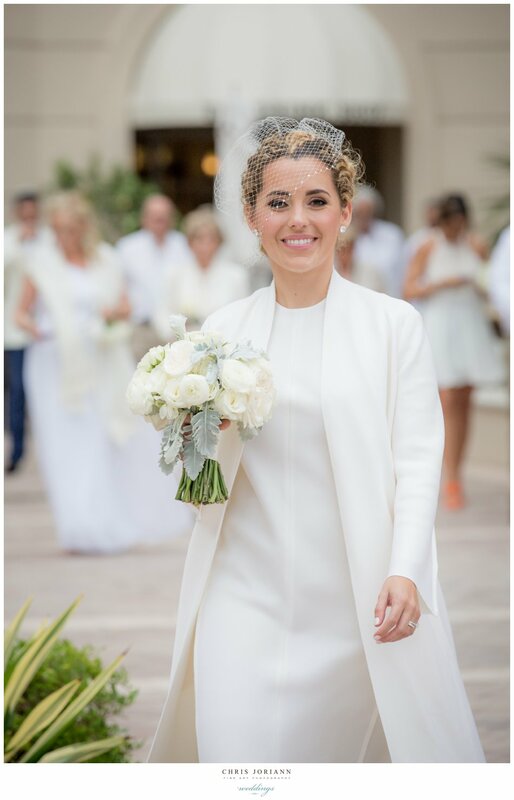 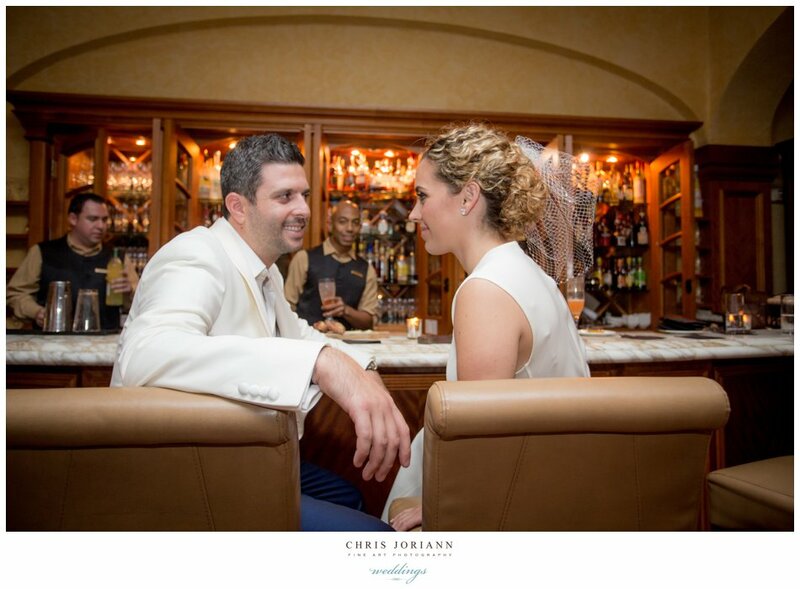 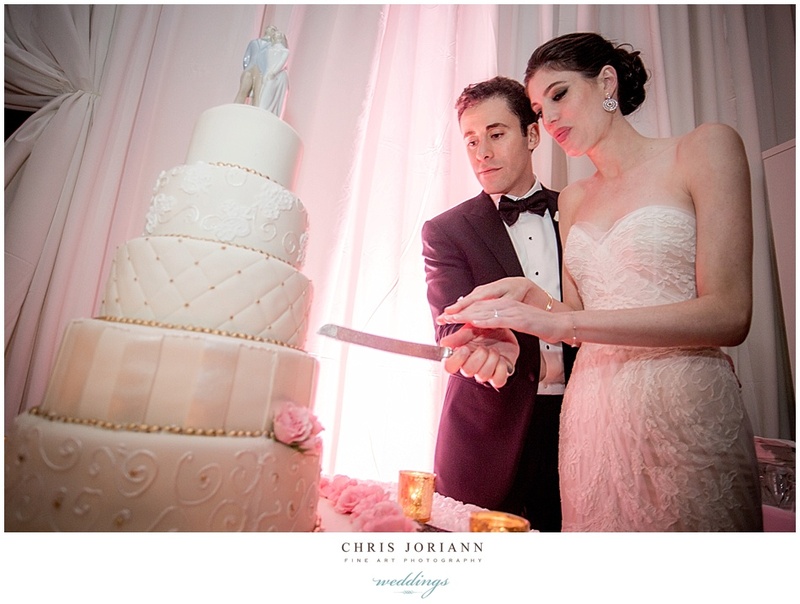 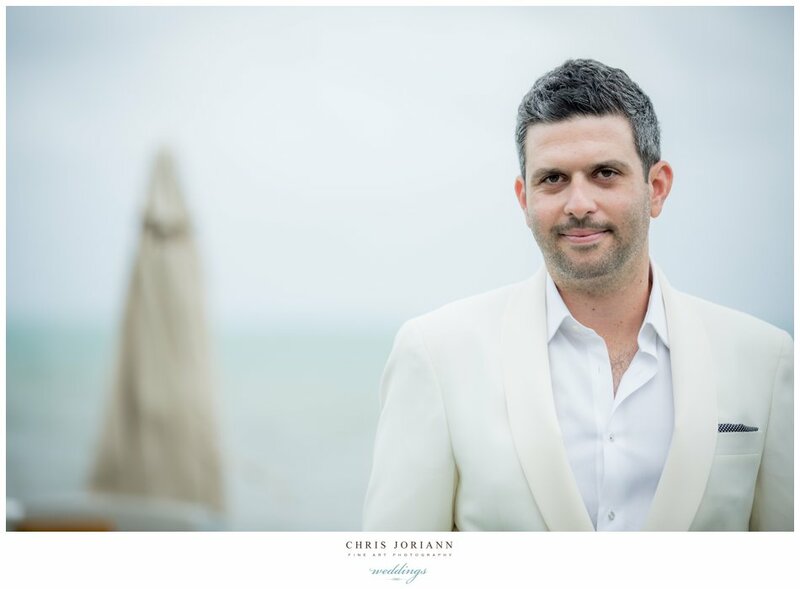 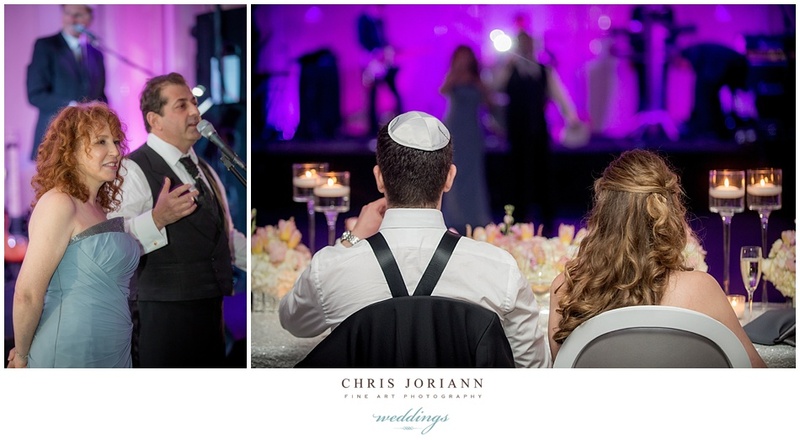 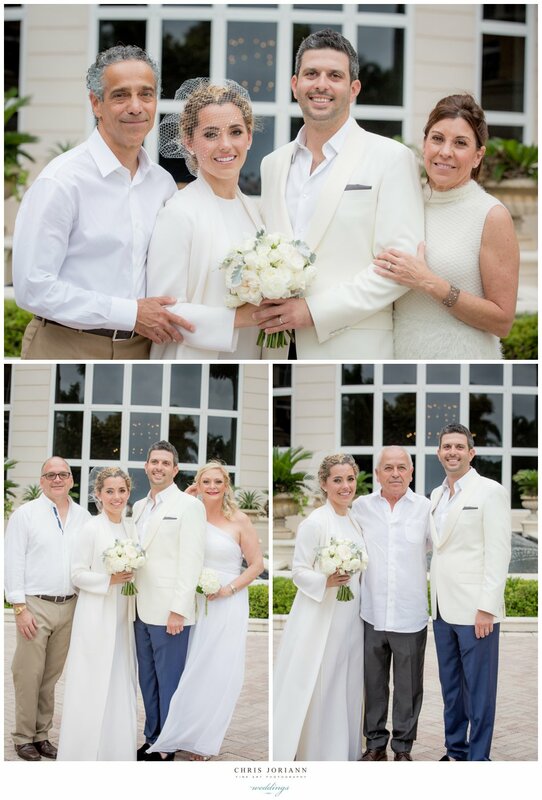 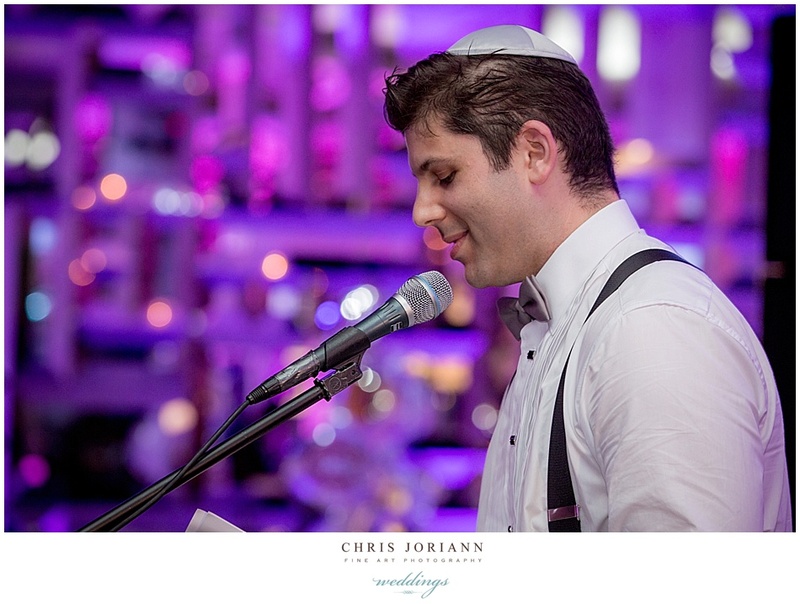 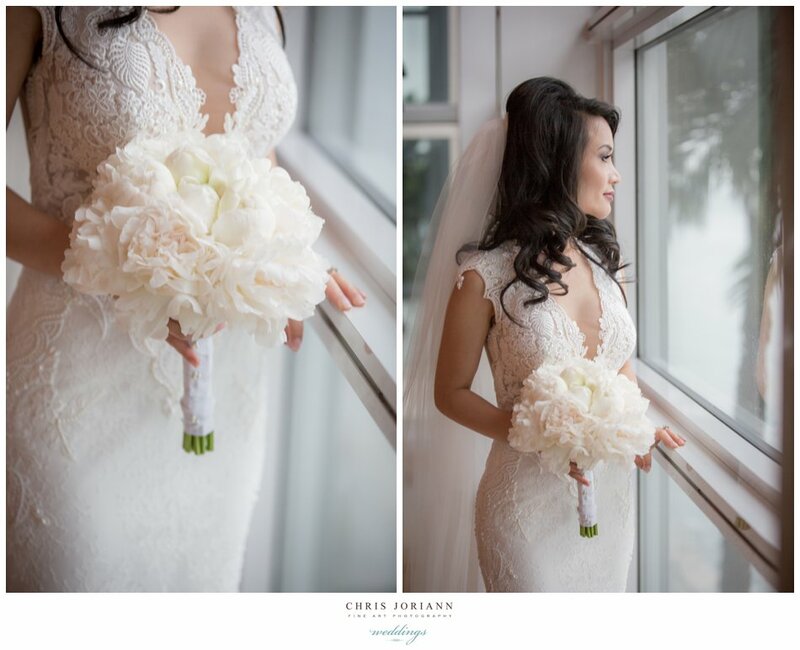 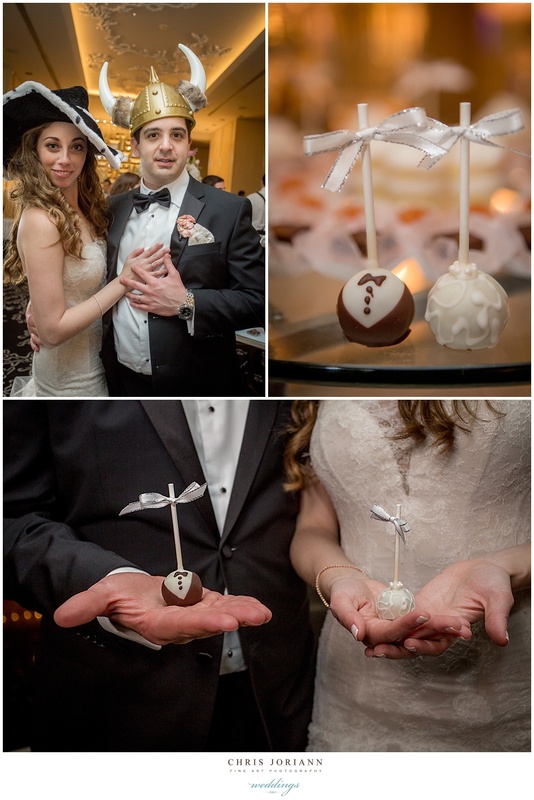 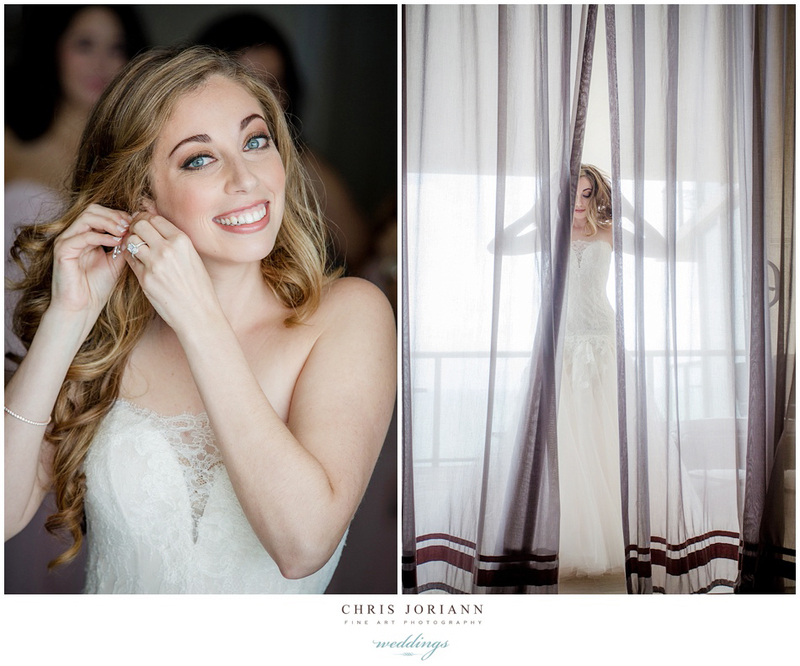 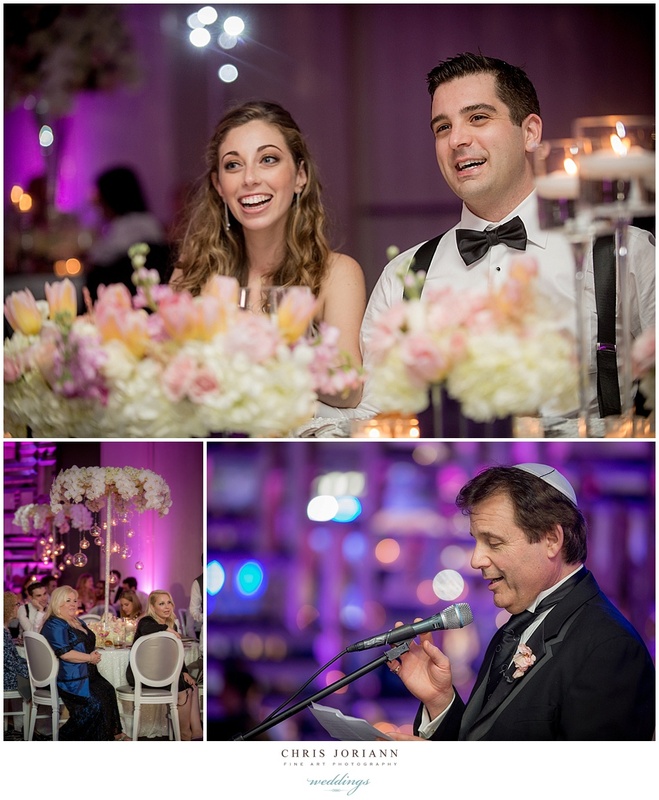 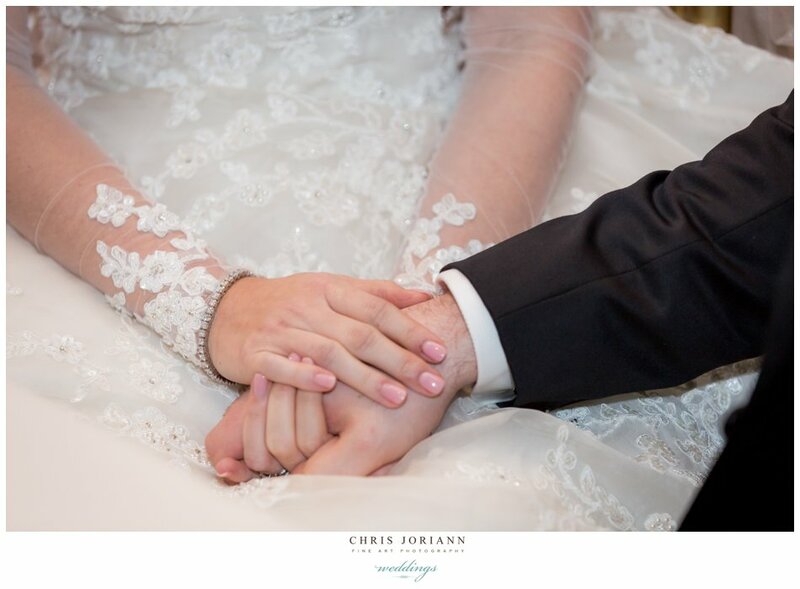 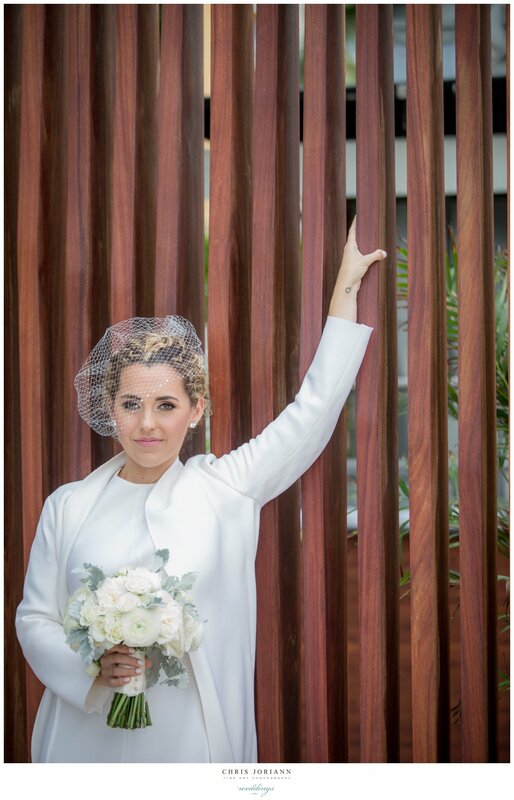 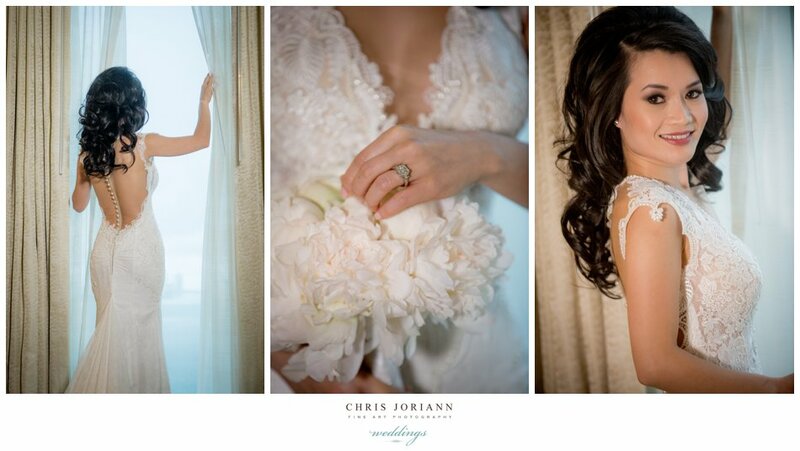 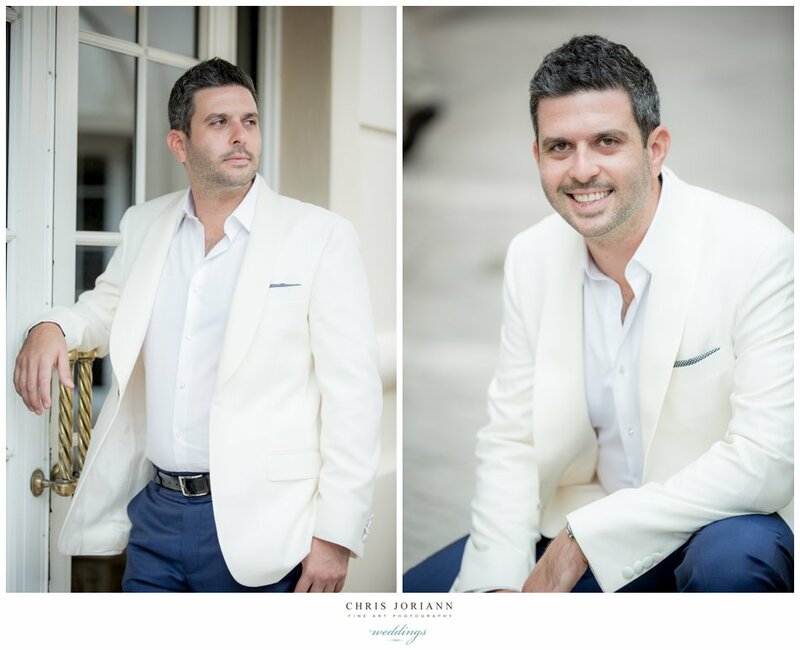 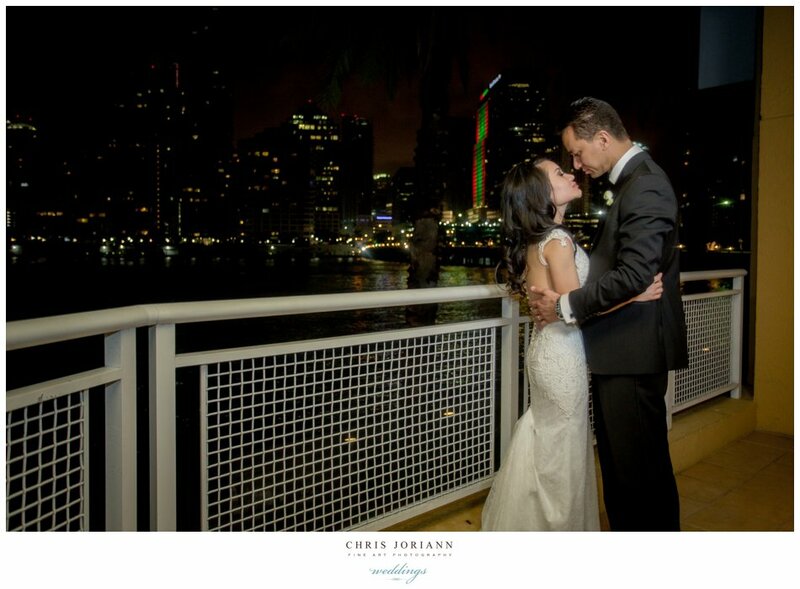 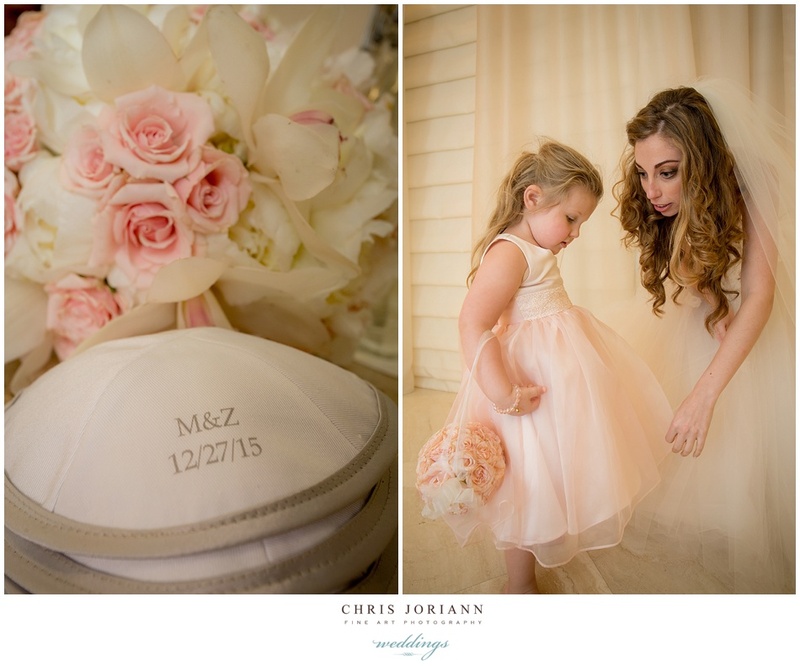 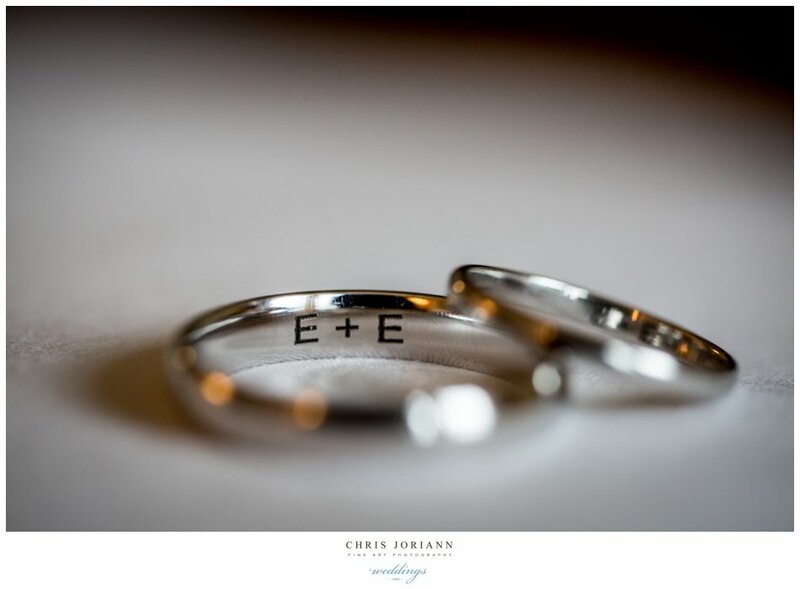 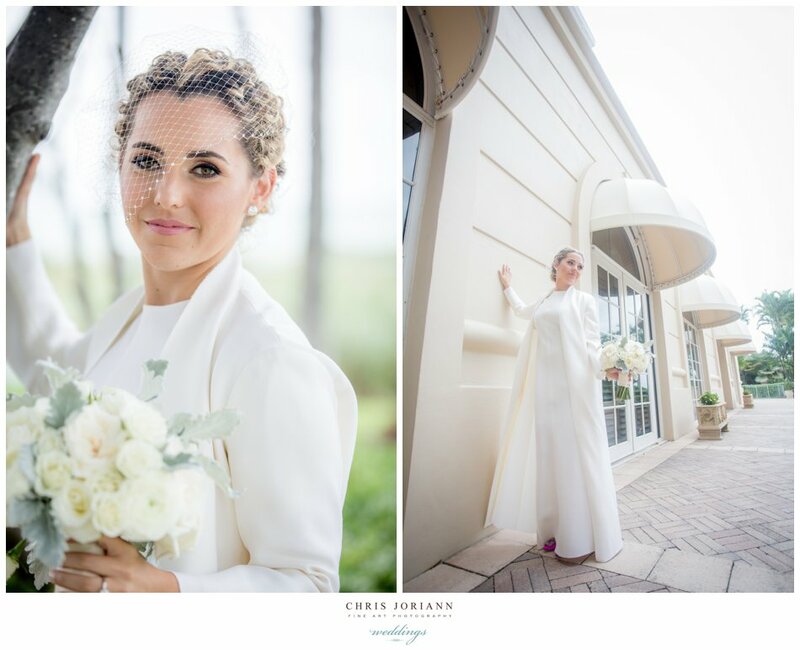 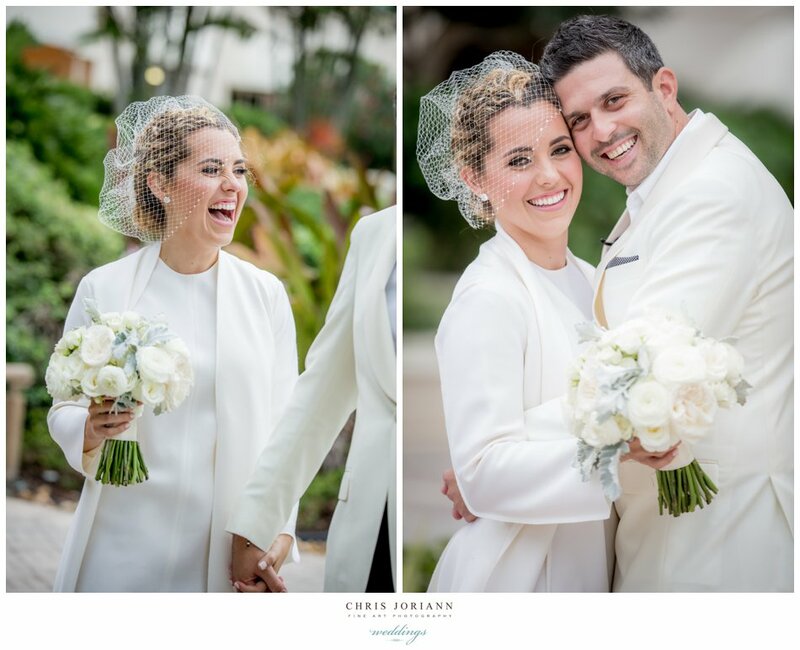 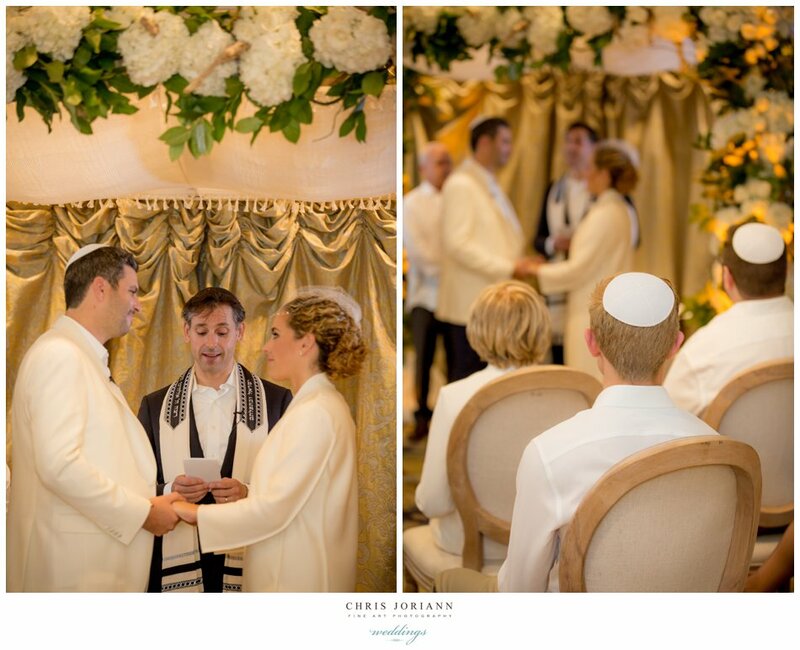 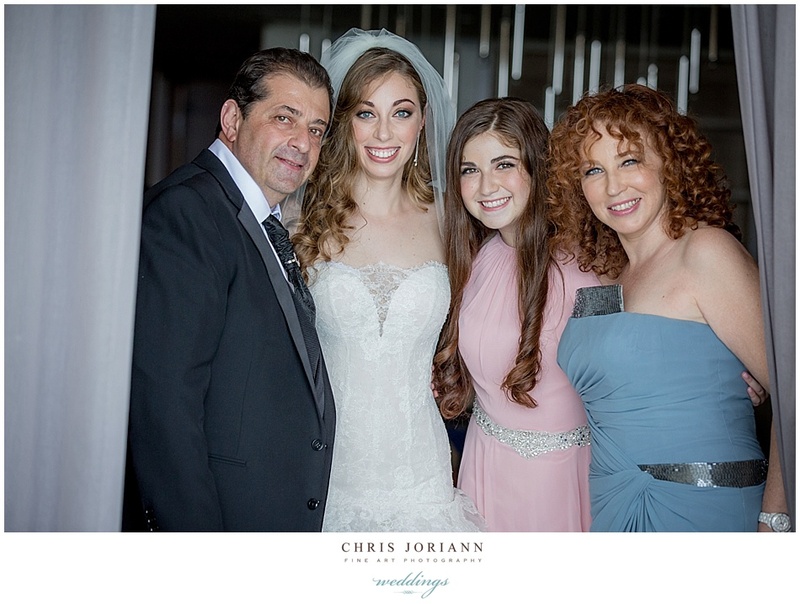 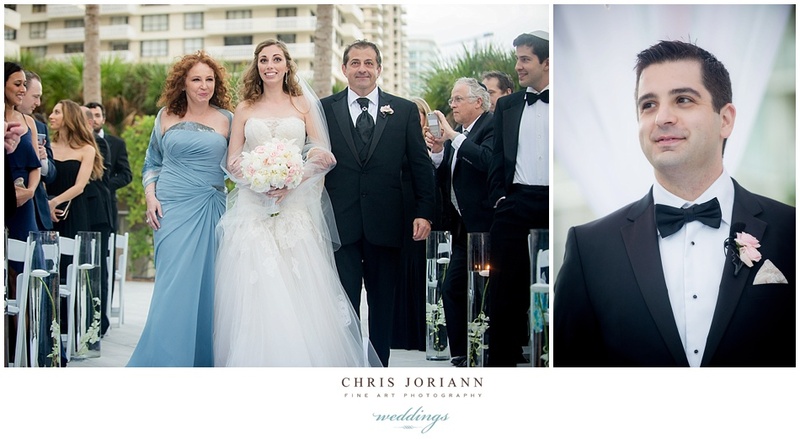 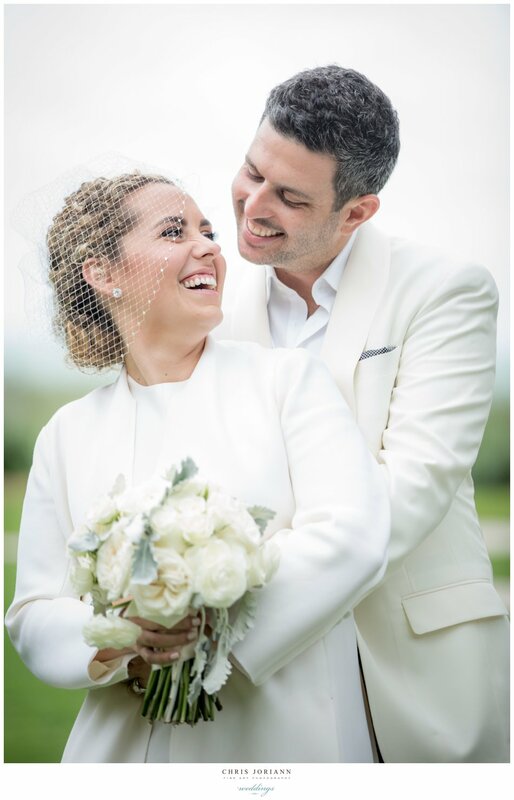 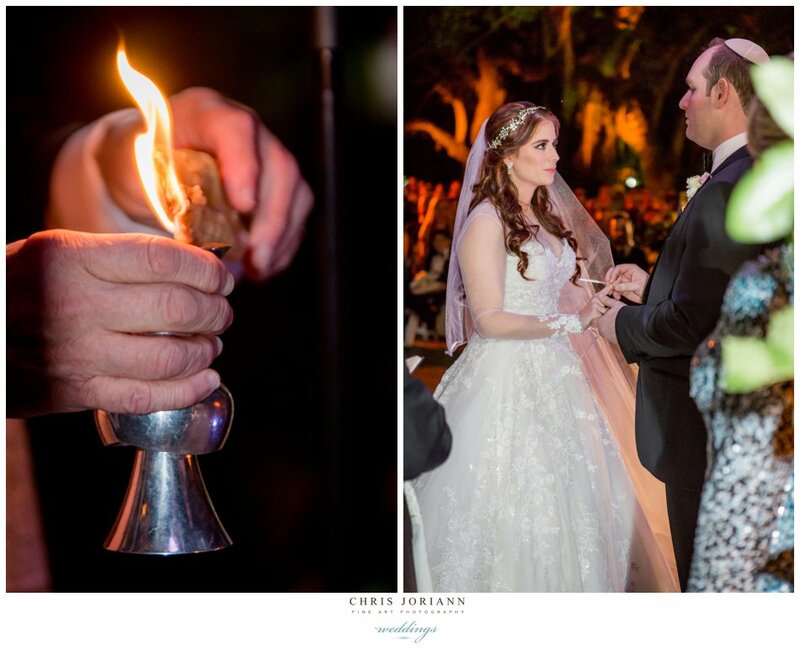 Erin + Eyal’s intimate “white party” wedding was held at The Ritz Carlton Key Biscayne, Miami. 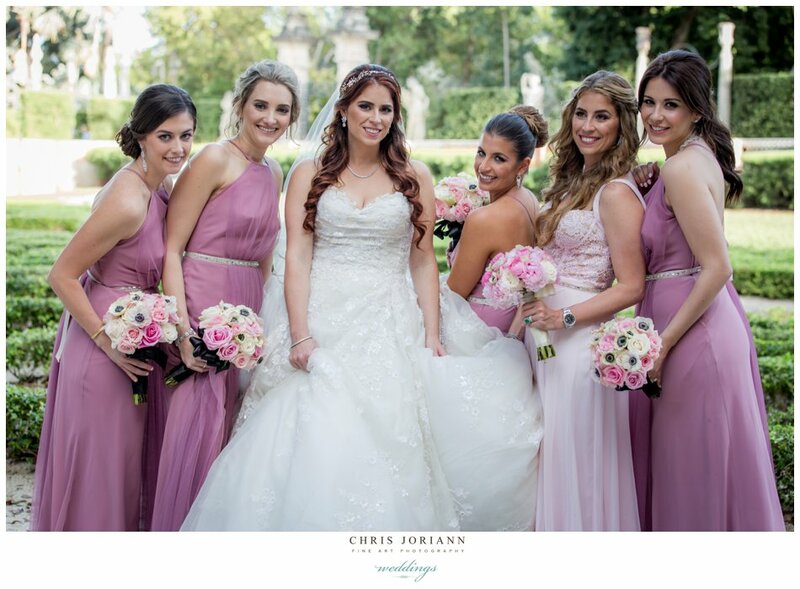 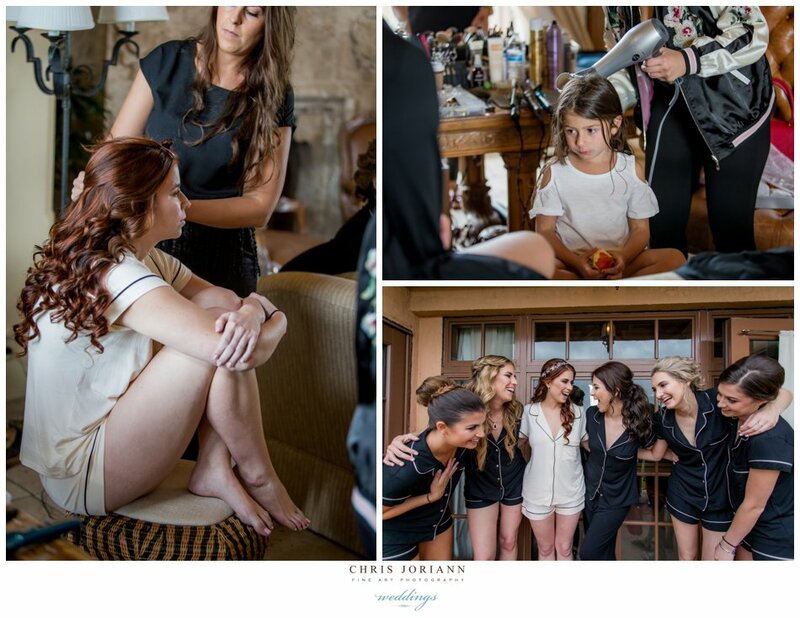 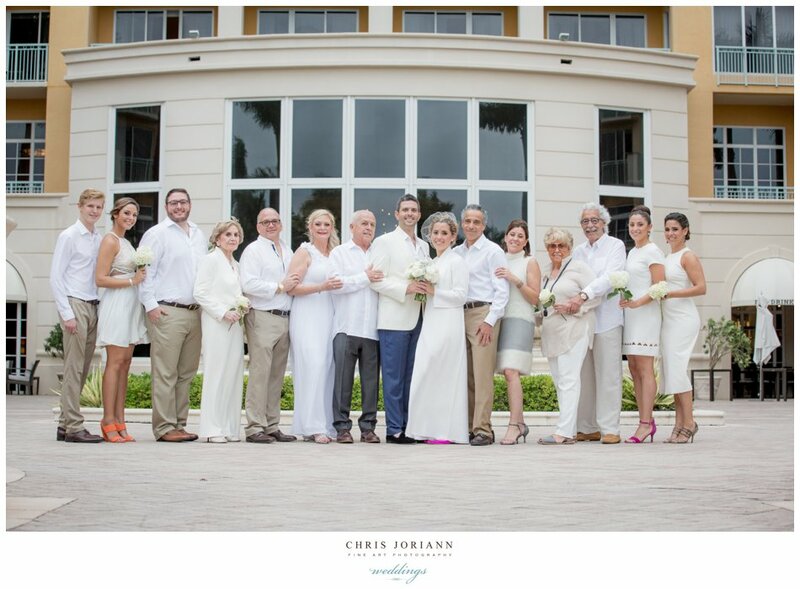 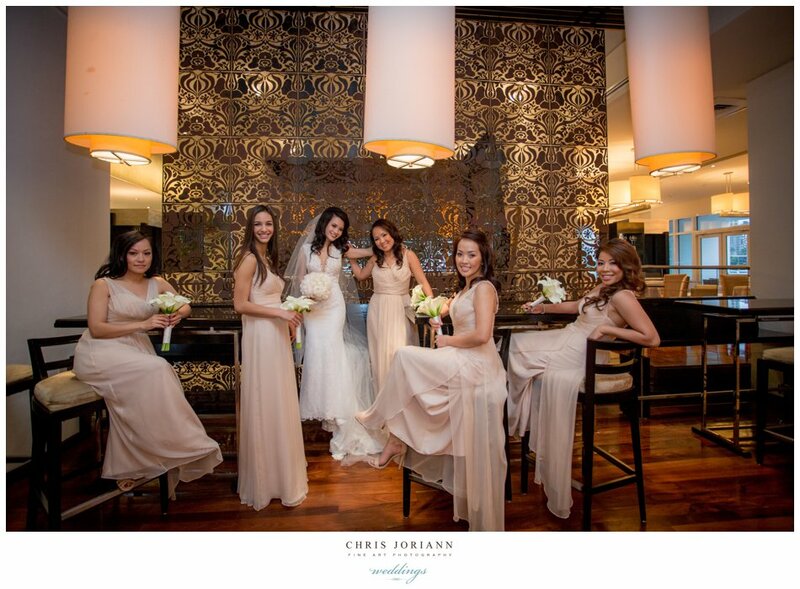 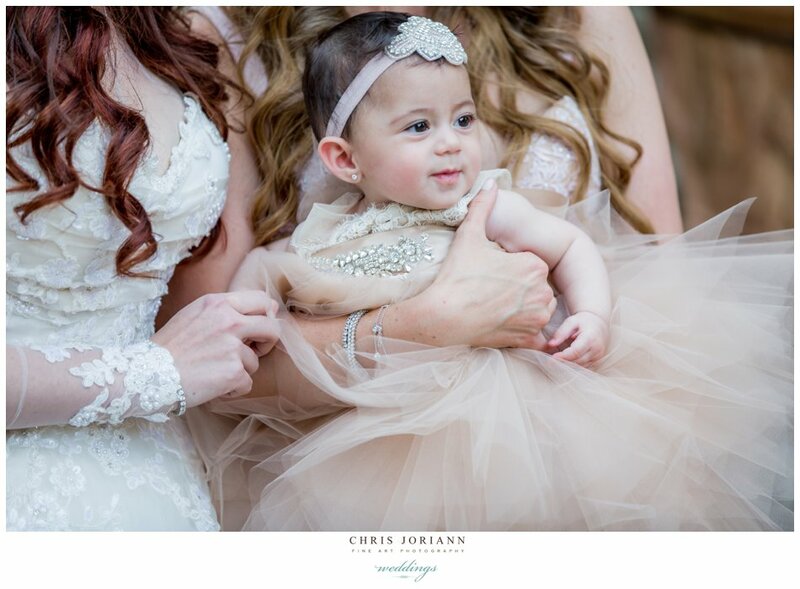 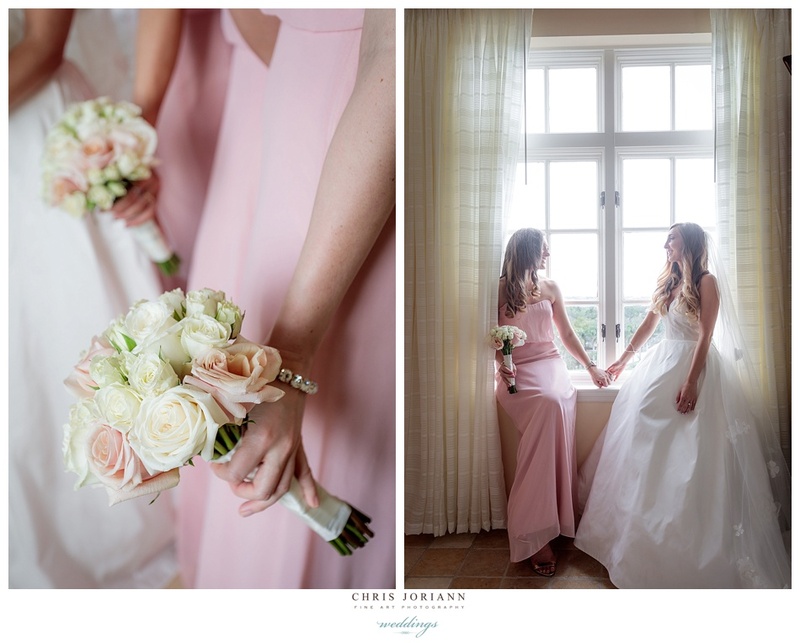 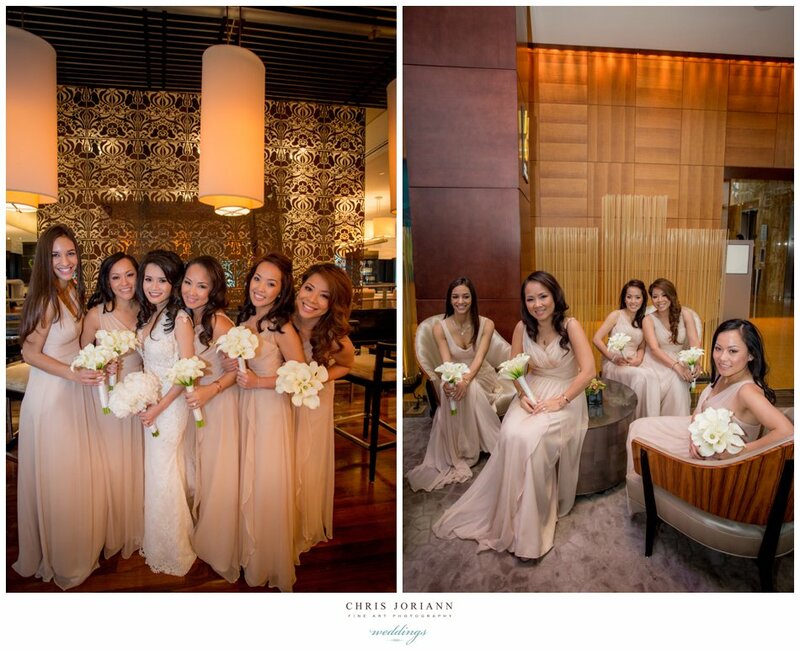 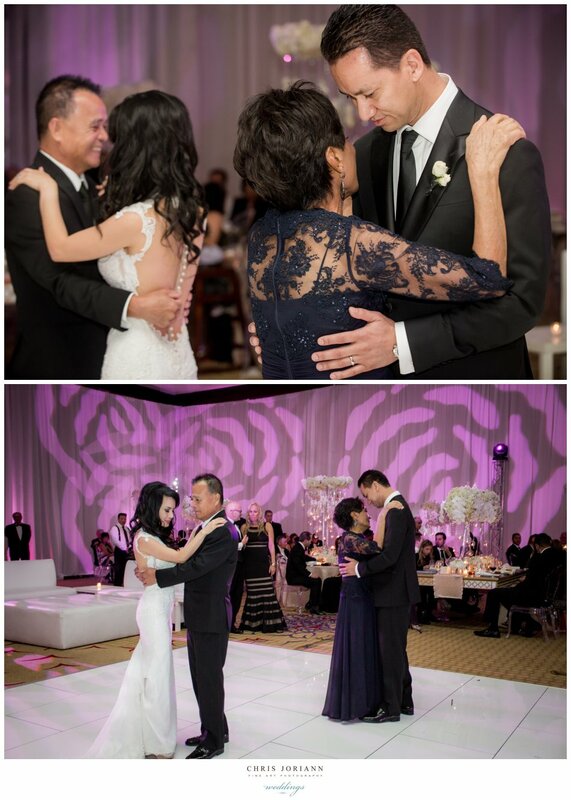 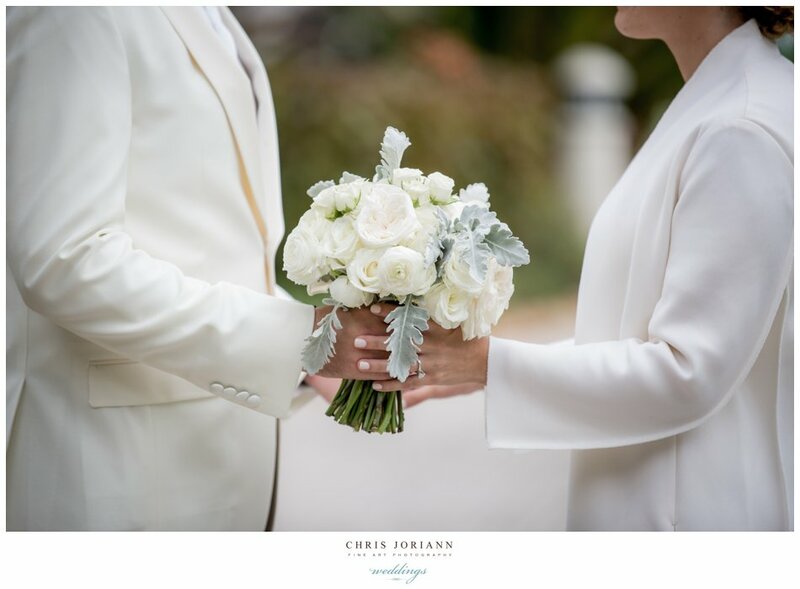 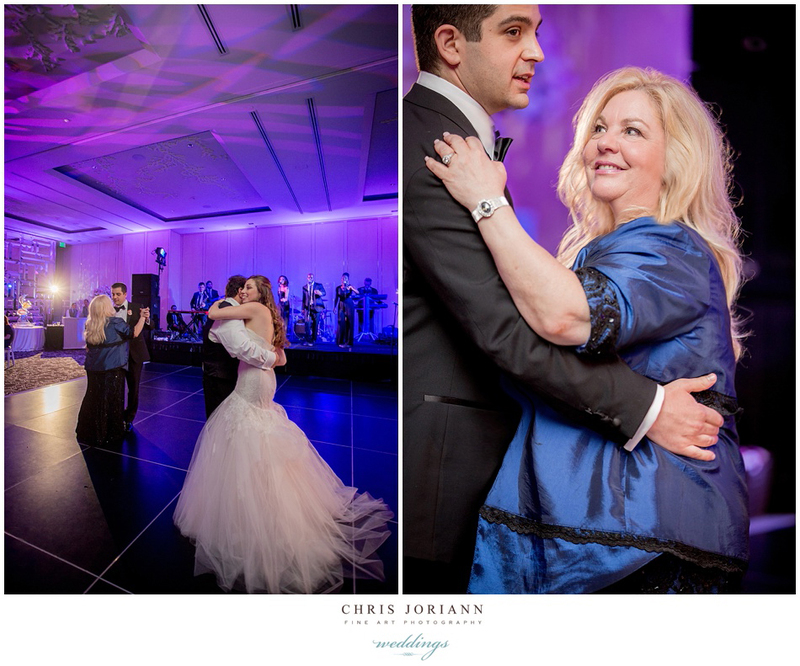 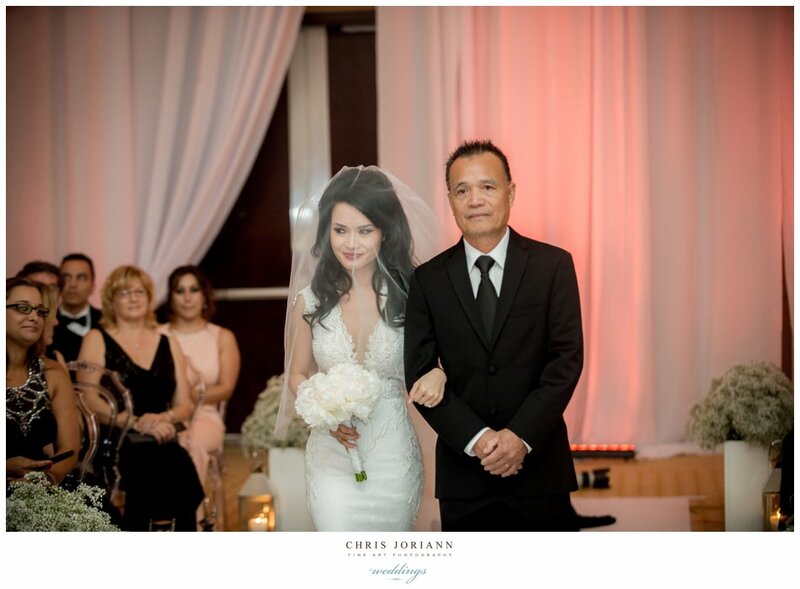 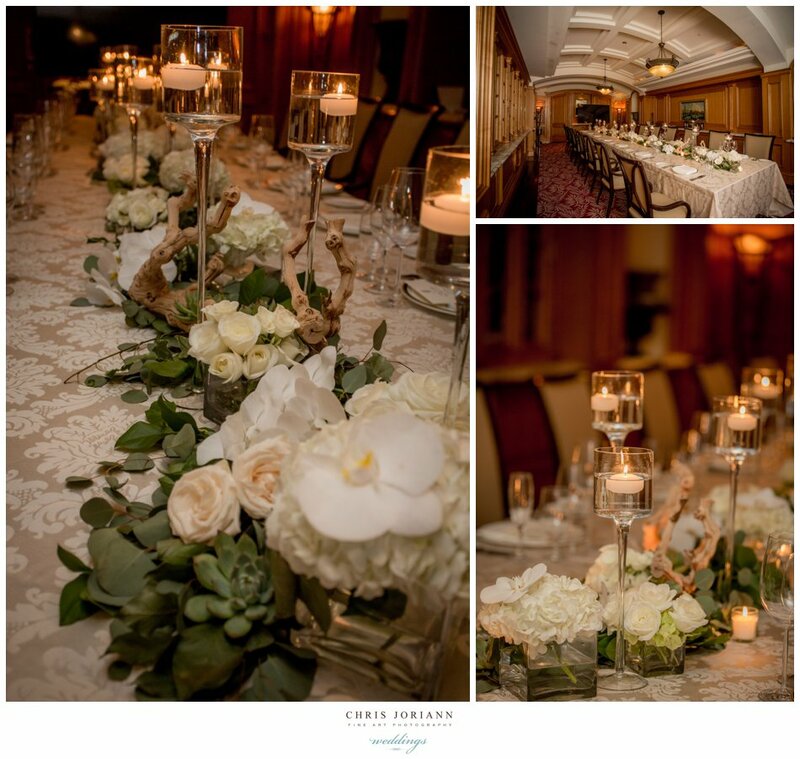 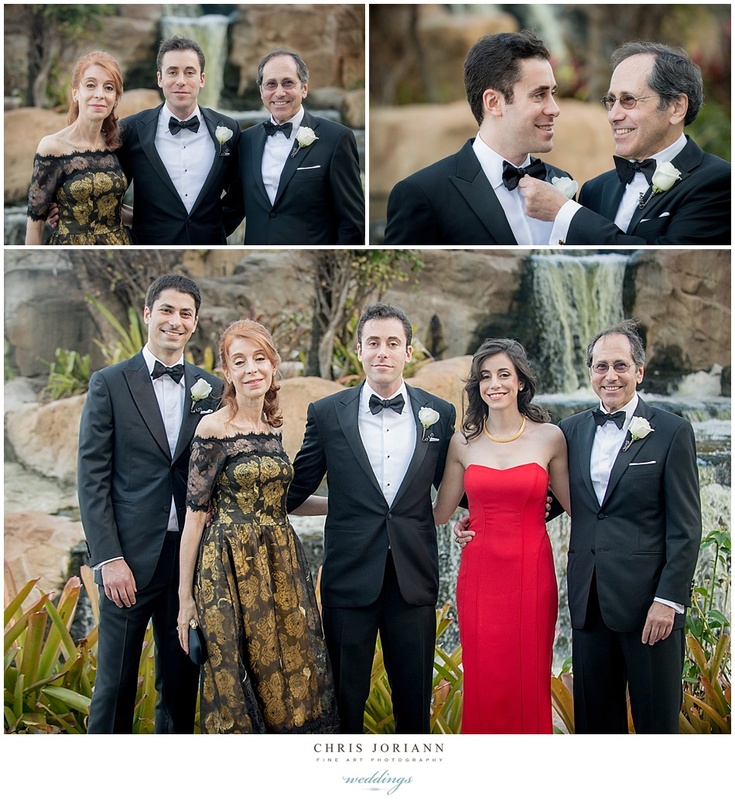 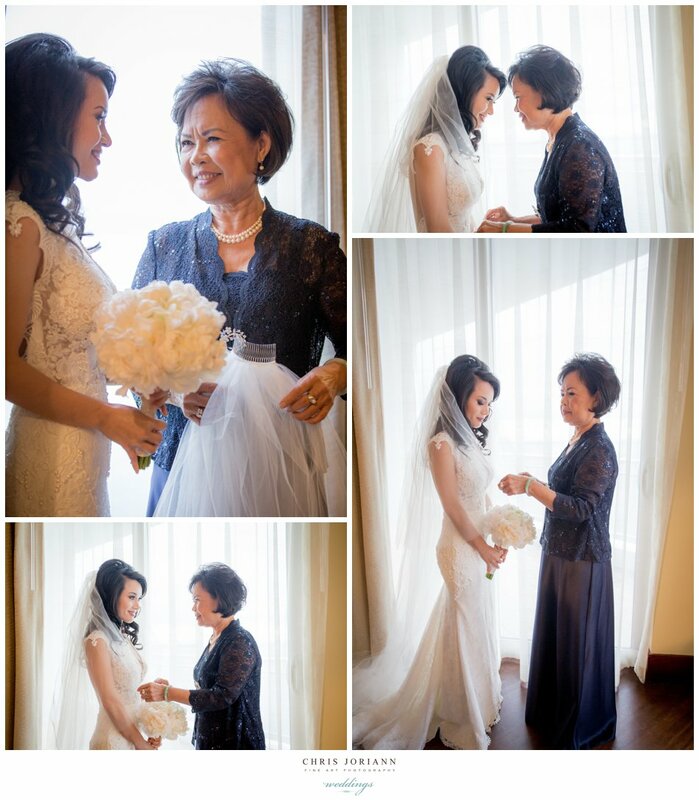 Cozy but fabulous… this family affair had a dozen guests all dressed in varying shades of white. 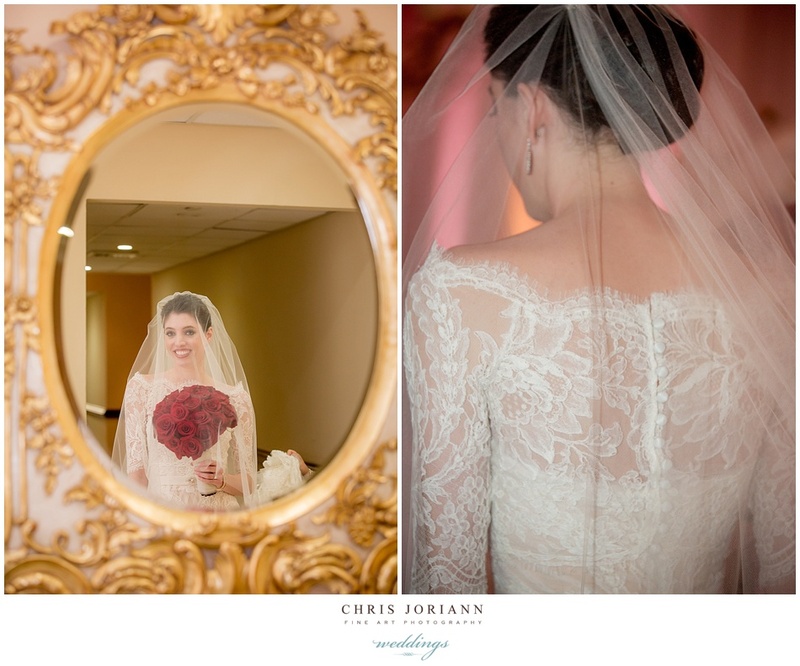 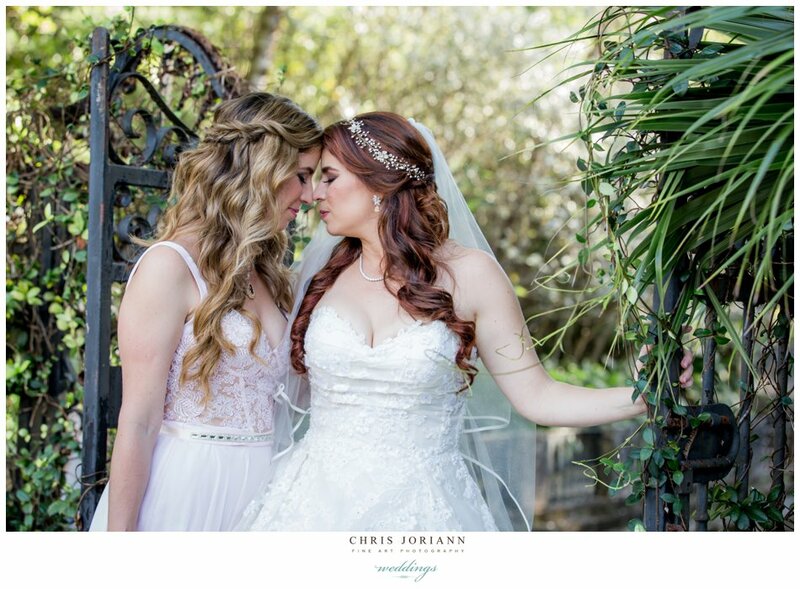 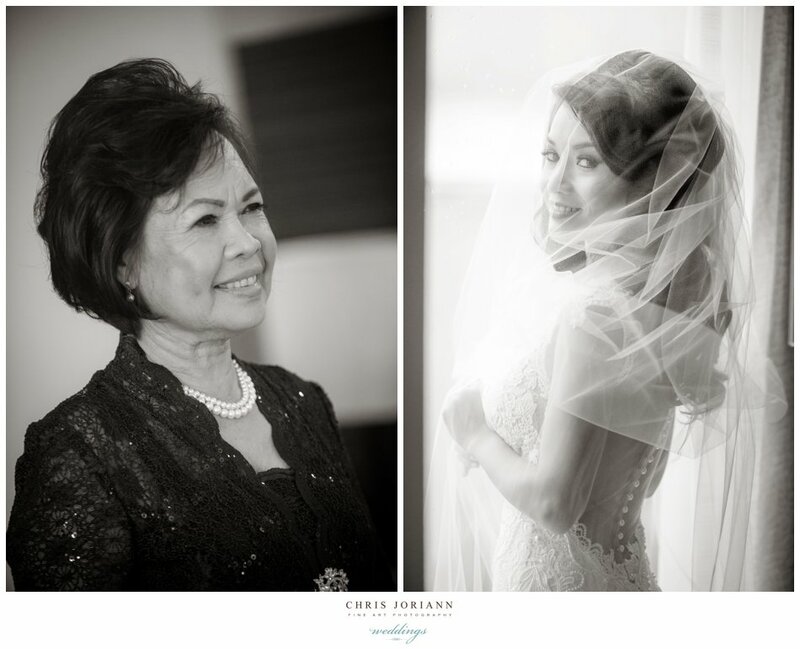 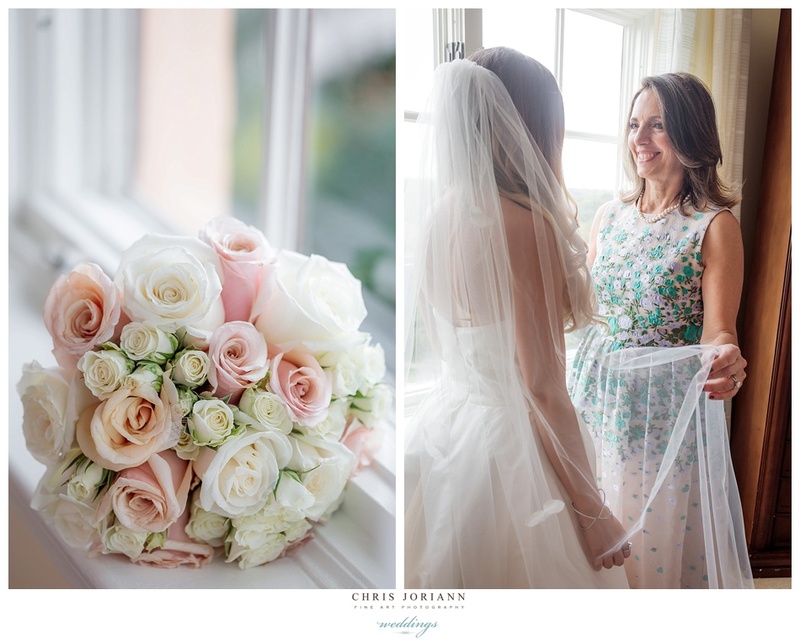 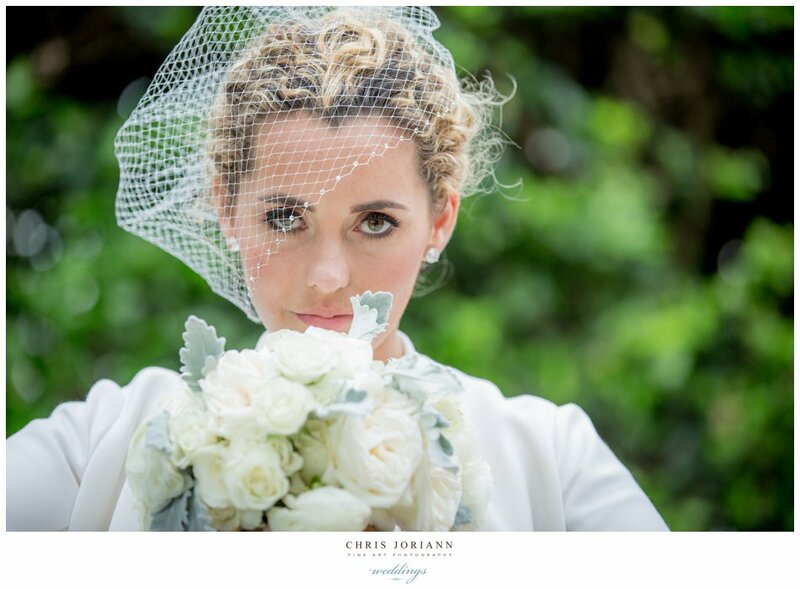 The bride was super stylish, and looked vogue perfect in an ivory birdcage veil. 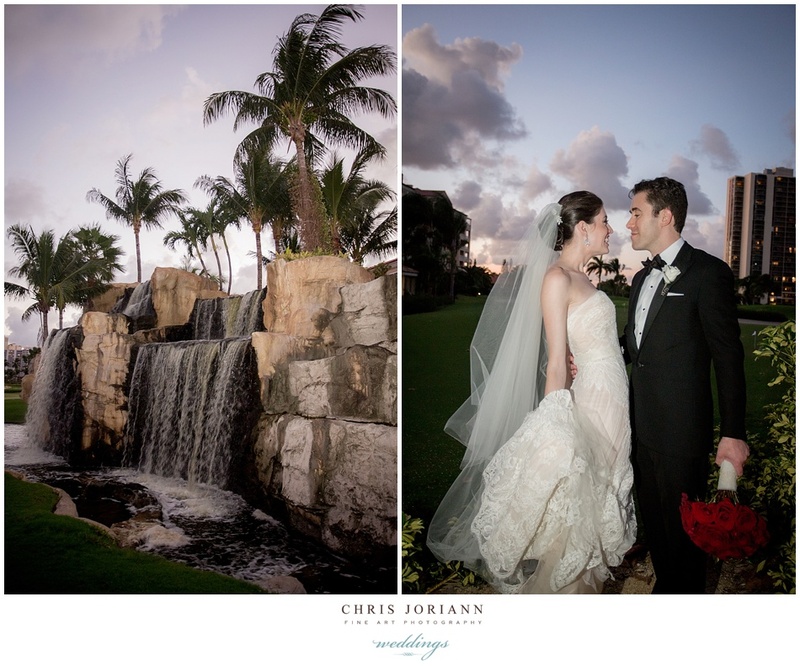 Right before sunset the couple exchanged their vows. 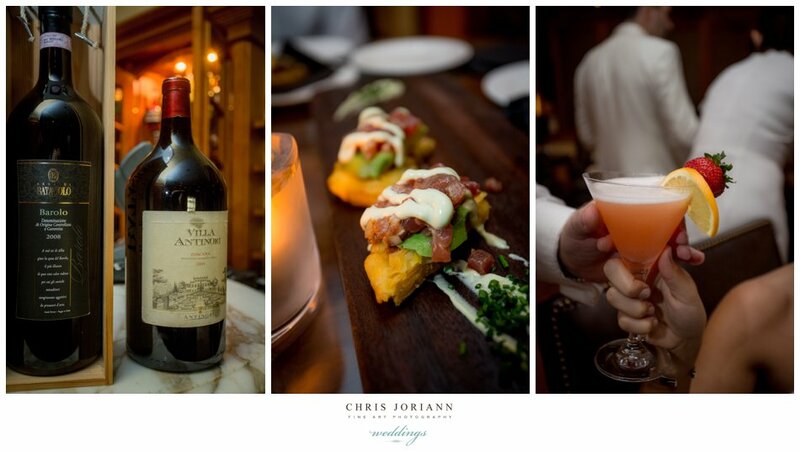 Cocktails at Cioppino followed. 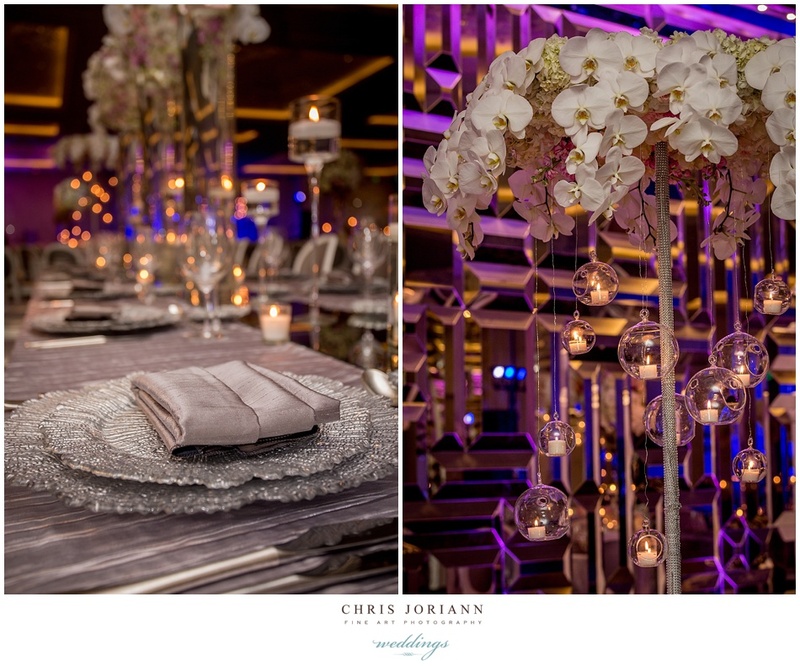 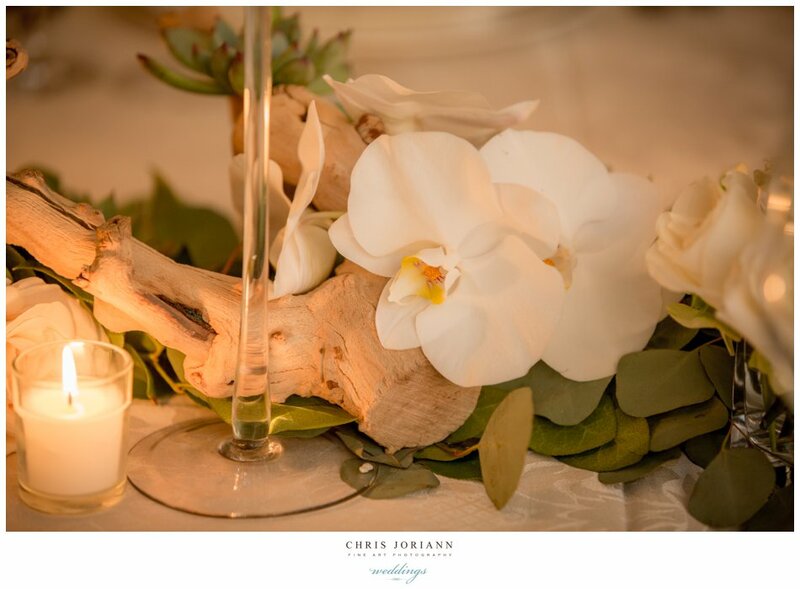 A stunning kings table designed by rodri studio, featuring driftwood and orchids in a sea of mercury candles awaited guests attending a candle lit dinner in the private Wine Room.